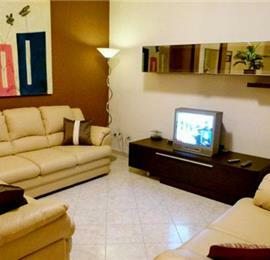 Distance to airport: 2-3 hours, including fery crossing. 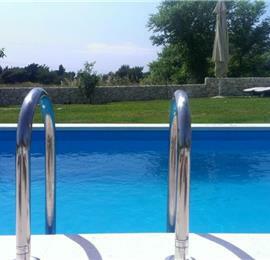 Arrival days: Saturday for July-mid August, any day for all other dates. 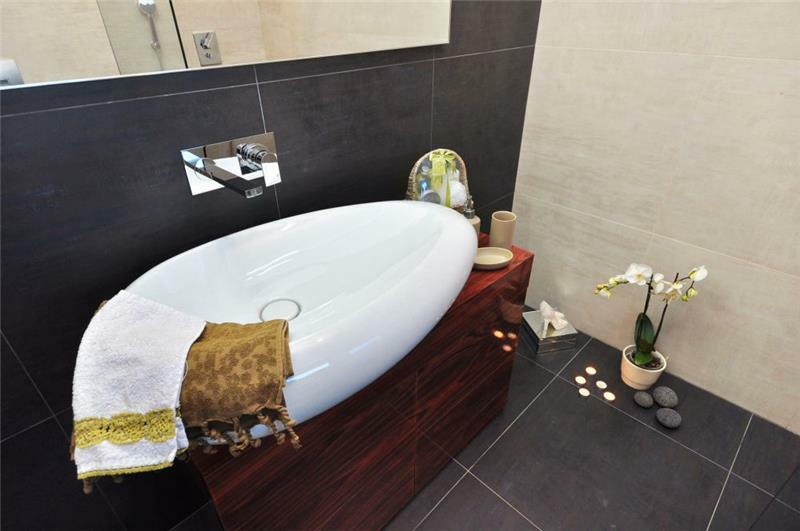 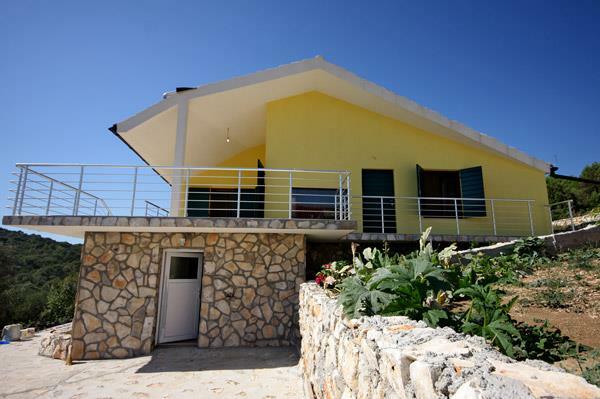 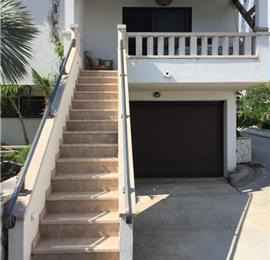 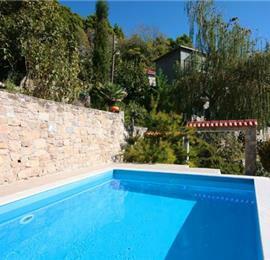 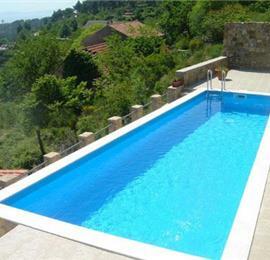 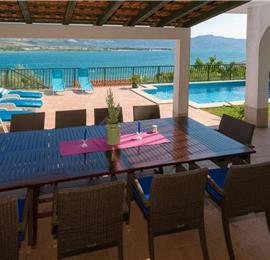 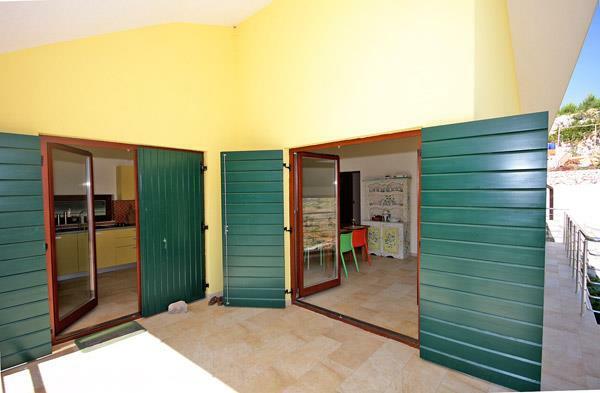 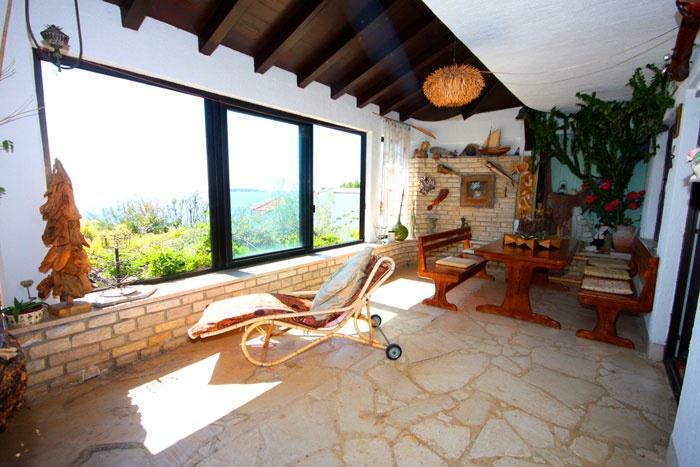 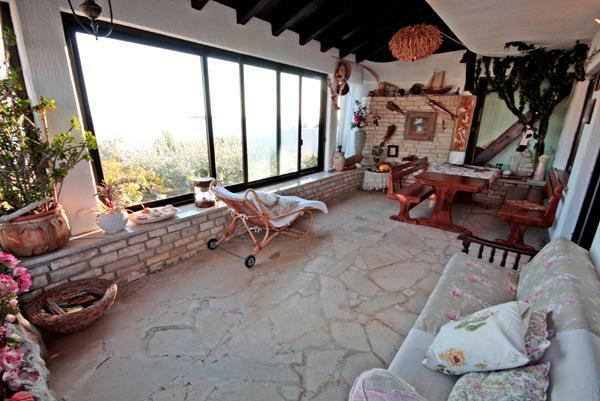 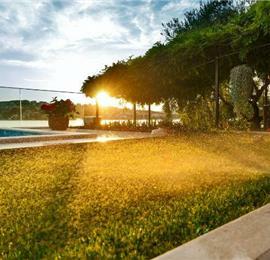 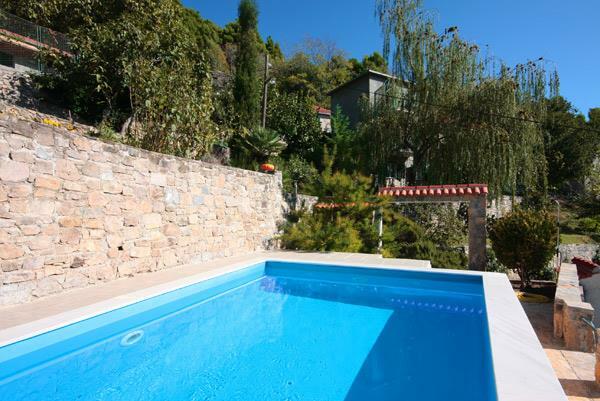 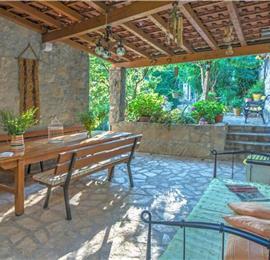 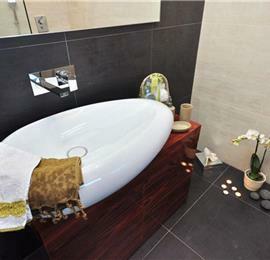 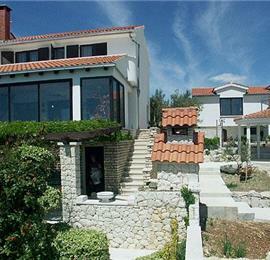 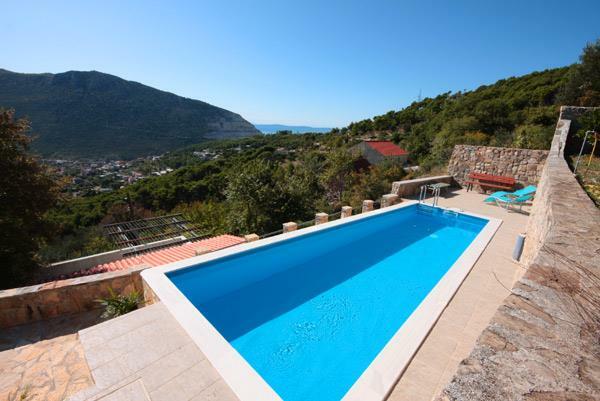 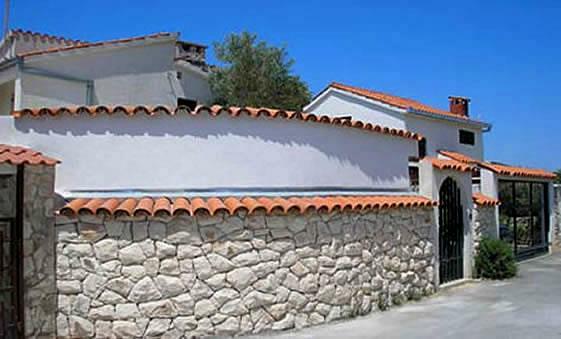 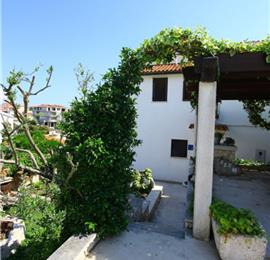 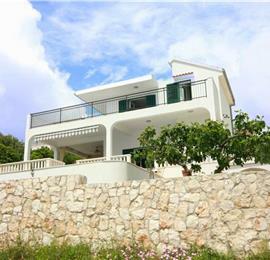 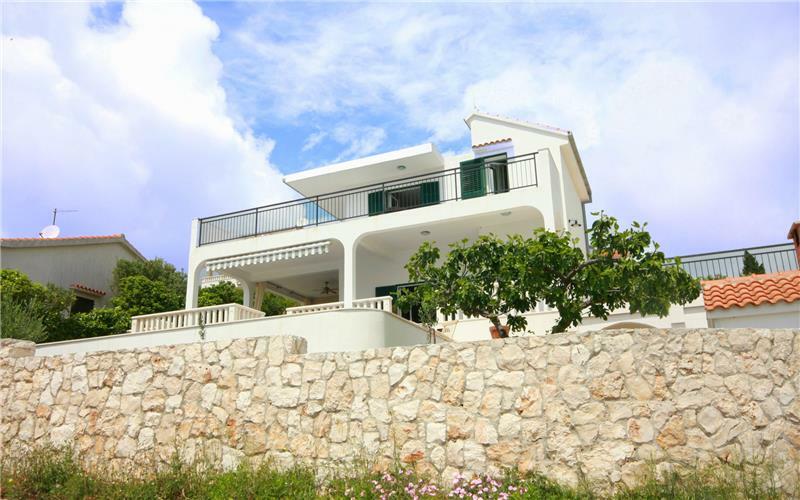 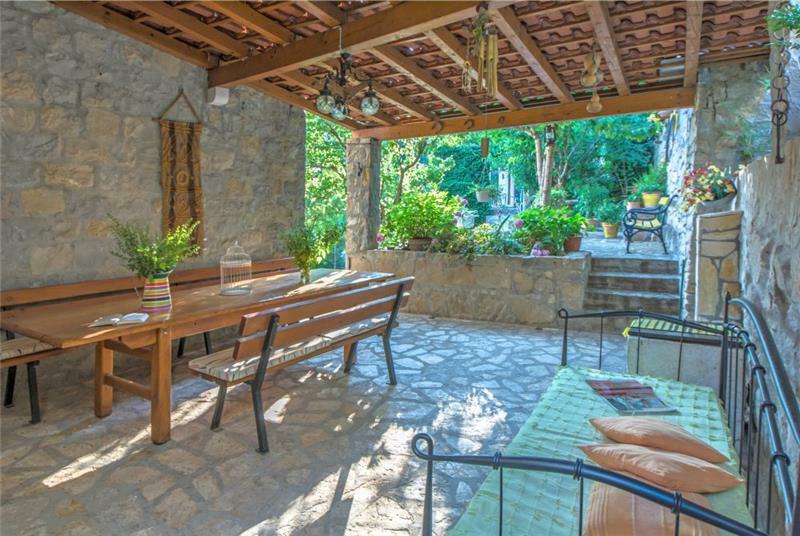 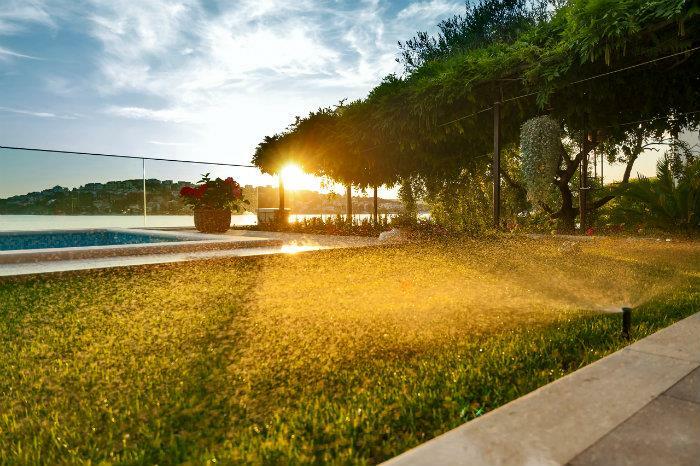 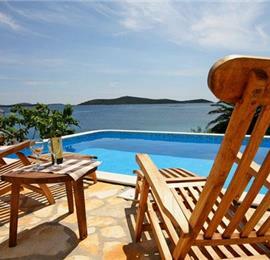 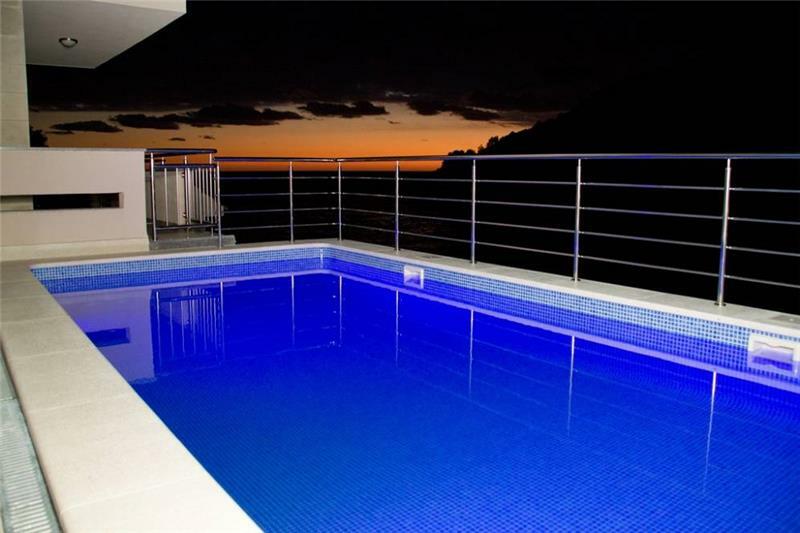 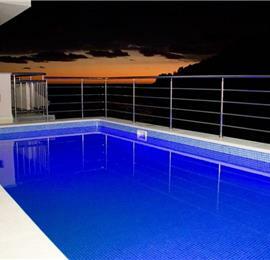 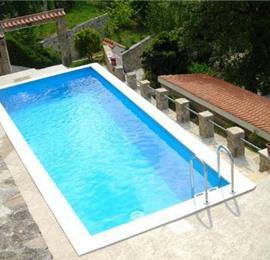 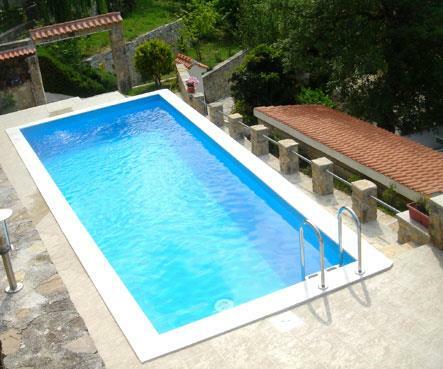 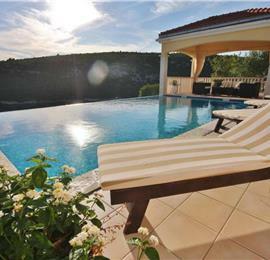 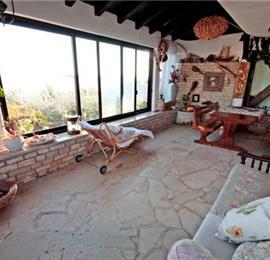 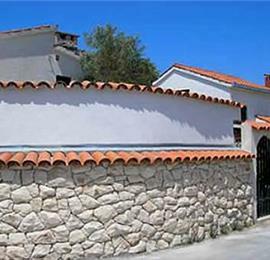 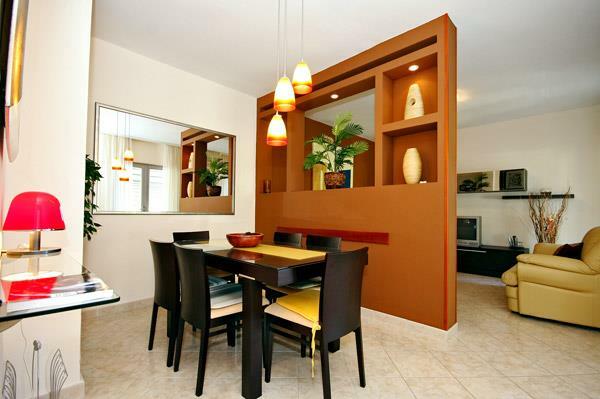 A wonderful villa conveniently located in Maslinca in Solta. 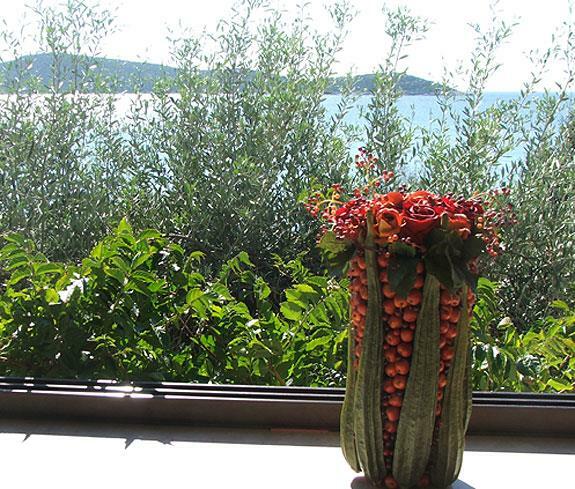 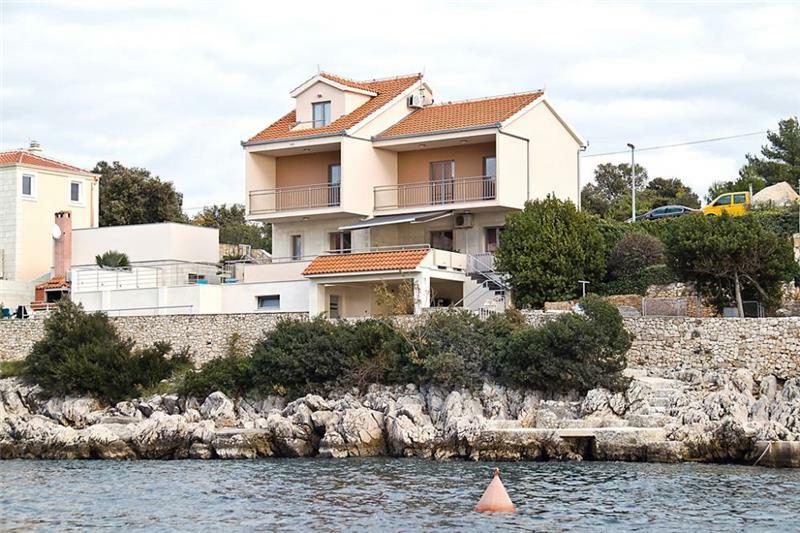 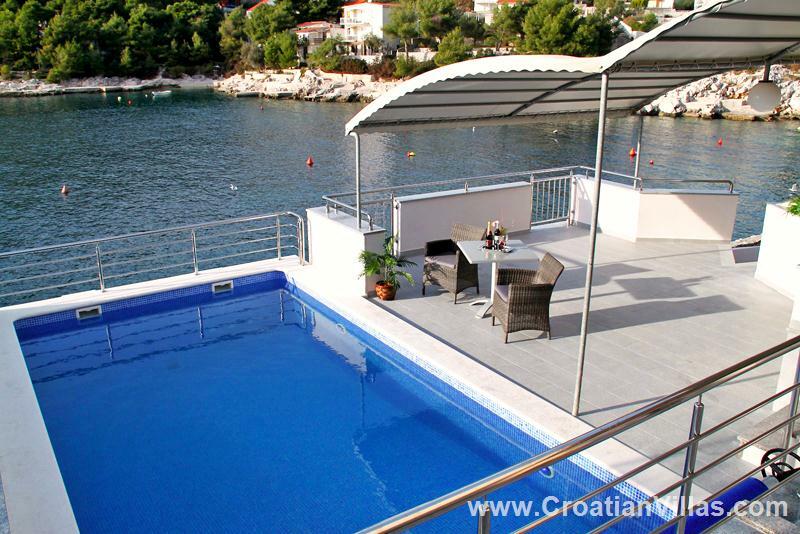 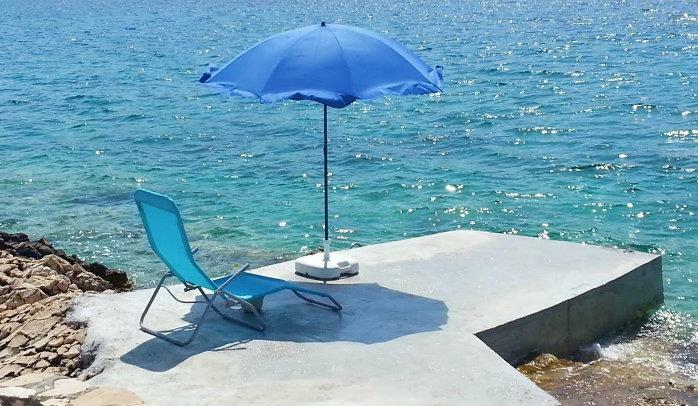 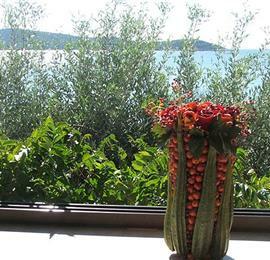 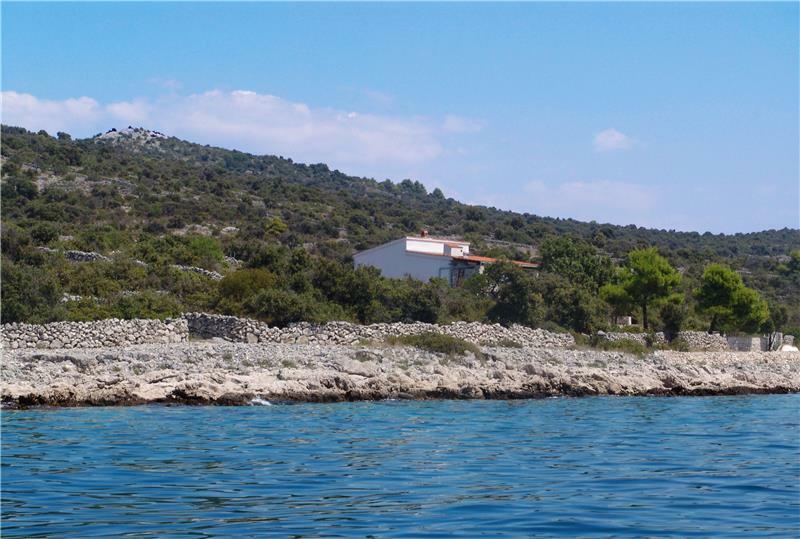 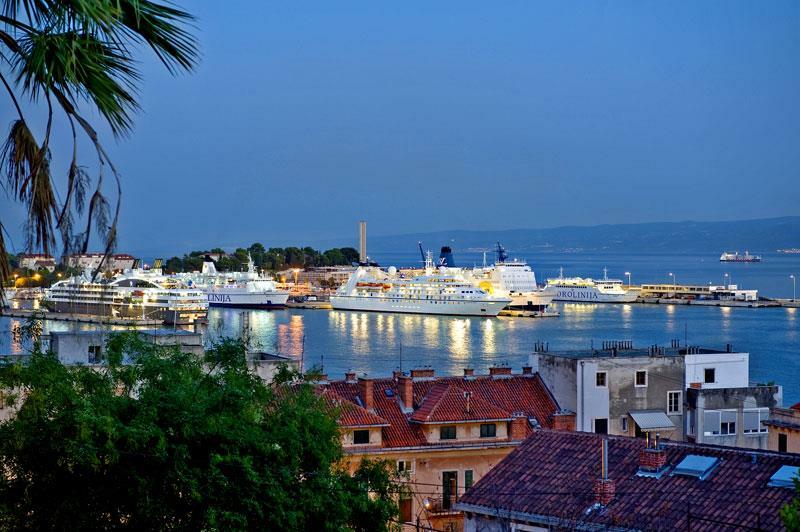 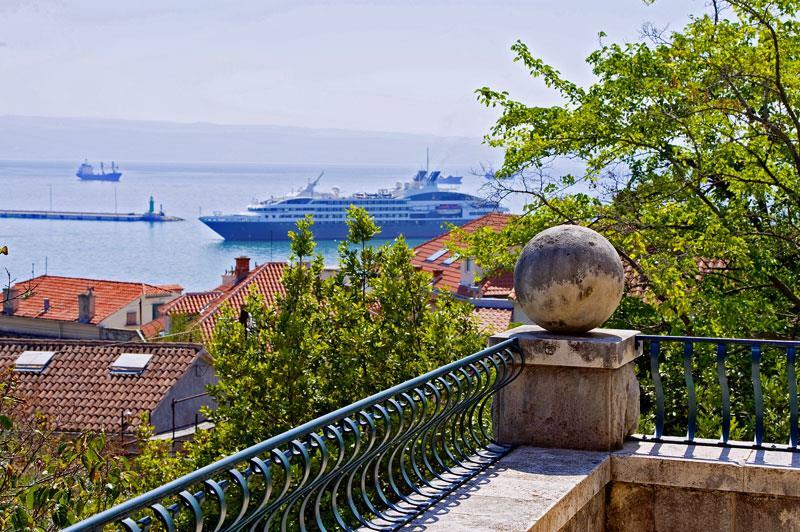 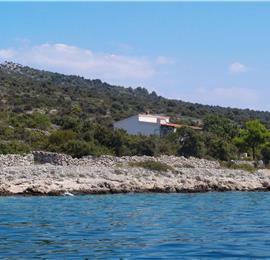 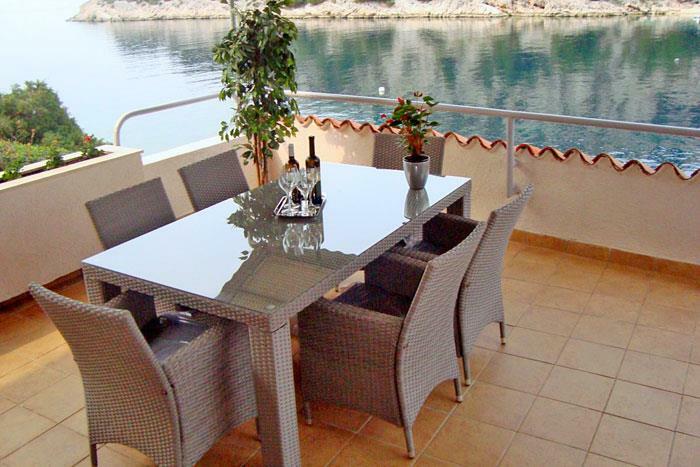 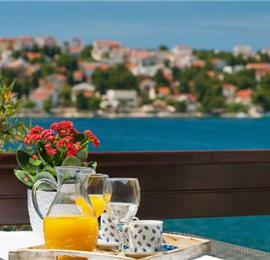 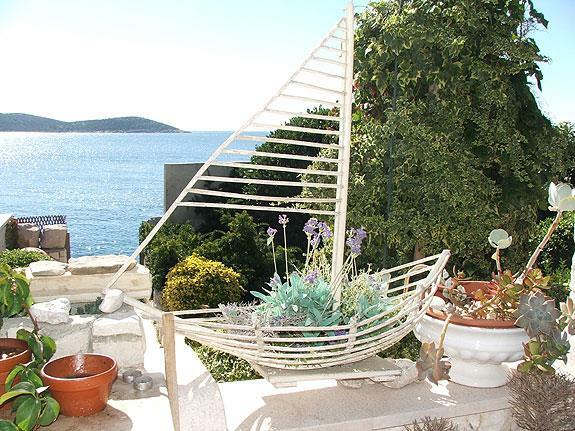 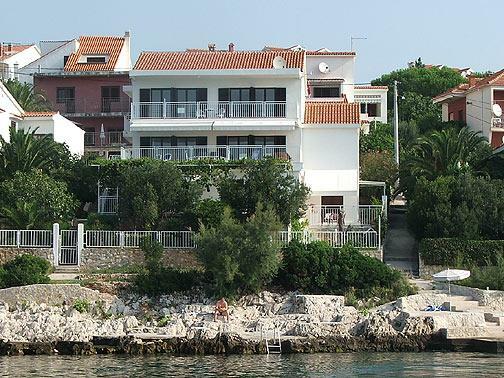 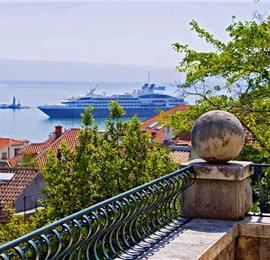 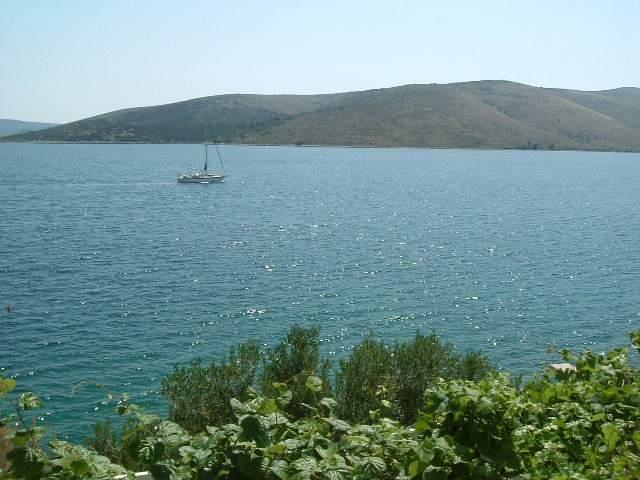 We enjoyed the ferry trips to Split but also enjoyed the peace and relaxing time on Solta. 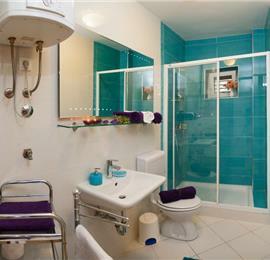 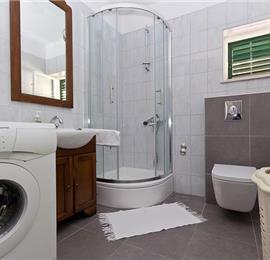 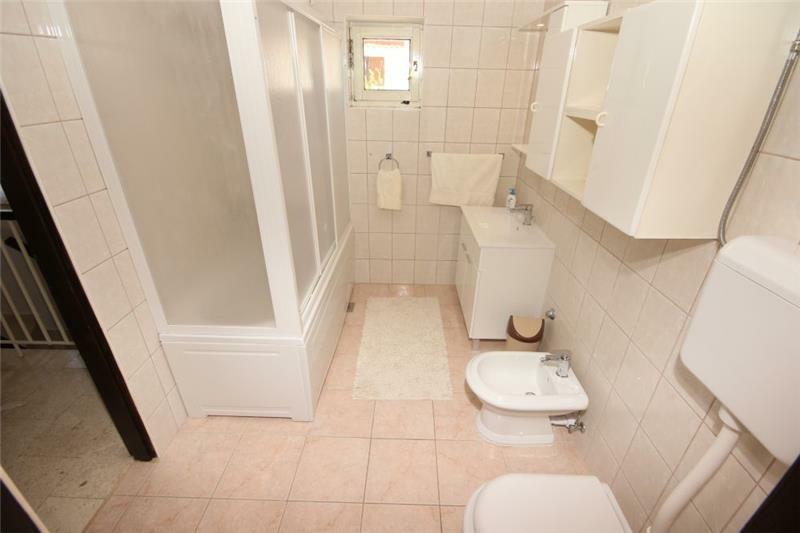 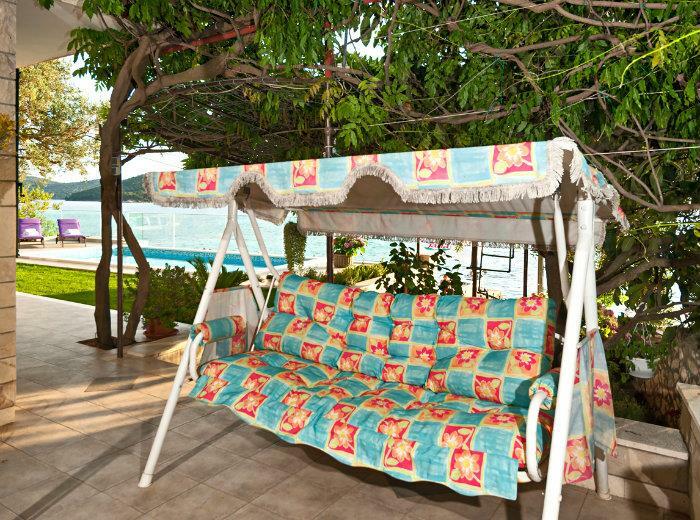 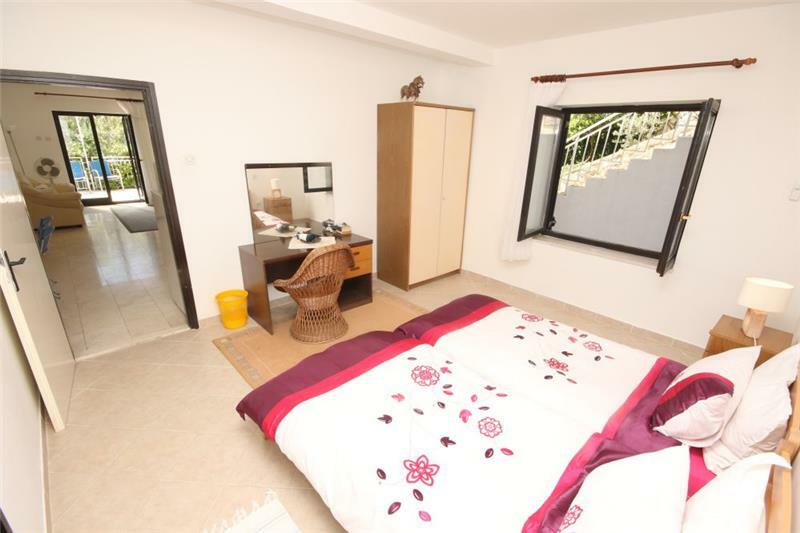 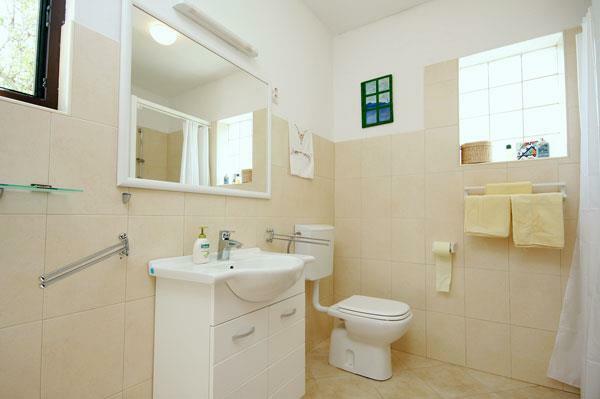 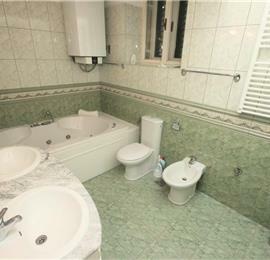 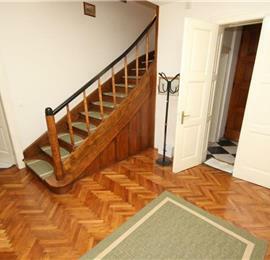 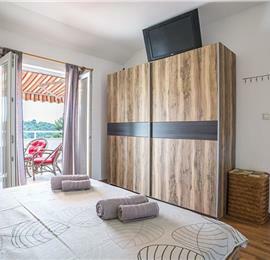 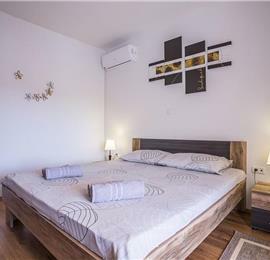 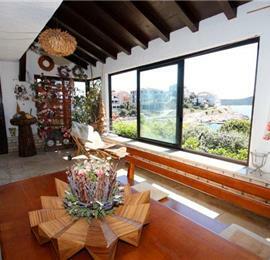 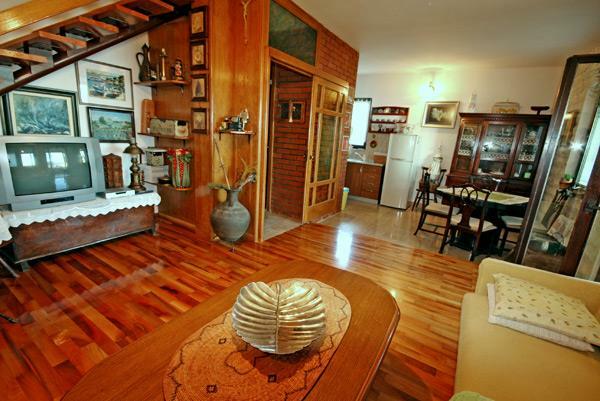 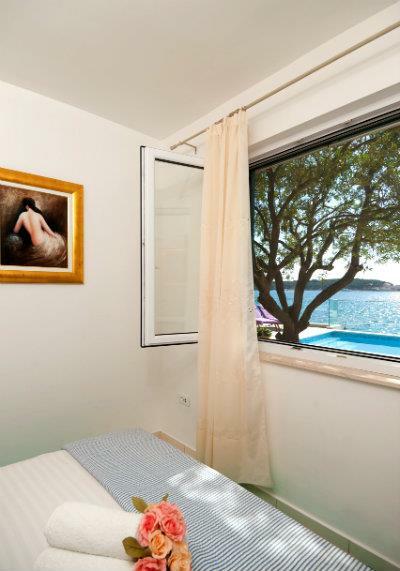 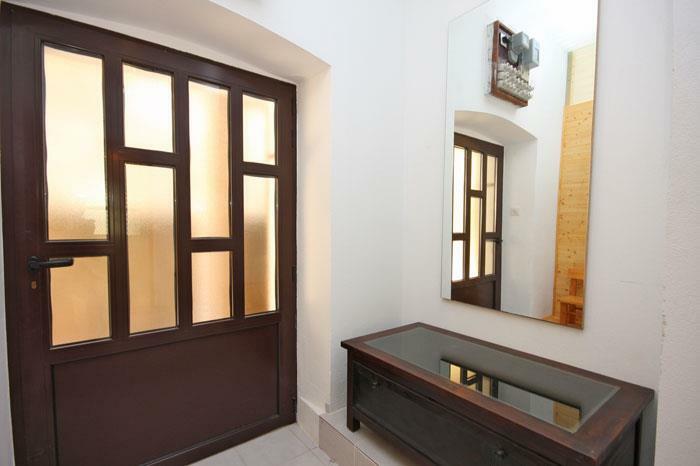 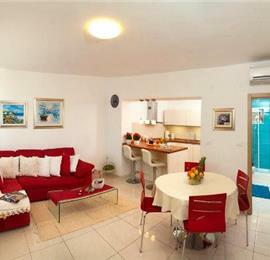 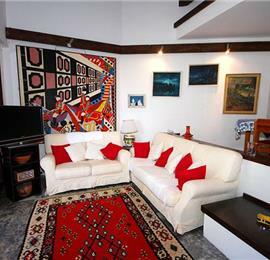 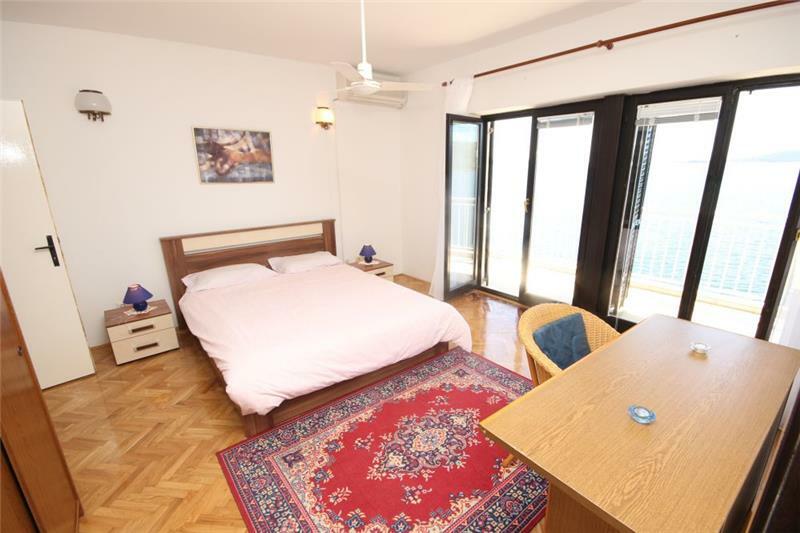 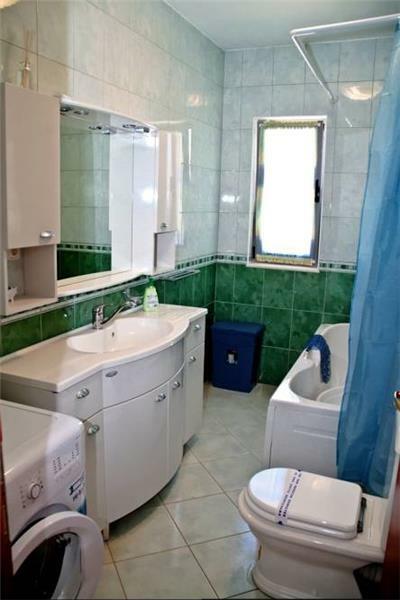 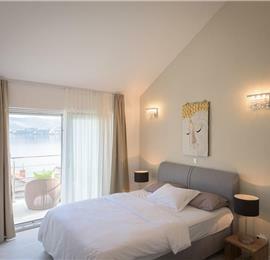 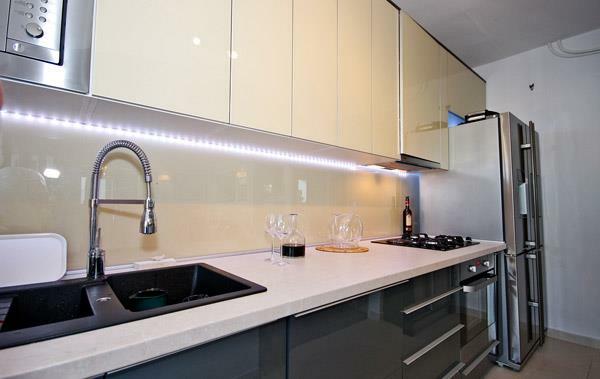 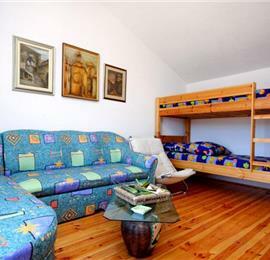 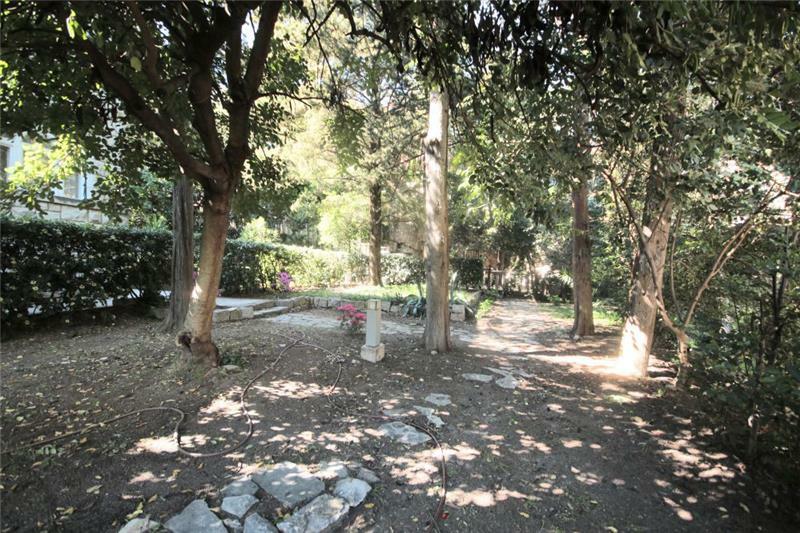 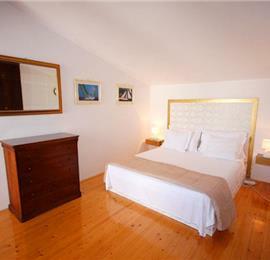 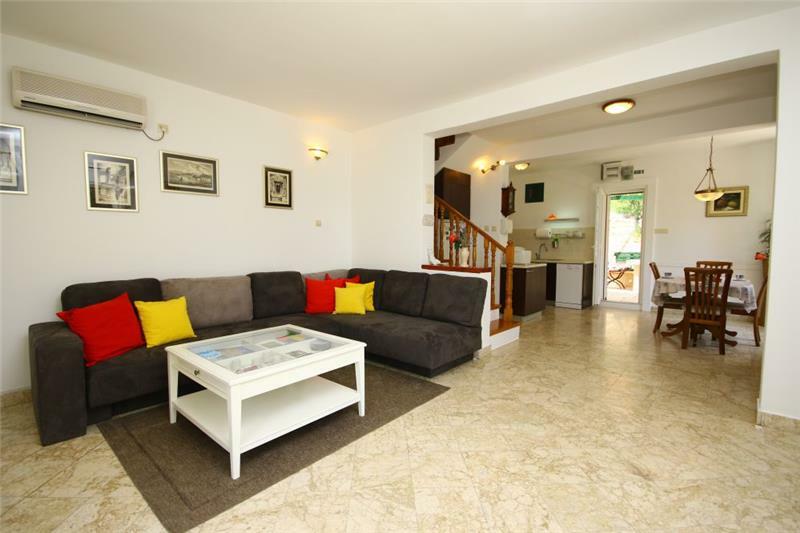 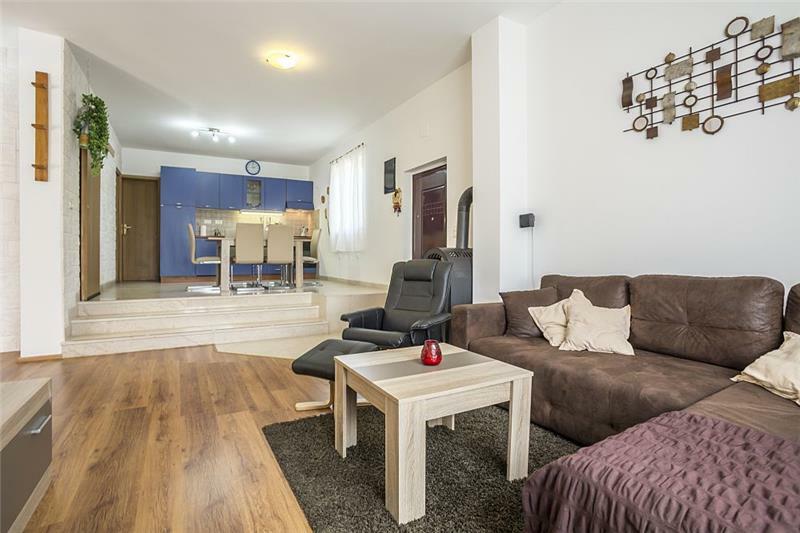 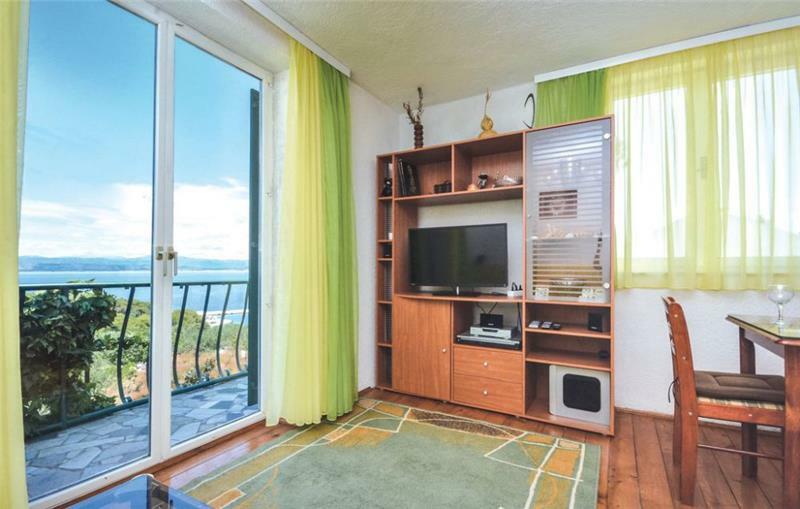 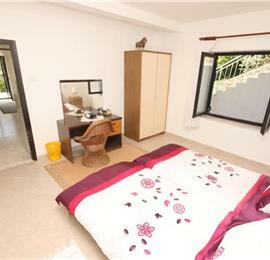 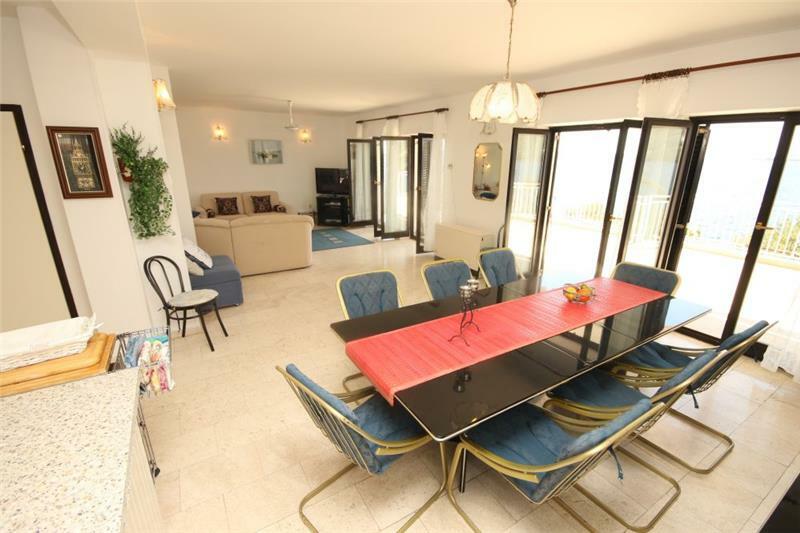 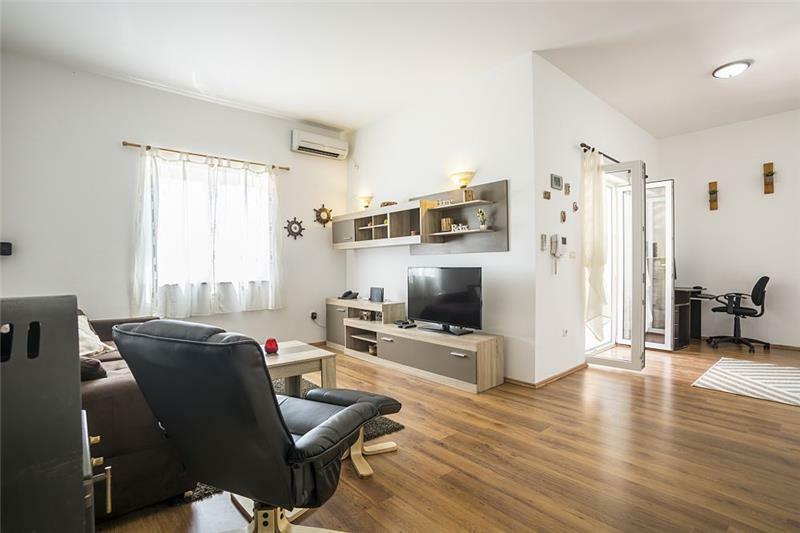 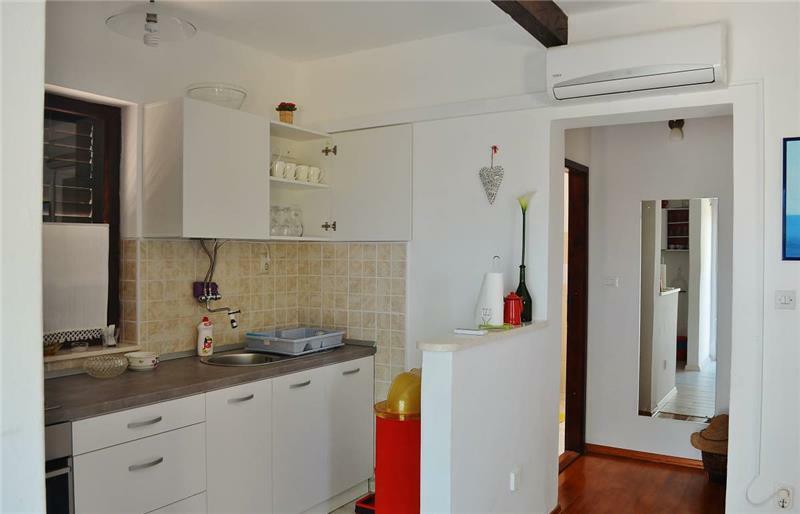 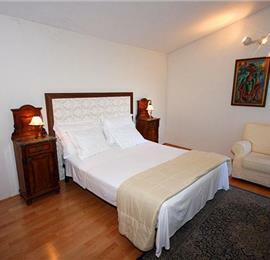 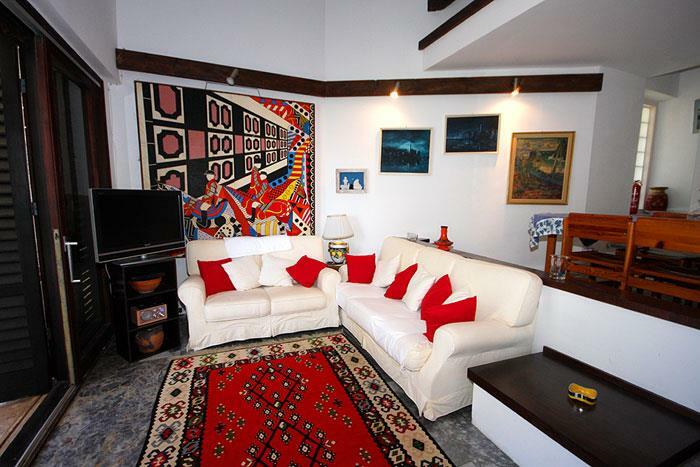 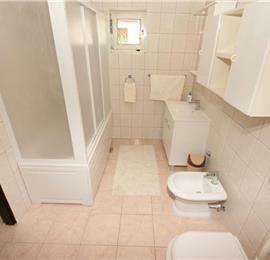 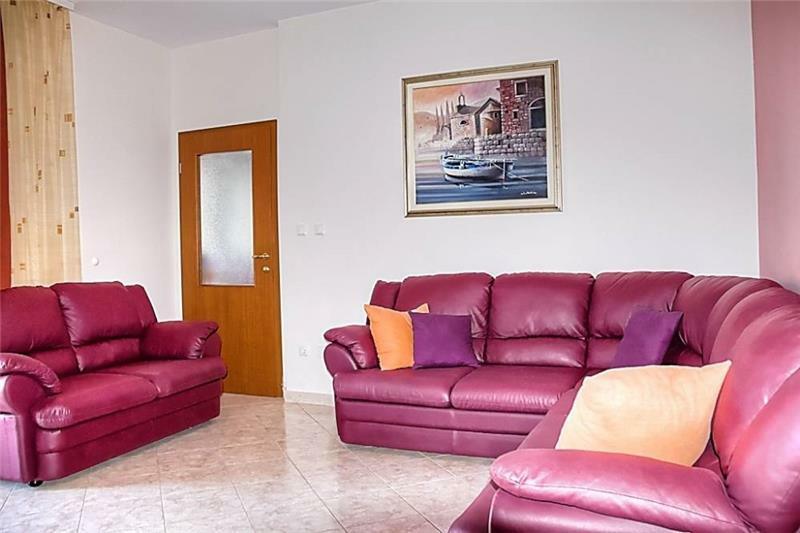 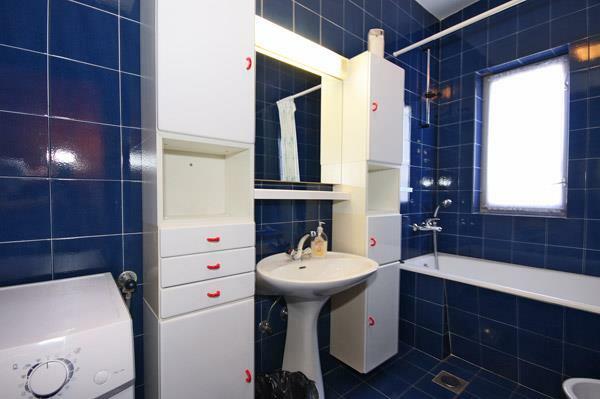 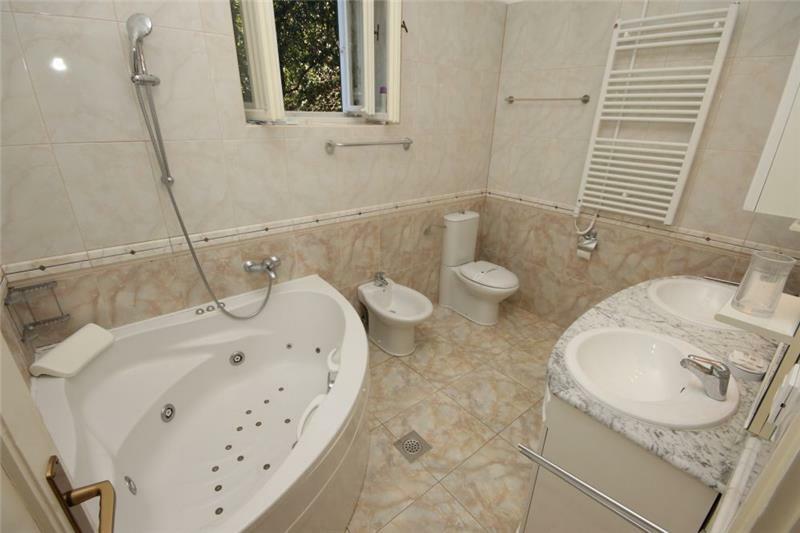 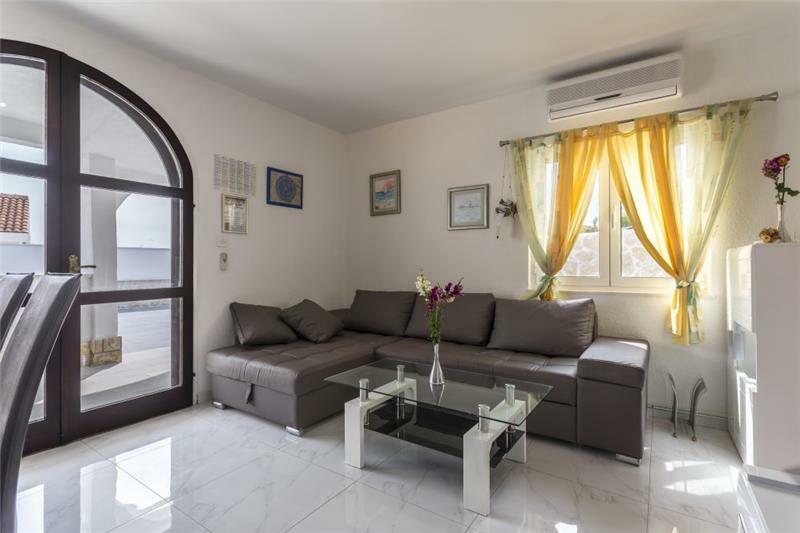 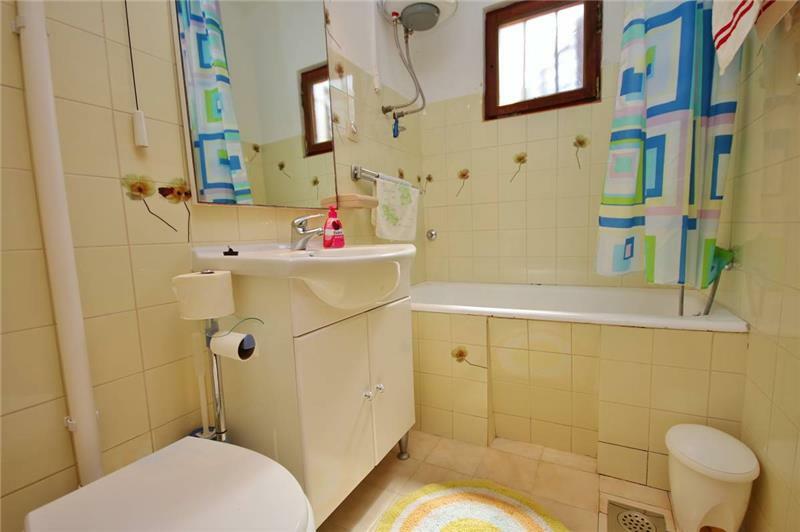 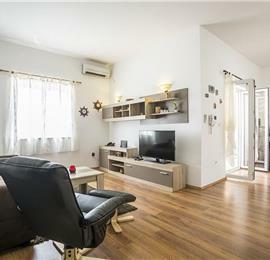 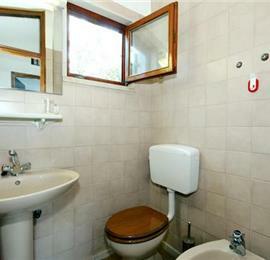 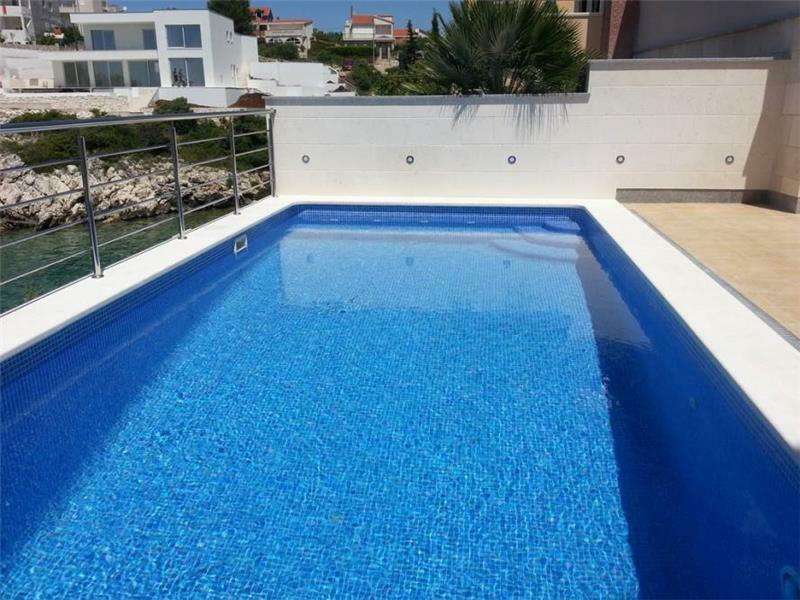 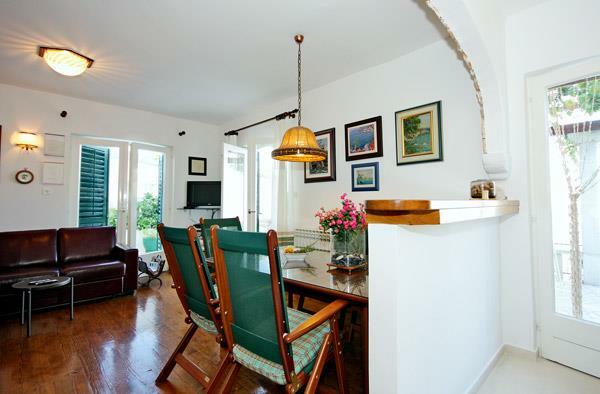 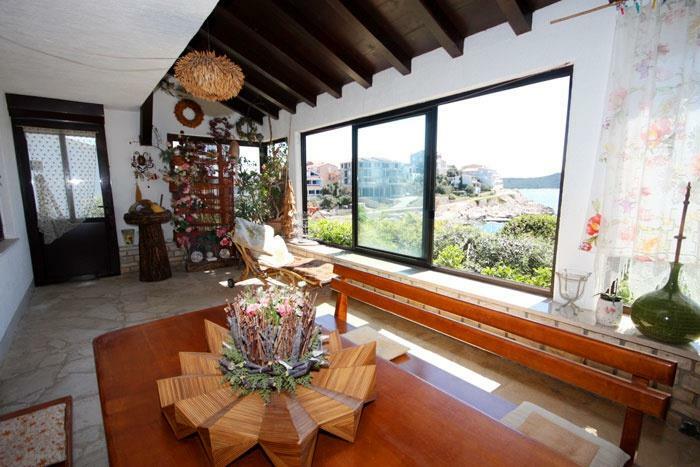 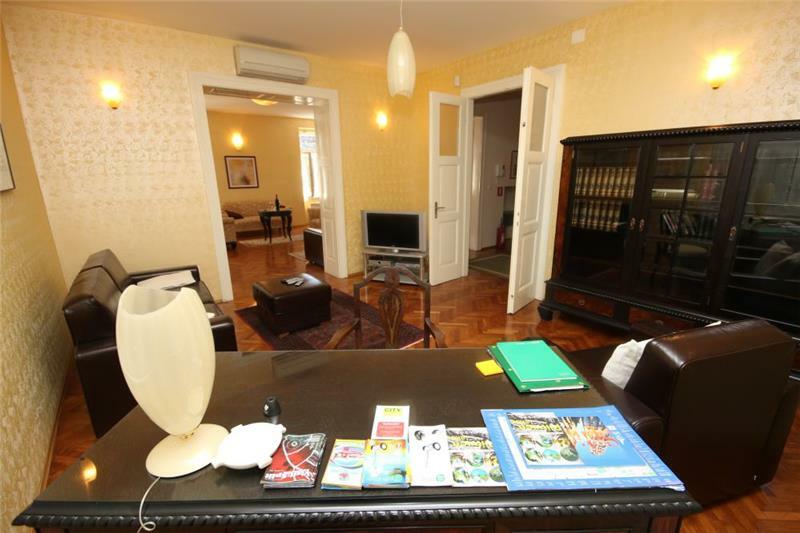 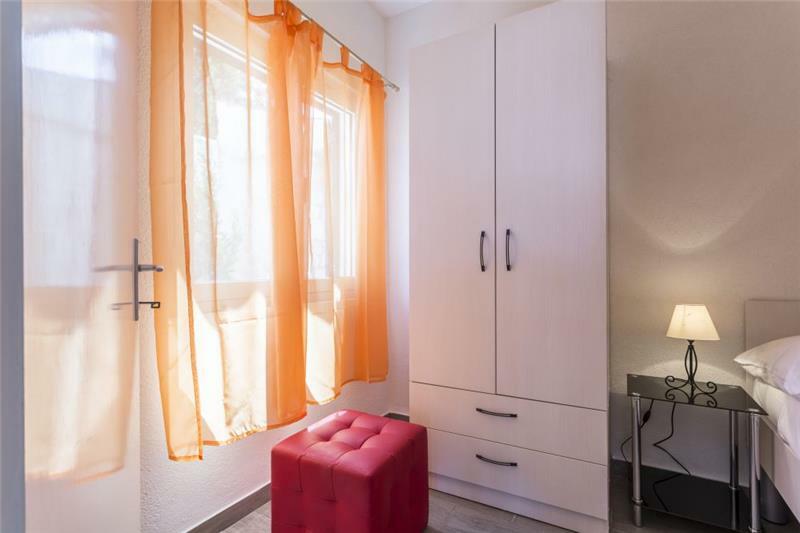 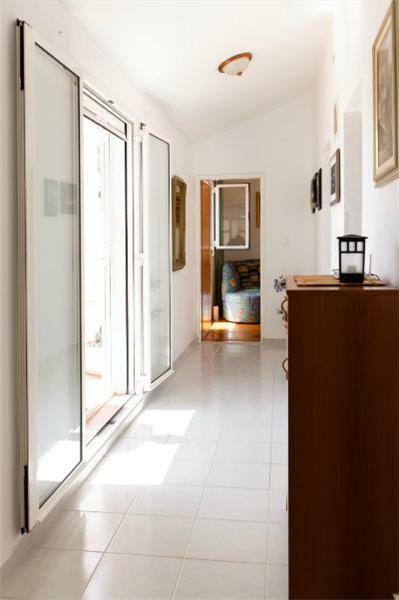 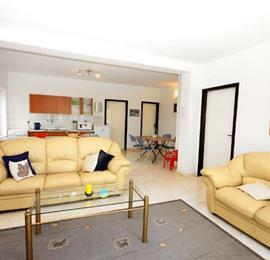 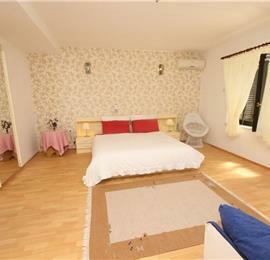 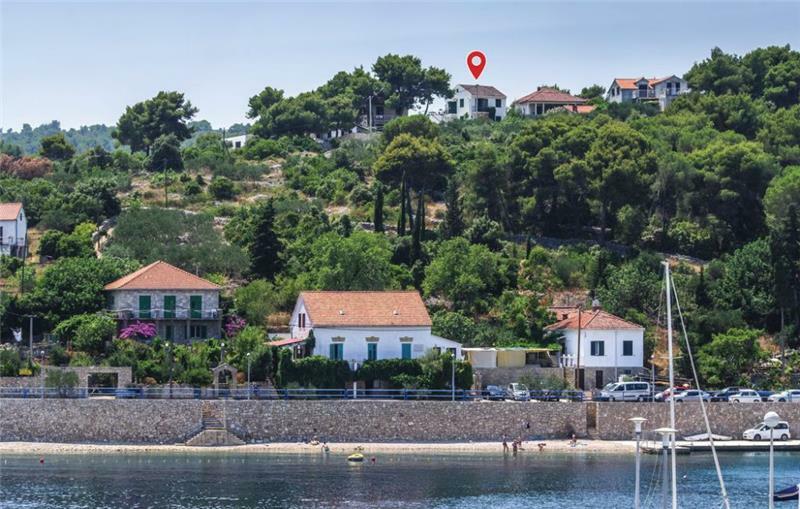 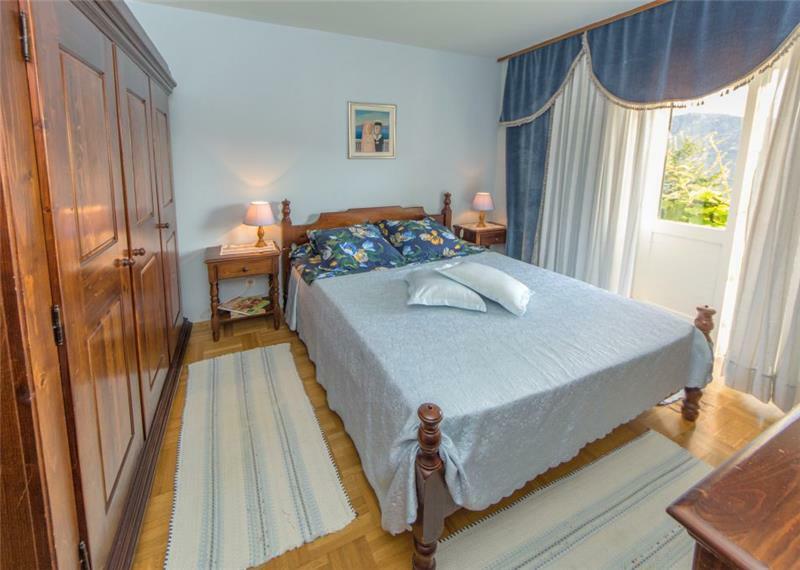 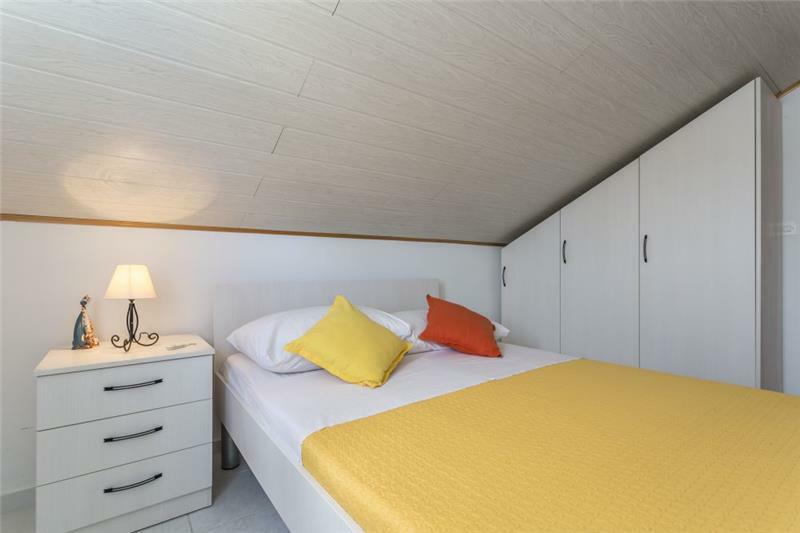 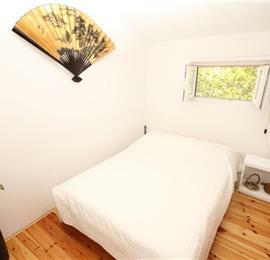 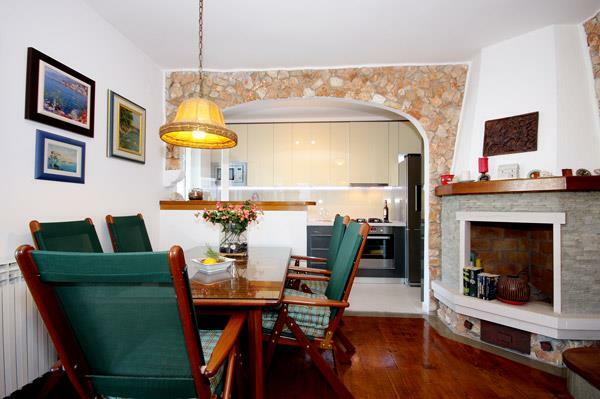 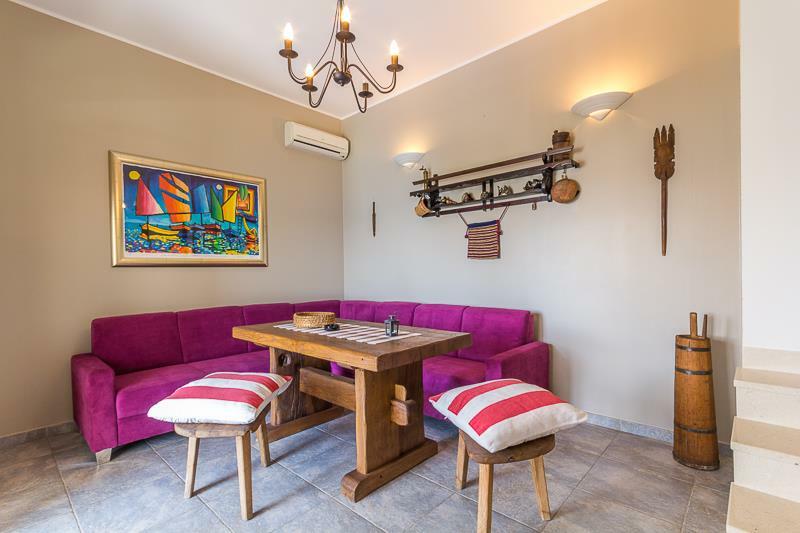 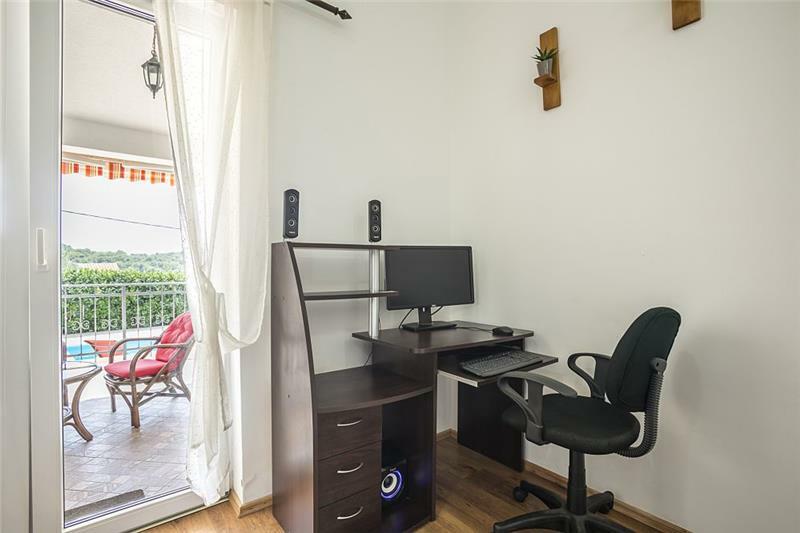 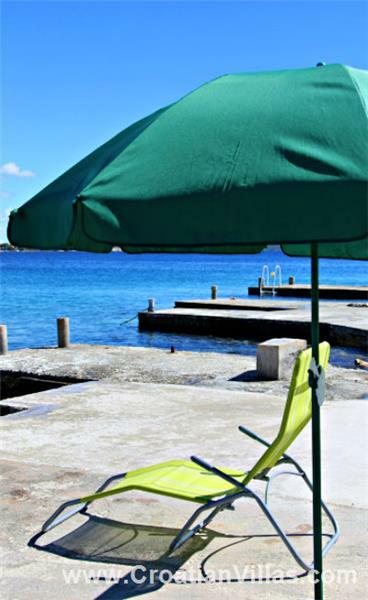 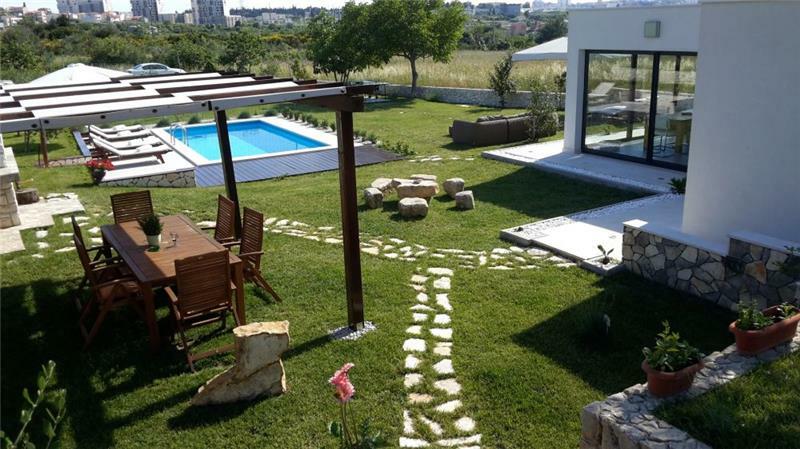 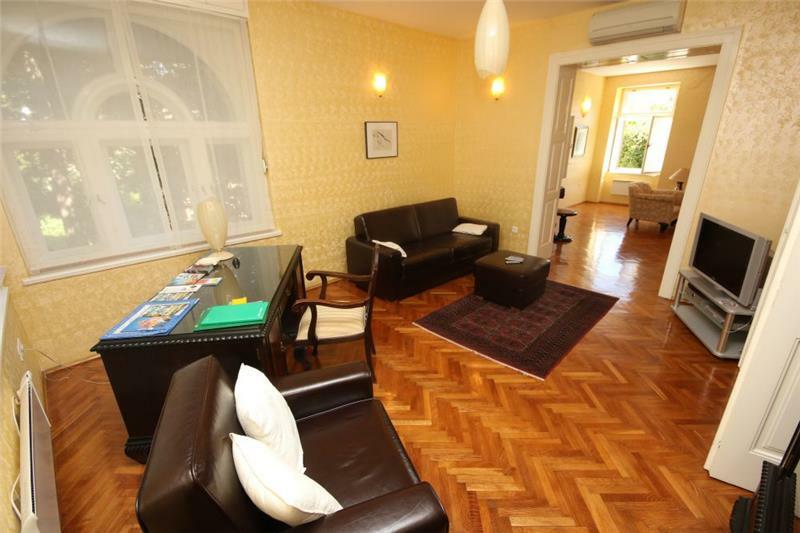 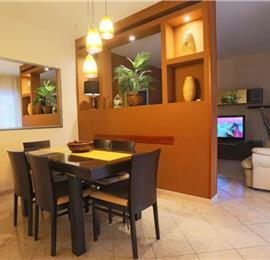 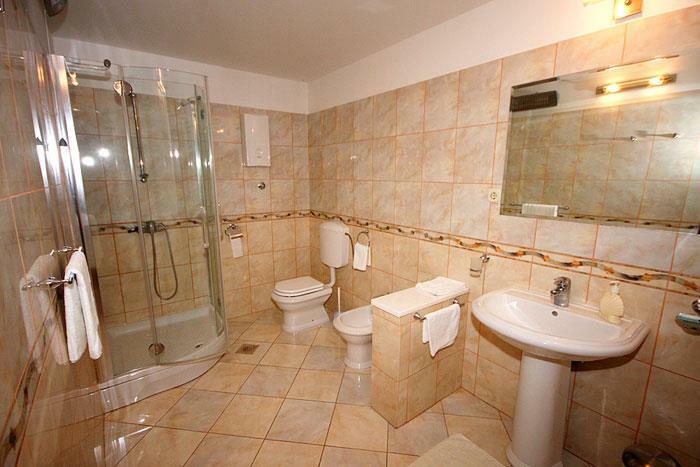 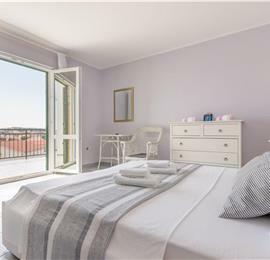 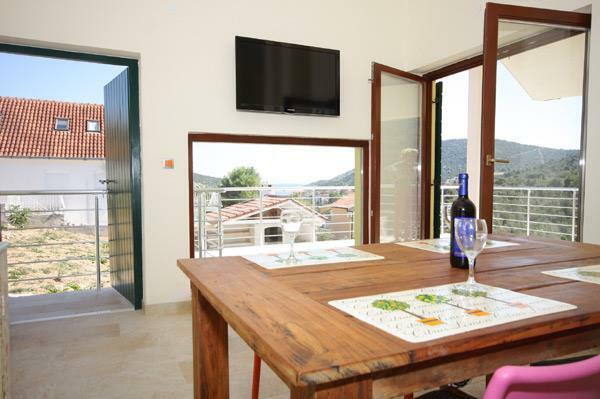 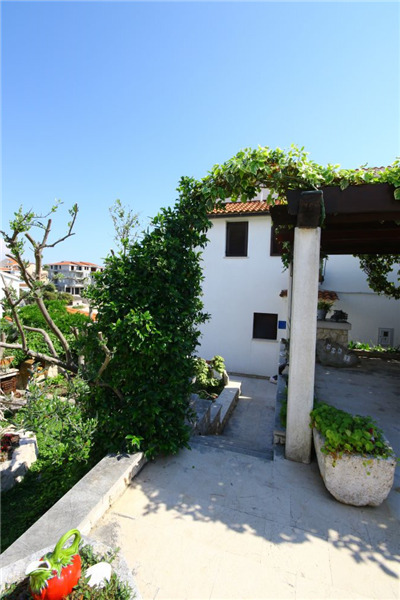 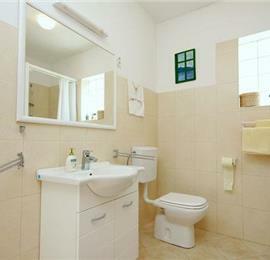 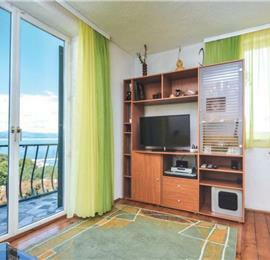 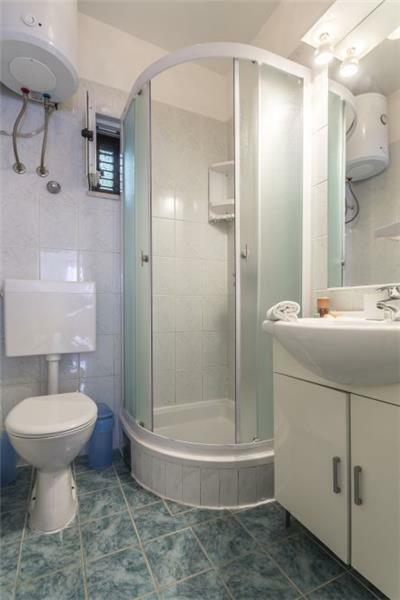 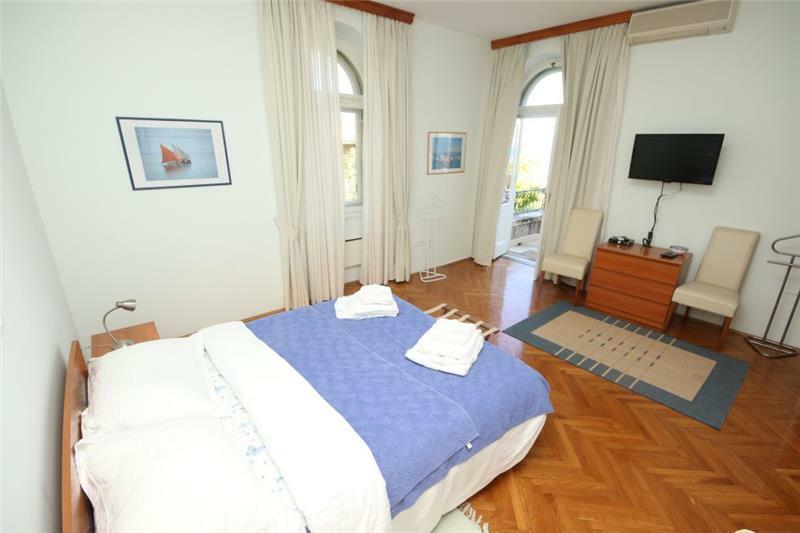 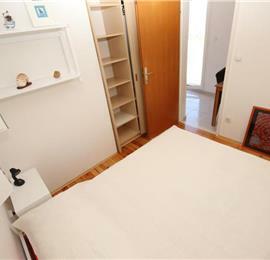 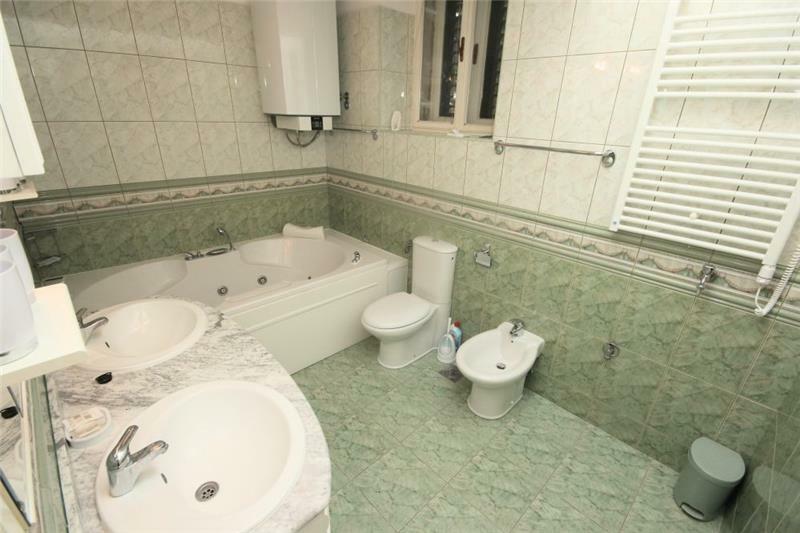 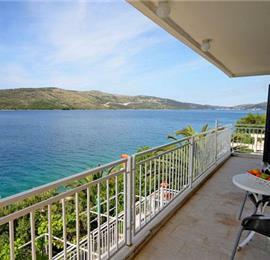 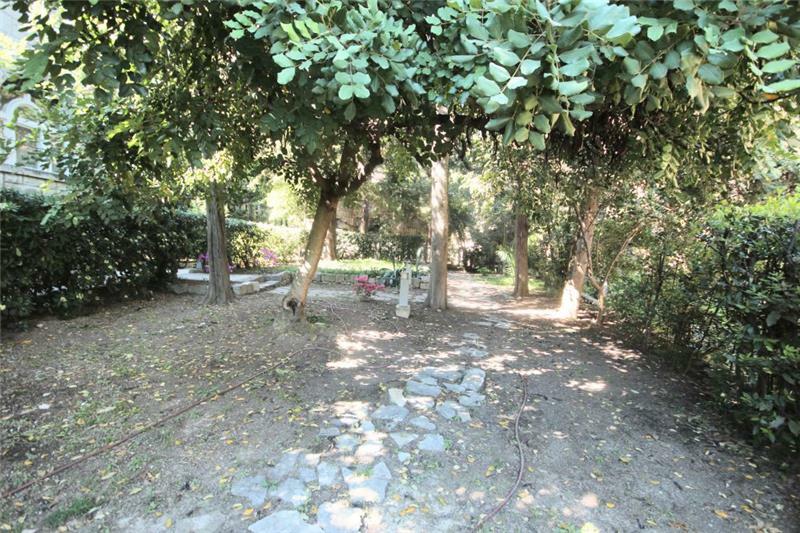 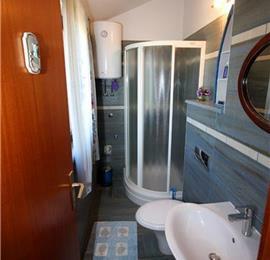 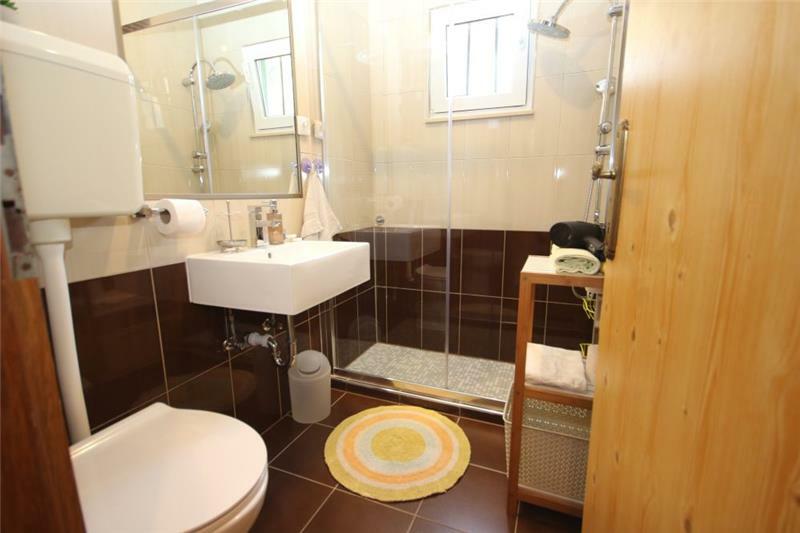 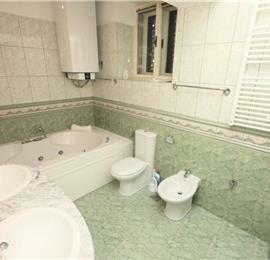 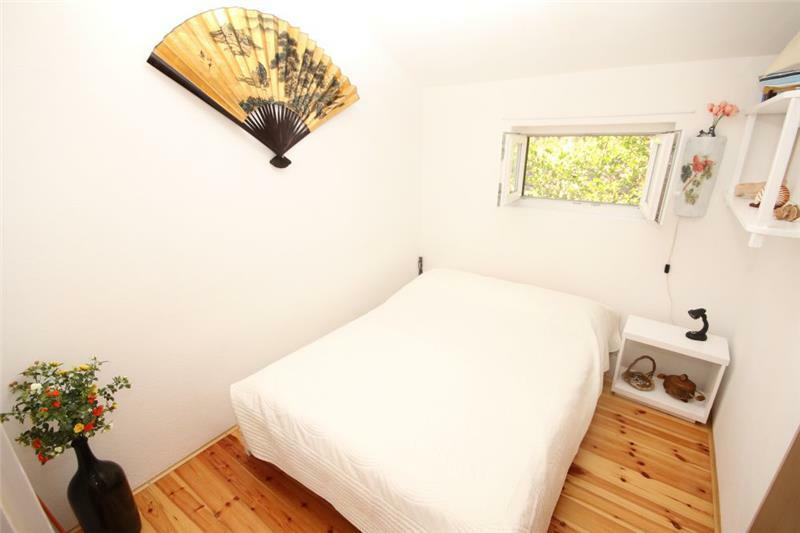 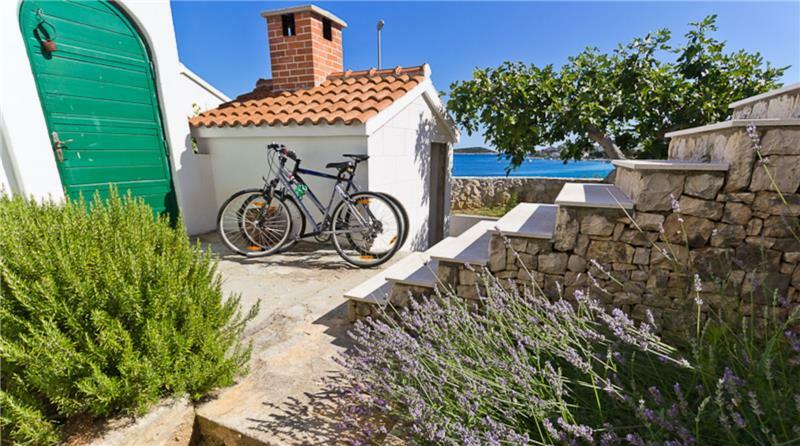 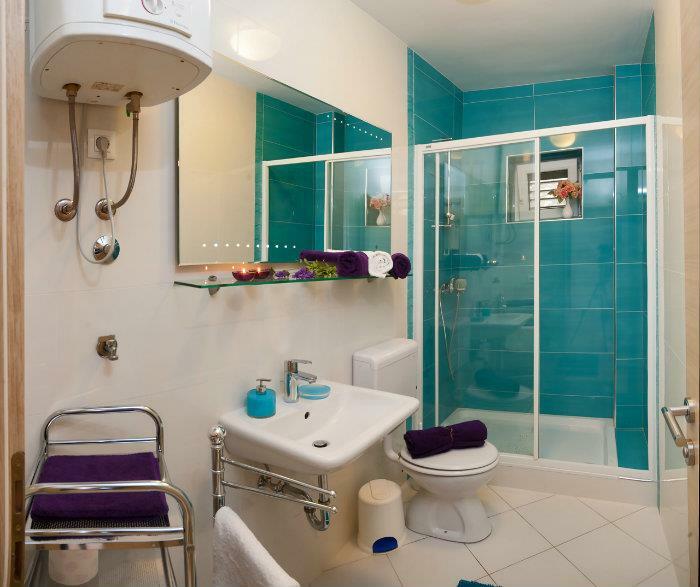 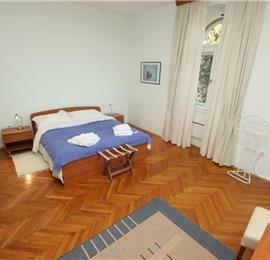 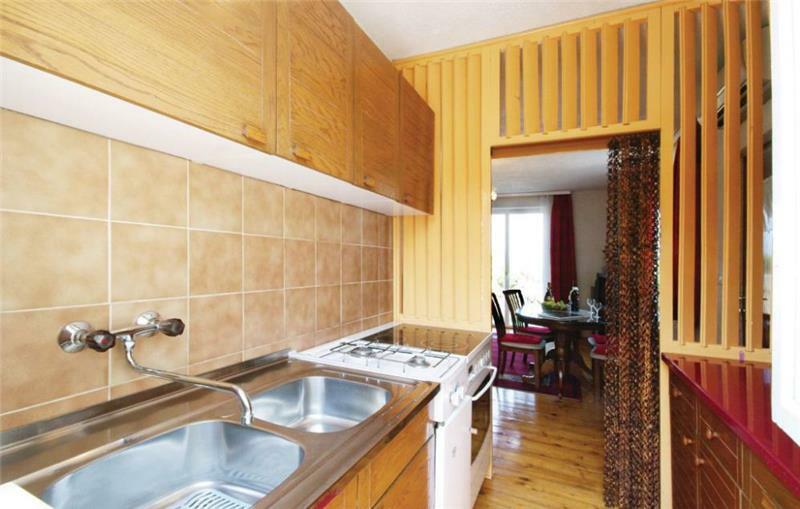 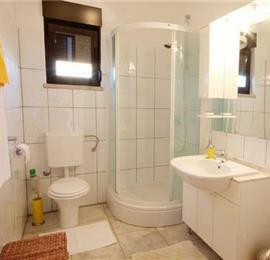 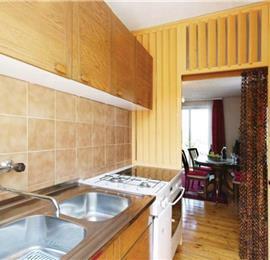 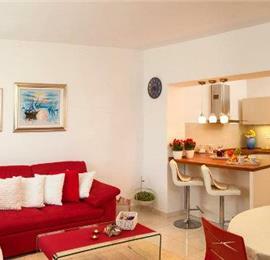 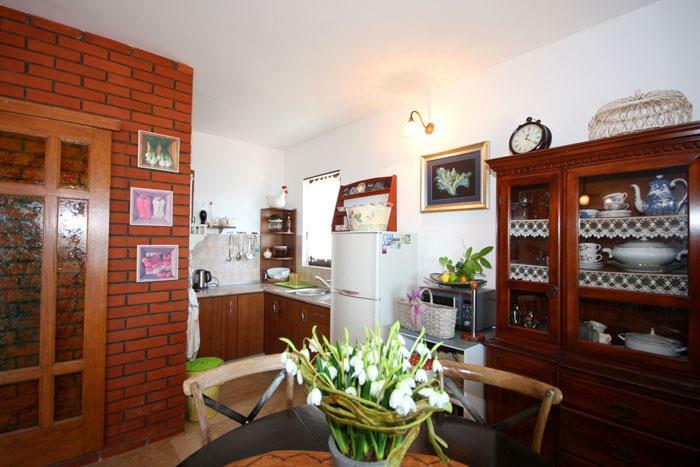 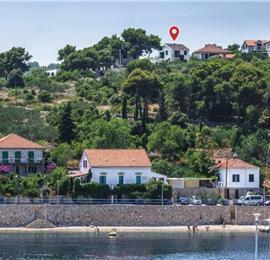 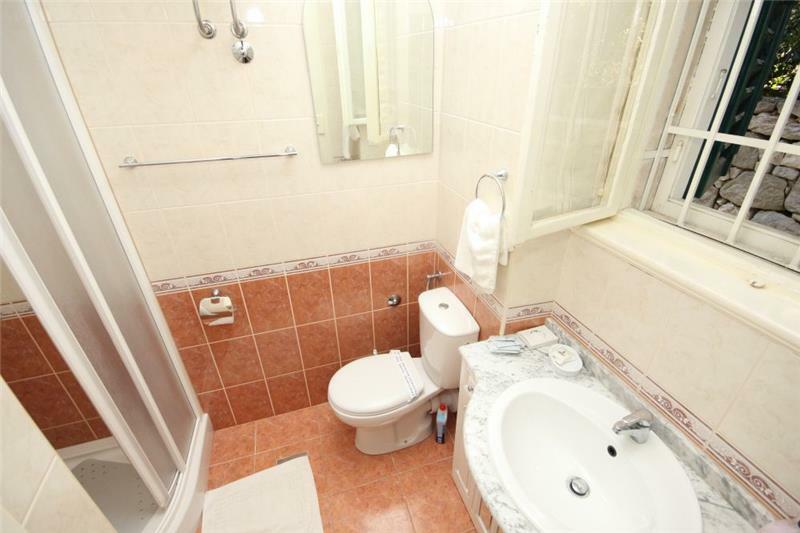 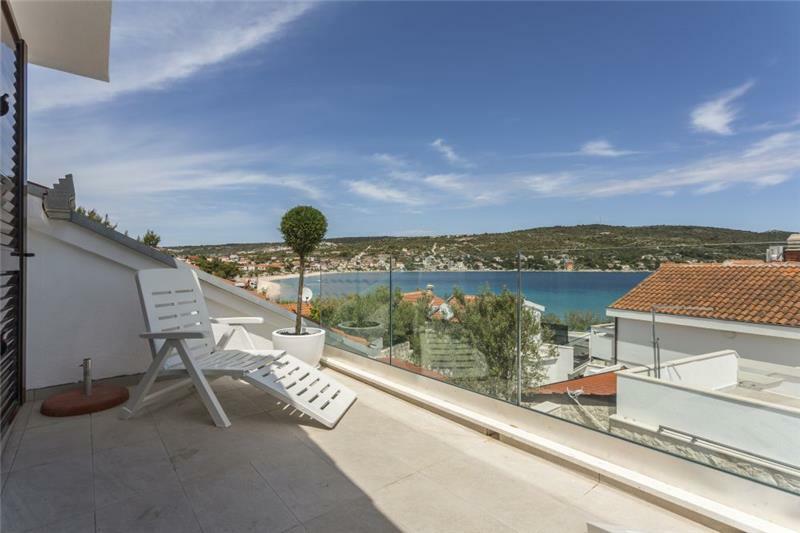 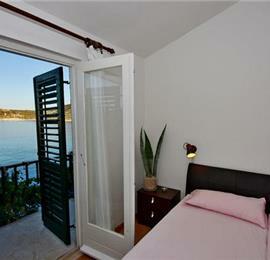 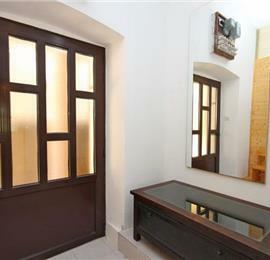 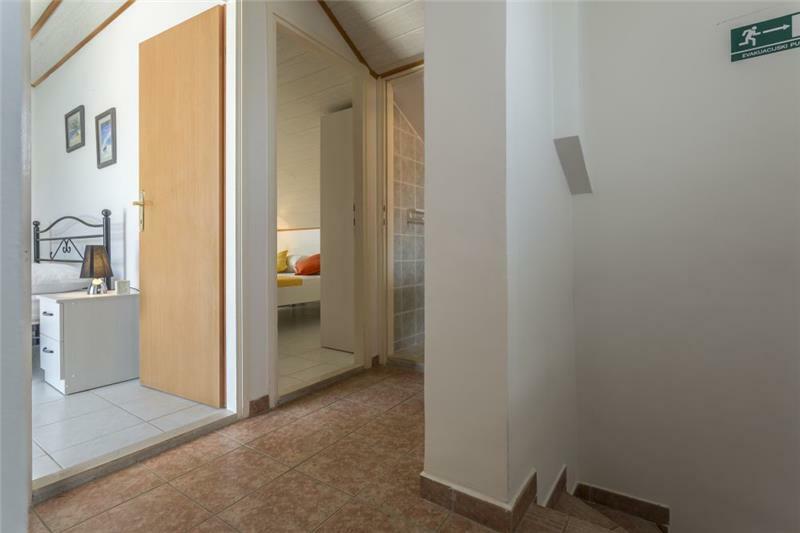 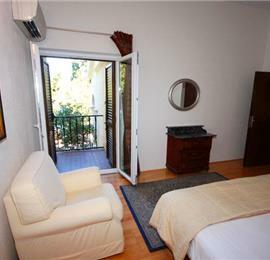 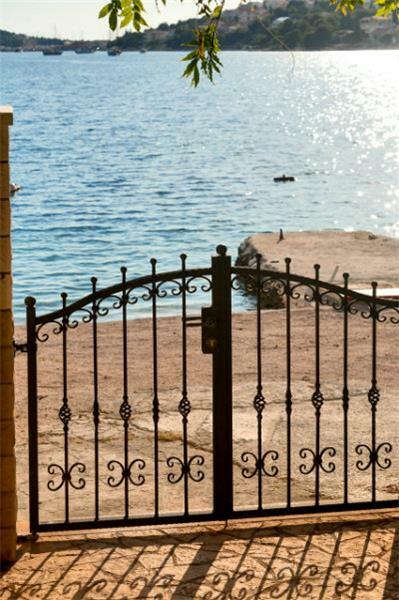 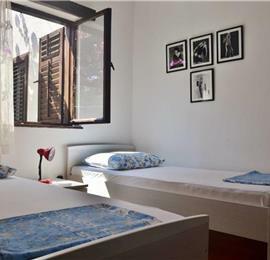 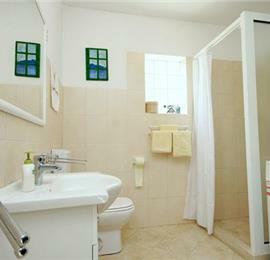 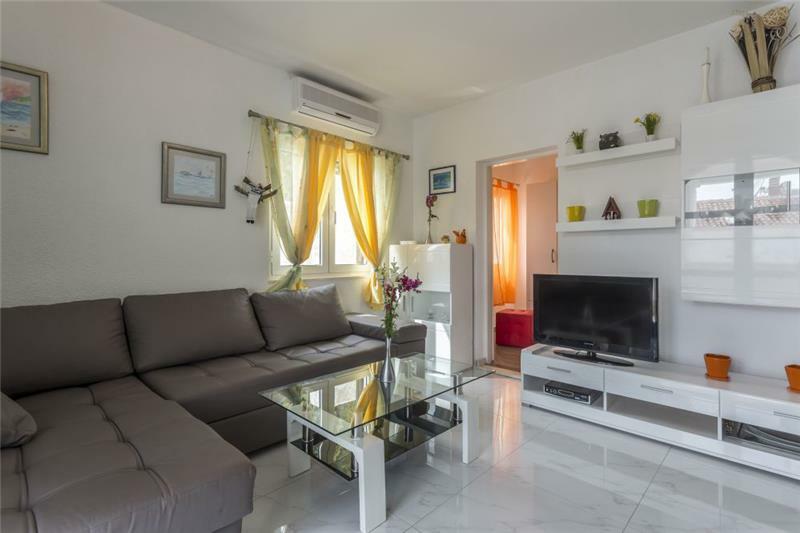 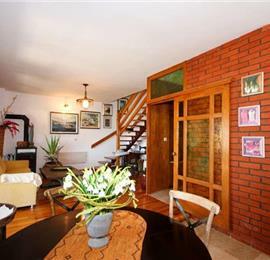 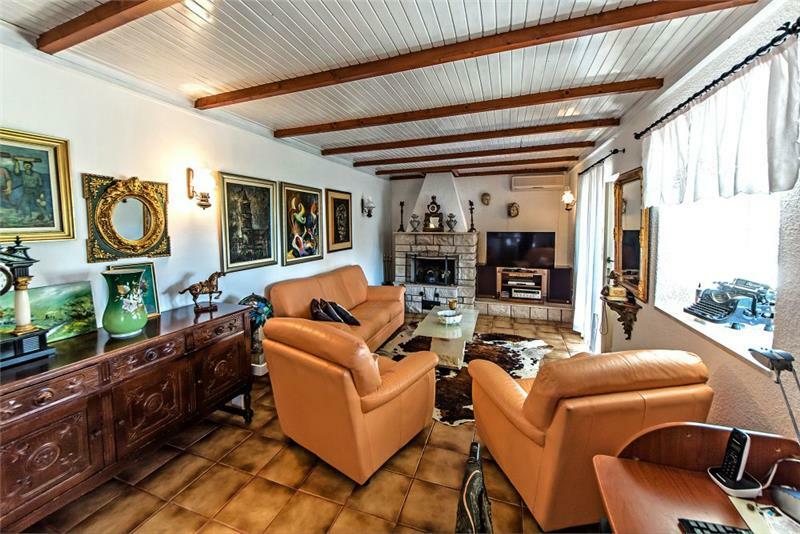 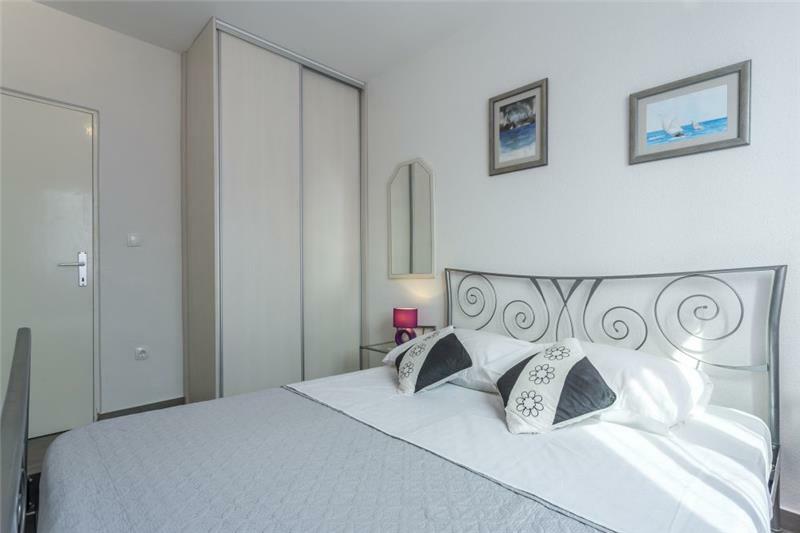 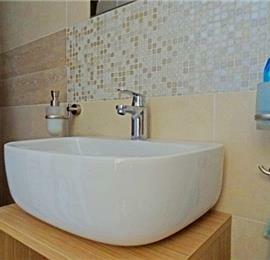 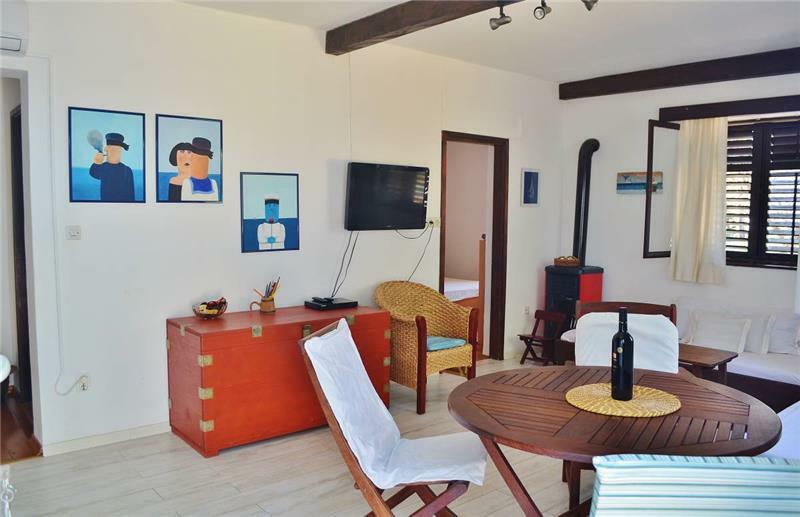 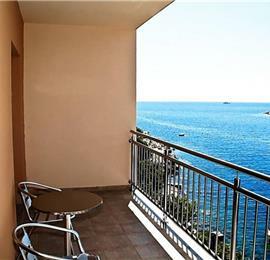 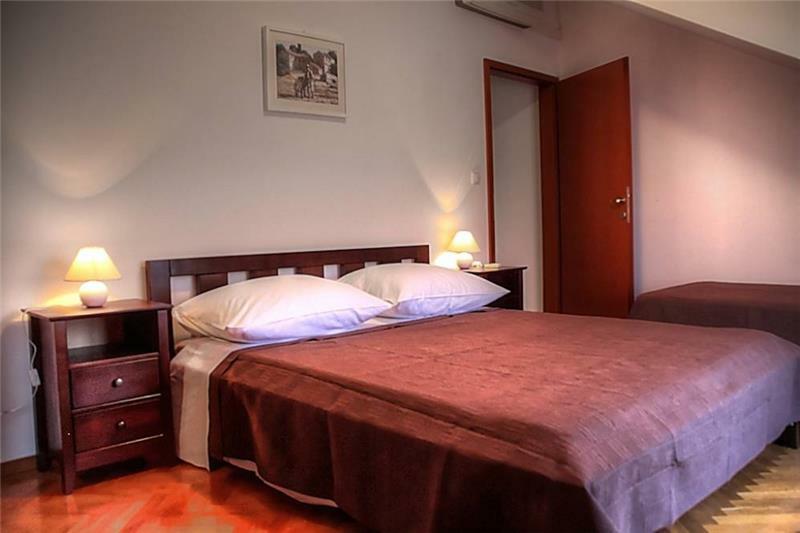 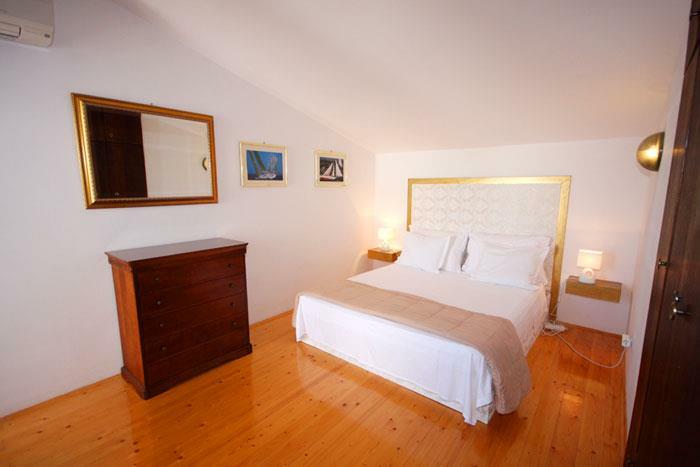 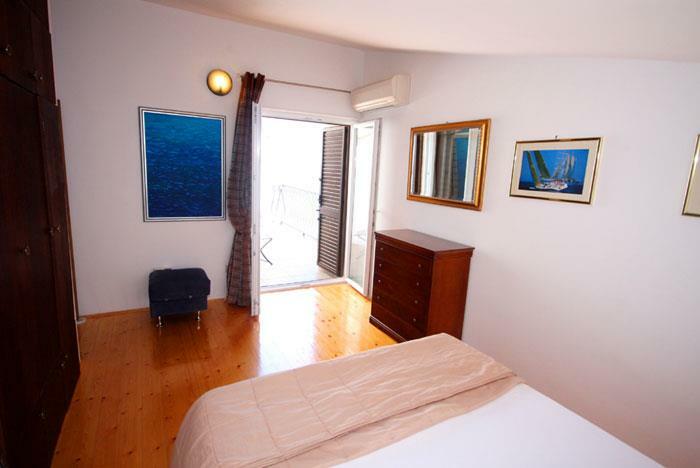 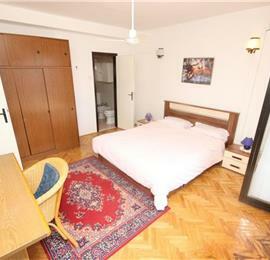 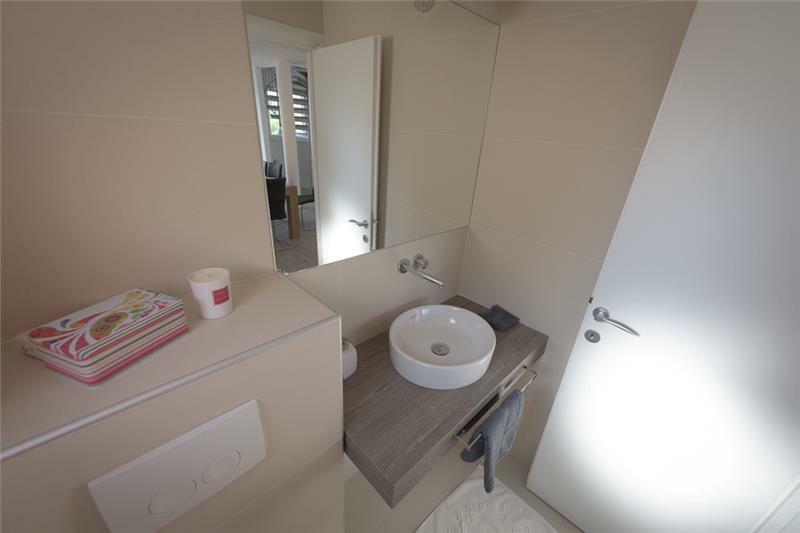 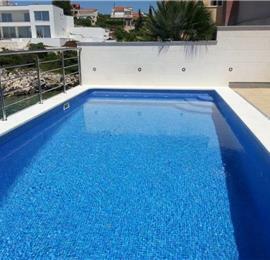 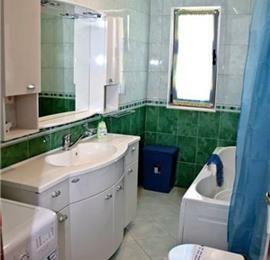 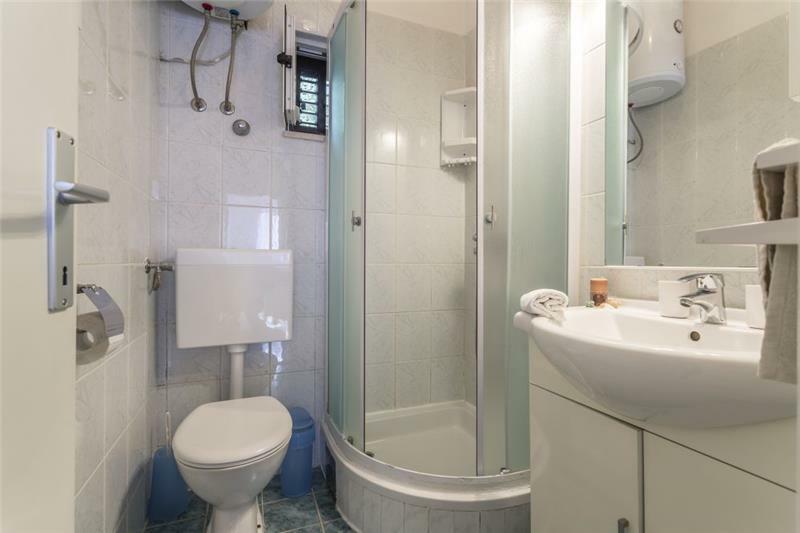 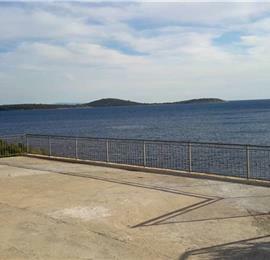 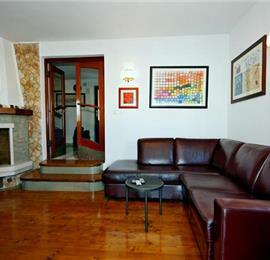 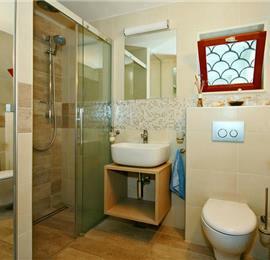 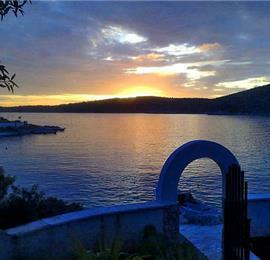 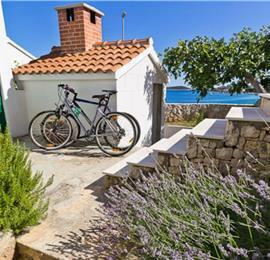 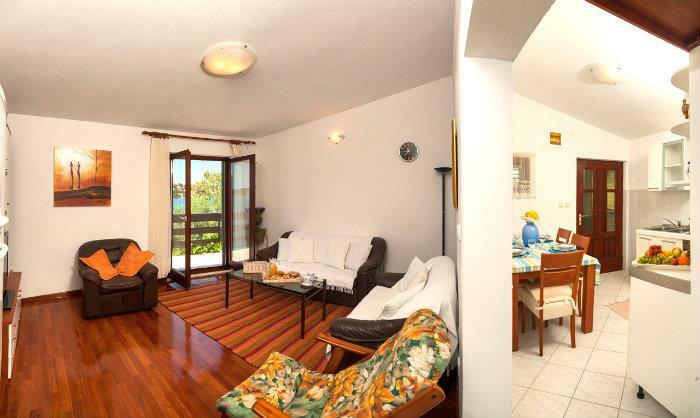 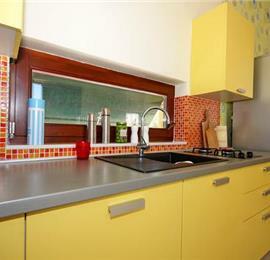 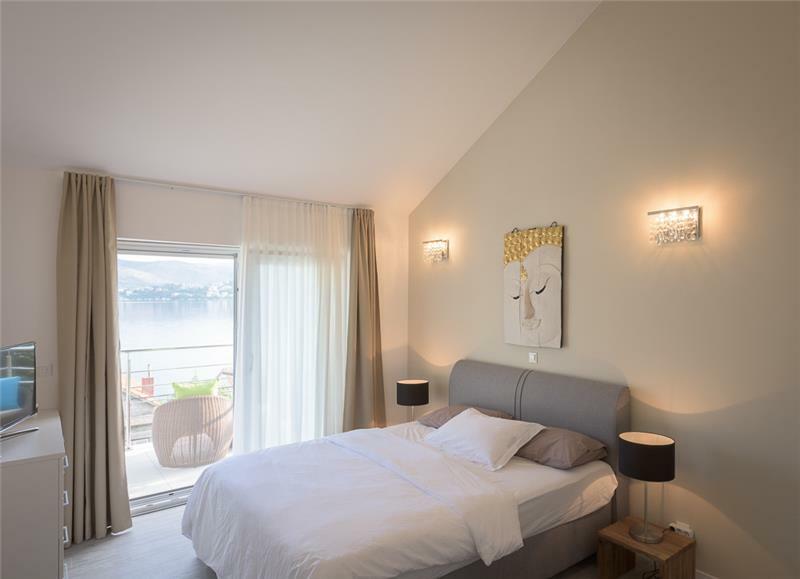 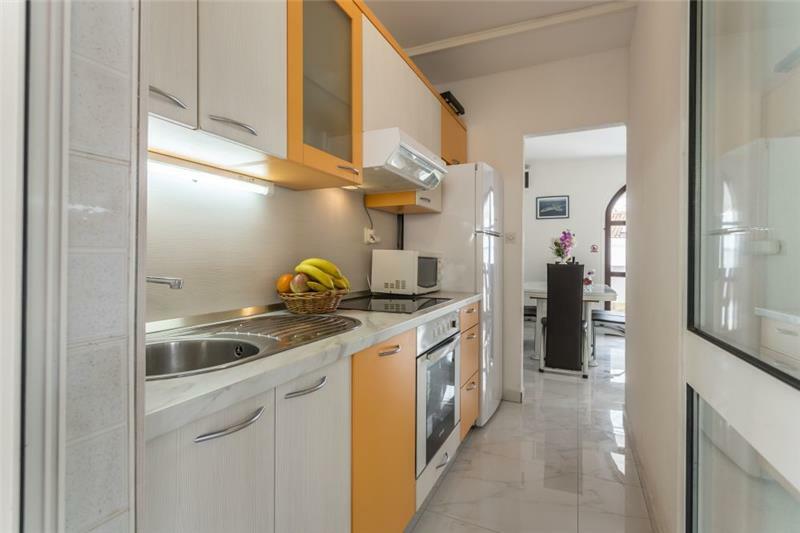 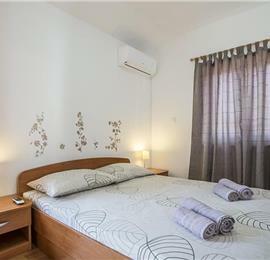 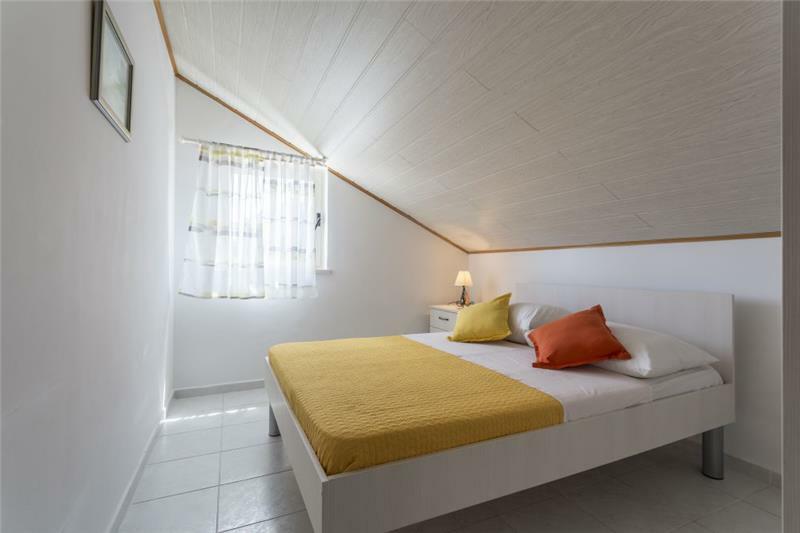 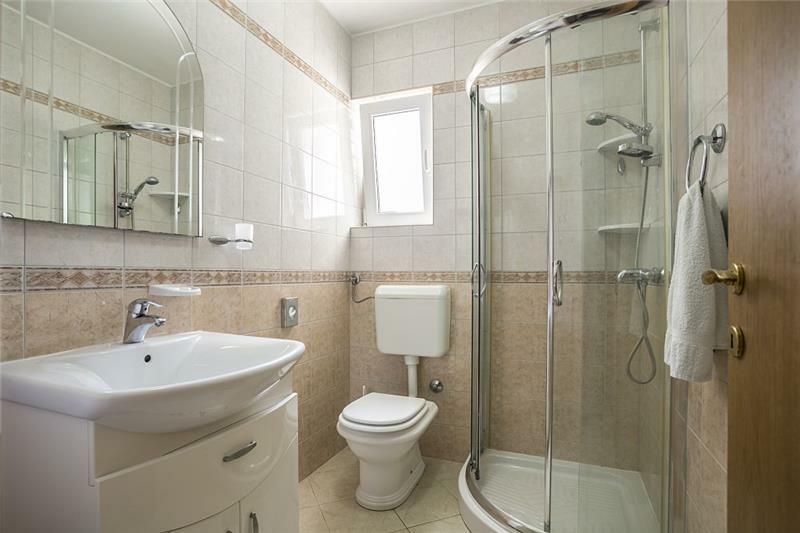 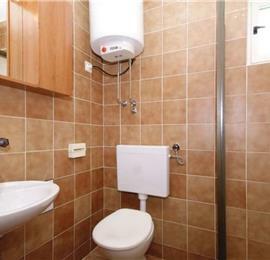 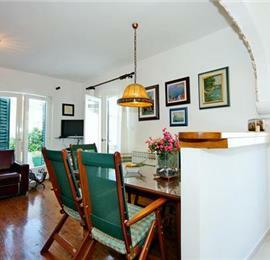 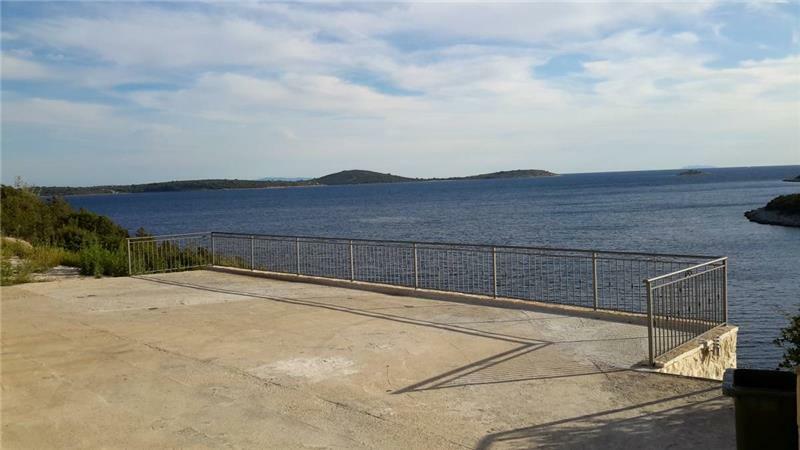 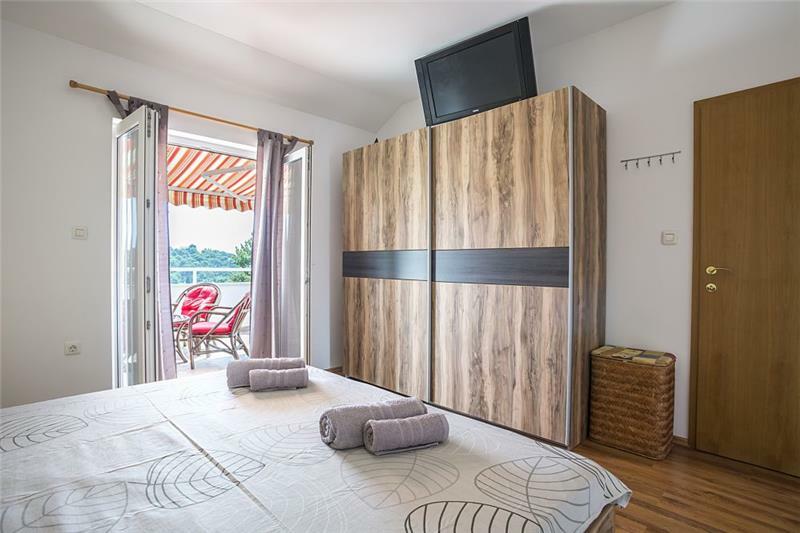 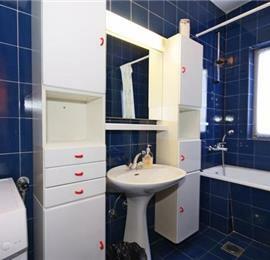 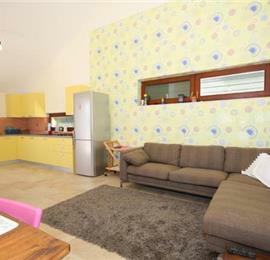 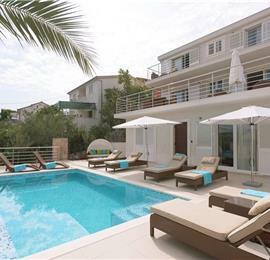 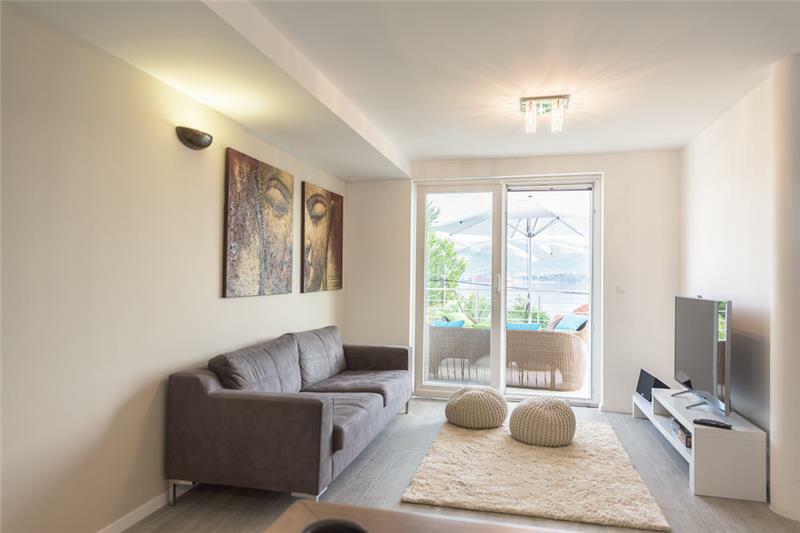 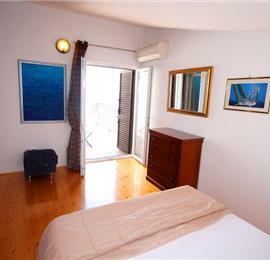 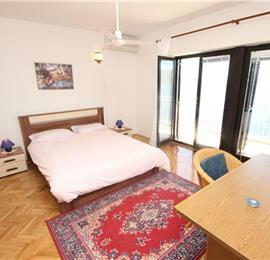 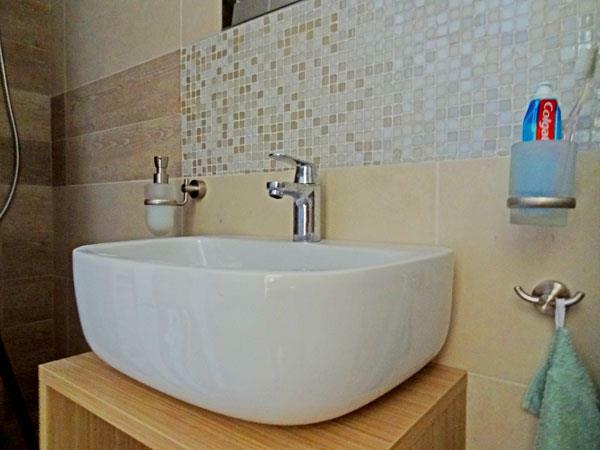 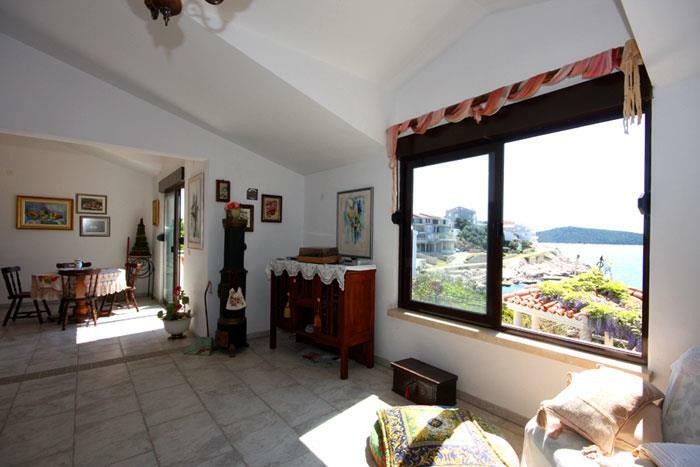 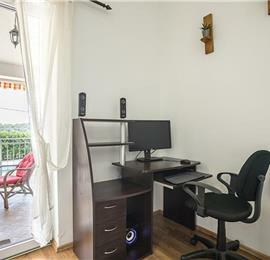 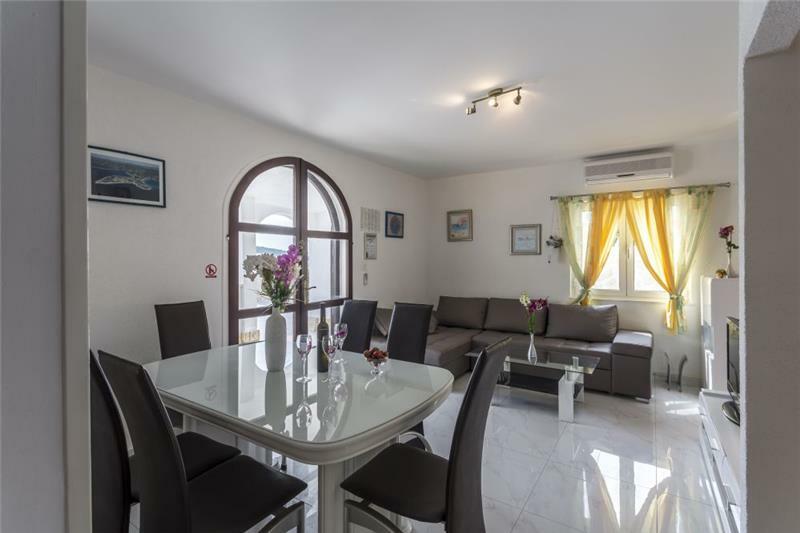 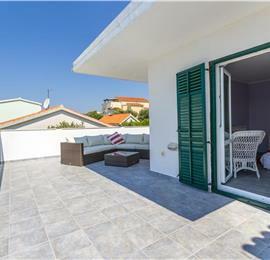 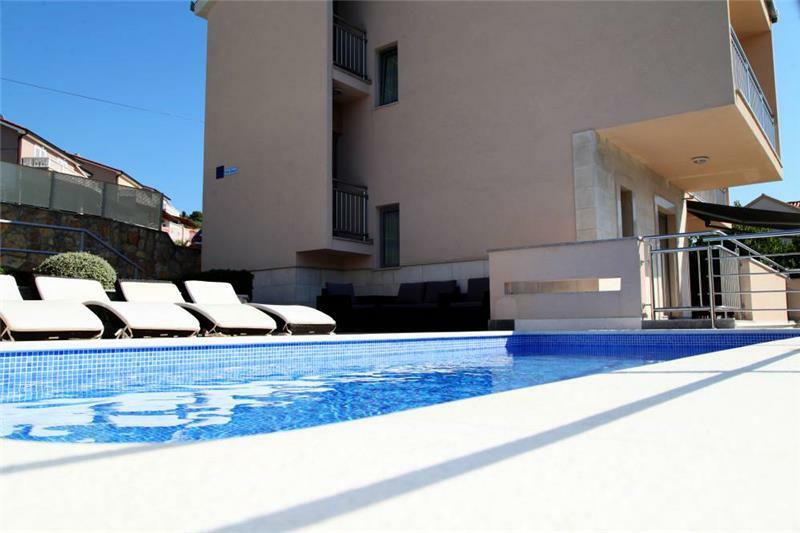 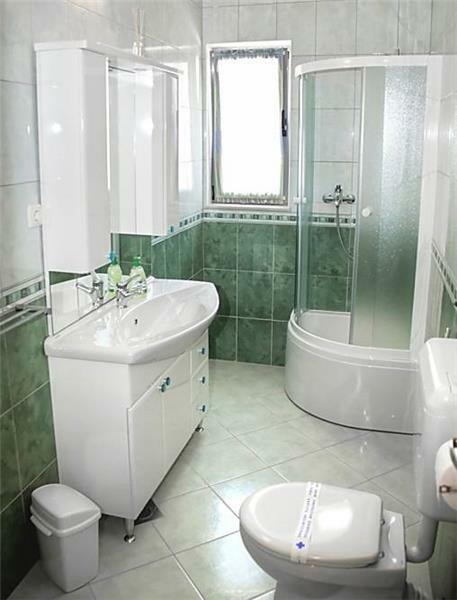 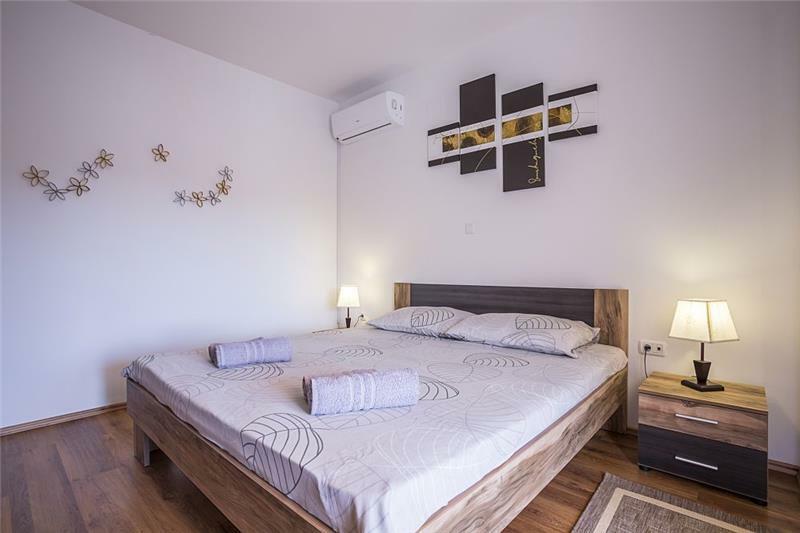 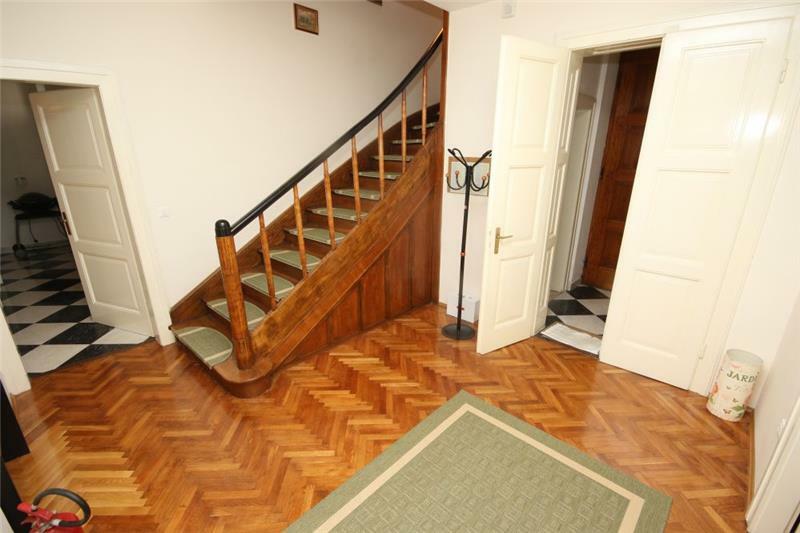 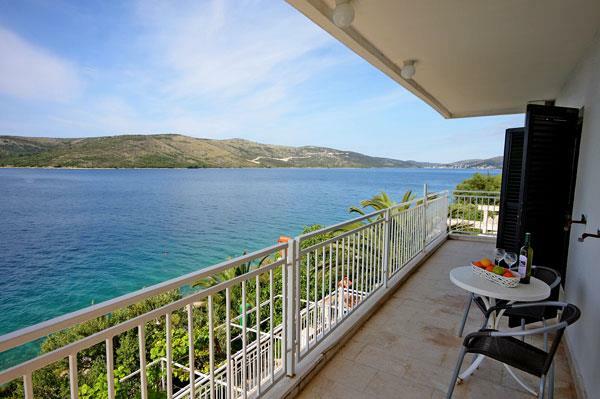 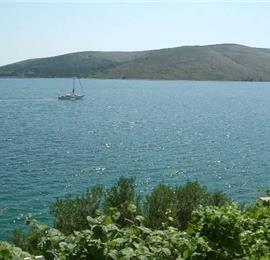 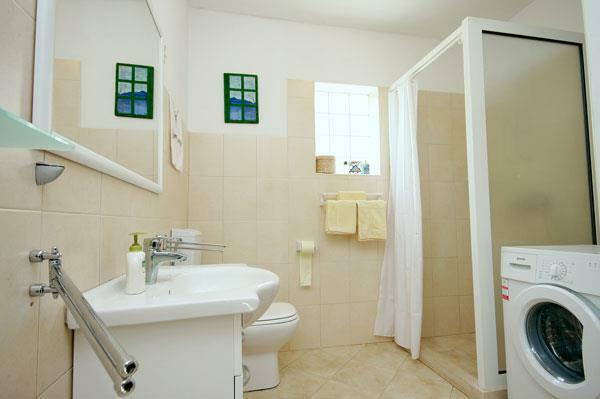 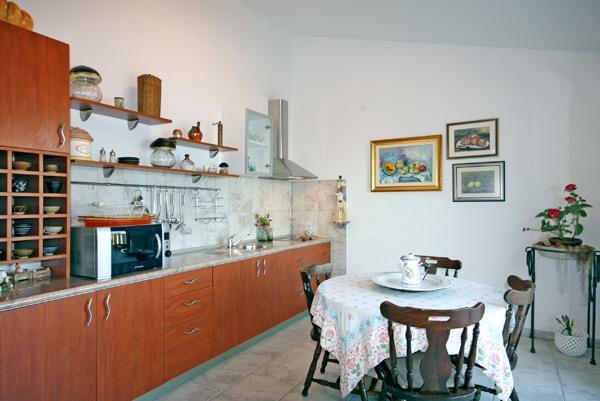 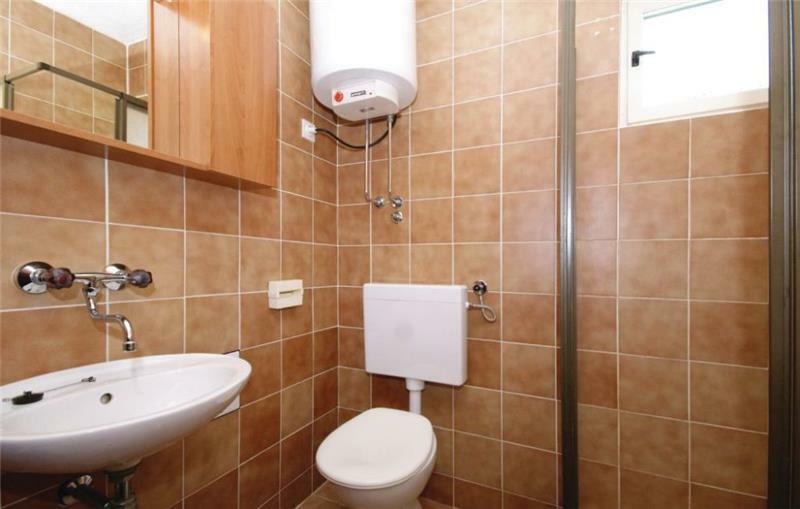 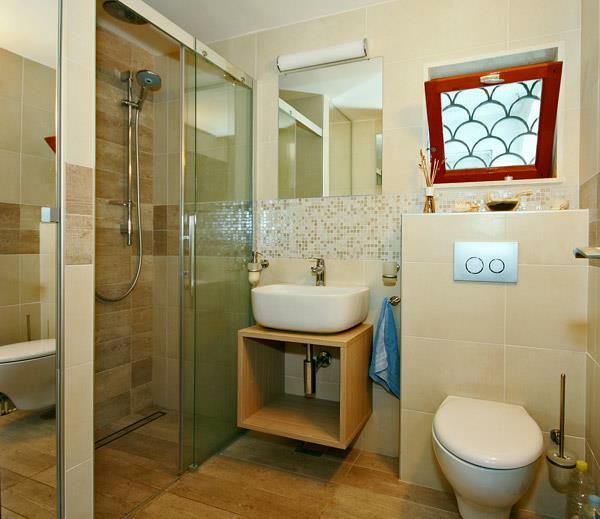 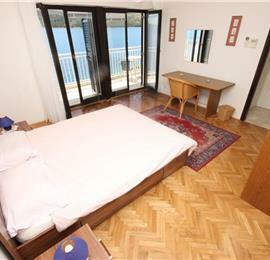 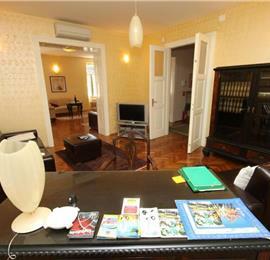 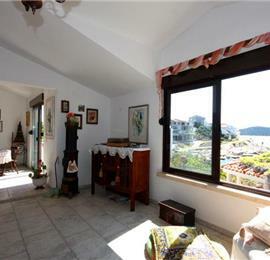 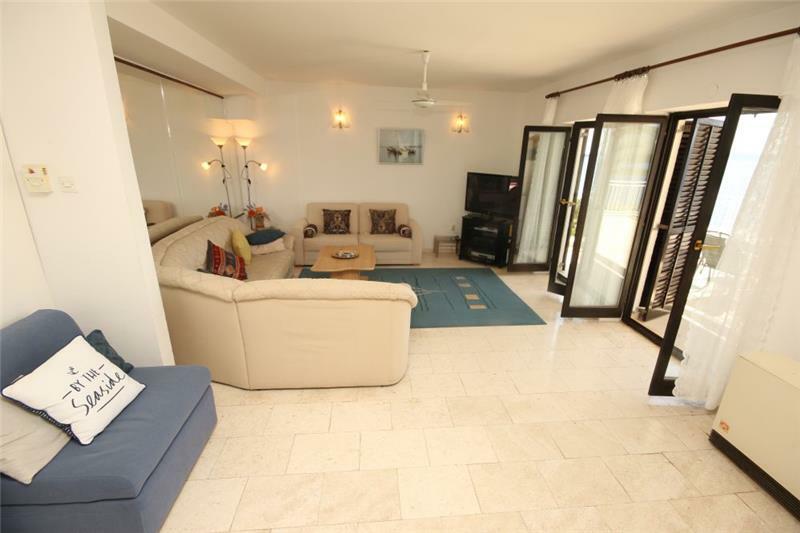 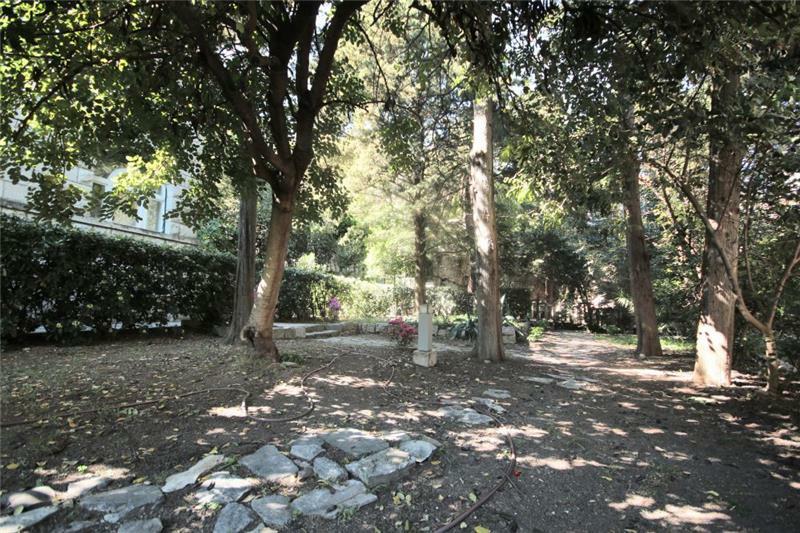 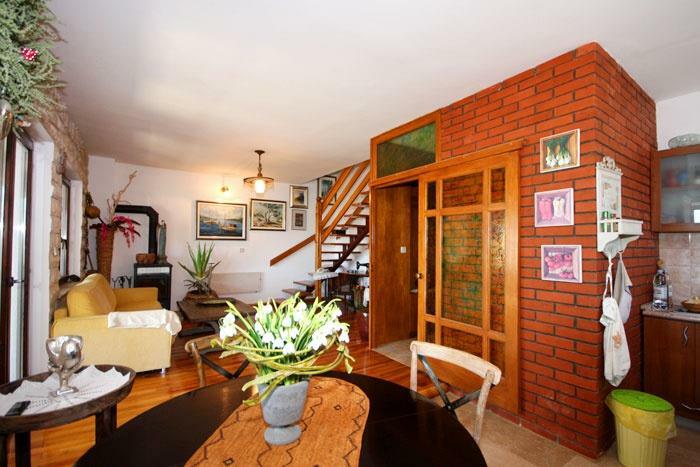 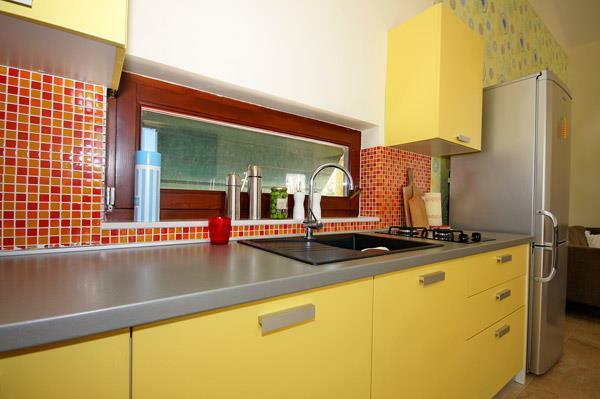 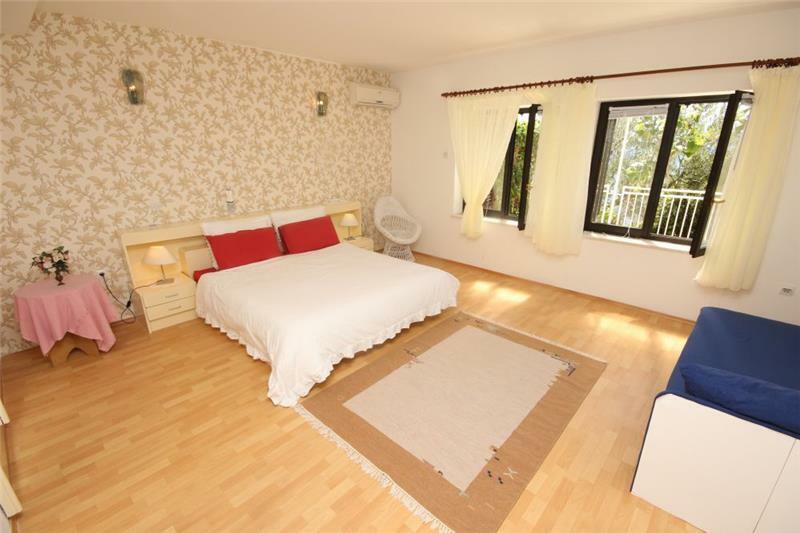 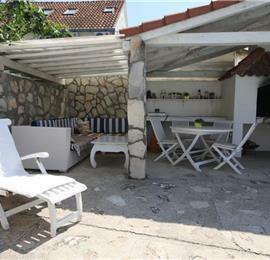 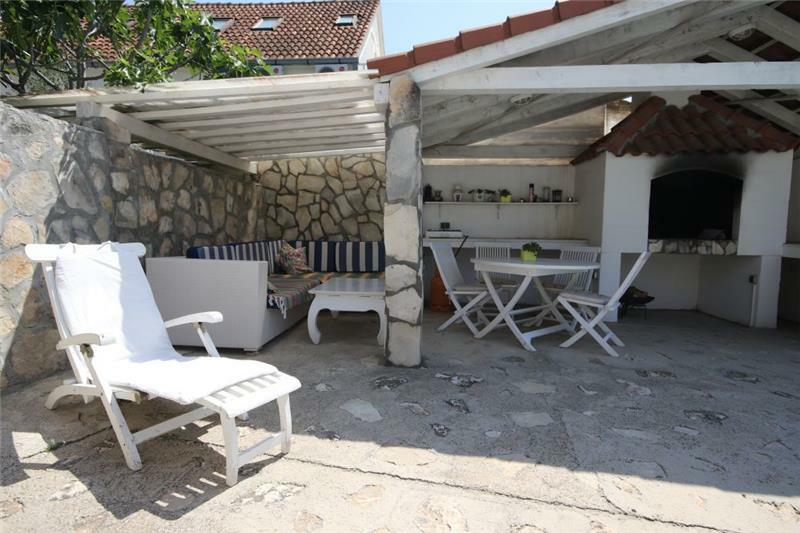 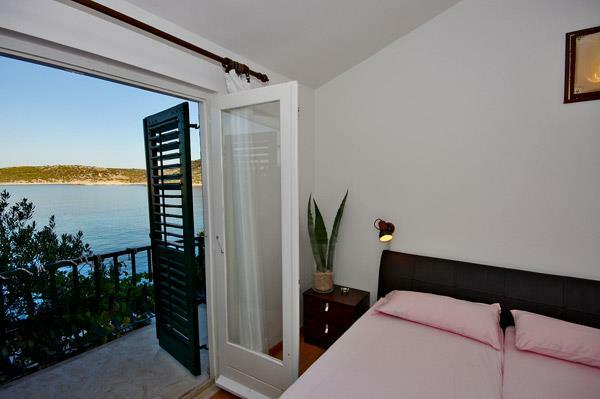 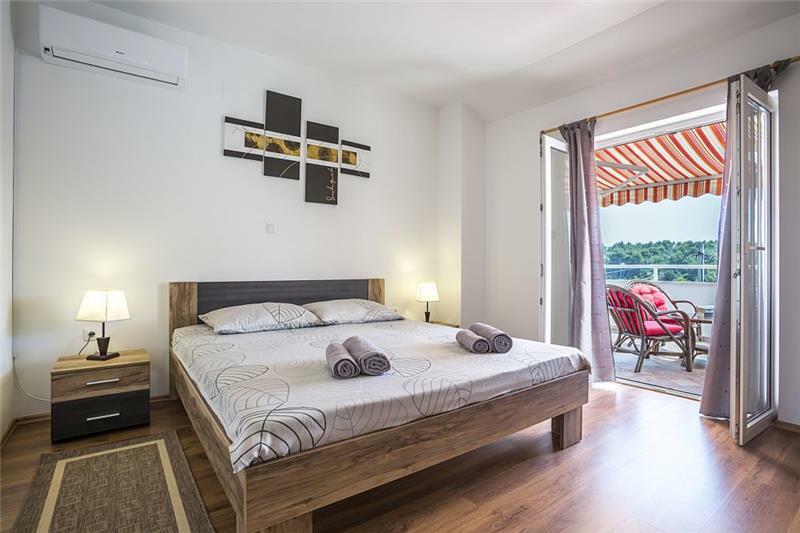 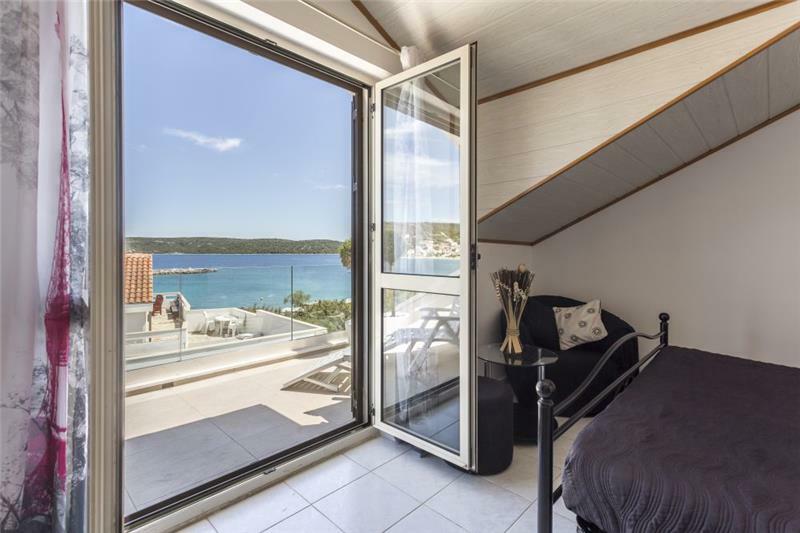 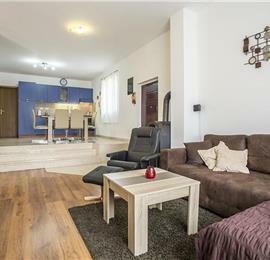 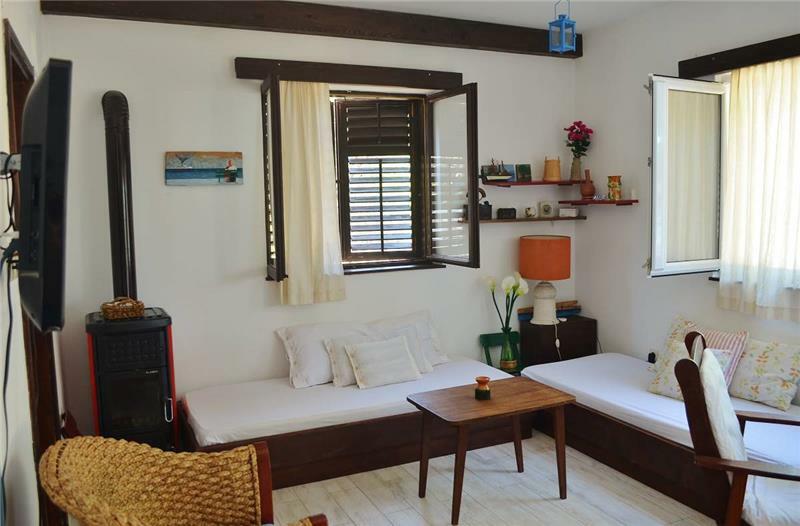 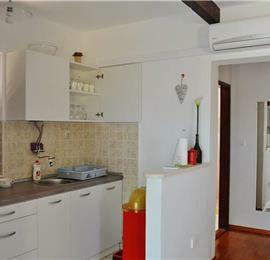 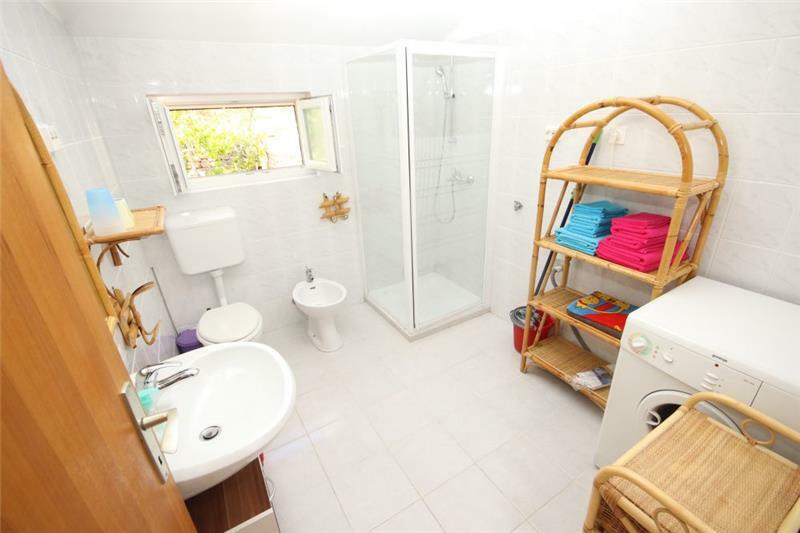 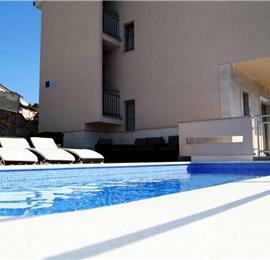 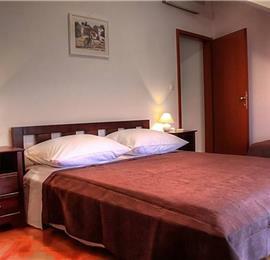 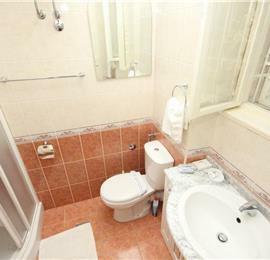 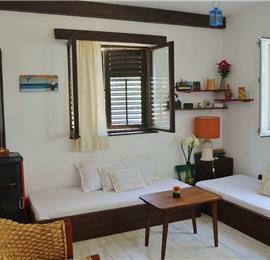 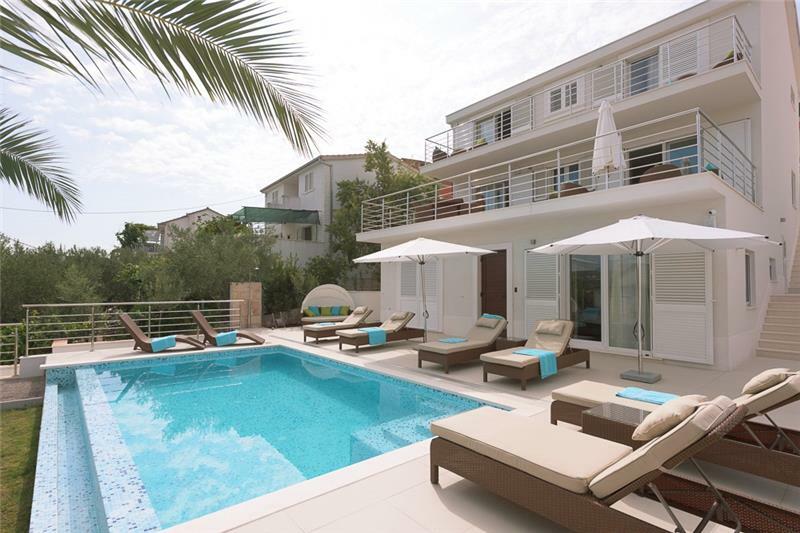 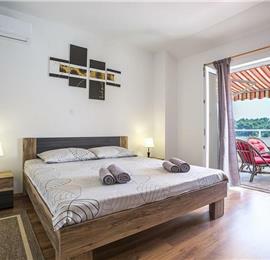 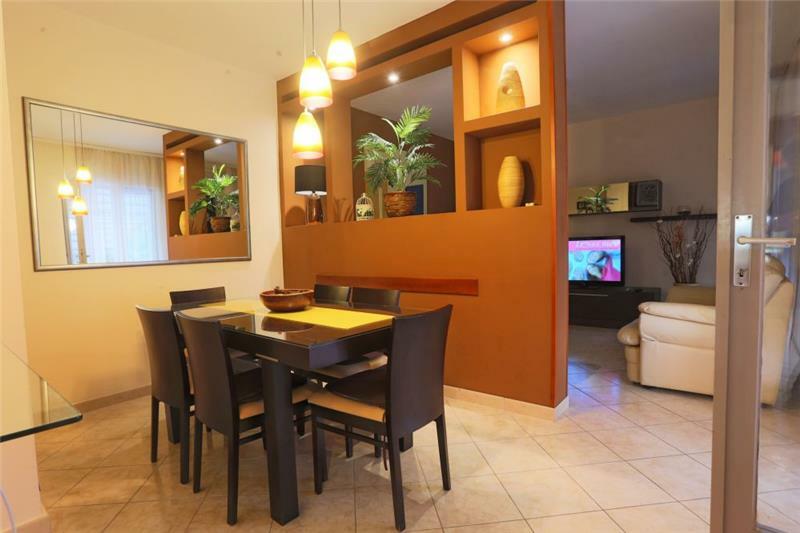 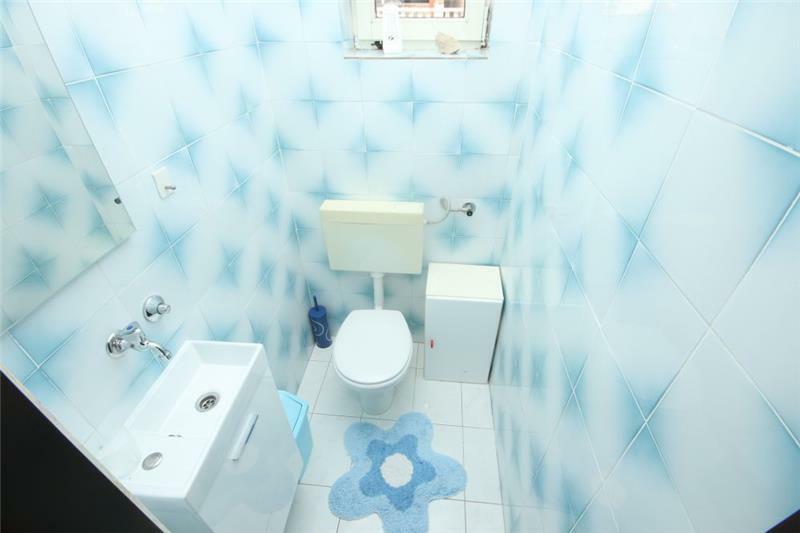 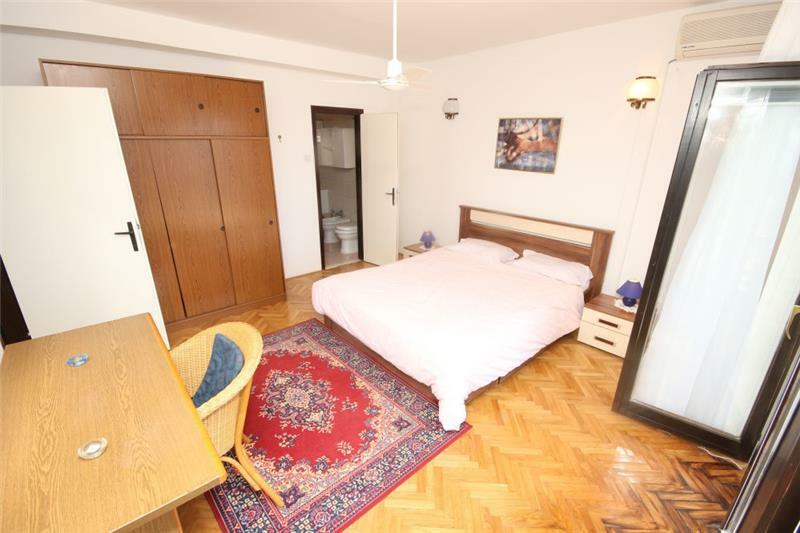 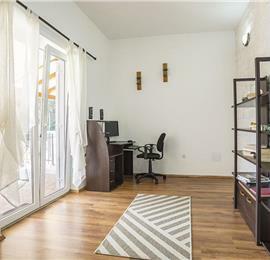 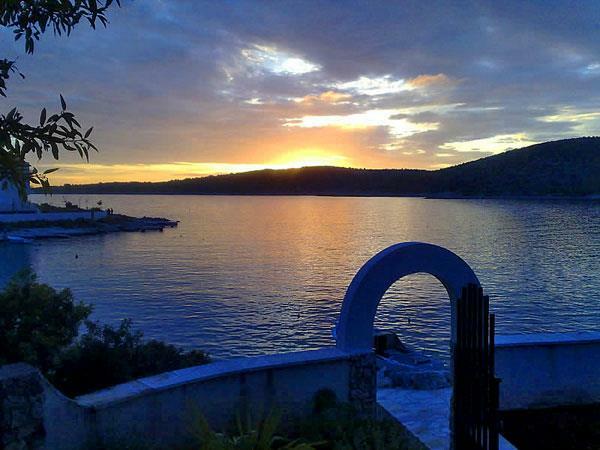 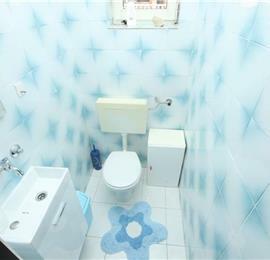 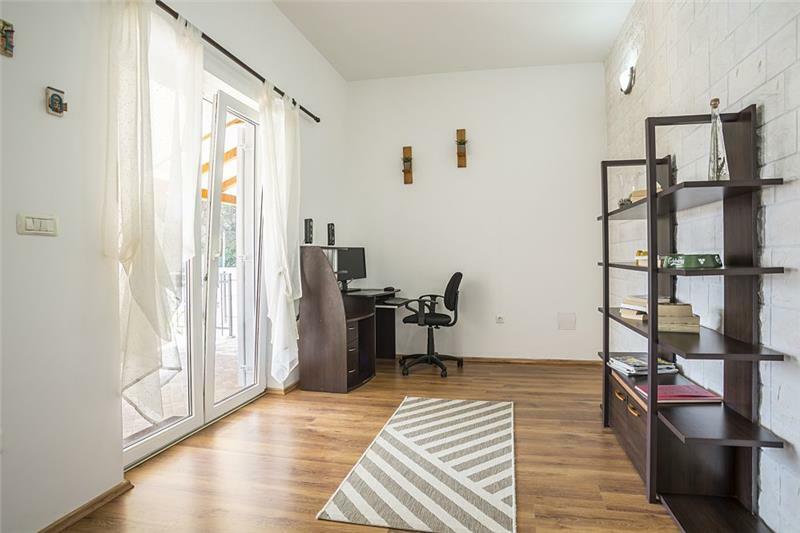 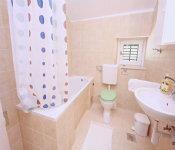 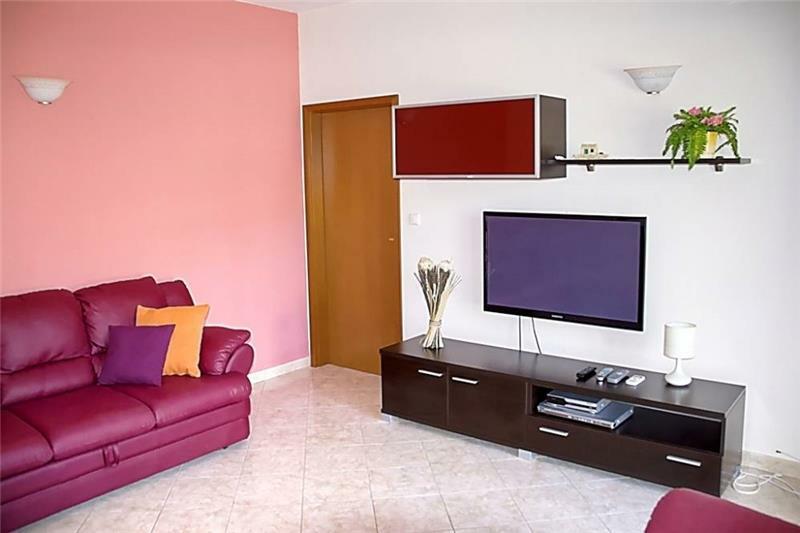 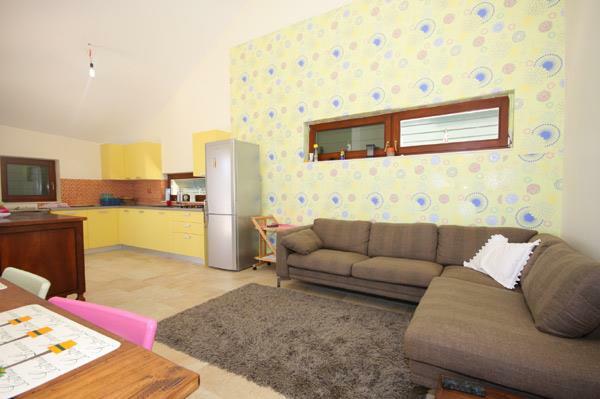 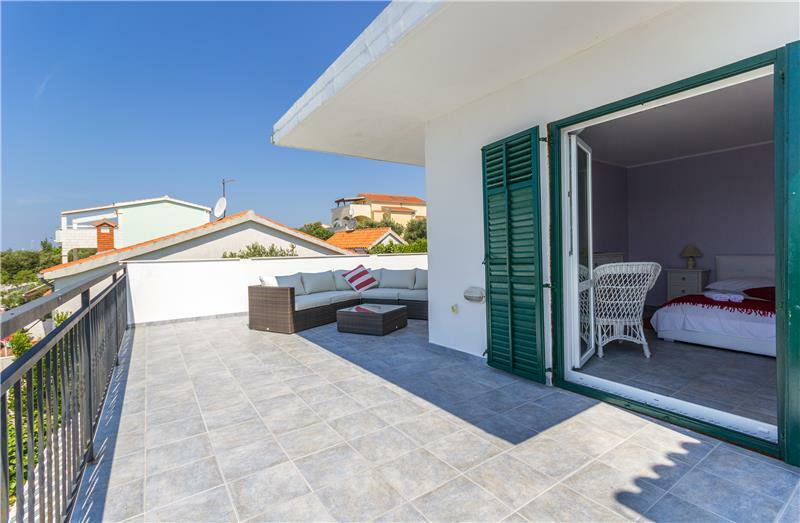 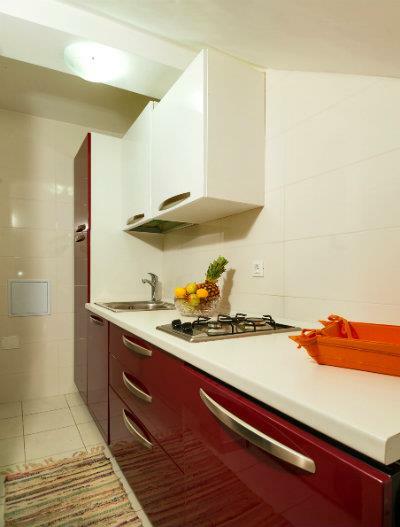 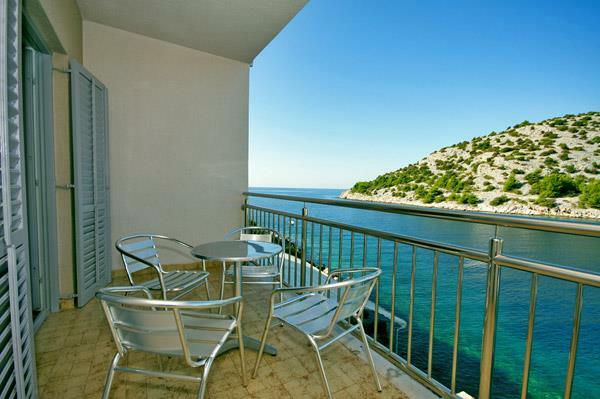 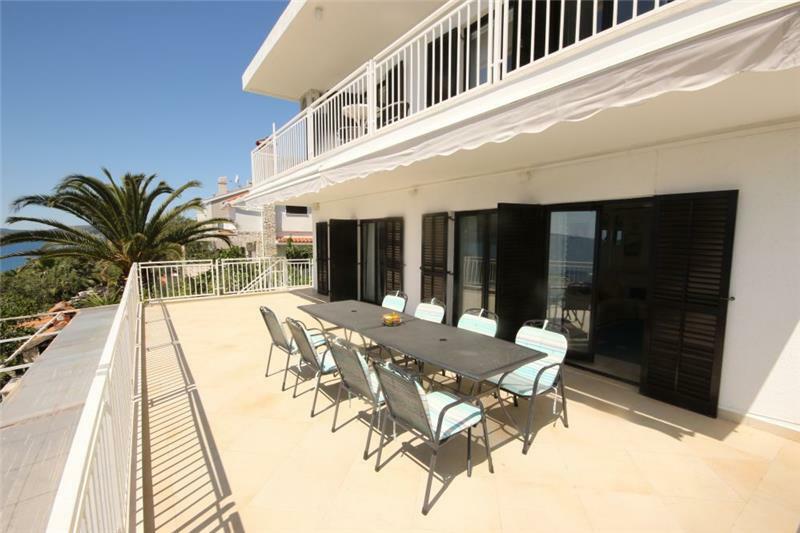 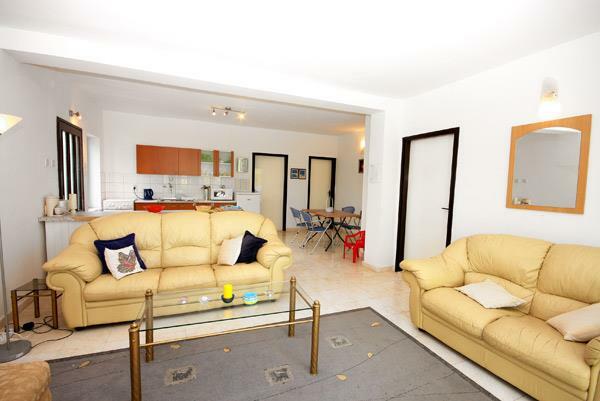 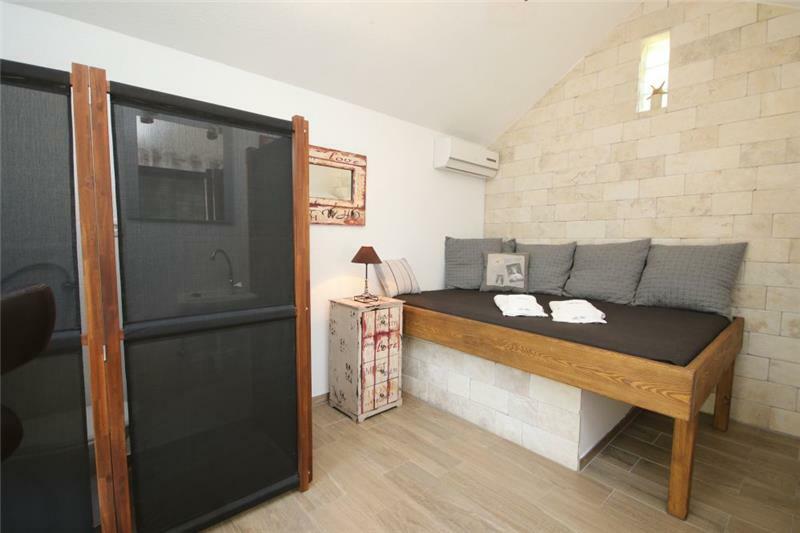 Very convenient location close to Maslinca harbour and beach. 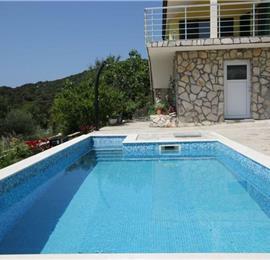 Owner very helpful and very keen to ensure that we were happy with everything in the villa. 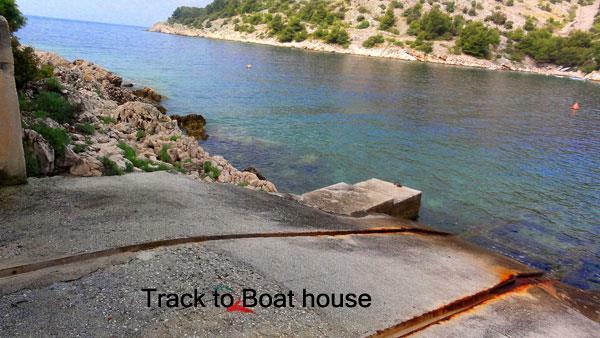 He also arranged a boat trip for us. 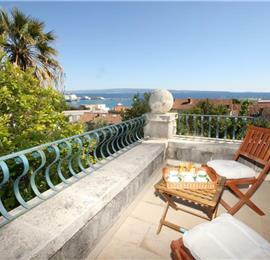 Recommend: The Diocletian Palace in Split was very interesting. 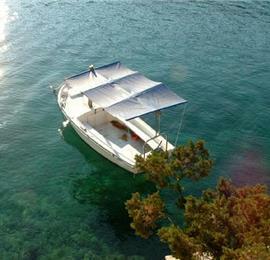 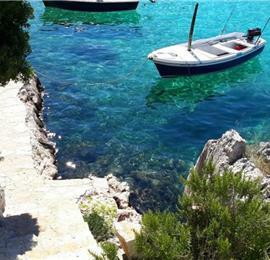 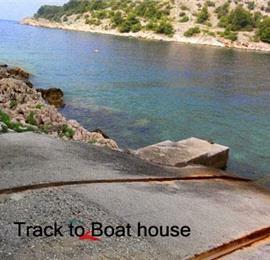 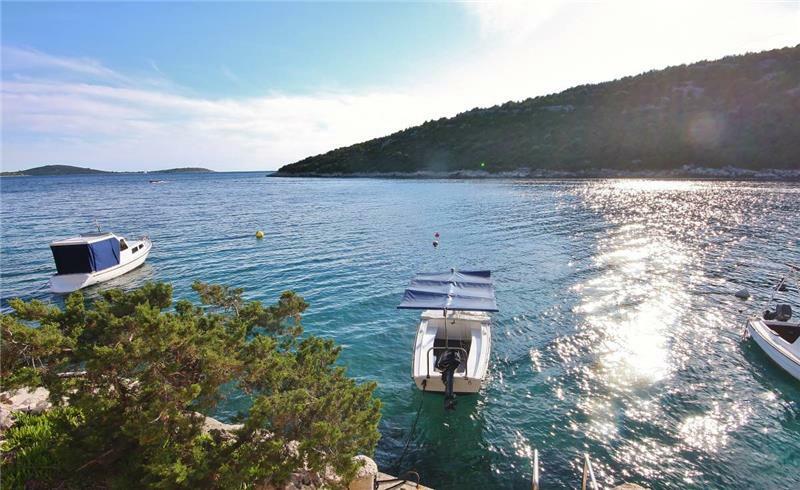 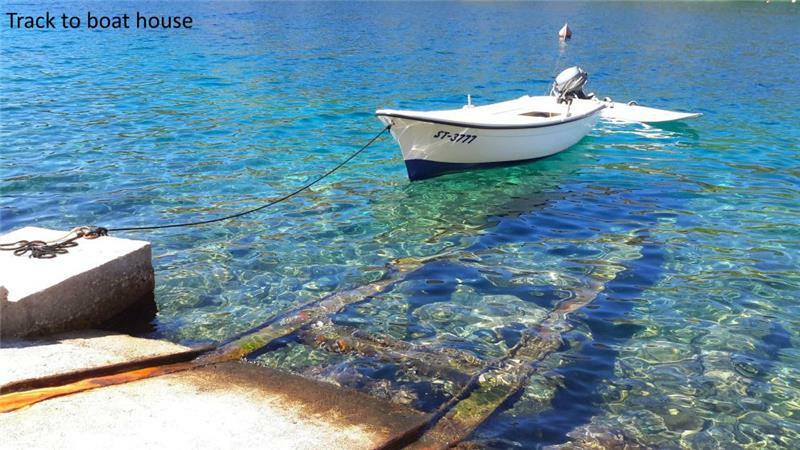 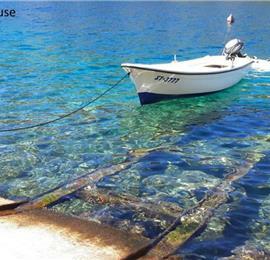 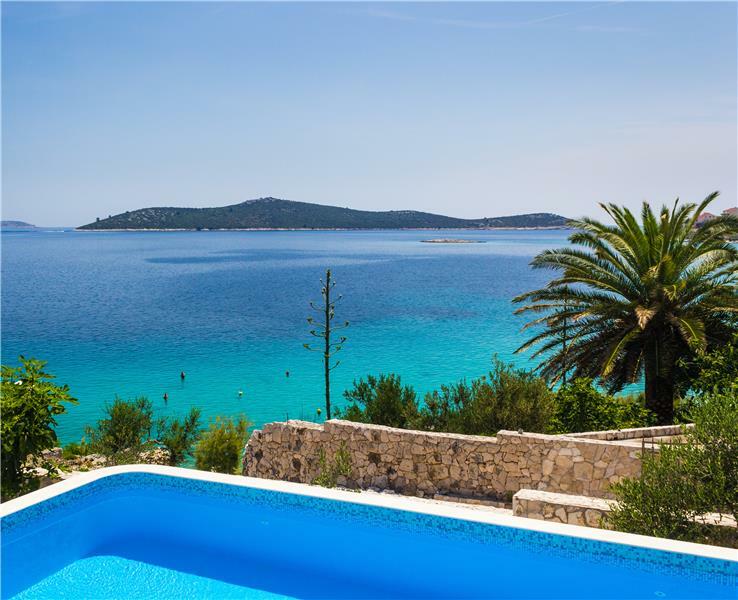 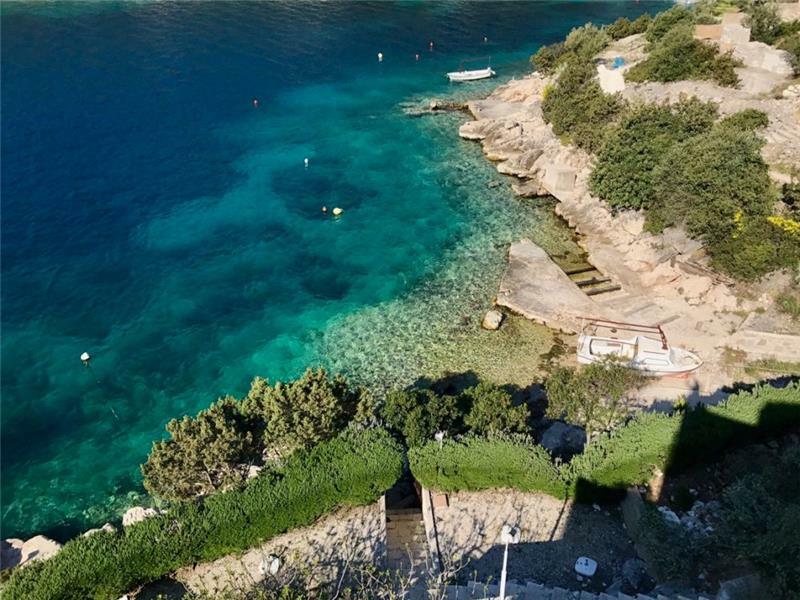 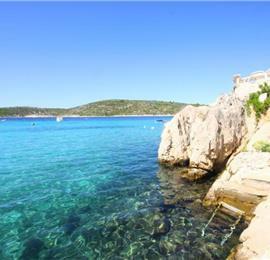 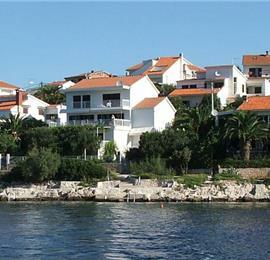 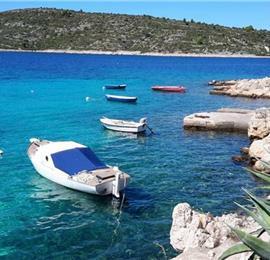 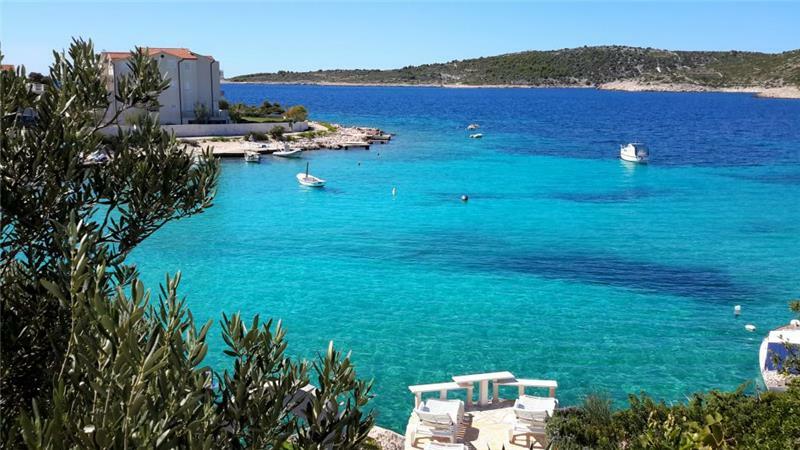 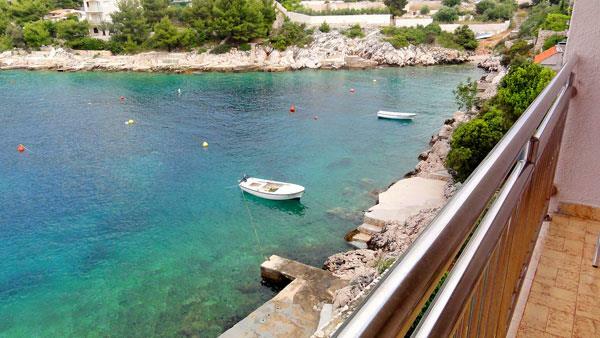 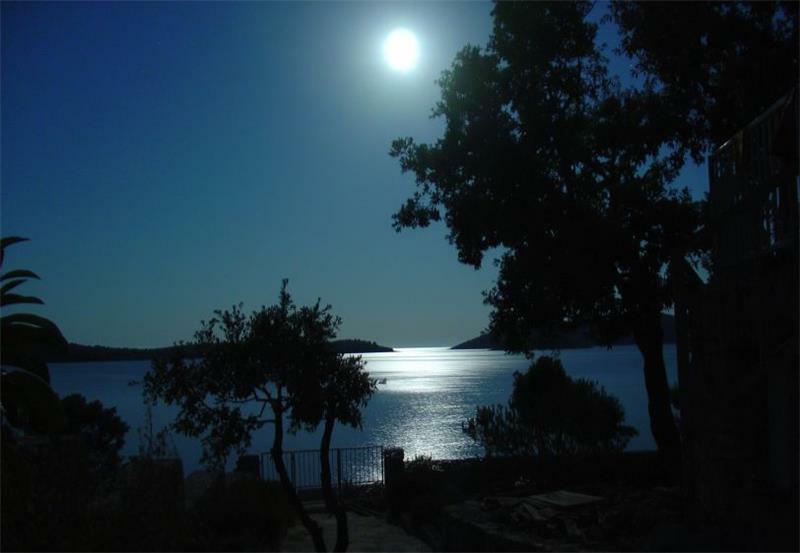 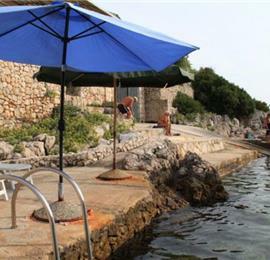 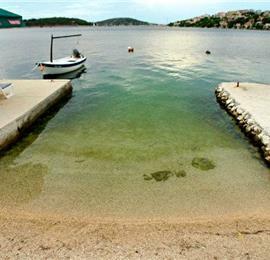 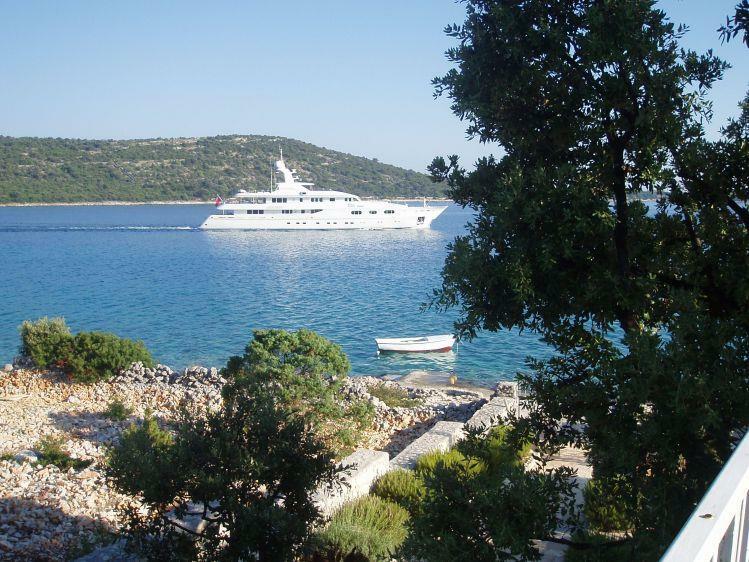 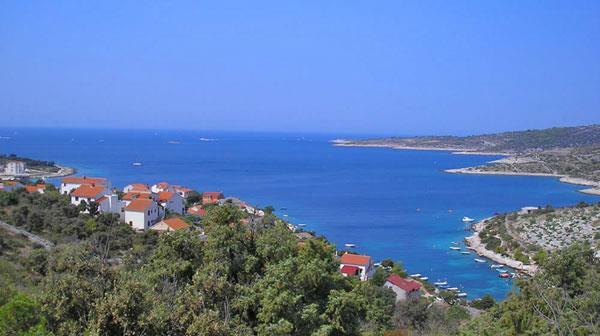 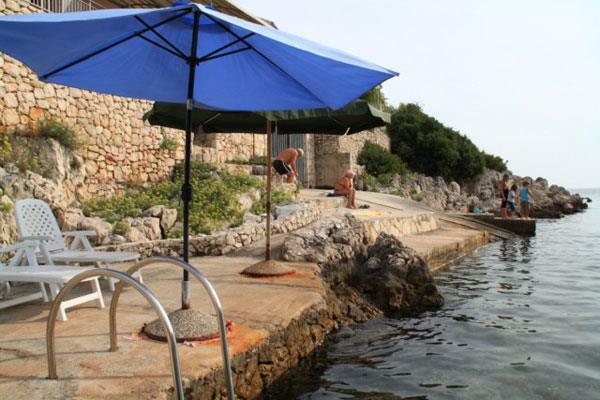 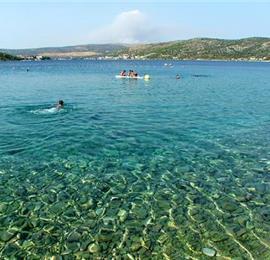 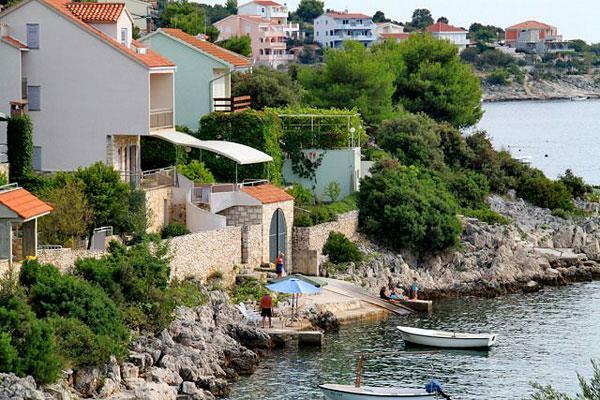 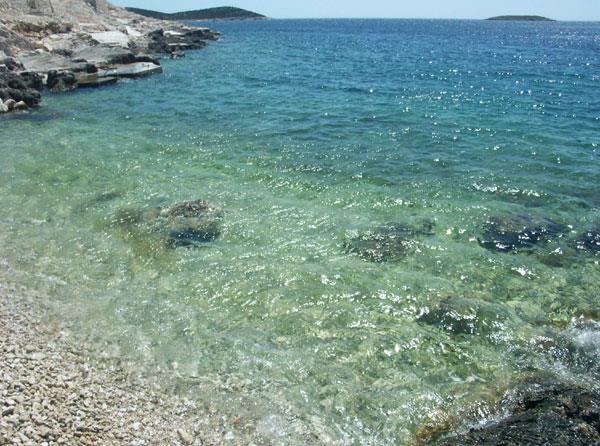 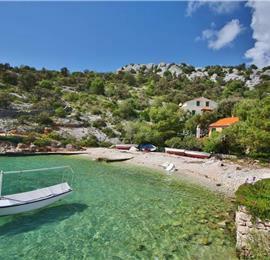 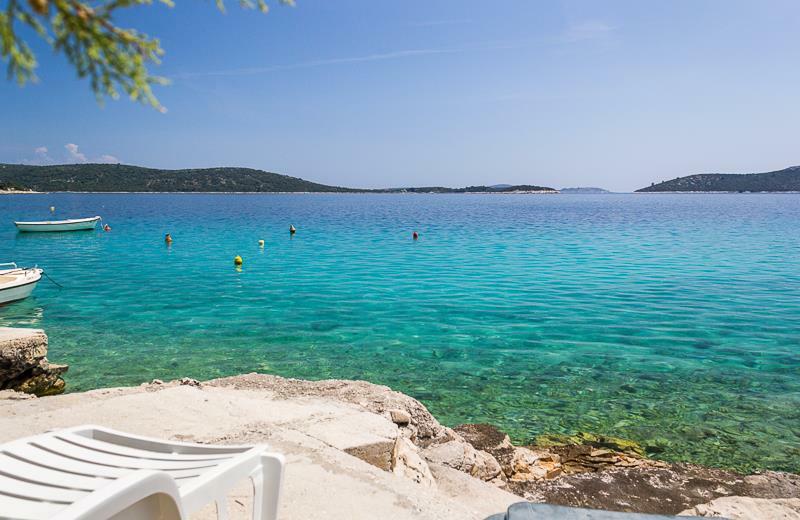 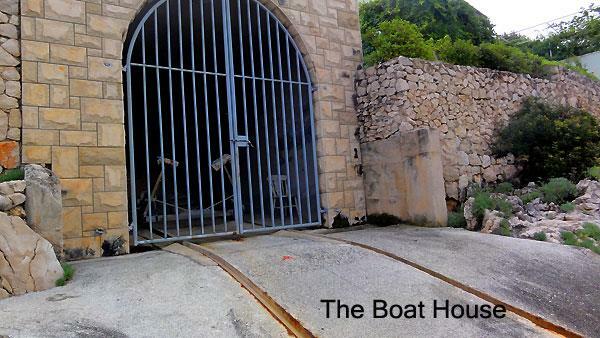 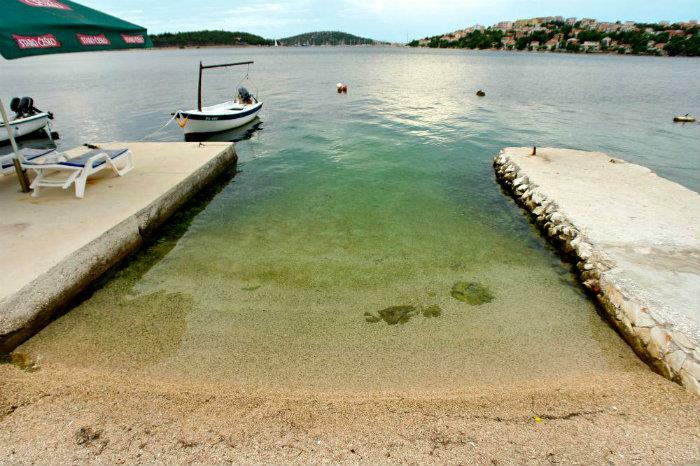 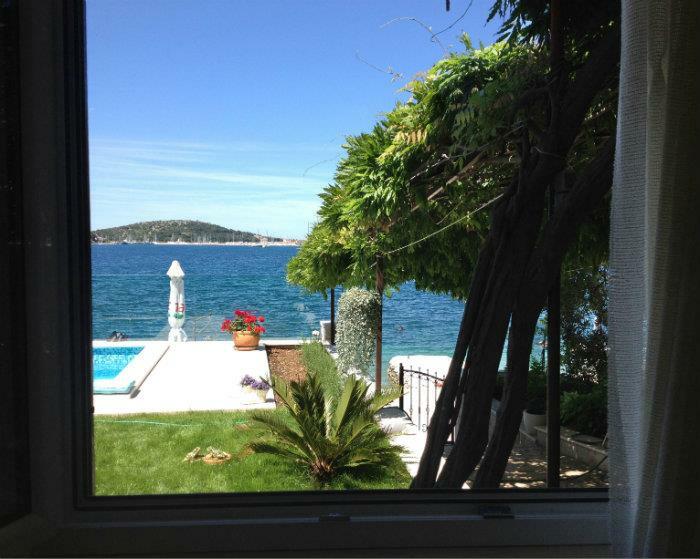 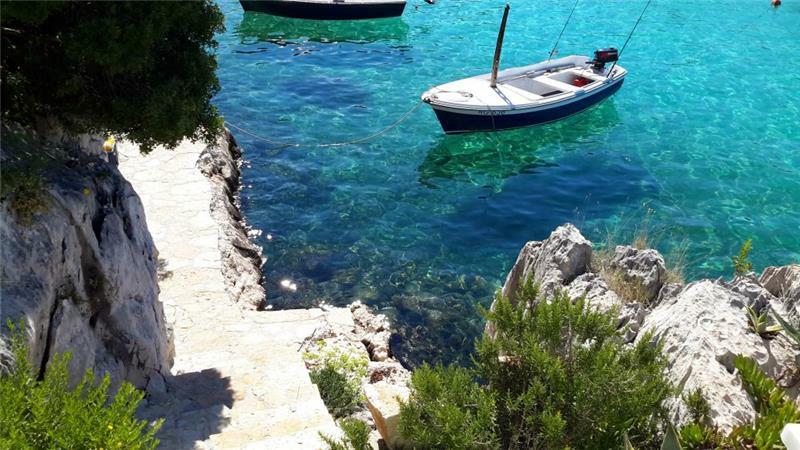 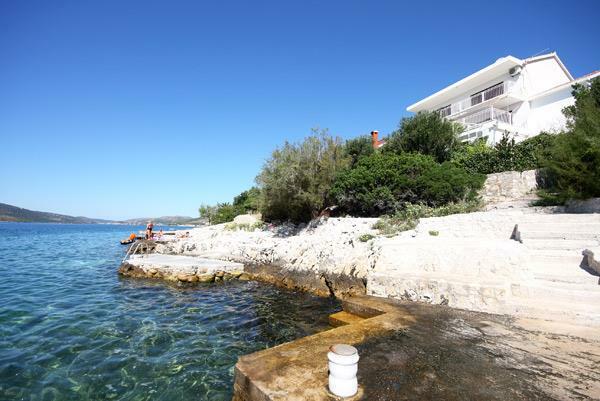 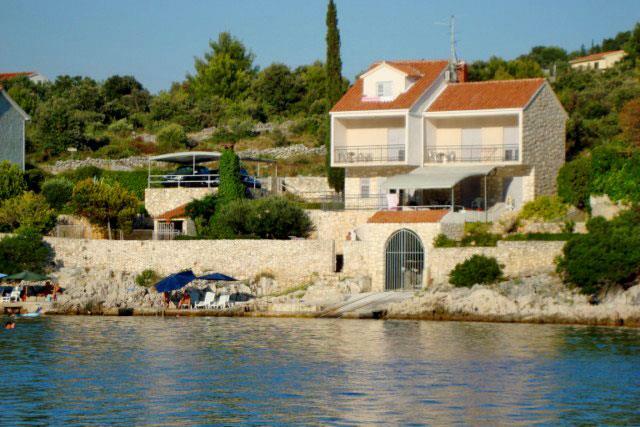 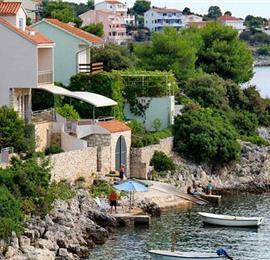 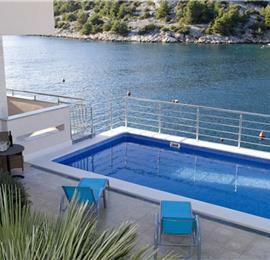 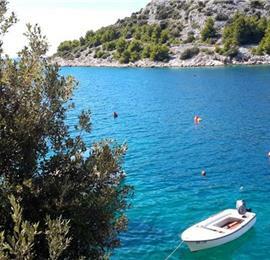 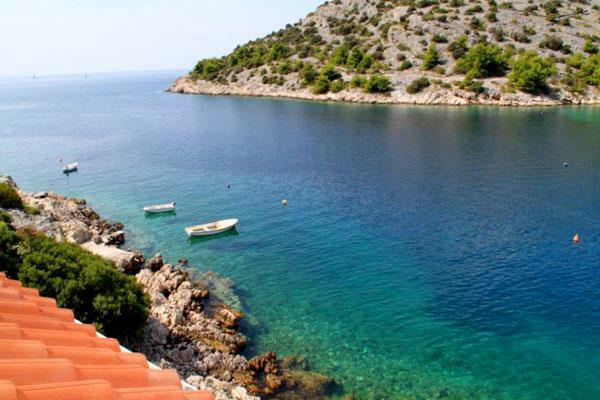 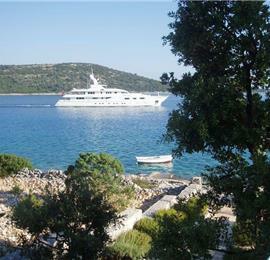 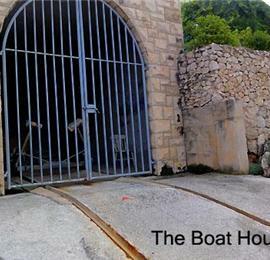 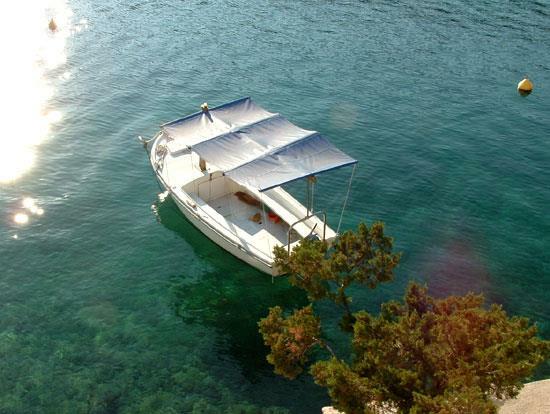 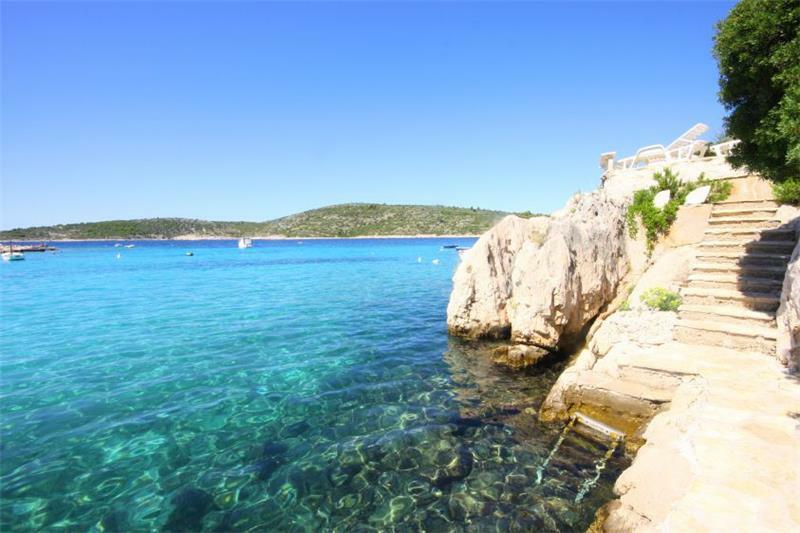 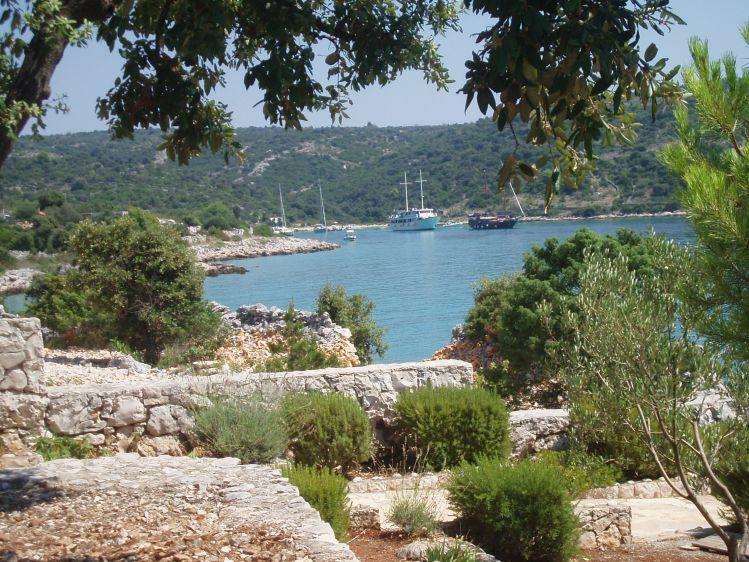 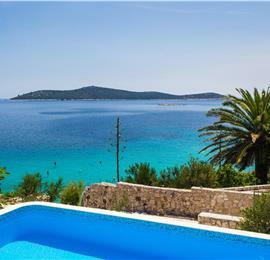 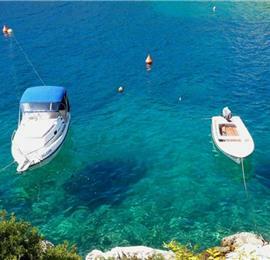 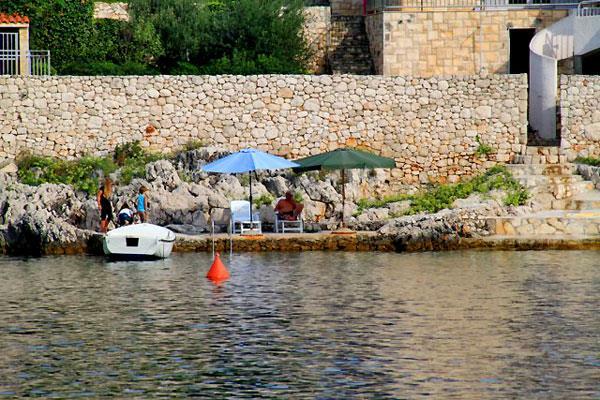 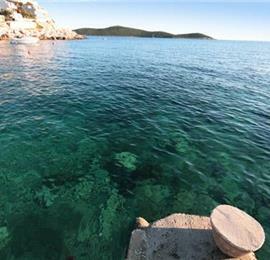 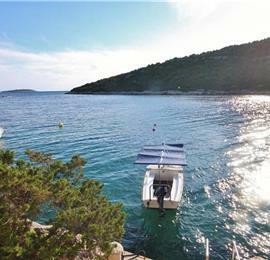 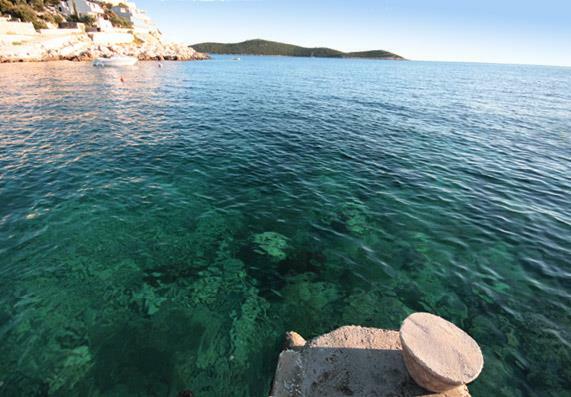 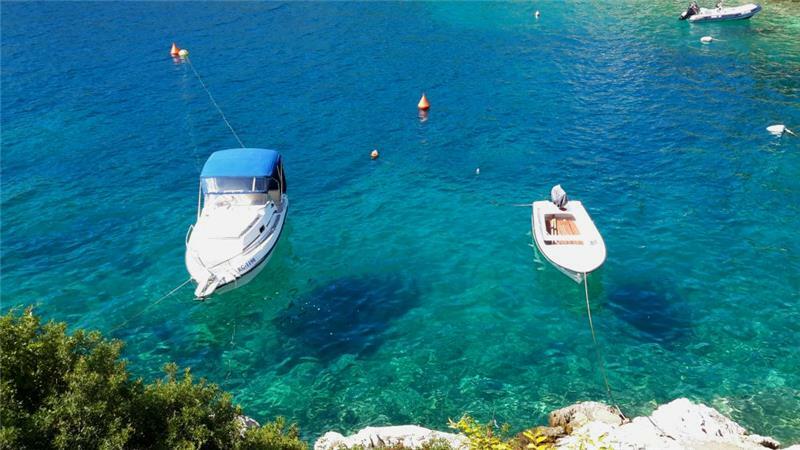 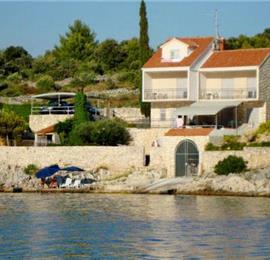 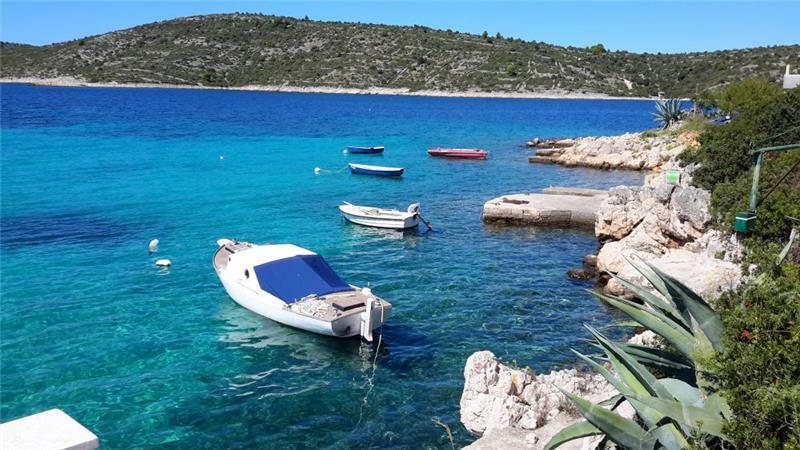 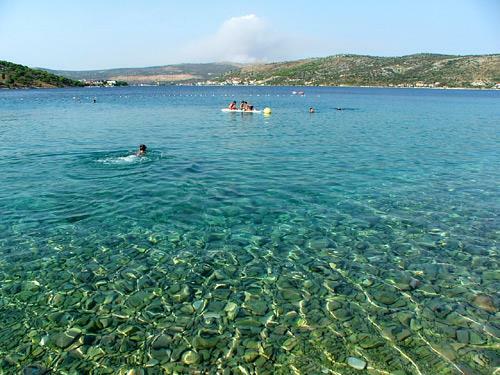 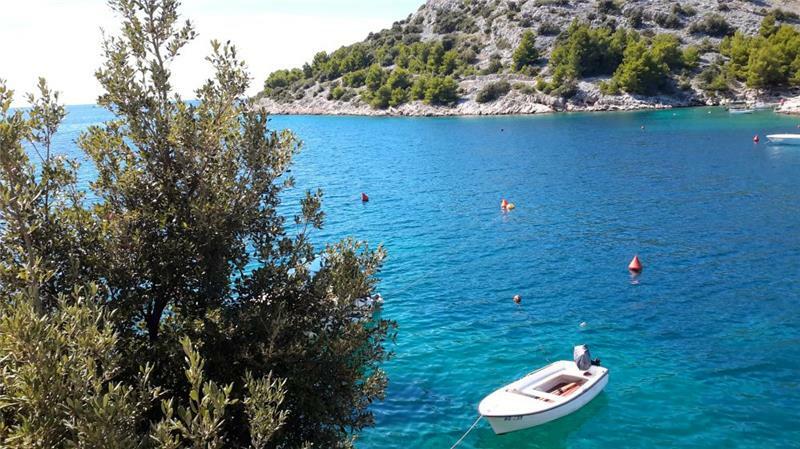 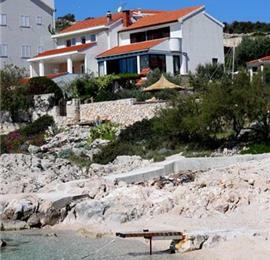 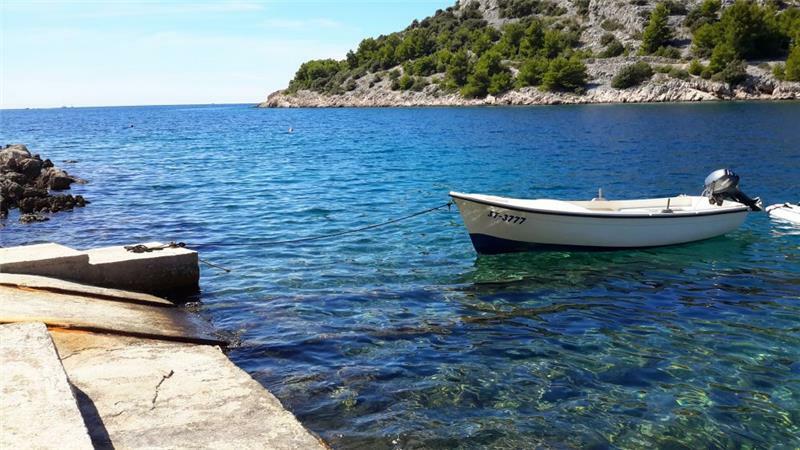 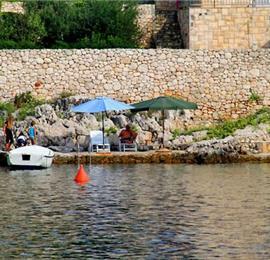 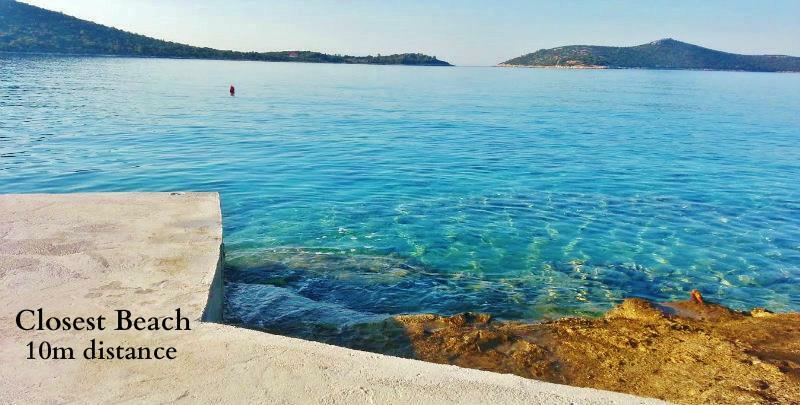 We also took a boat trip to Hvar, the blue lagoon and Bol beach. 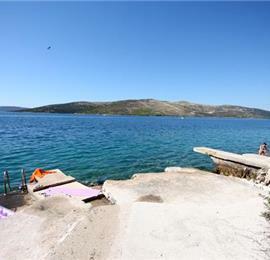 Trogir was also very picturesque. 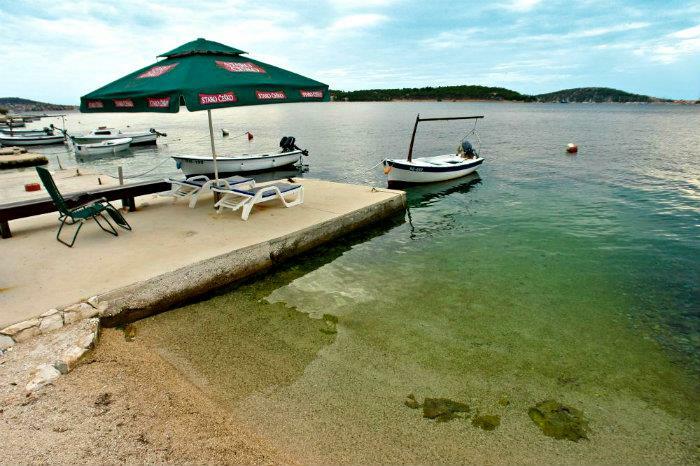 We liked the bars and restaurants on the port at Maslinca. 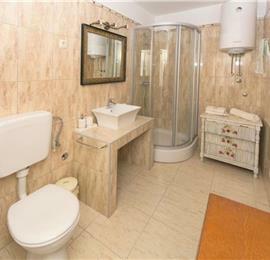 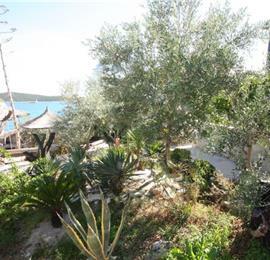 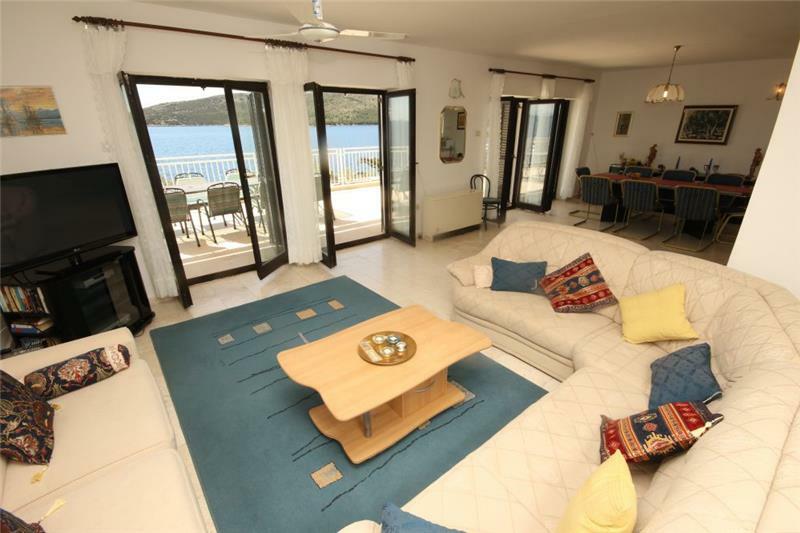 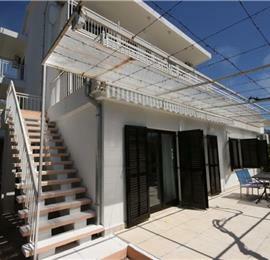 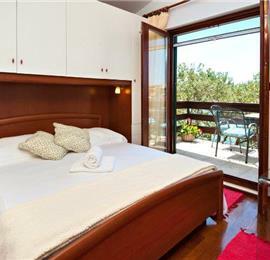 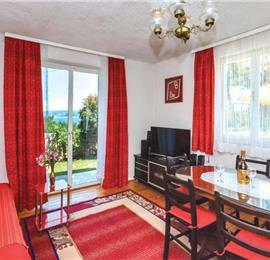 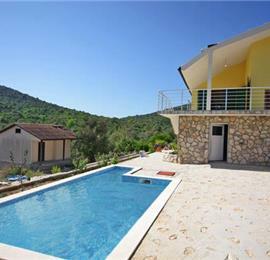 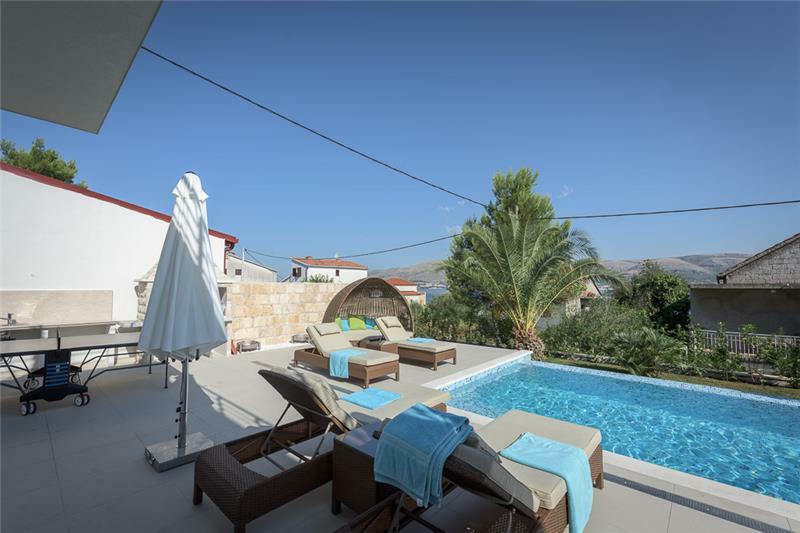 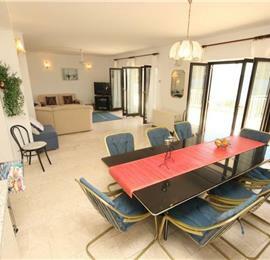 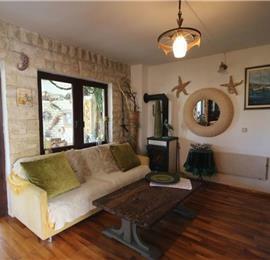 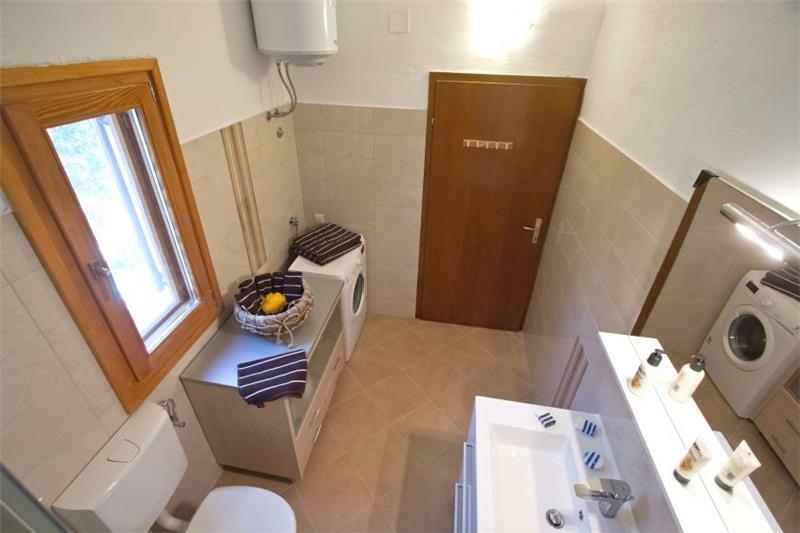 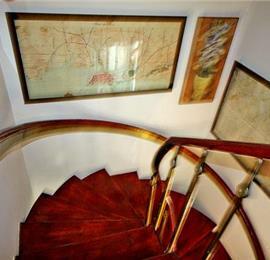 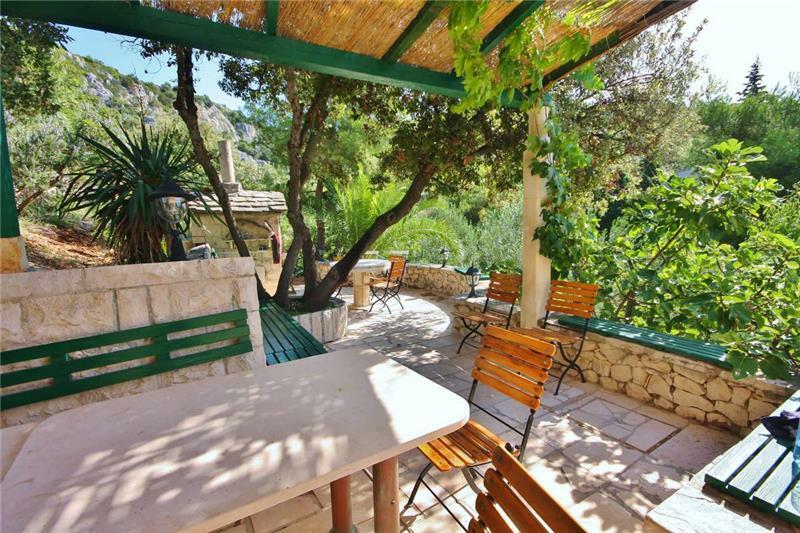 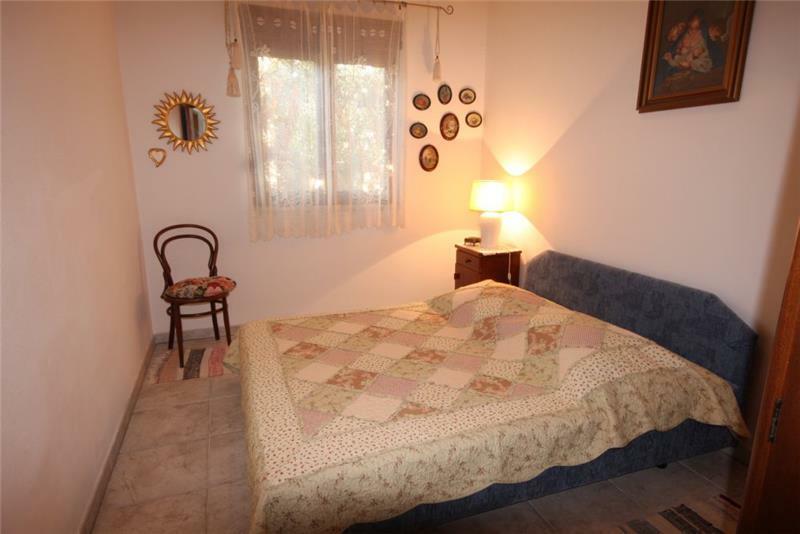 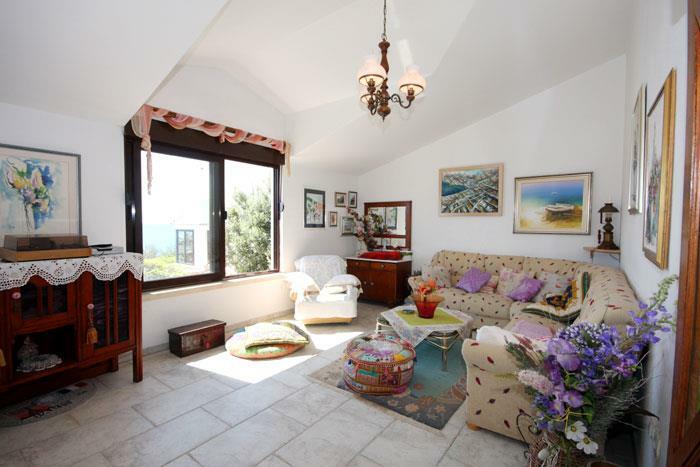 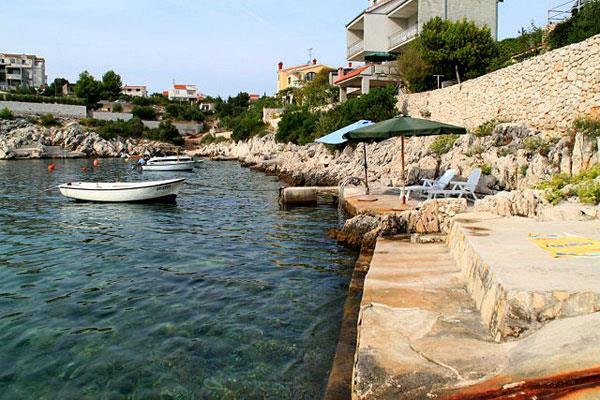 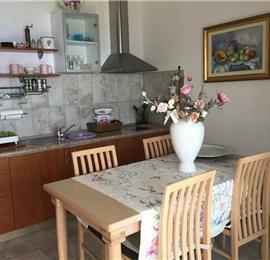 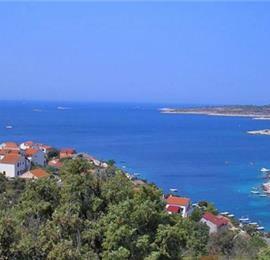 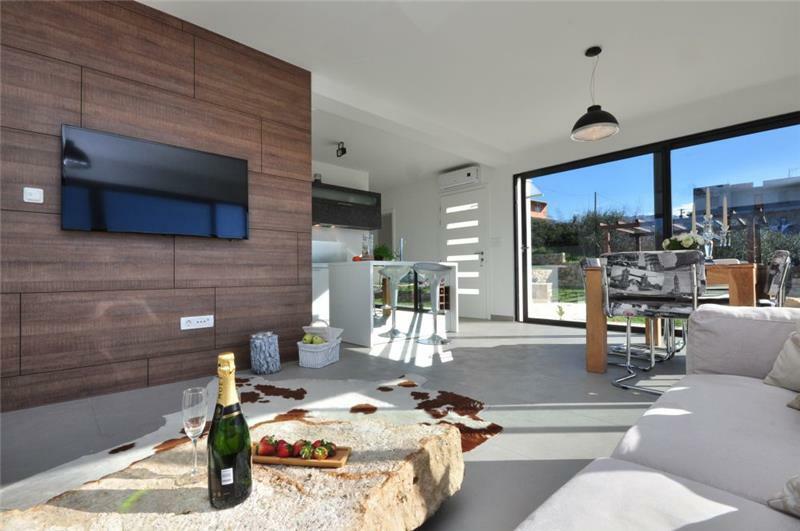 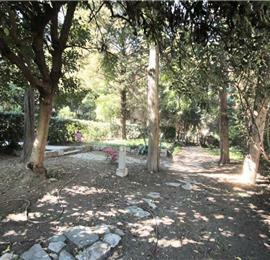 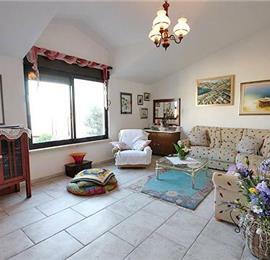 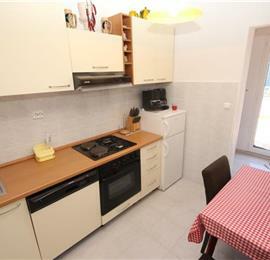 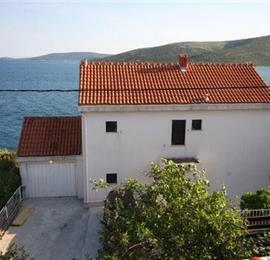 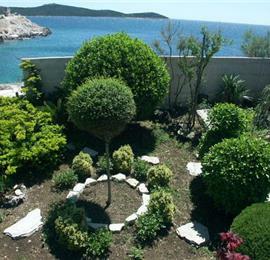 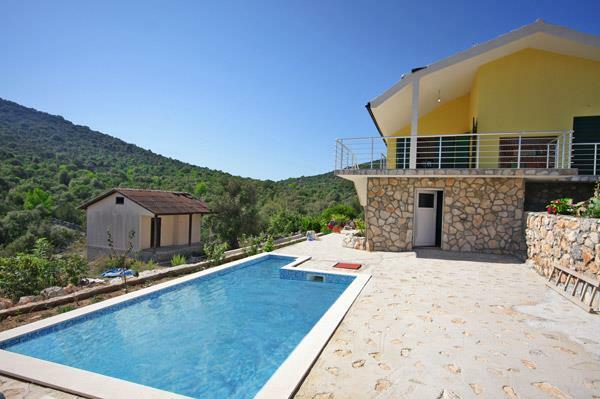 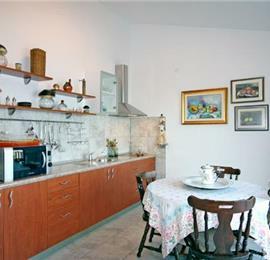 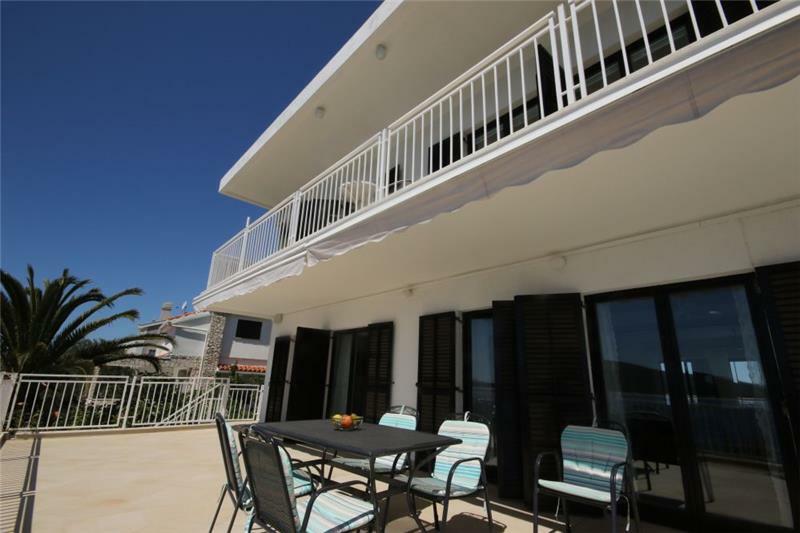 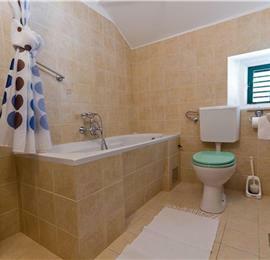 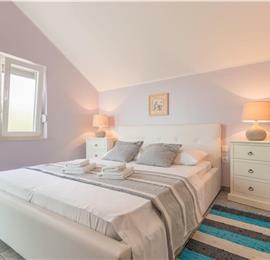 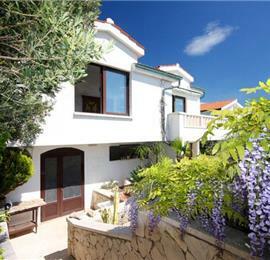 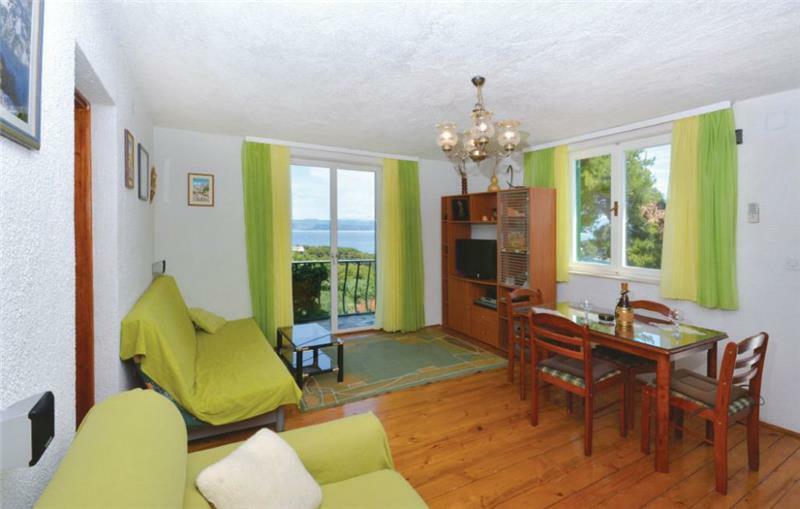 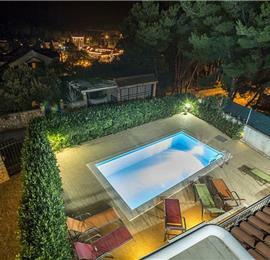 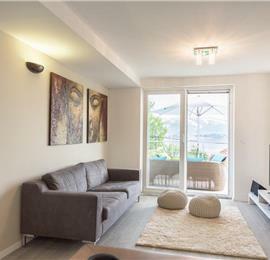 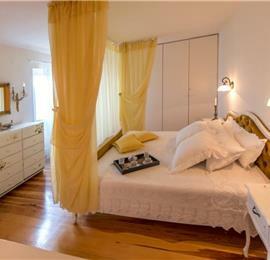 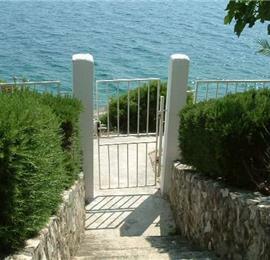 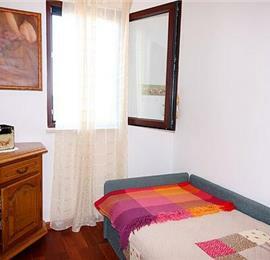 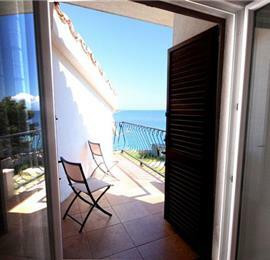 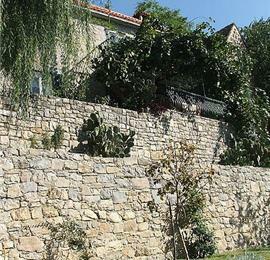 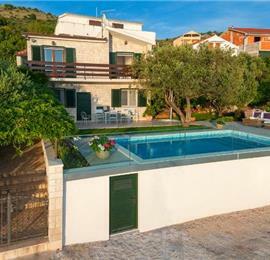 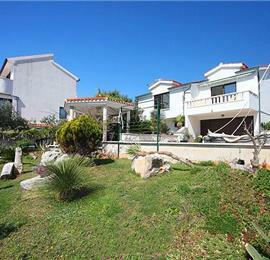 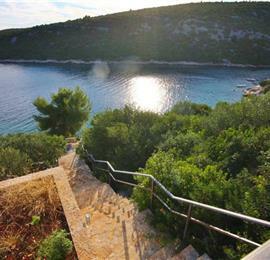 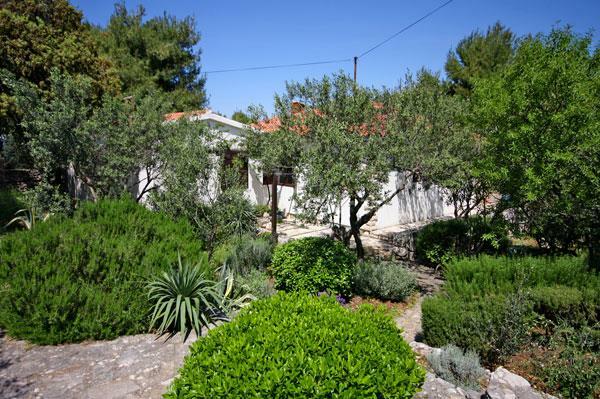 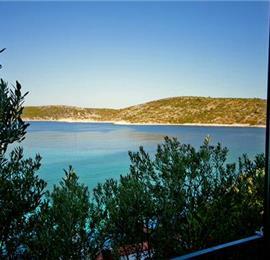 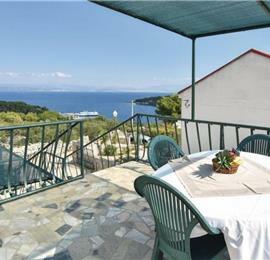 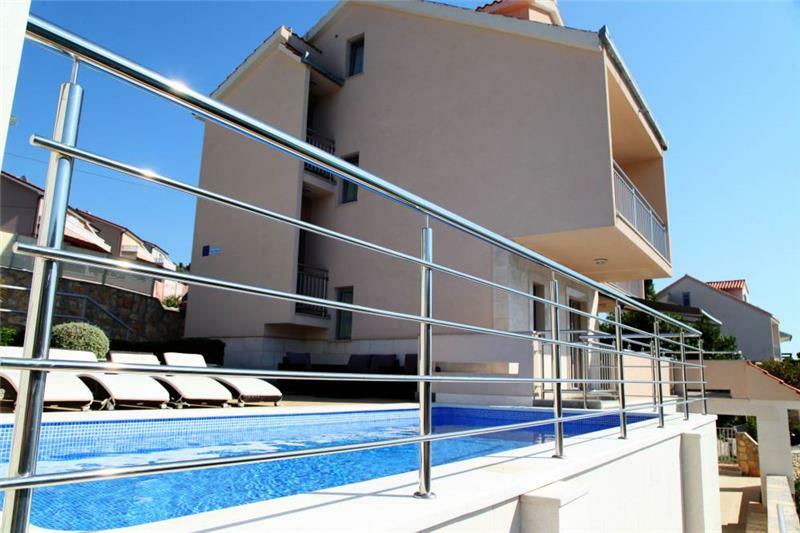 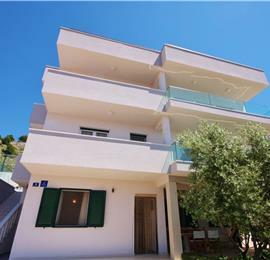 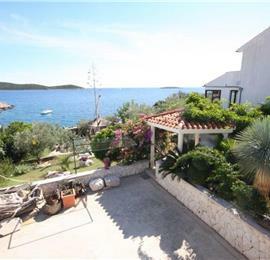 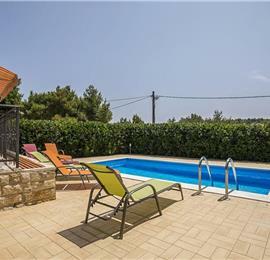 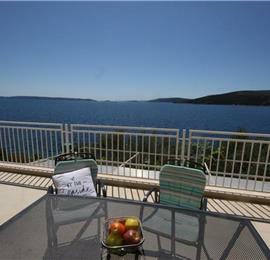 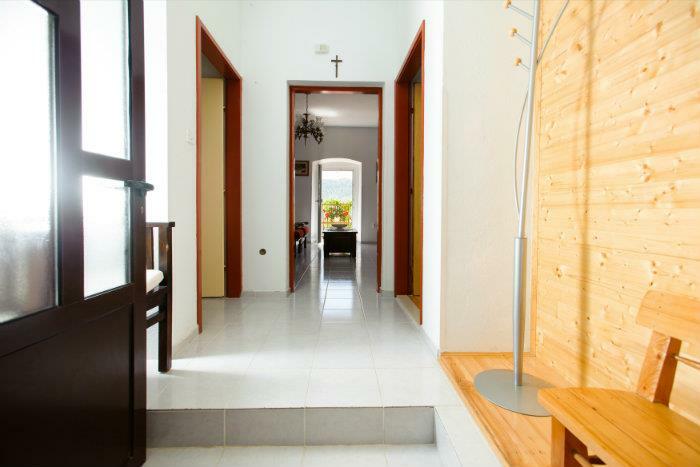 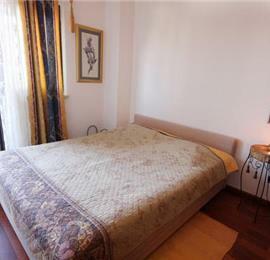 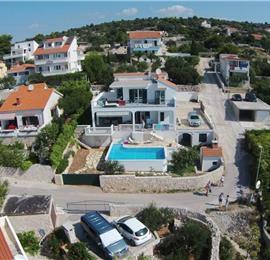 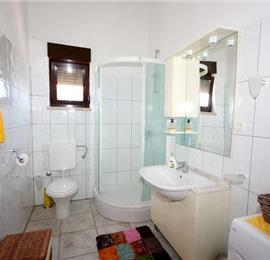 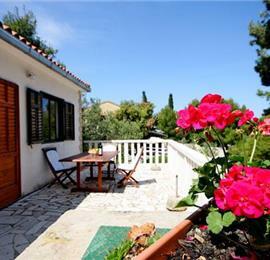 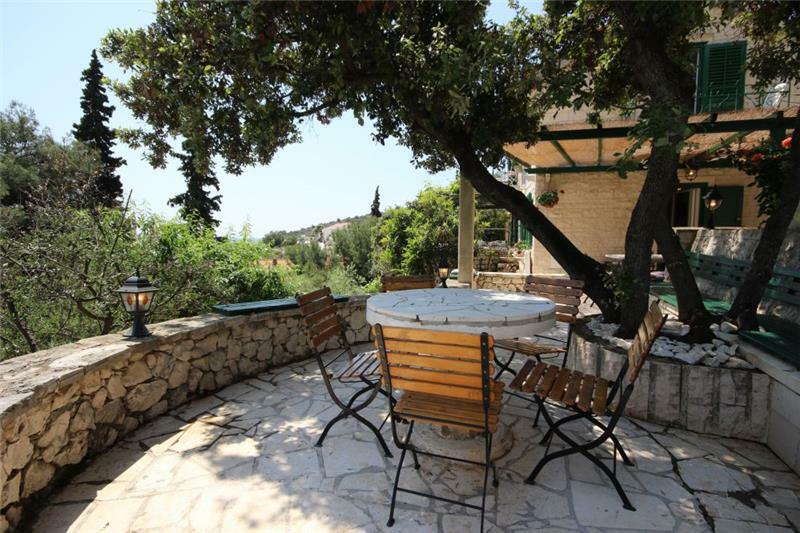 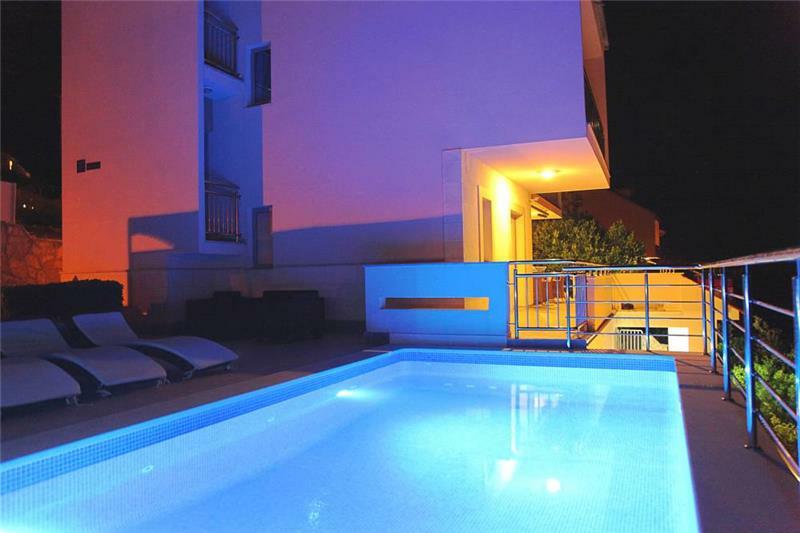 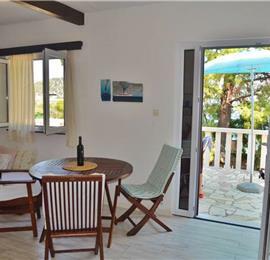 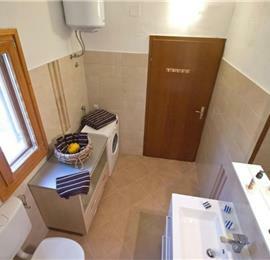 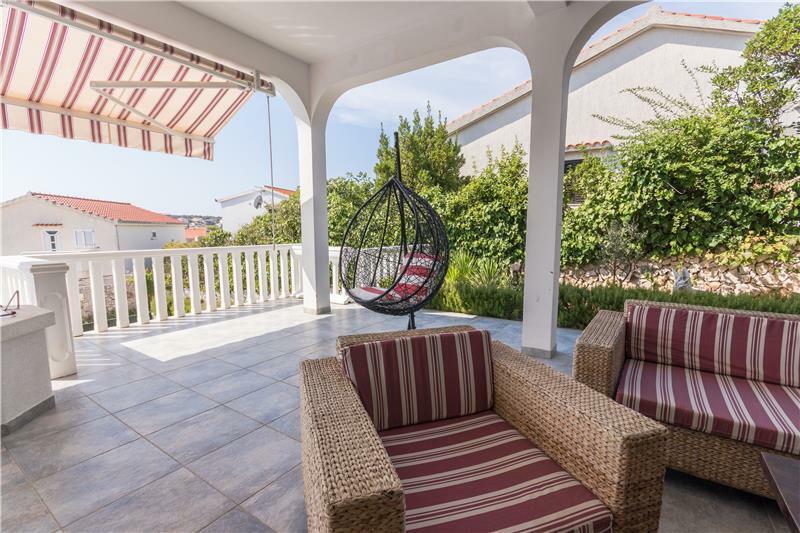 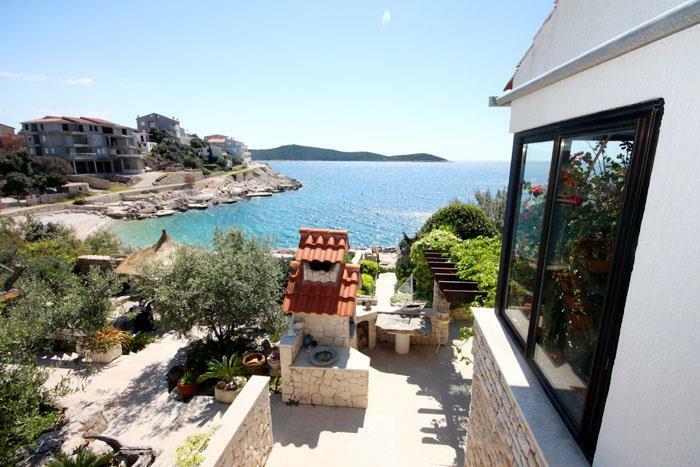 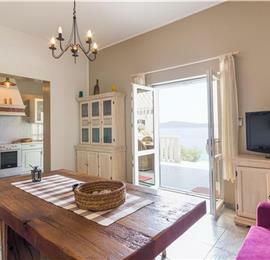 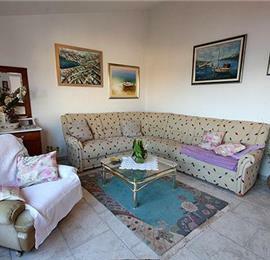 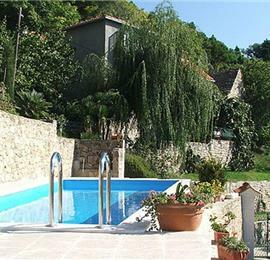 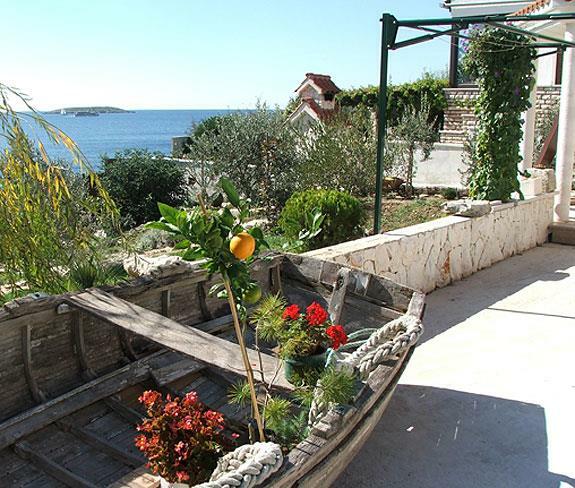 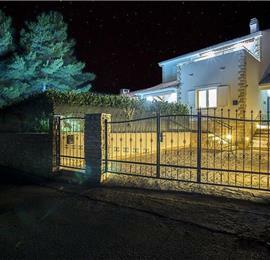 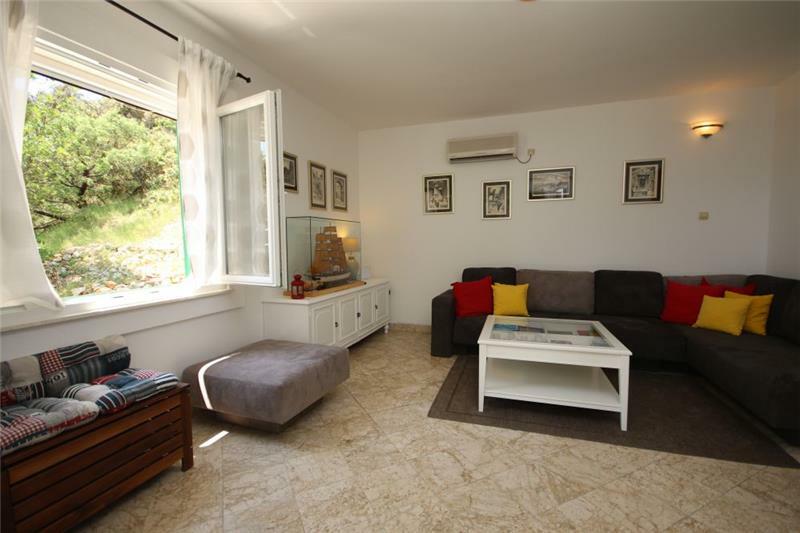 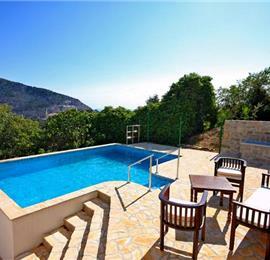 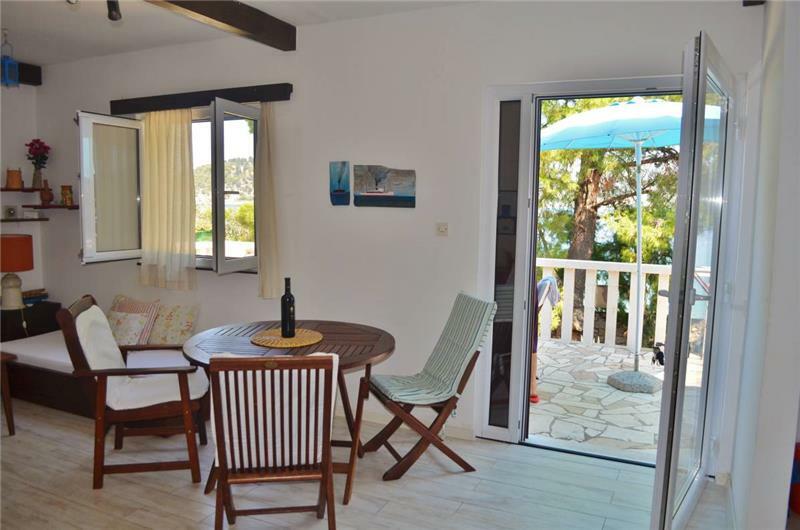 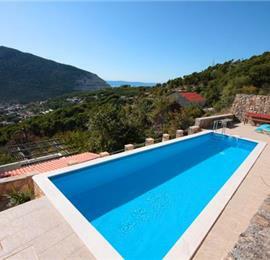 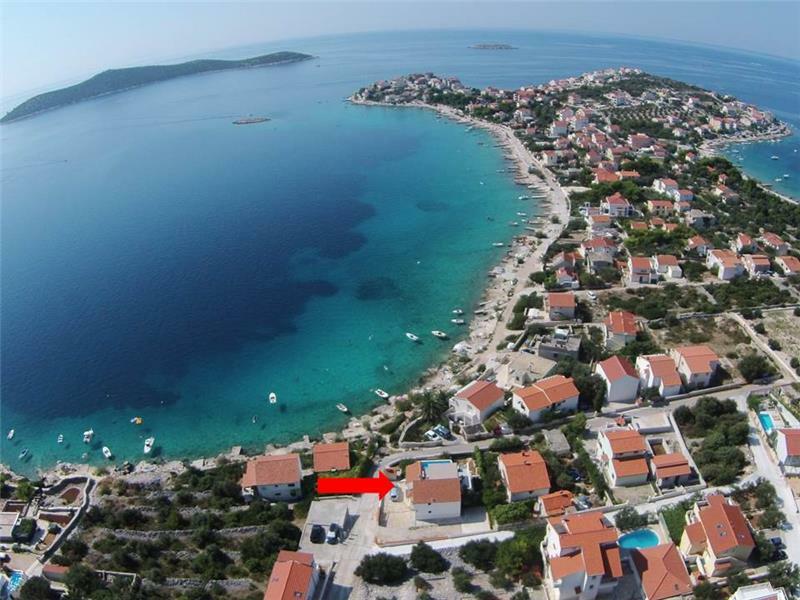 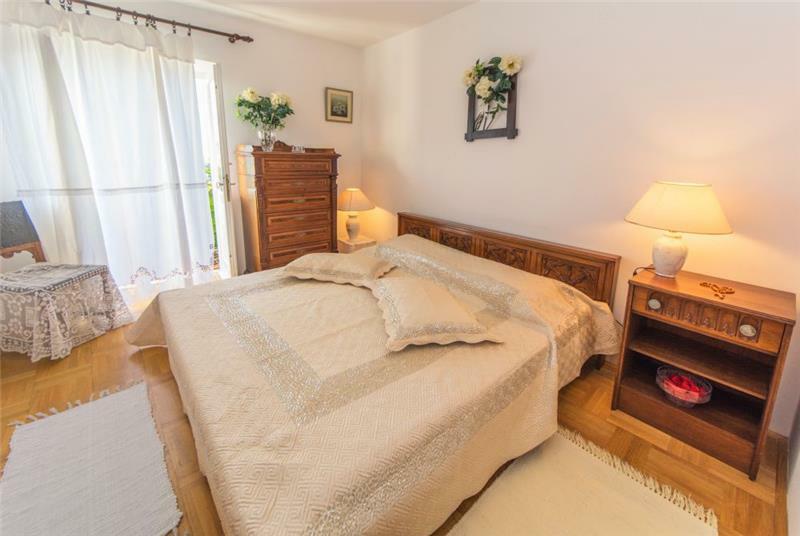 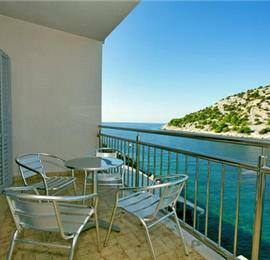 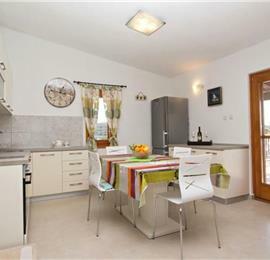 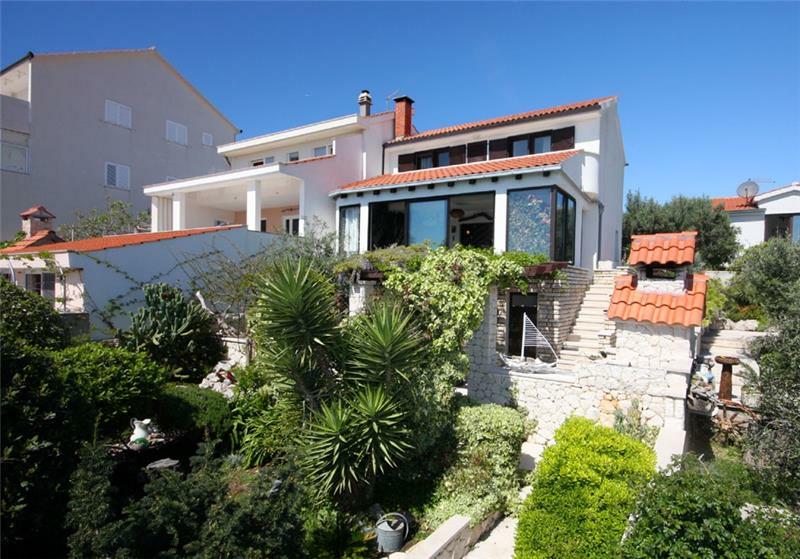 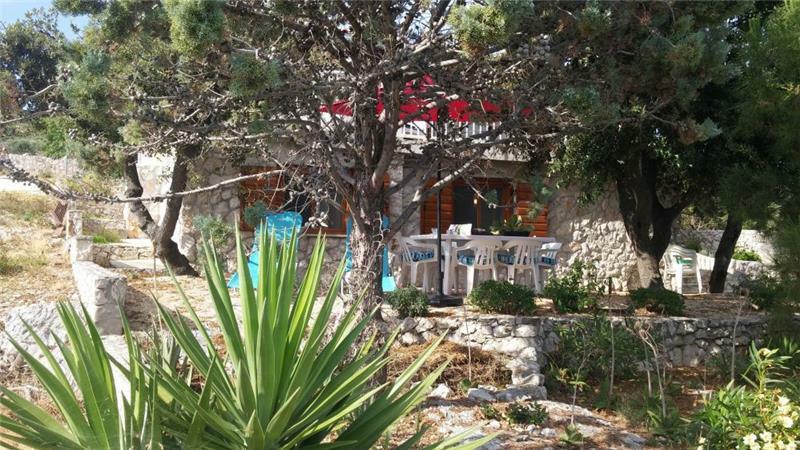 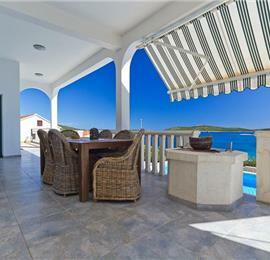 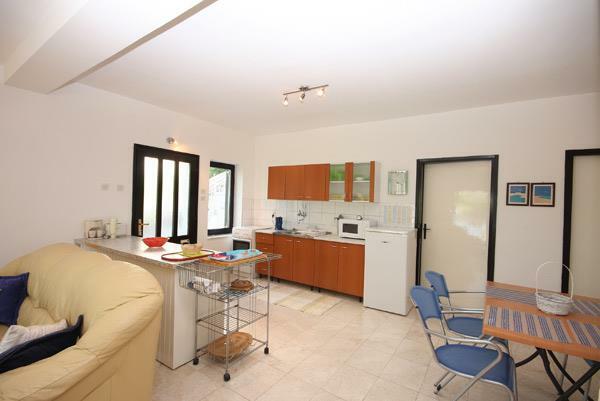 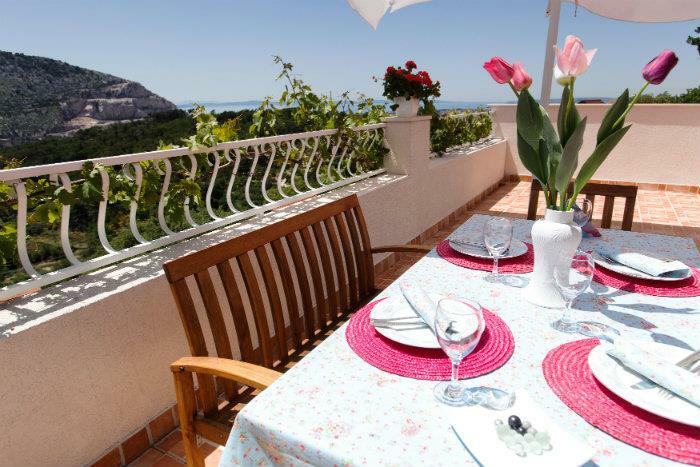 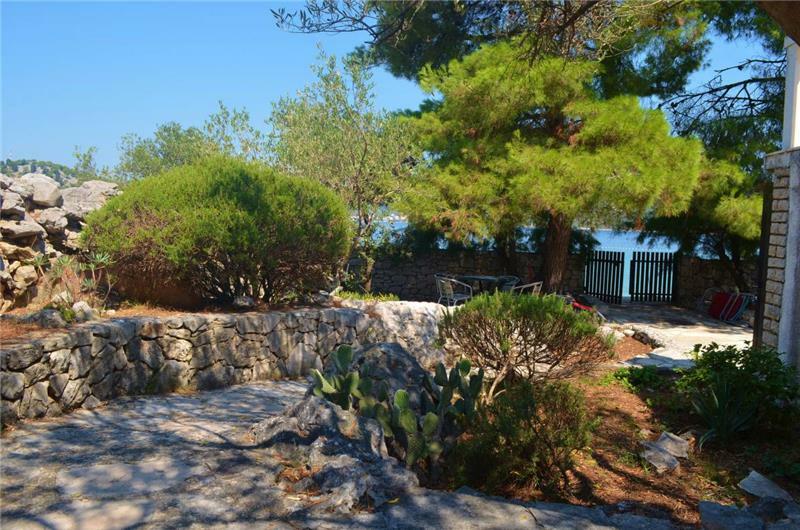 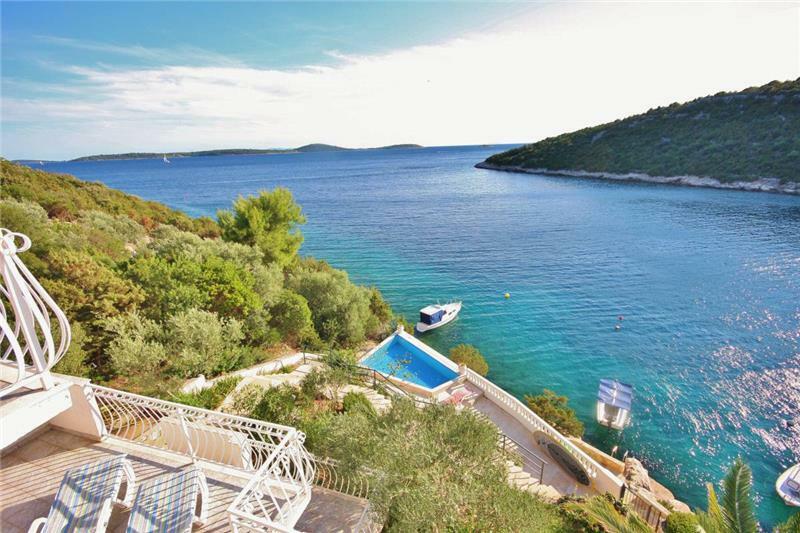 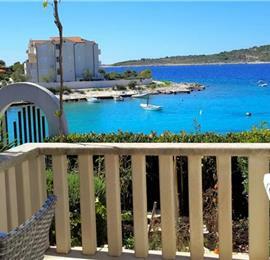 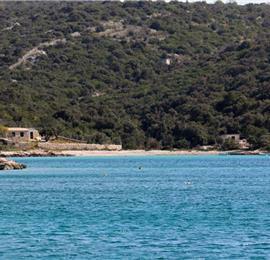 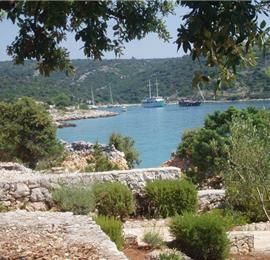 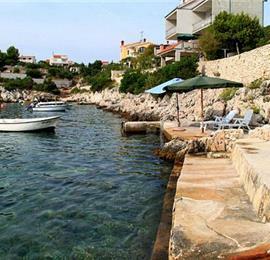 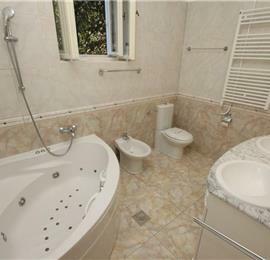 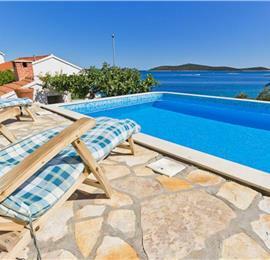 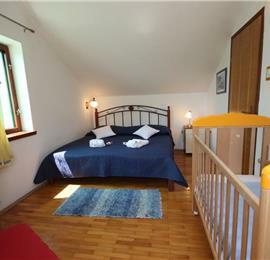 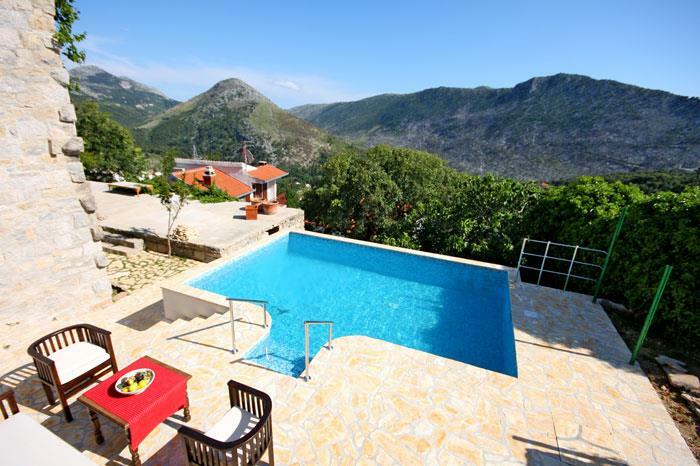 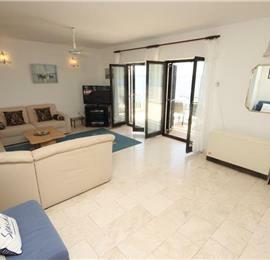 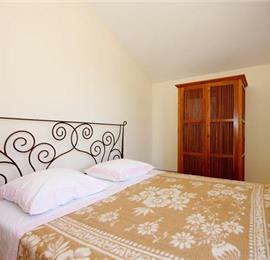 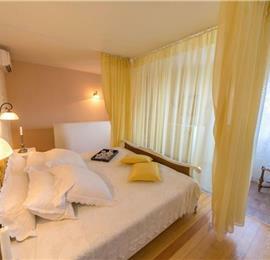 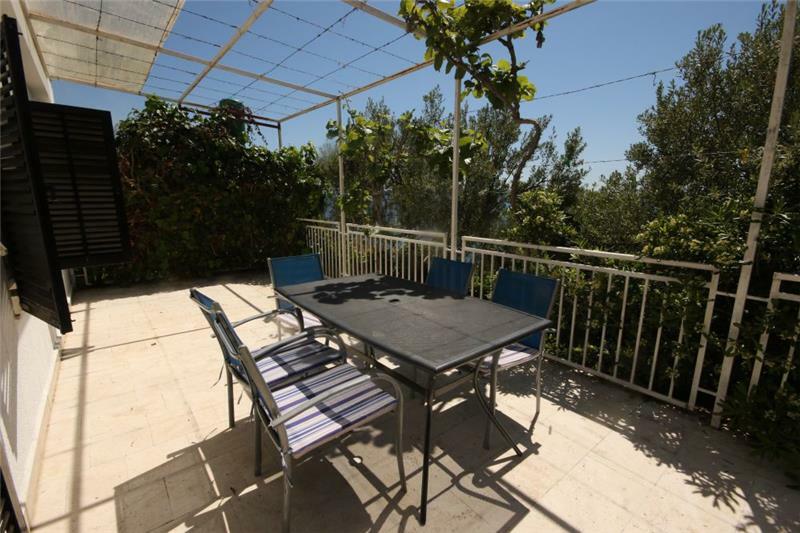 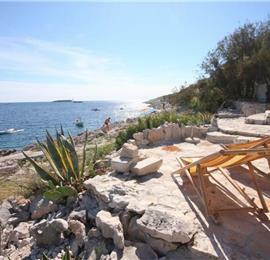 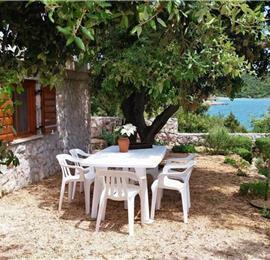 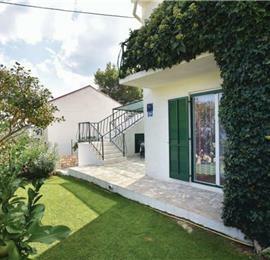 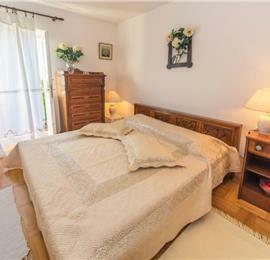 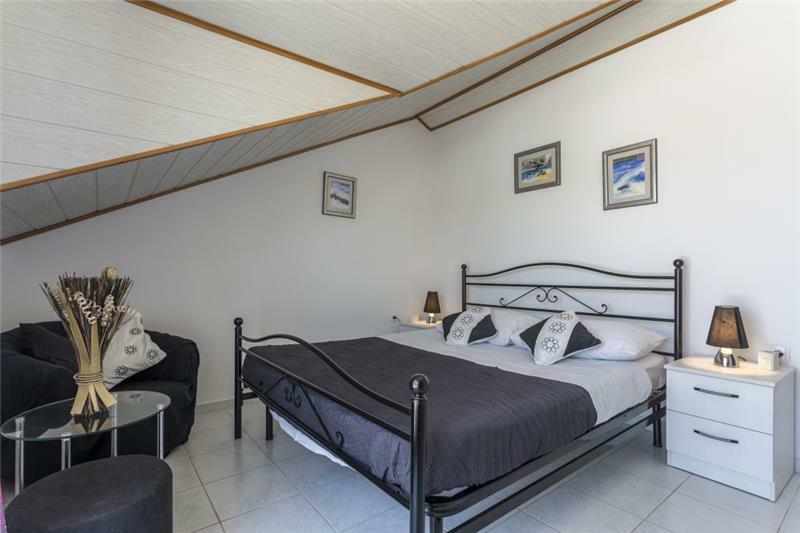 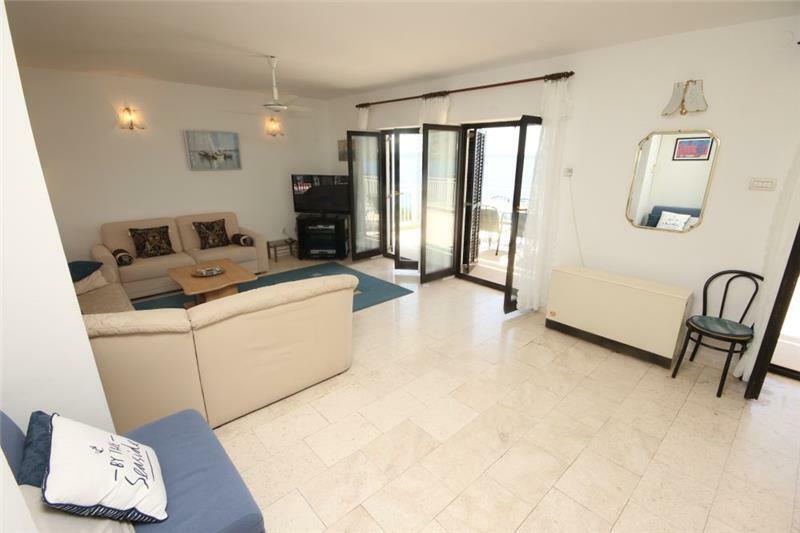 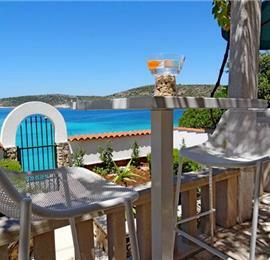 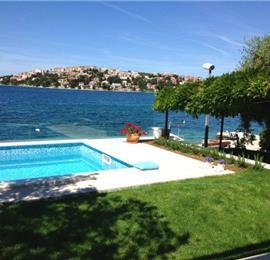 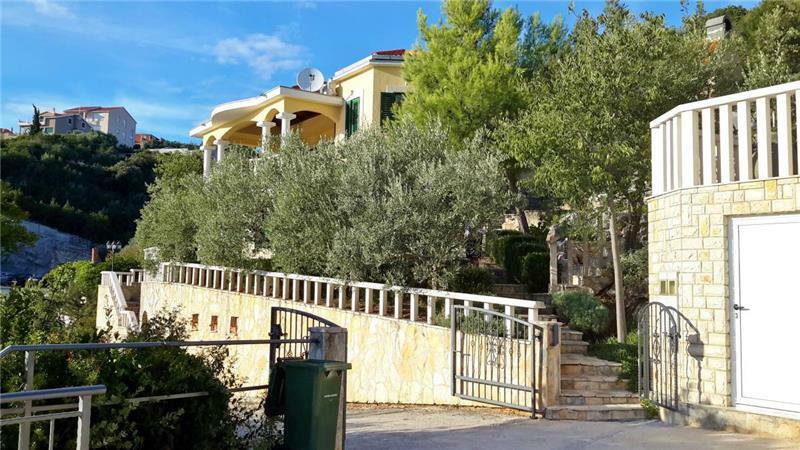 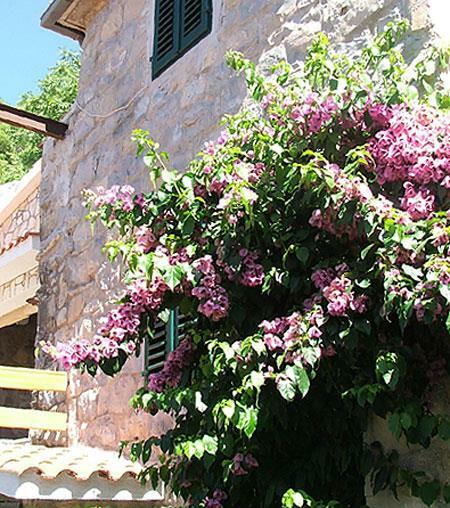 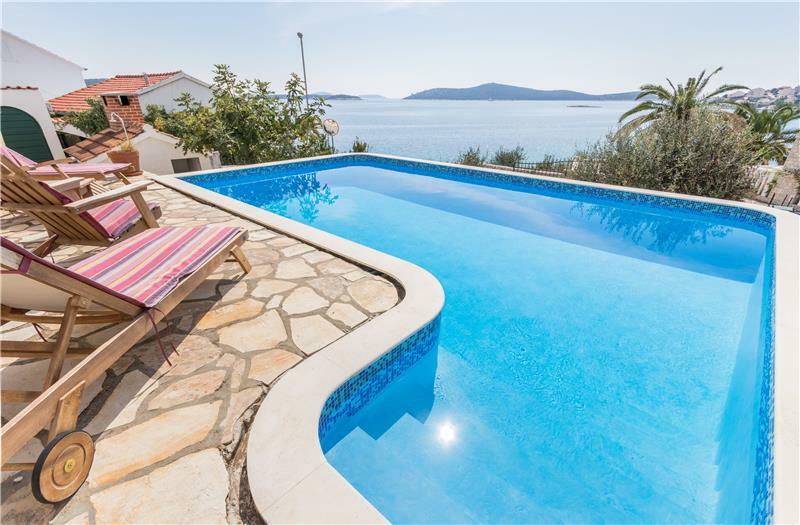 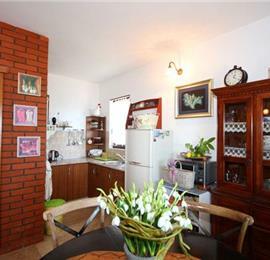 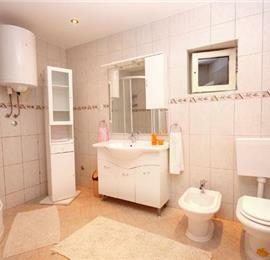 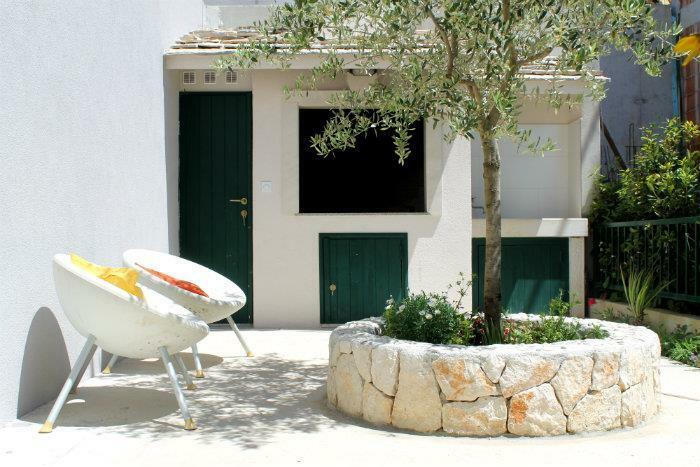 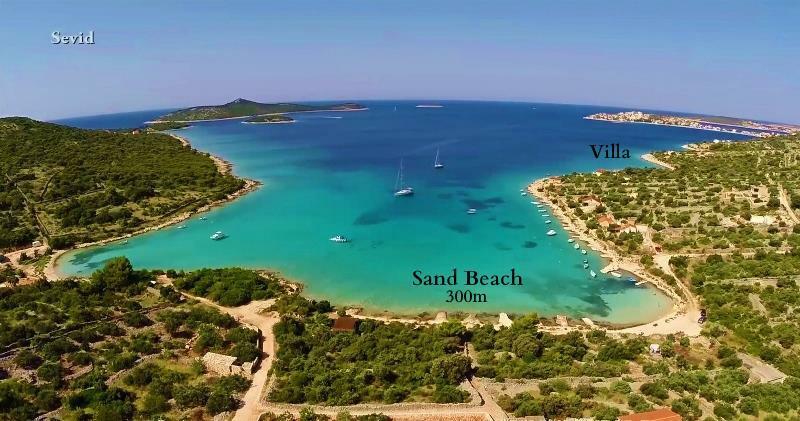 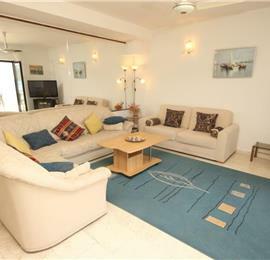 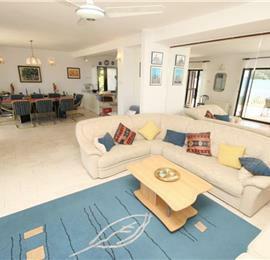 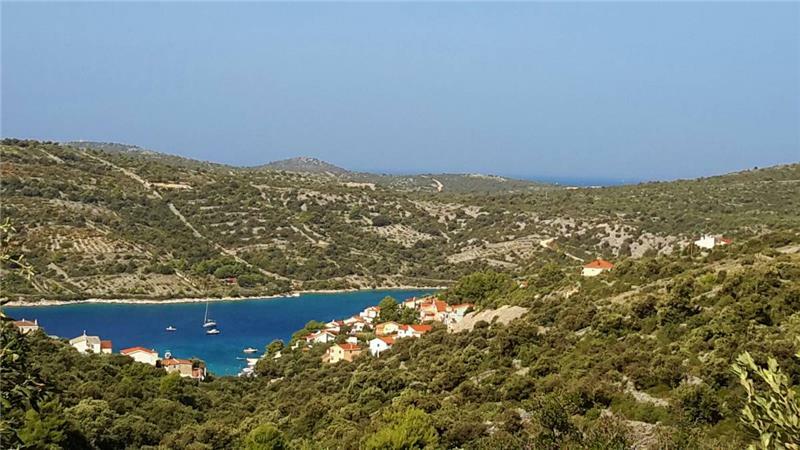 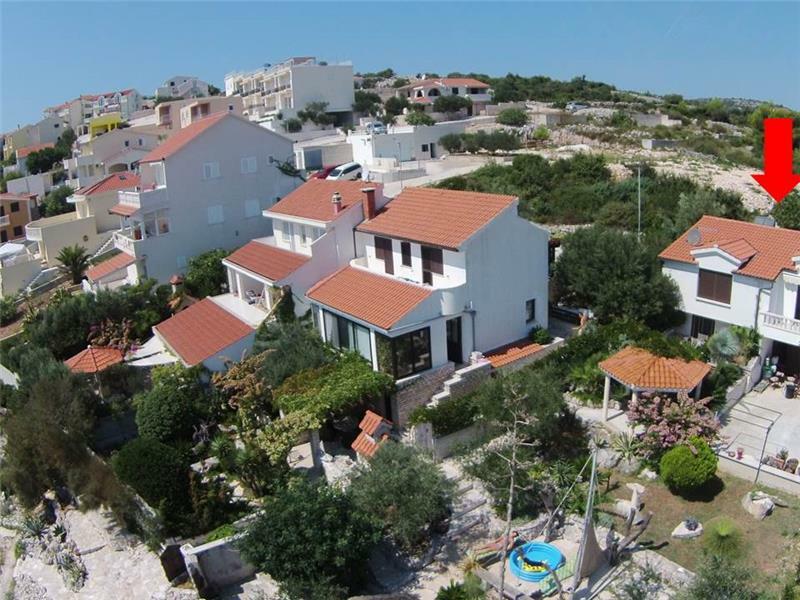 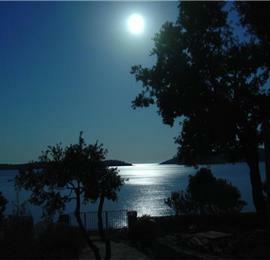 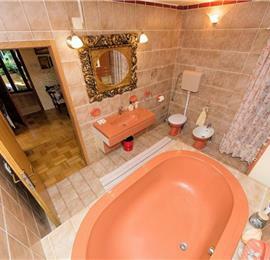 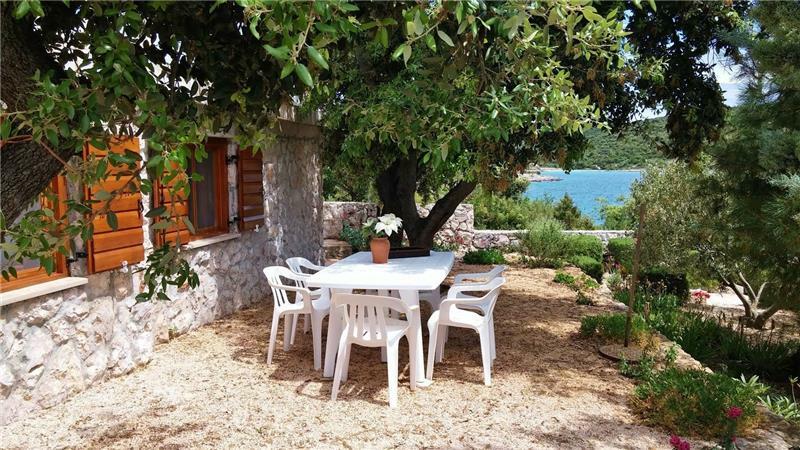 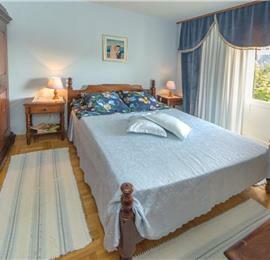 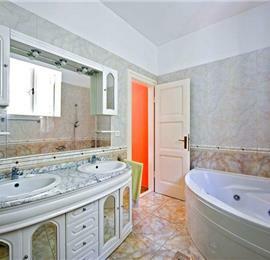 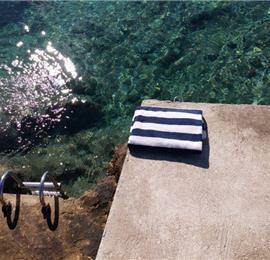 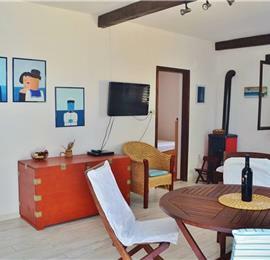 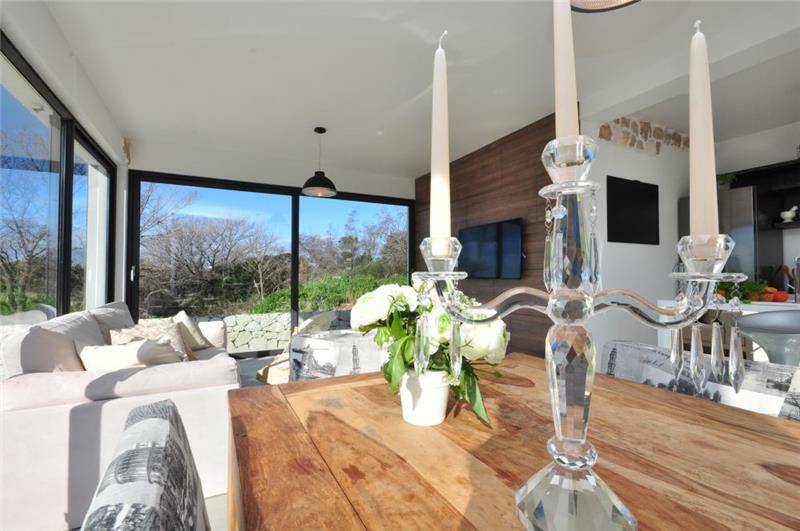 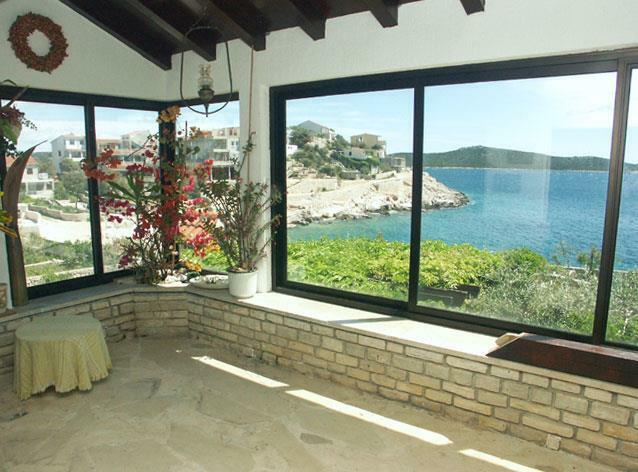 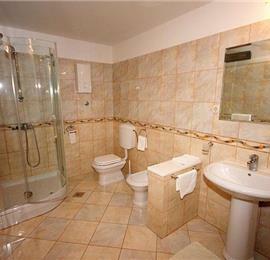 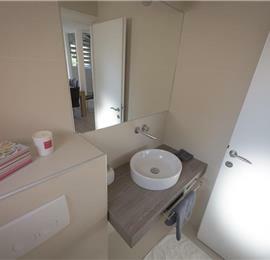 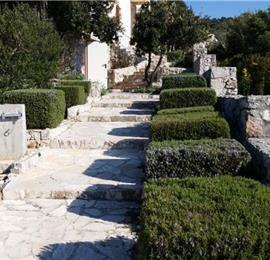 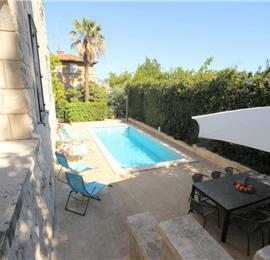 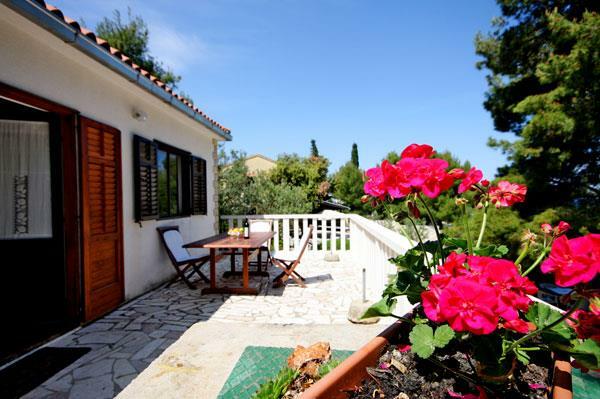 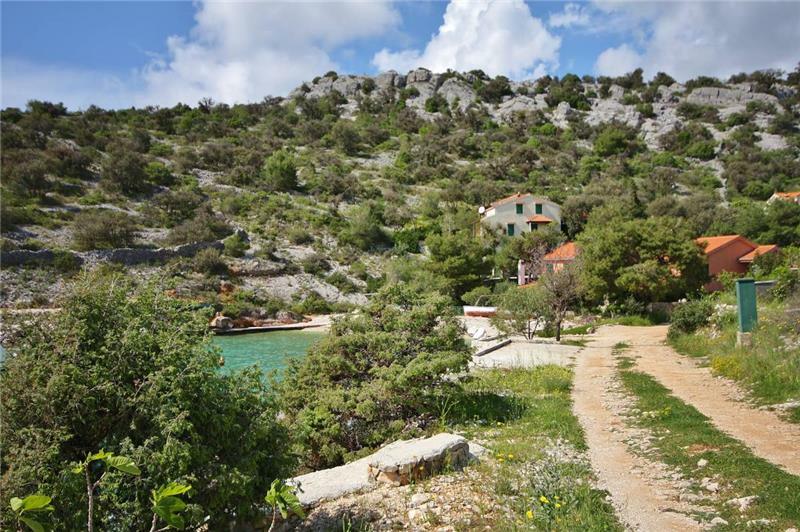 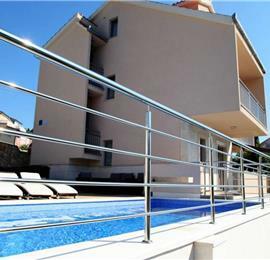 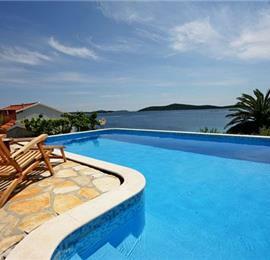 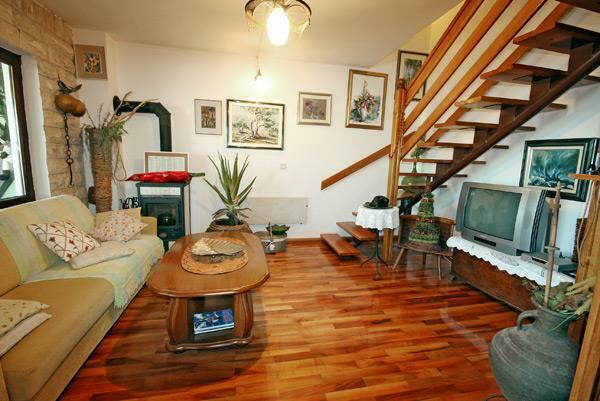 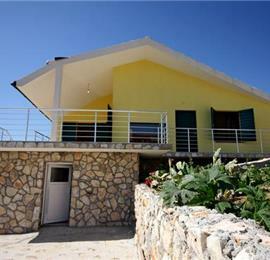 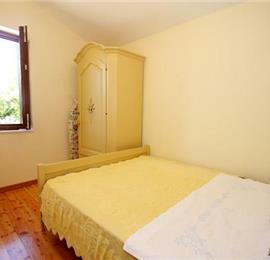 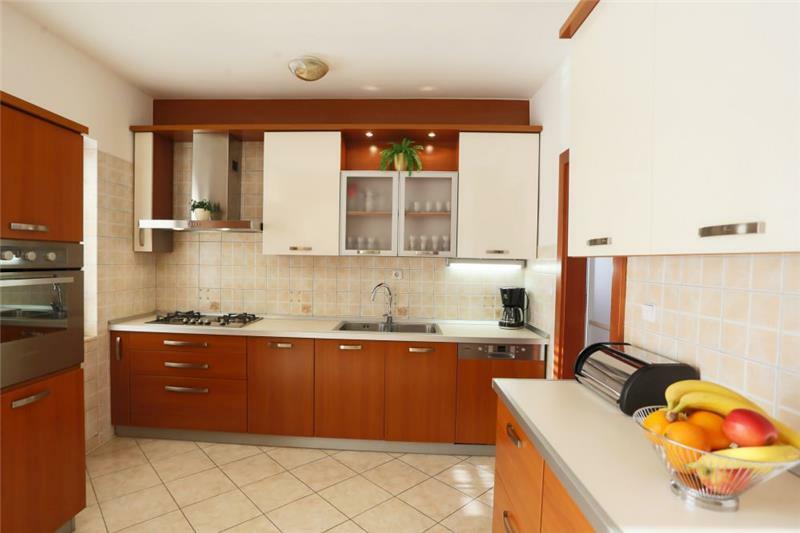 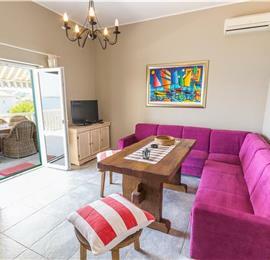 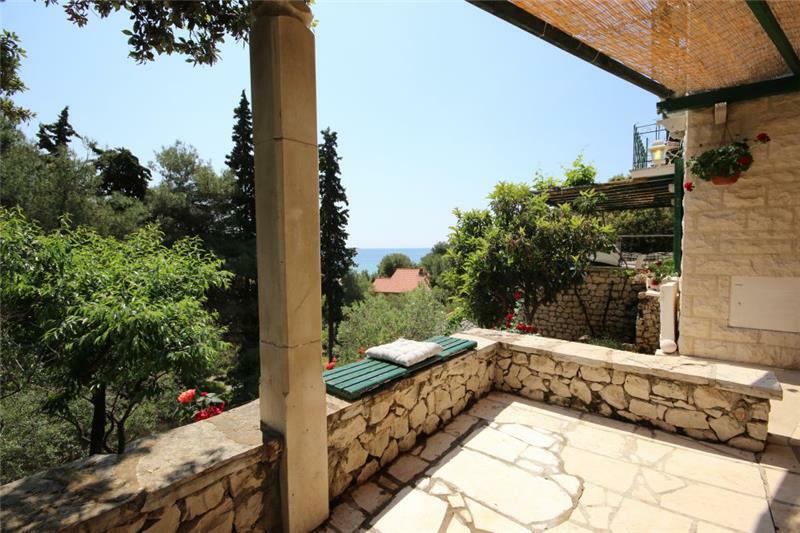 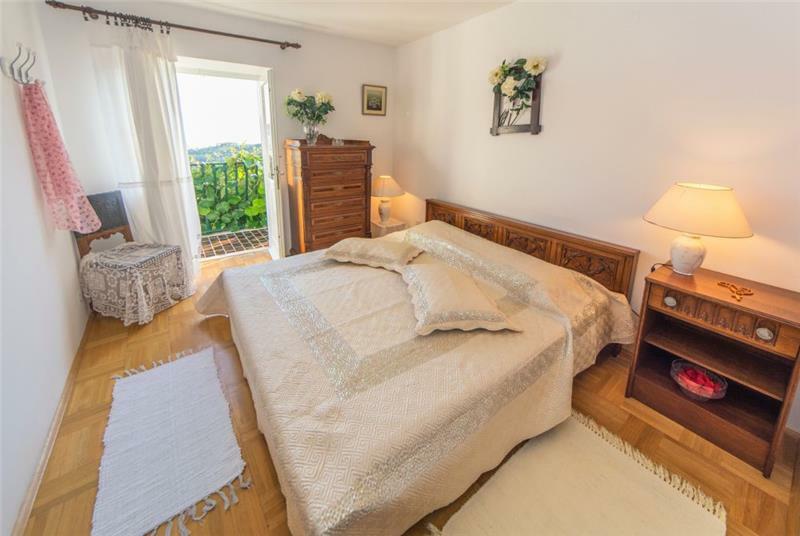 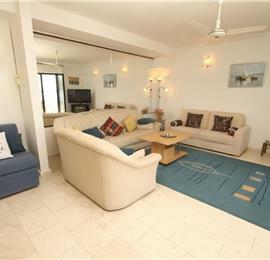 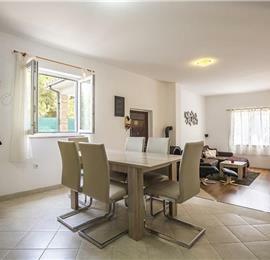 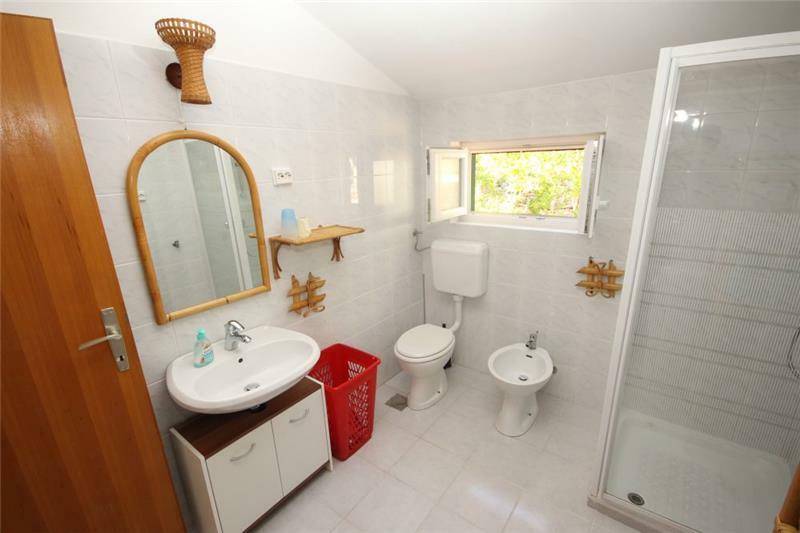 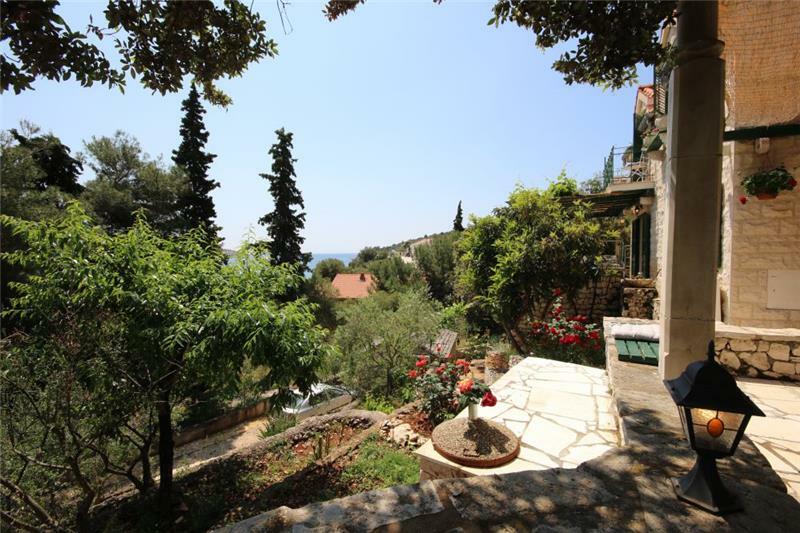 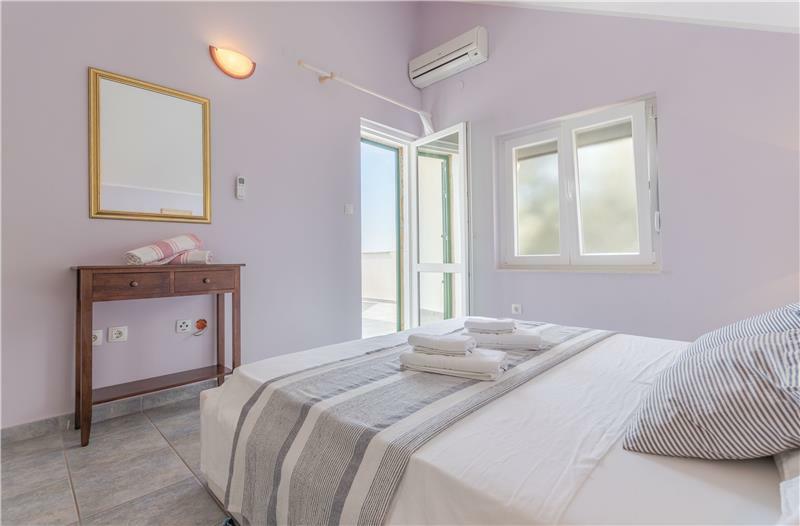 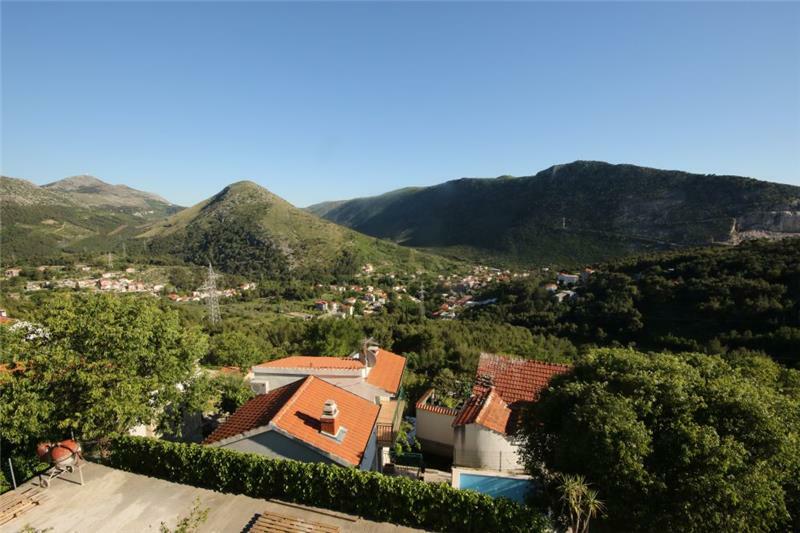 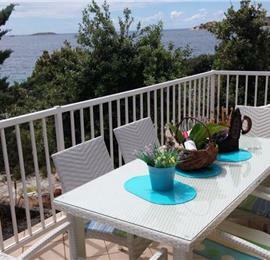 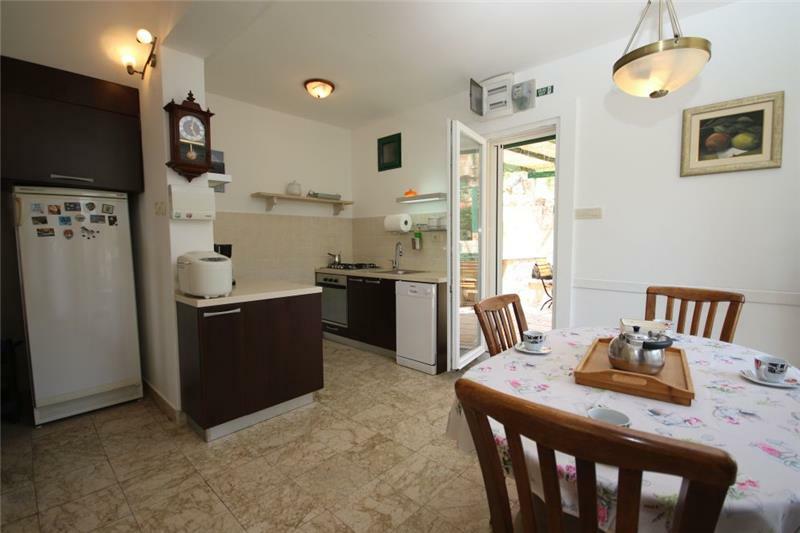 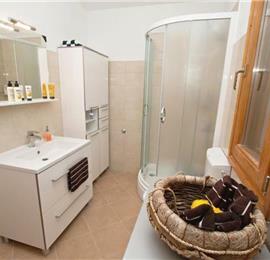 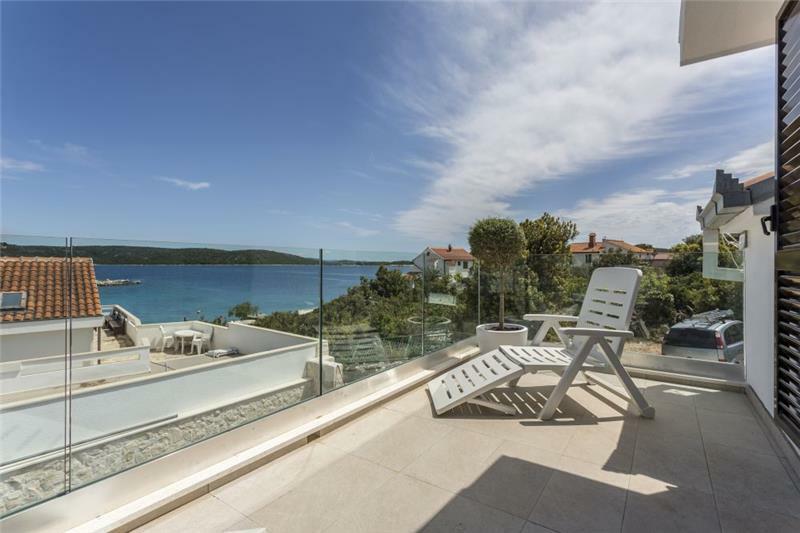 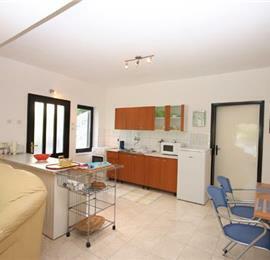 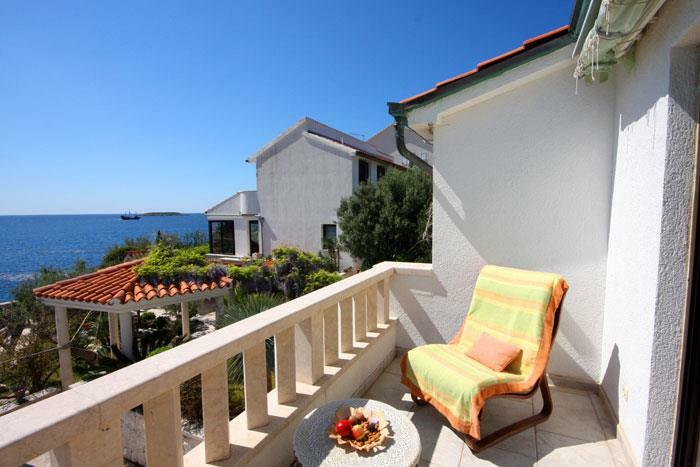 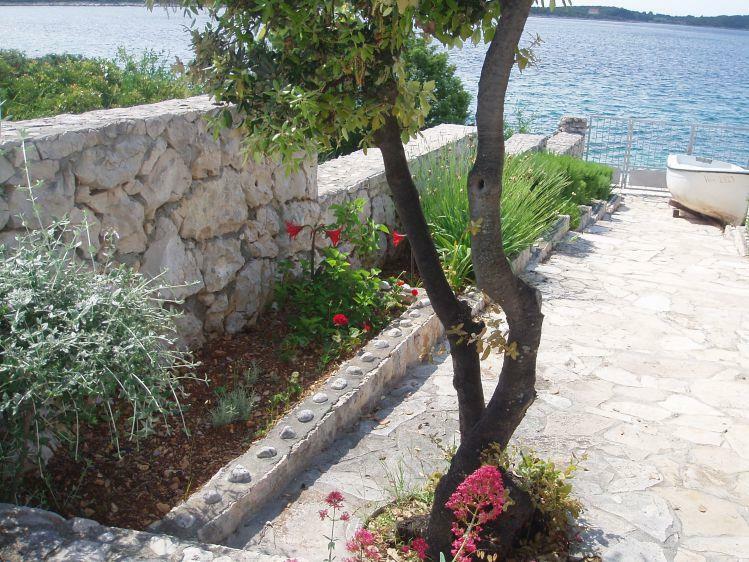 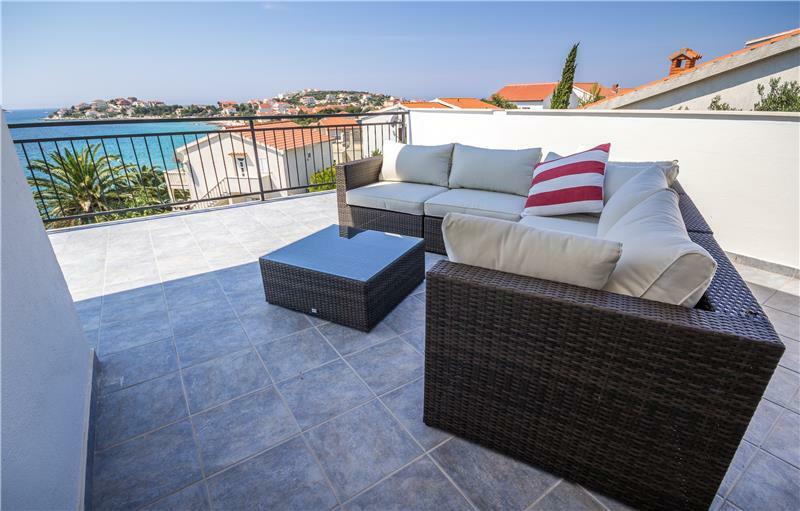 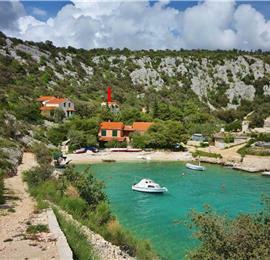 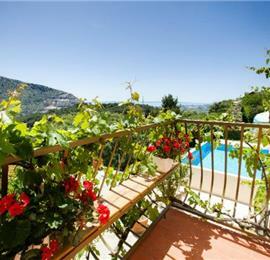 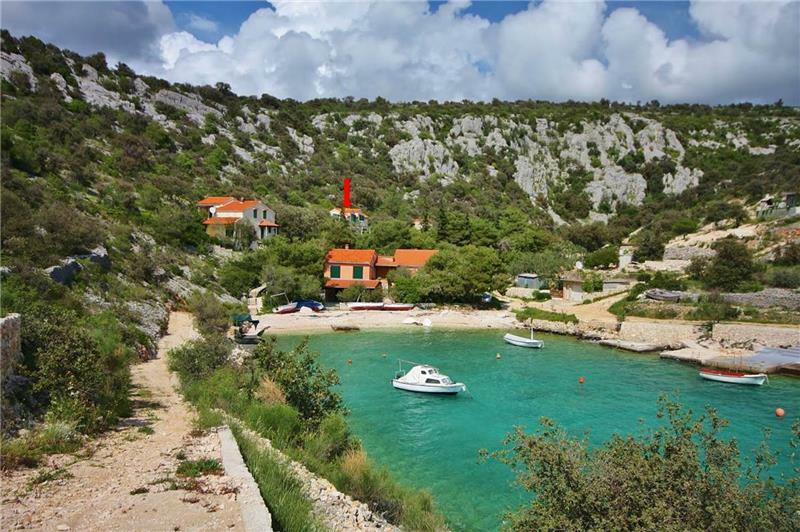 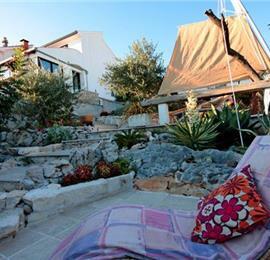 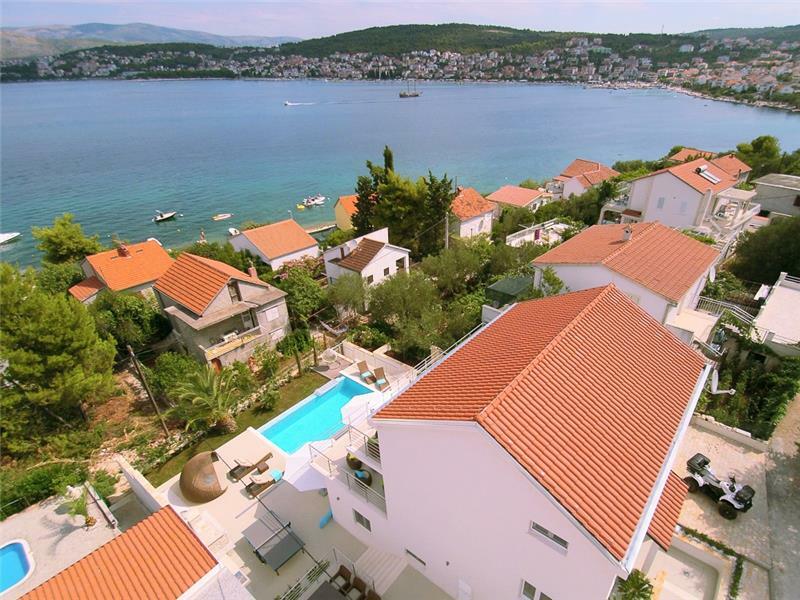 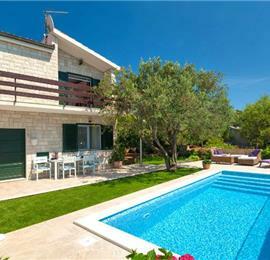 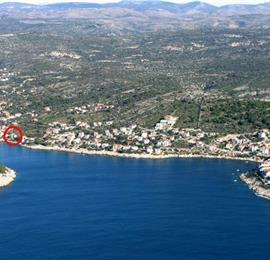 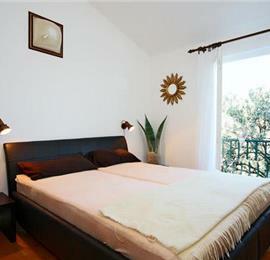 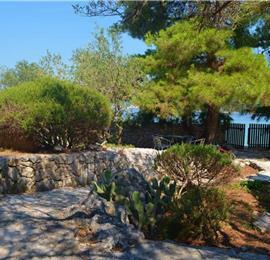 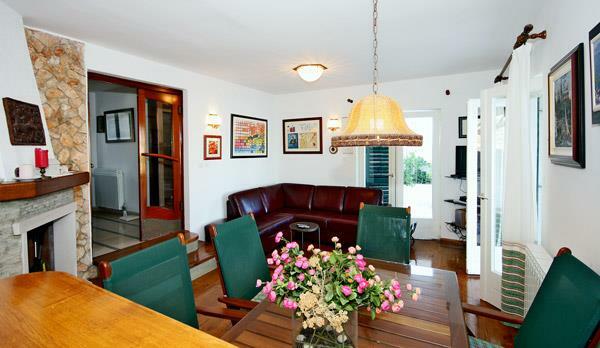 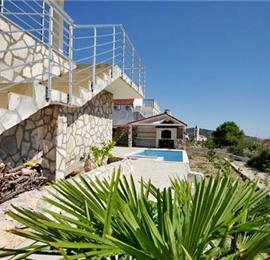 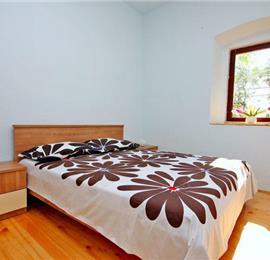 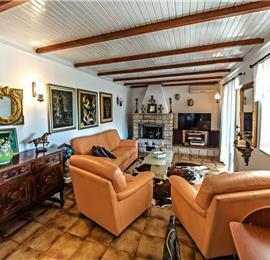 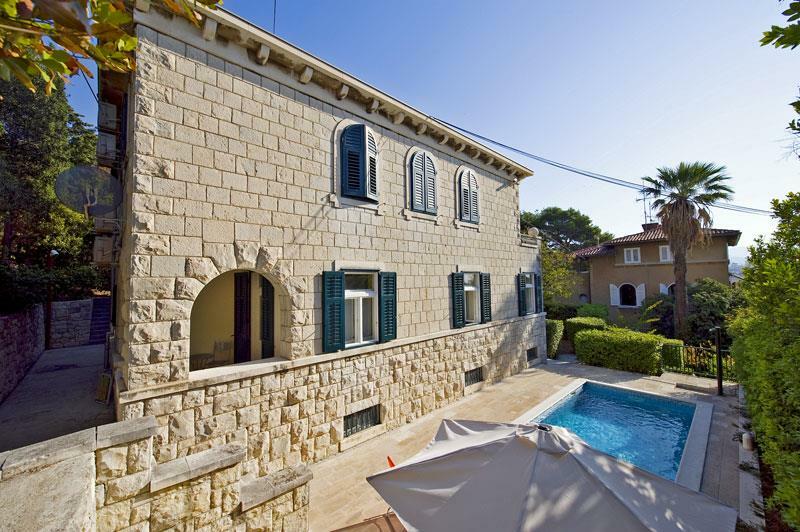 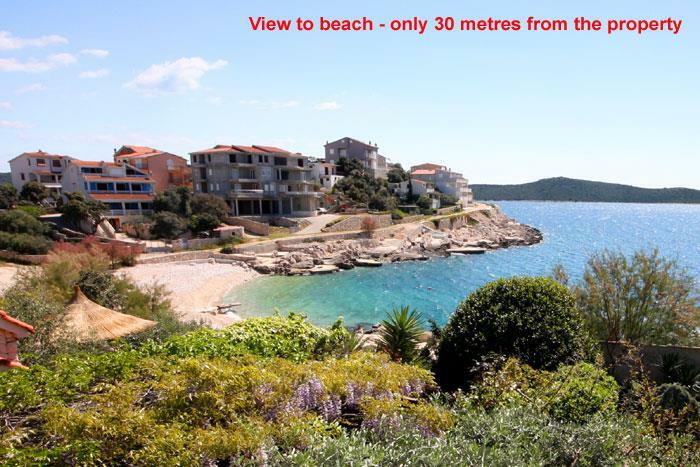 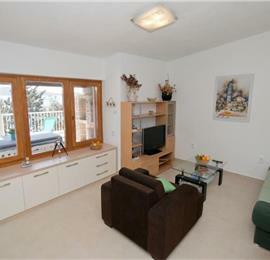 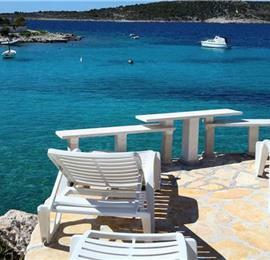 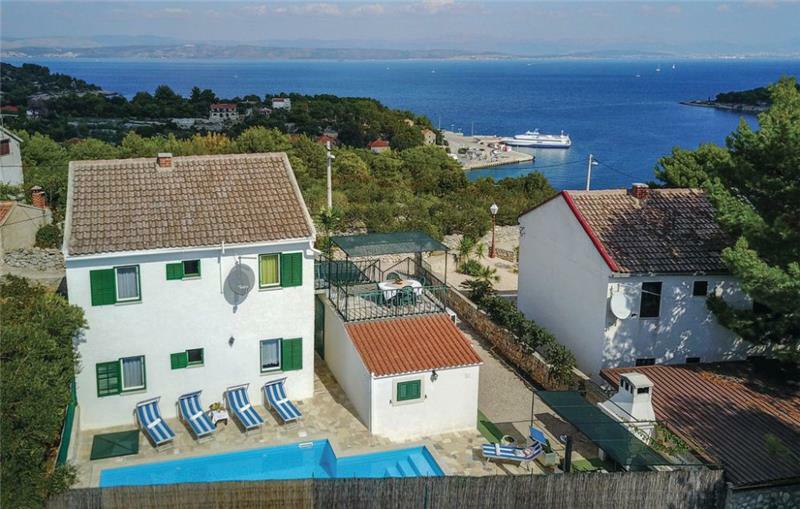 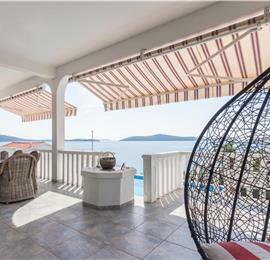 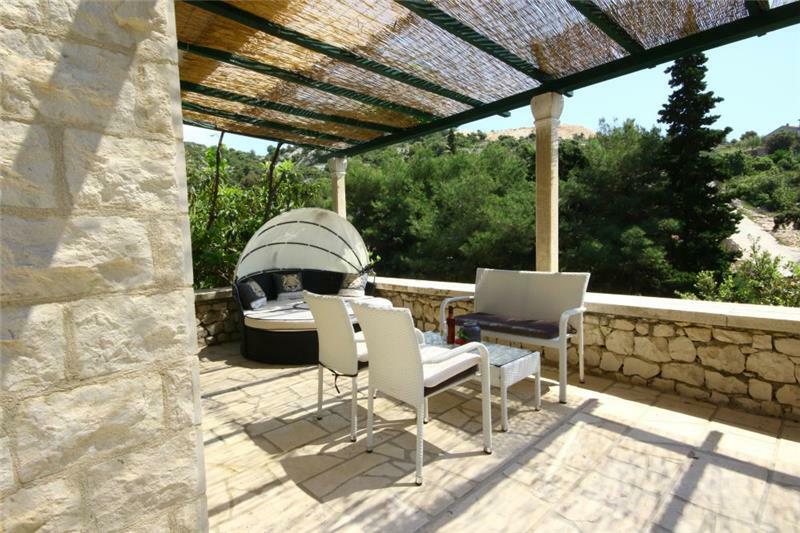 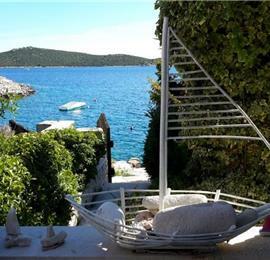 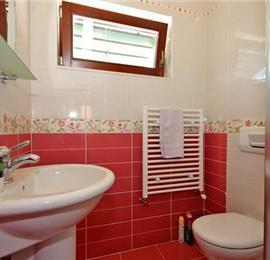 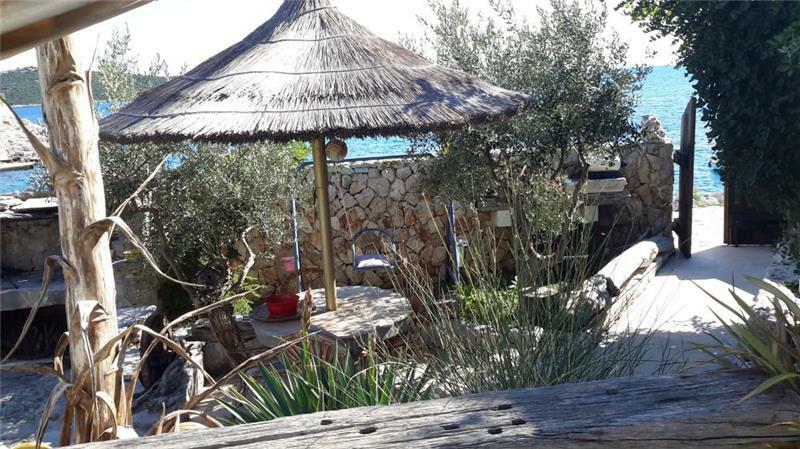 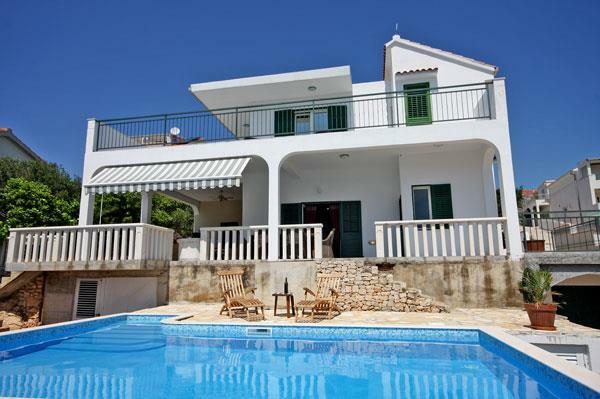 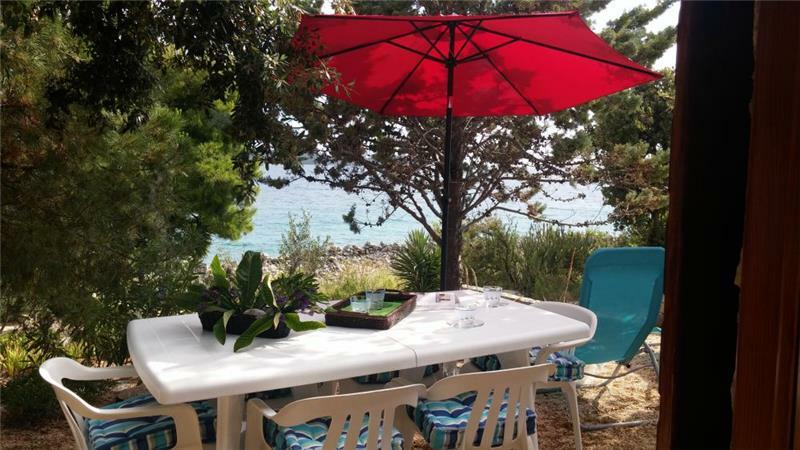 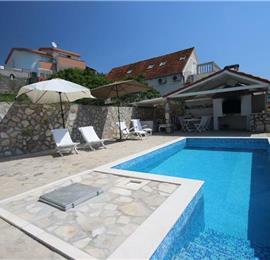 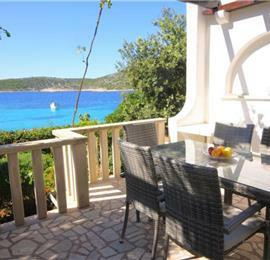 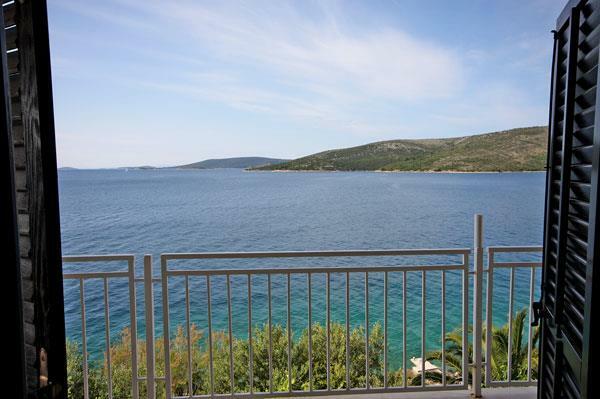 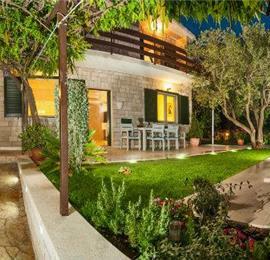 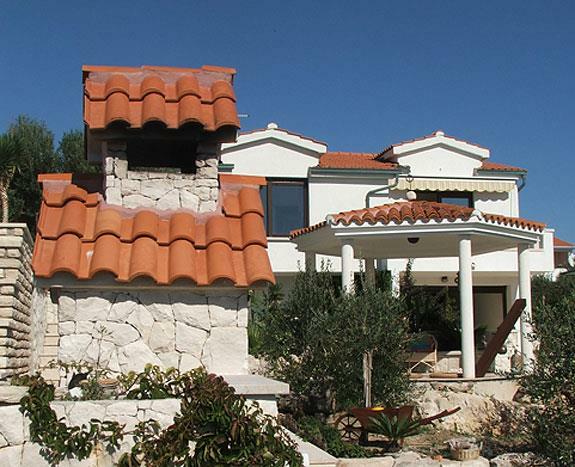 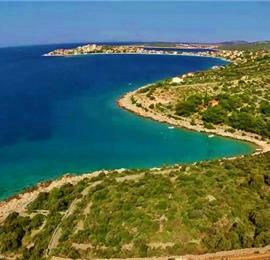 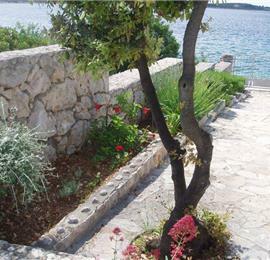 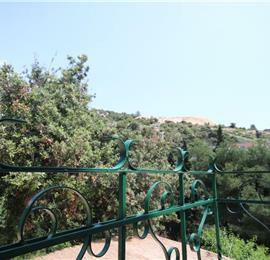 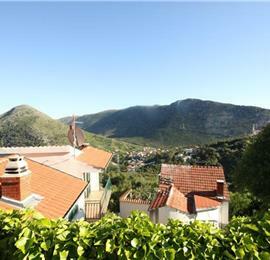 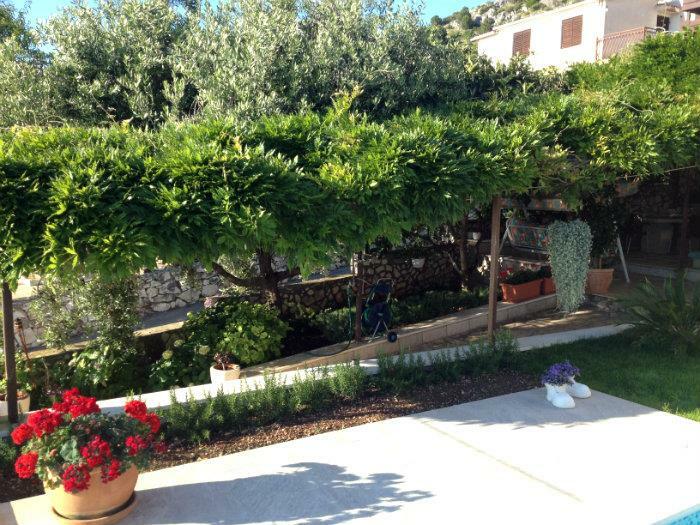 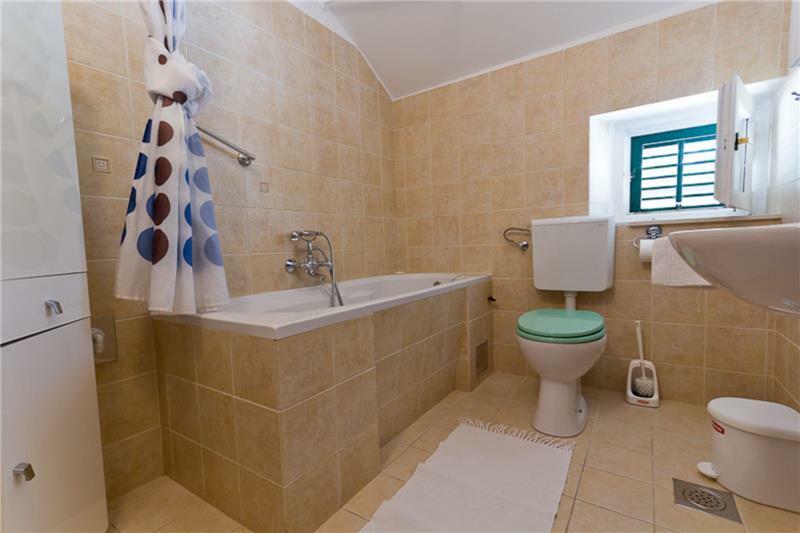 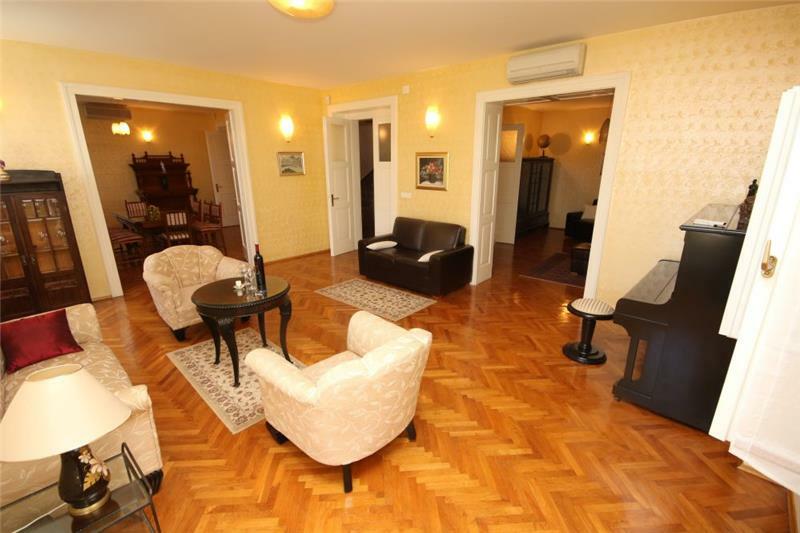 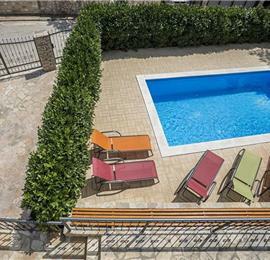 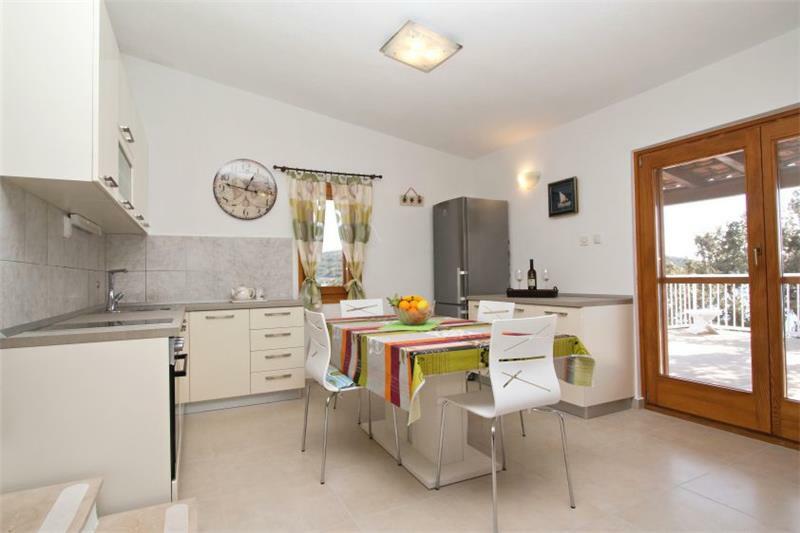 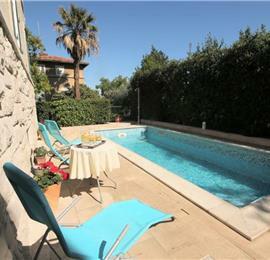 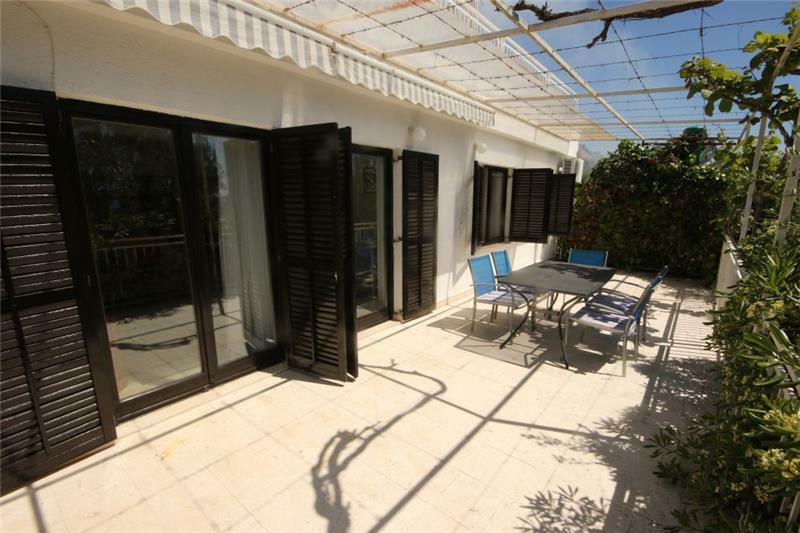 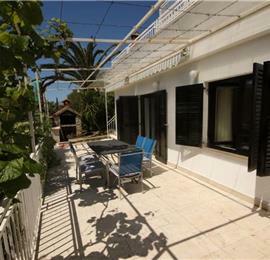 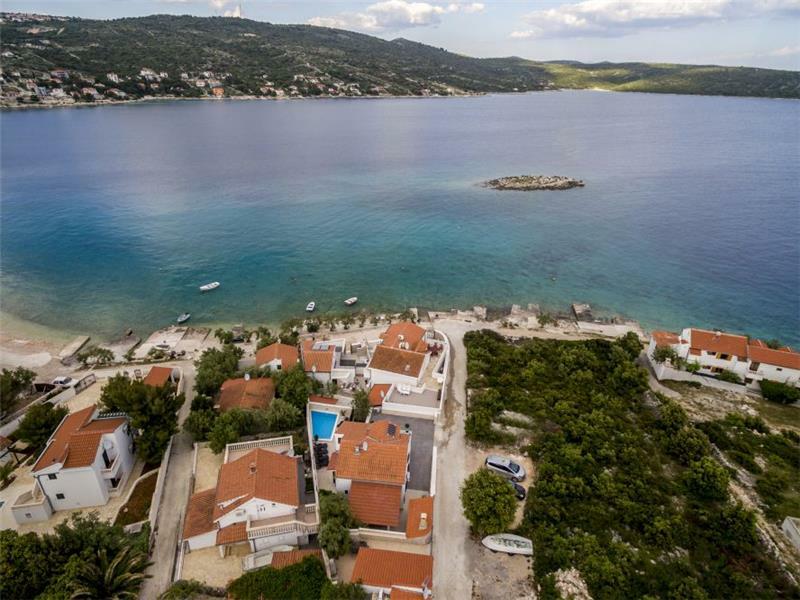 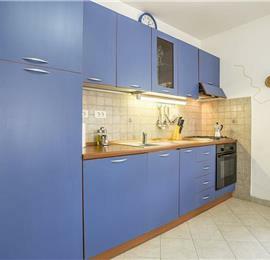 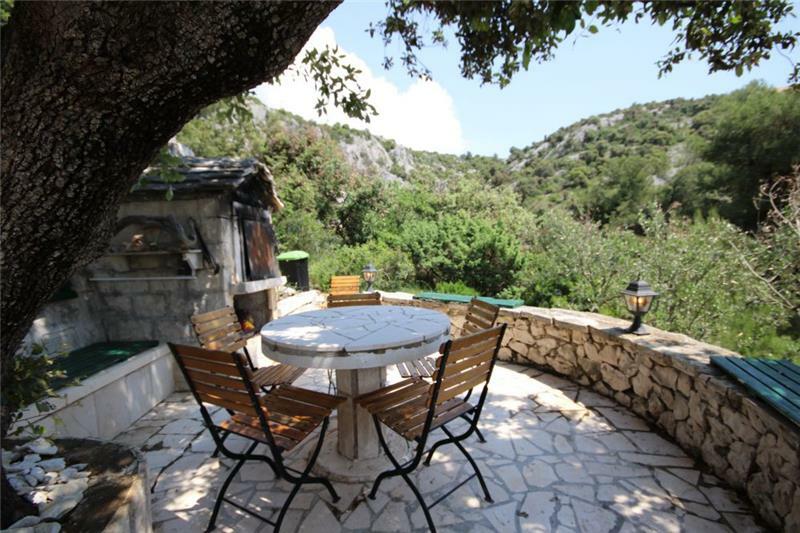 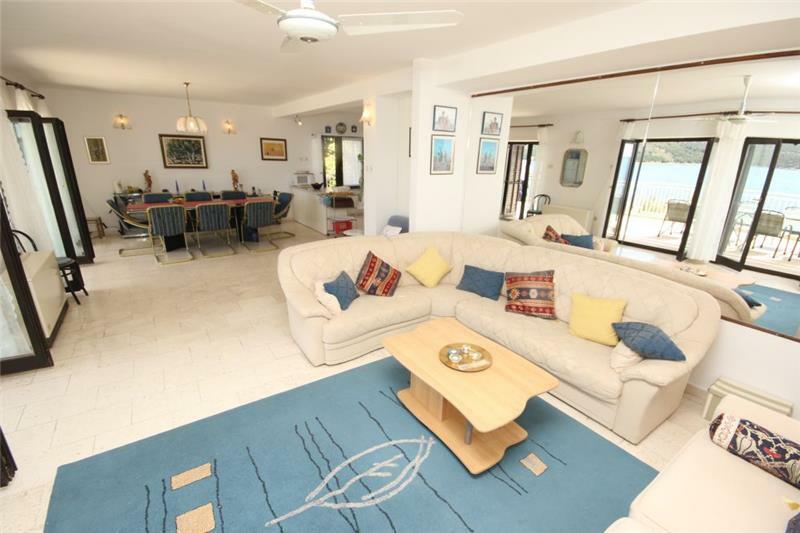 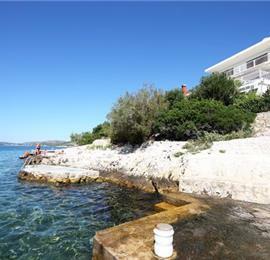 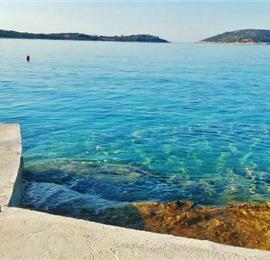 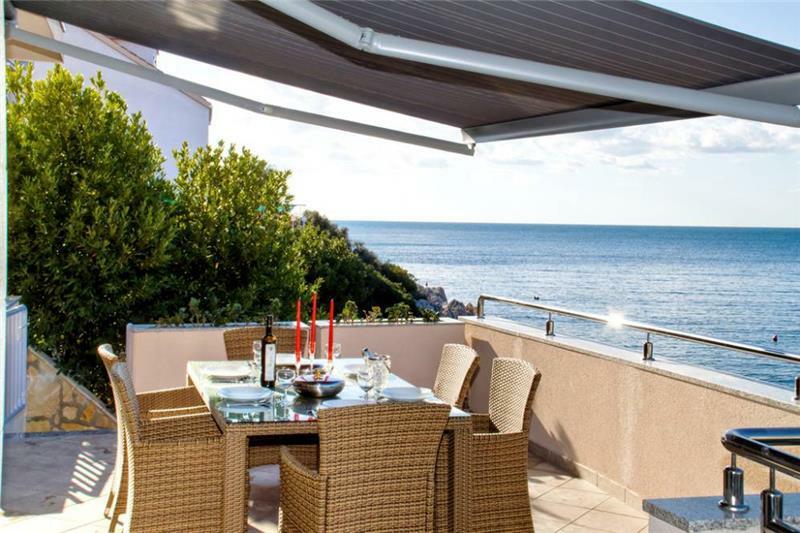 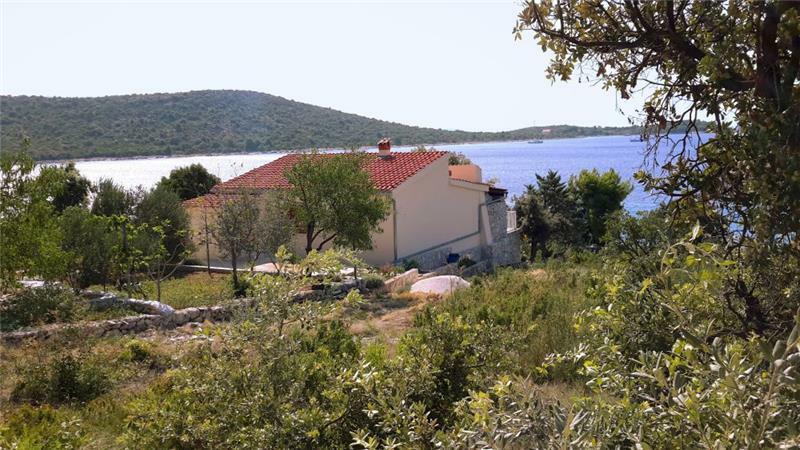 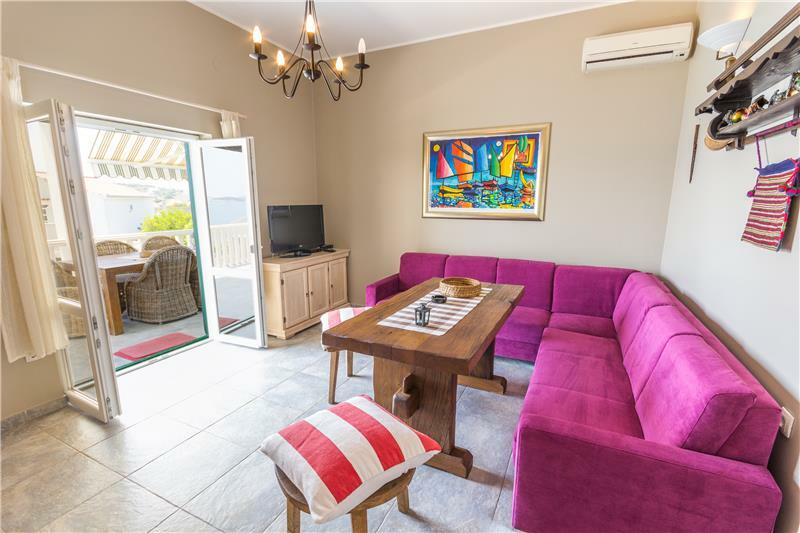 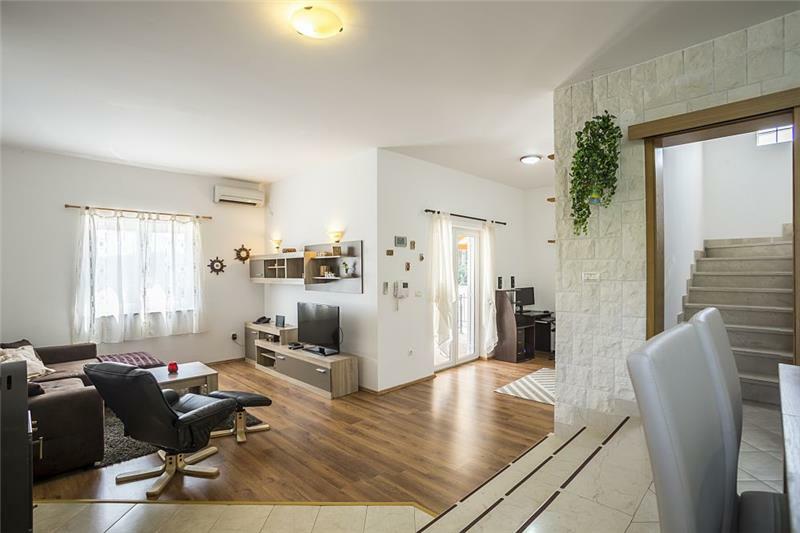 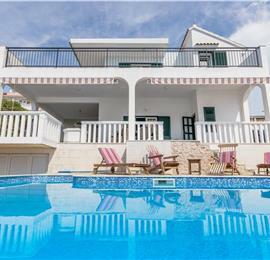 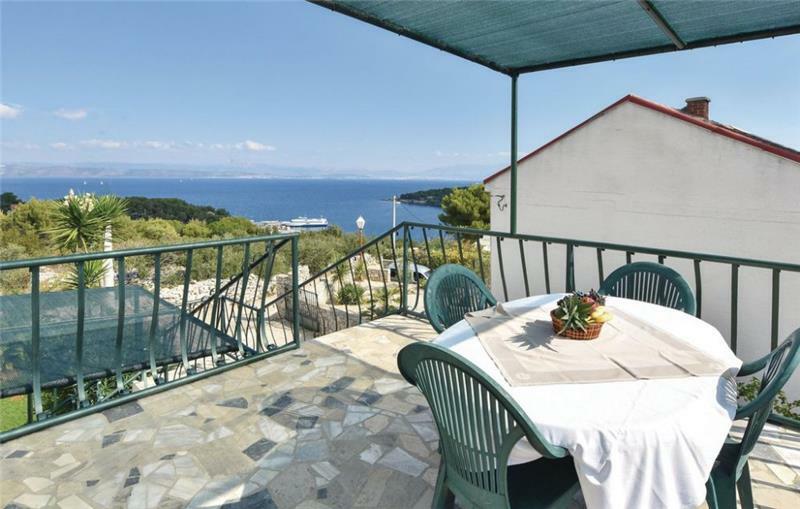 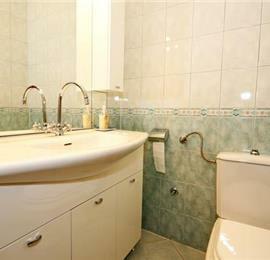 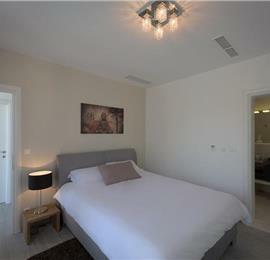 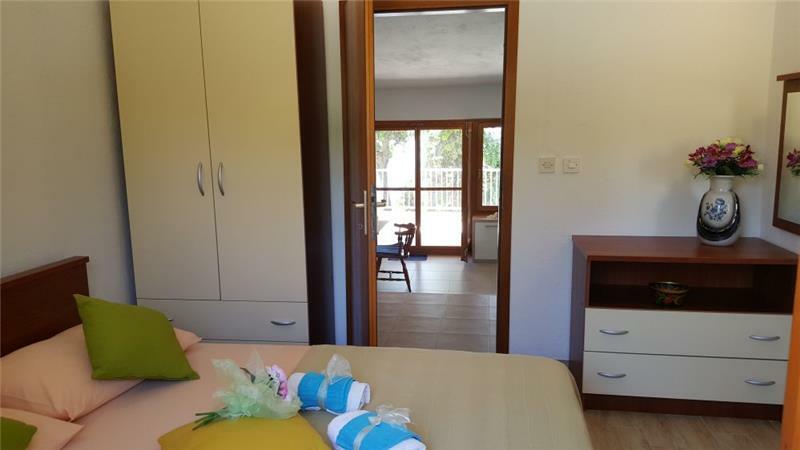 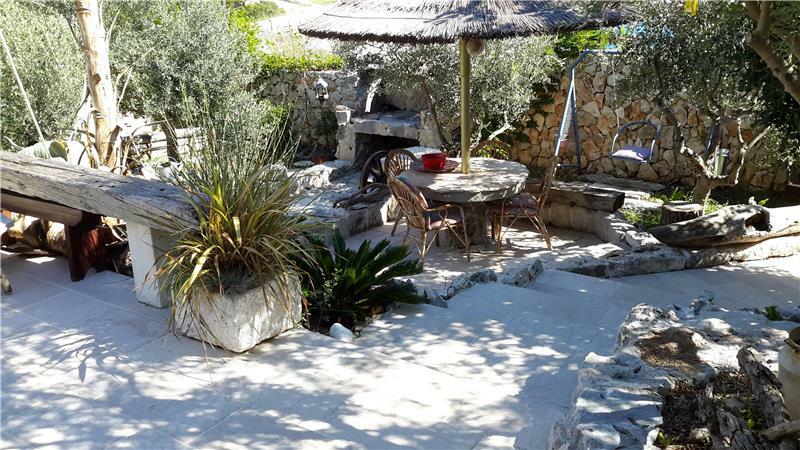 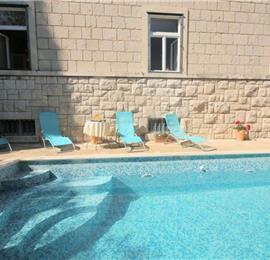 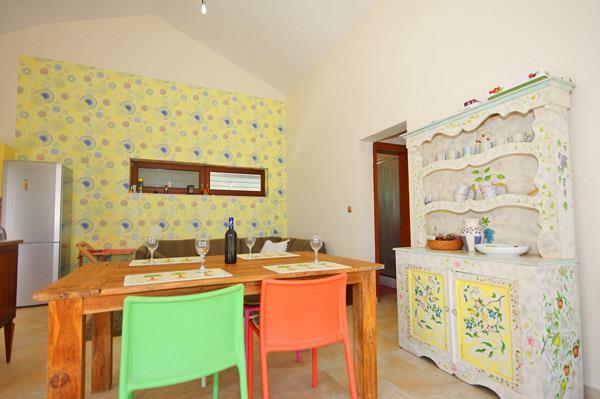 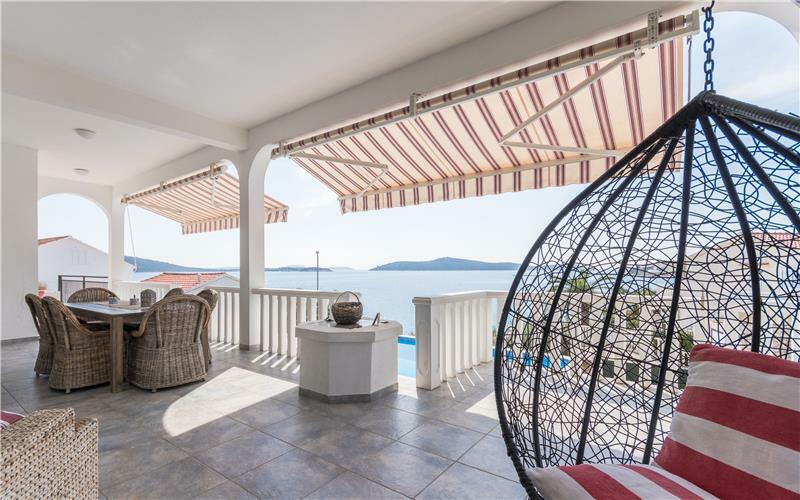 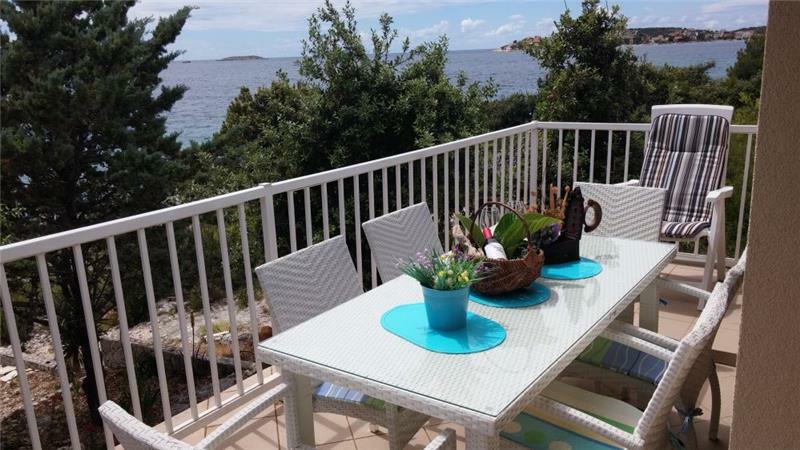 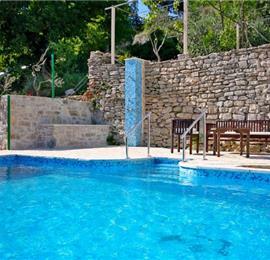 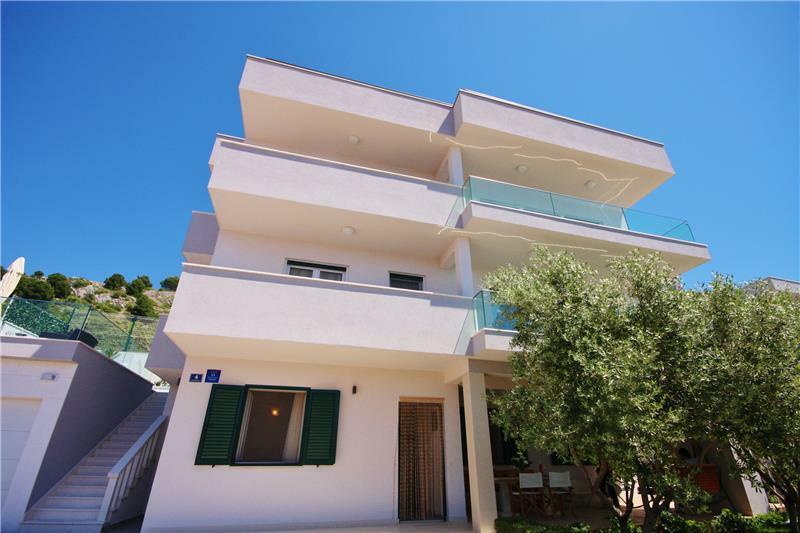 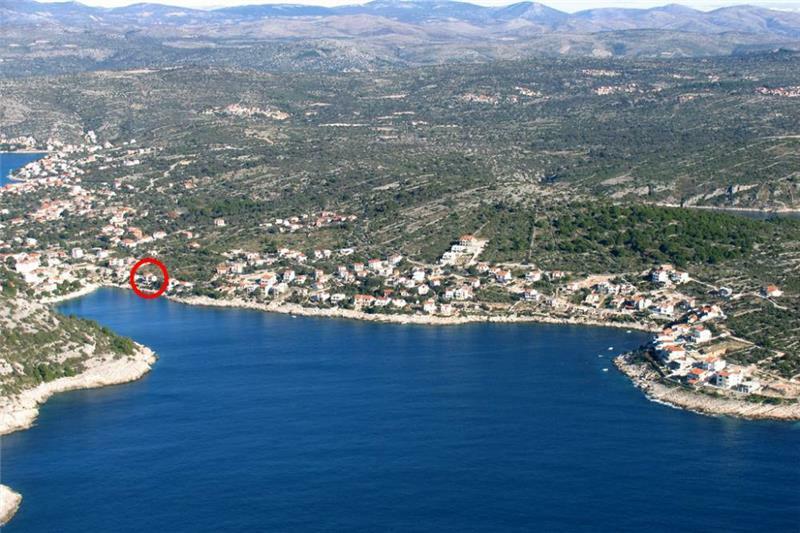 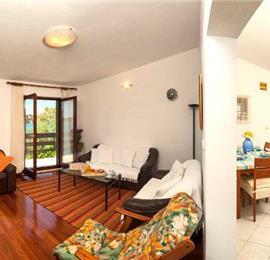 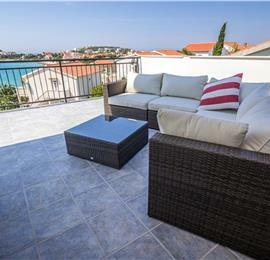 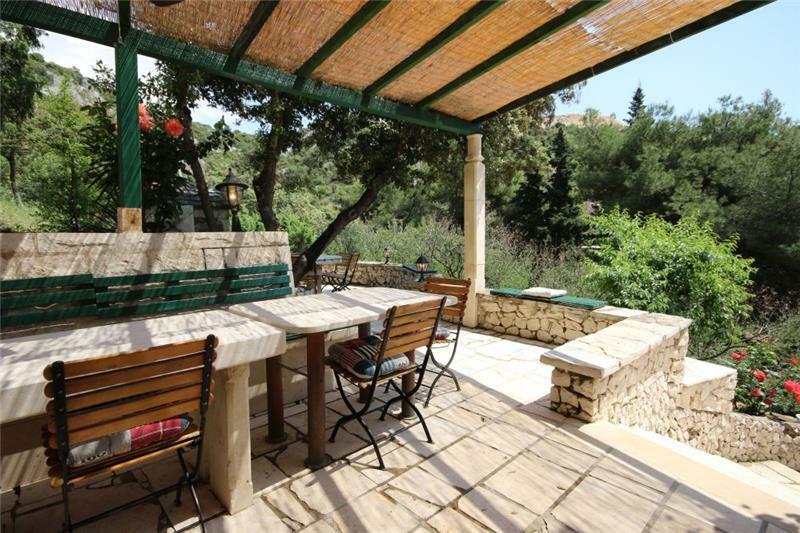 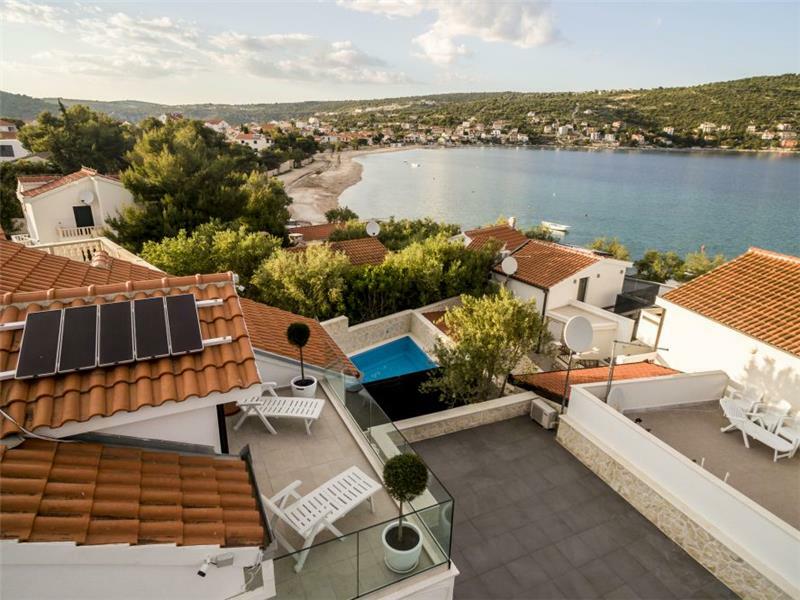 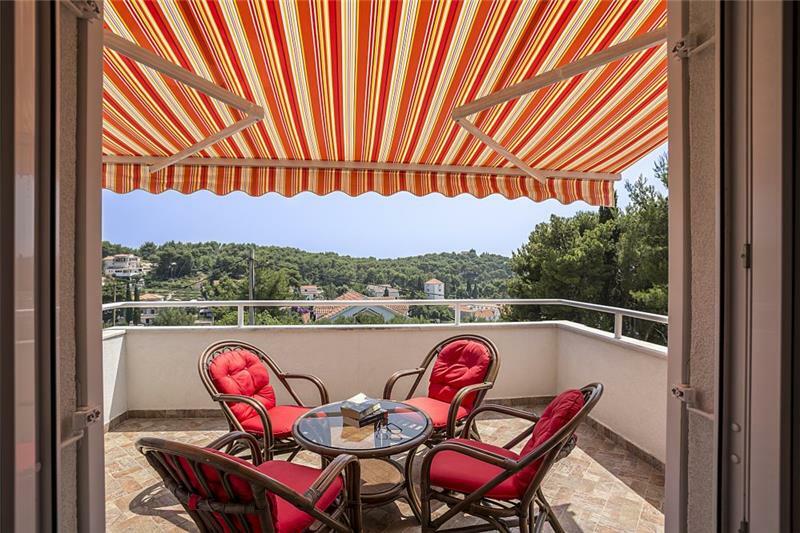 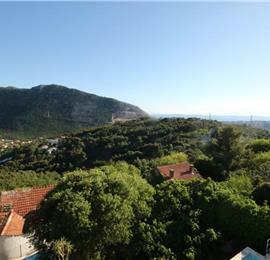 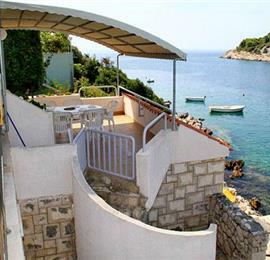 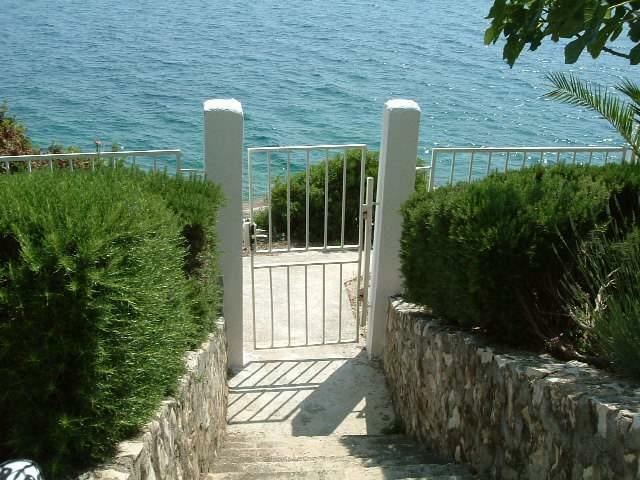 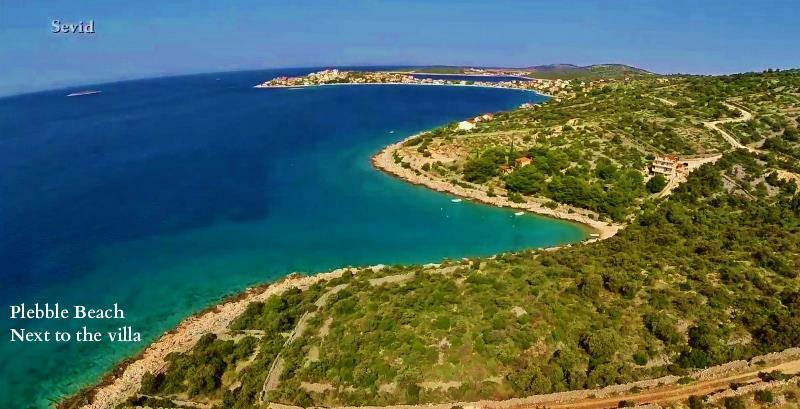 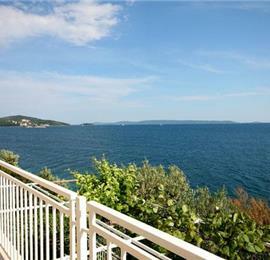 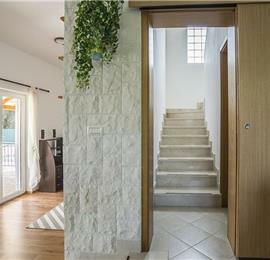 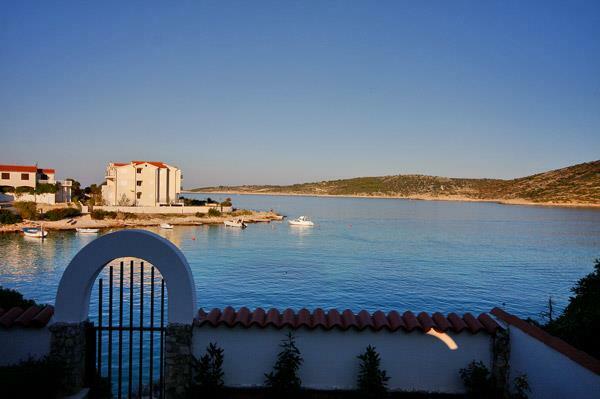 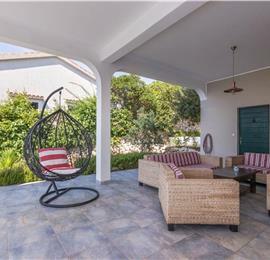 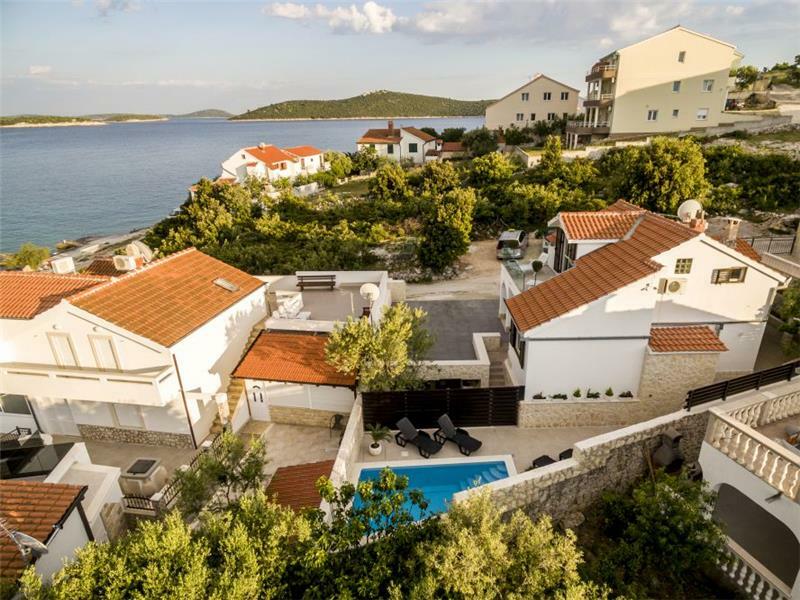 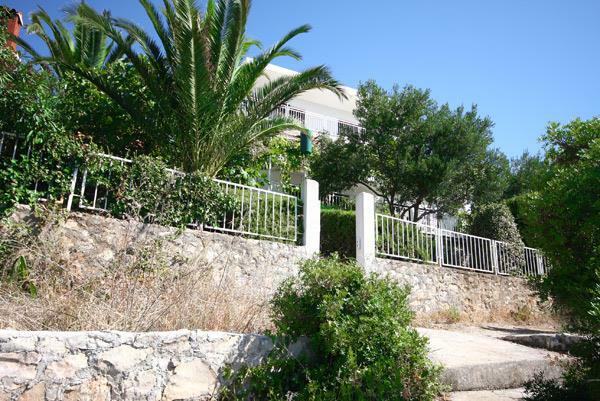 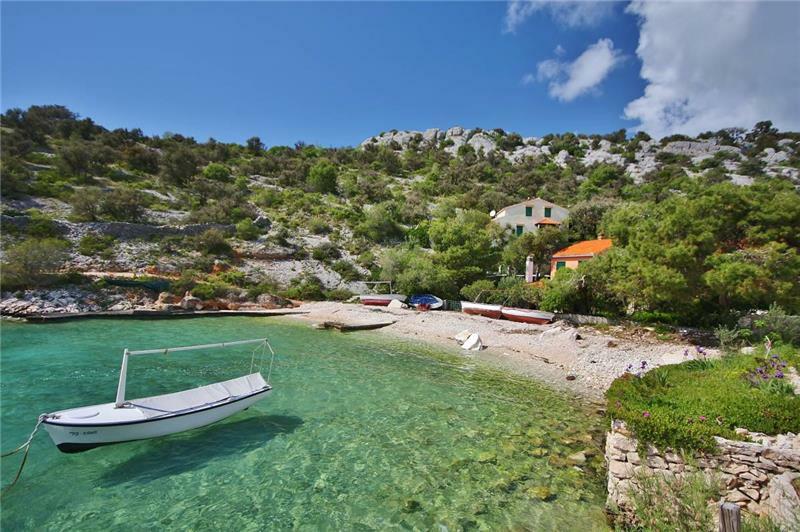 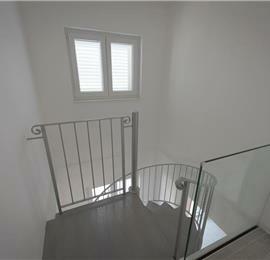 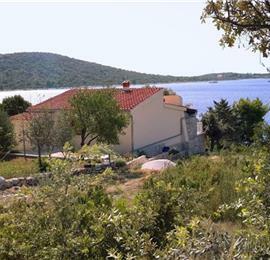 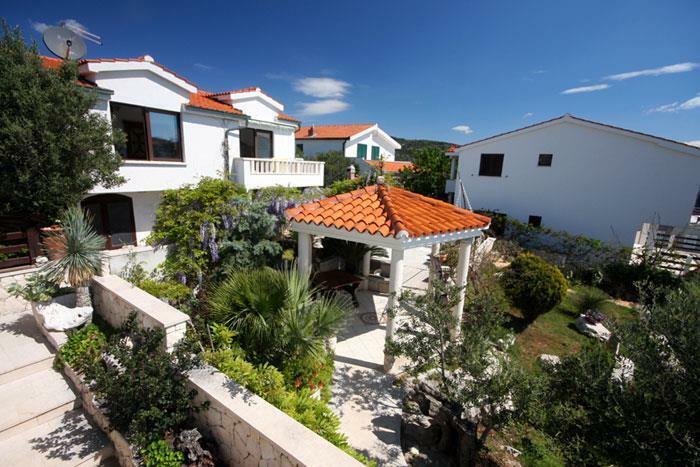 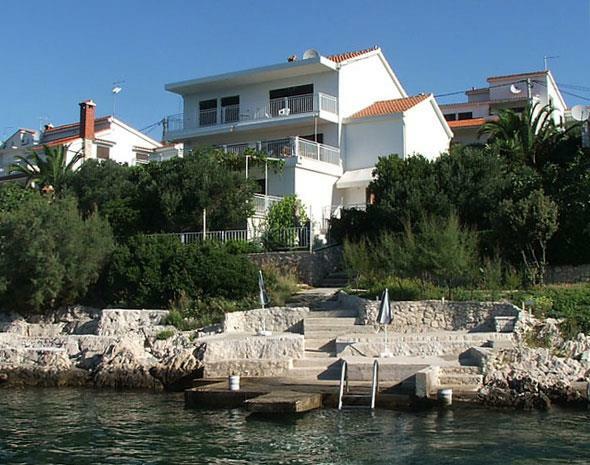 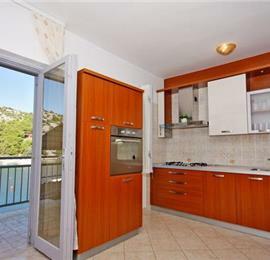 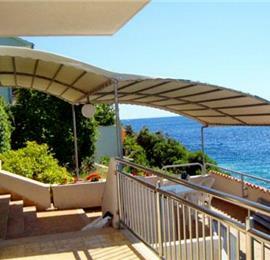 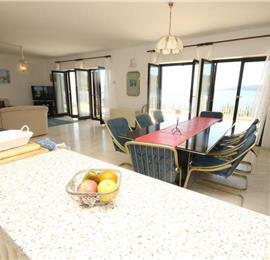 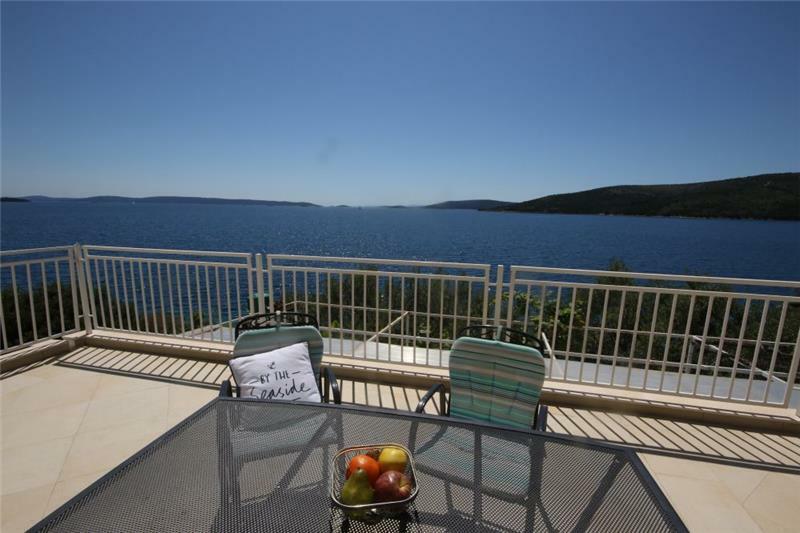 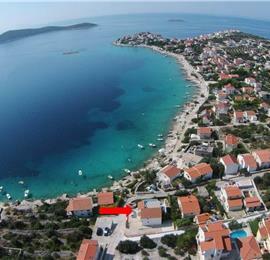 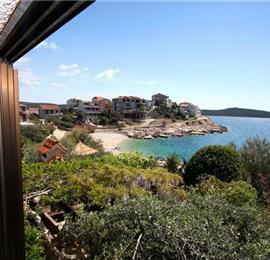 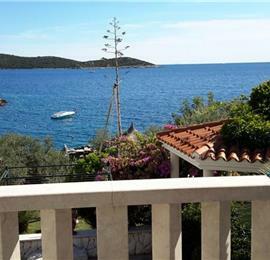 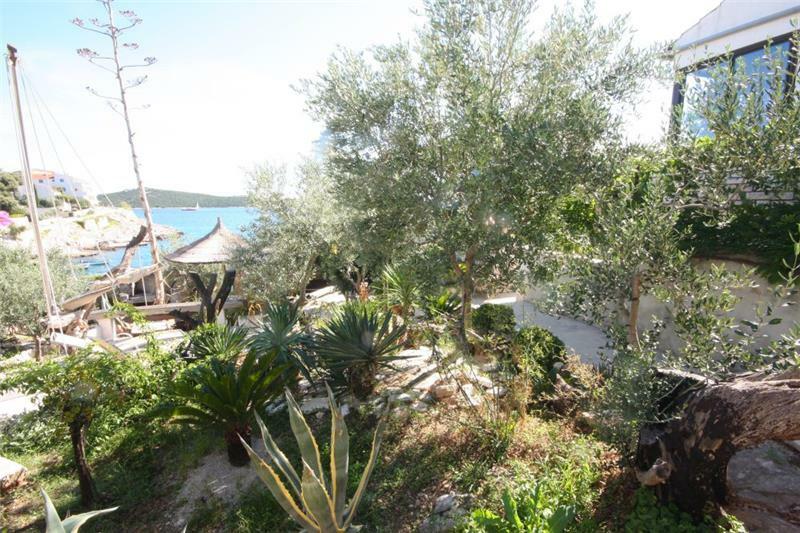 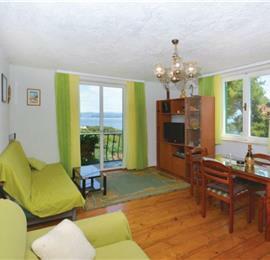 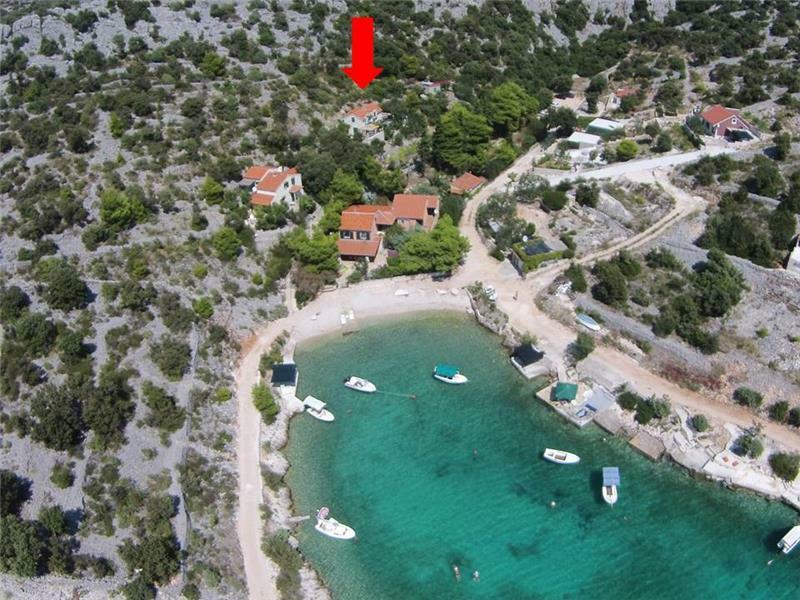 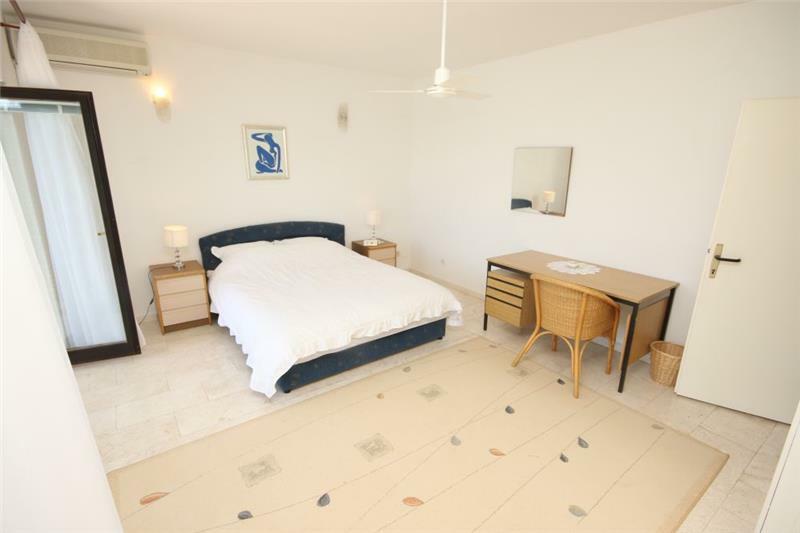 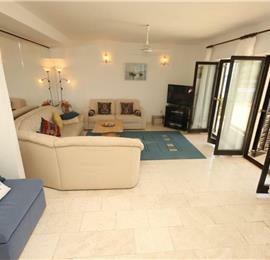 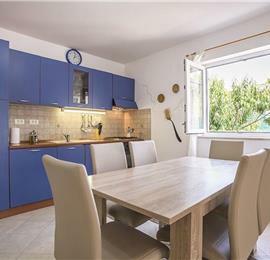 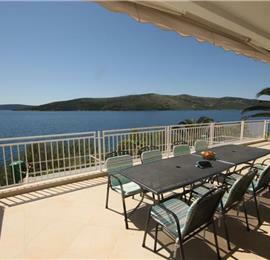 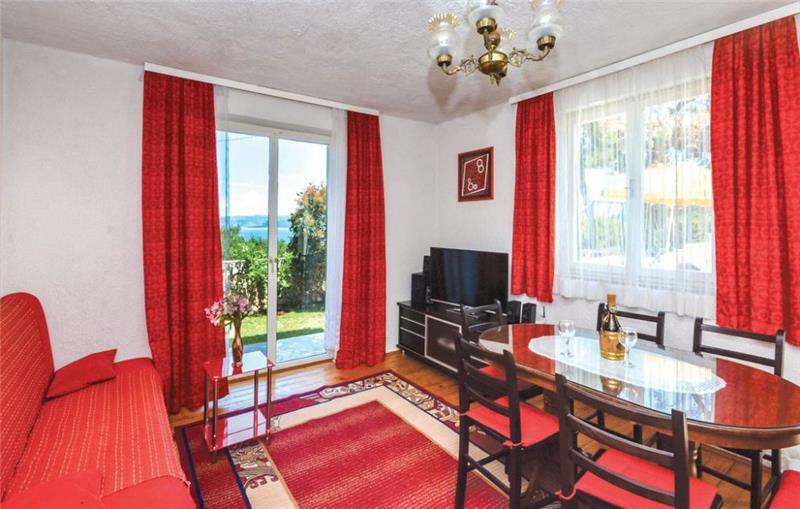 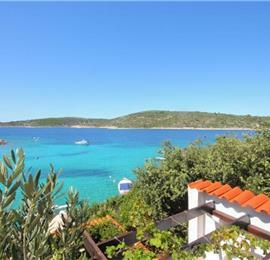 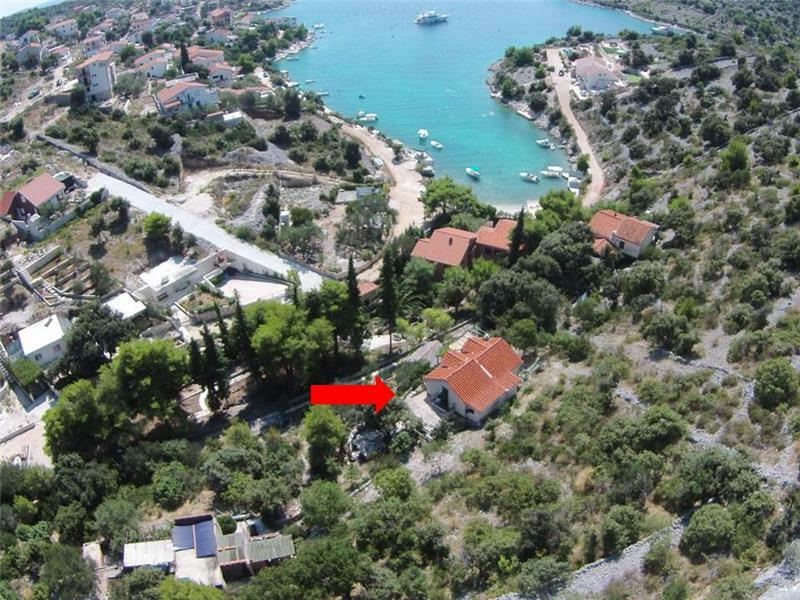 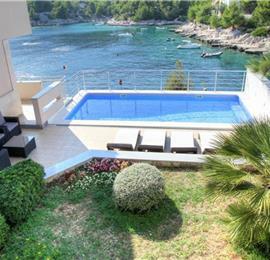 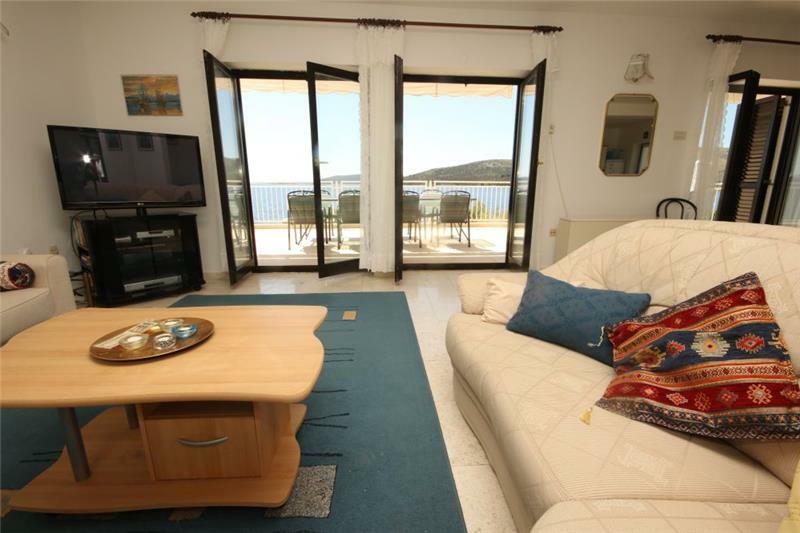 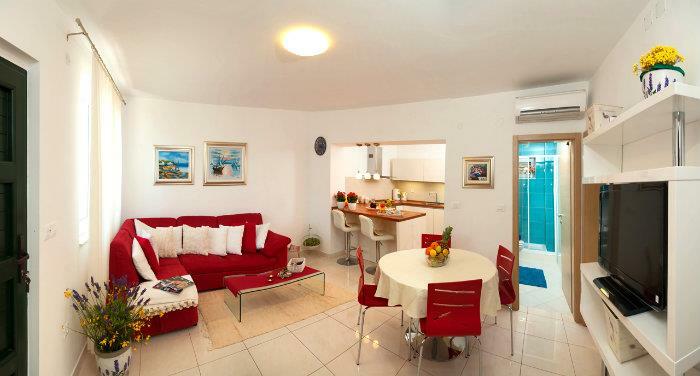 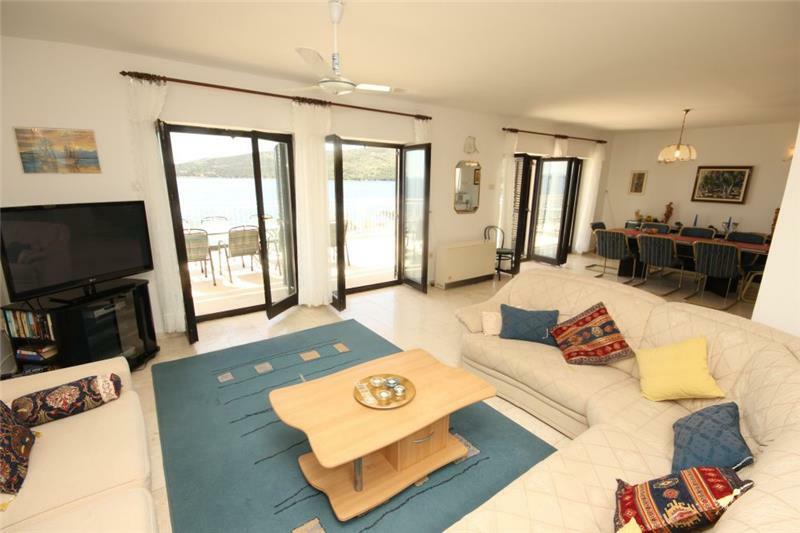 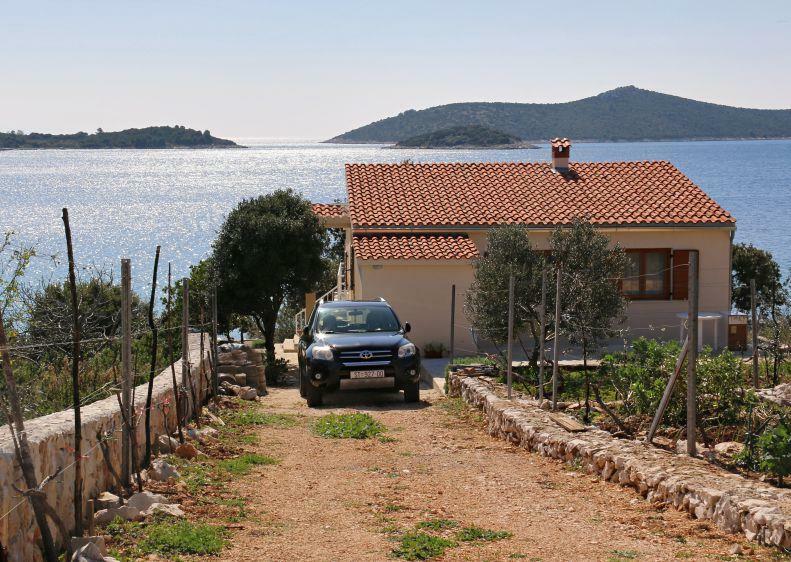 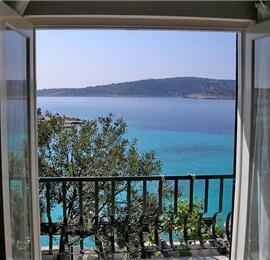 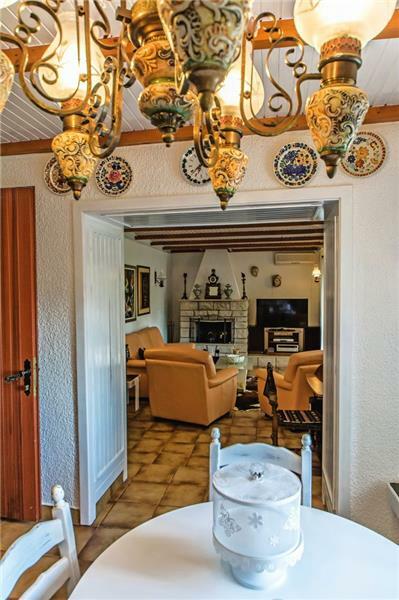 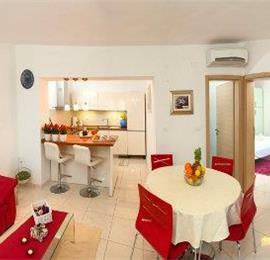 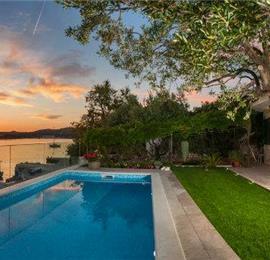 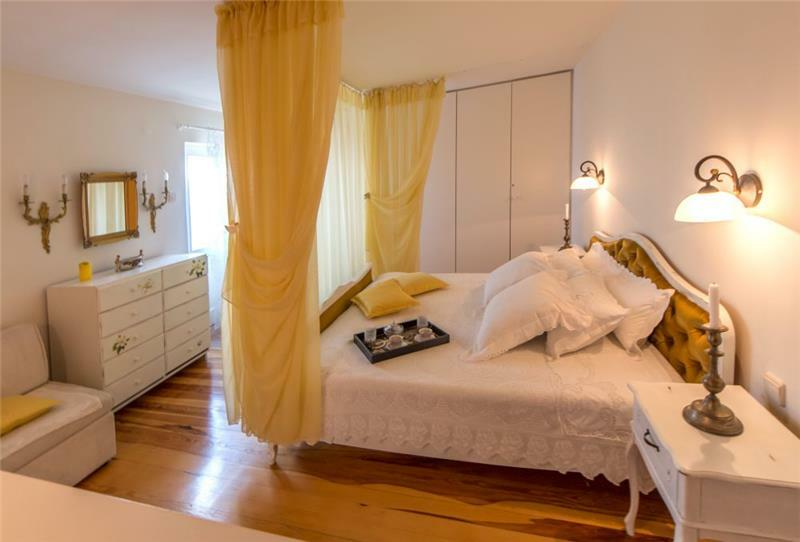 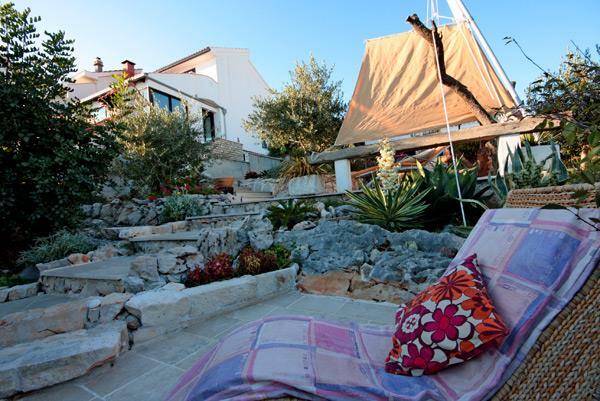 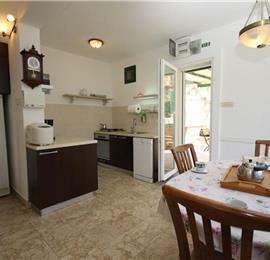 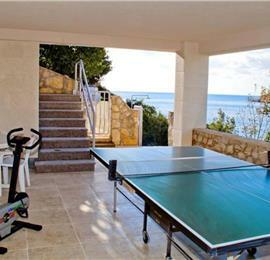 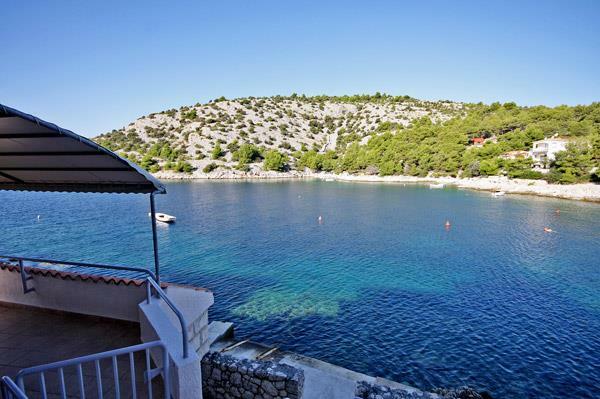 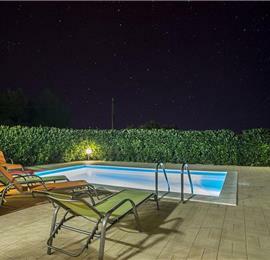 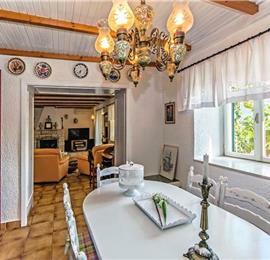 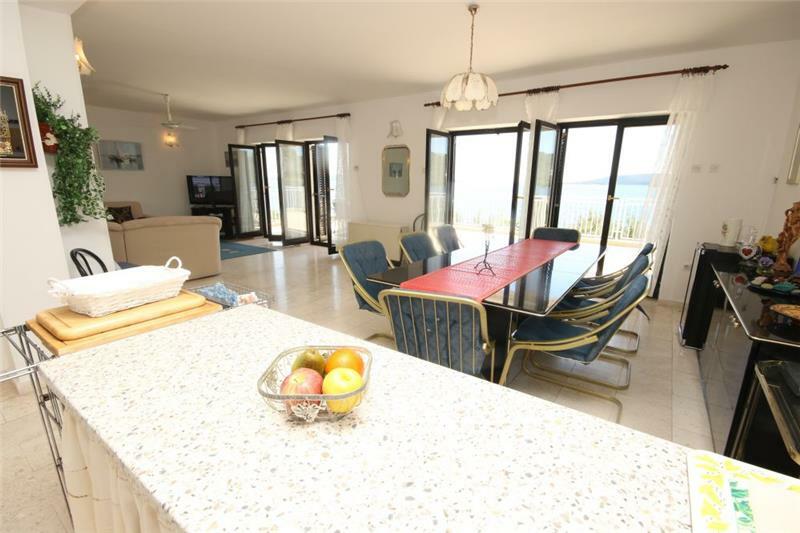 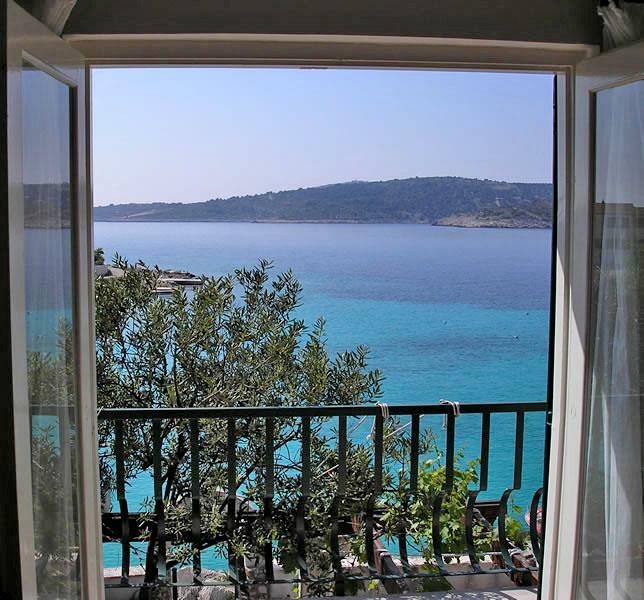 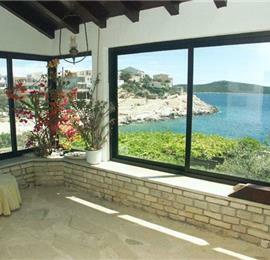 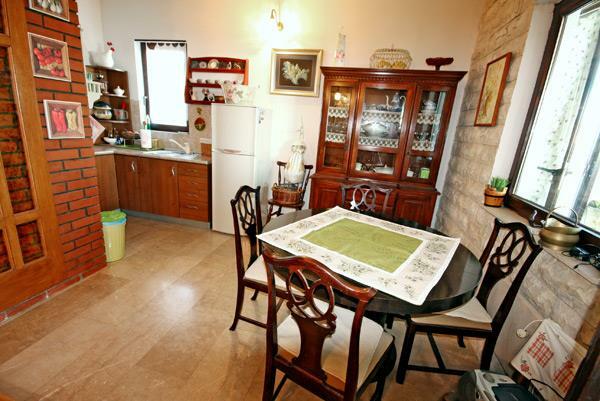 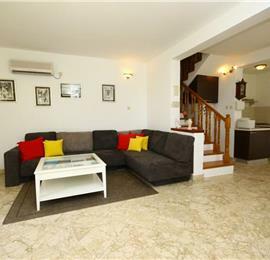 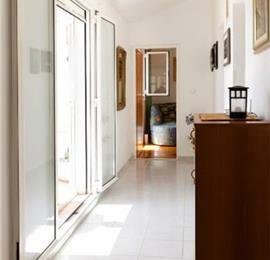 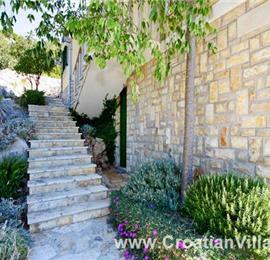 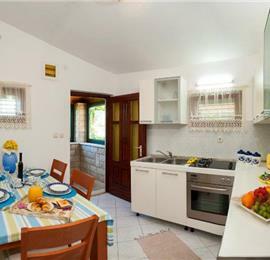 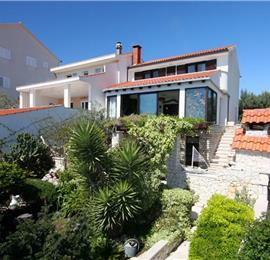 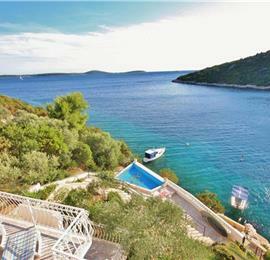 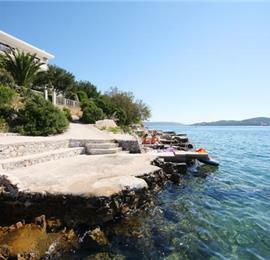 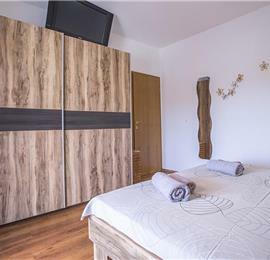 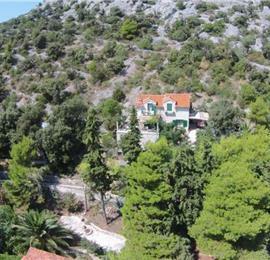 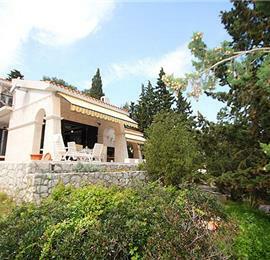 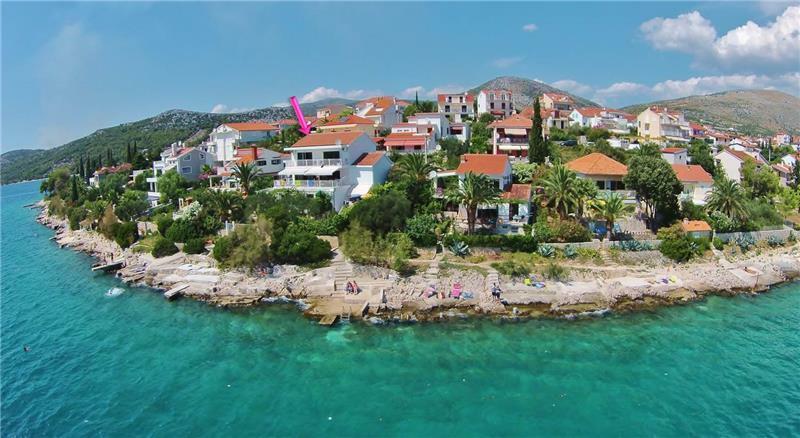 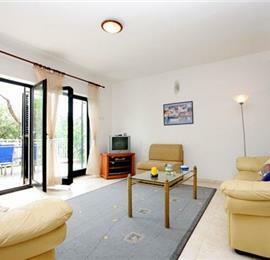 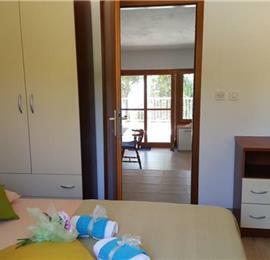 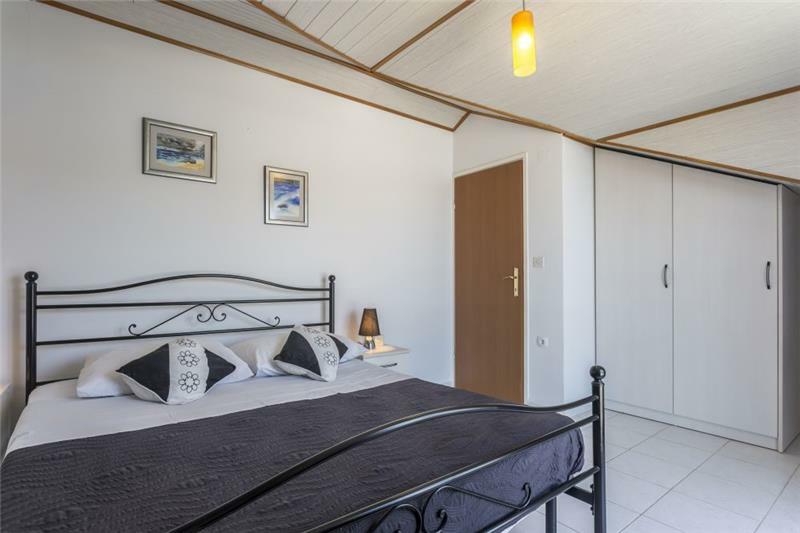 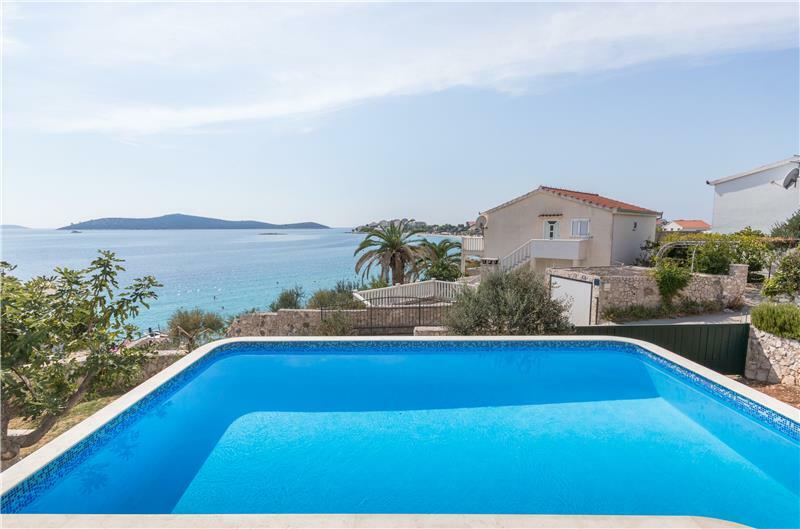 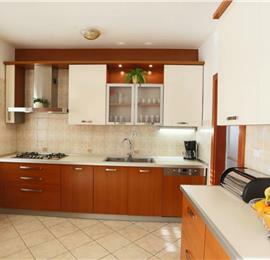 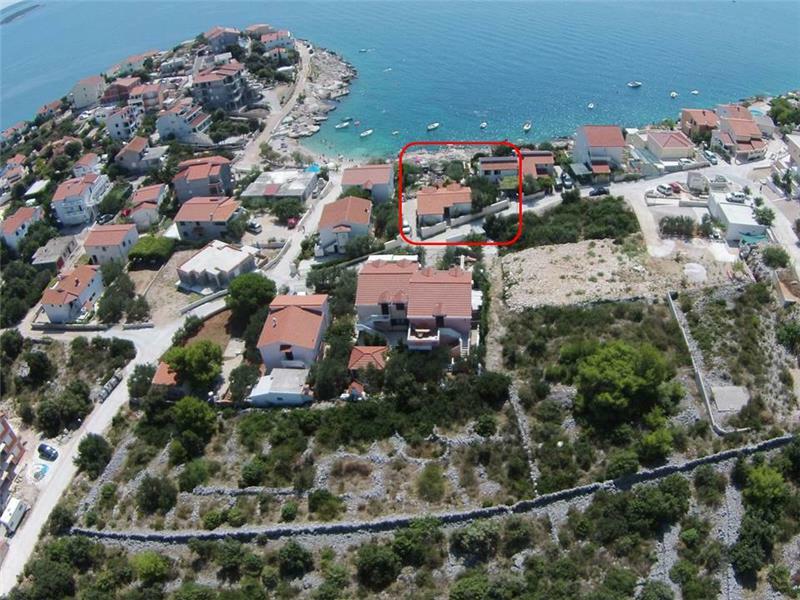 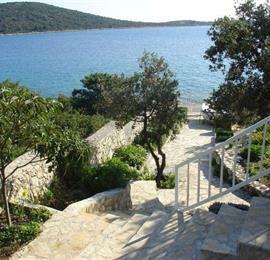 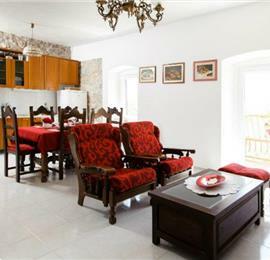 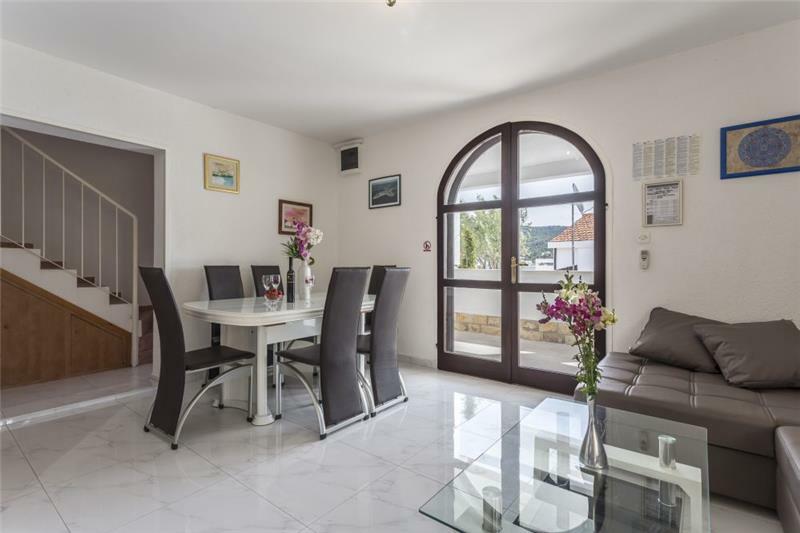 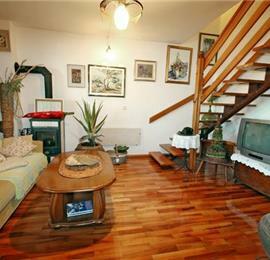 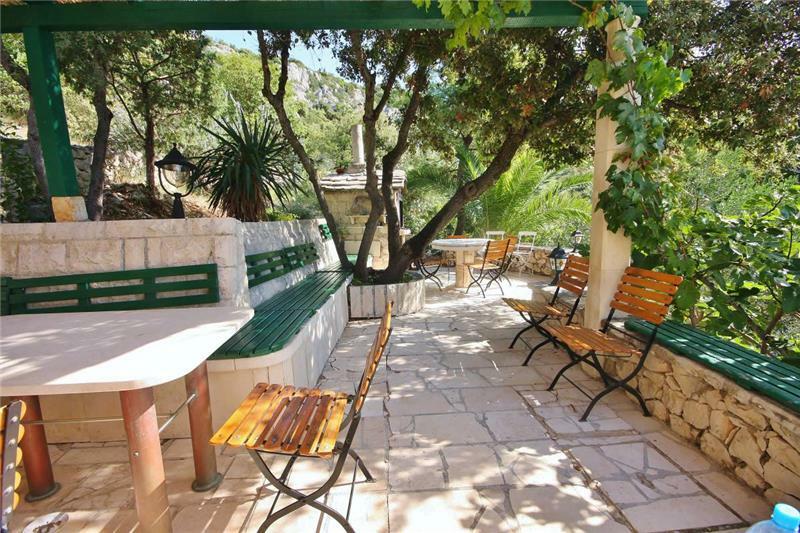 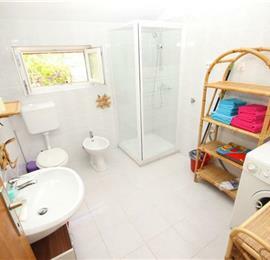 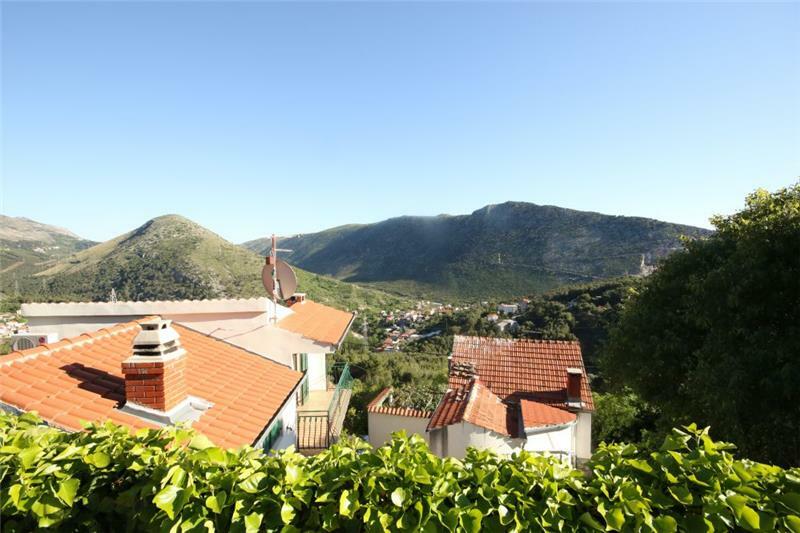 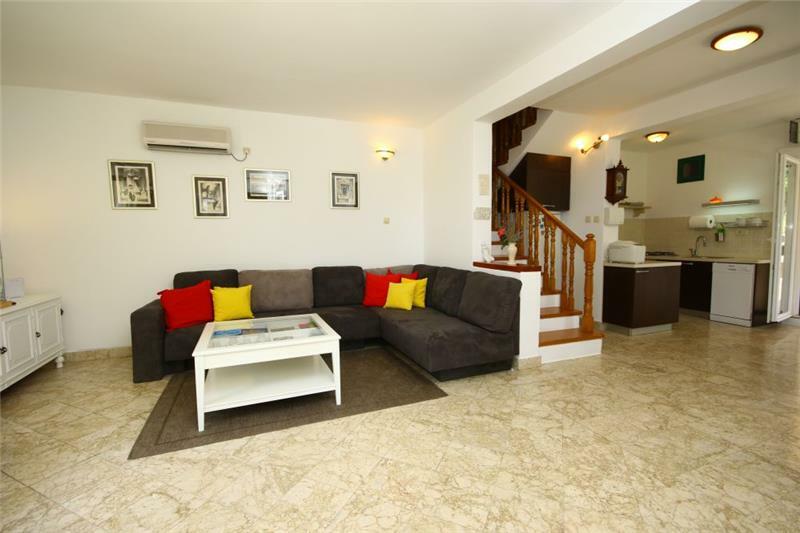 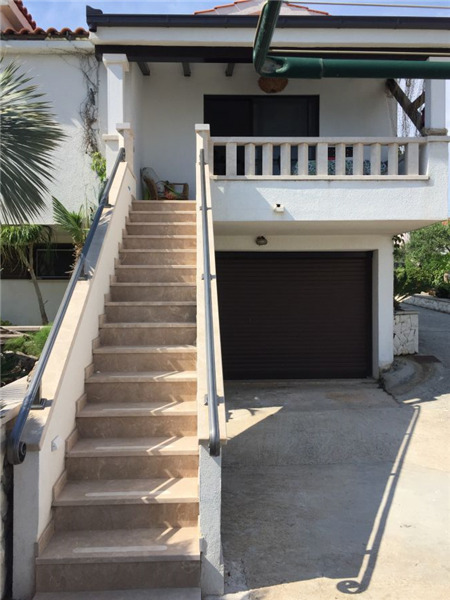 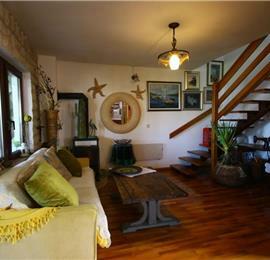 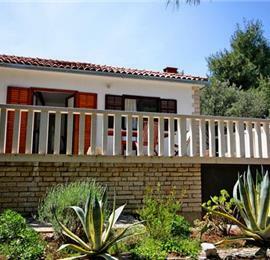 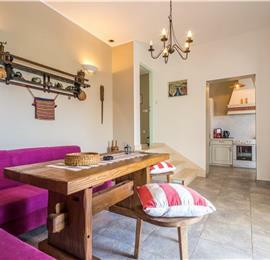 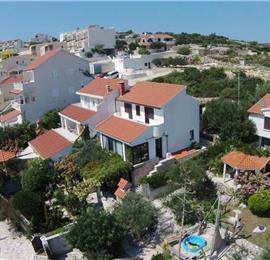 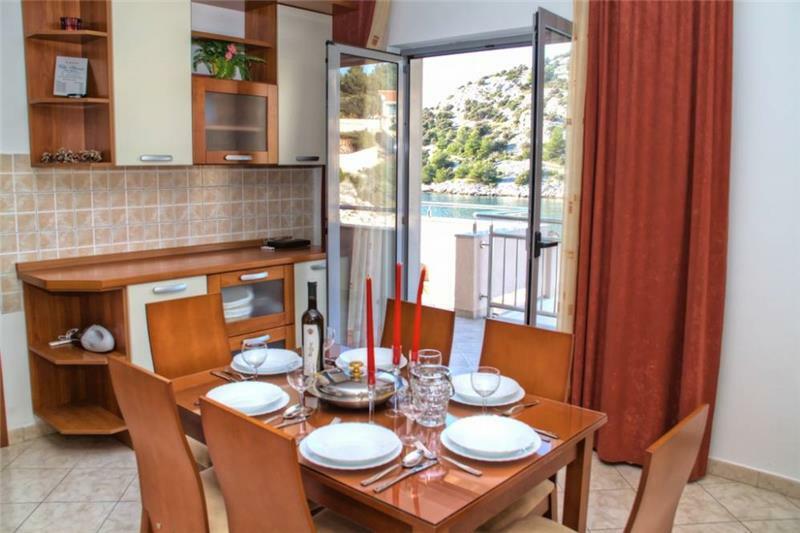 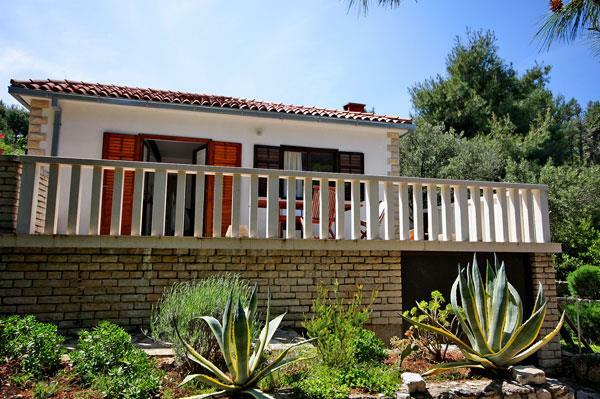 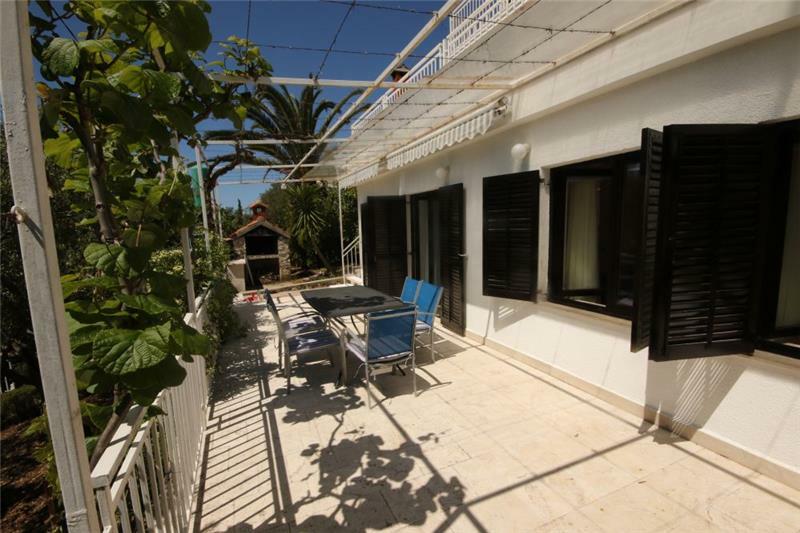 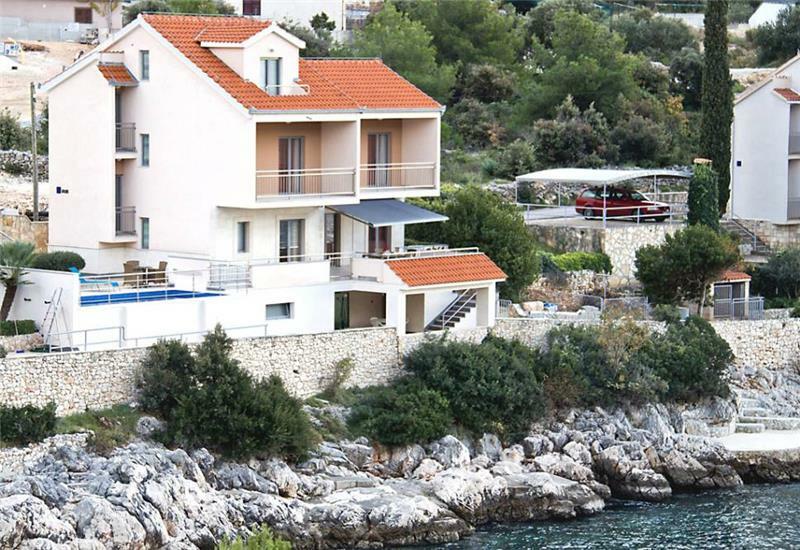 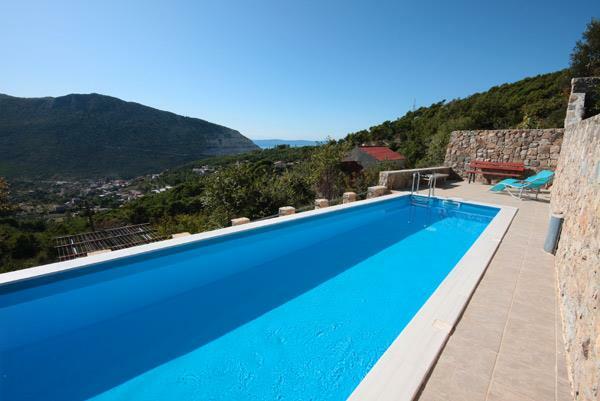 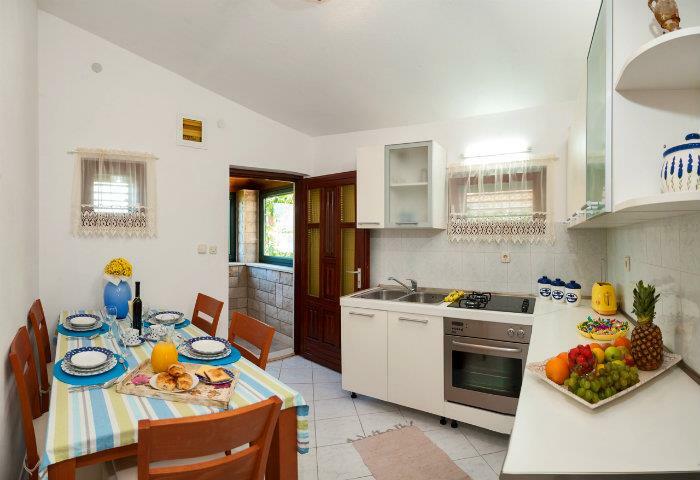 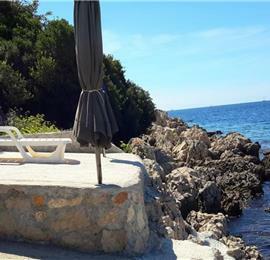 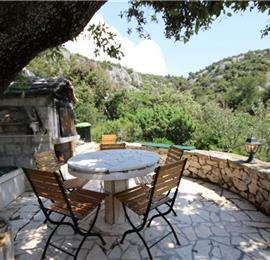 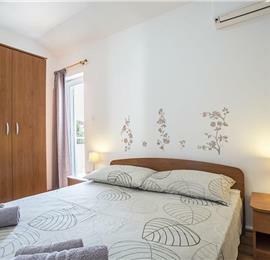 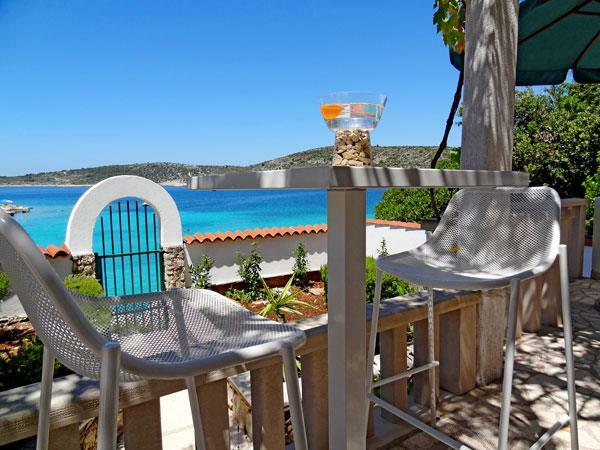 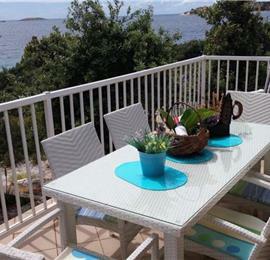 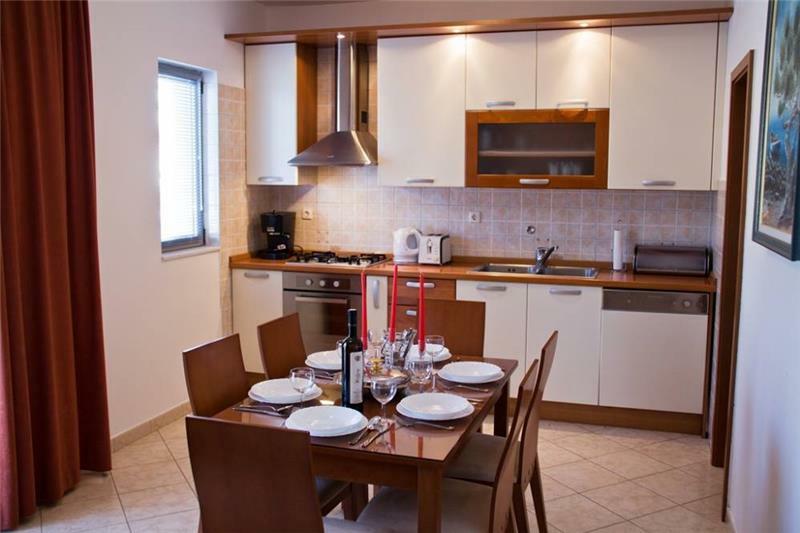 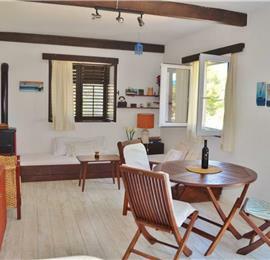 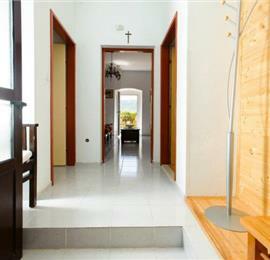 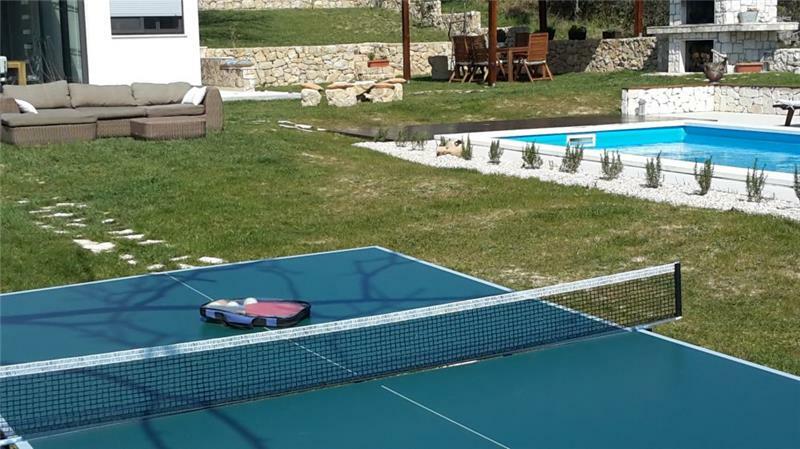 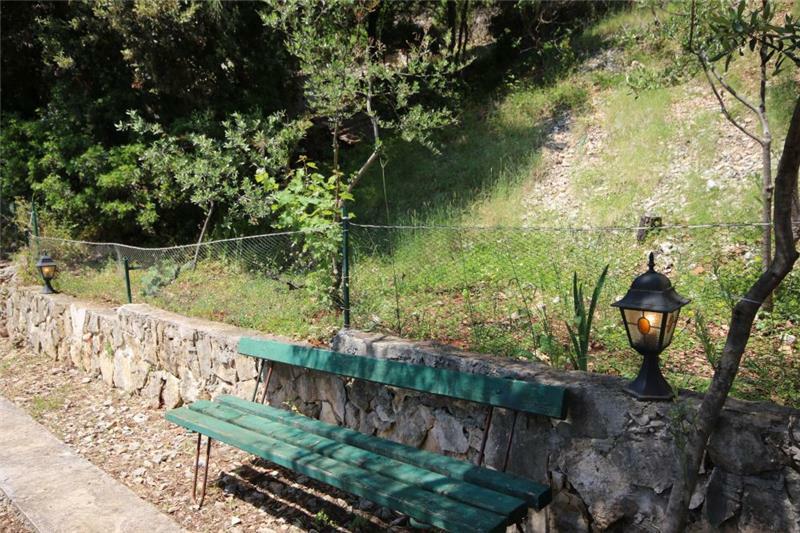 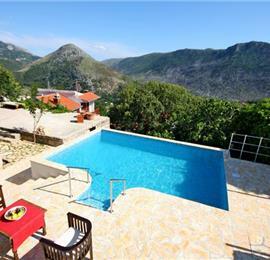 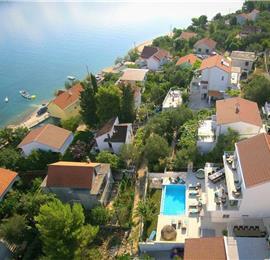 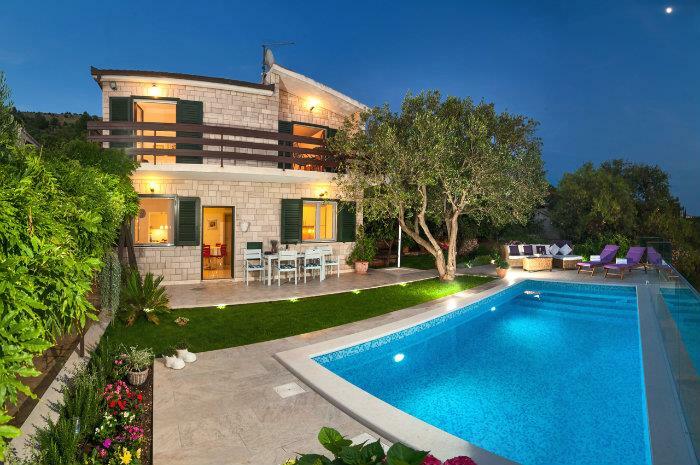 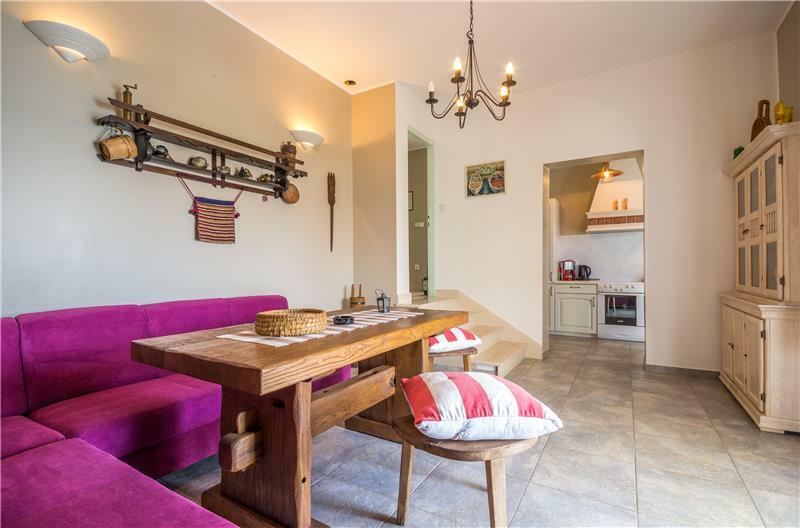 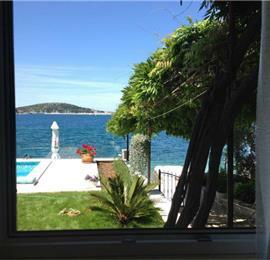 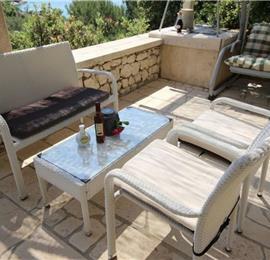 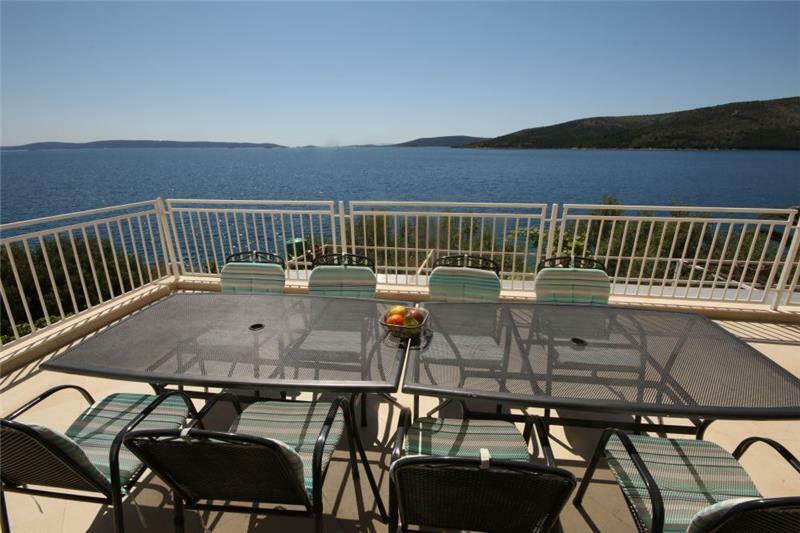 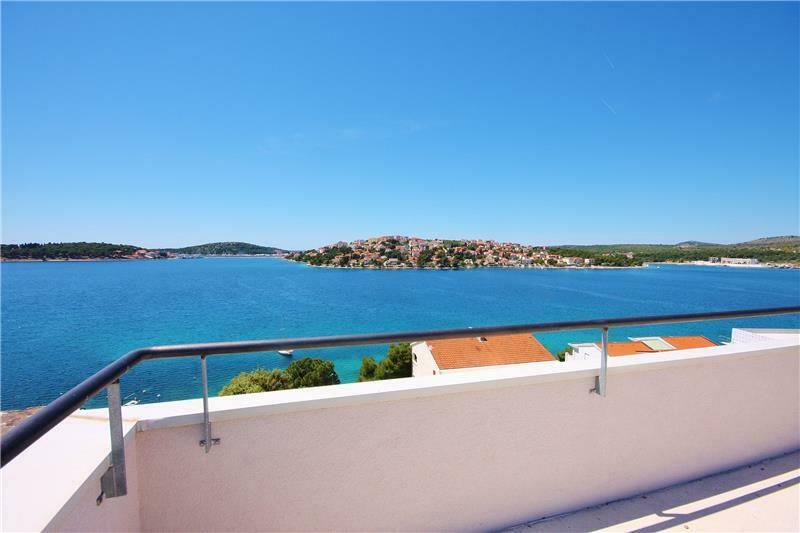 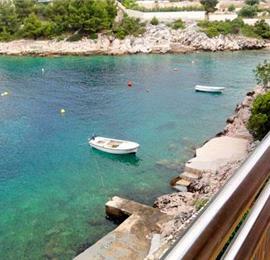 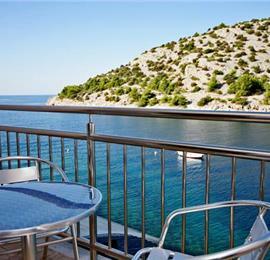 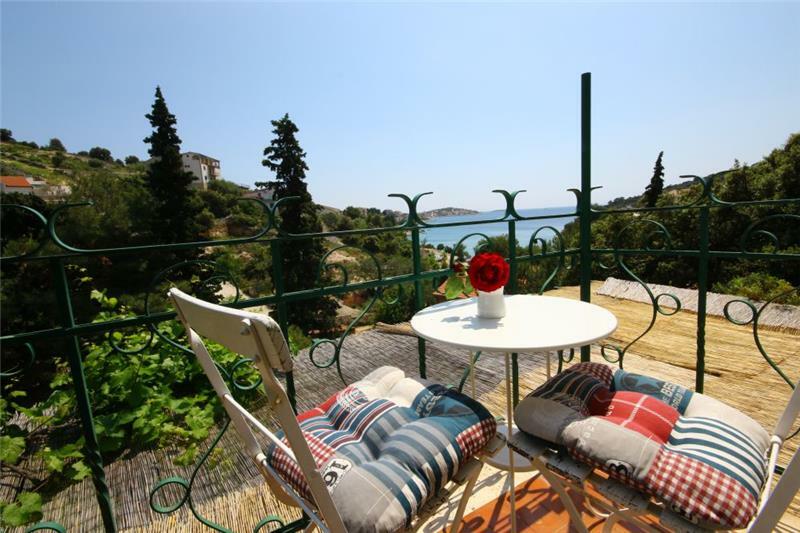 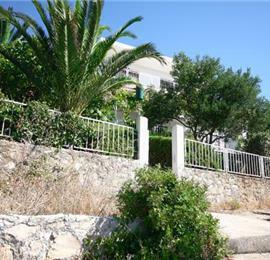 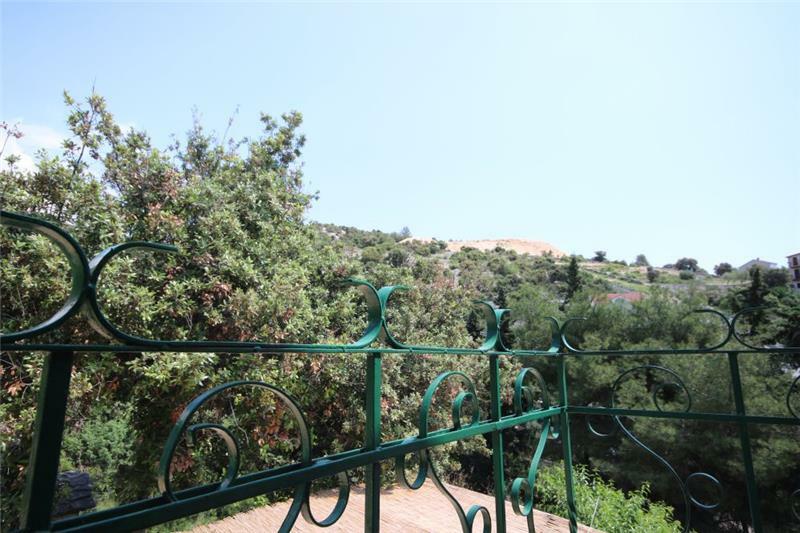 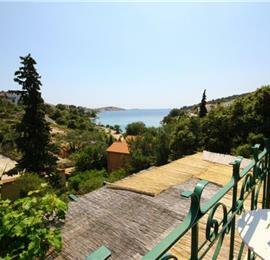 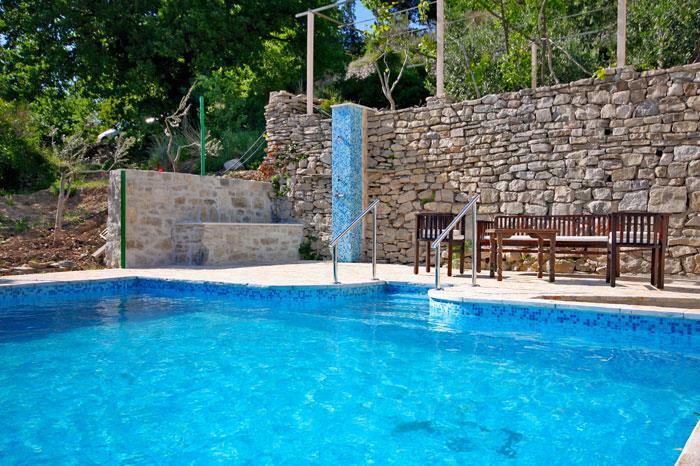 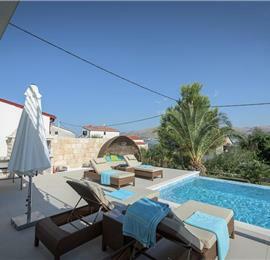 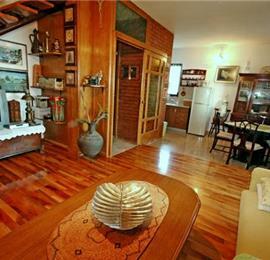 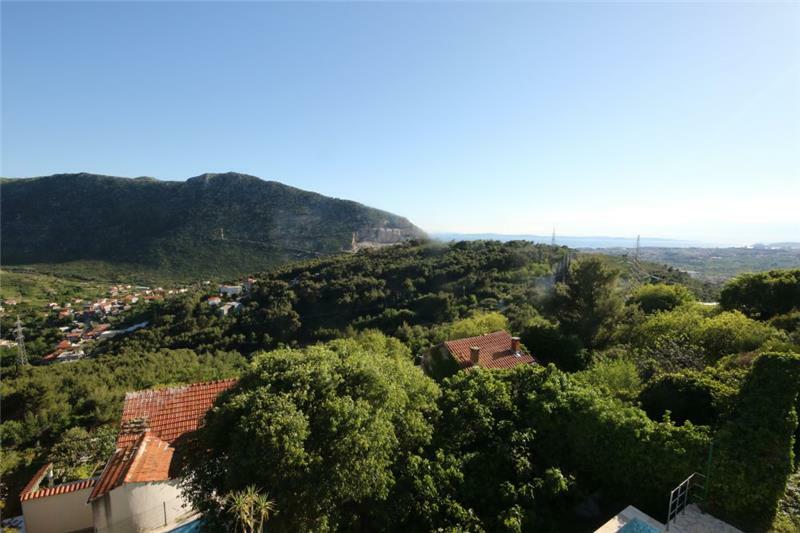 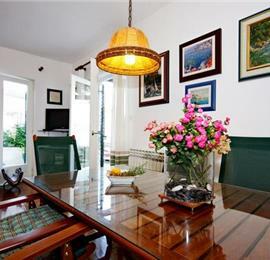 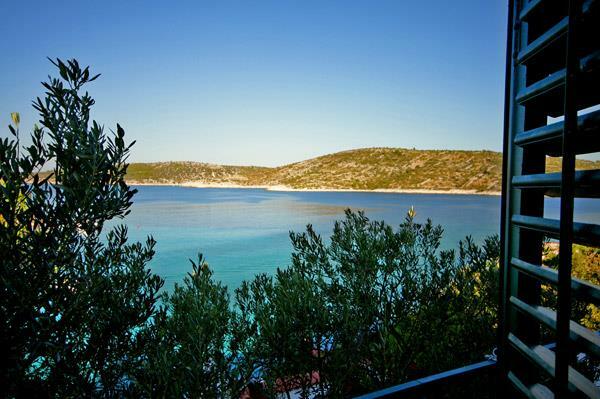 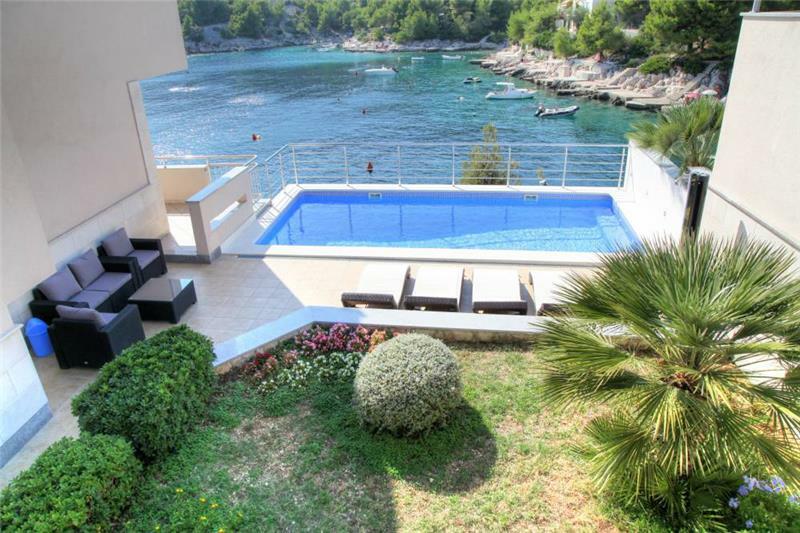 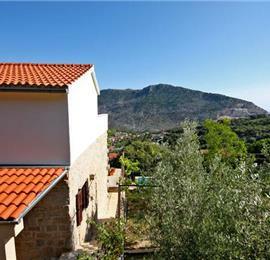 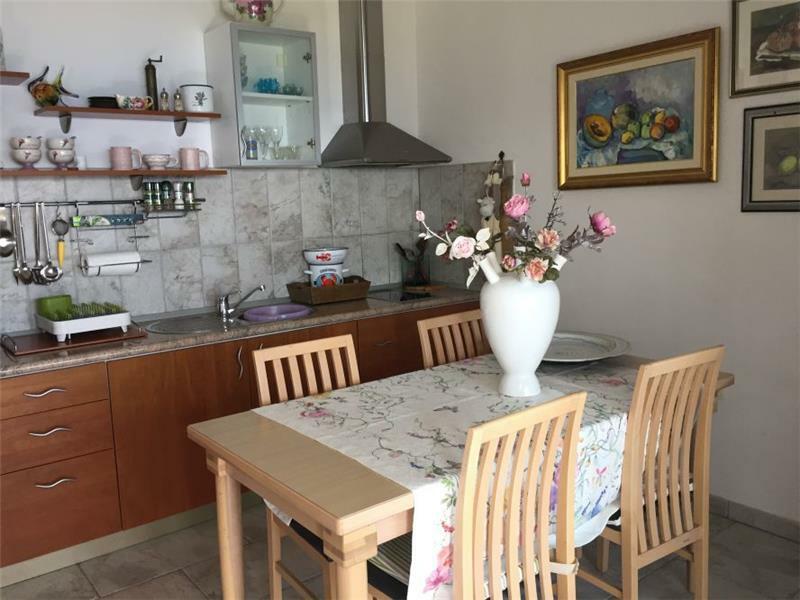 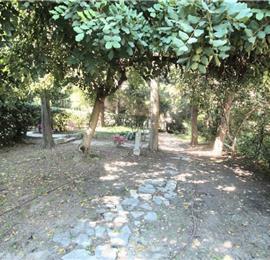 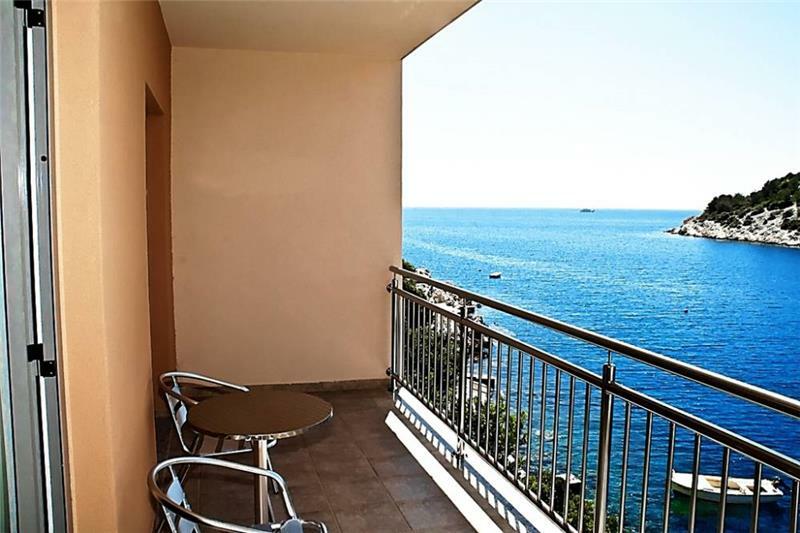 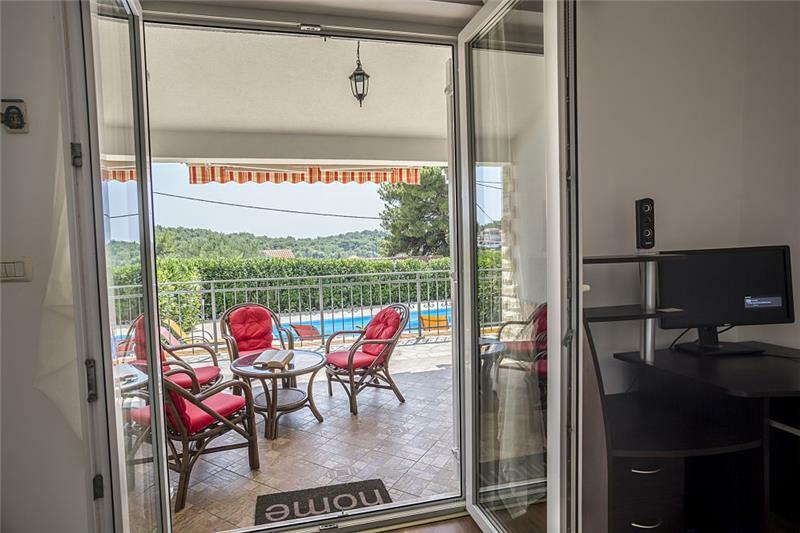 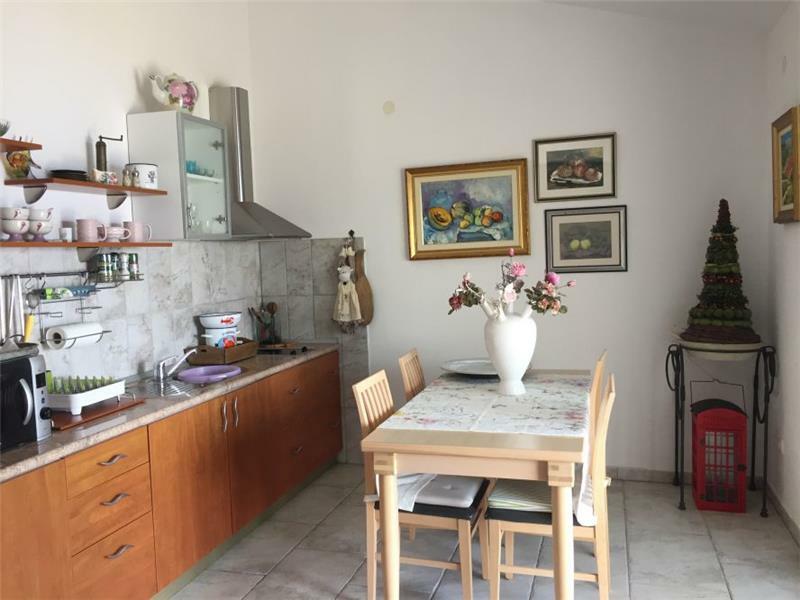 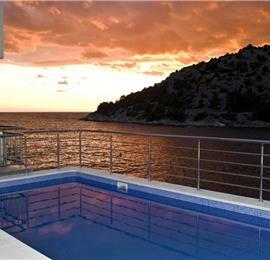 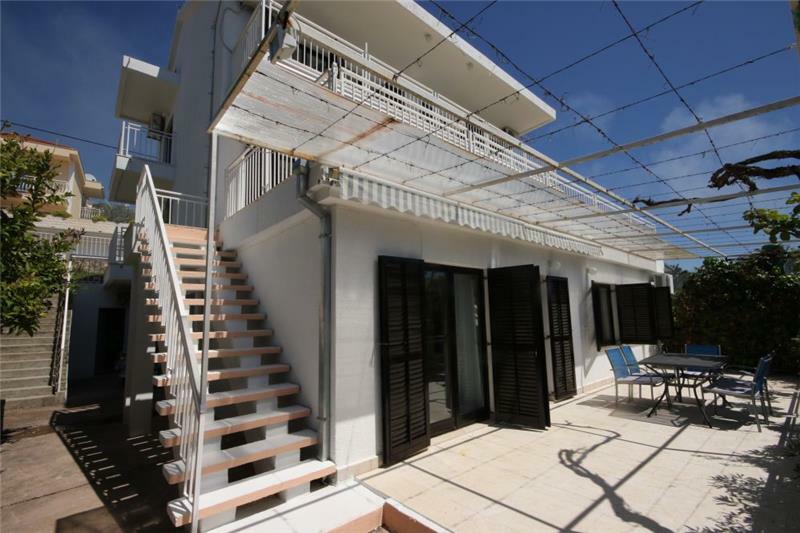 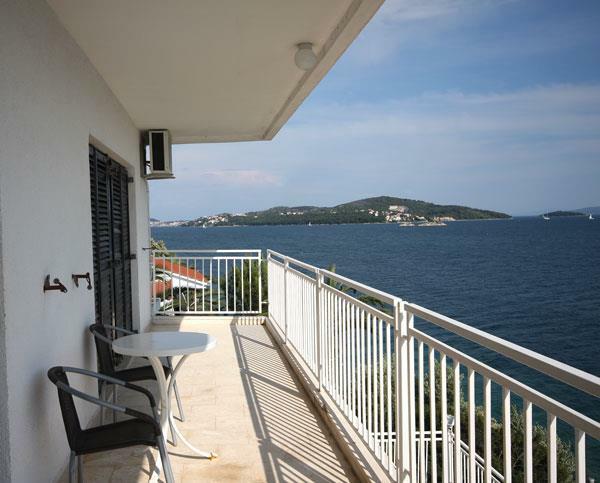 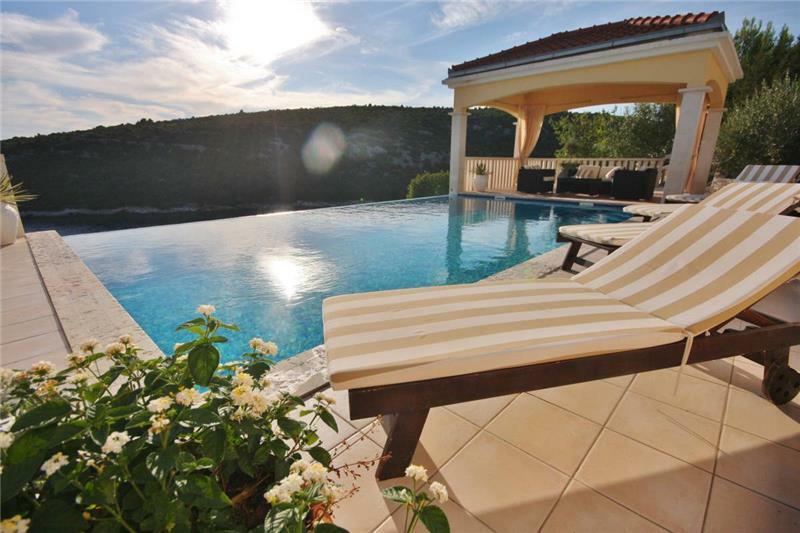 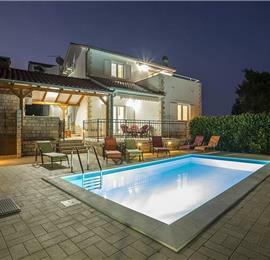 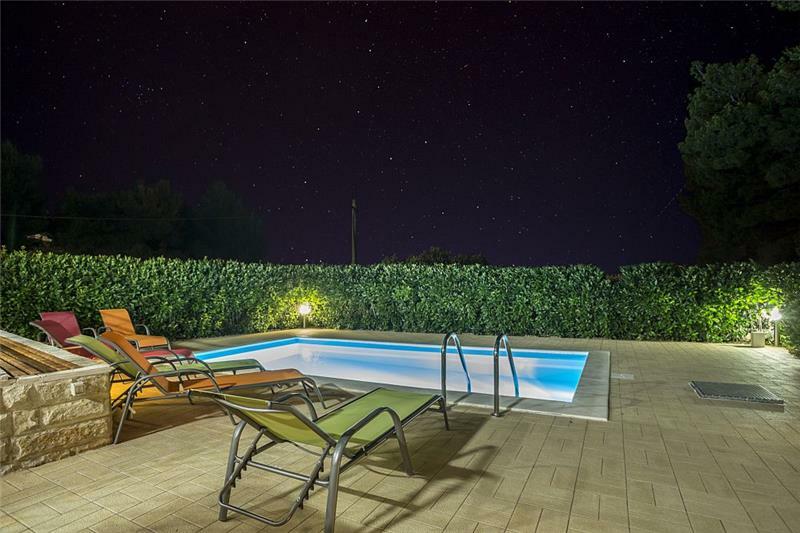 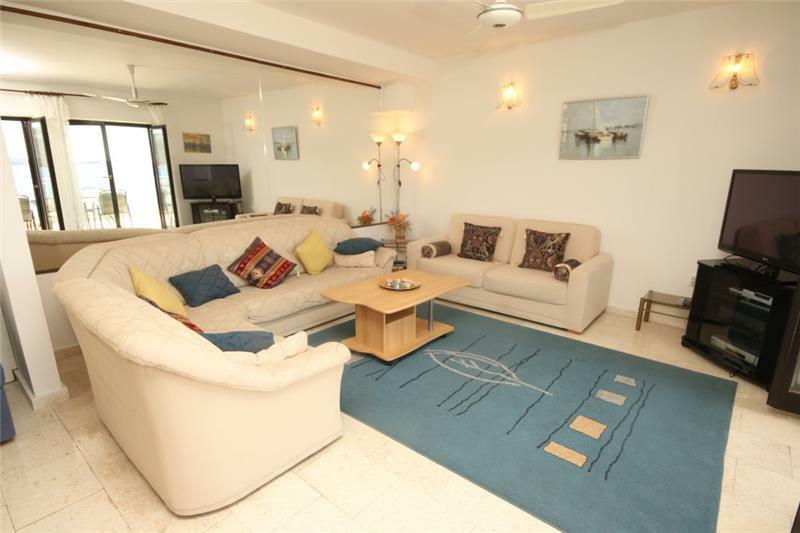 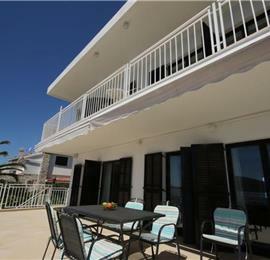 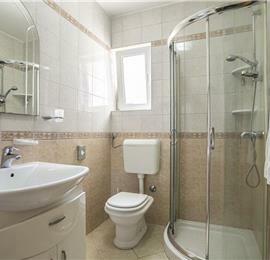 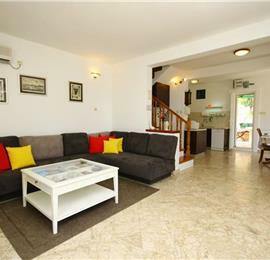 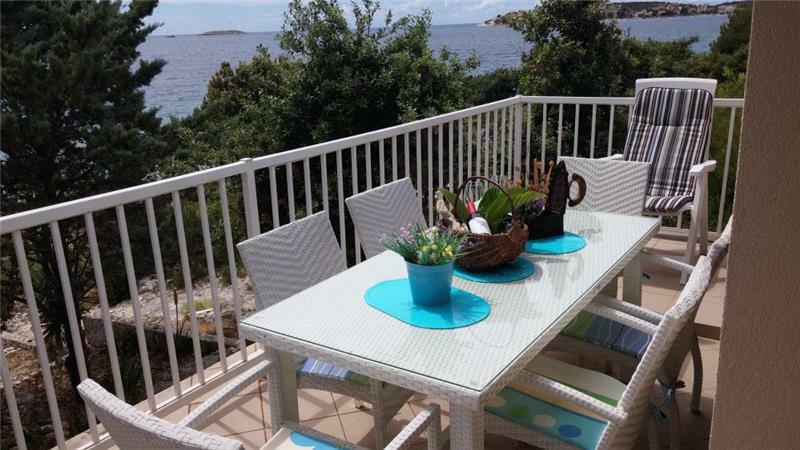 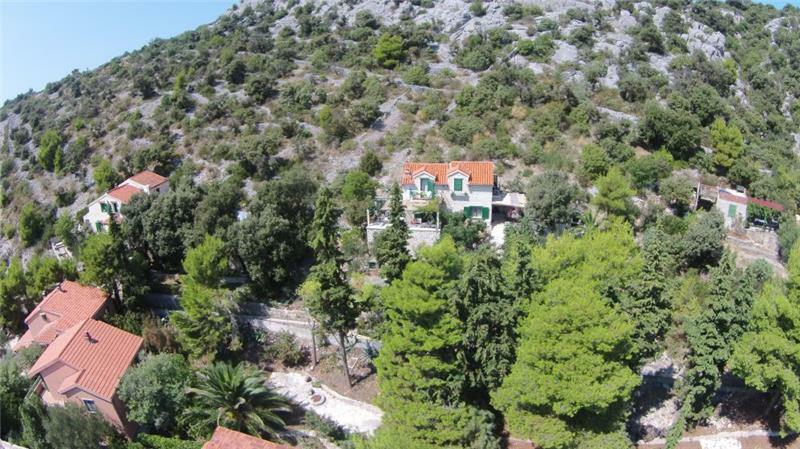 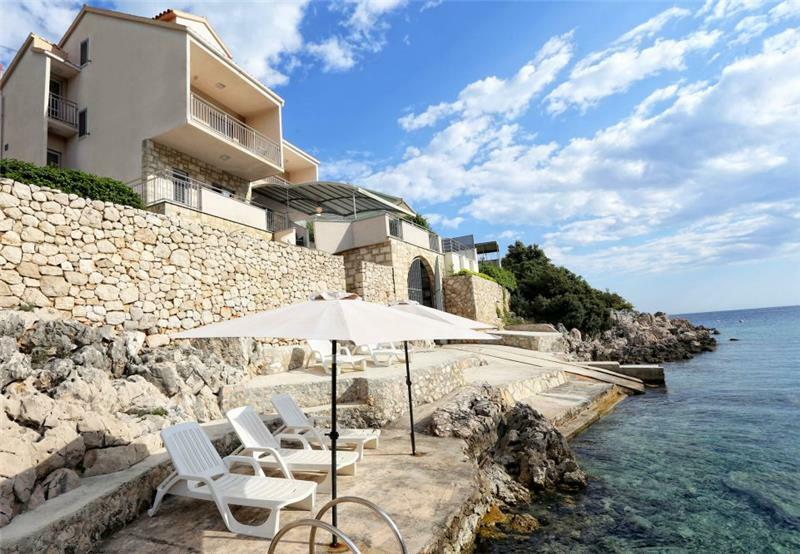 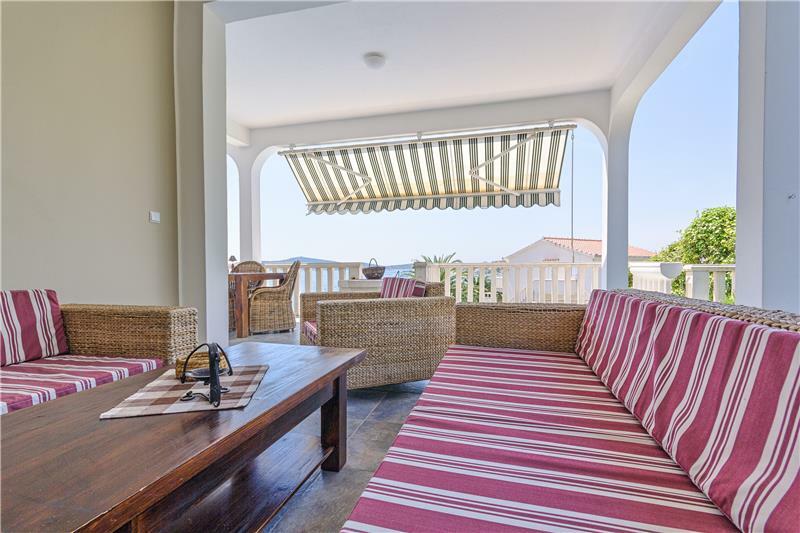 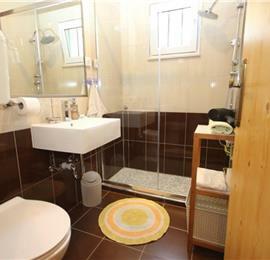 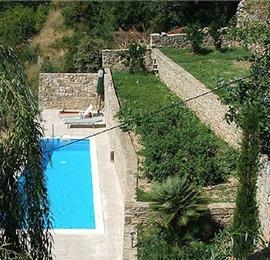 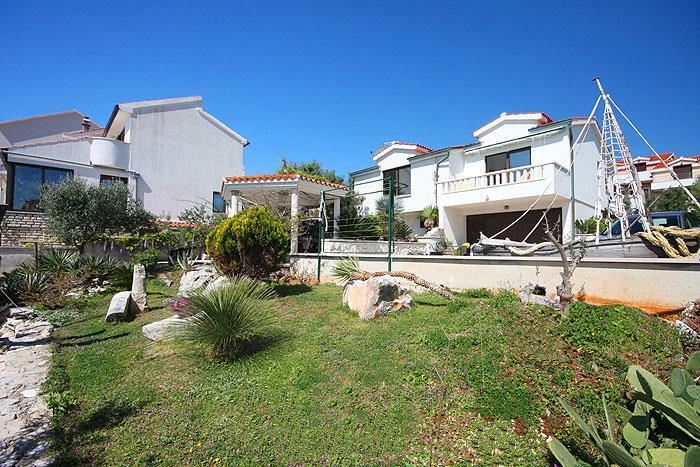 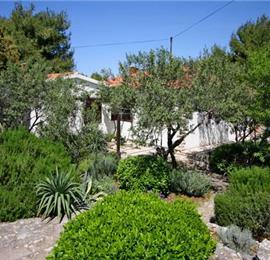 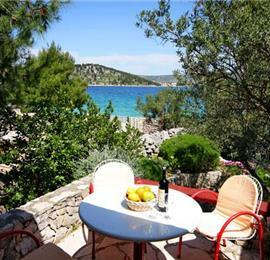 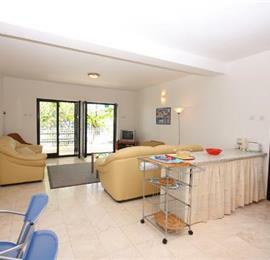 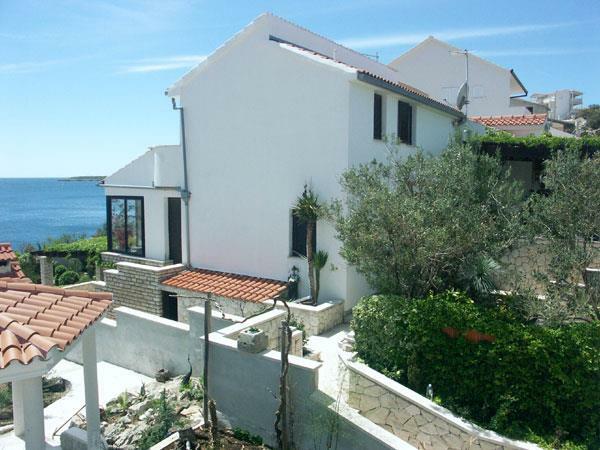 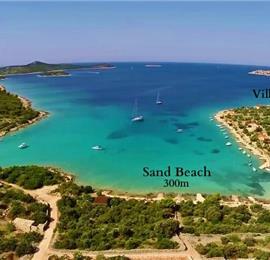 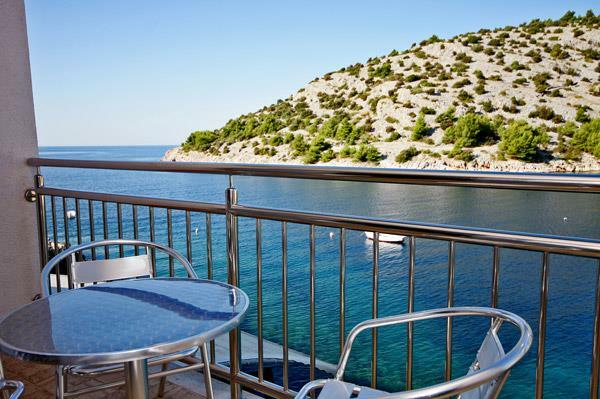 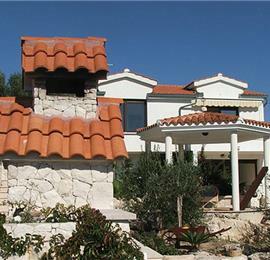 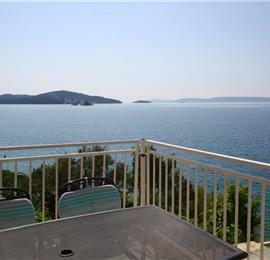 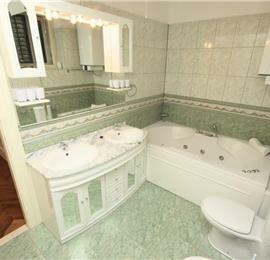 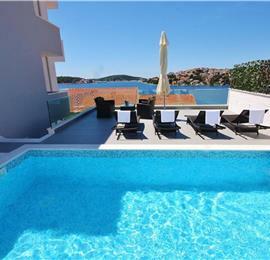 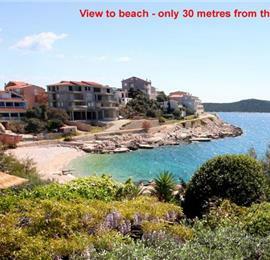 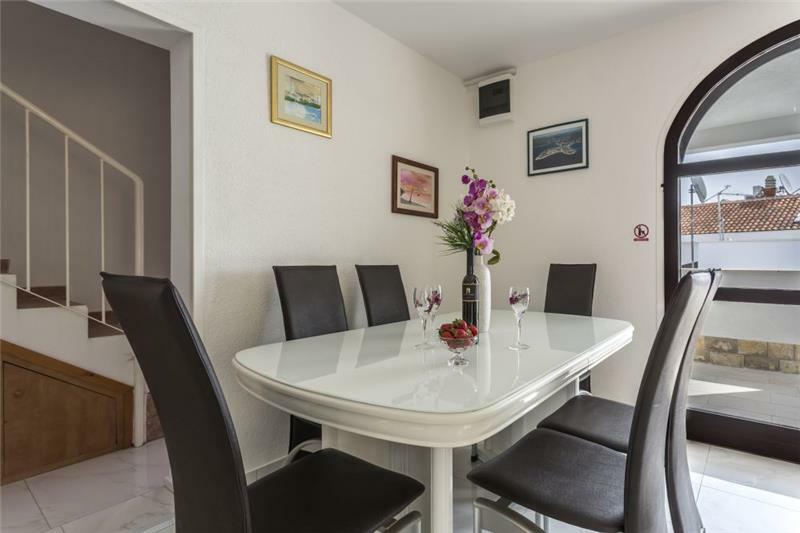 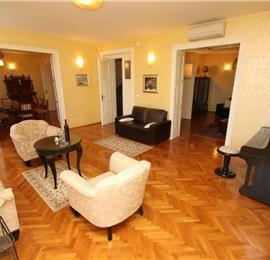 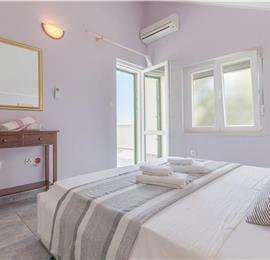 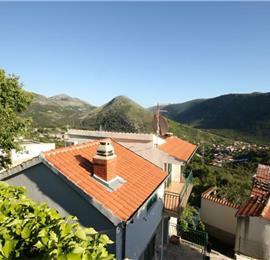 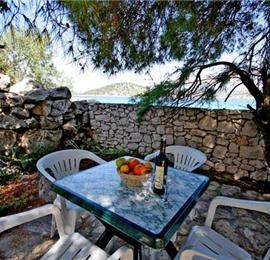 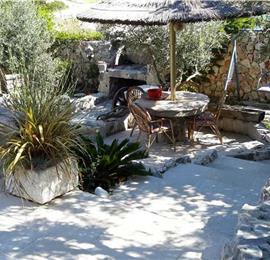 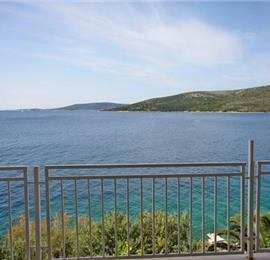 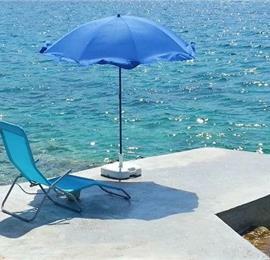 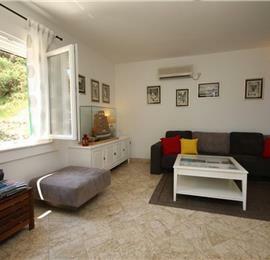 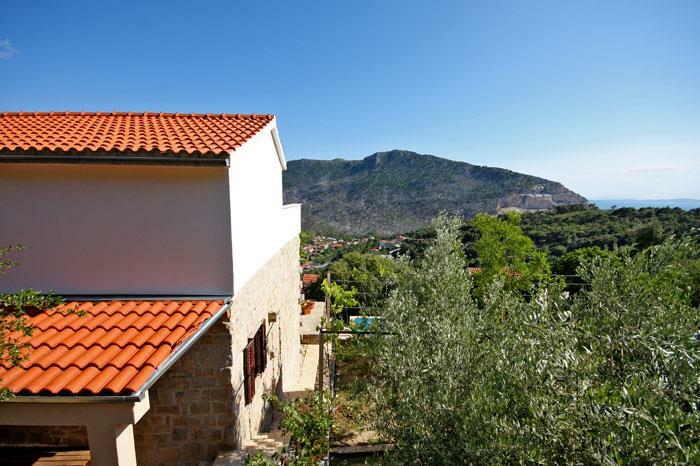 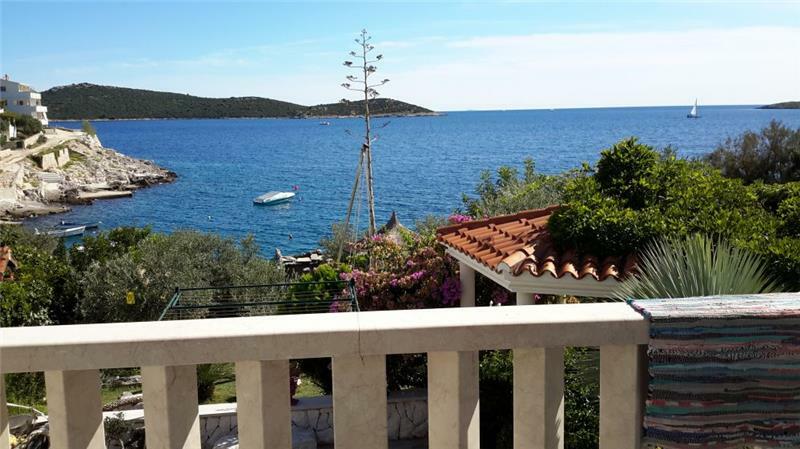 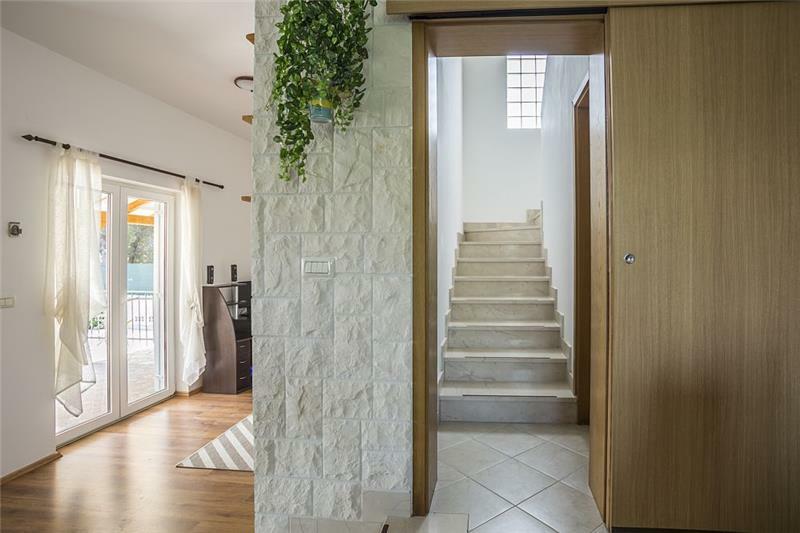 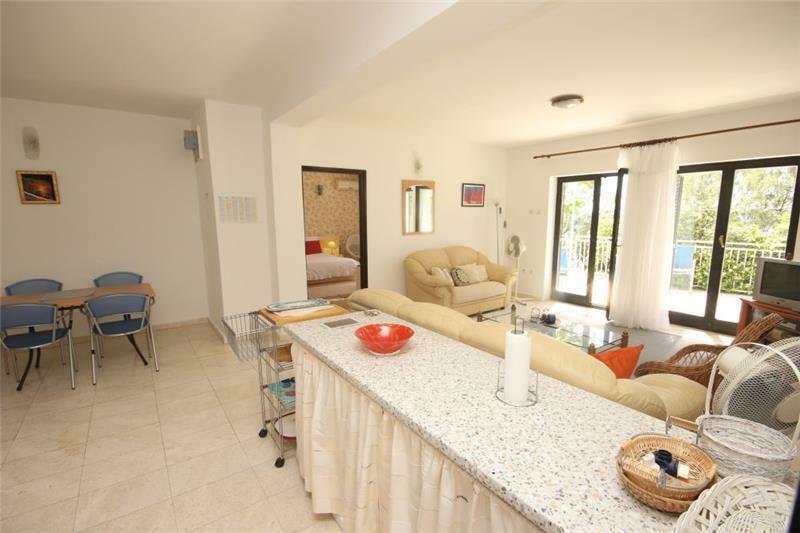 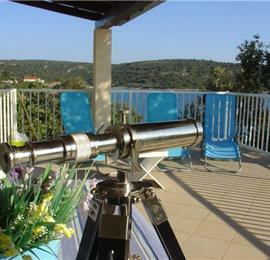 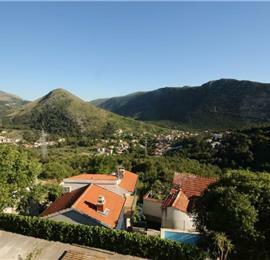 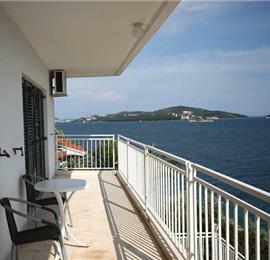 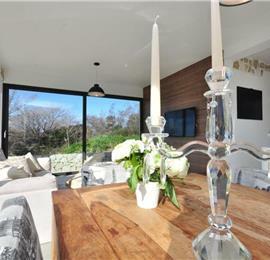 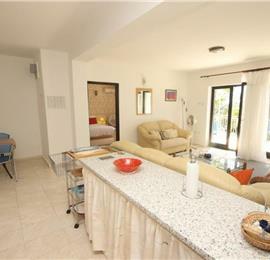 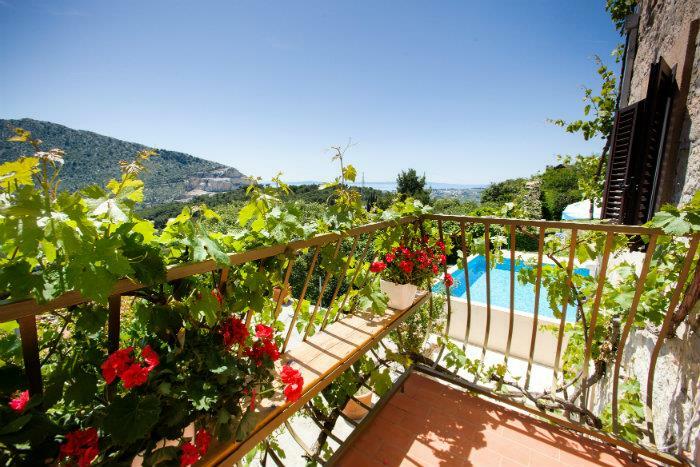 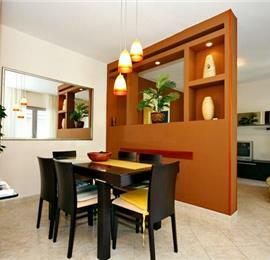 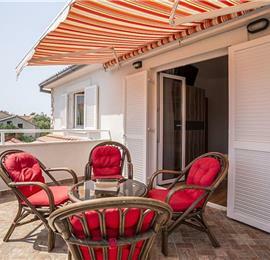 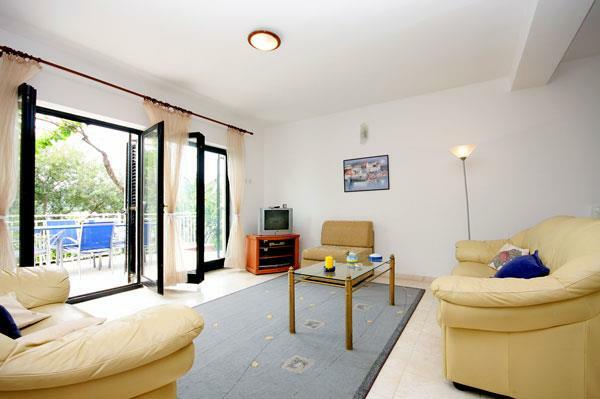 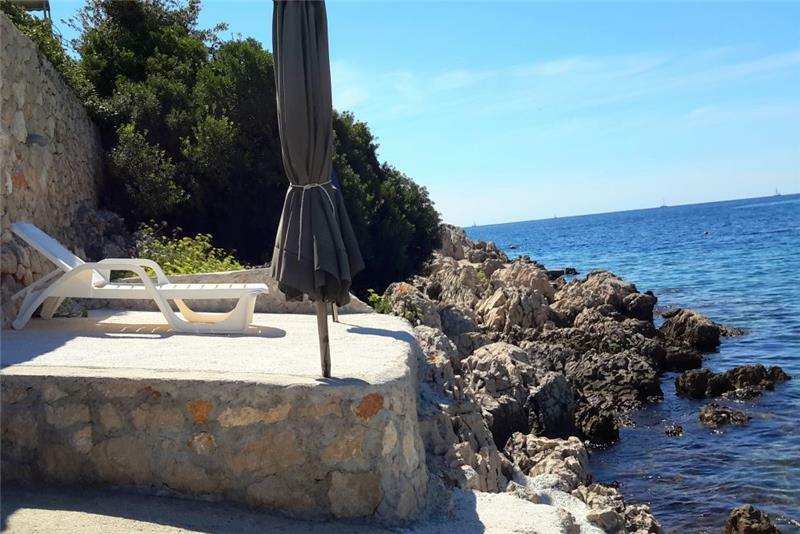 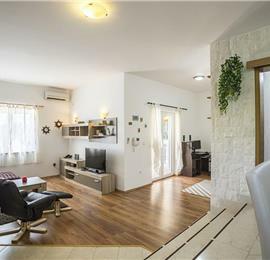 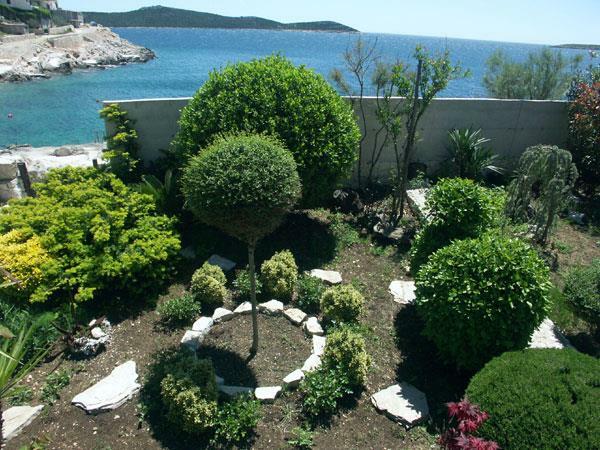 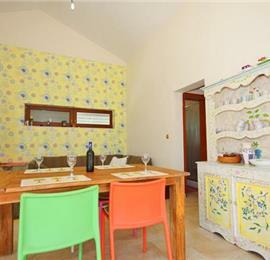 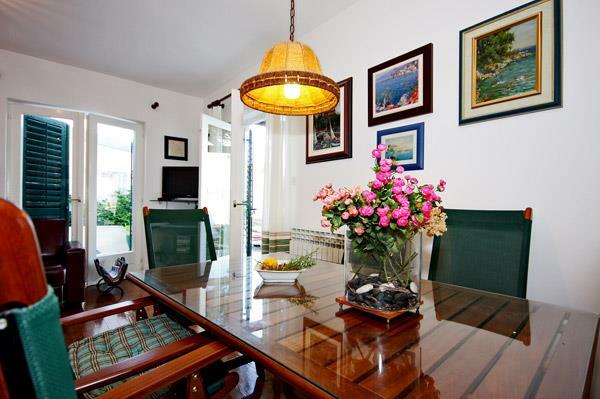 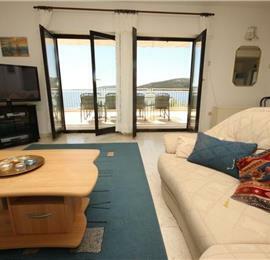 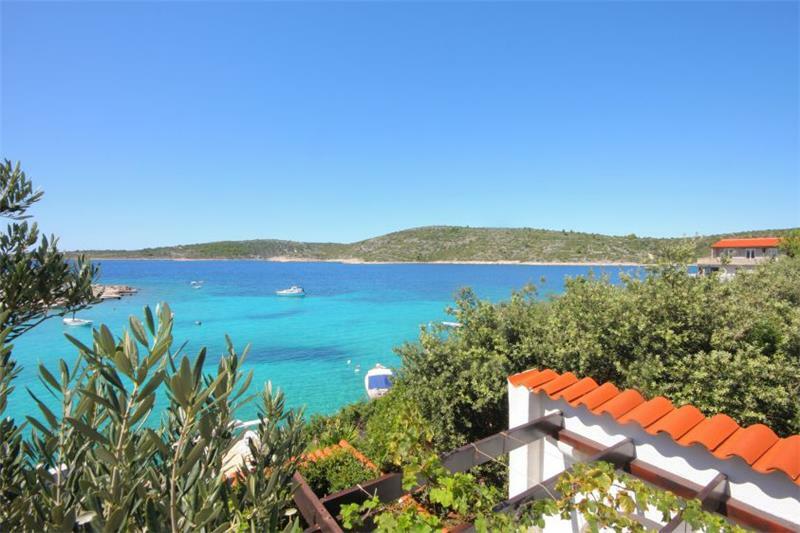 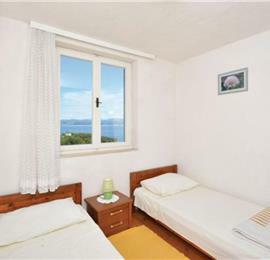 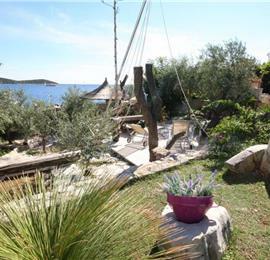 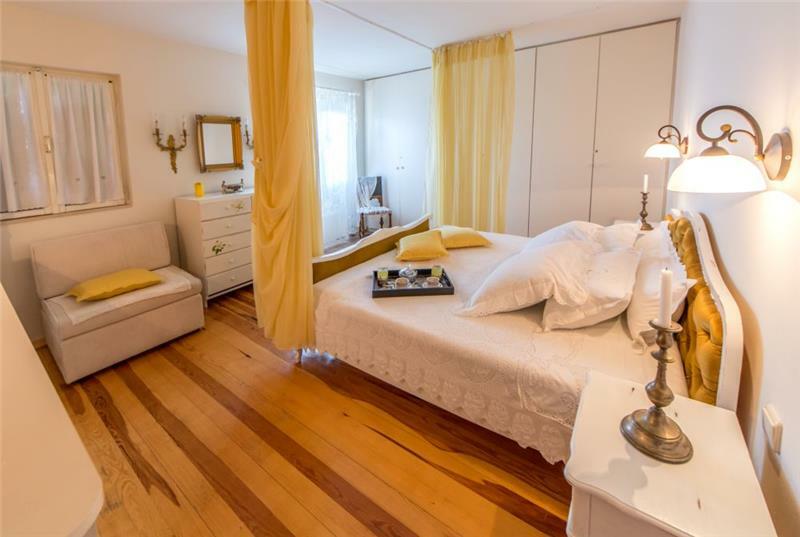 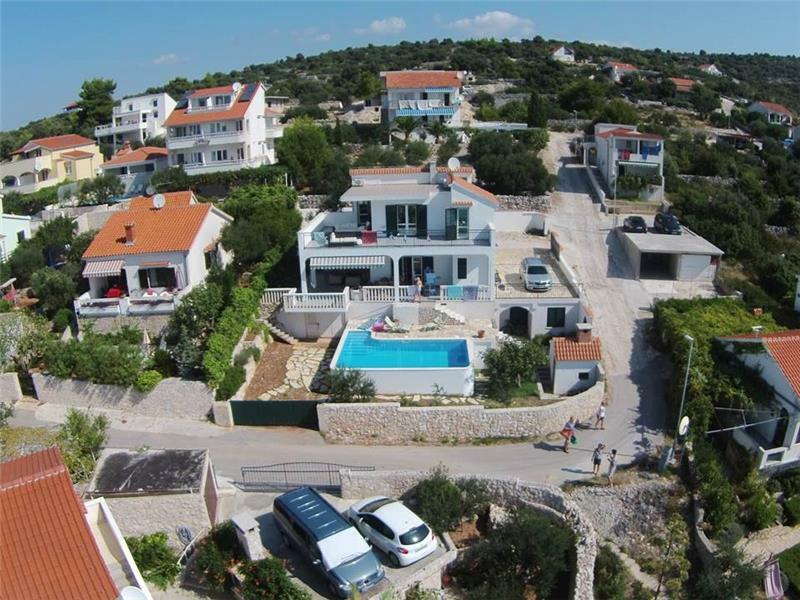 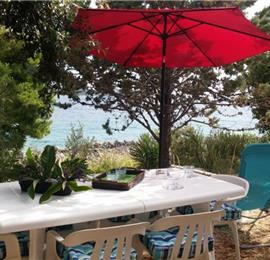 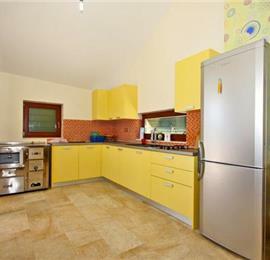 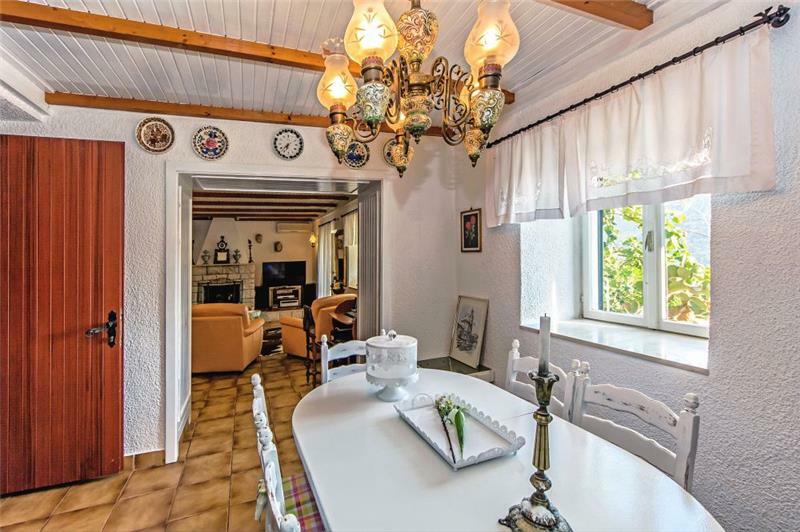 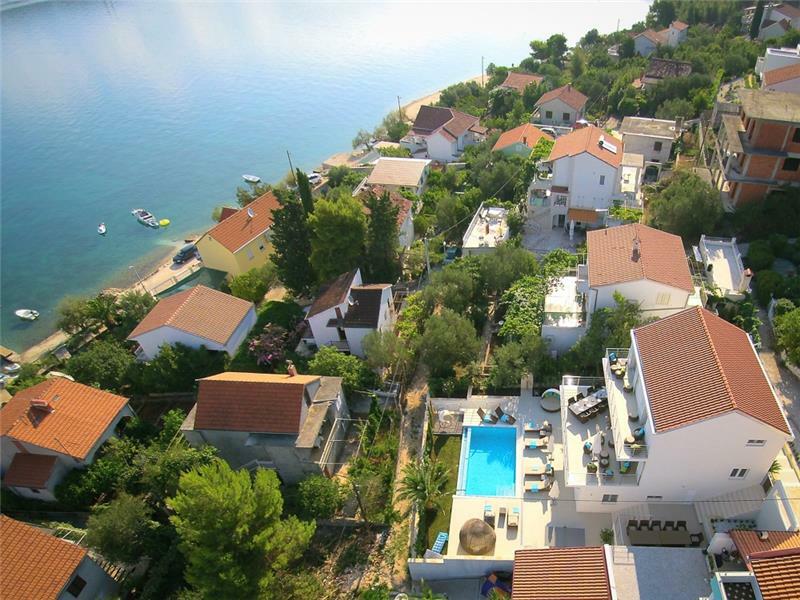 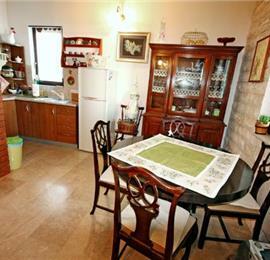 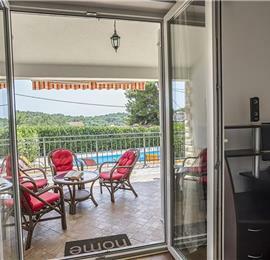 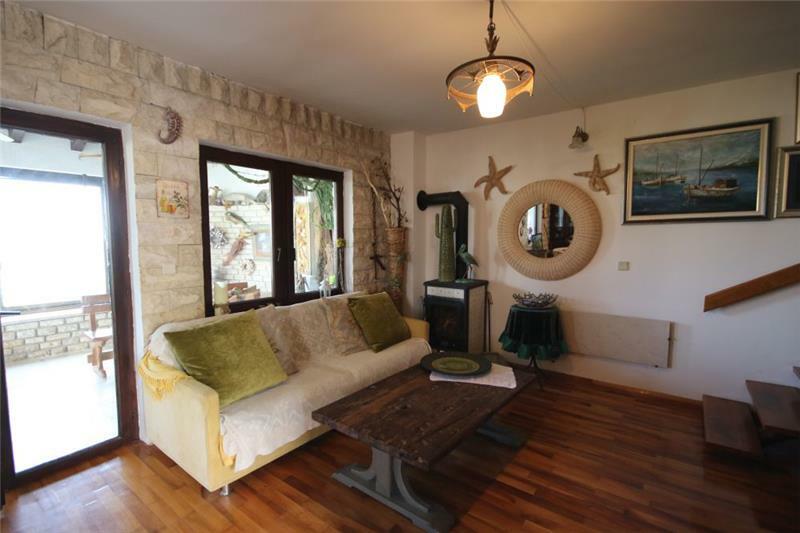 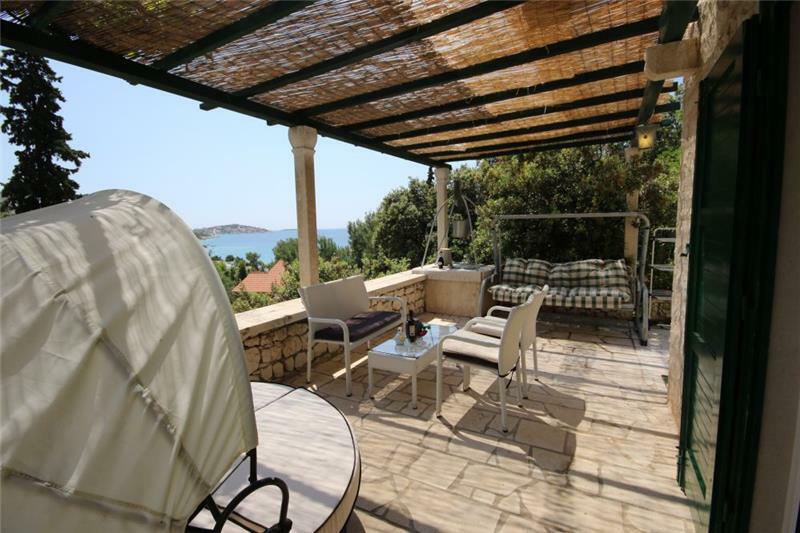 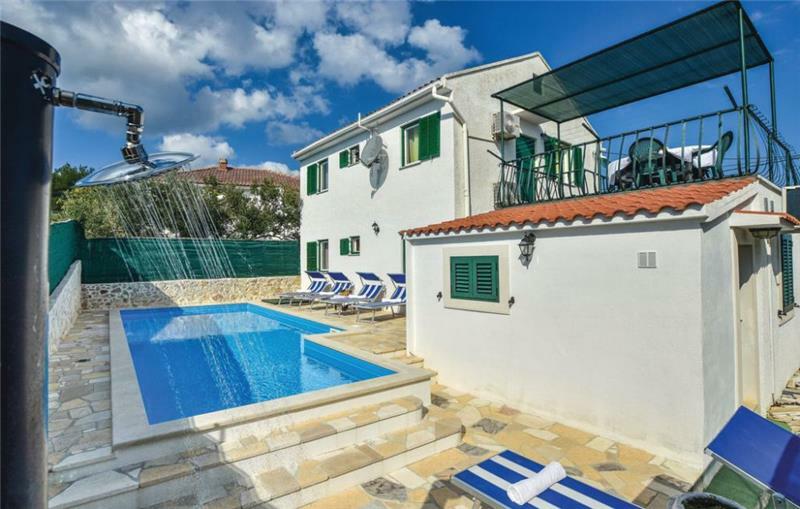 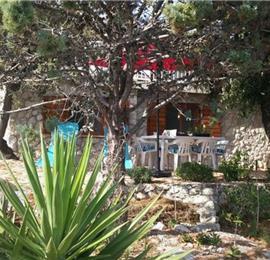 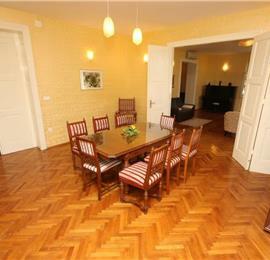 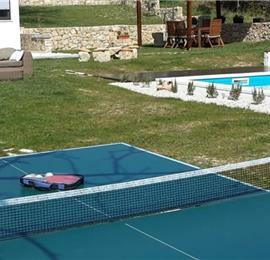 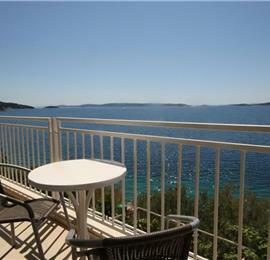 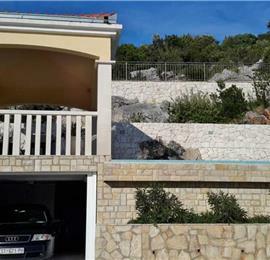 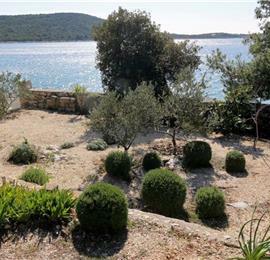 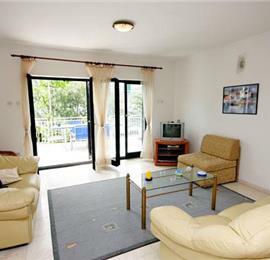 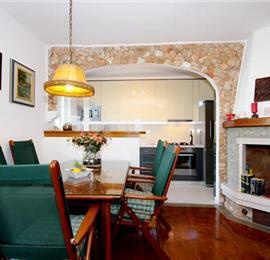 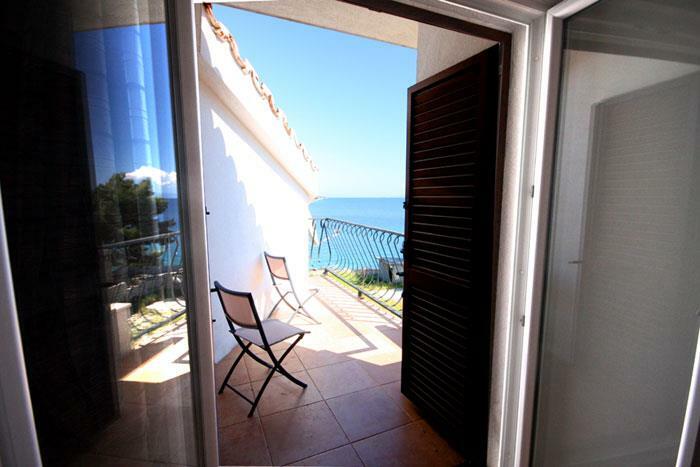 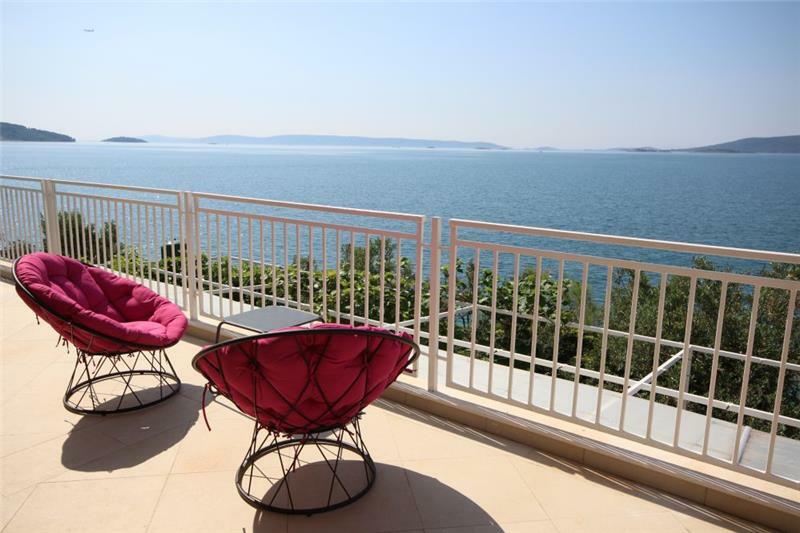 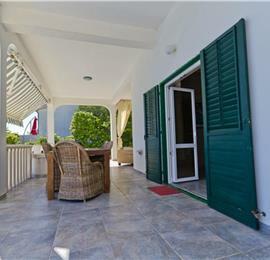 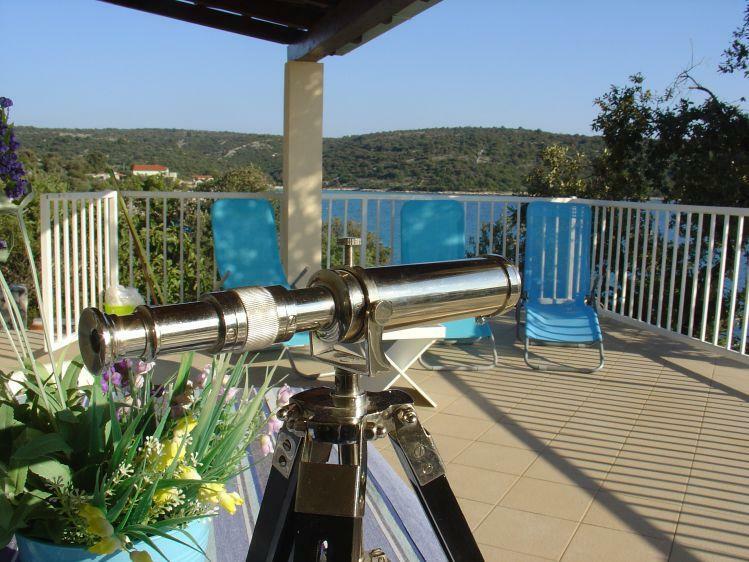 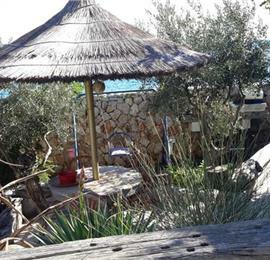 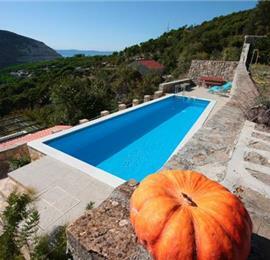 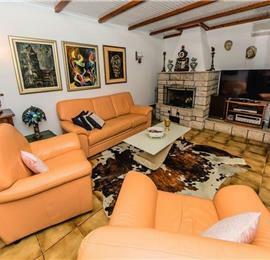 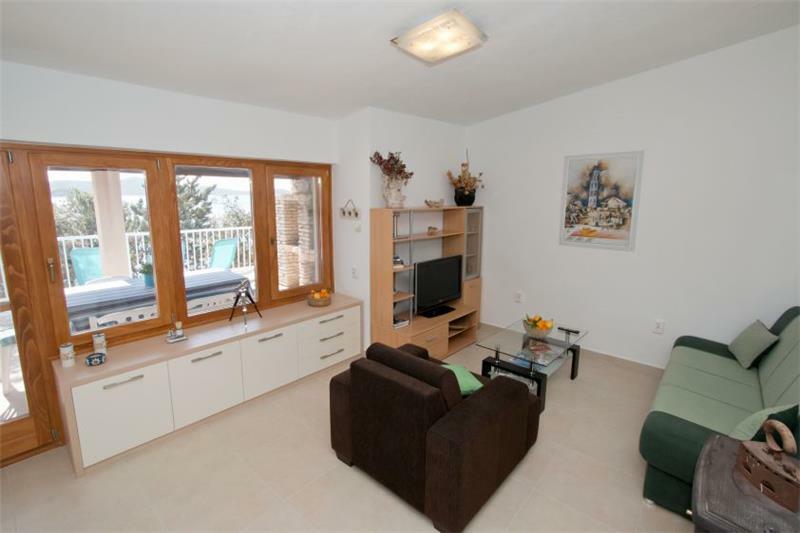 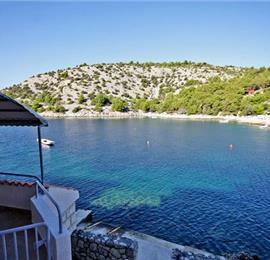 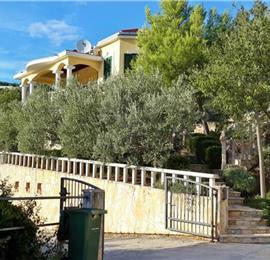 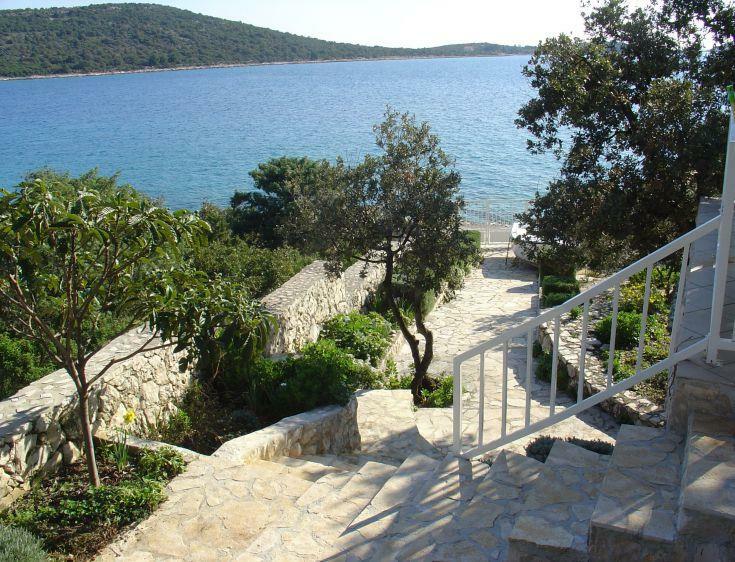 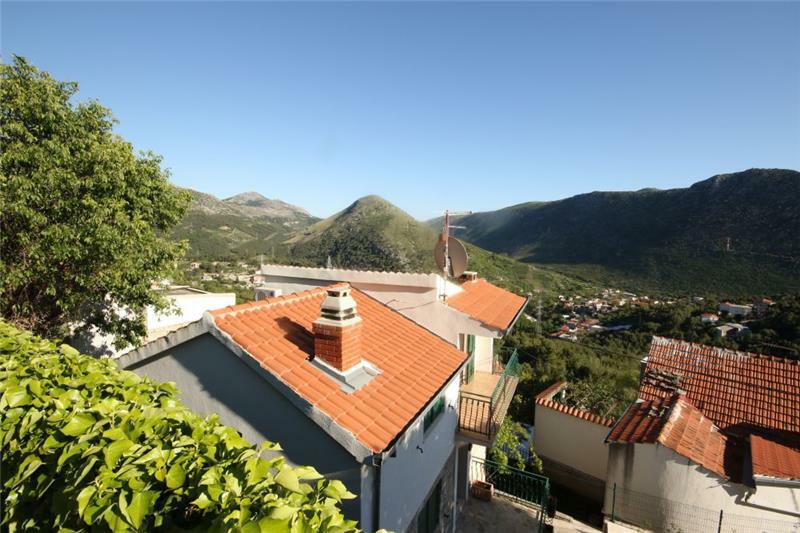 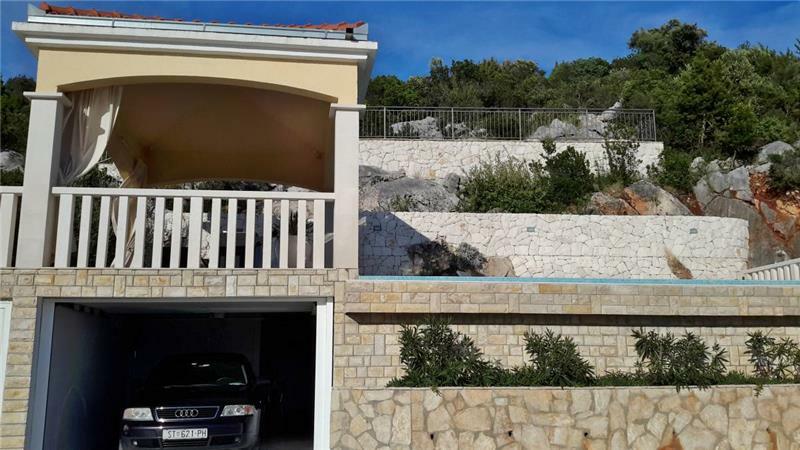 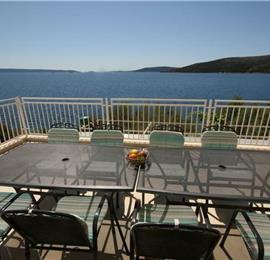 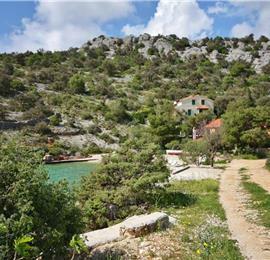 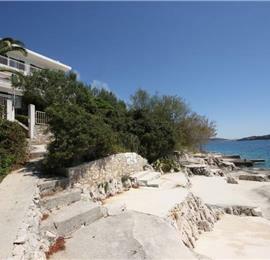 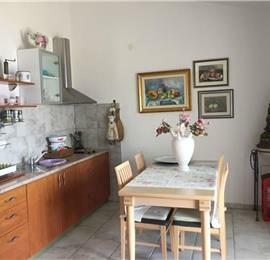 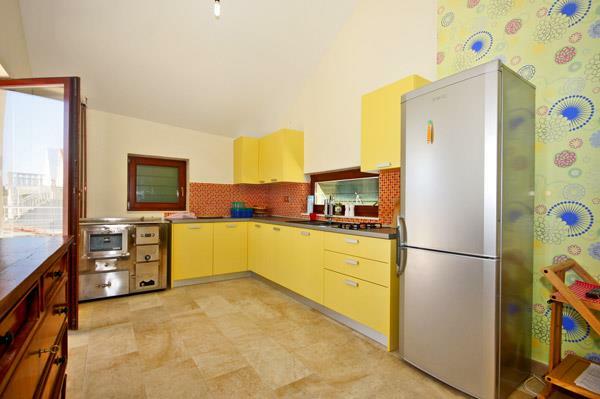 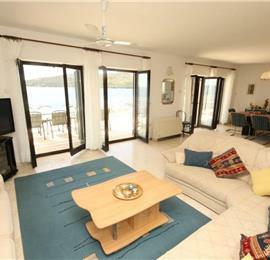 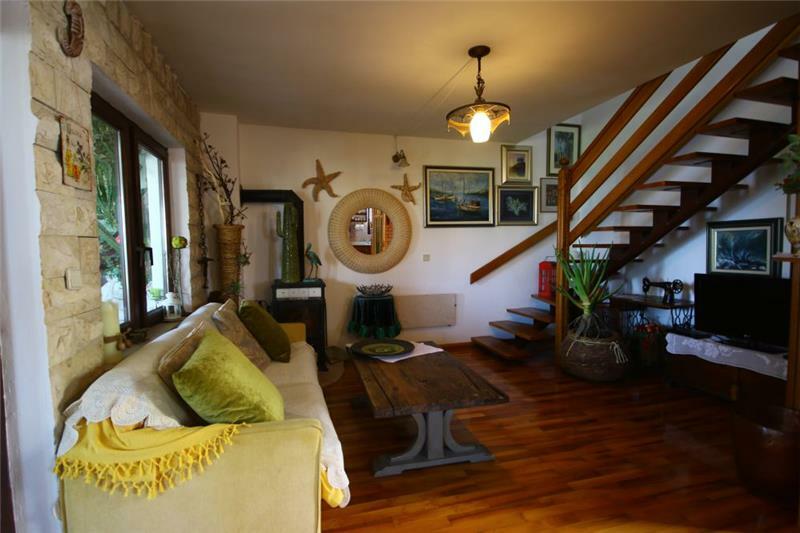 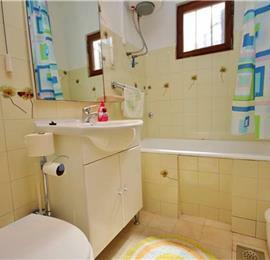 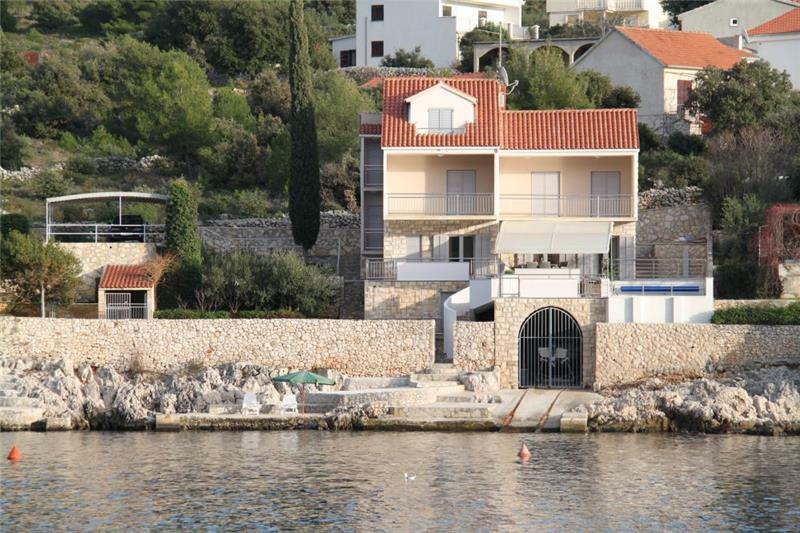 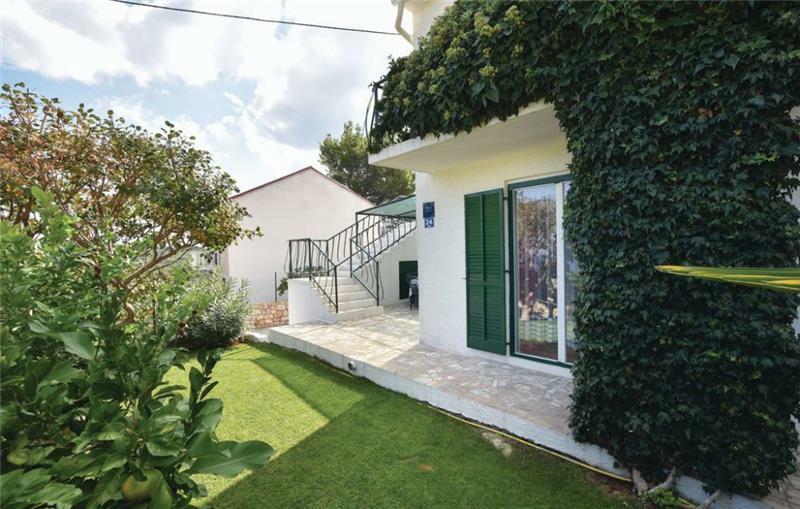 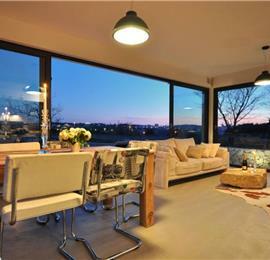 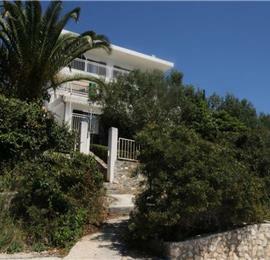 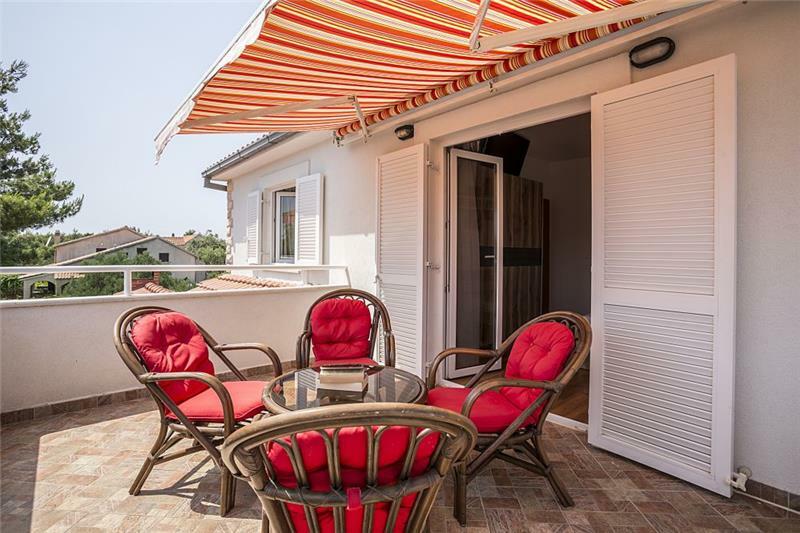 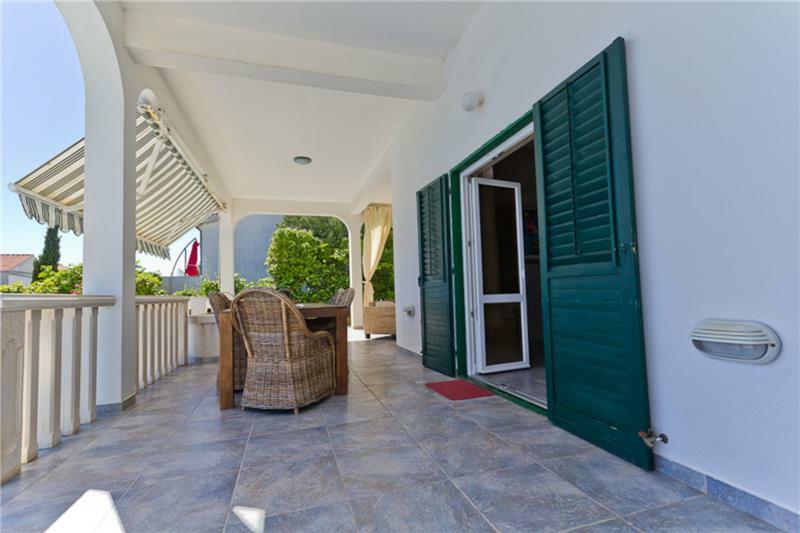 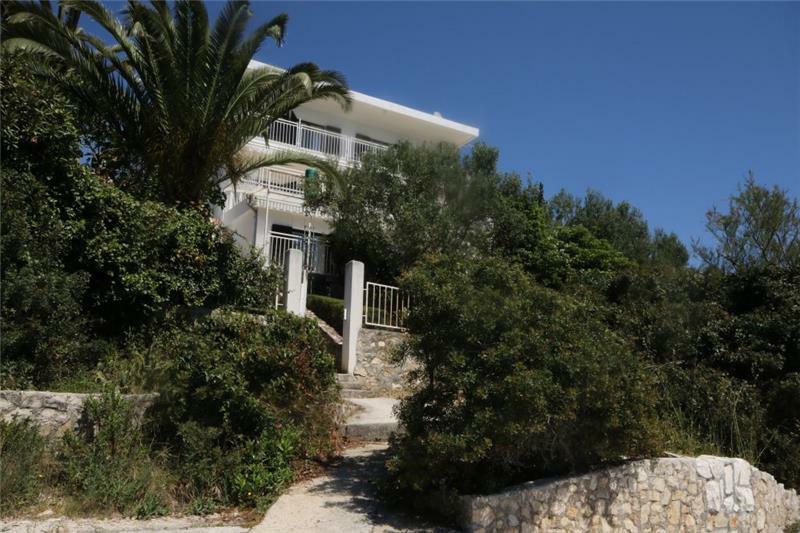 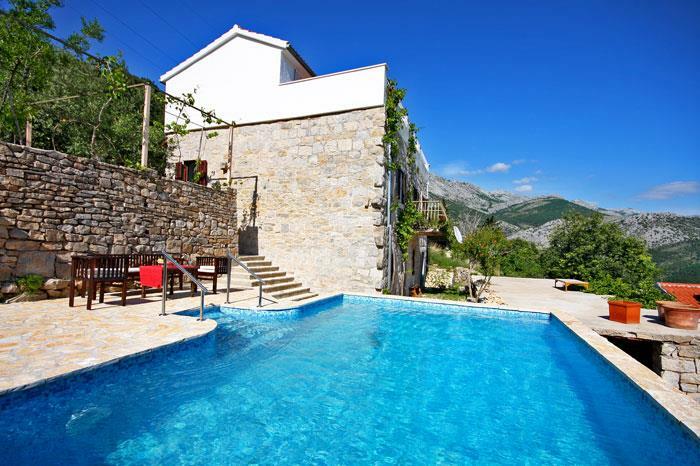 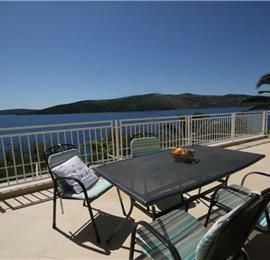 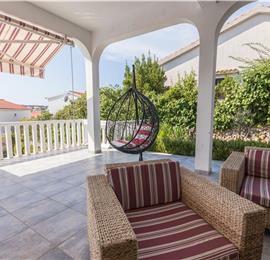 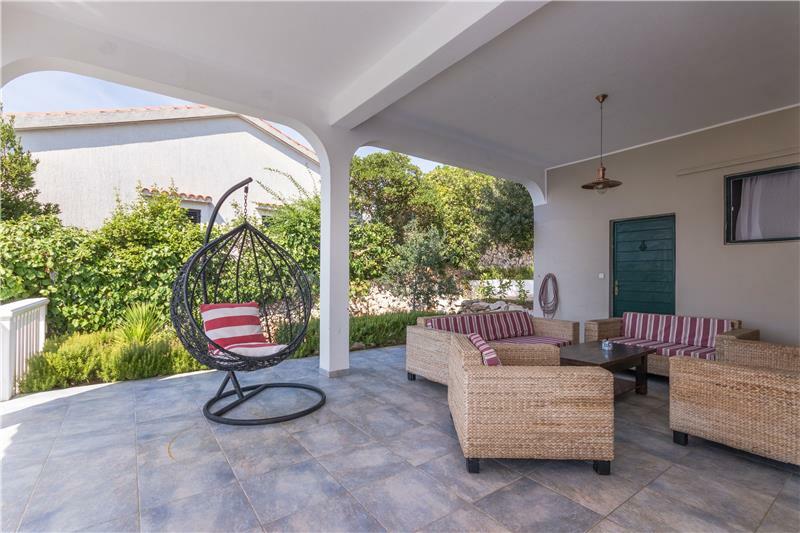 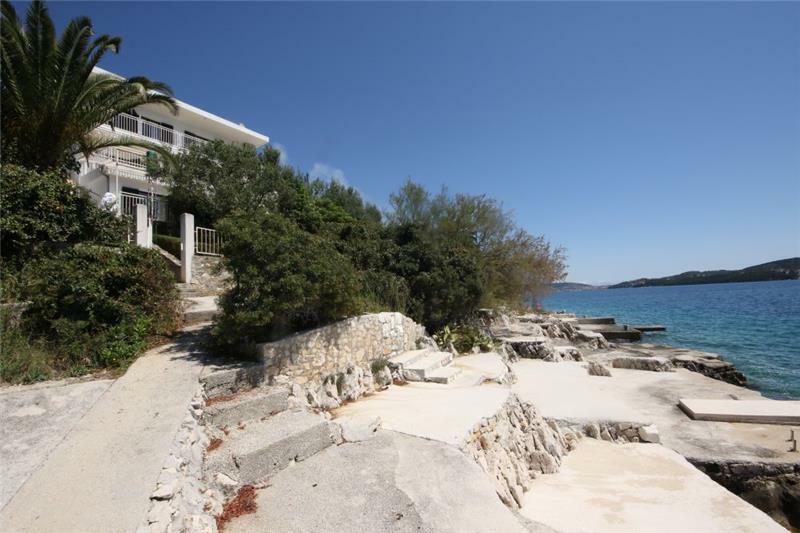 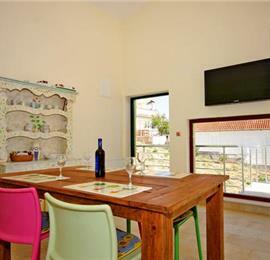 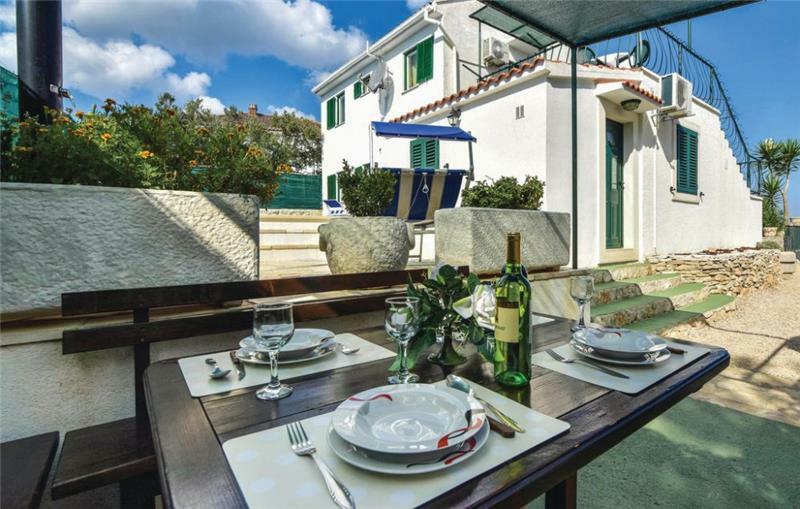 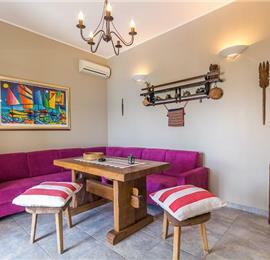 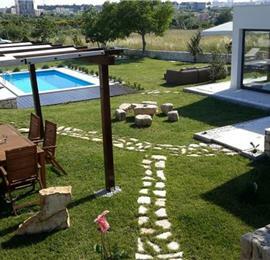 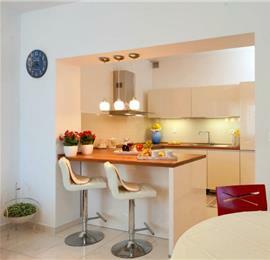 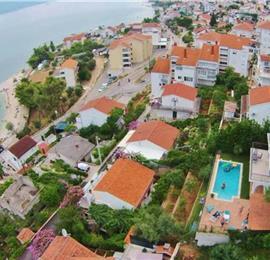 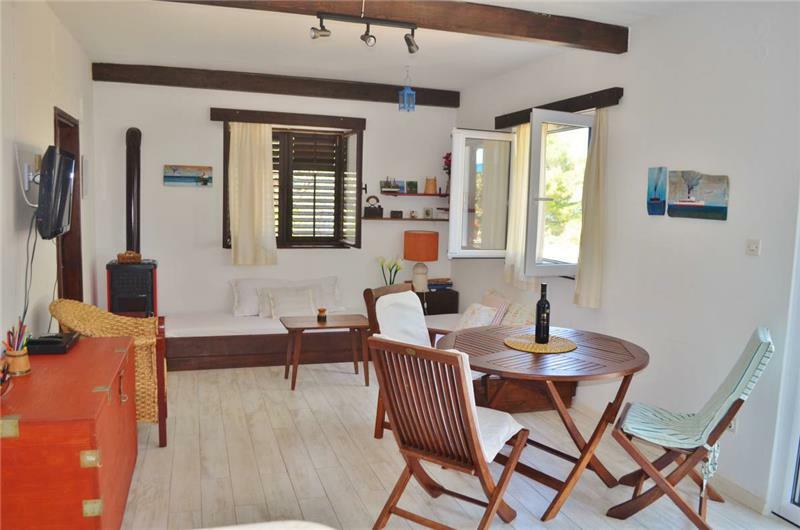 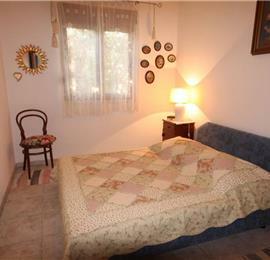 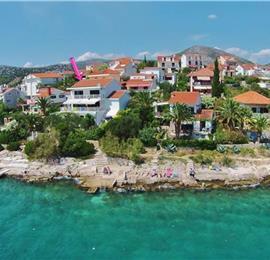 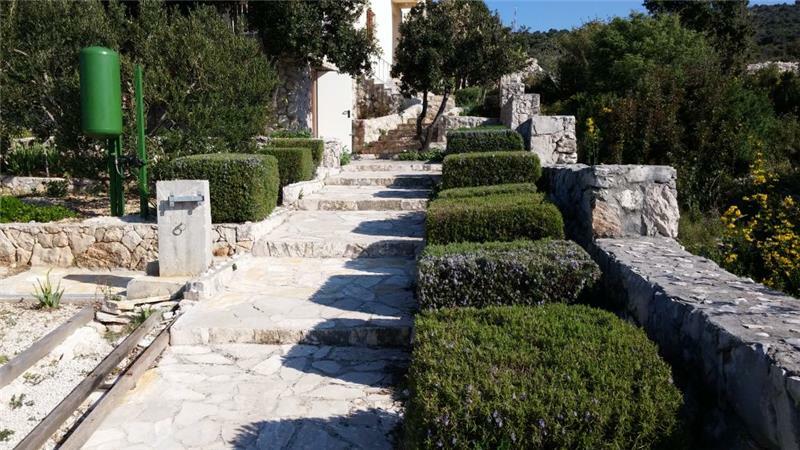 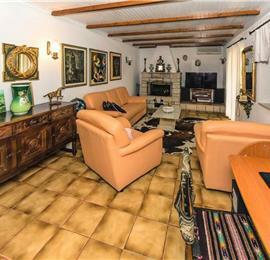 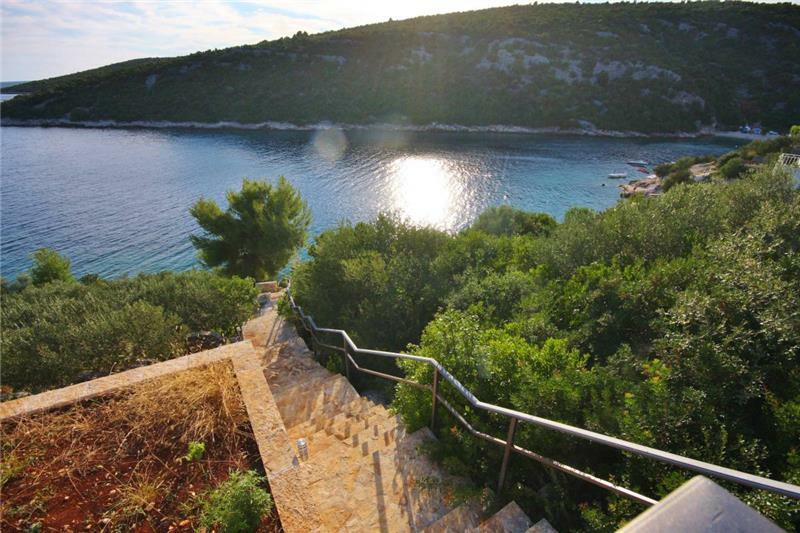 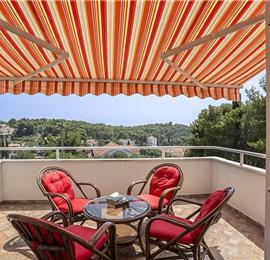 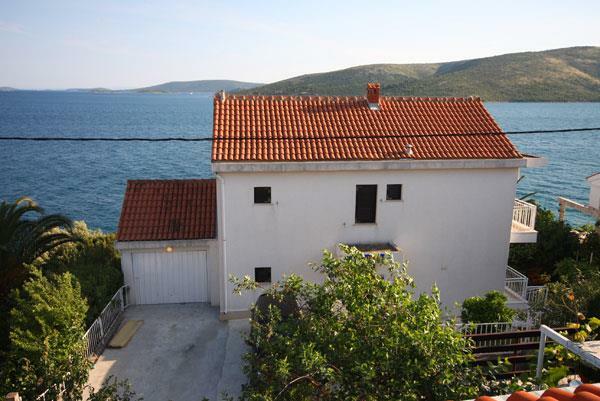 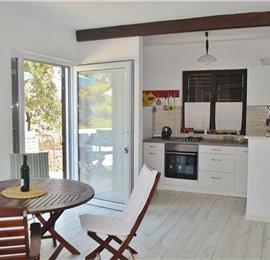 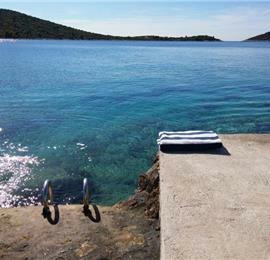 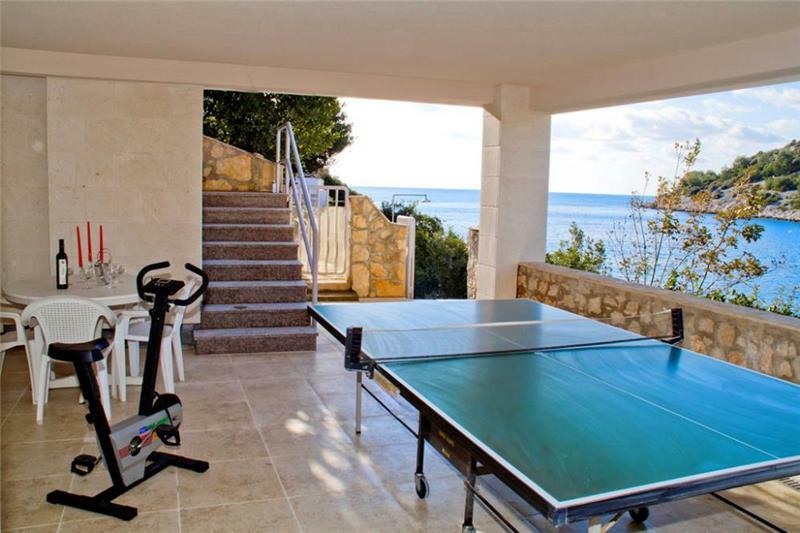 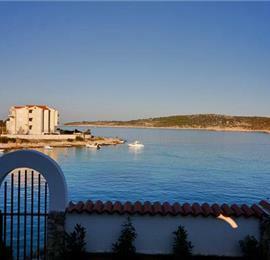 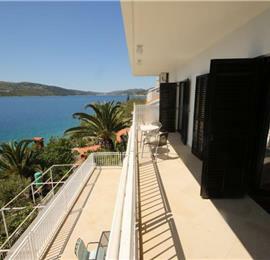 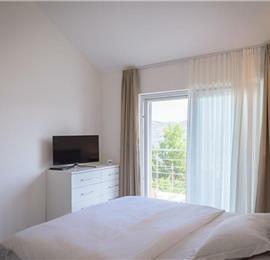 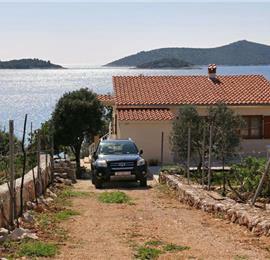 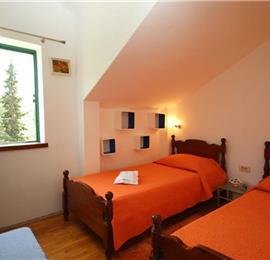 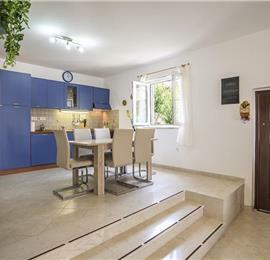 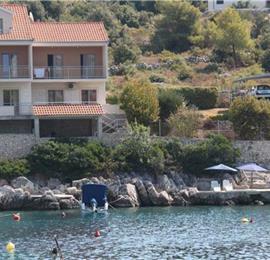 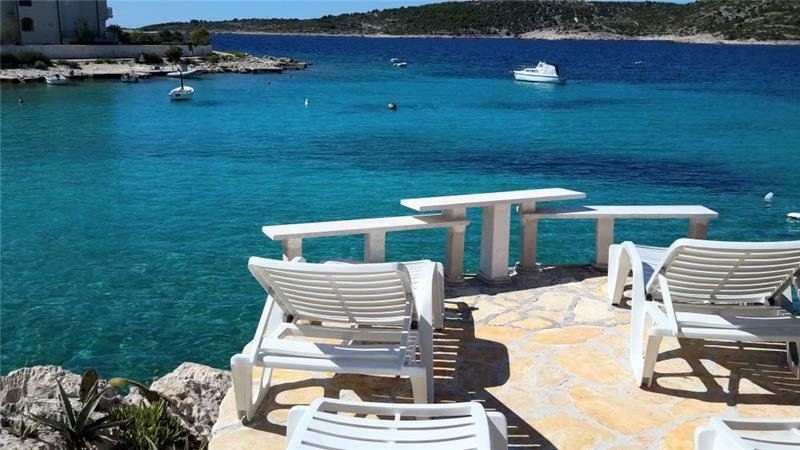 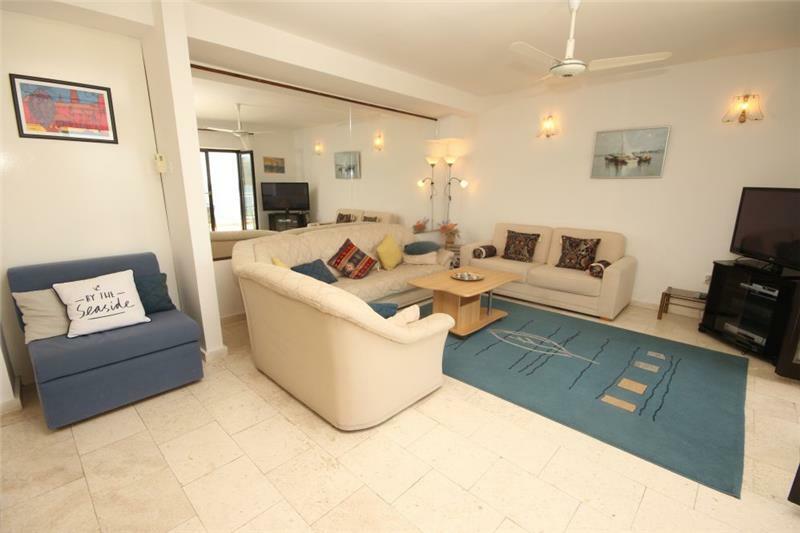 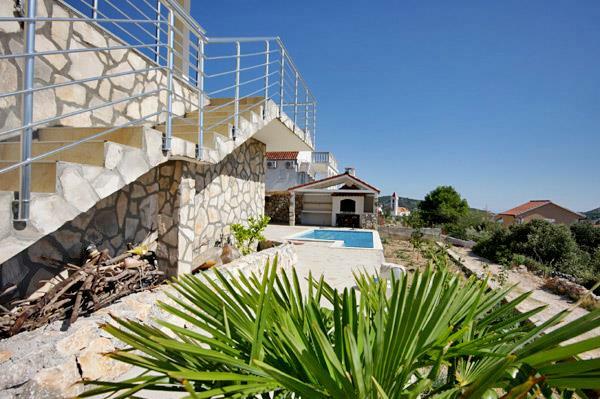 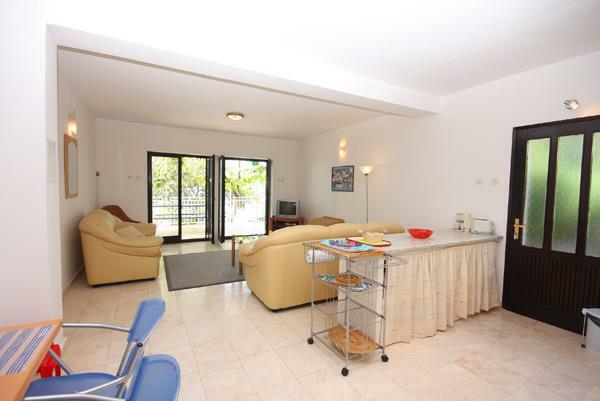 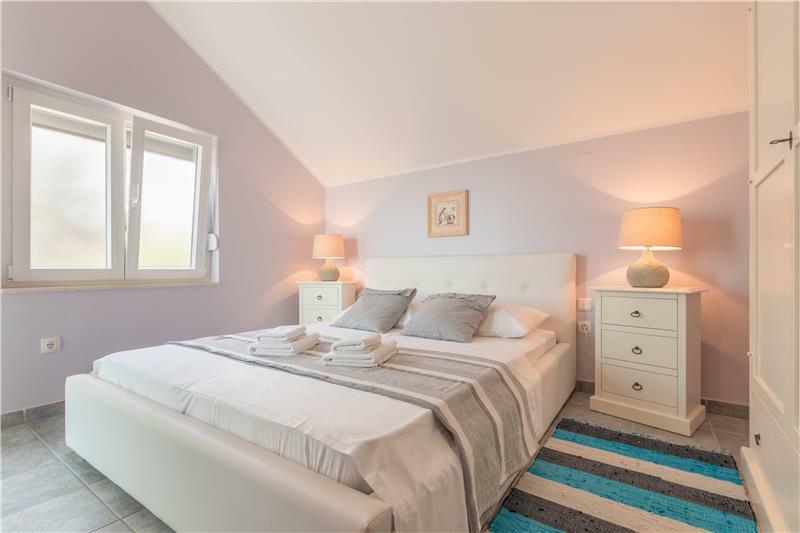 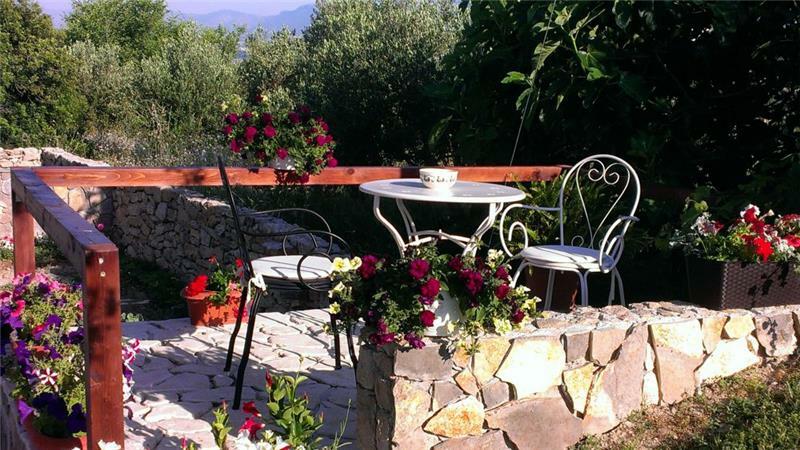 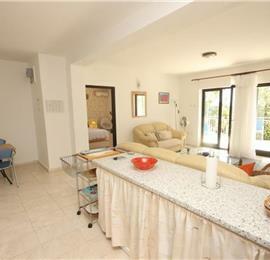 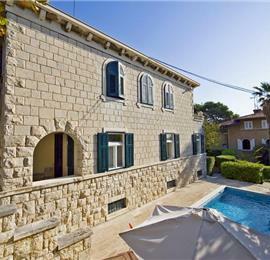 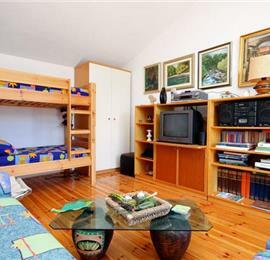 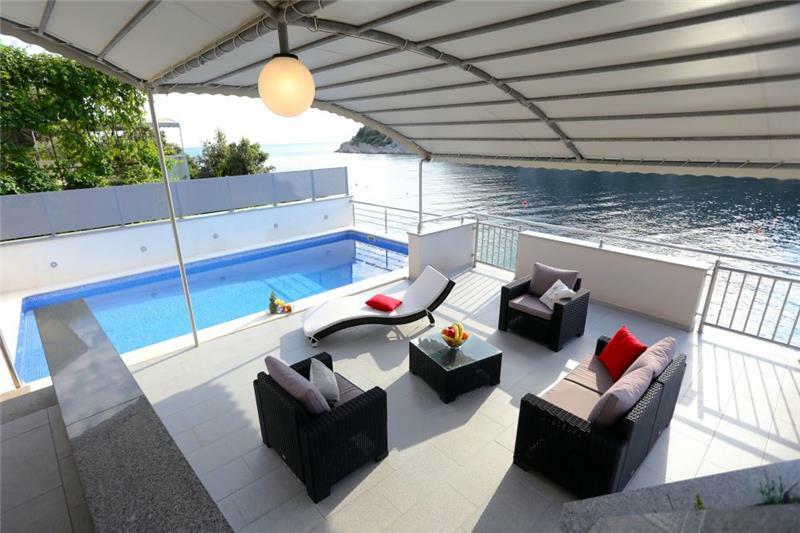 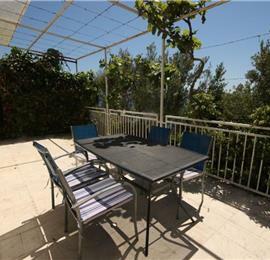 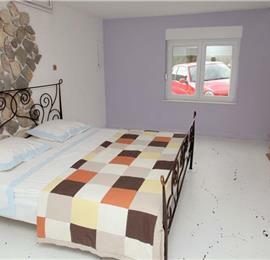 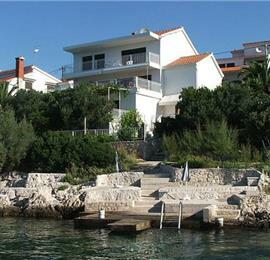 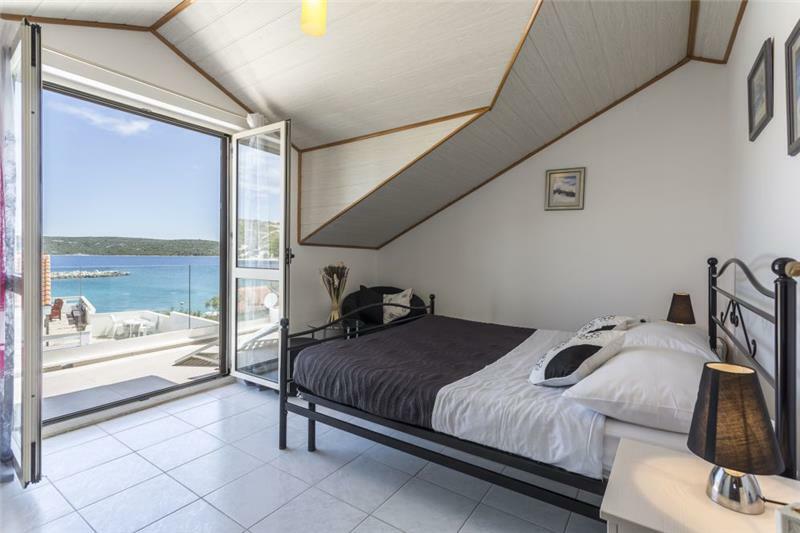 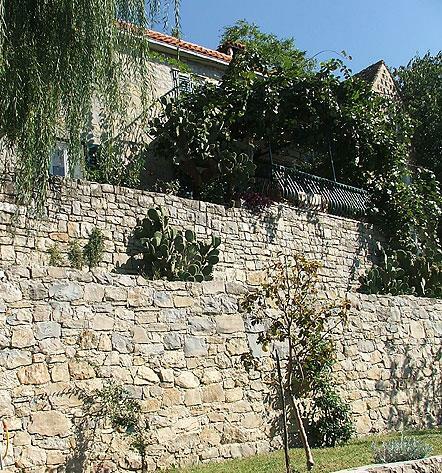 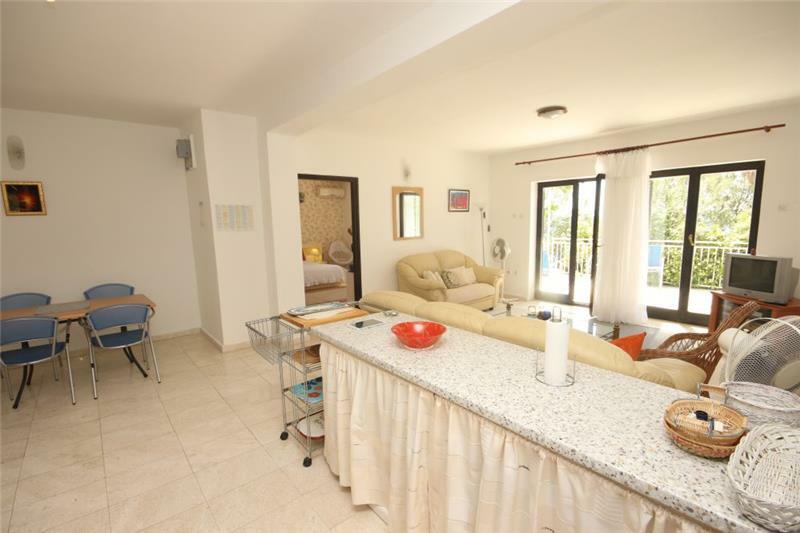 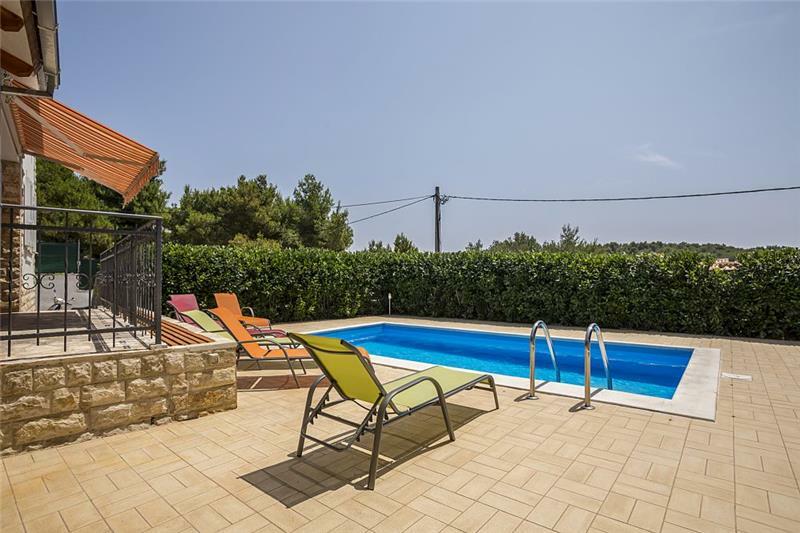 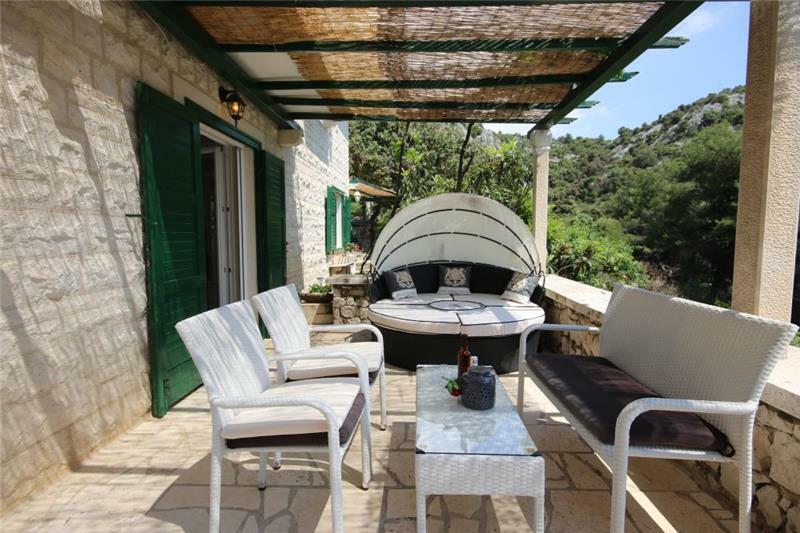 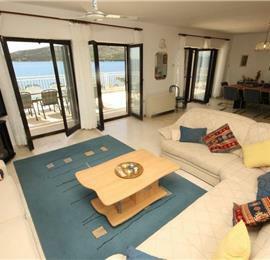 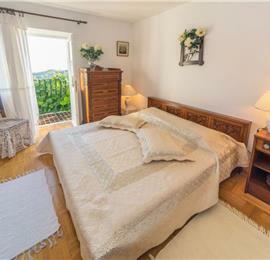 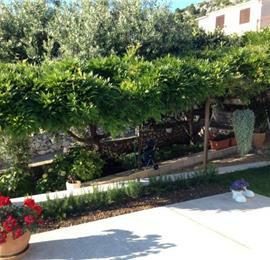 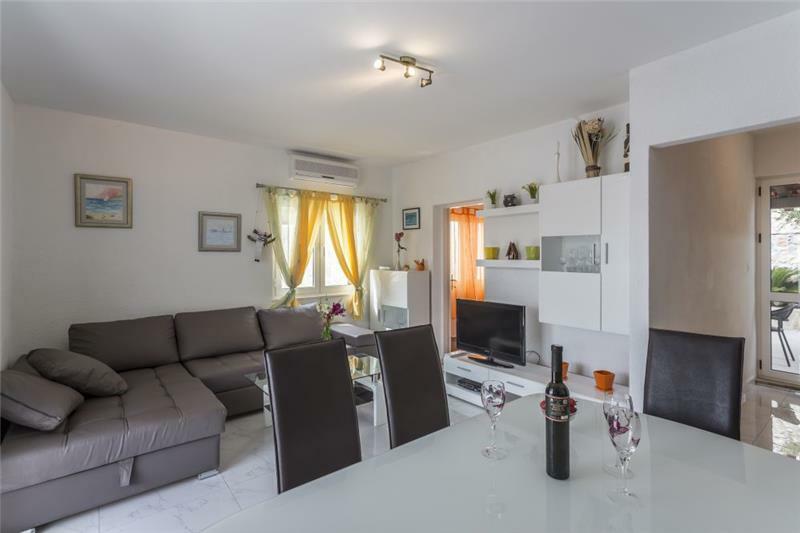 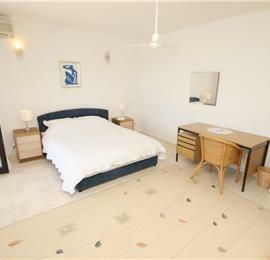 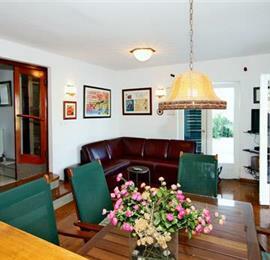 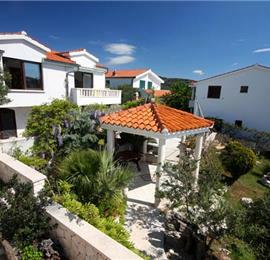 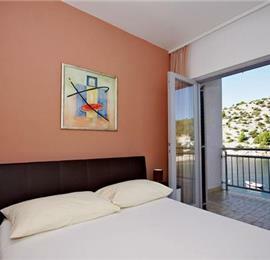 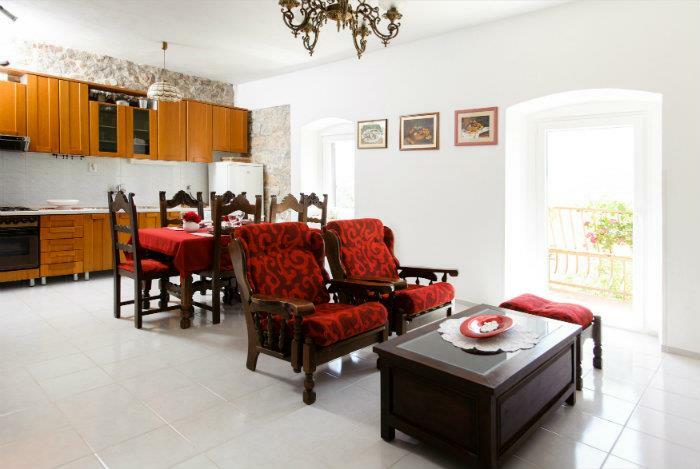 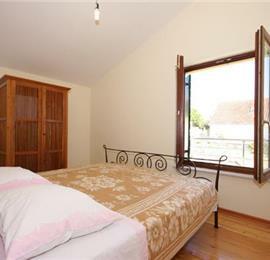 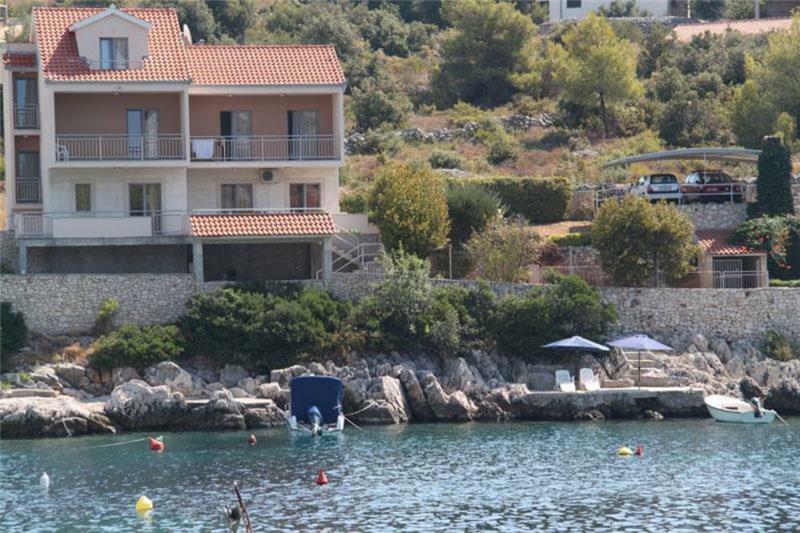 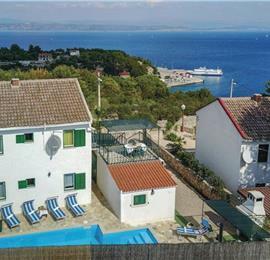 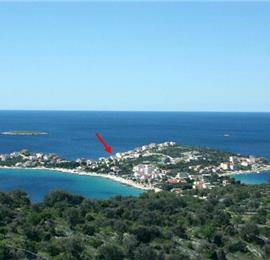 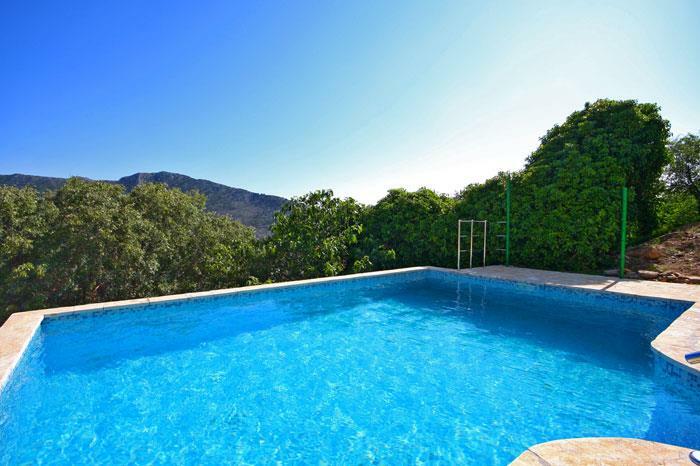 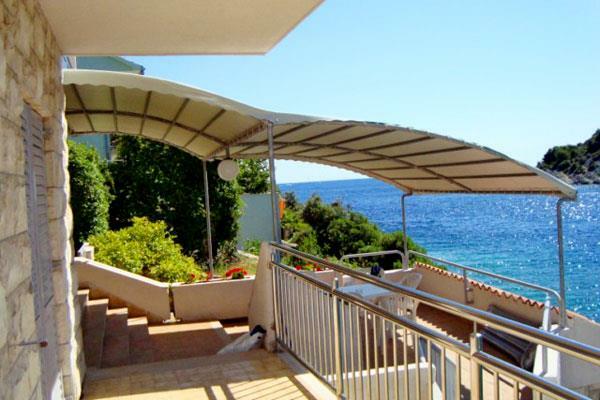 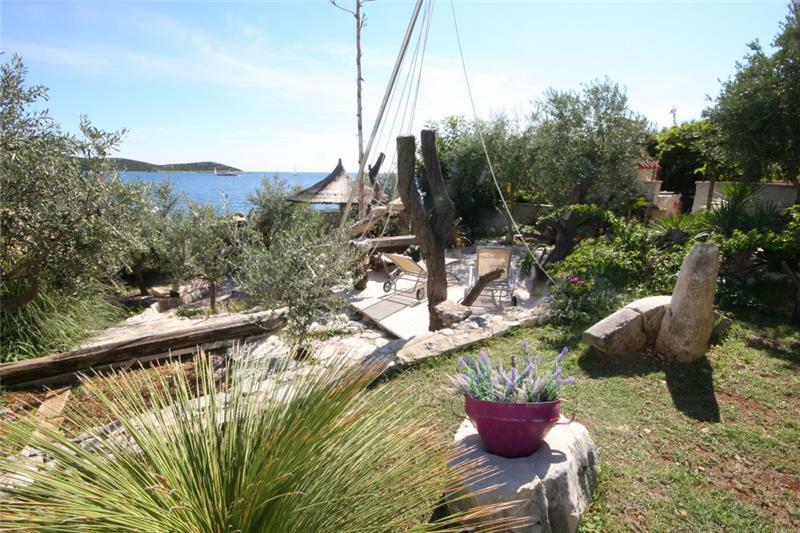 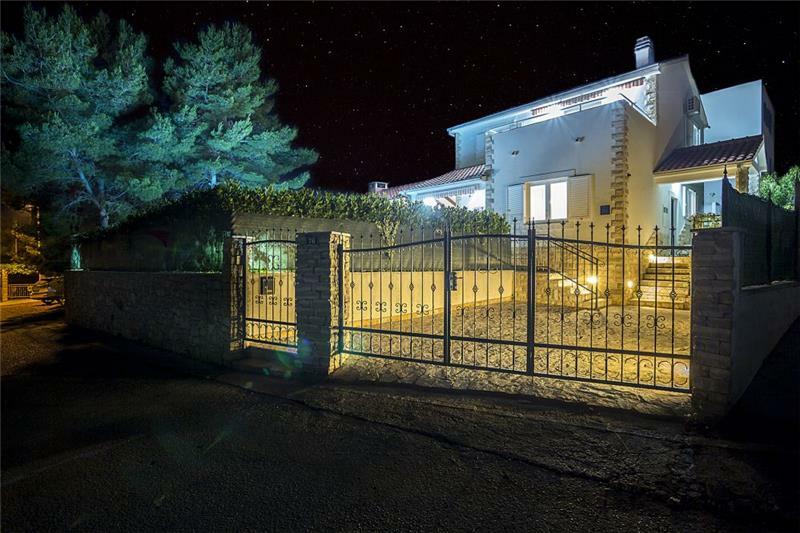 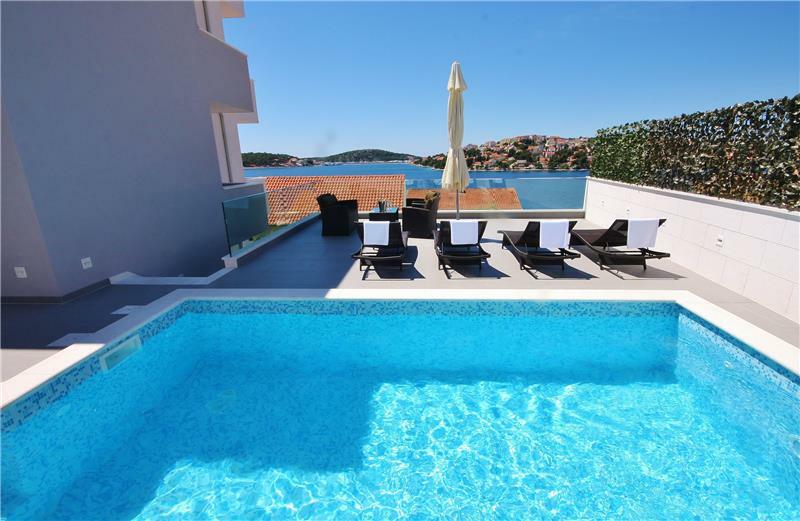 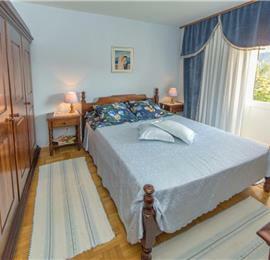 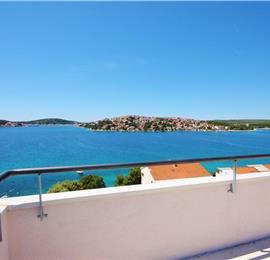 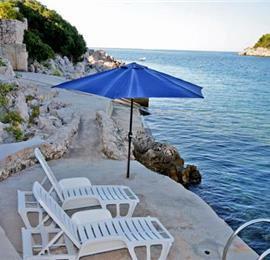 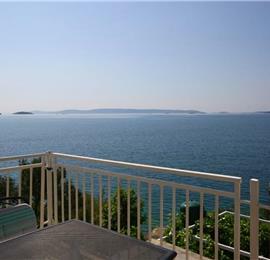 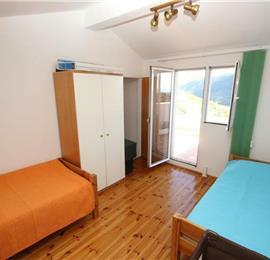 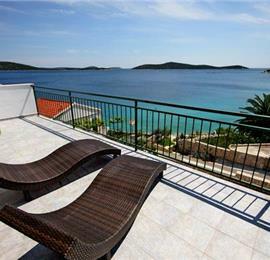 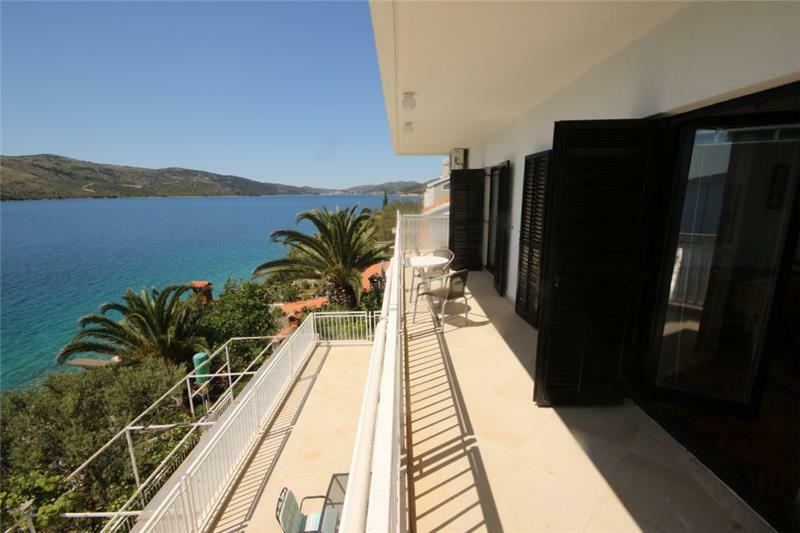 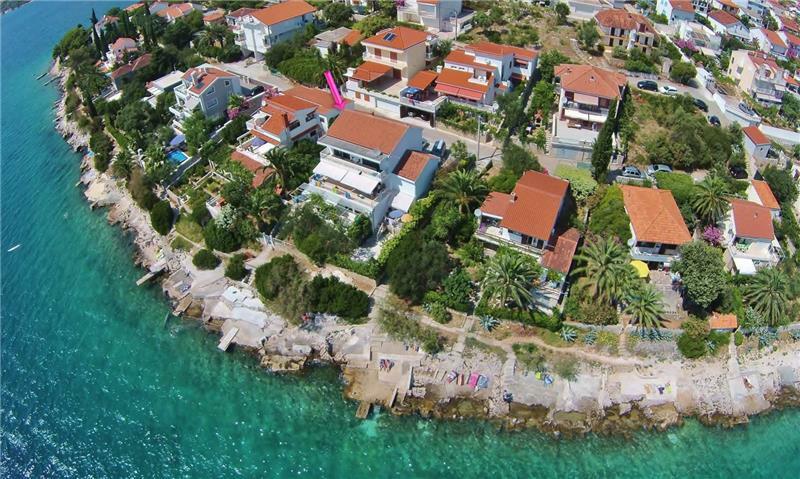 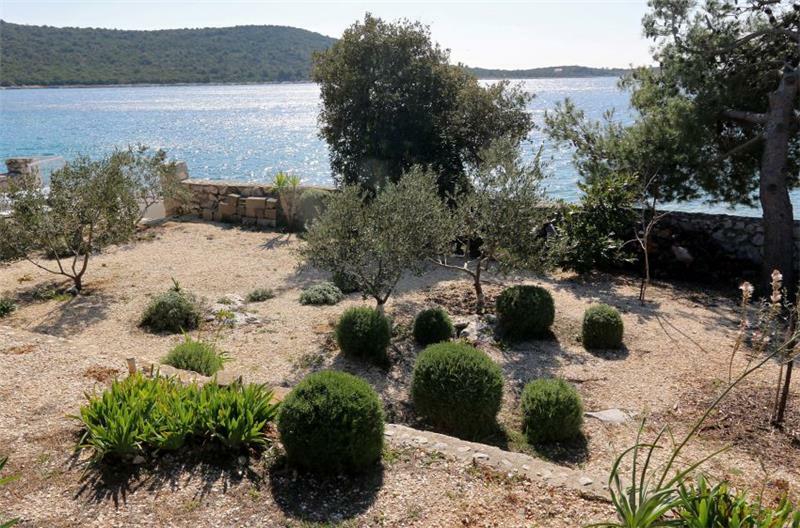 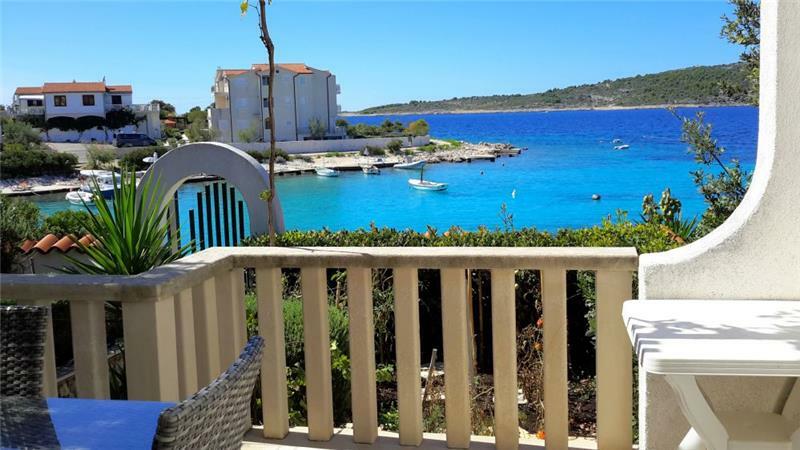 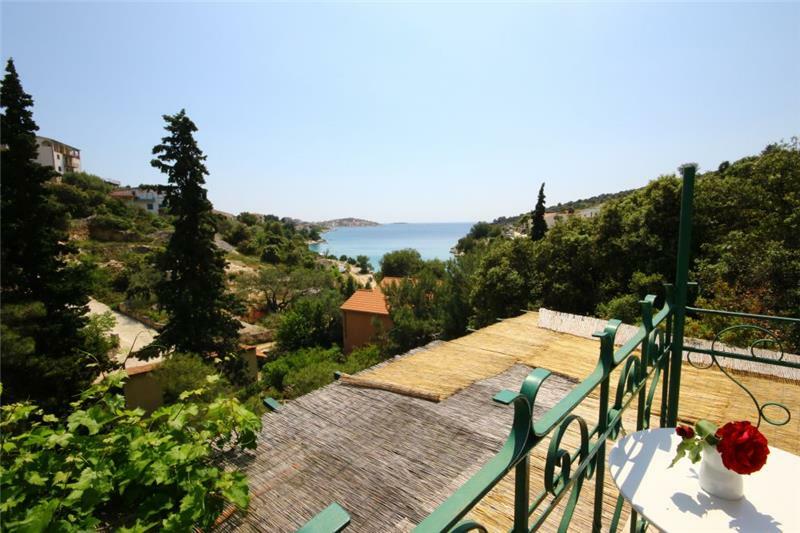 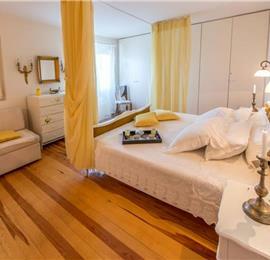 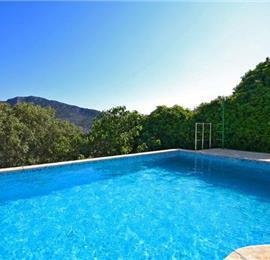 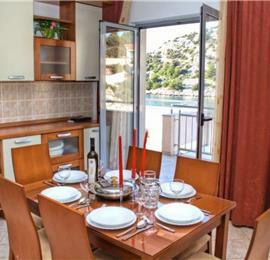 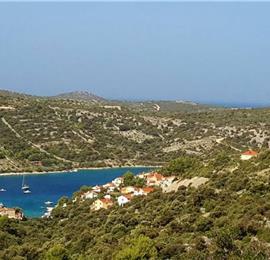 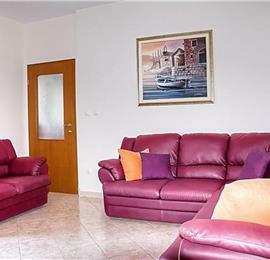 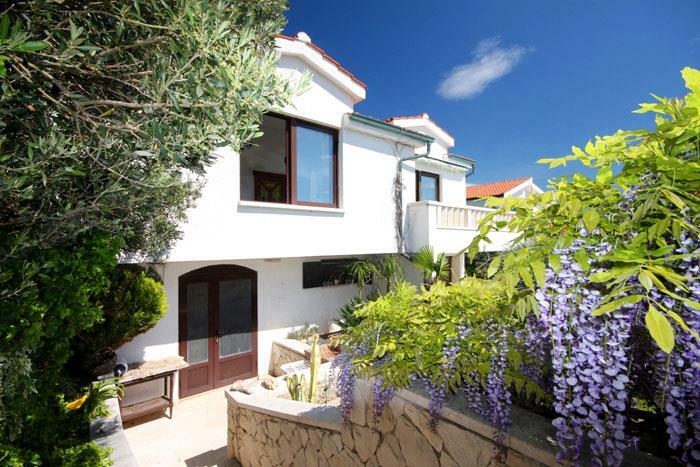 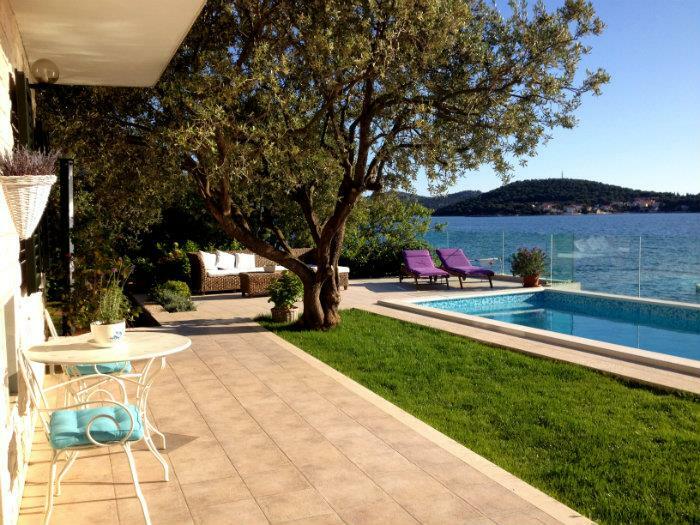 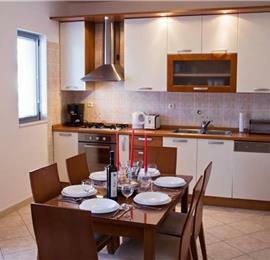 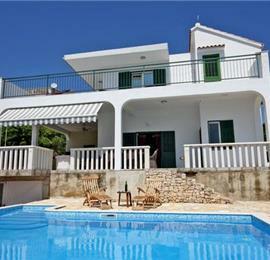 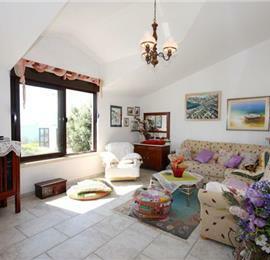 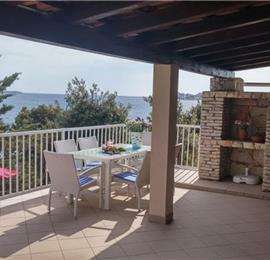 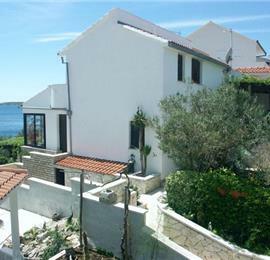 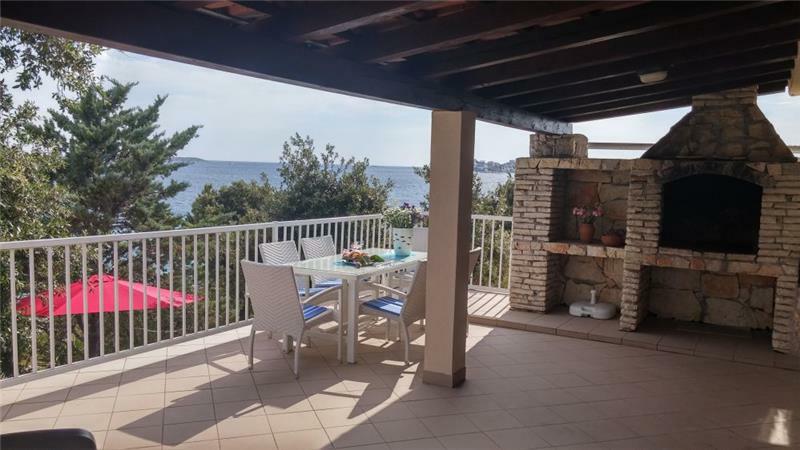 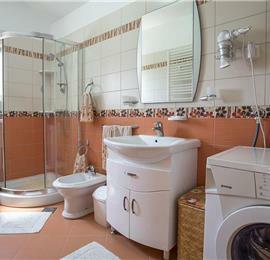 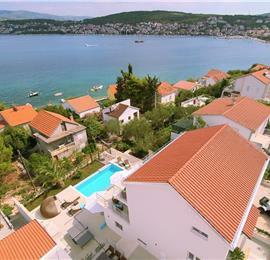 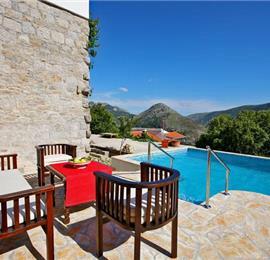 This is a lovely property pleasantly and peacefully situated above the resort a few minutes’ walk away. 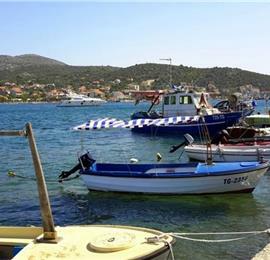 There are several restaurants in Maslinica we tried a few, the stand out being Sakajet, which gave superb service, some great fish and, unprompted, a tray of sweets to celebrate my wife's birthday, free of charge. 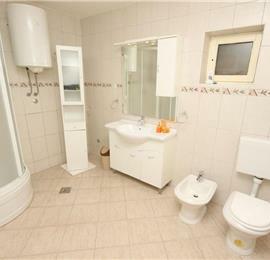 Impressed with: I have been several times. 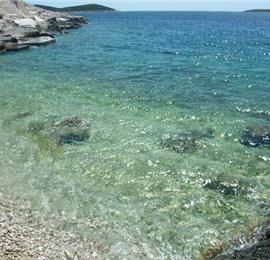 The people, the food, the climate, the sea, you could call me a fan. 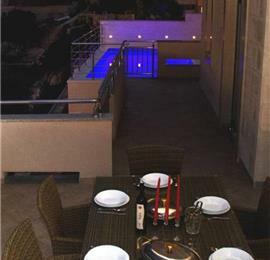 Recommend: We really enjoyed our special meal at Sakajet. 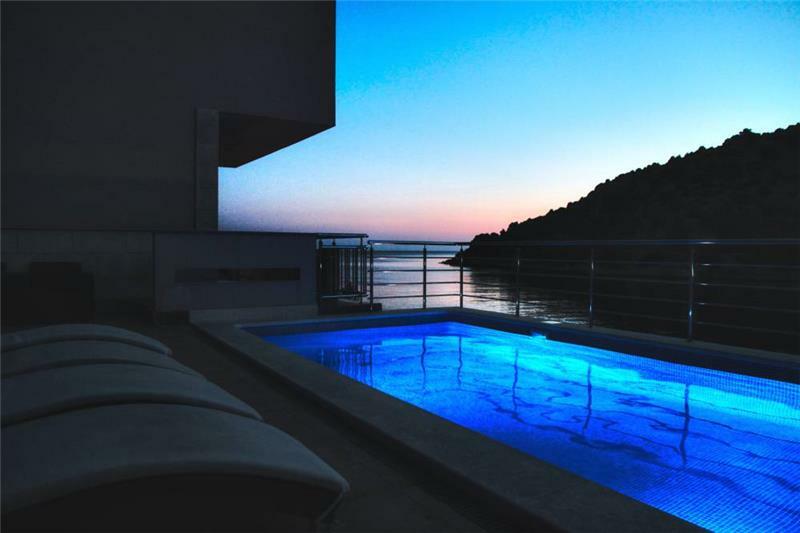 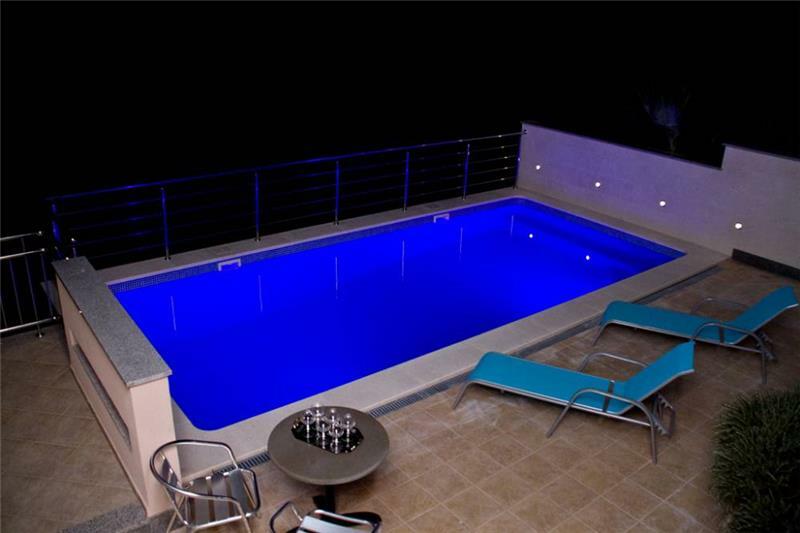 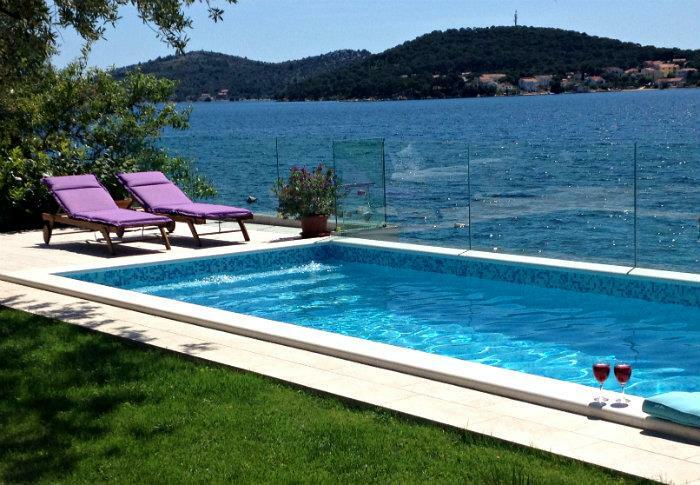 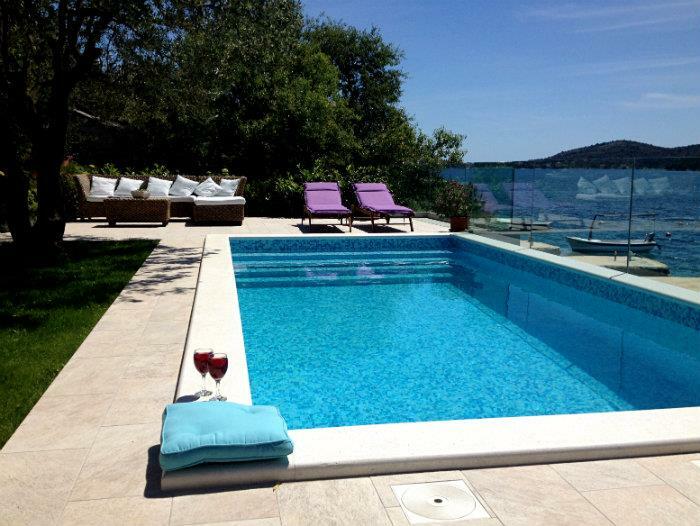 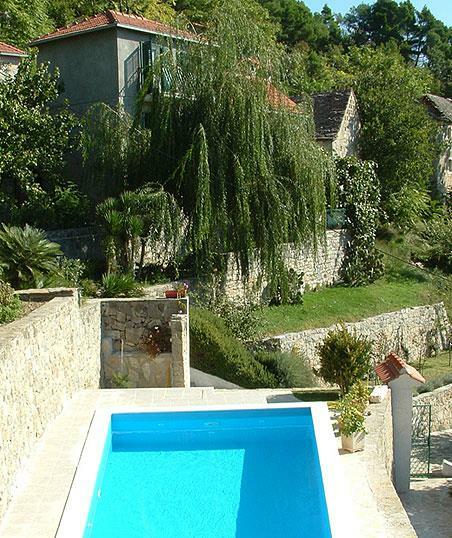 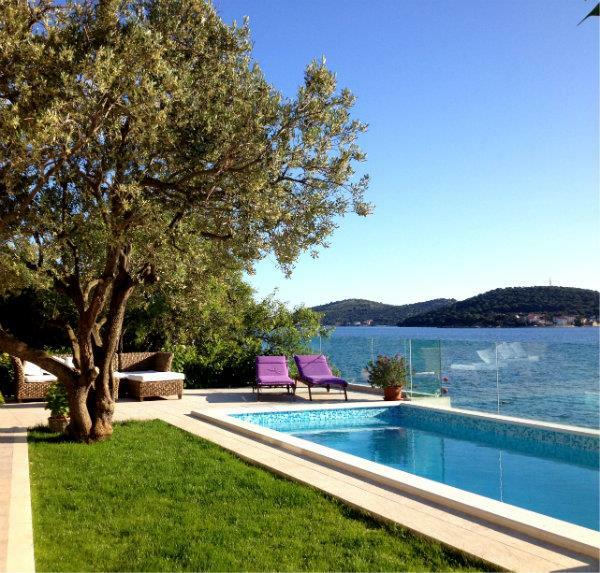 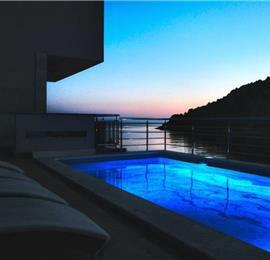 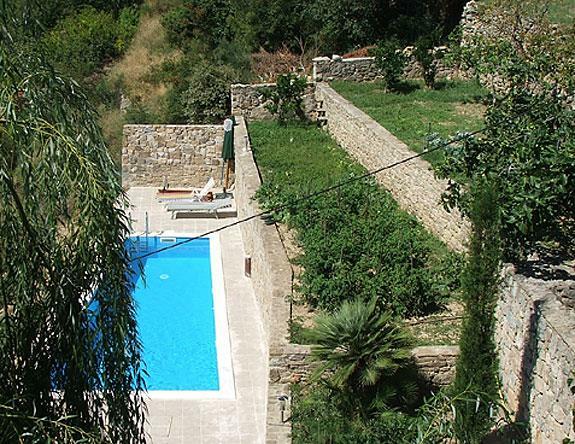 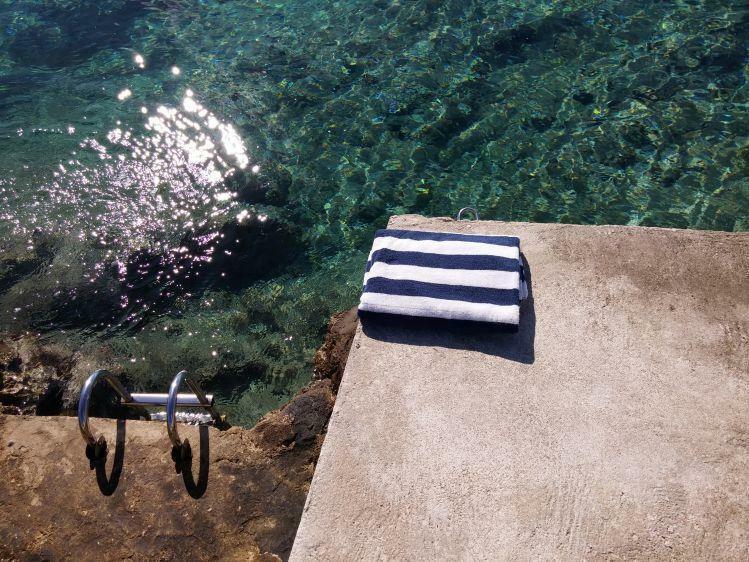 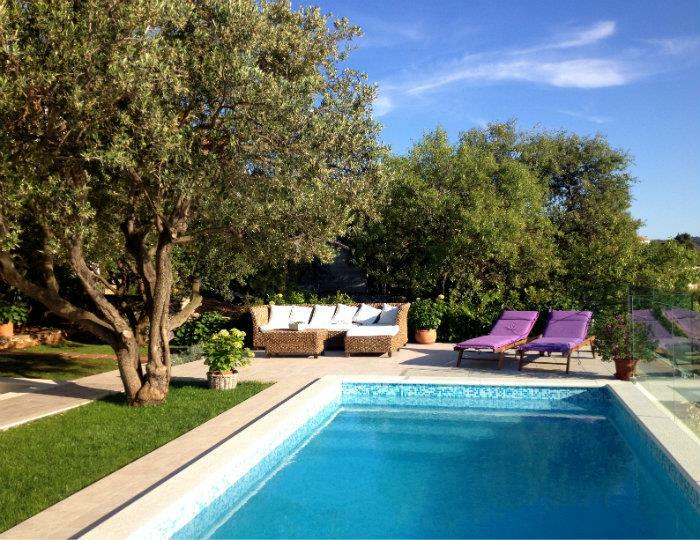 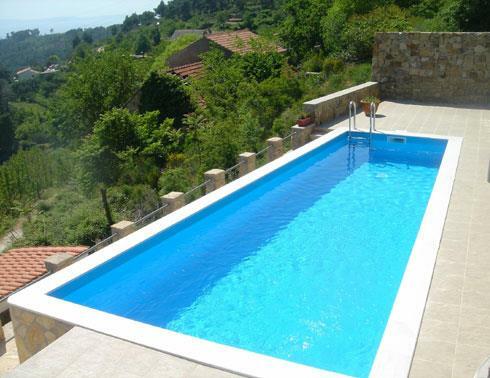 Favourite villa moment: Finding the pool so inviting in mid-June! 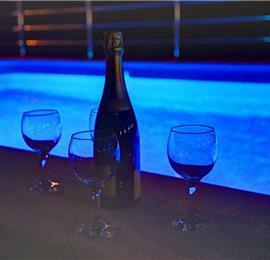 Enjoying a welcome beer with our extremely helpful and generous perfect host. 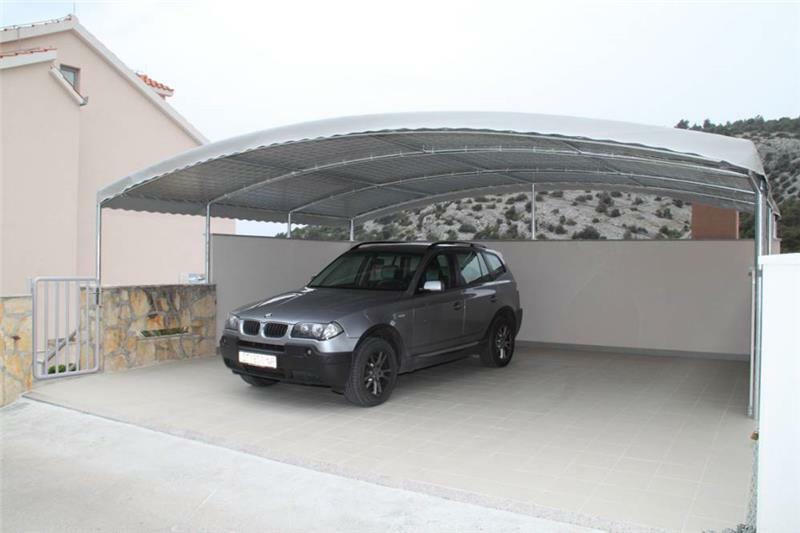 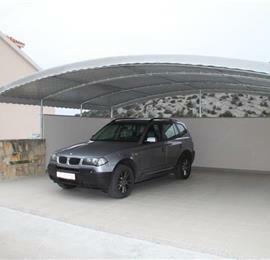 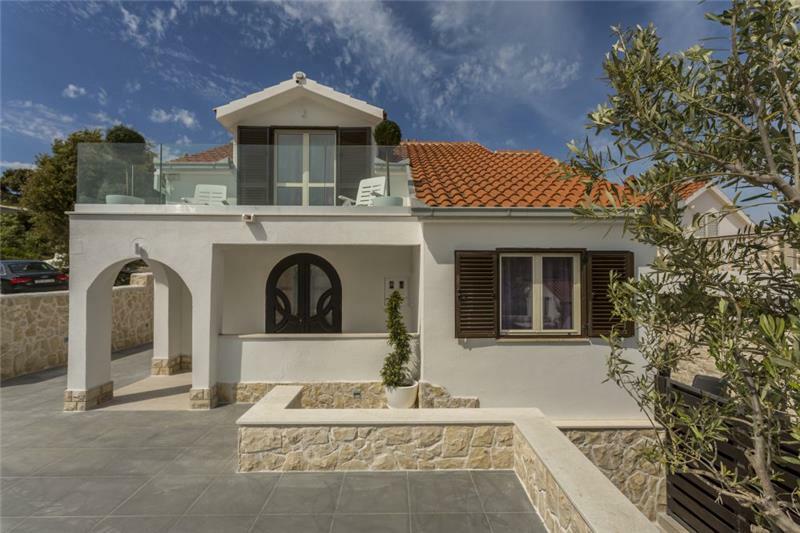 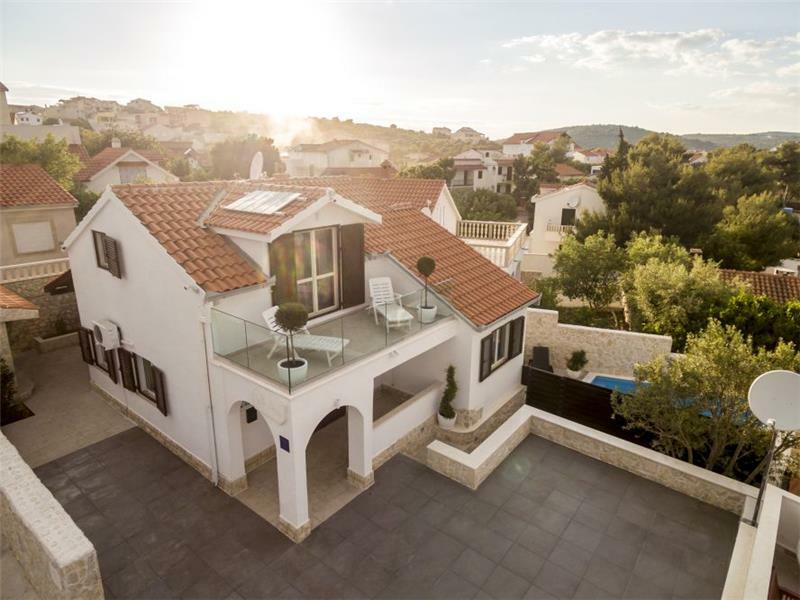 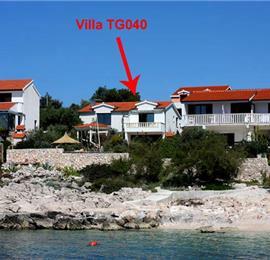 Nice new Villa - very functional and well placed. 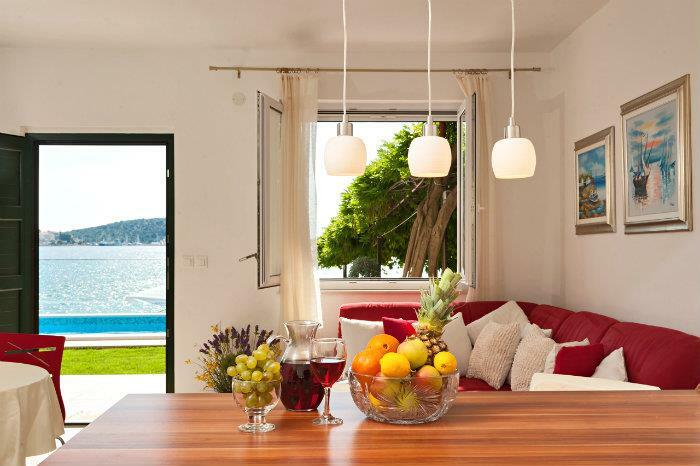 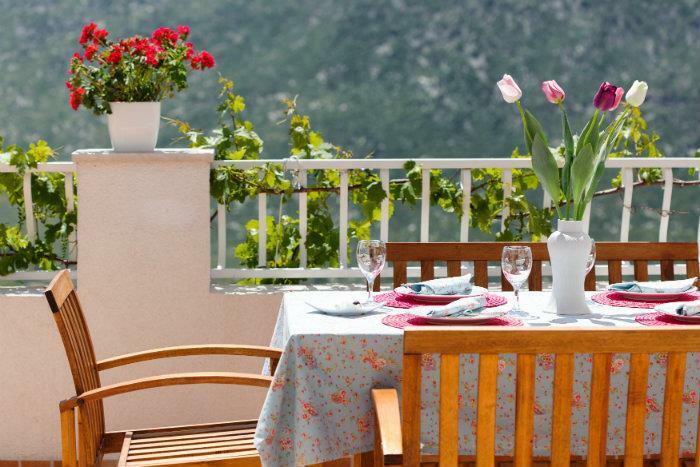 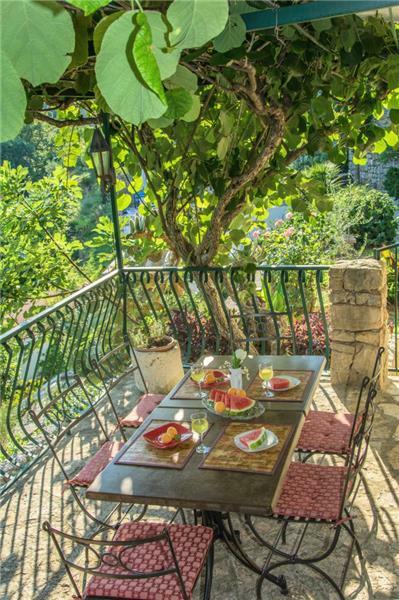 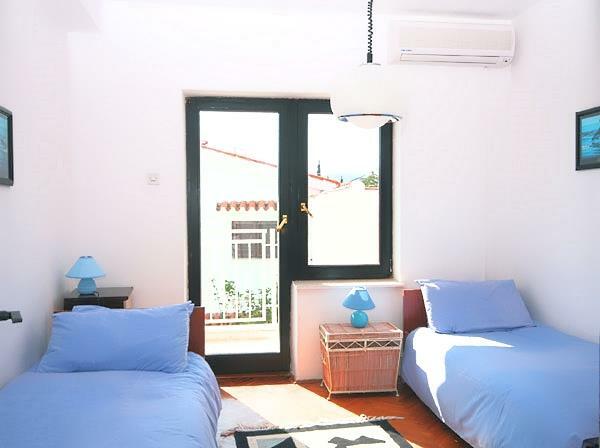 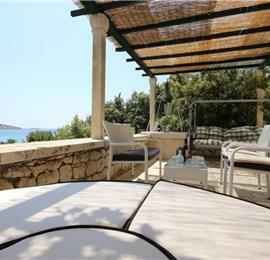 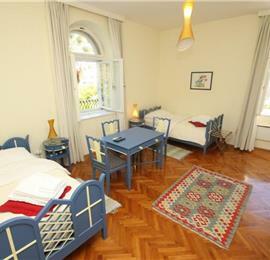 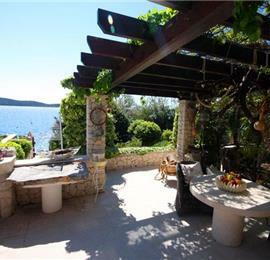 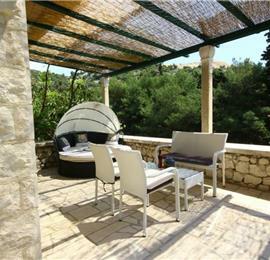 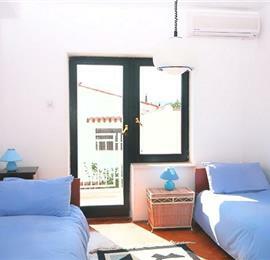 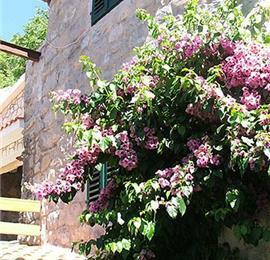 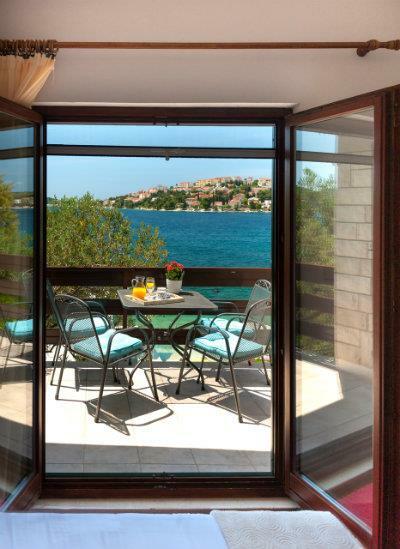 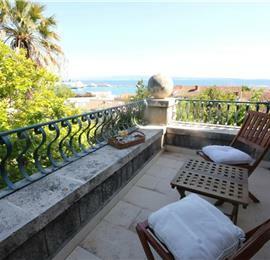 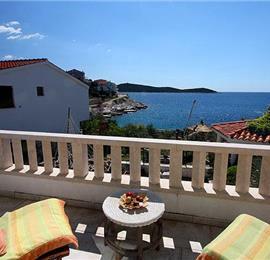 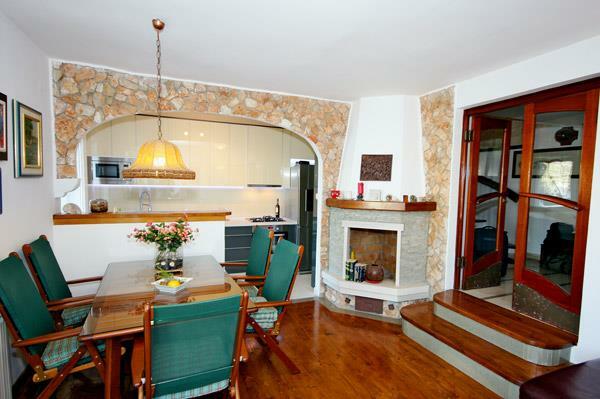 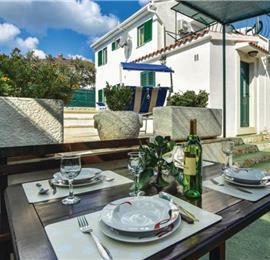 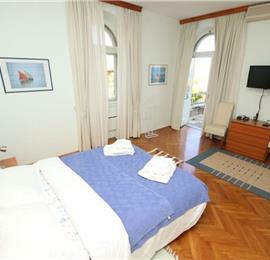 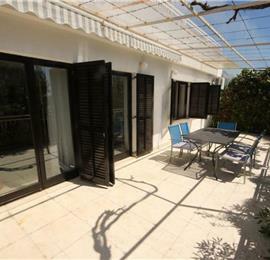 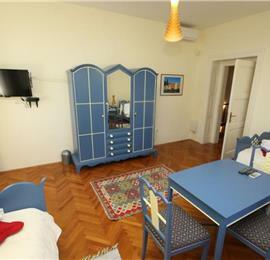 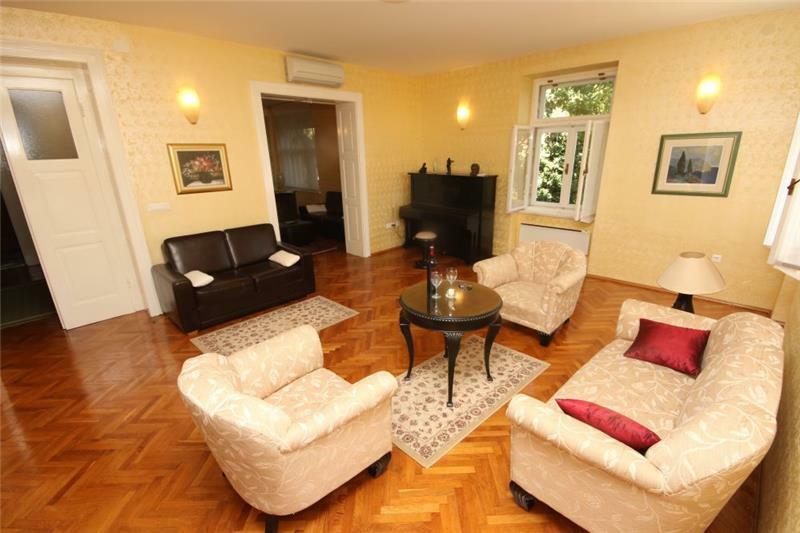 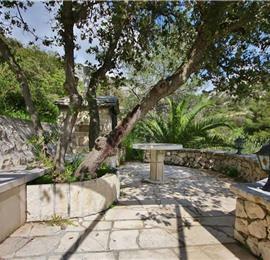 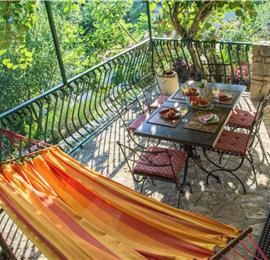 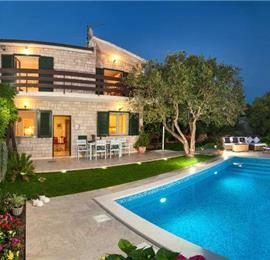 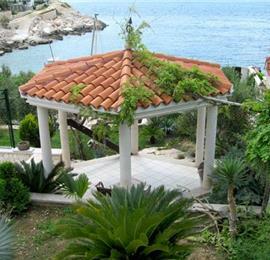 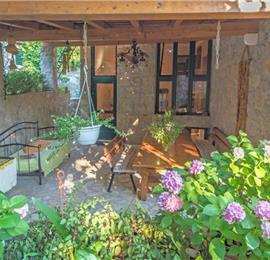 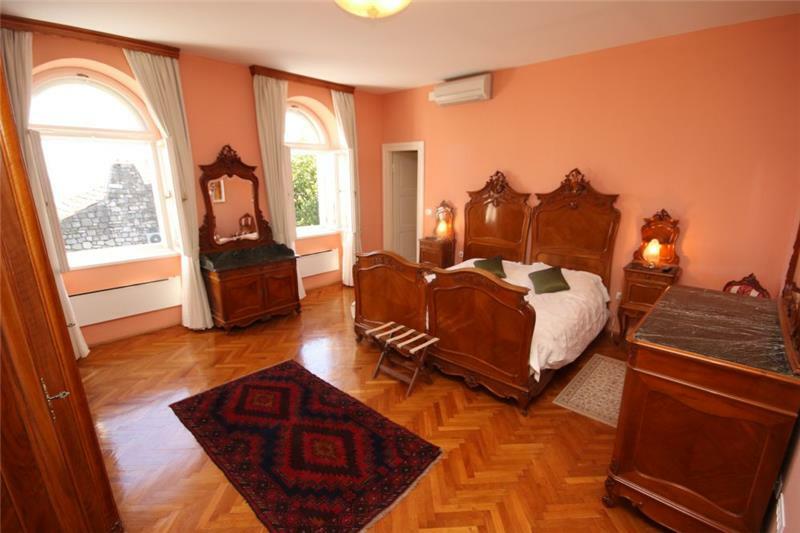 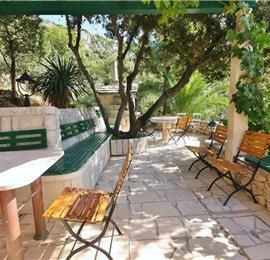 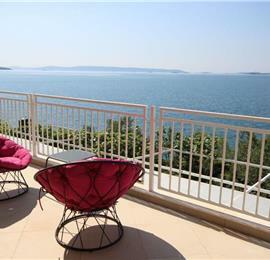 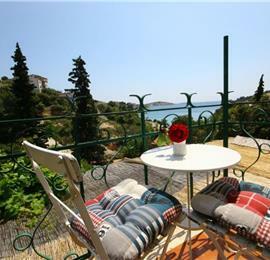 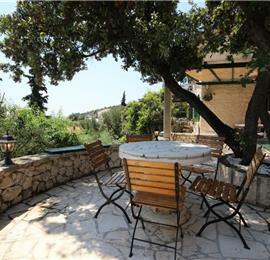 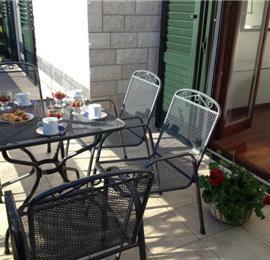 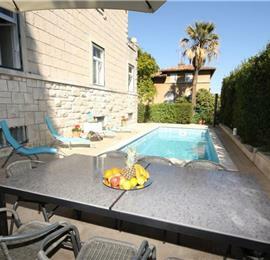 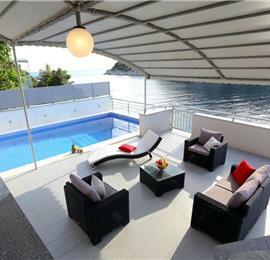 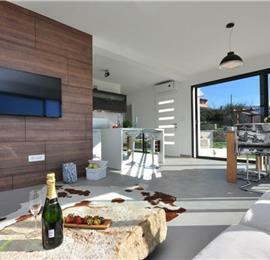 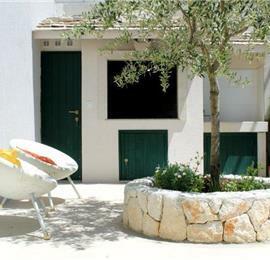 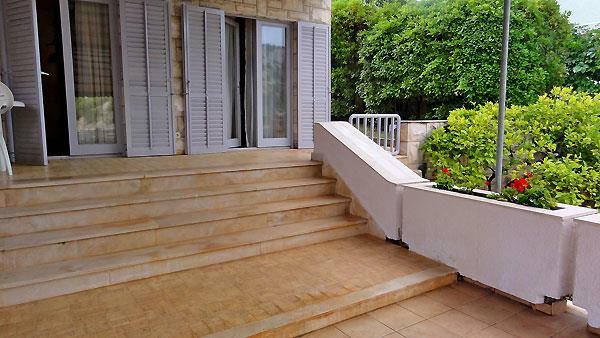 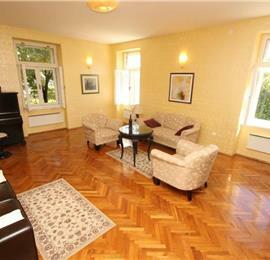 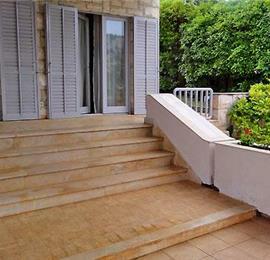 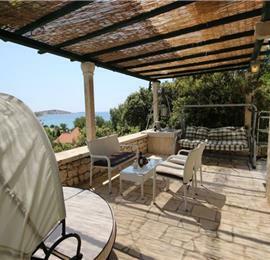 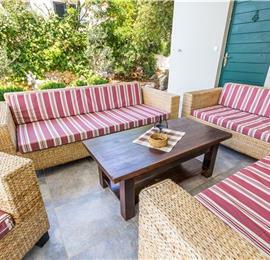 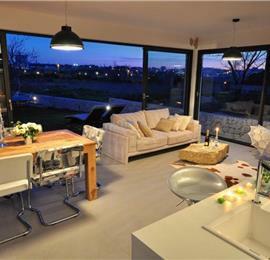 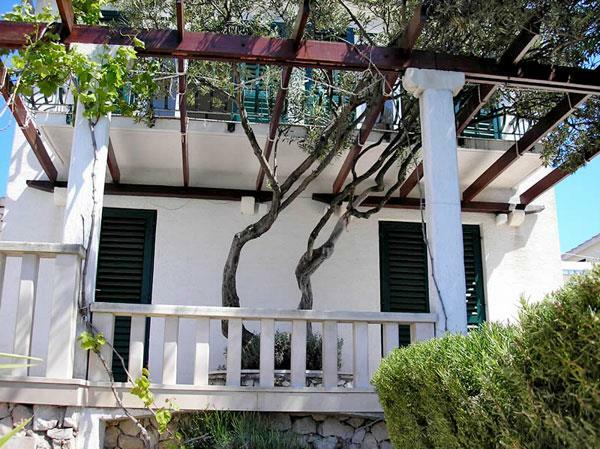 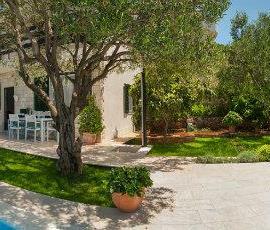 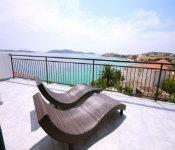 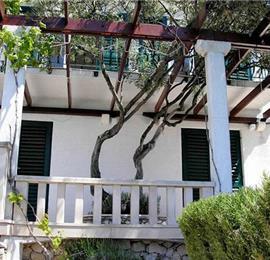 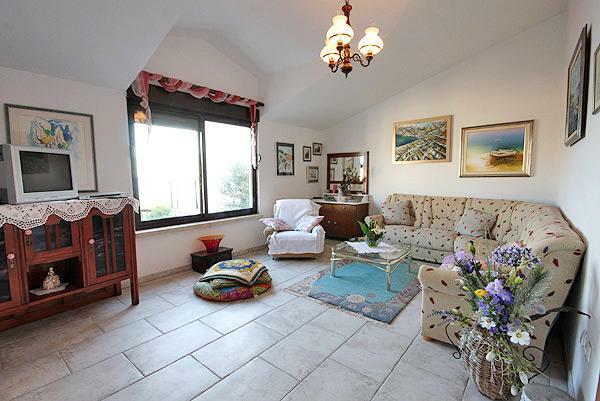 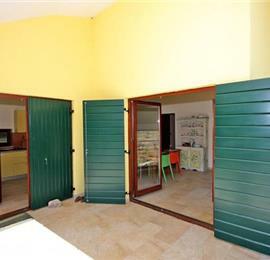 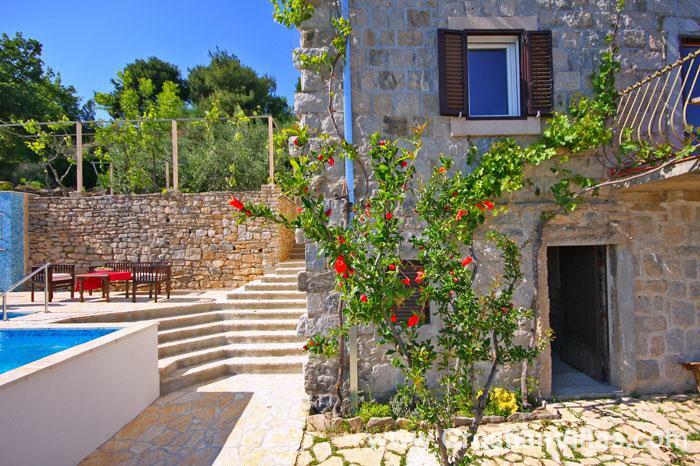 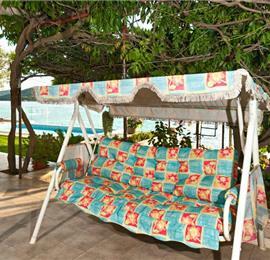 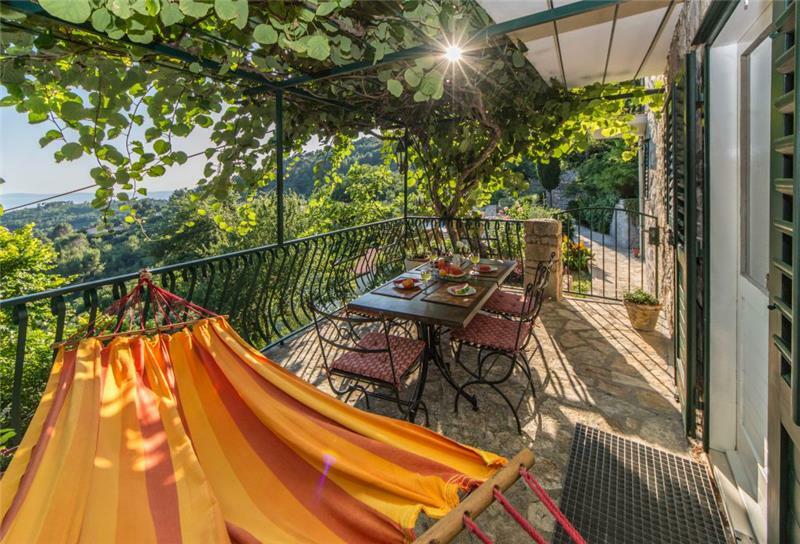 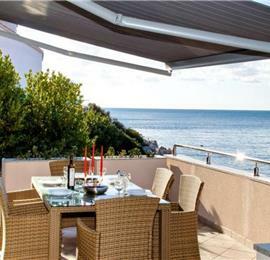 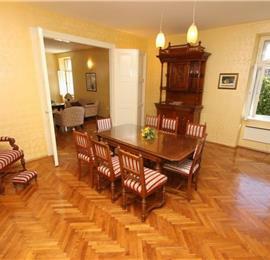 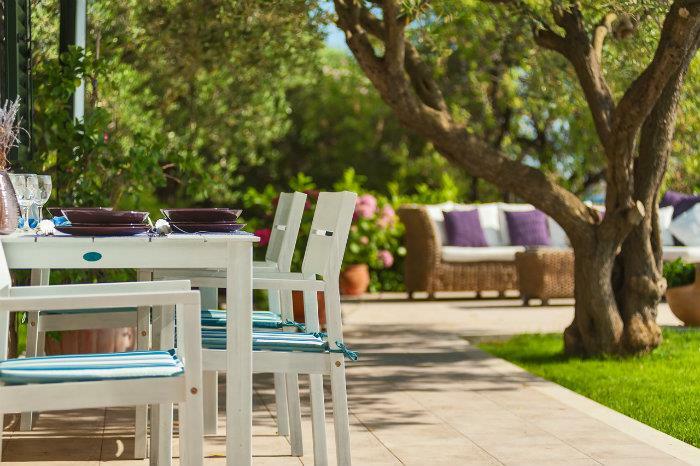 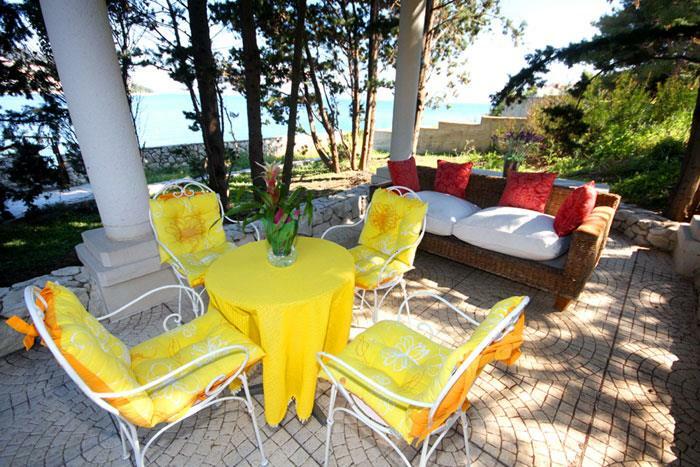 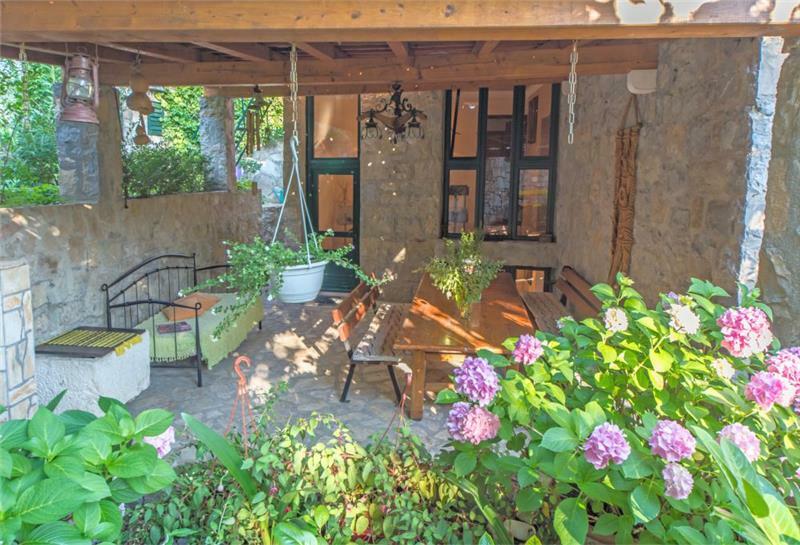 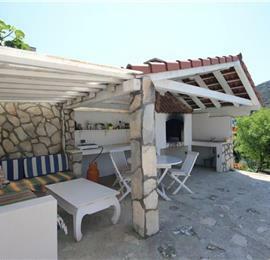 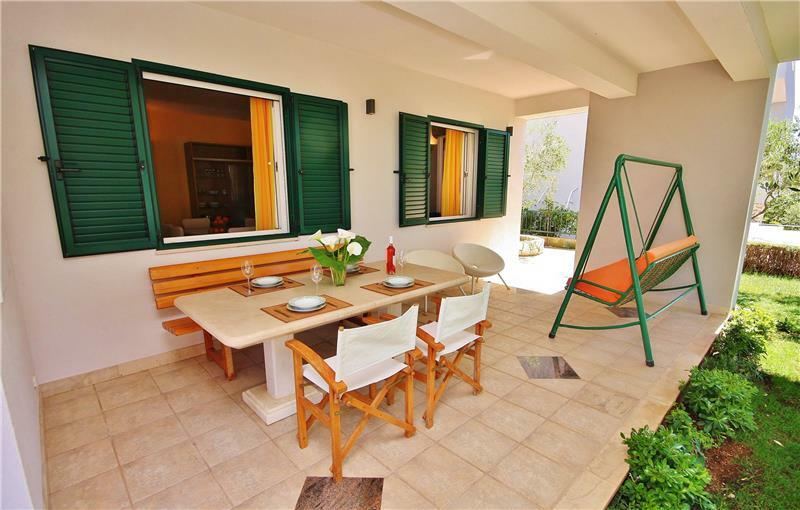 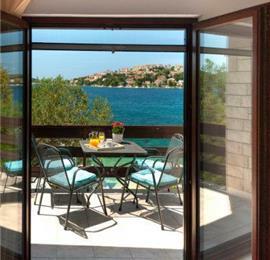 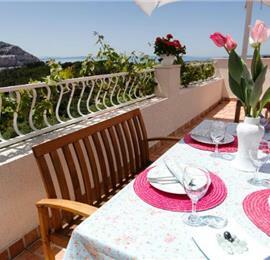 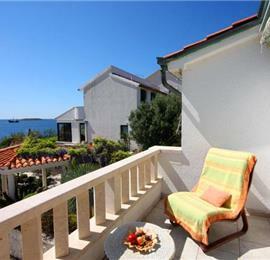 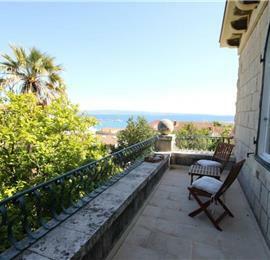 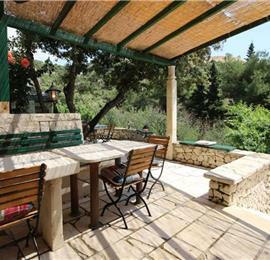 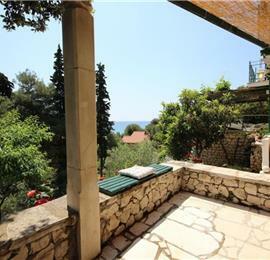 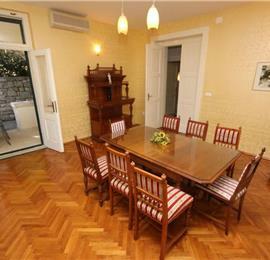 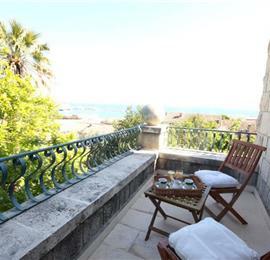 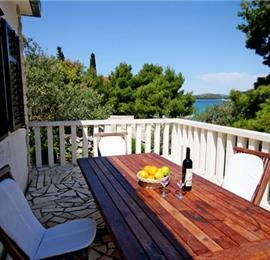 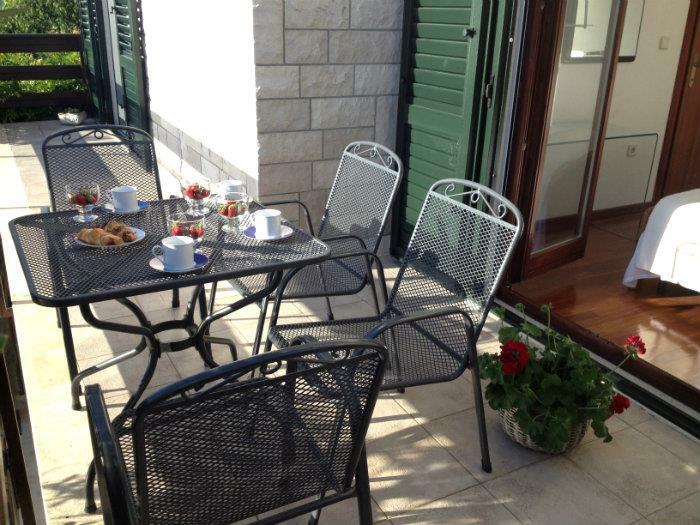 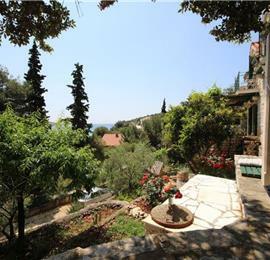 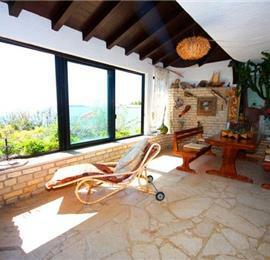 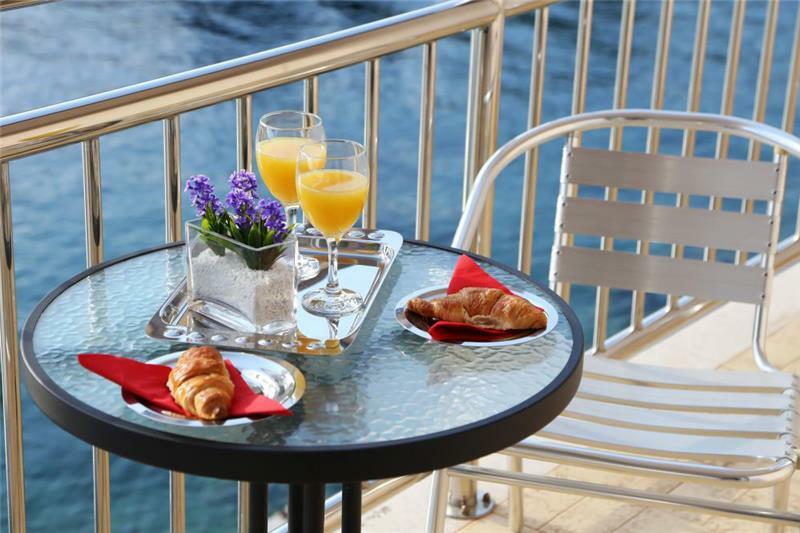 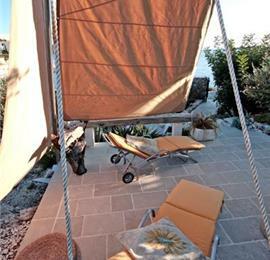 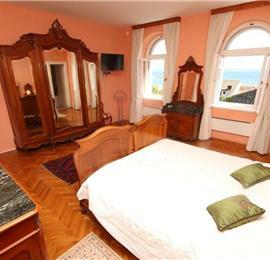 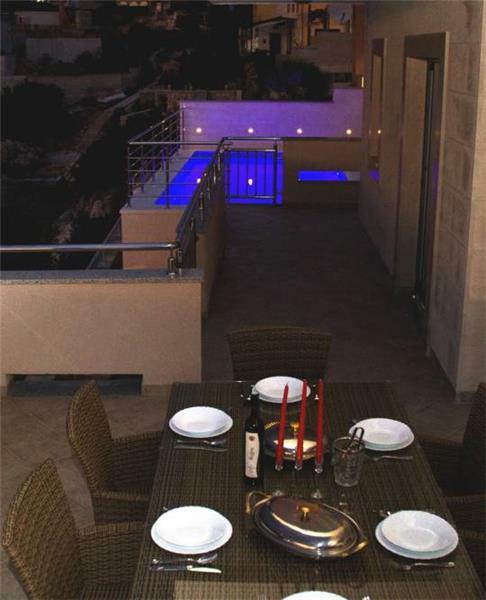 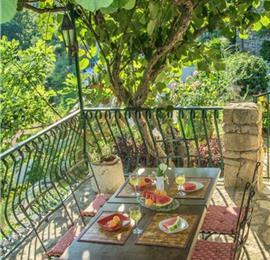 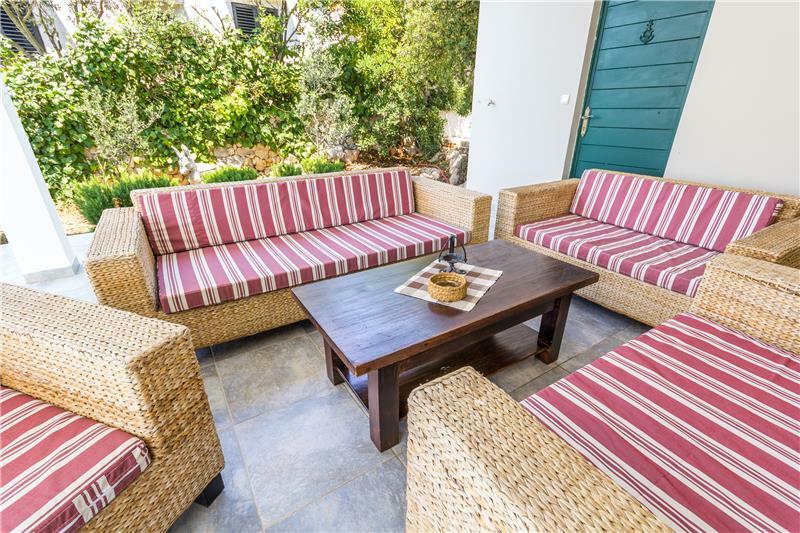 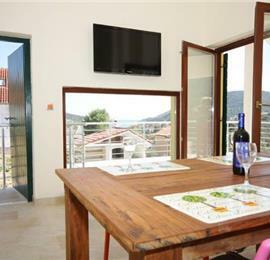 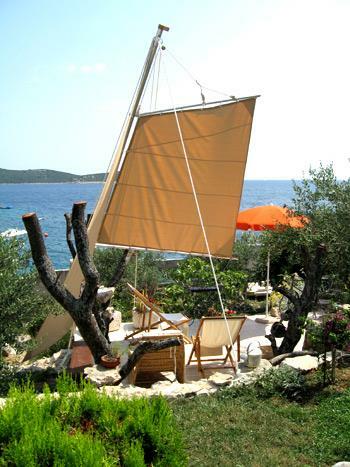 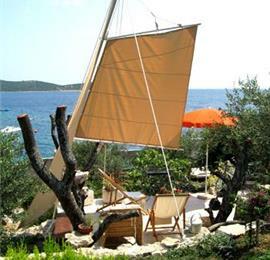 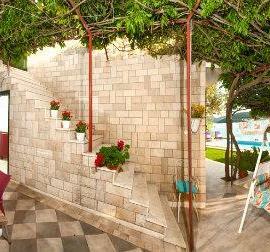 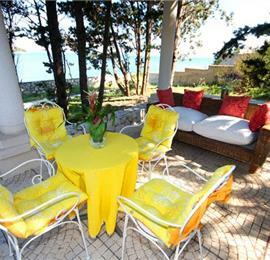 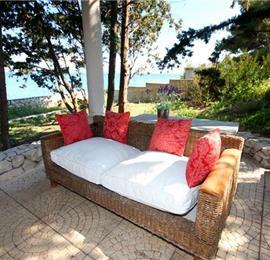 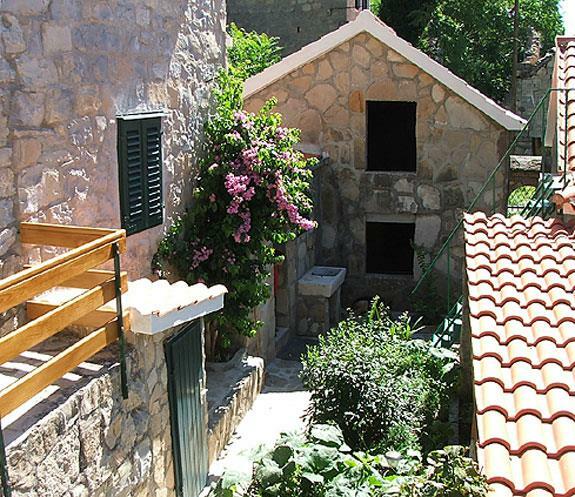 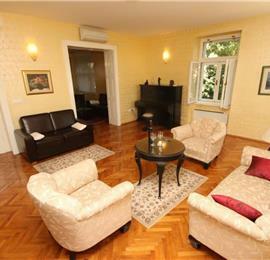 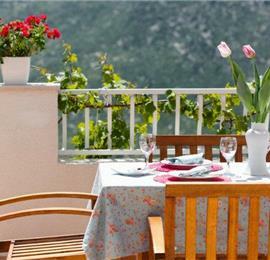 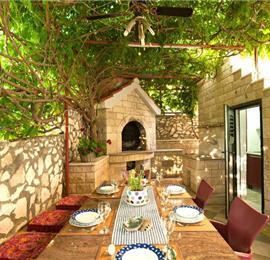 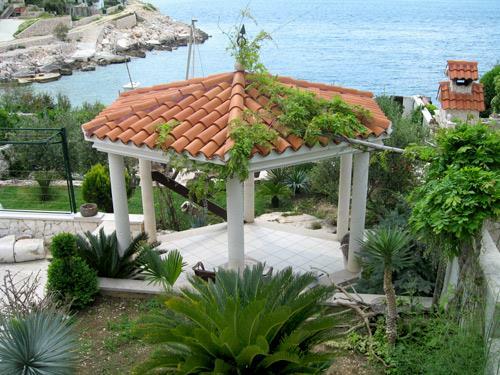 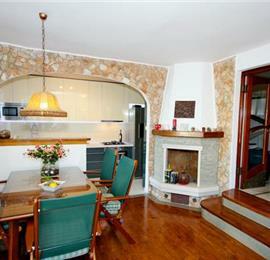 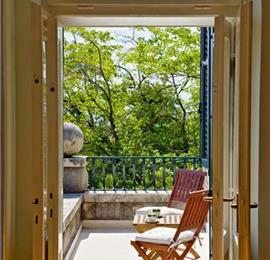 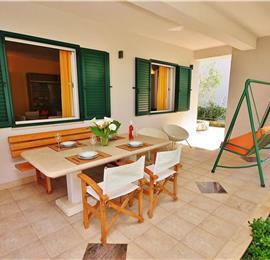 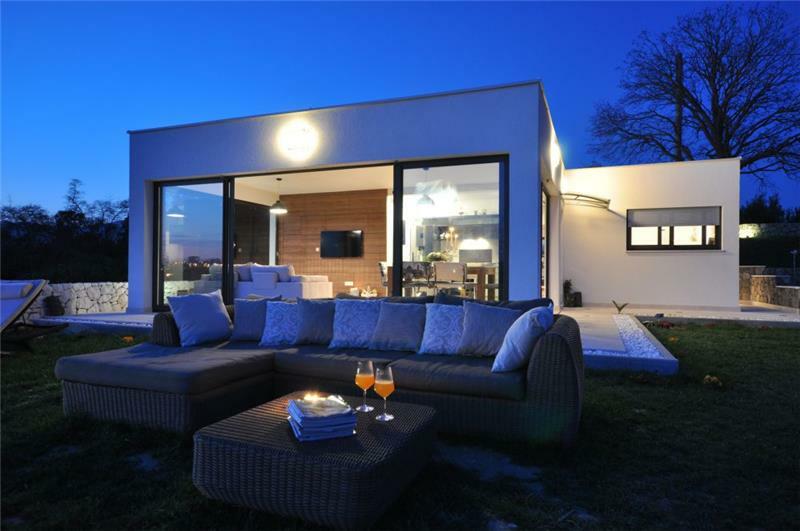 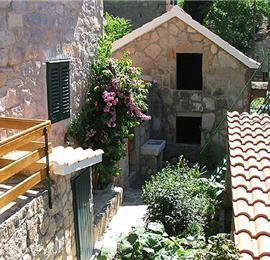 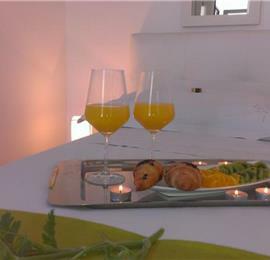 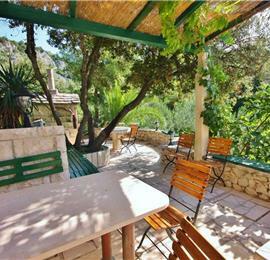 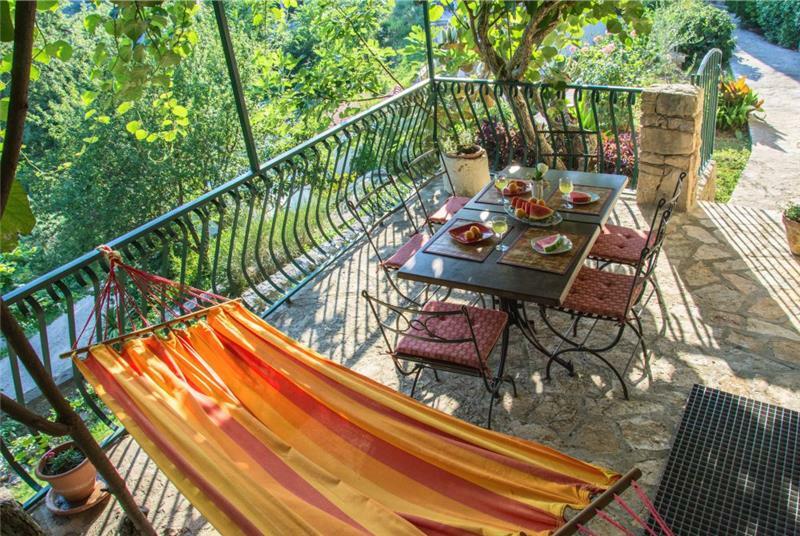 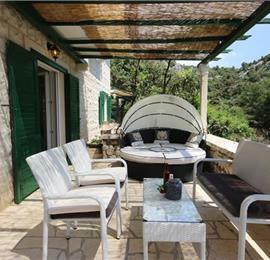 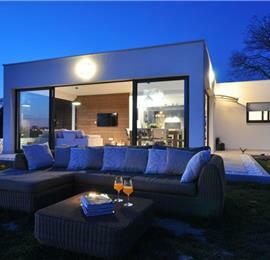 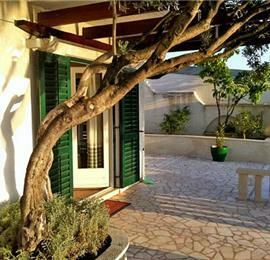 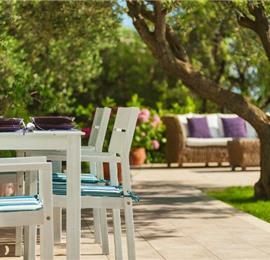 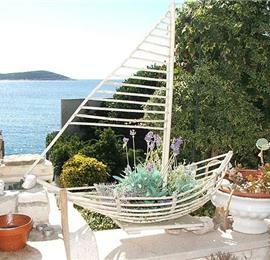 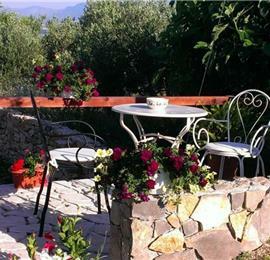 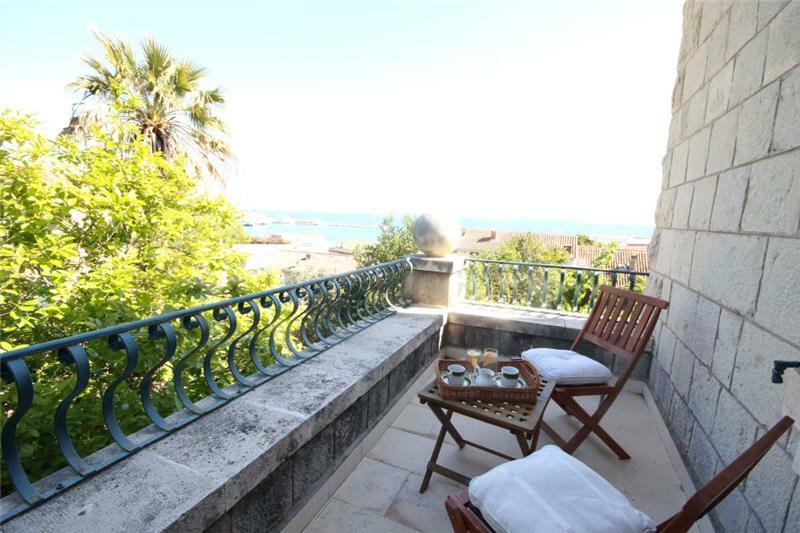 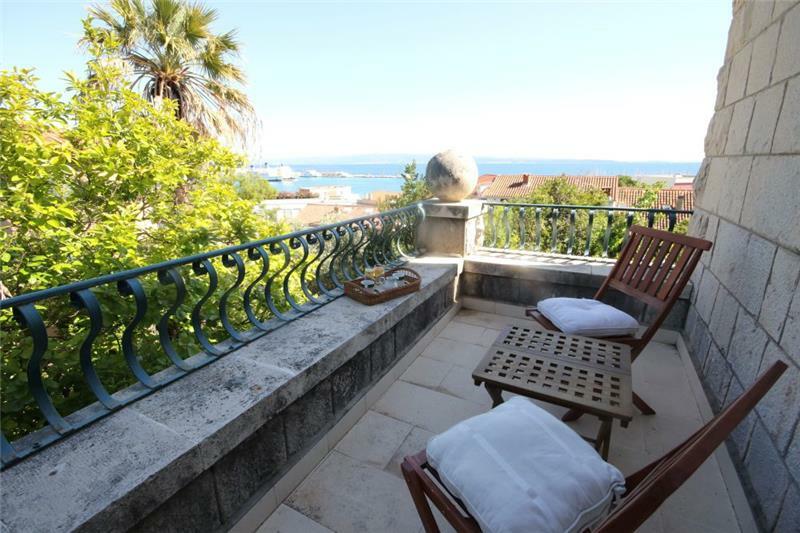 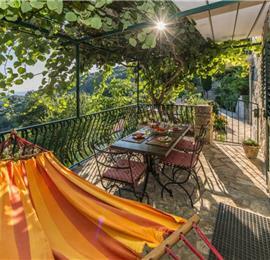 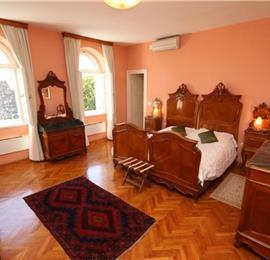 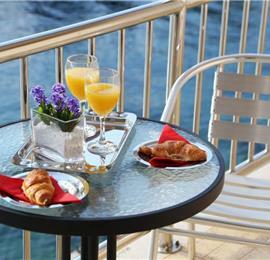 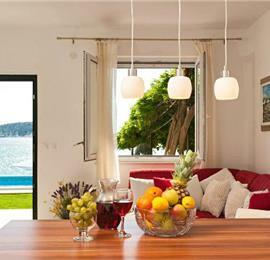 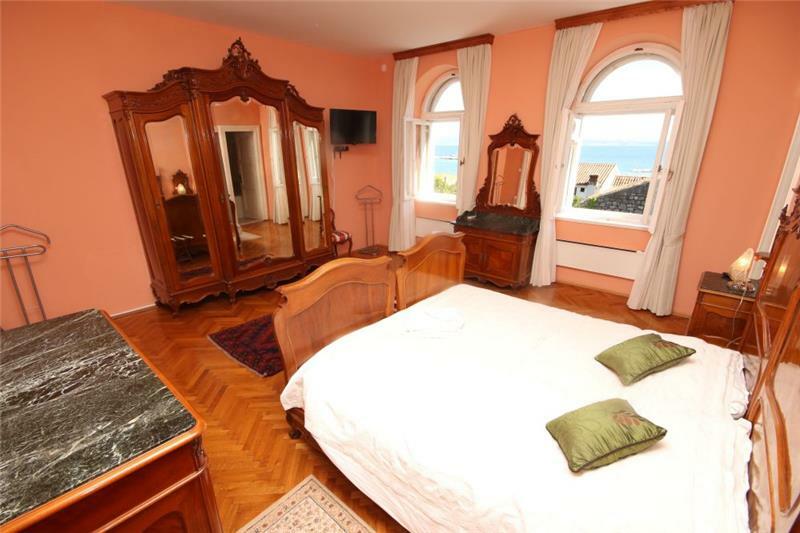 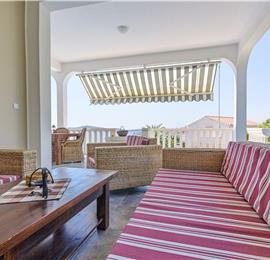 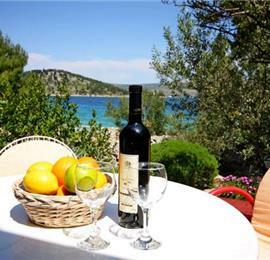 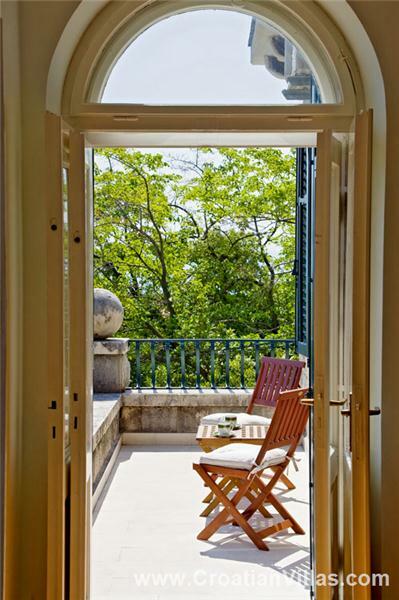 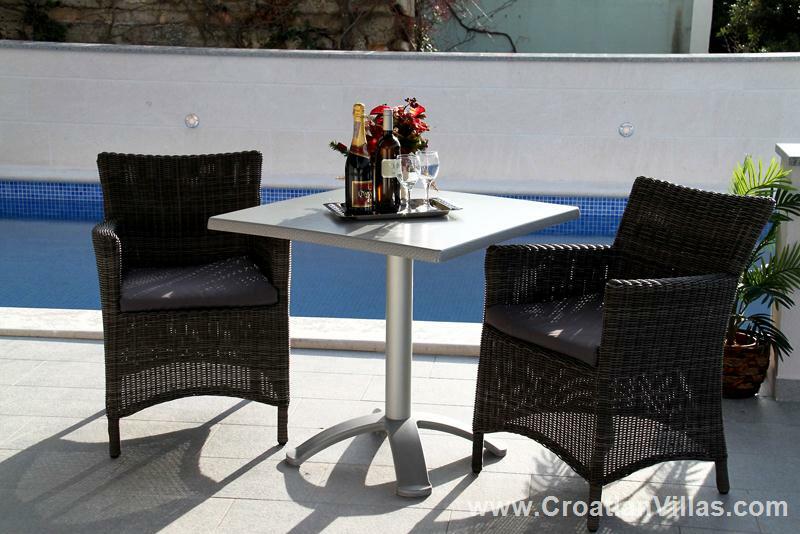 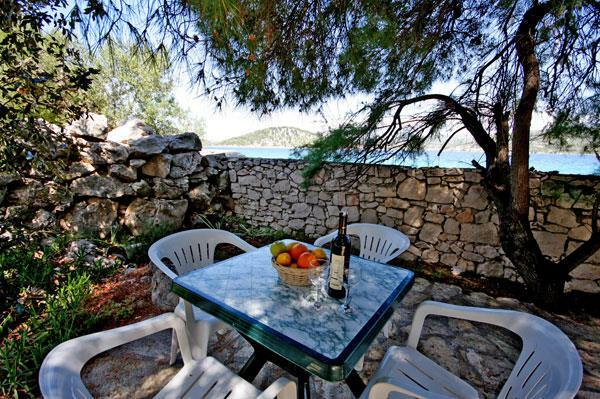 Furniture in terrace/balcony/garden: Villa is presented as 2 apartments, one above the other to form one private villa. 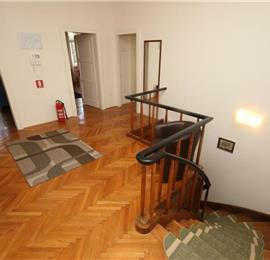 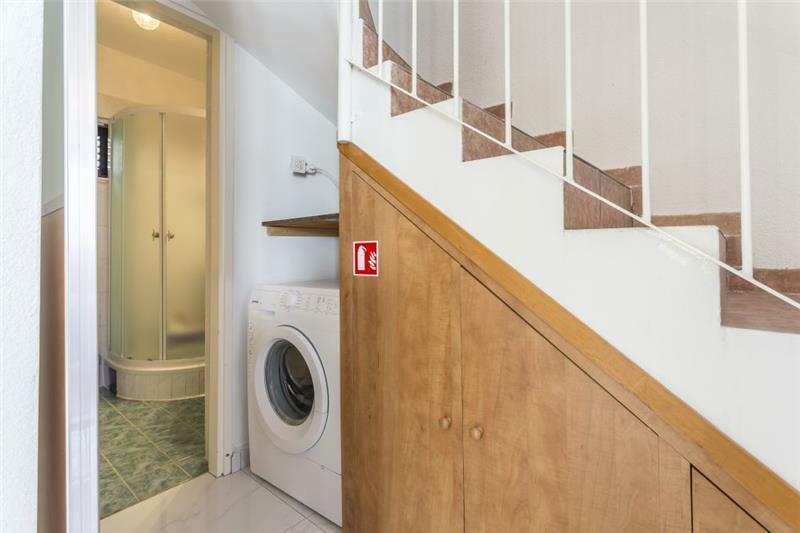 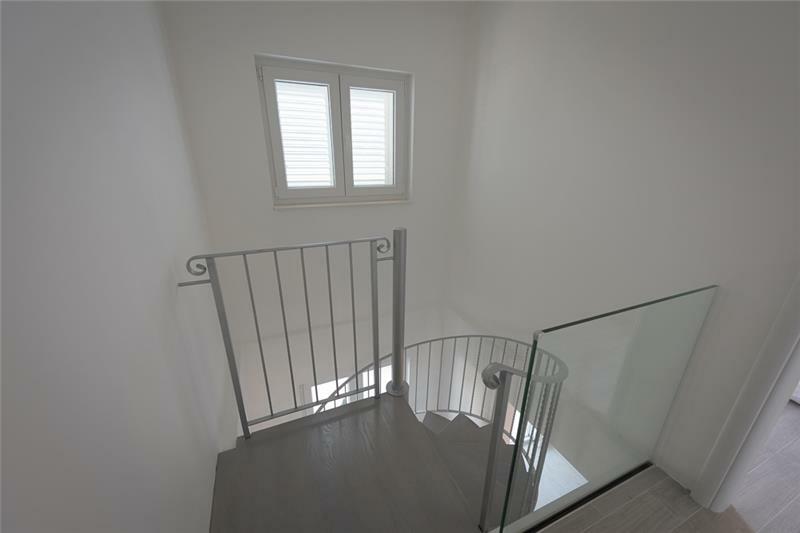 The apartments are not connected internally, access to the 1st floor apartment is via outside steps. 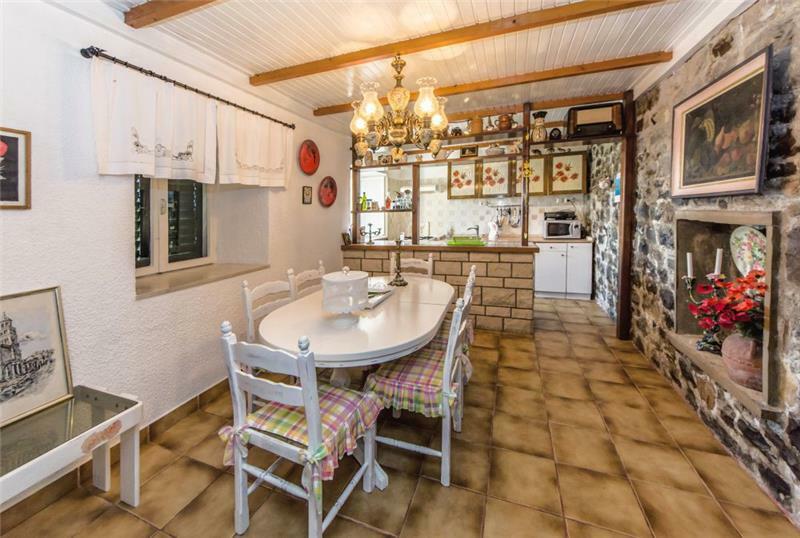 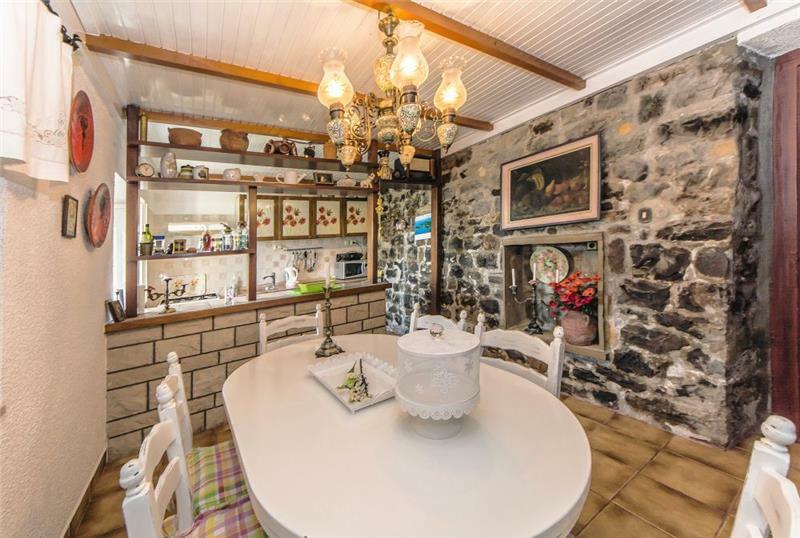 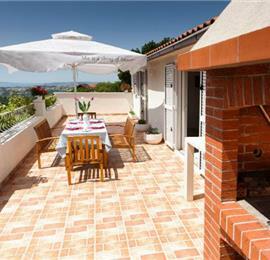 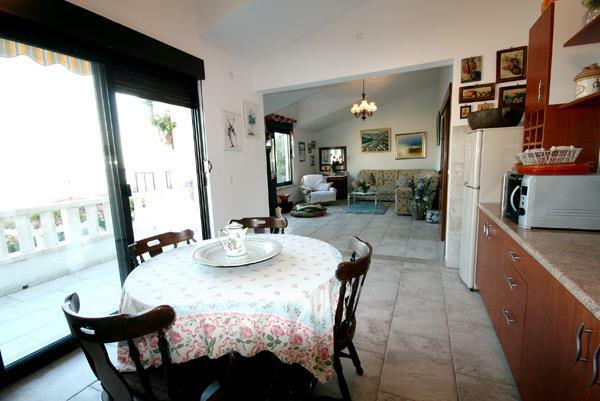 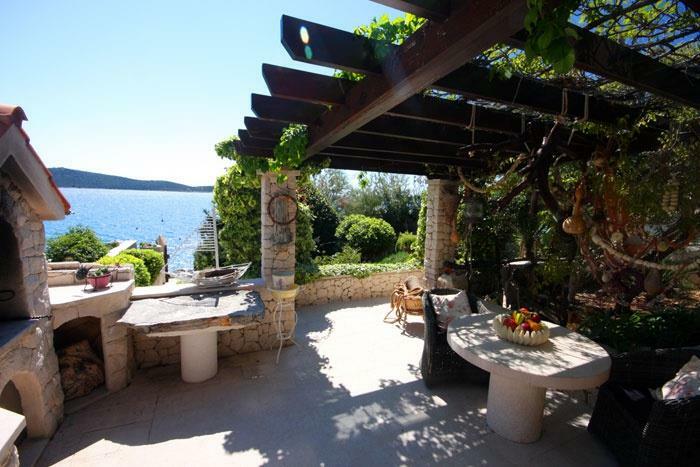 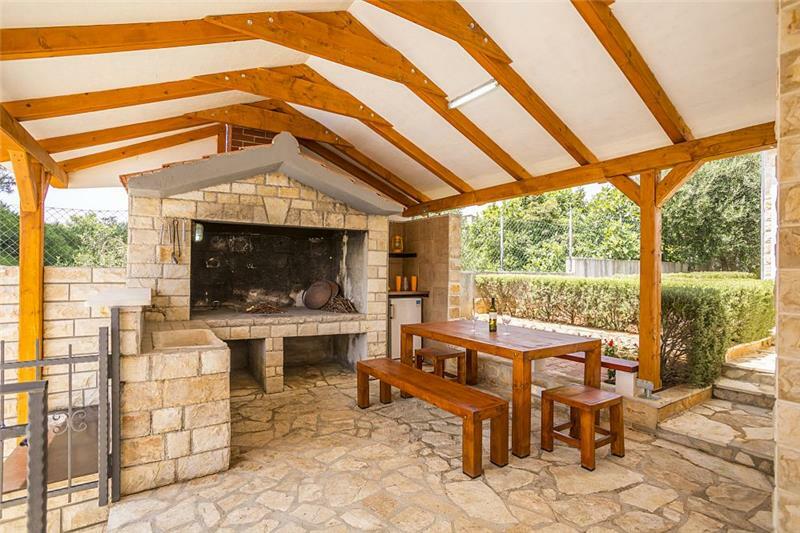 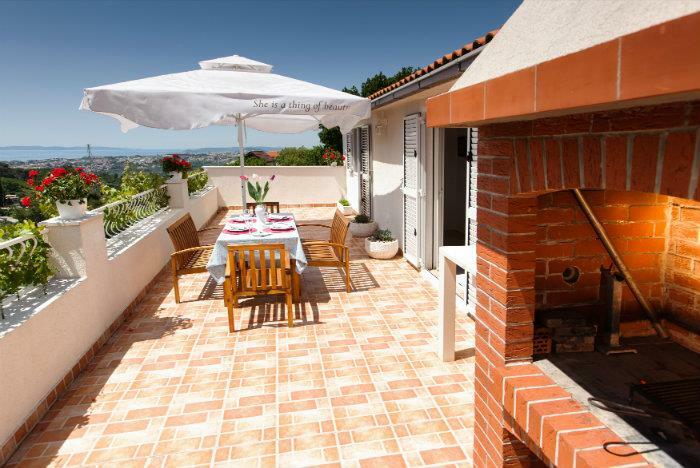 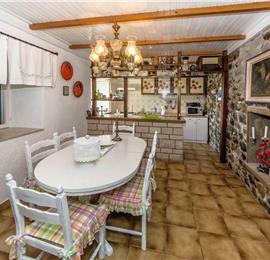 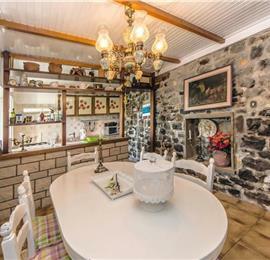 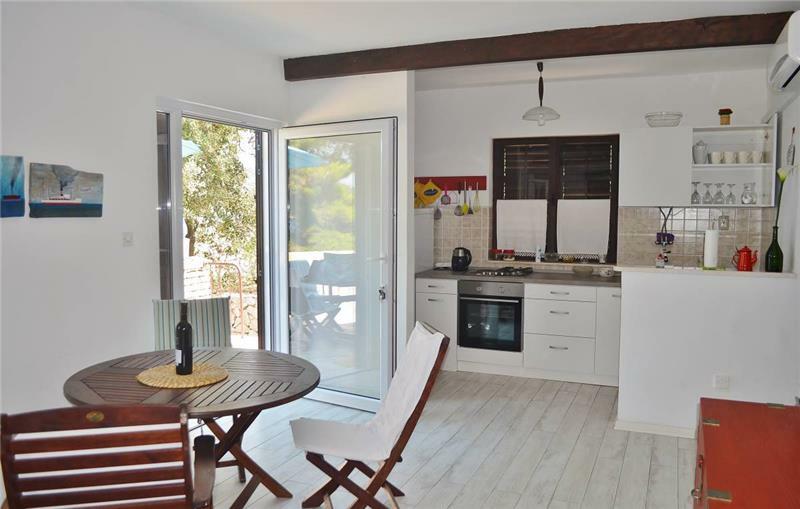 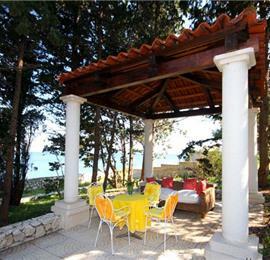 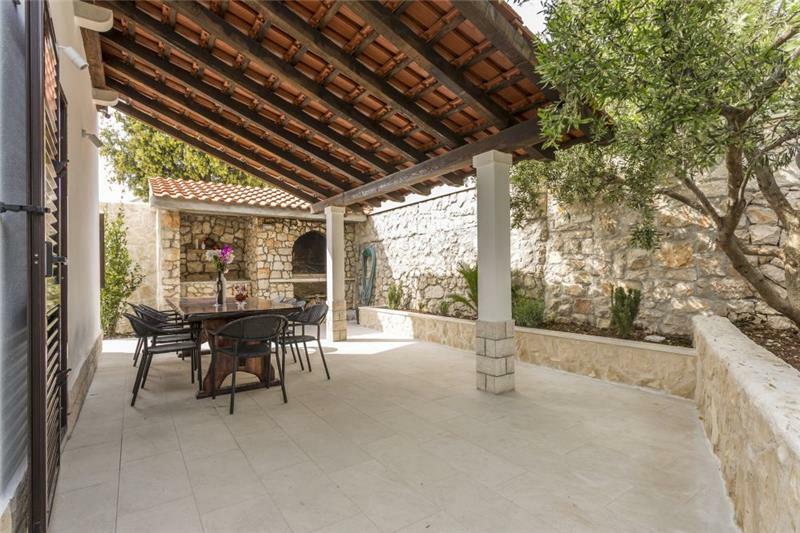 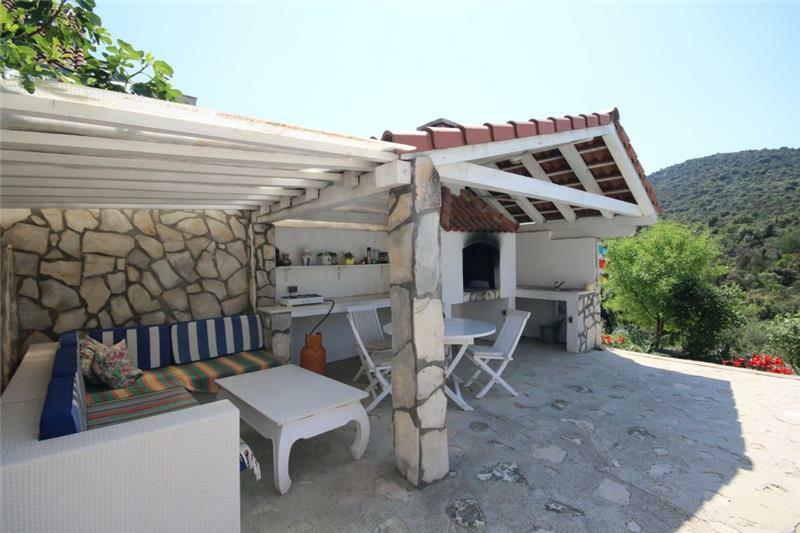 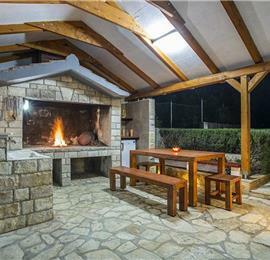 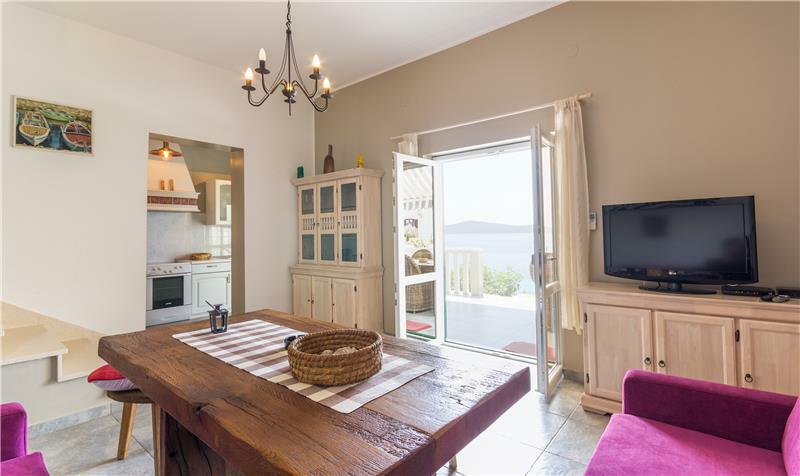 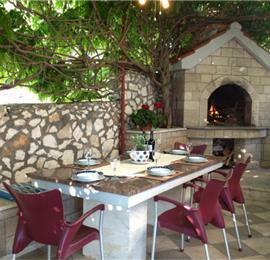 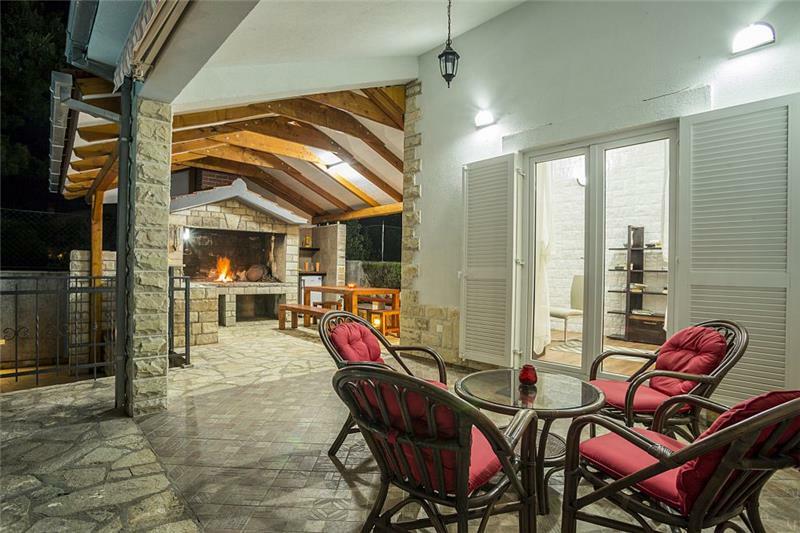 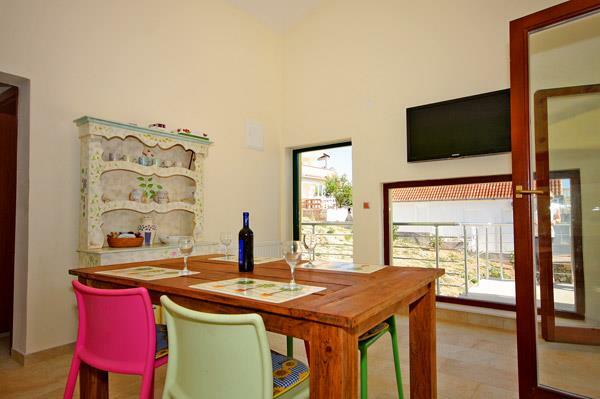 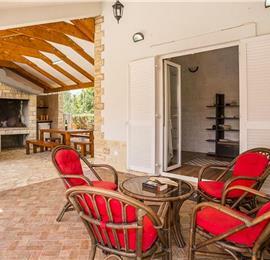 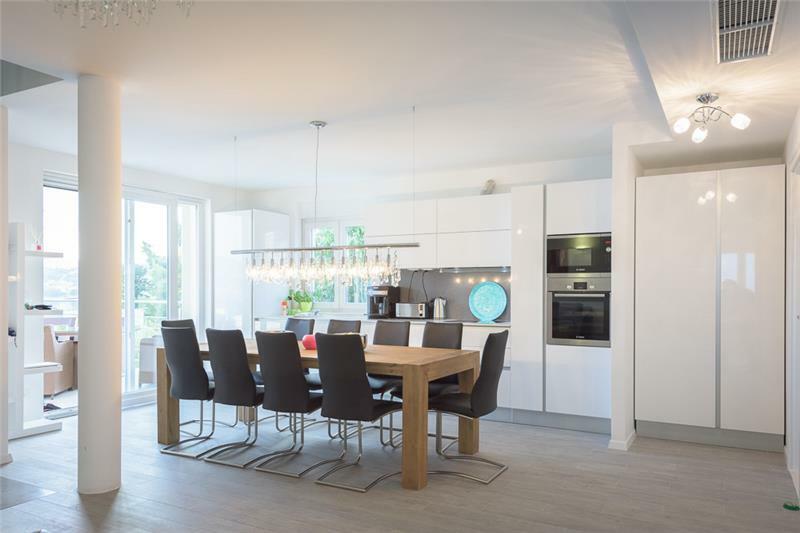 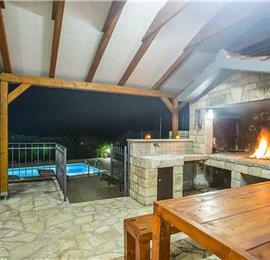 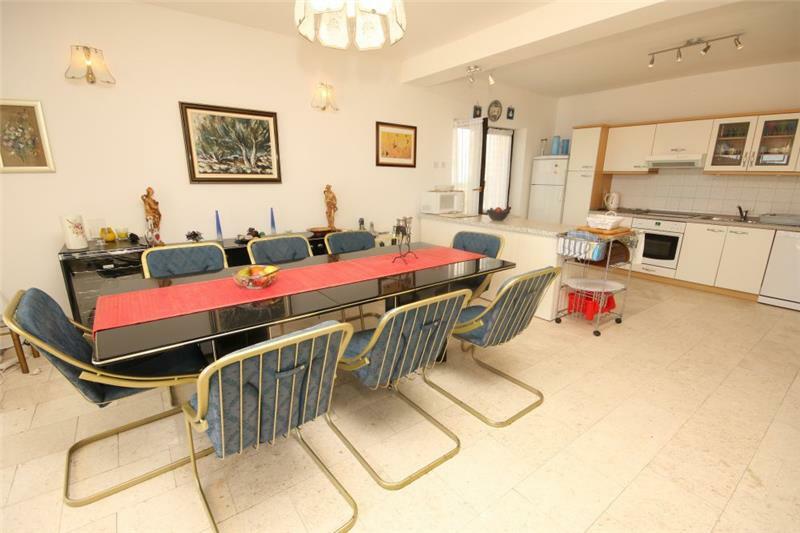 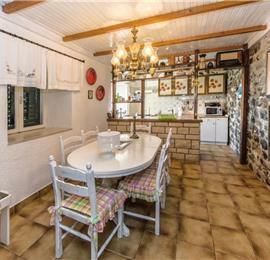 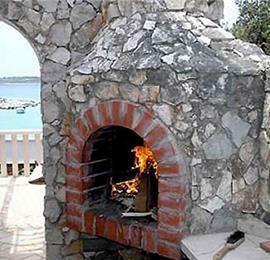 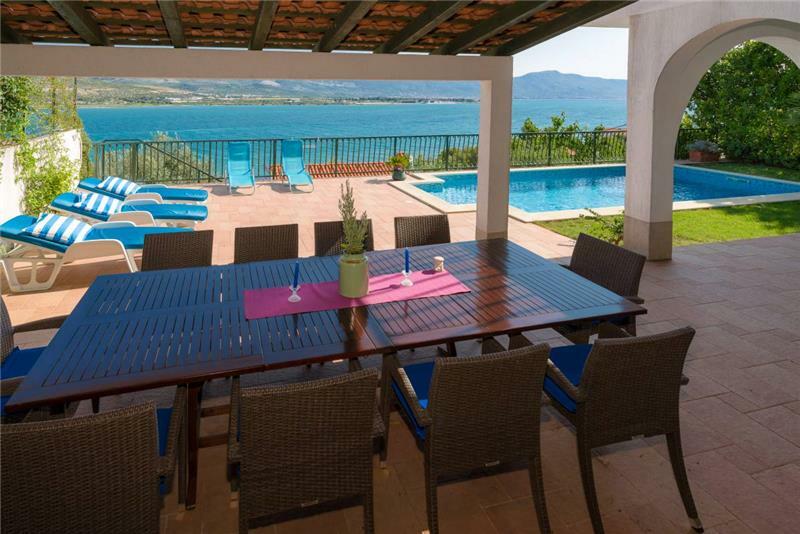 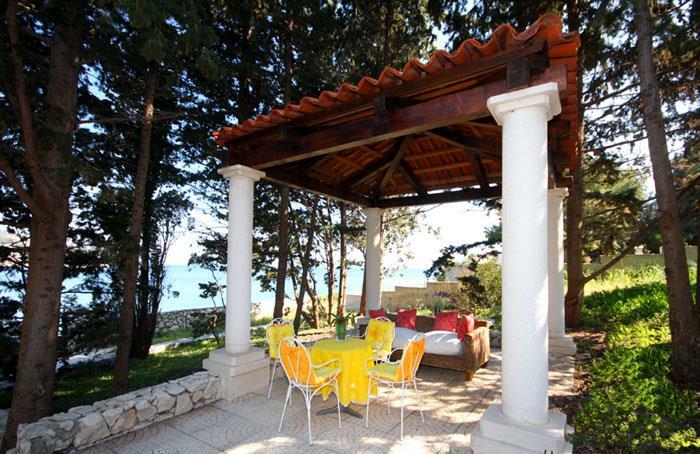 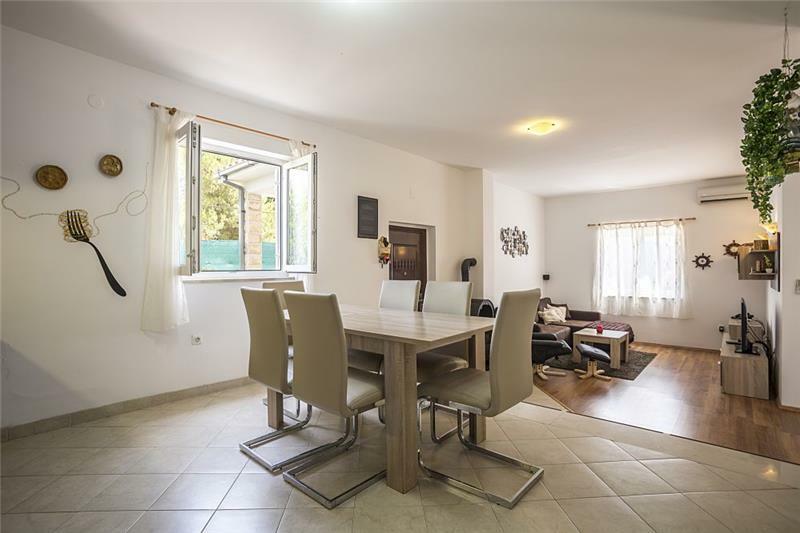 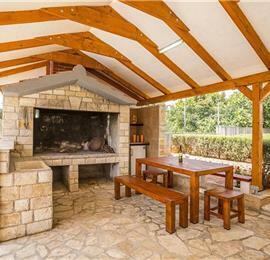 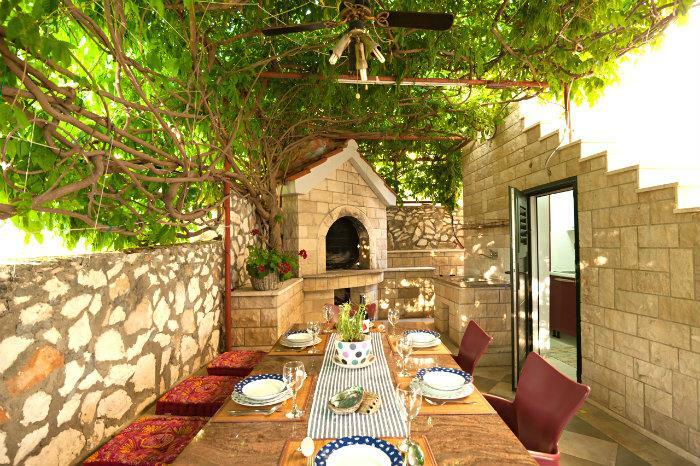 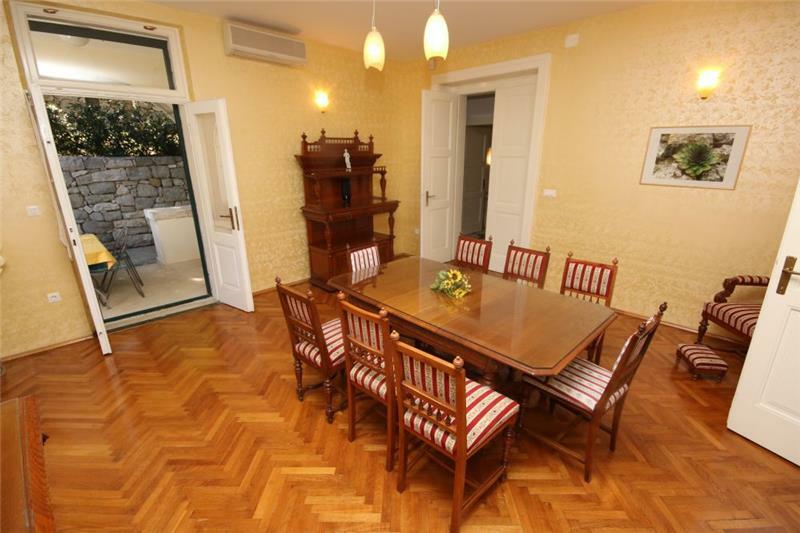 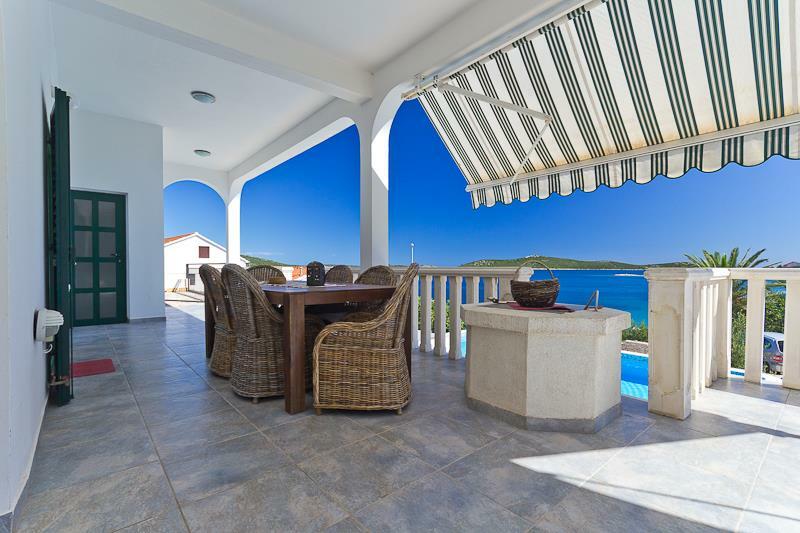 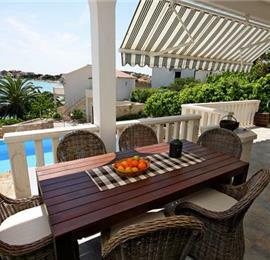 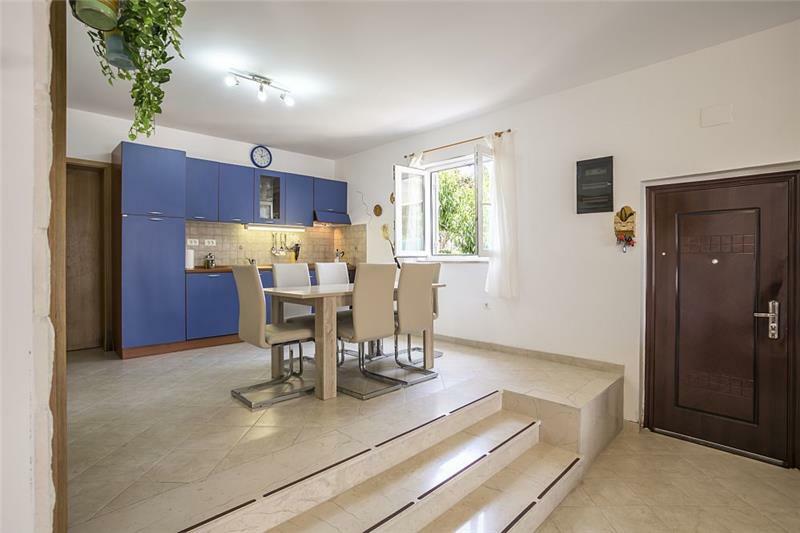 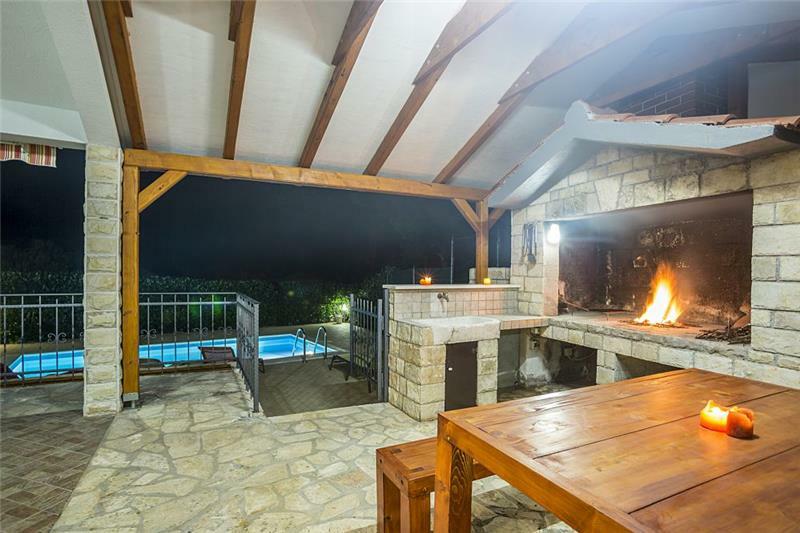 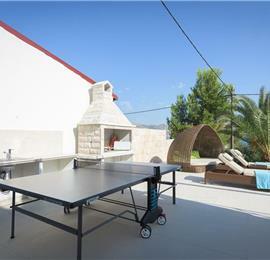 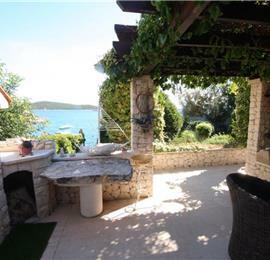 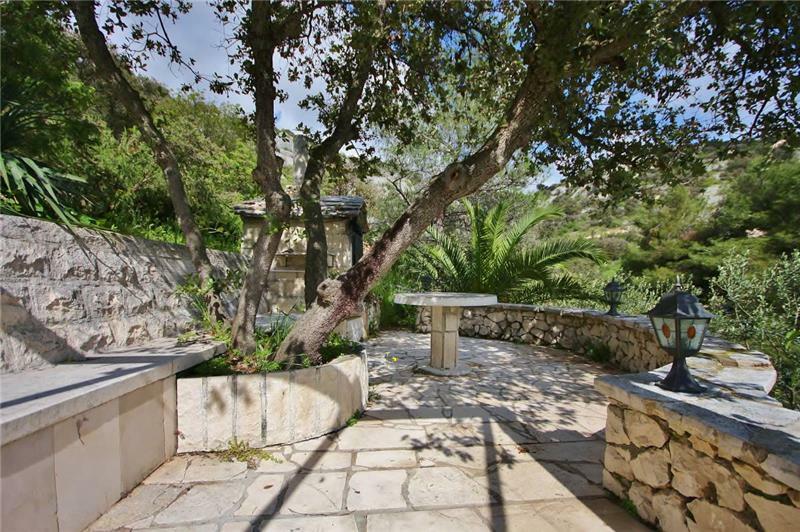 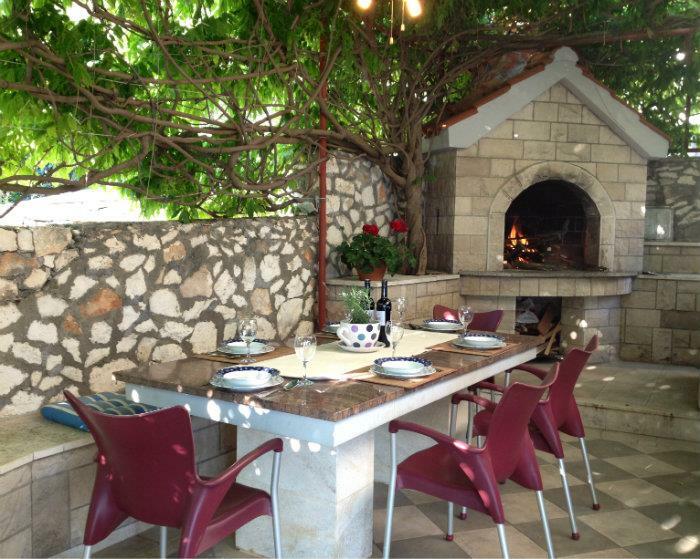 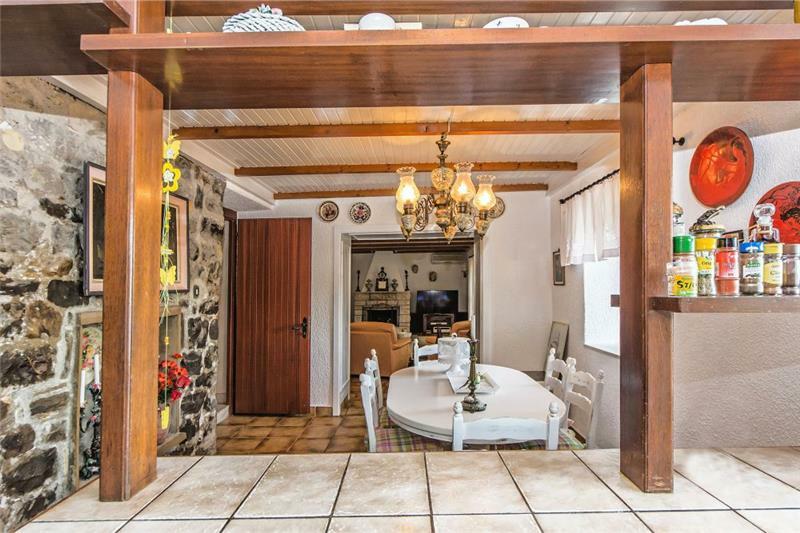 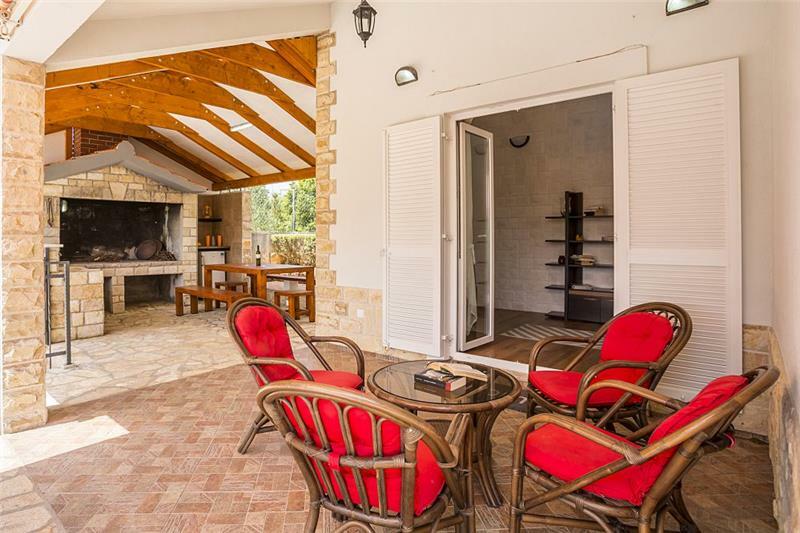 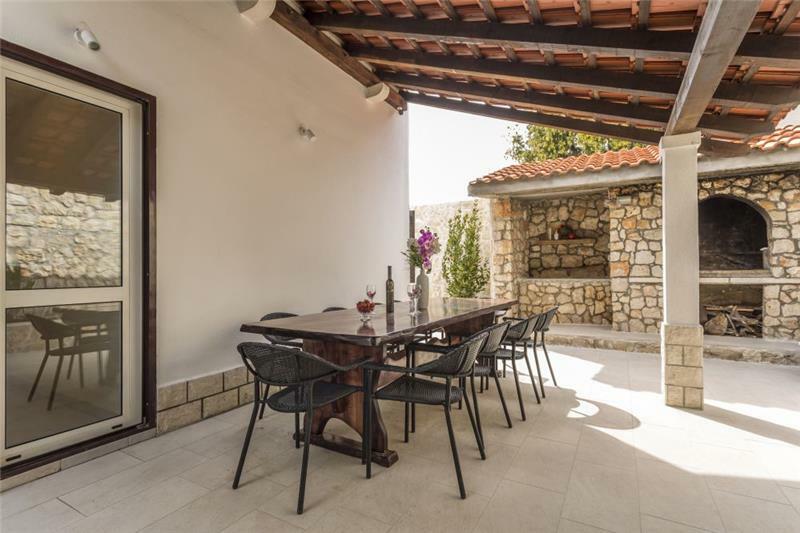 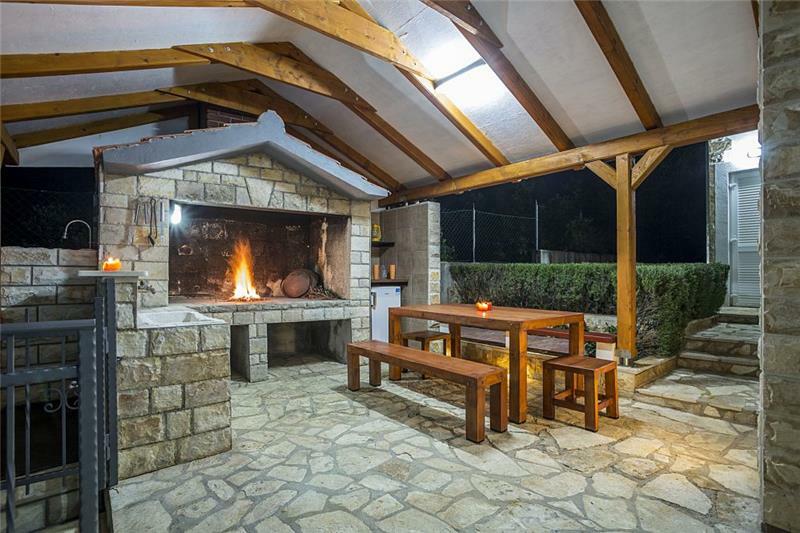 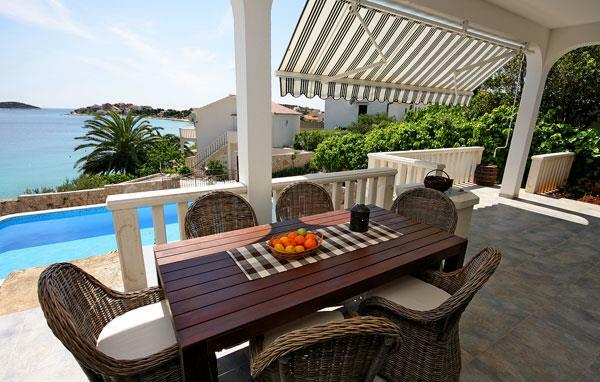 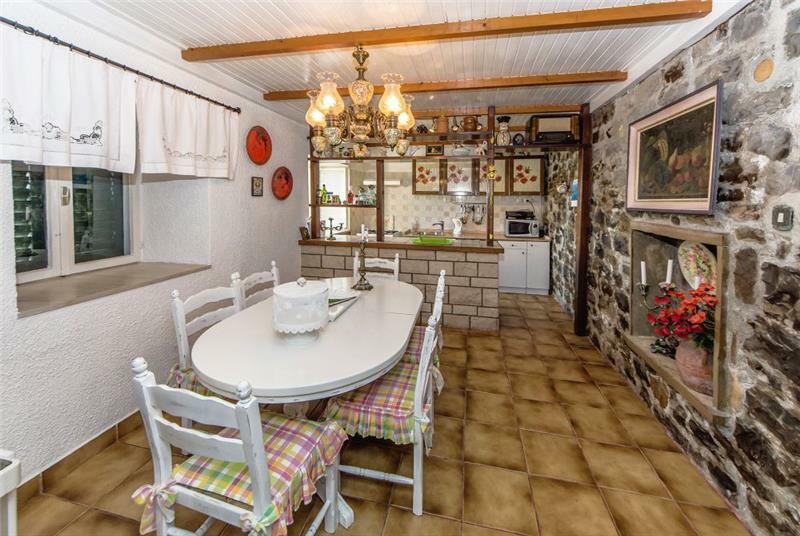 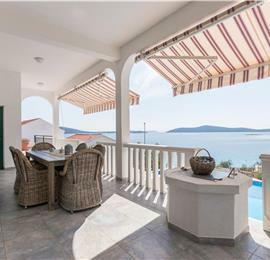 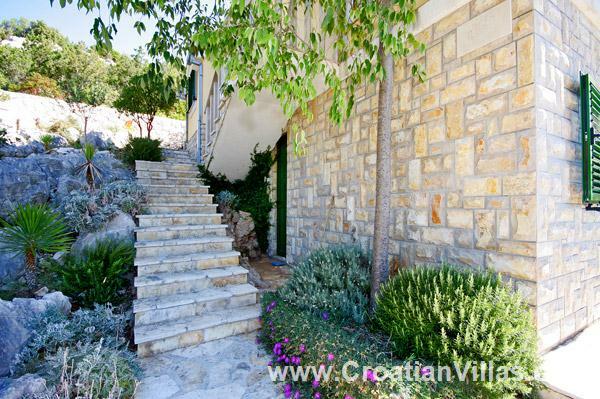 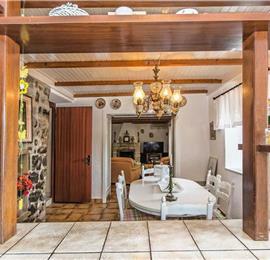 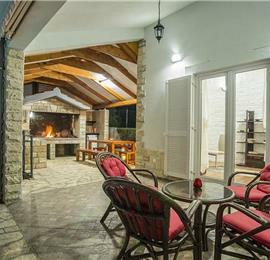 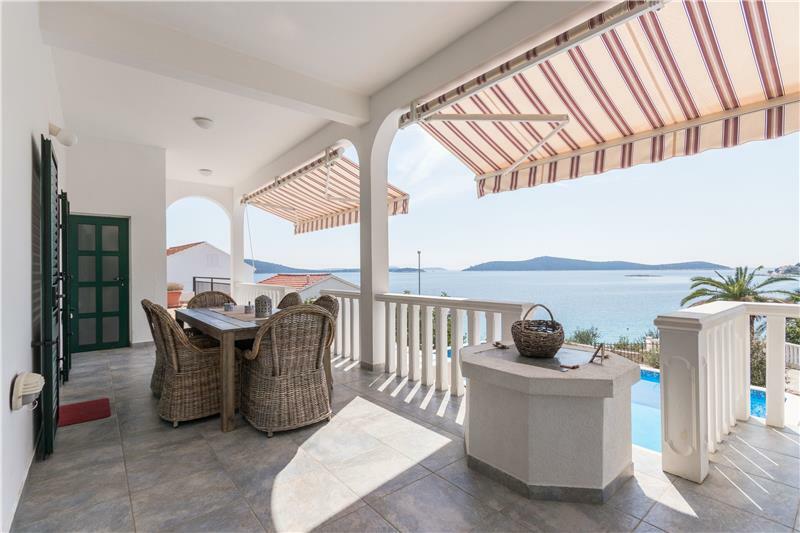 On one side of the villa is a covered dining area with BBQ and summer kitchen. 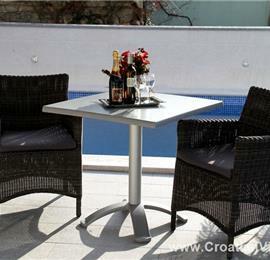 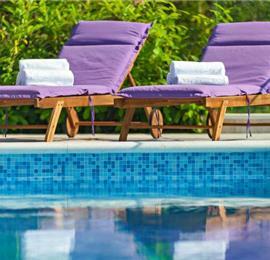 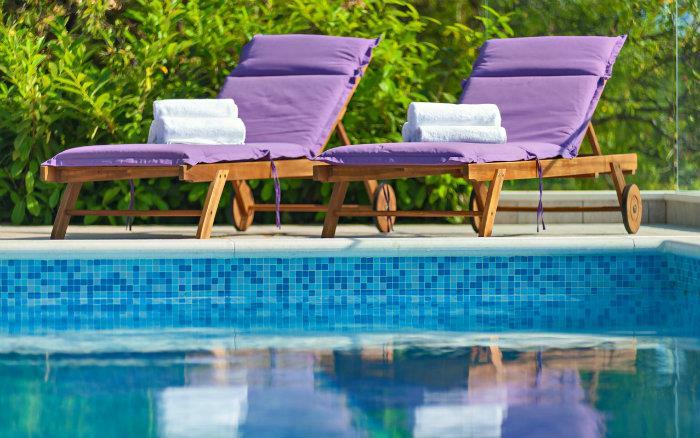 There are table and chairs on the terrace and recliners around the pool. 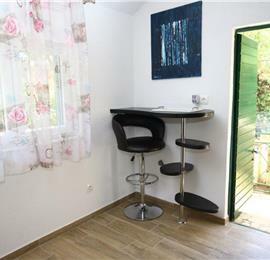 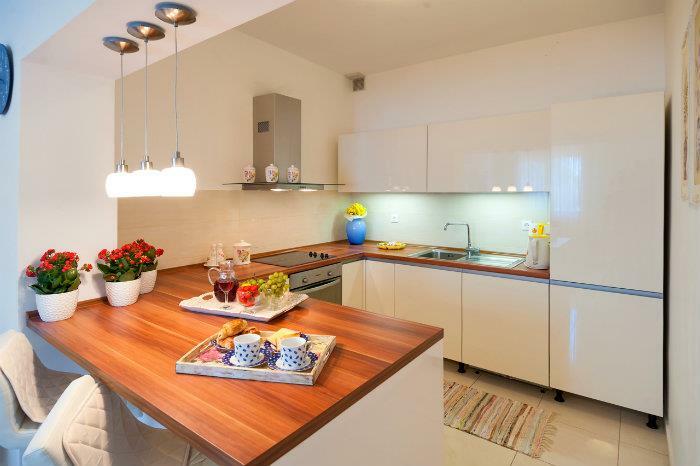 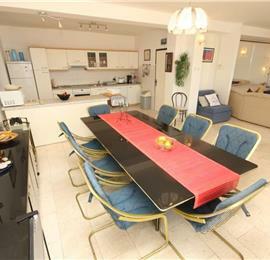 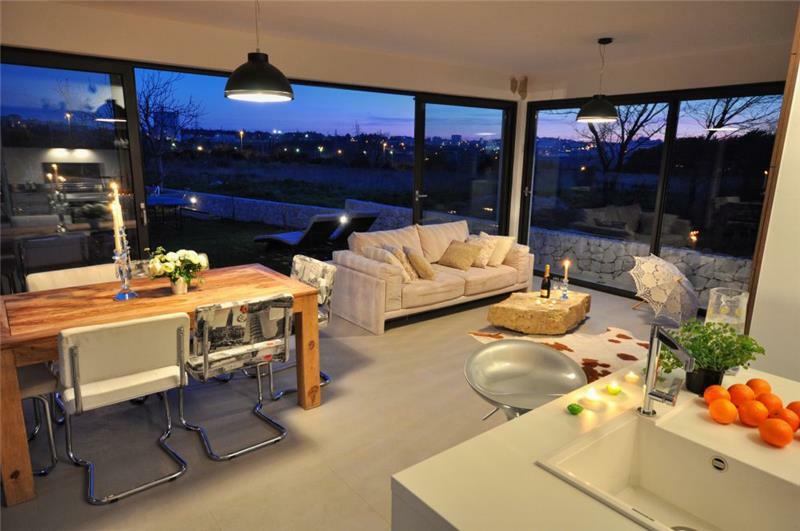 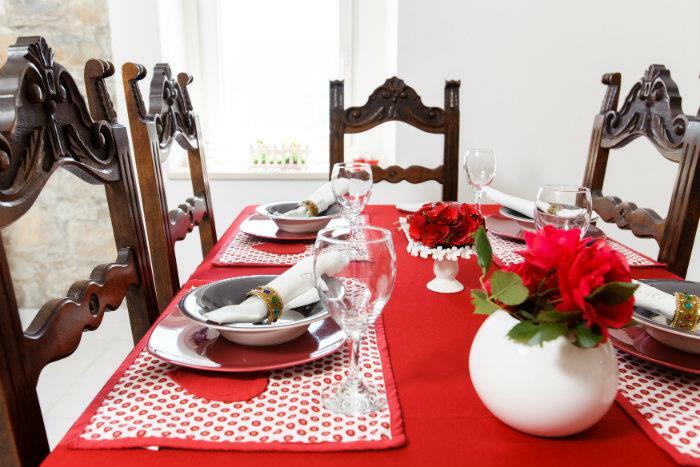 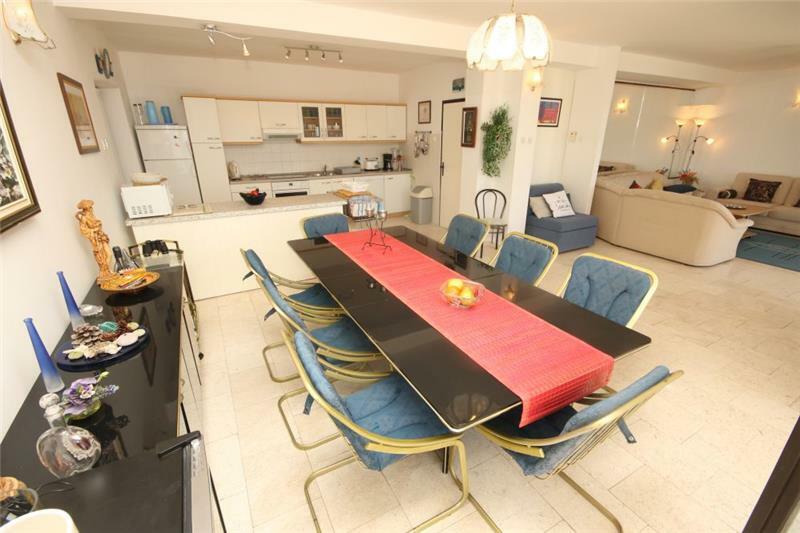 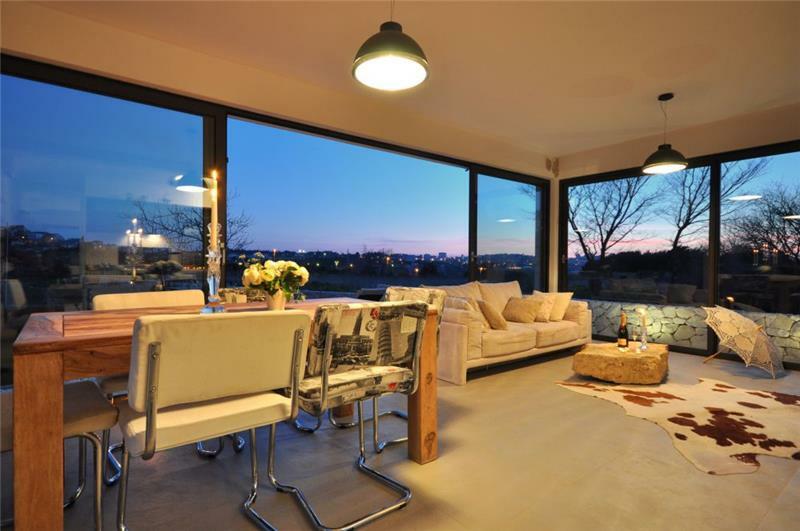 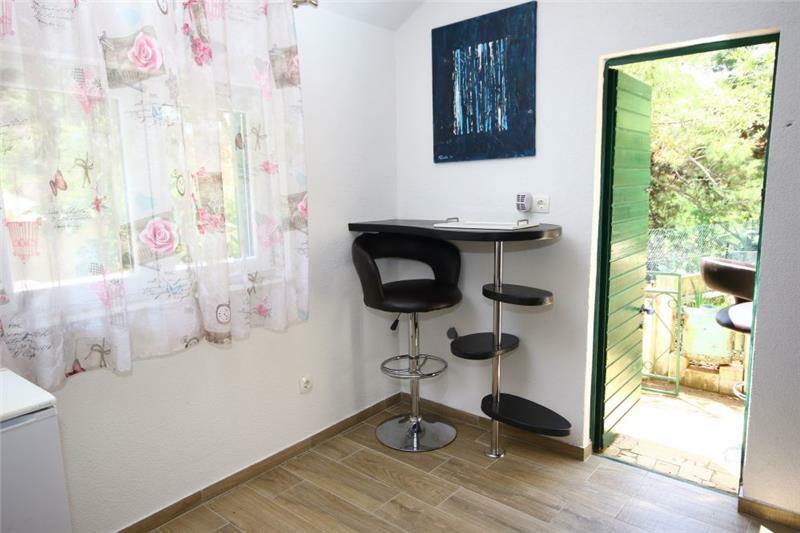 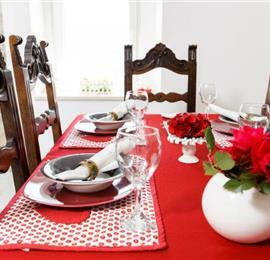 Both apartments feature a bistro table and chairs. 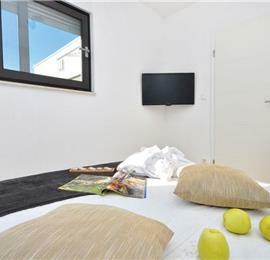 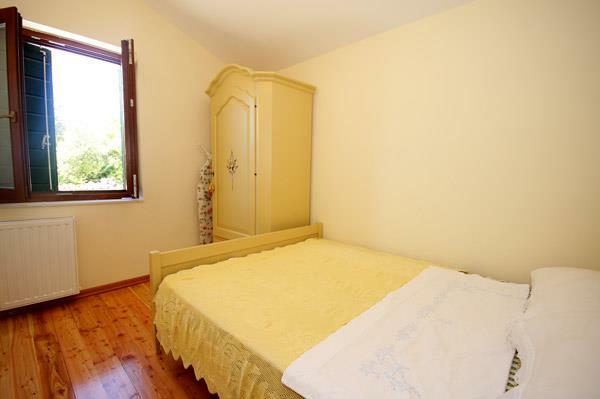 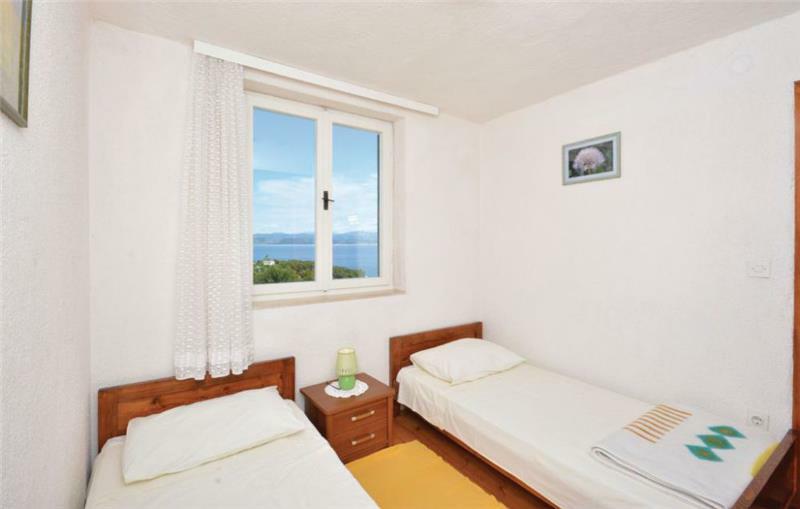 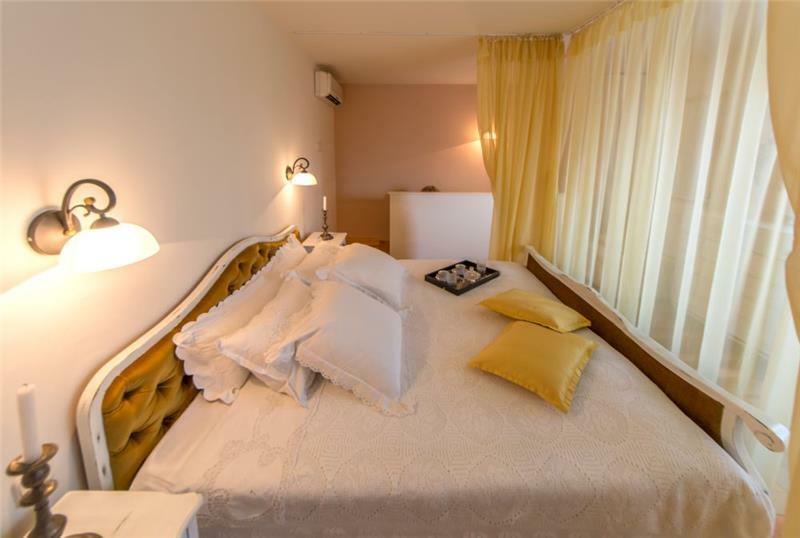 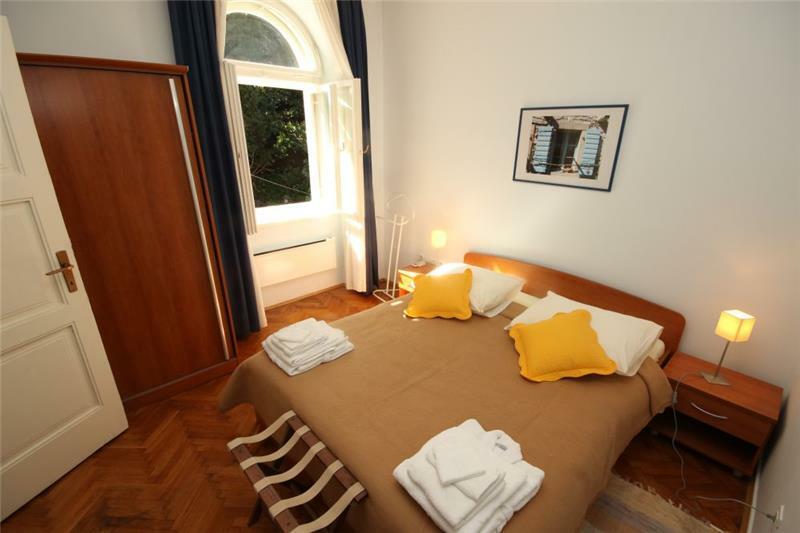 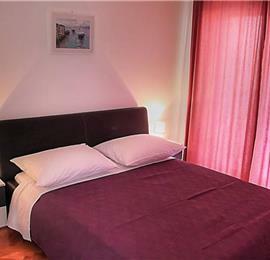 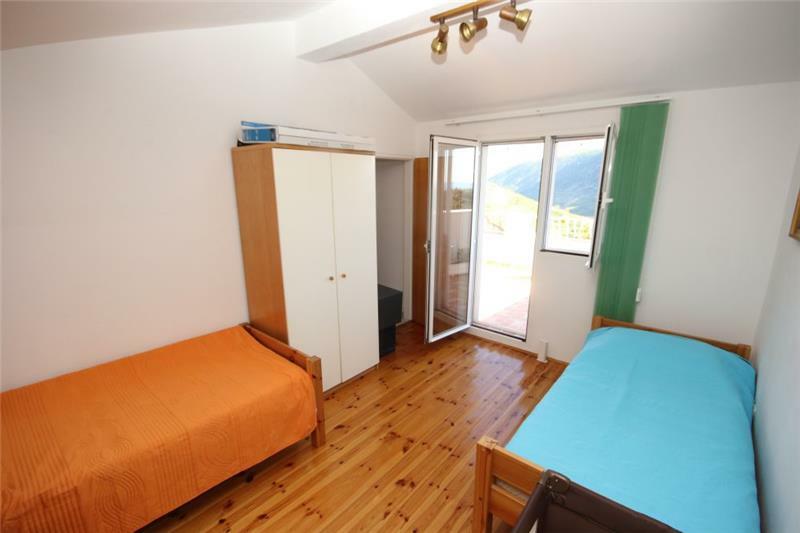 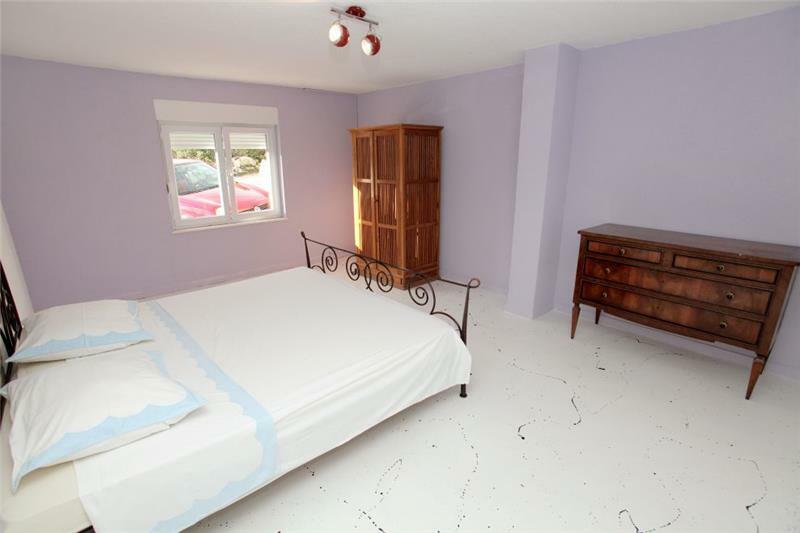 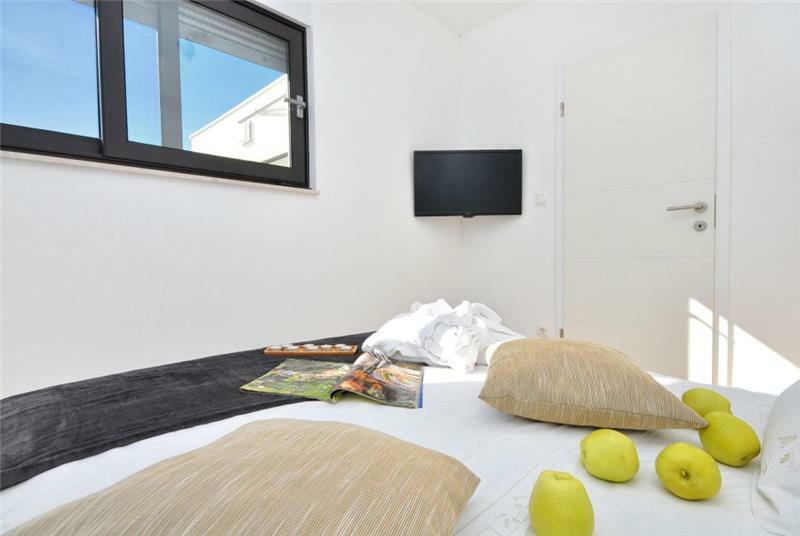 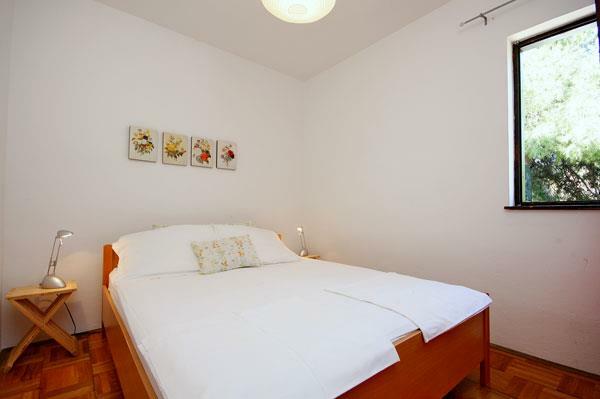 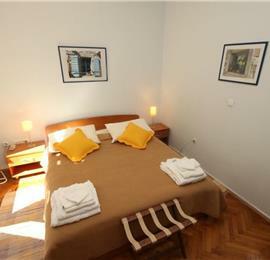 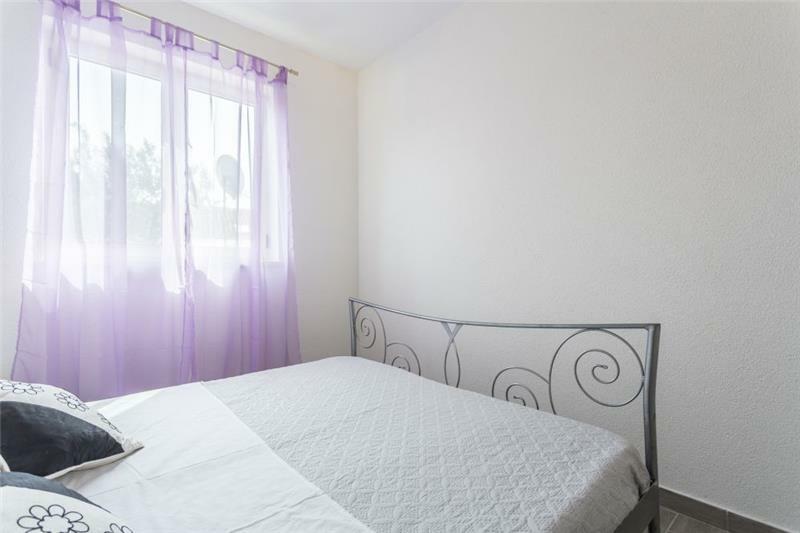 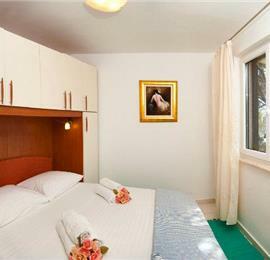 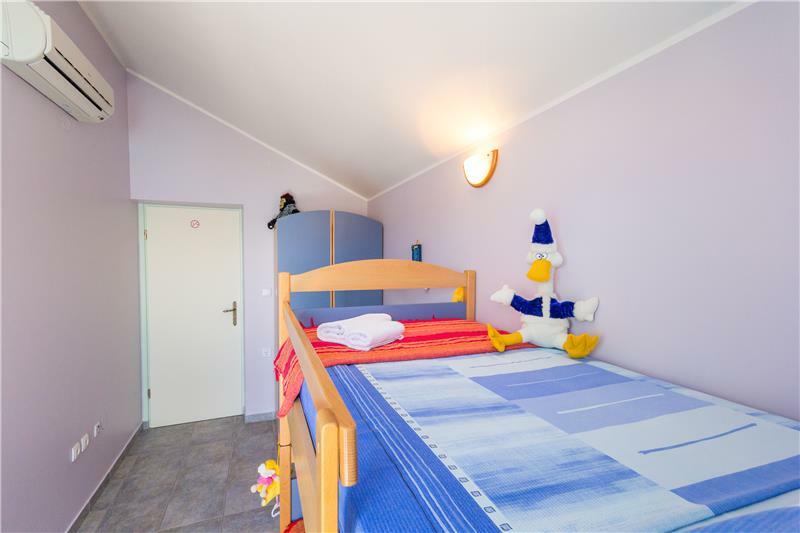 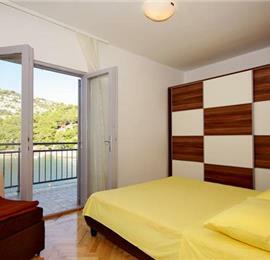 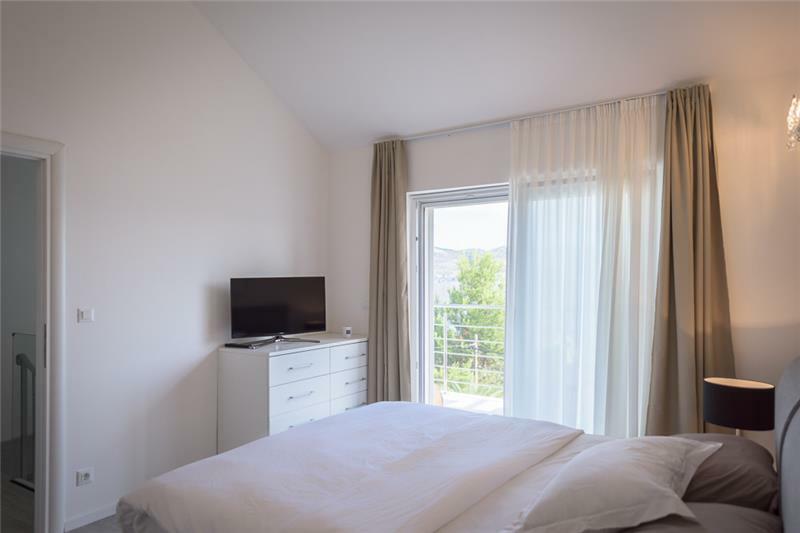 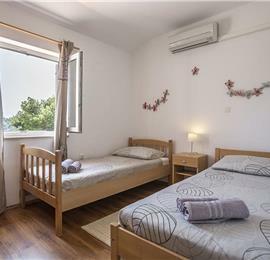 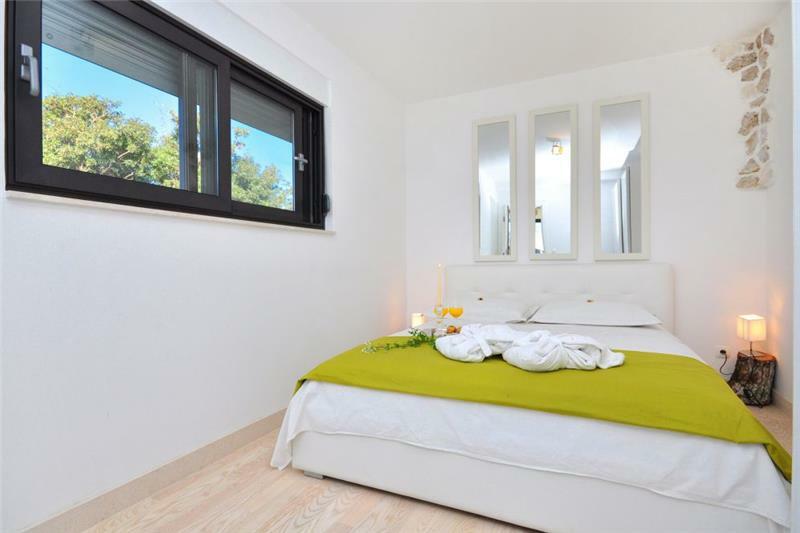 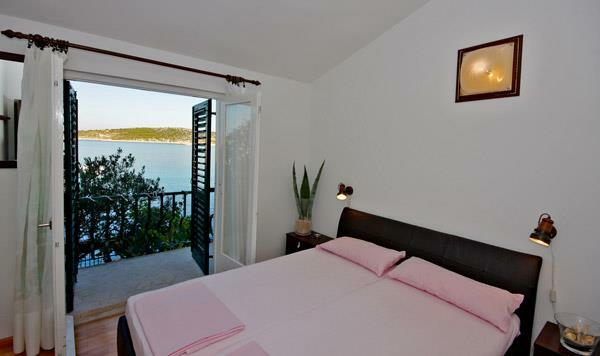 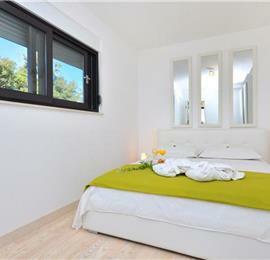 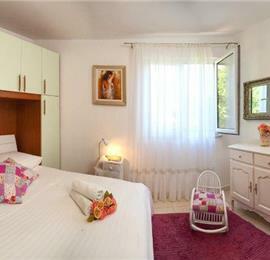 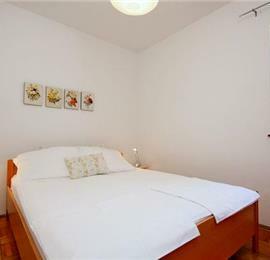 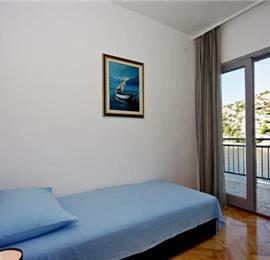 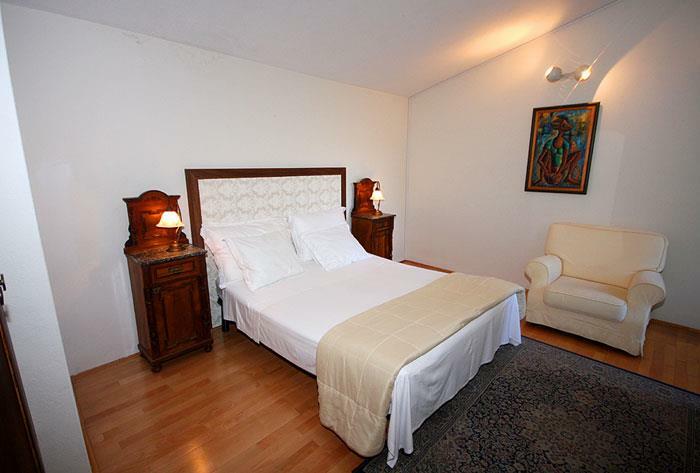 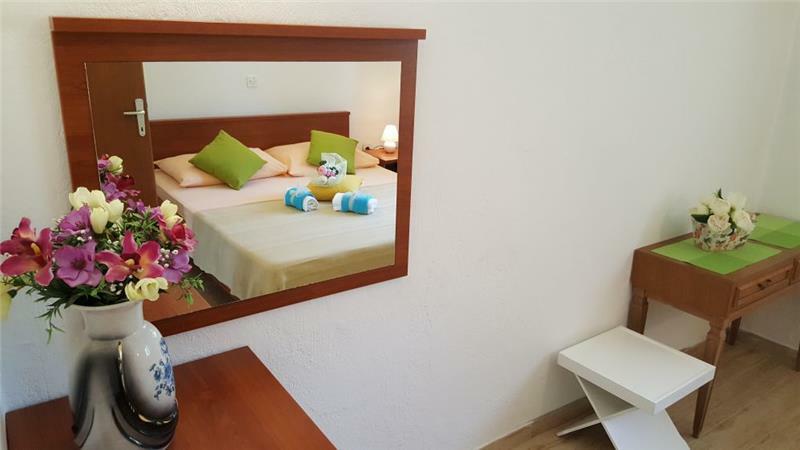 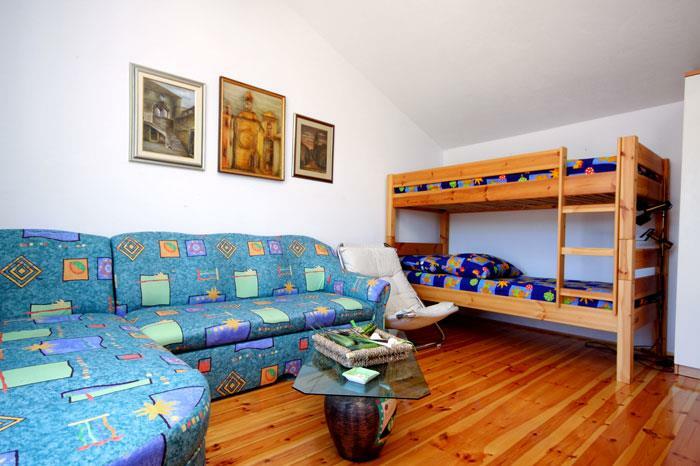 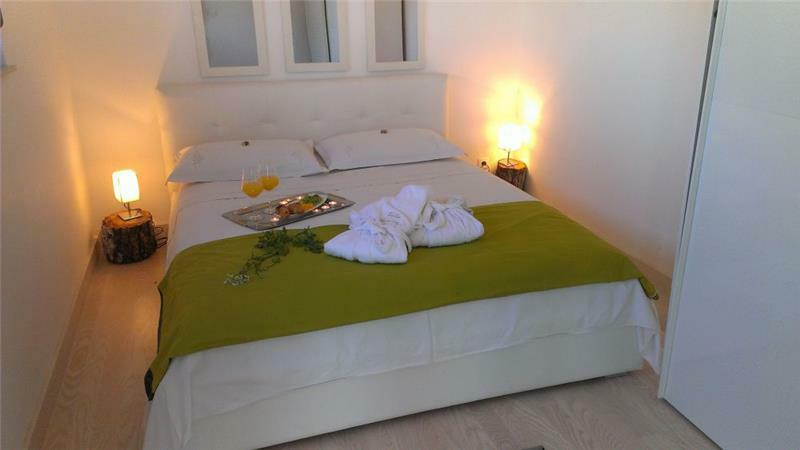 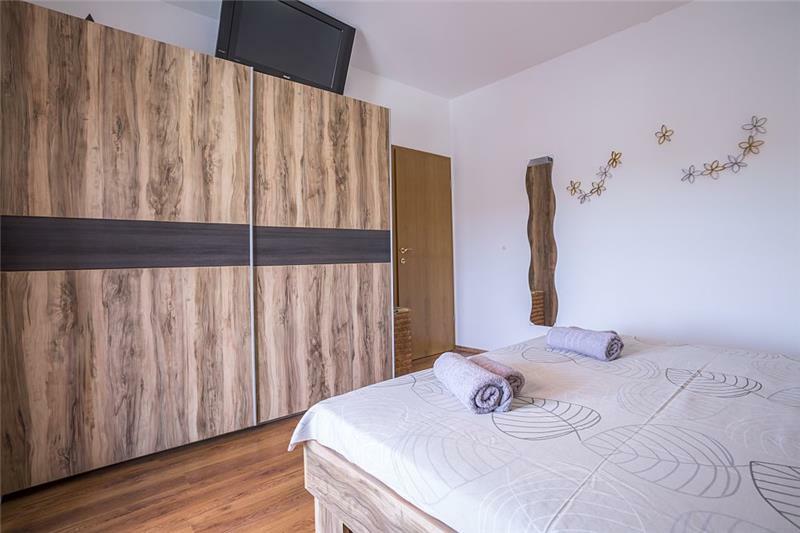 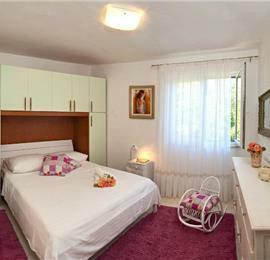 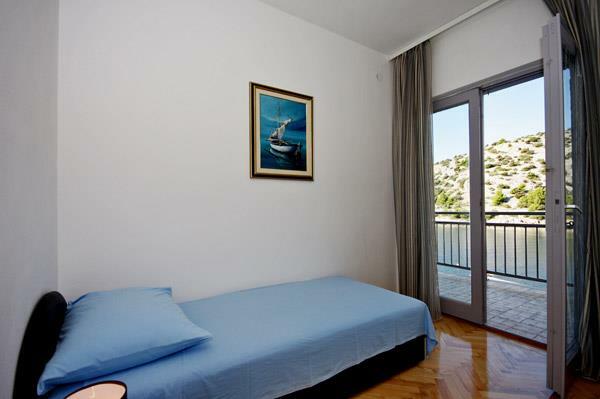 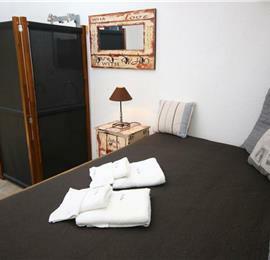 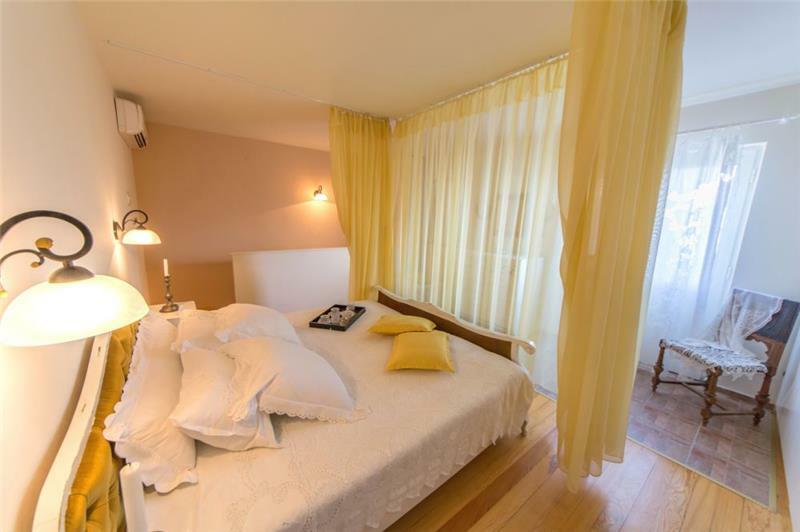 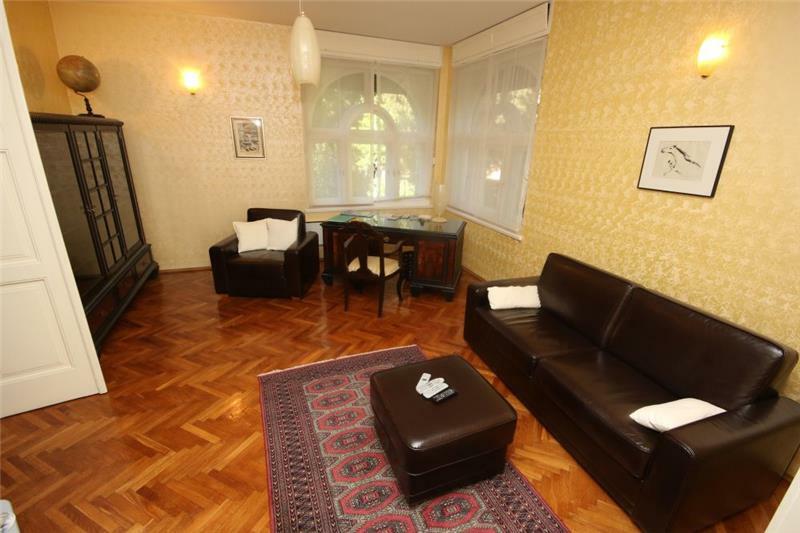 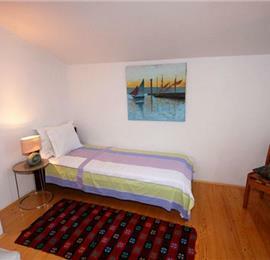 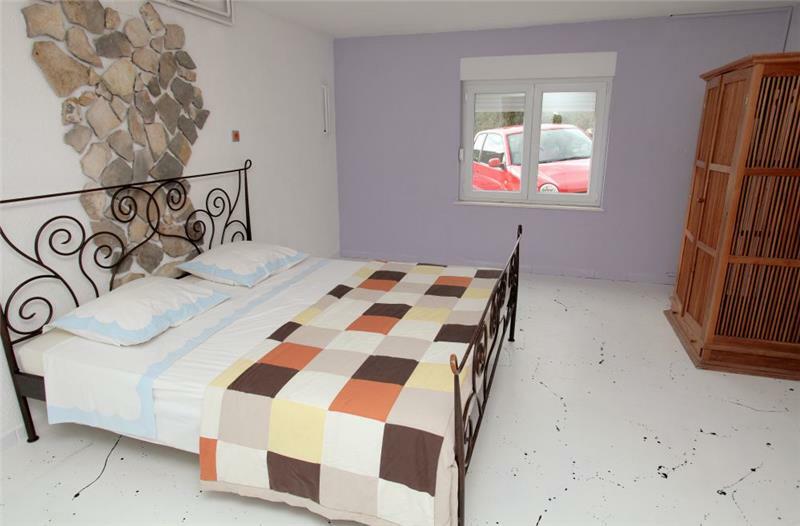 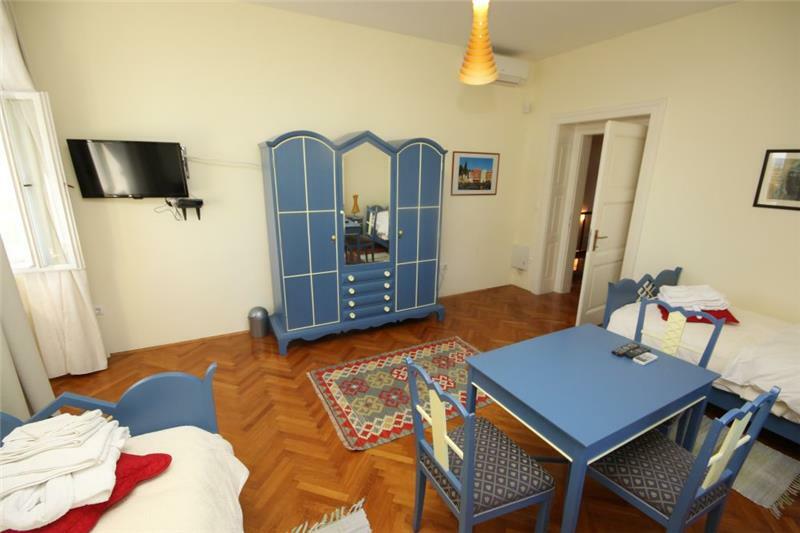 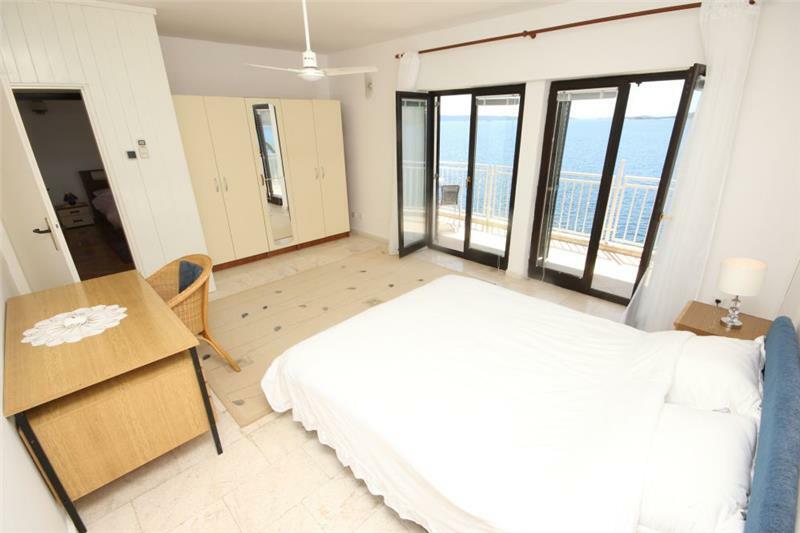 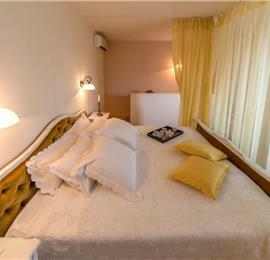 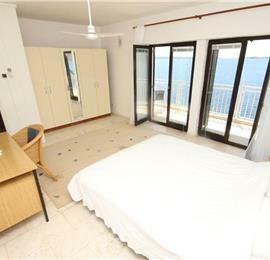 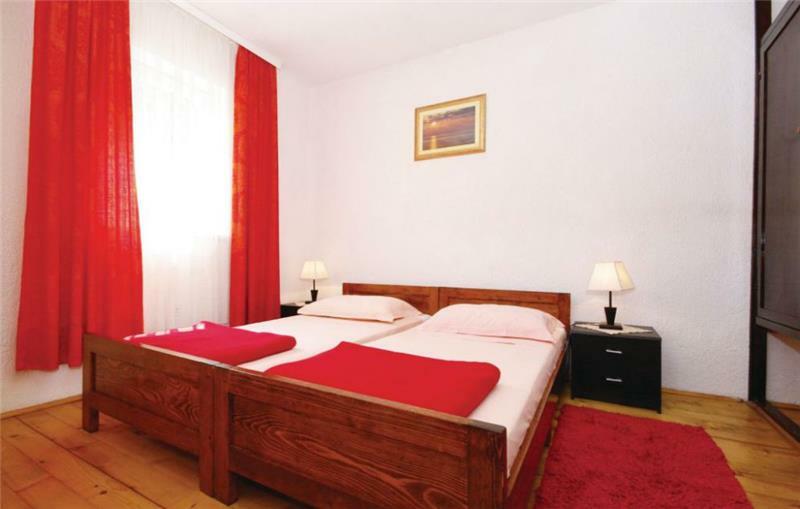 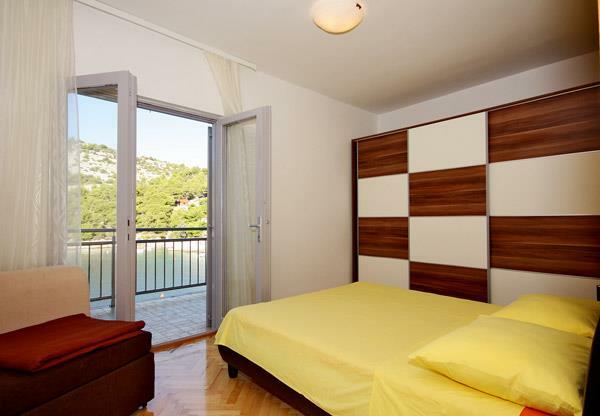 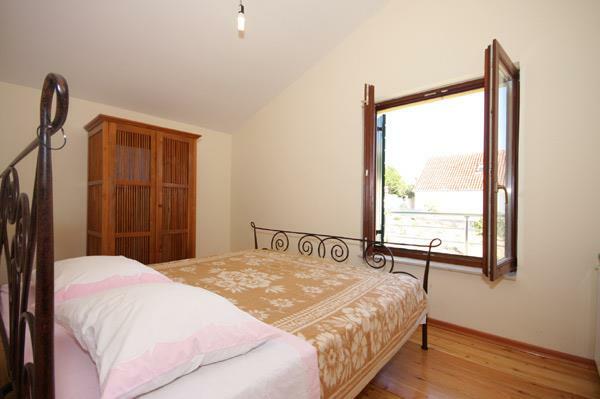 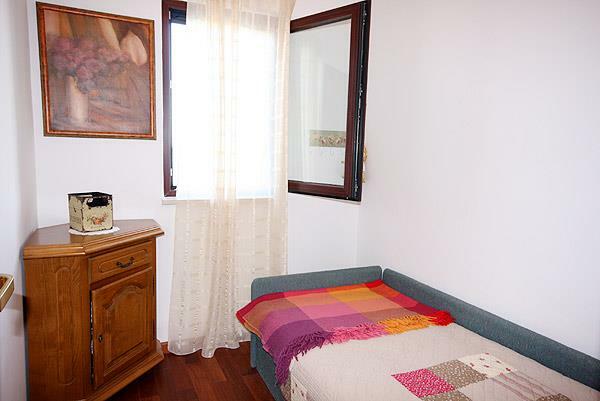 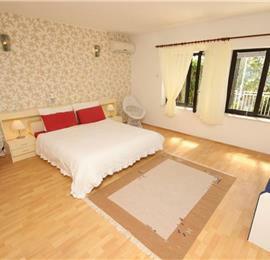 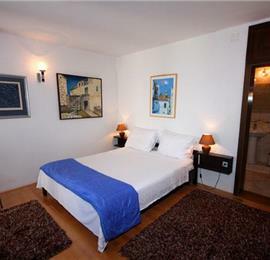 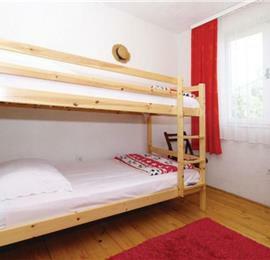 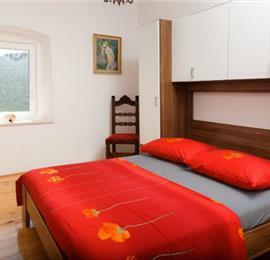 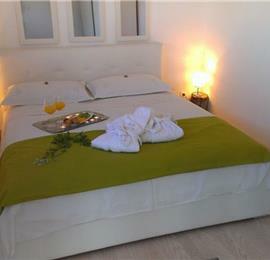 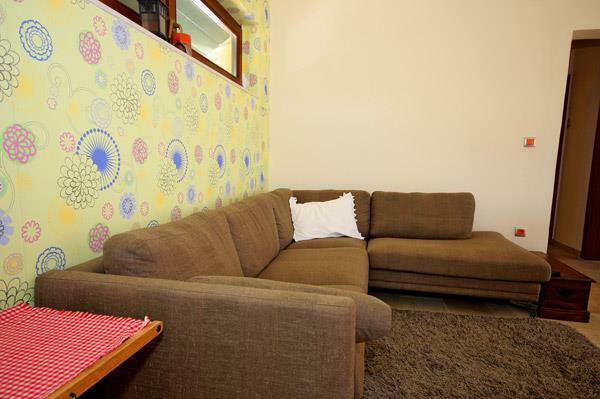 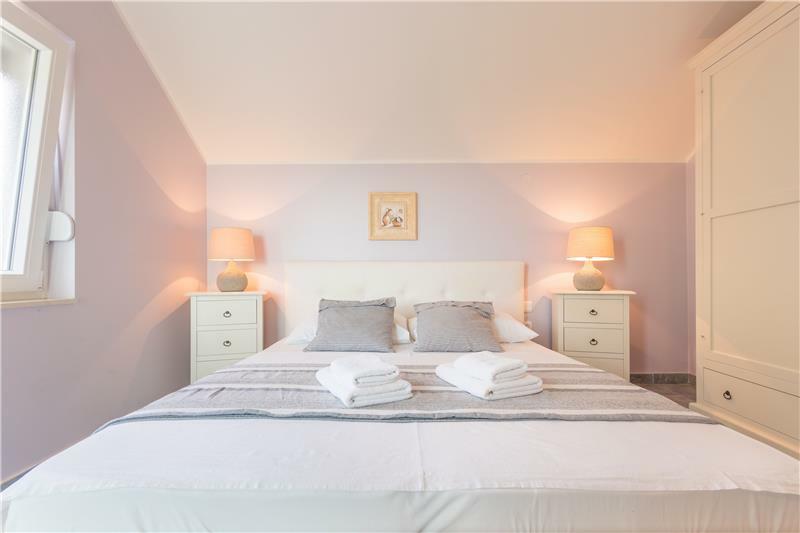 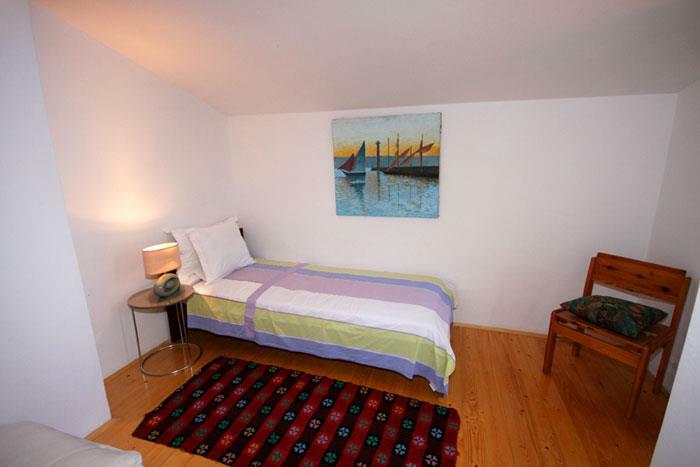 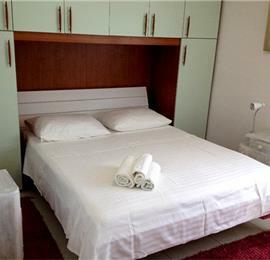 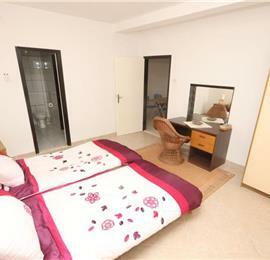 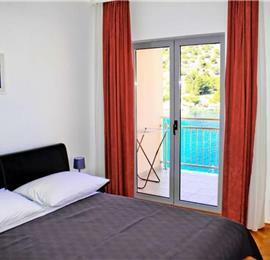 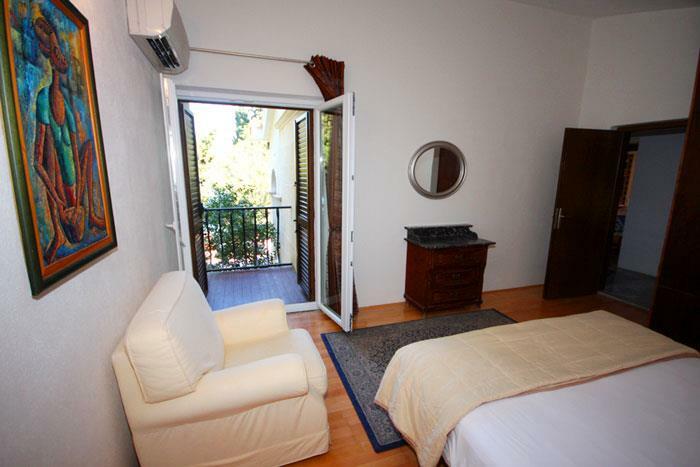 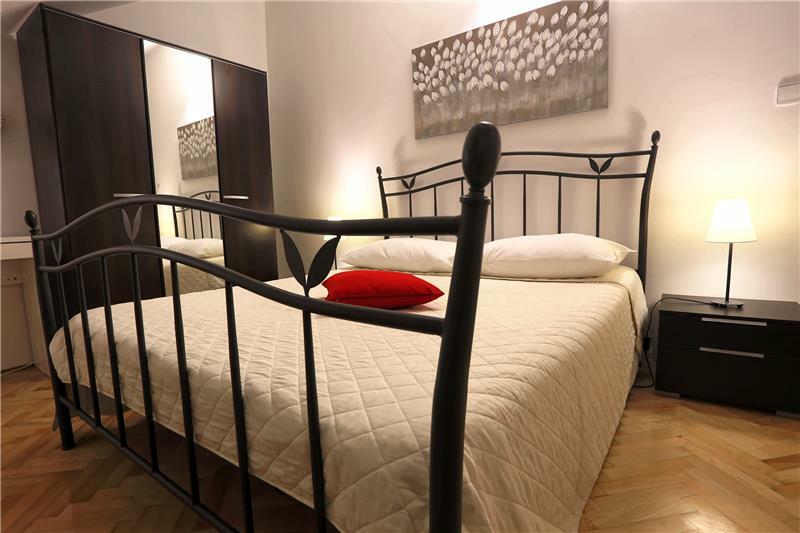 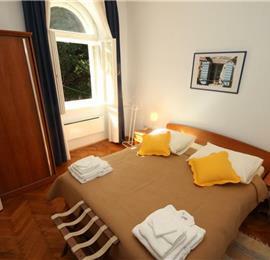 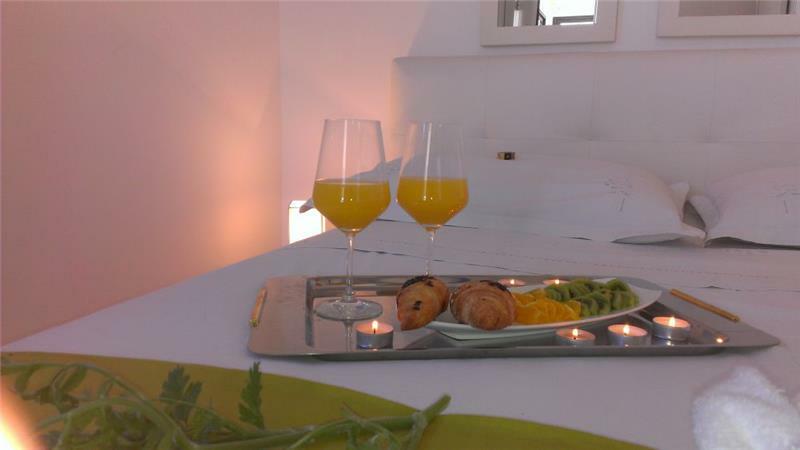 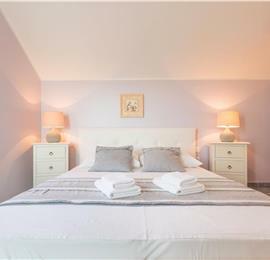 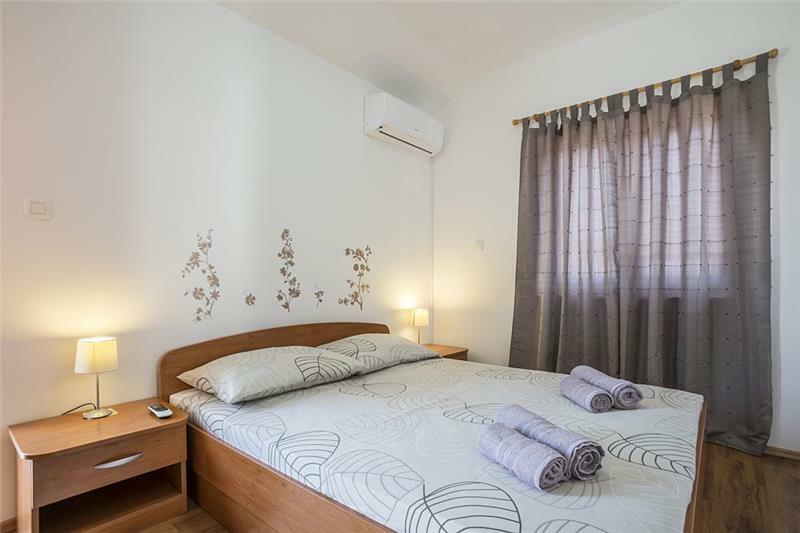 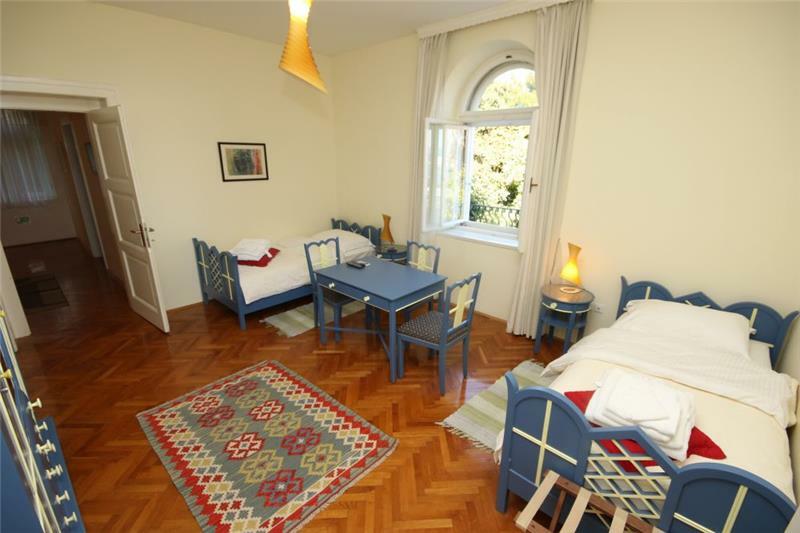 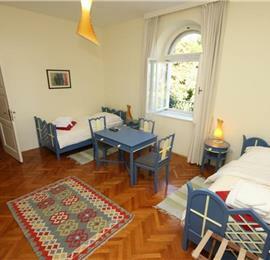 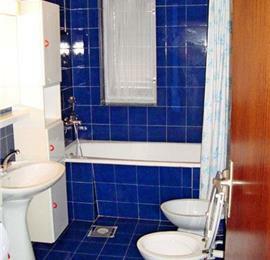 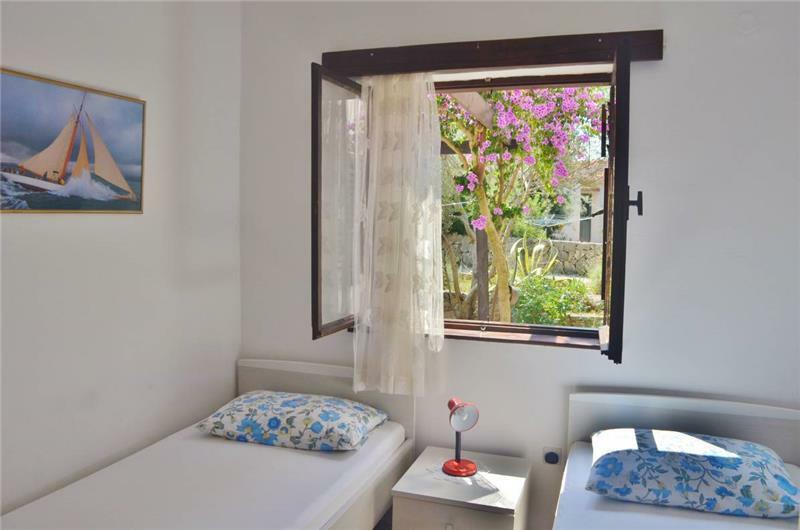 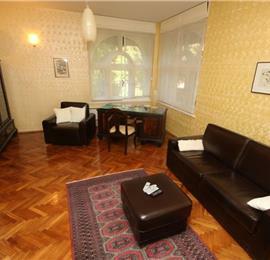 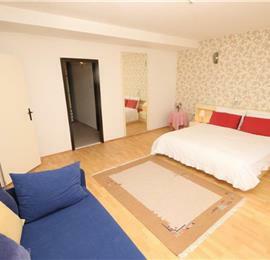 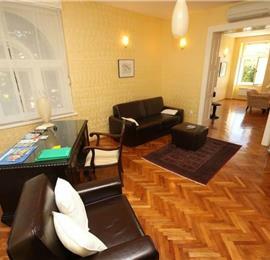 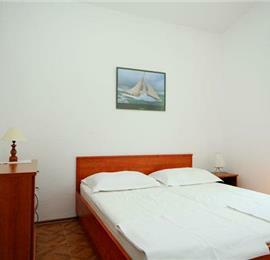 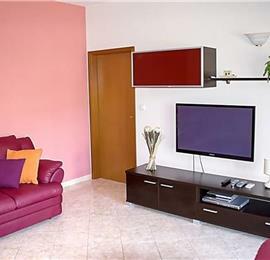 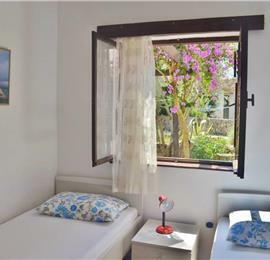 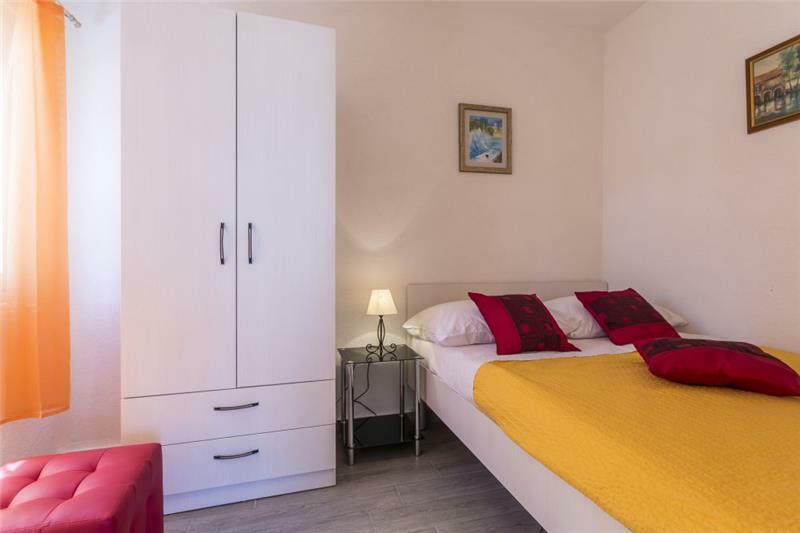 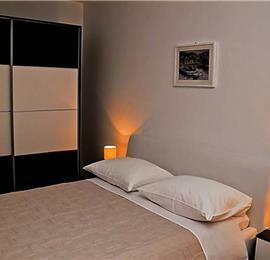 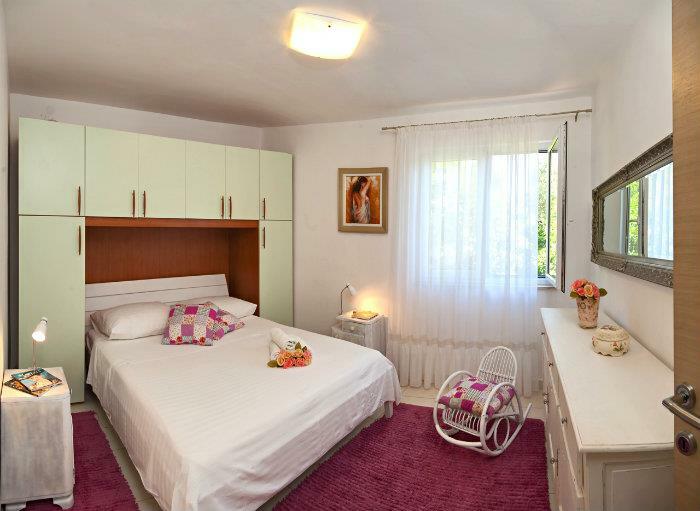 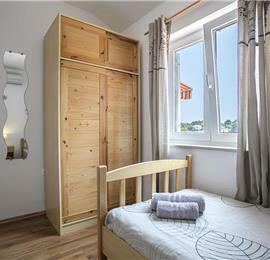 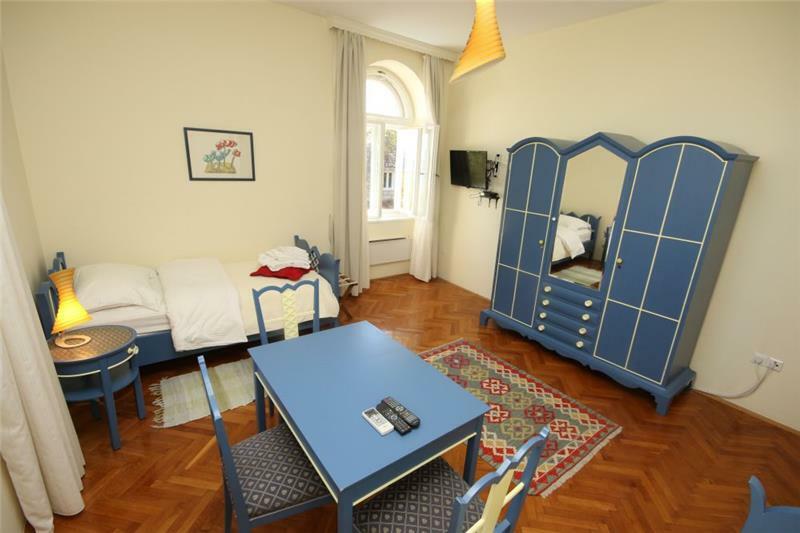 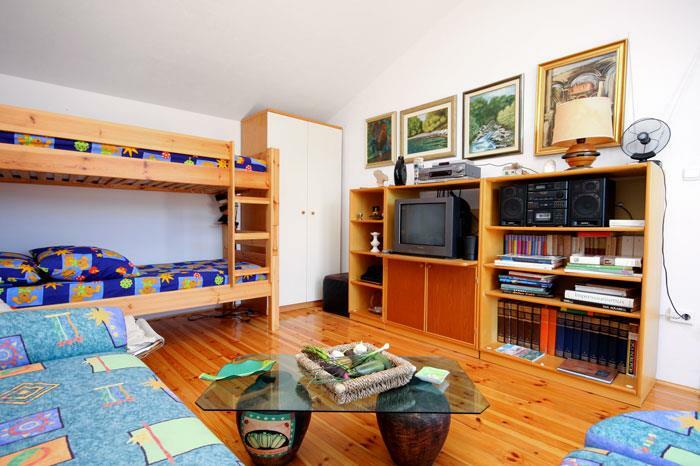 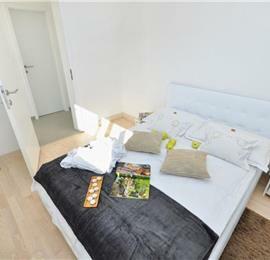 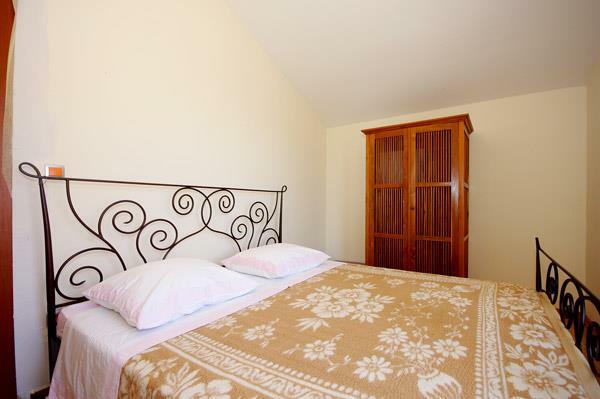 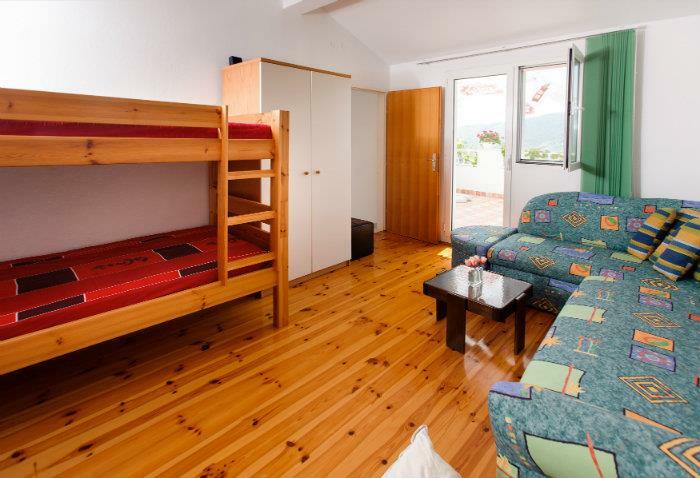 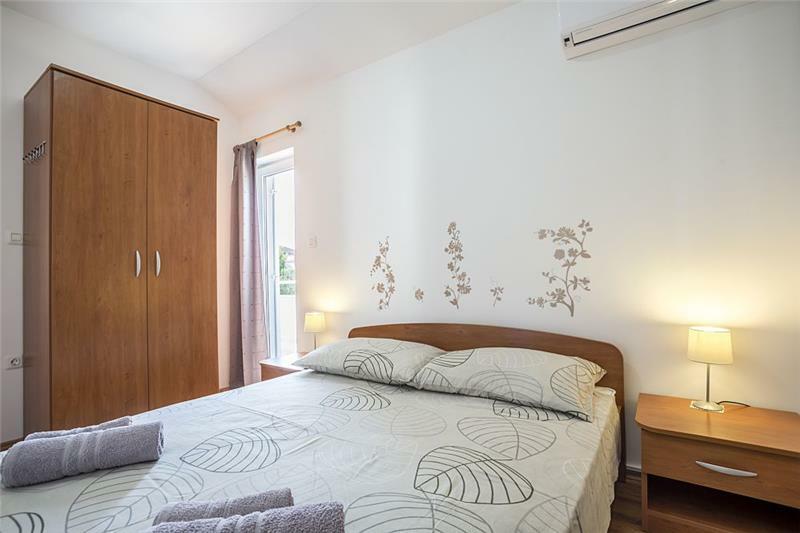 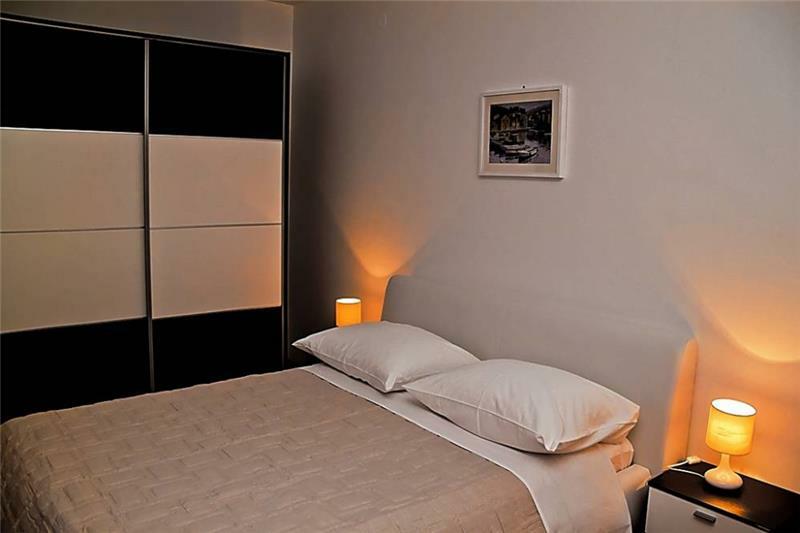 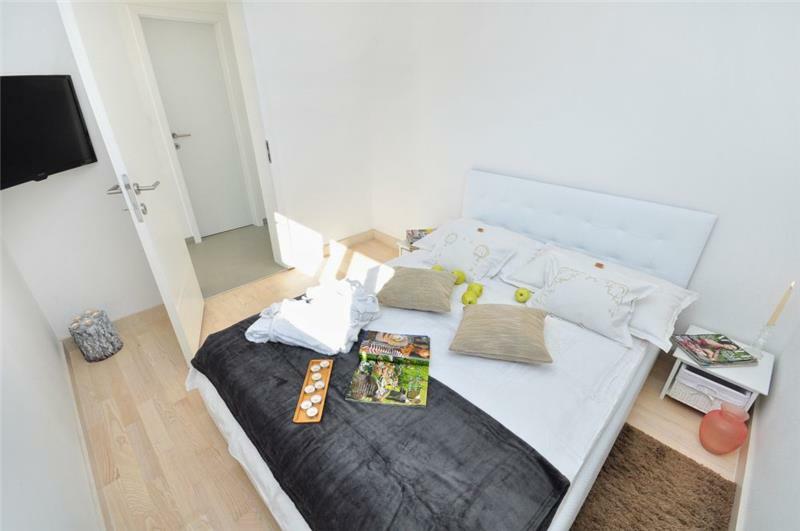 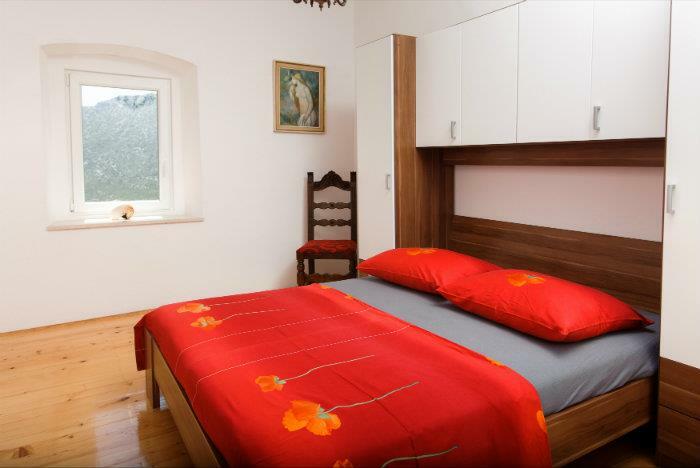 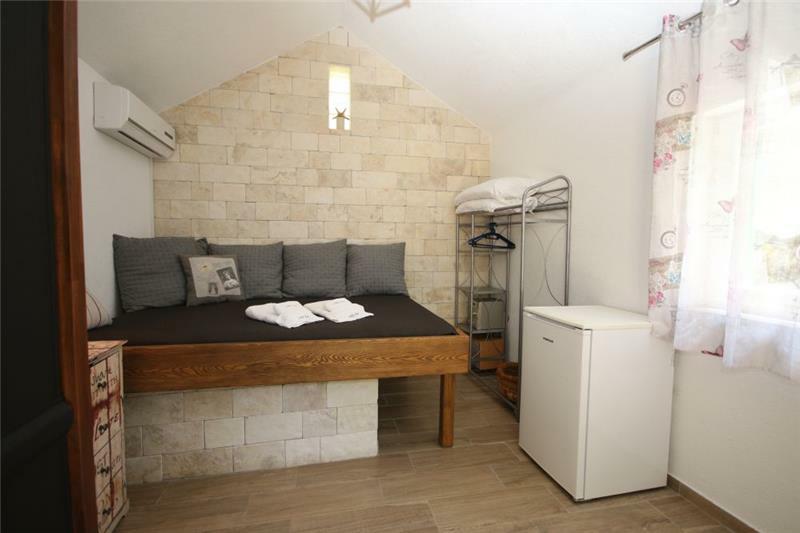 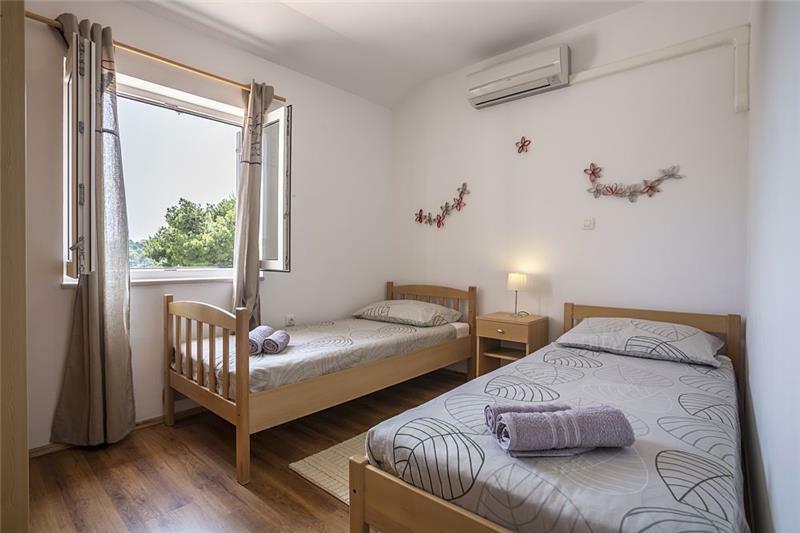 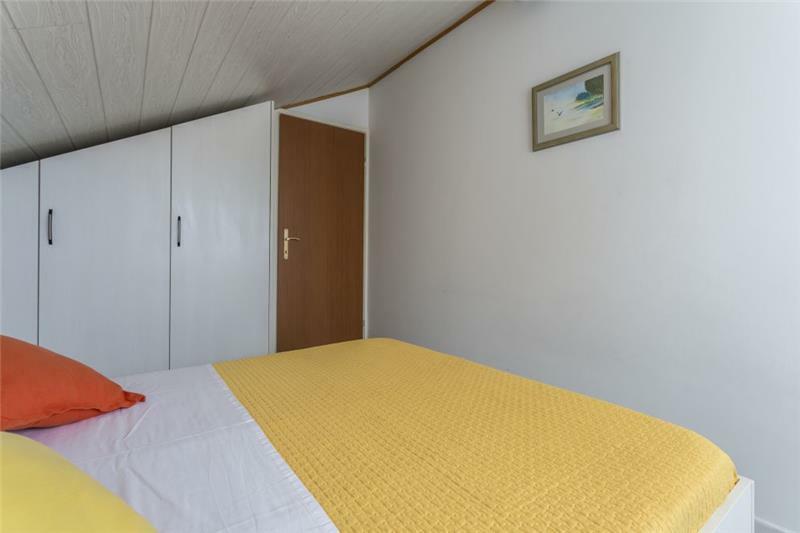 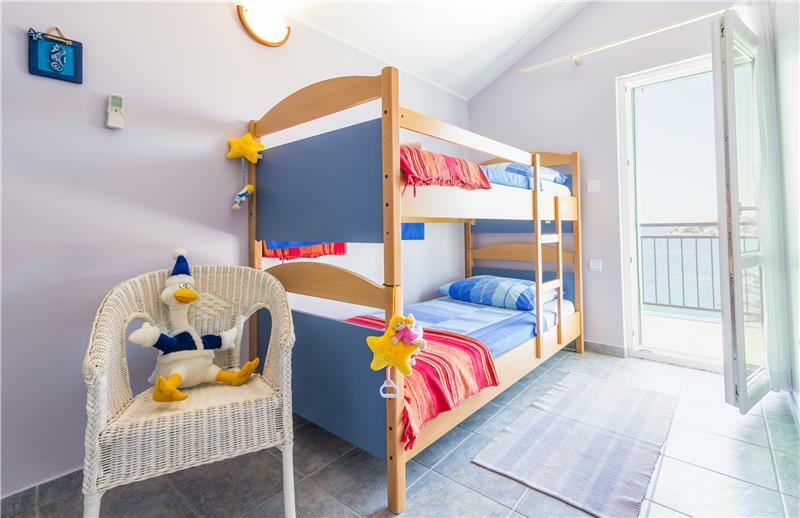 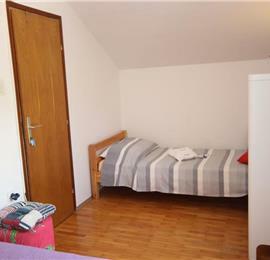 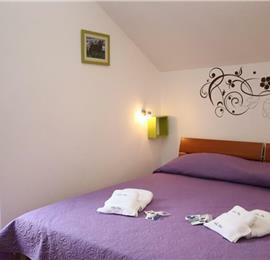 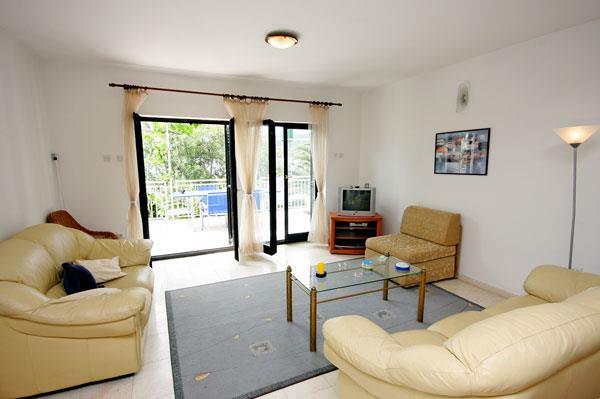 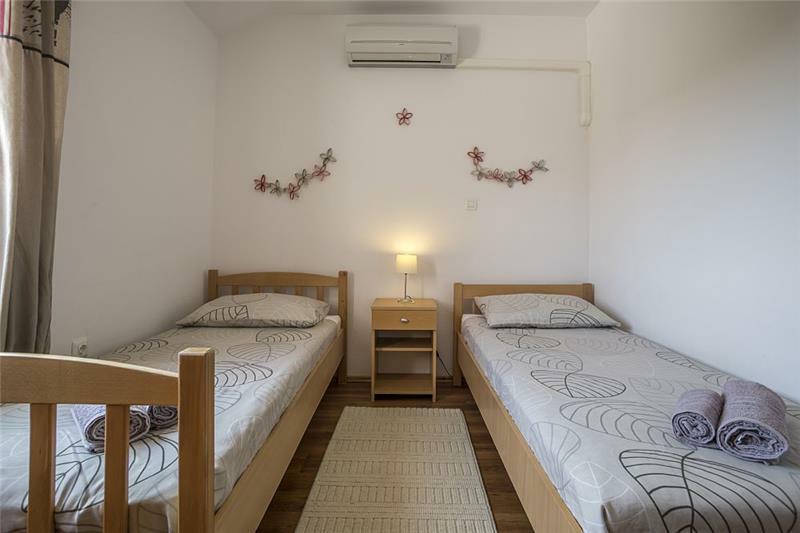 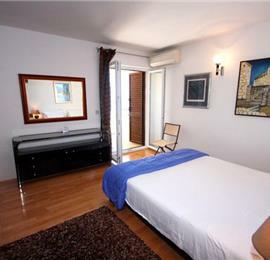 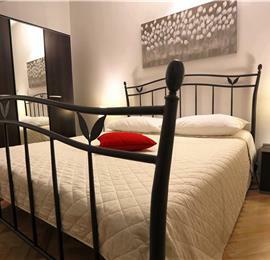 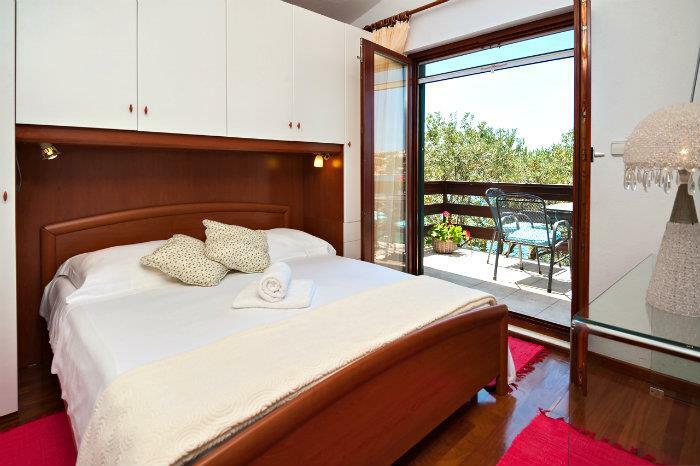 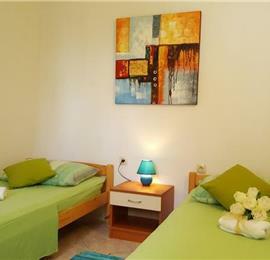 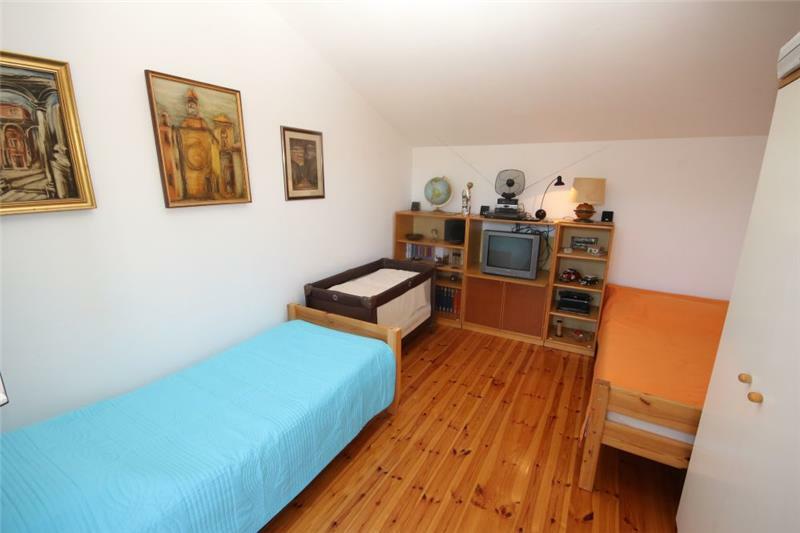 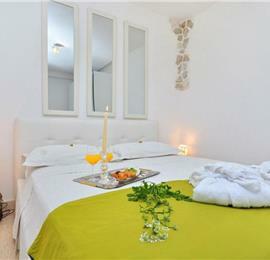 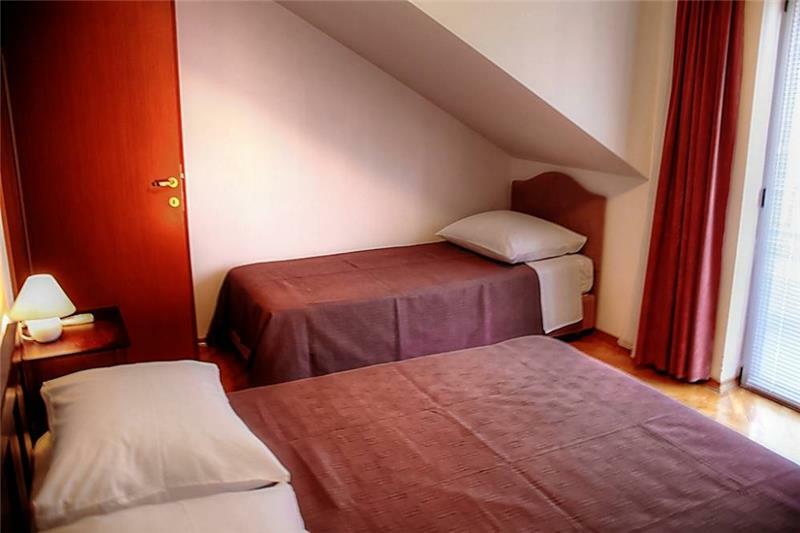 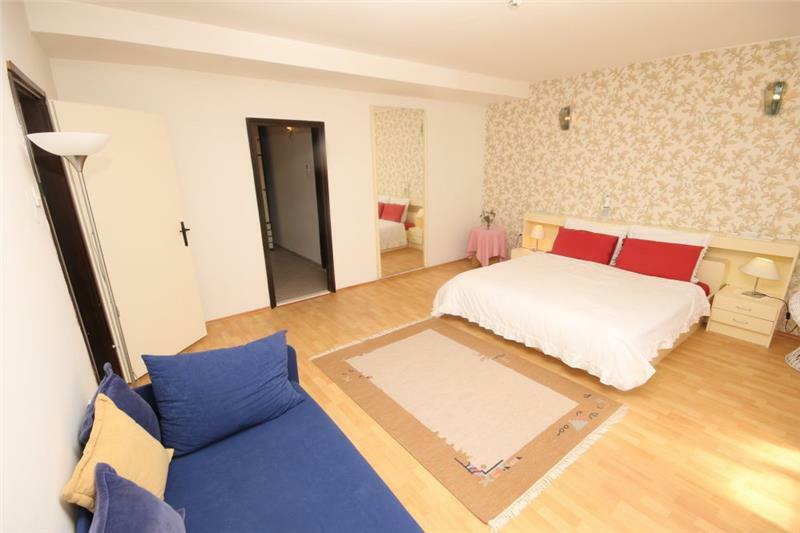 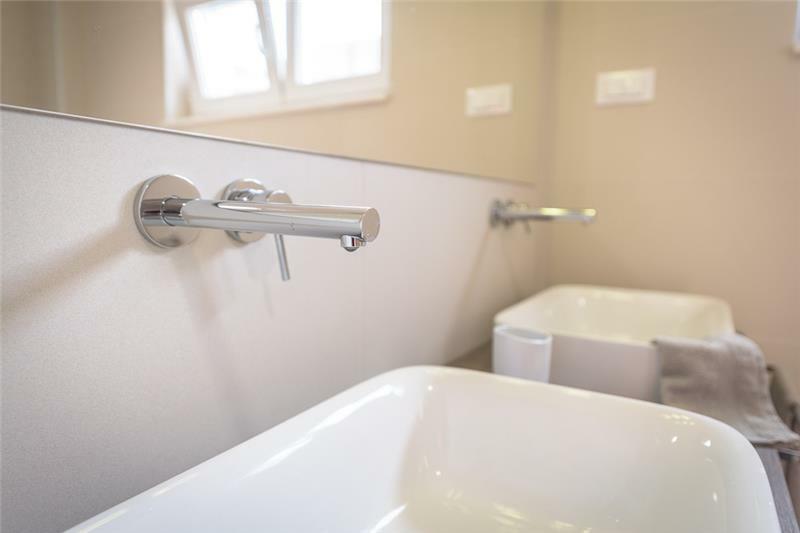 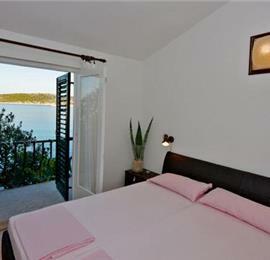 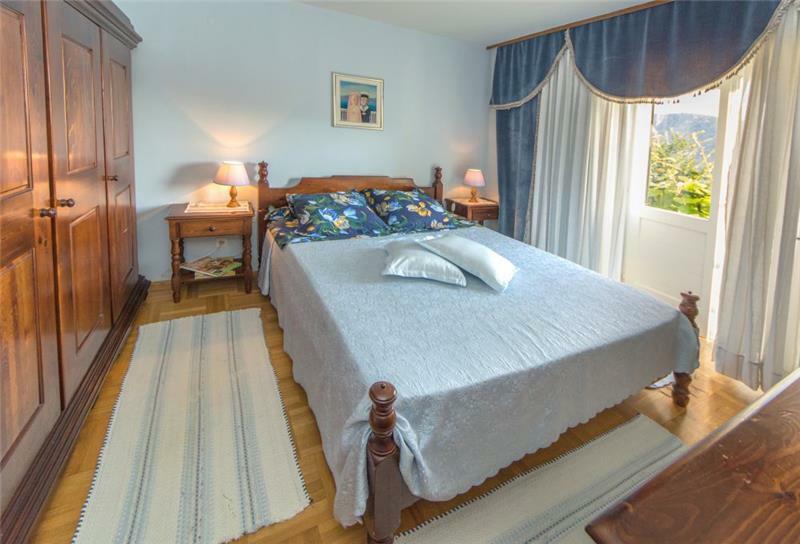 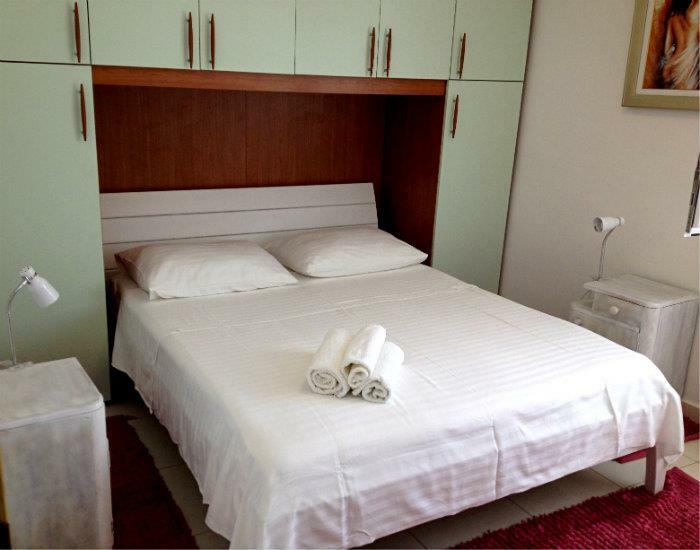 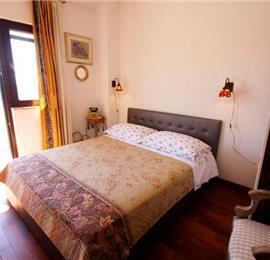 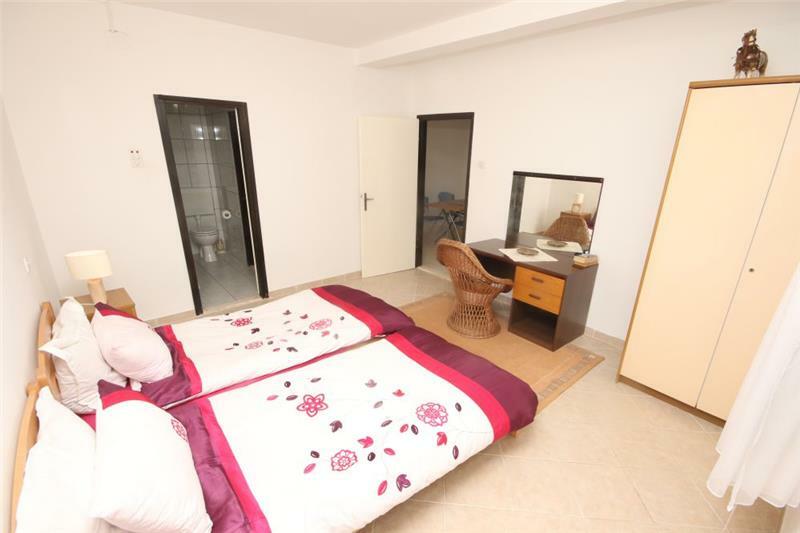 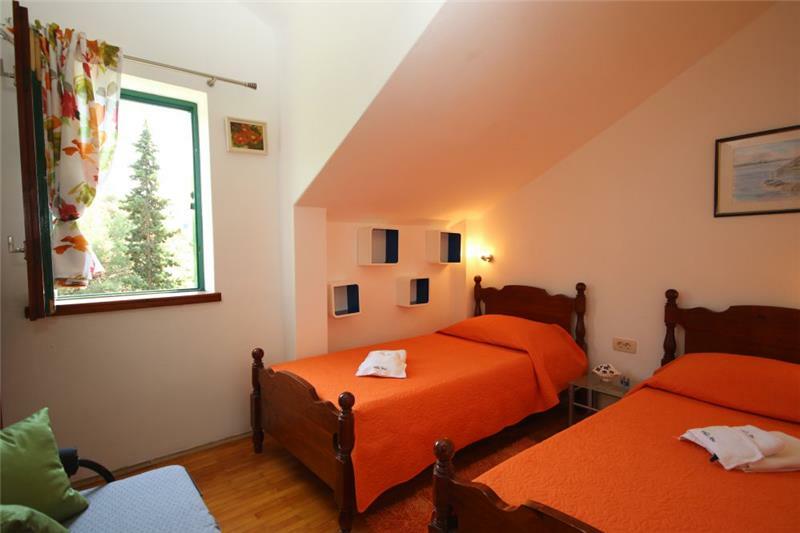 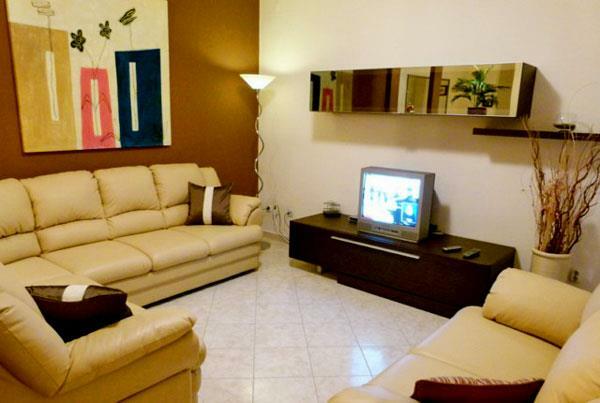 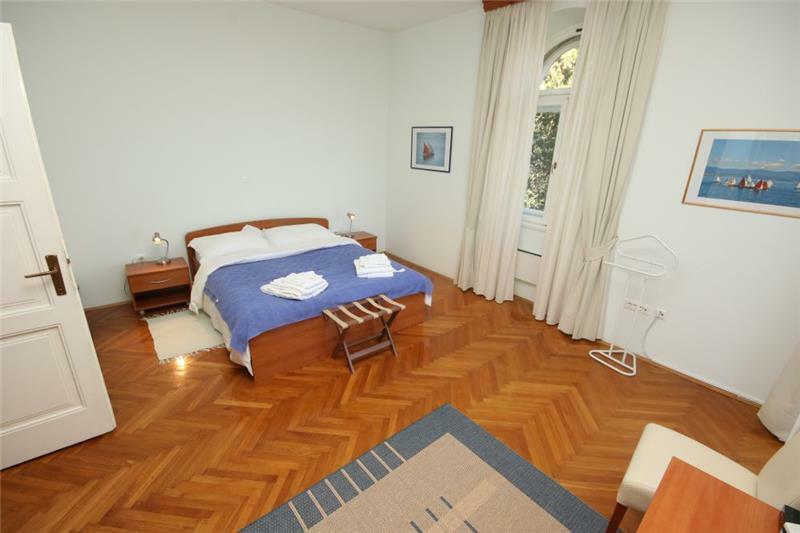 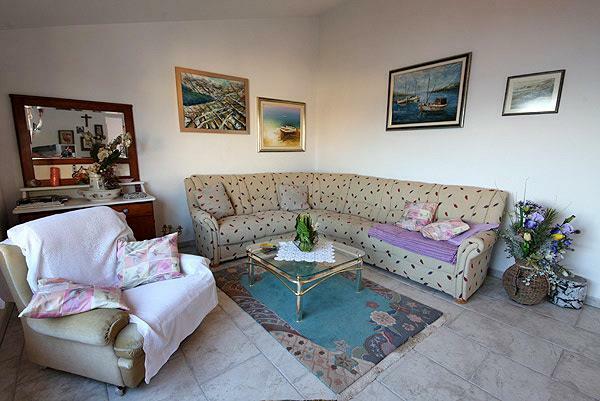 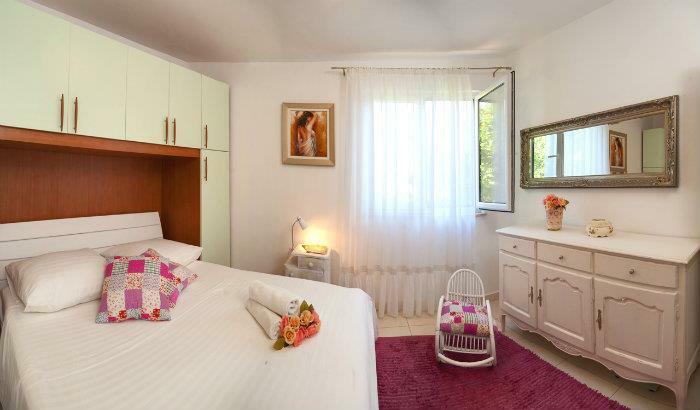 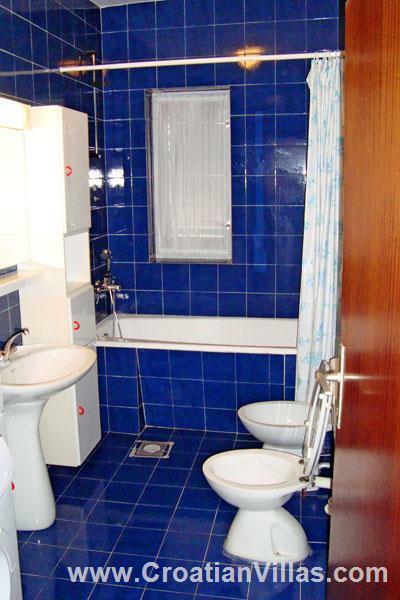 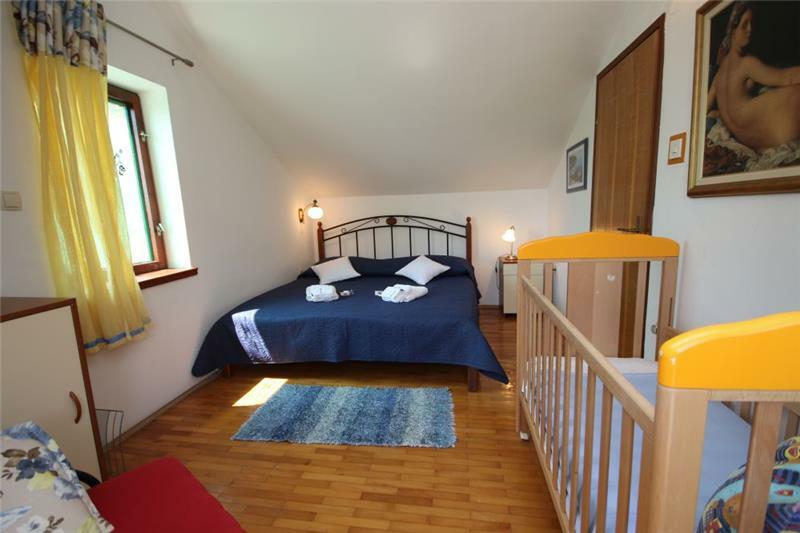 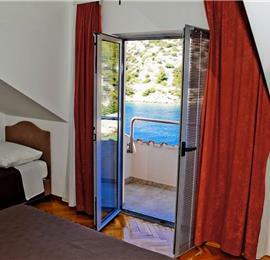 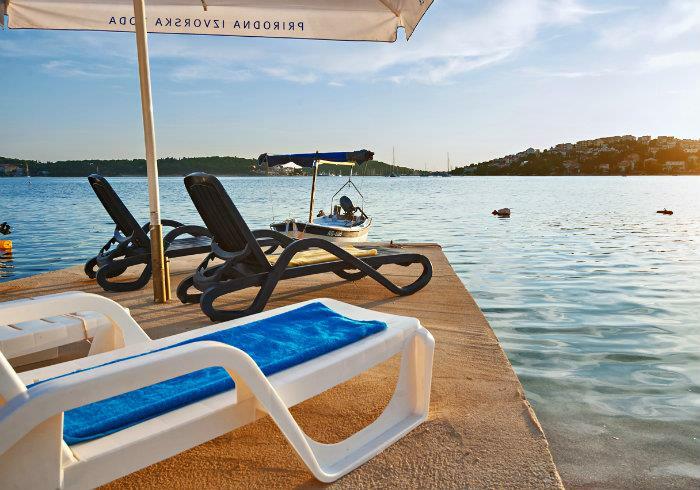 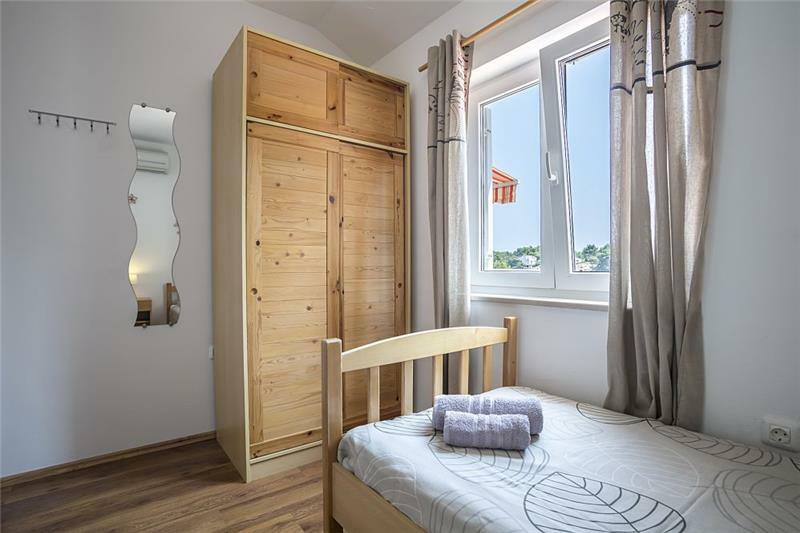 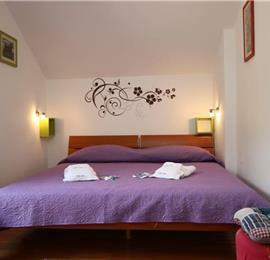 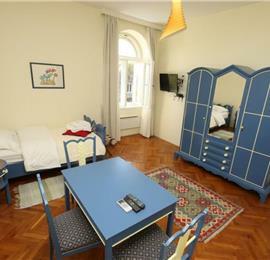 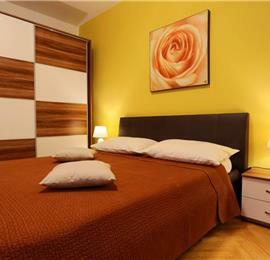 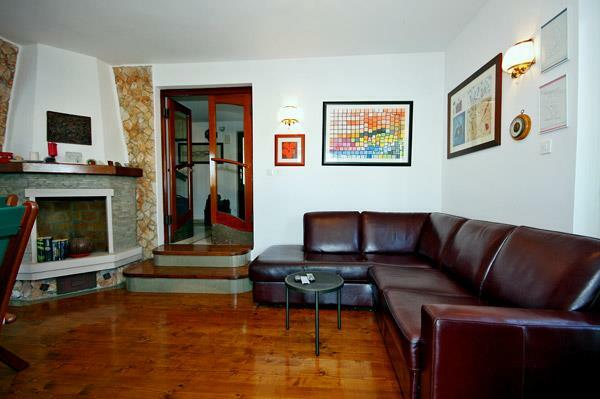 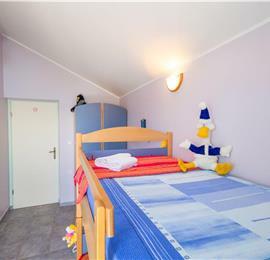 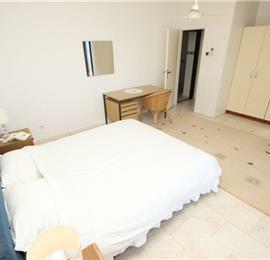 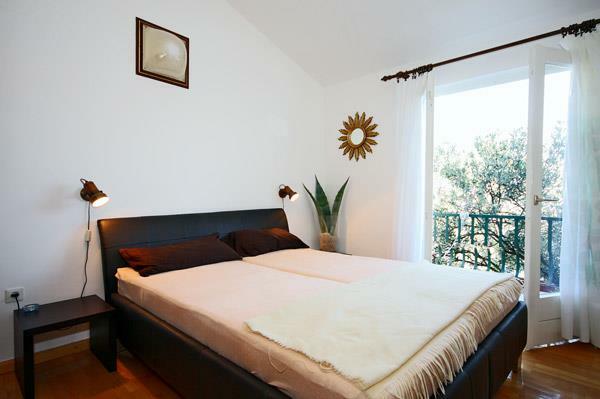 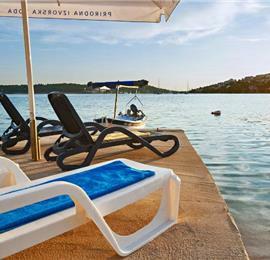 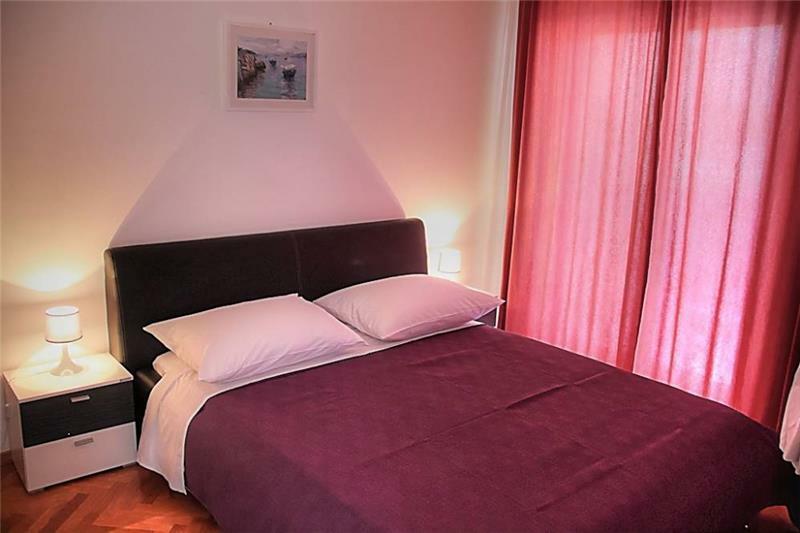 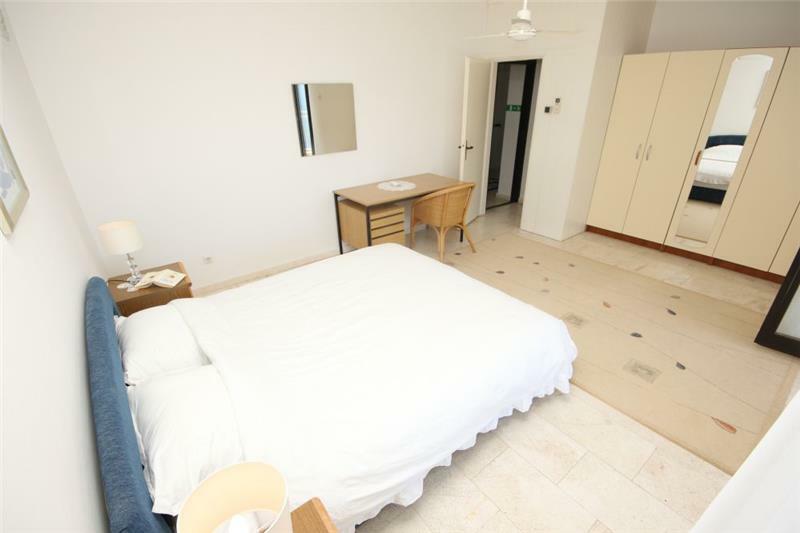 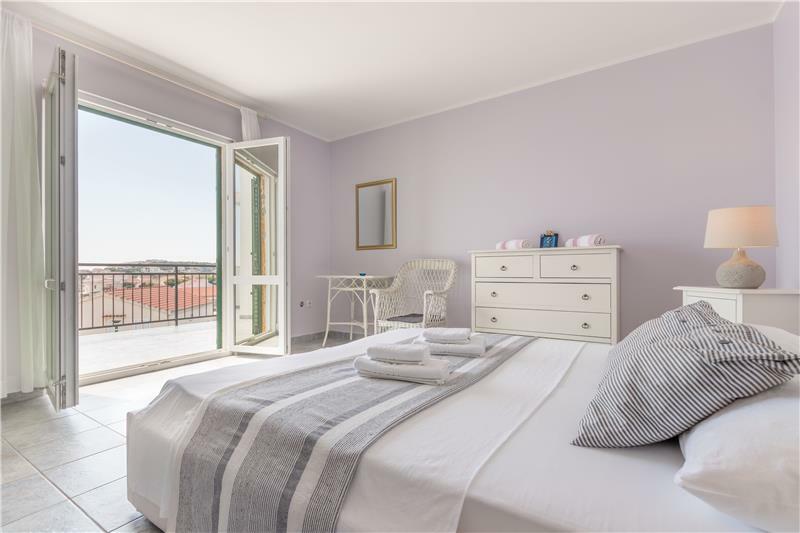 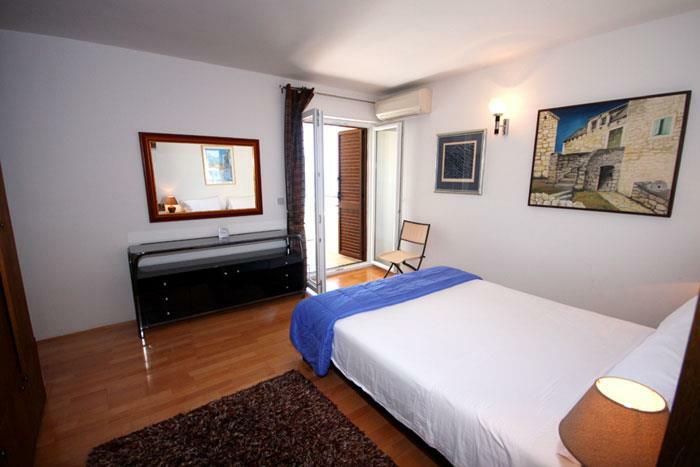 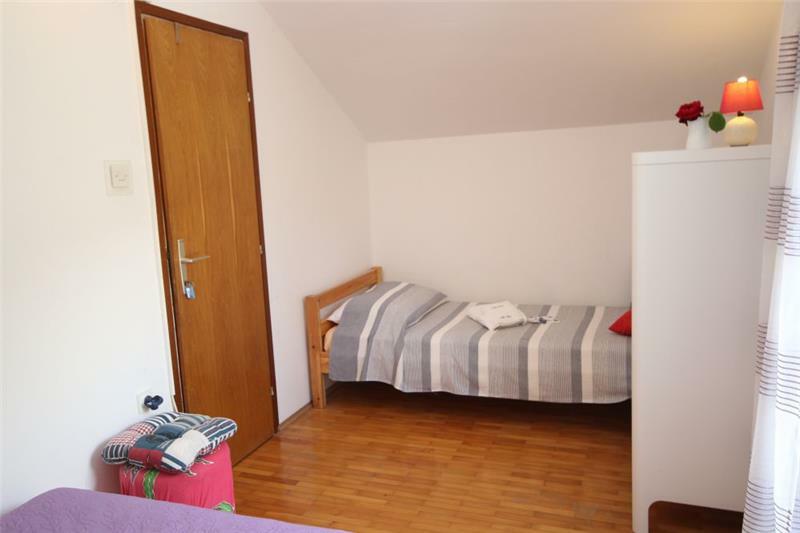 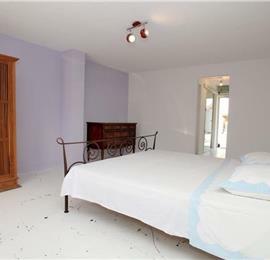 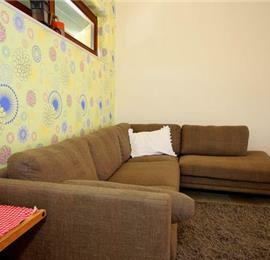 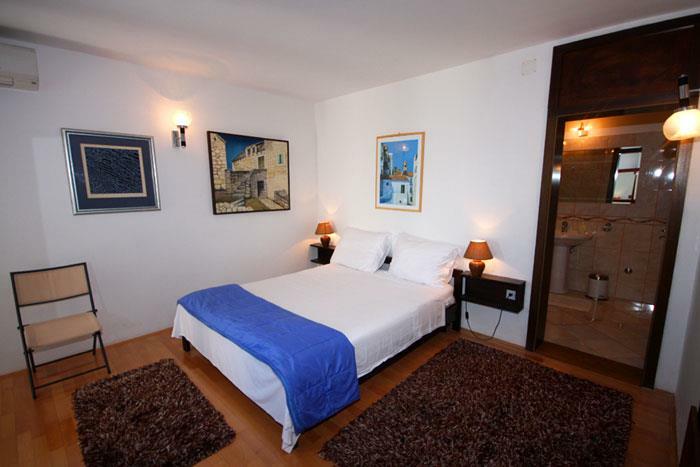 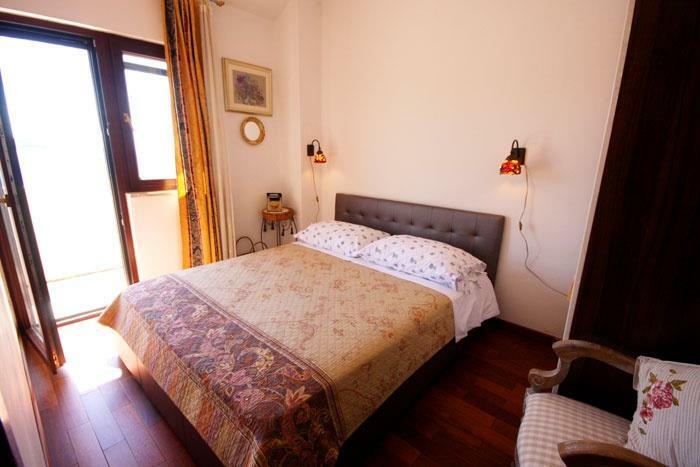 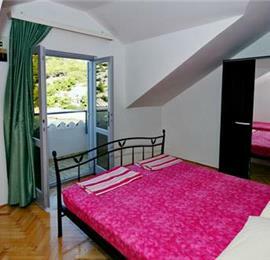 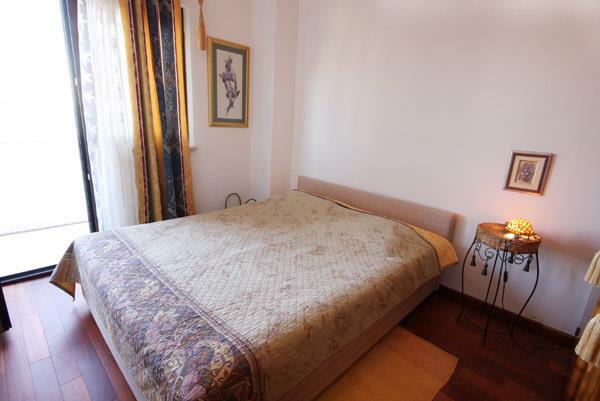 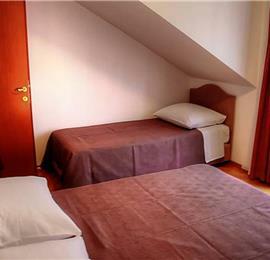 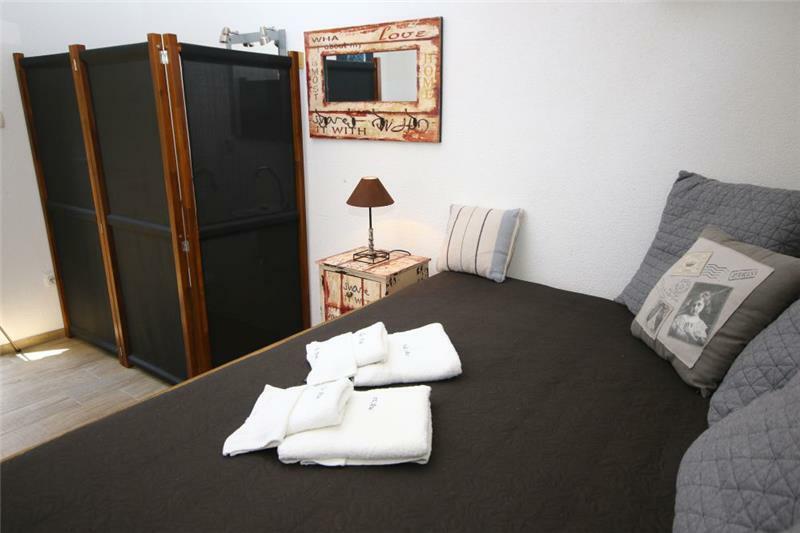 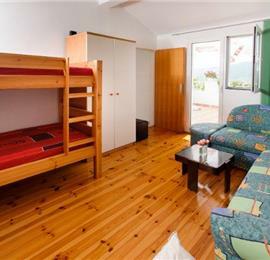 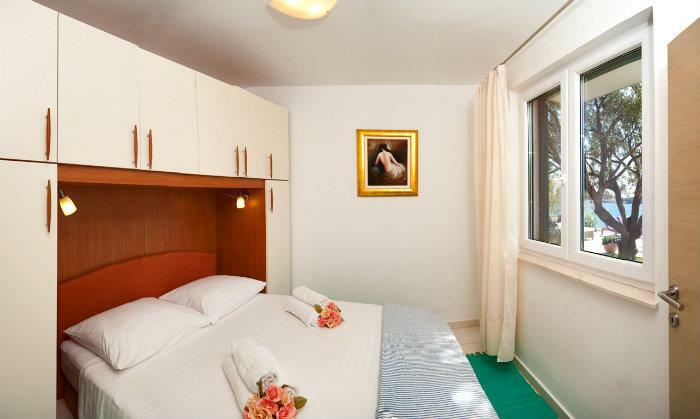 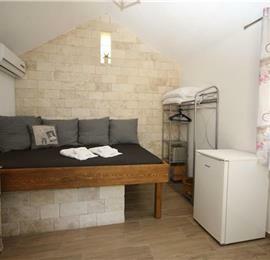 Information on bedrooms: Each apartment has a sofa bed in the lounge which can sleep 1 adult. 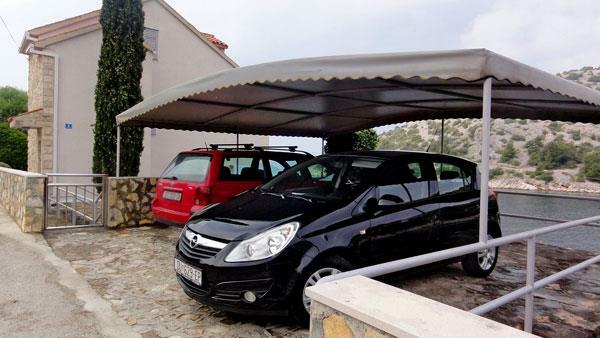 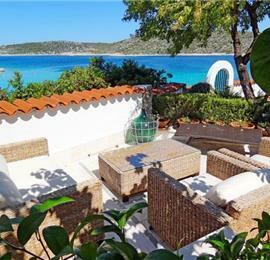 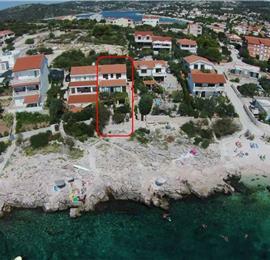 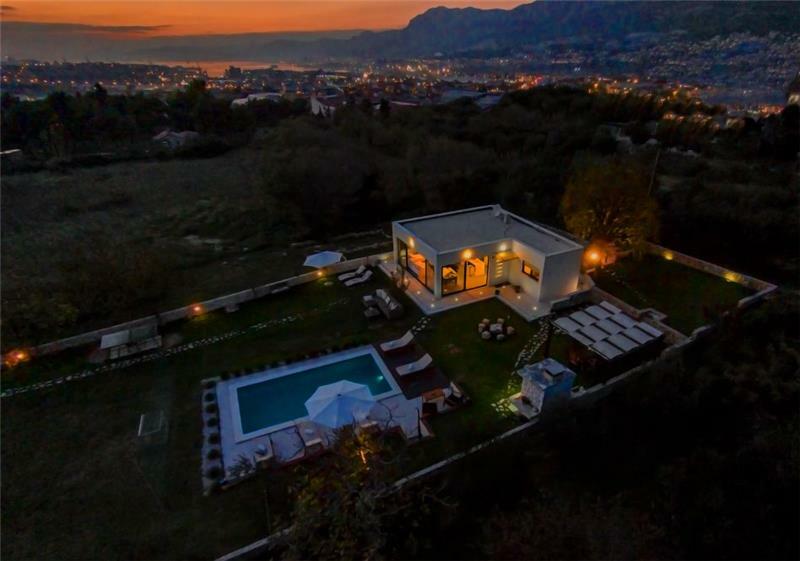 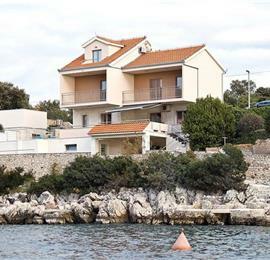 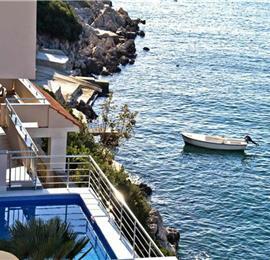 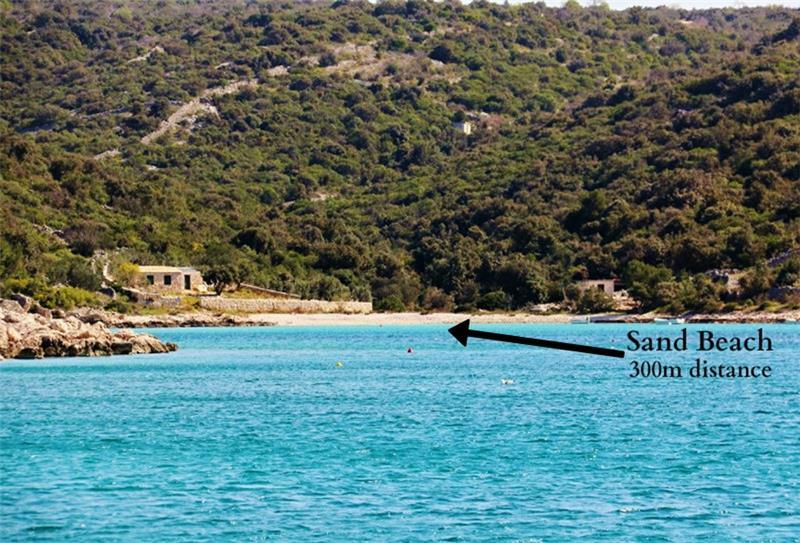 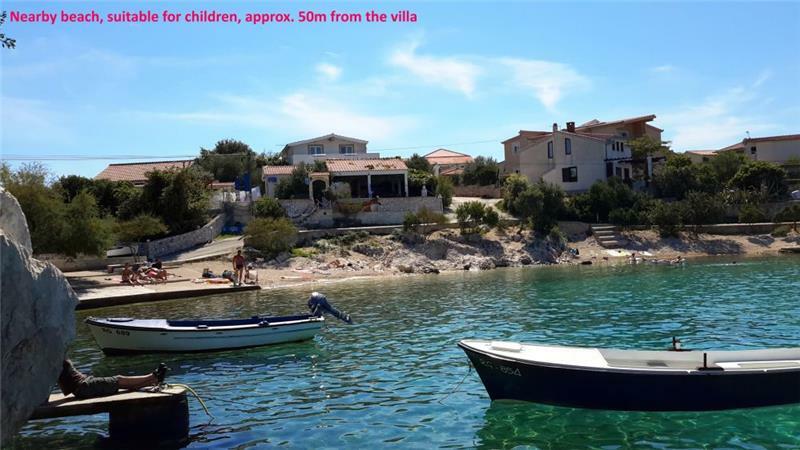 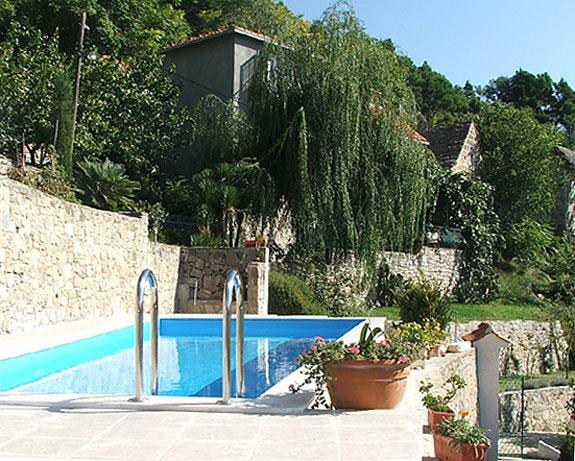 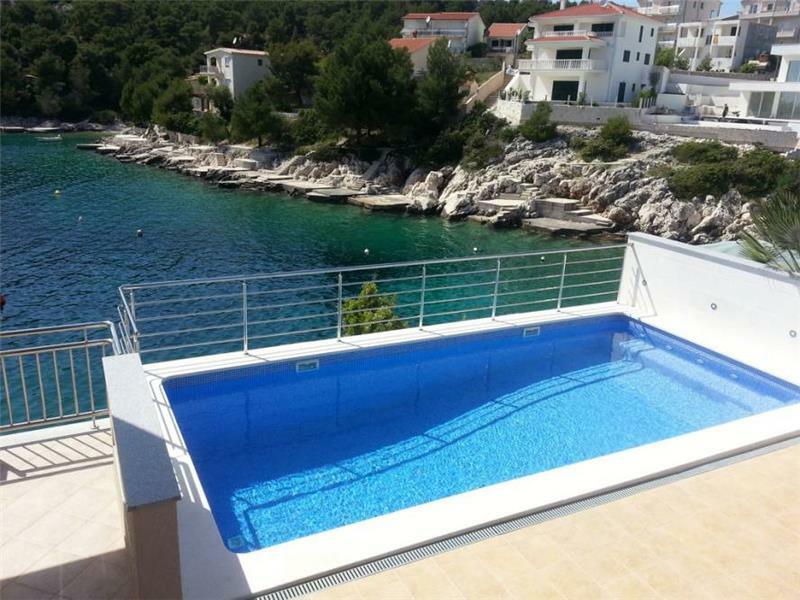 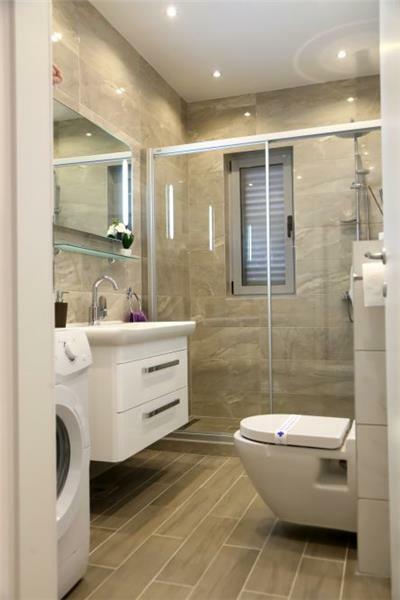 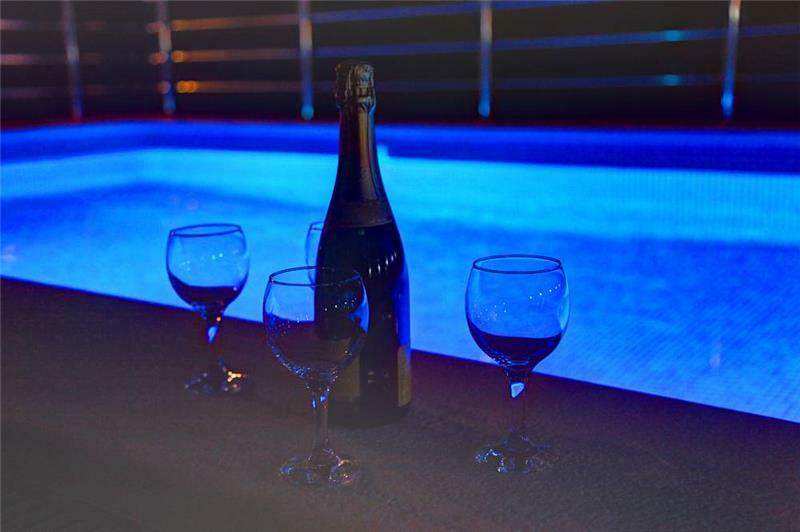 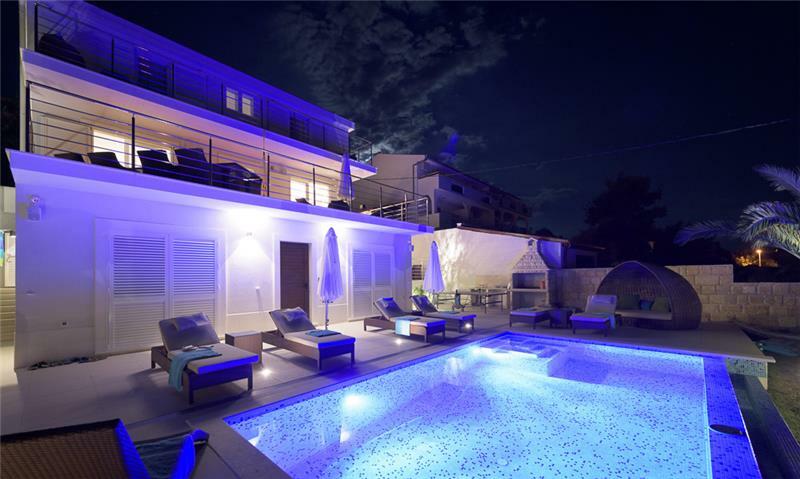 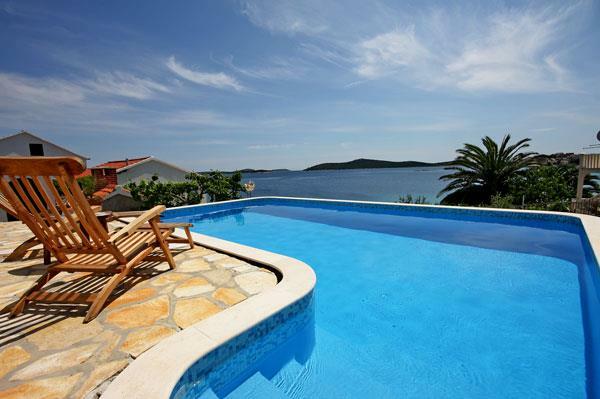 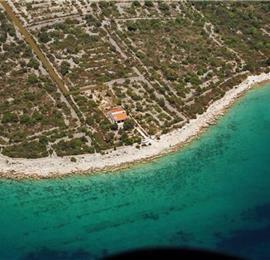 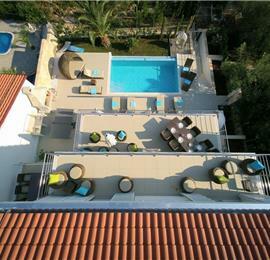 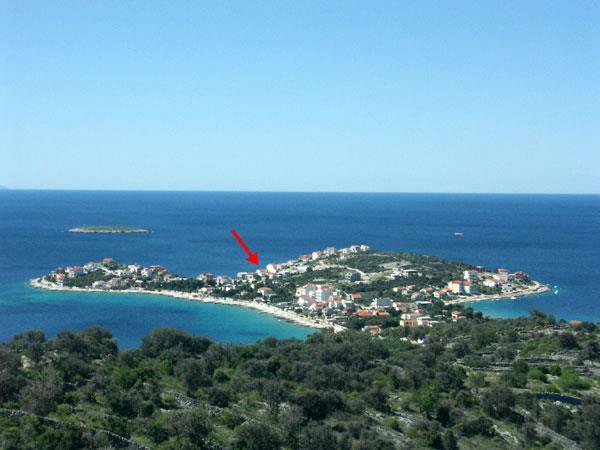 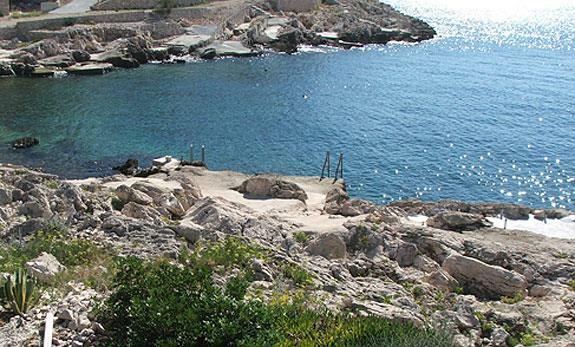 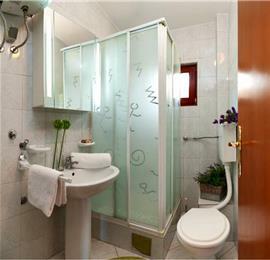 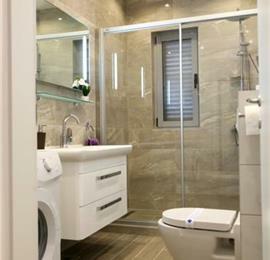 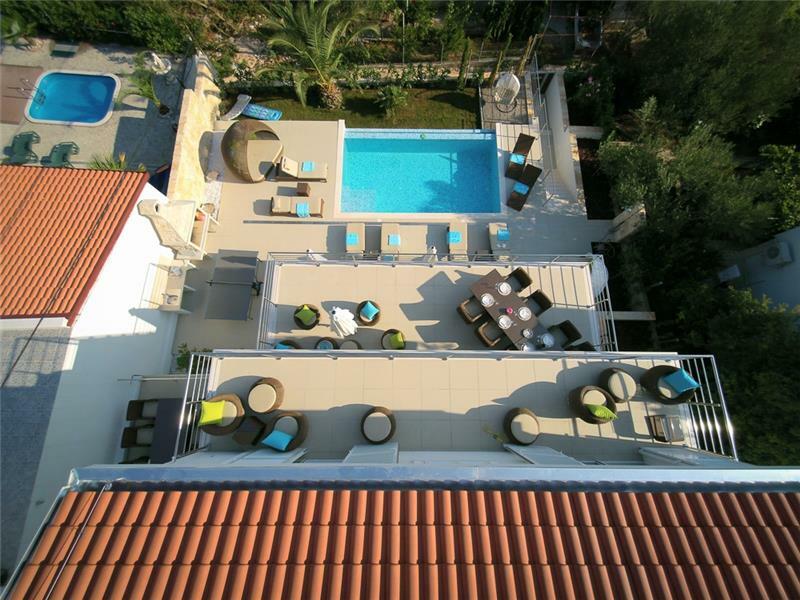 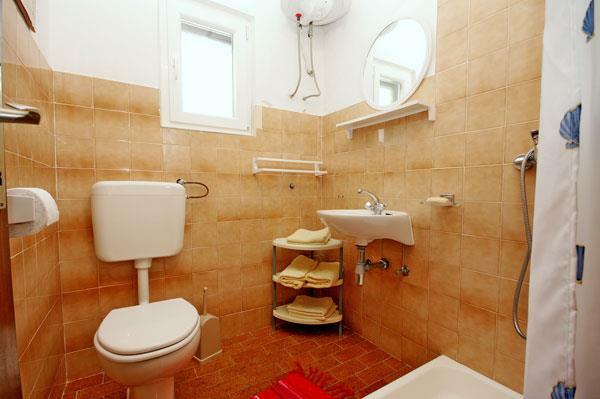 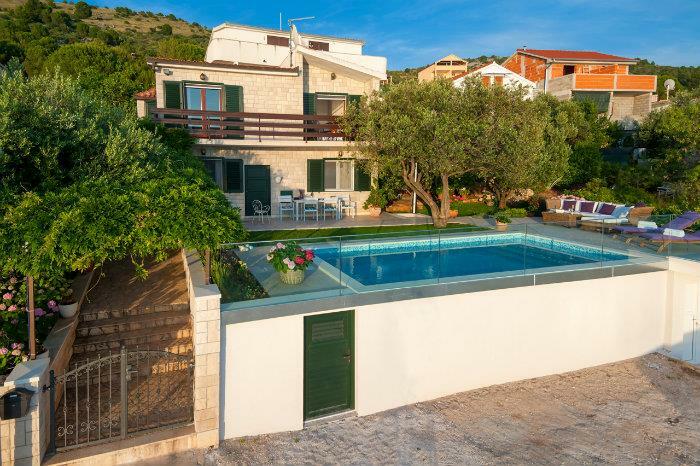 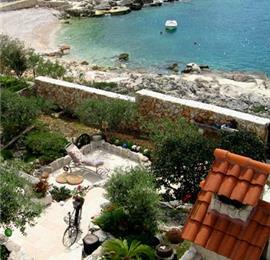 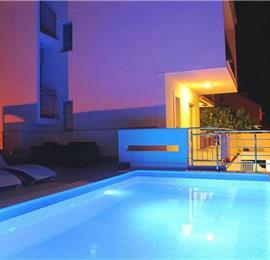 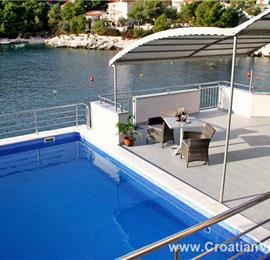 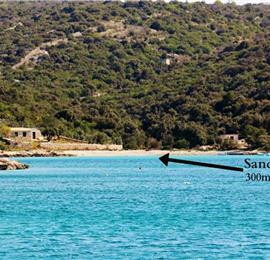 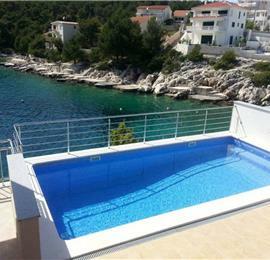 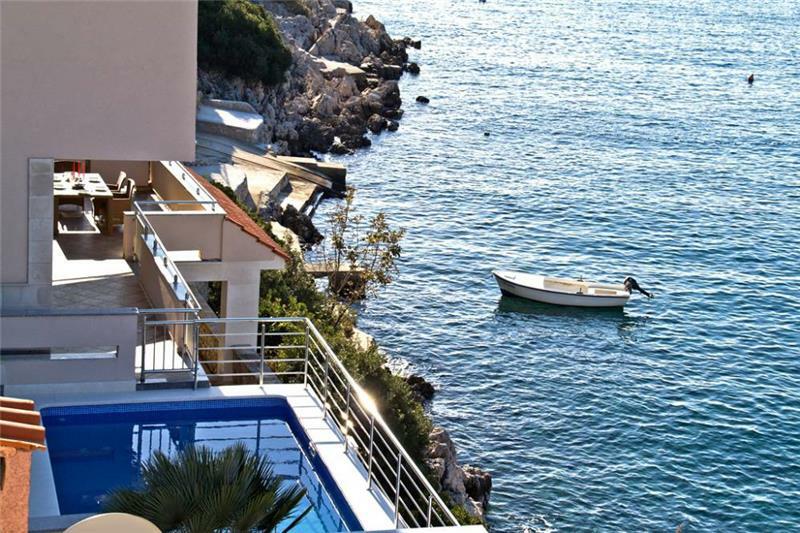 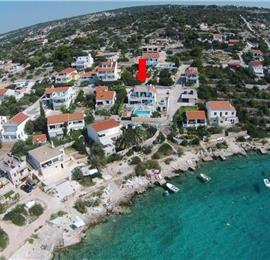 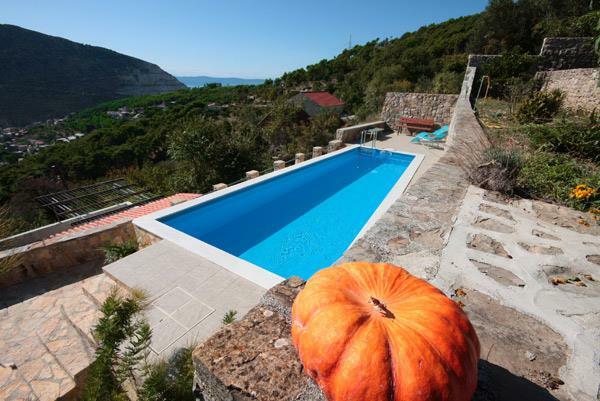 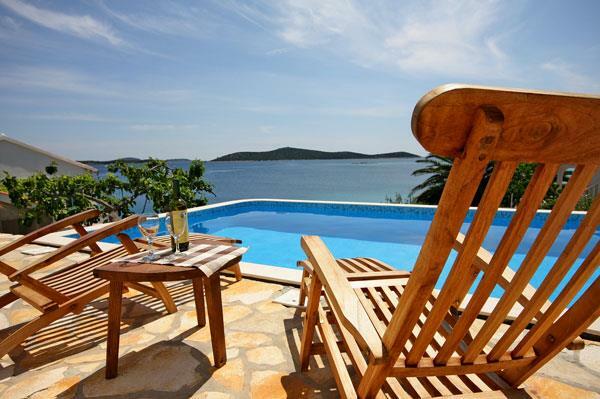 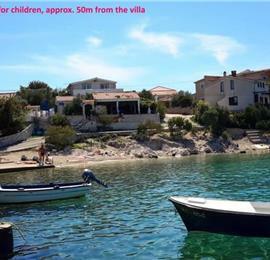 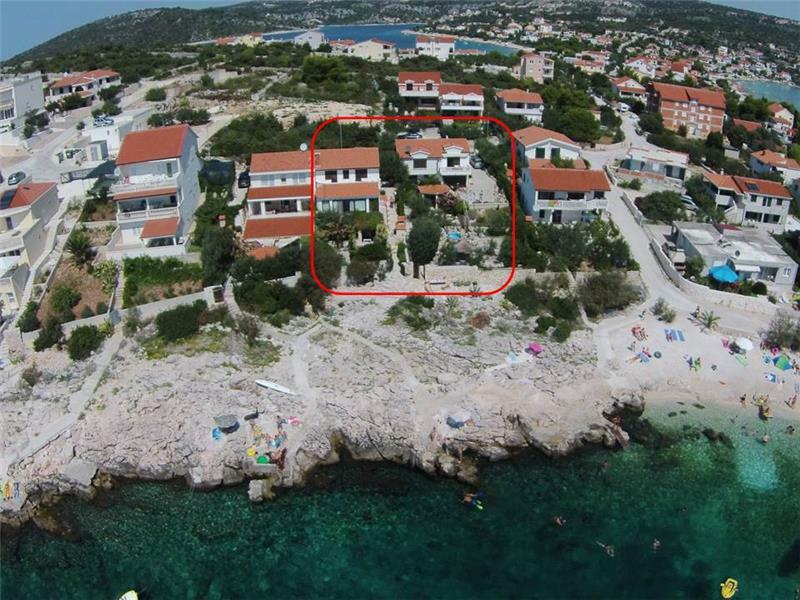 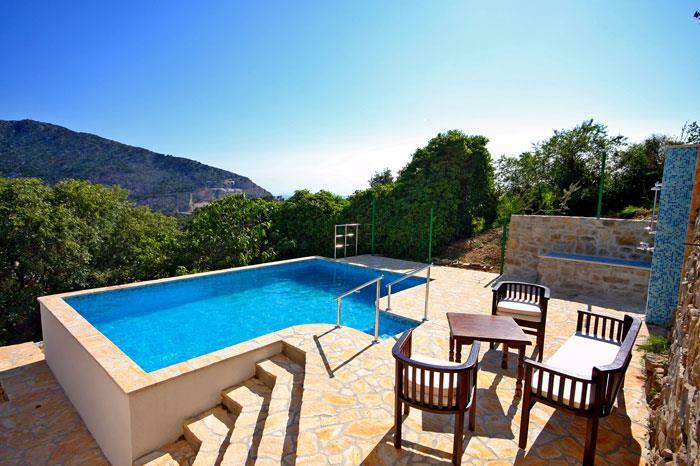 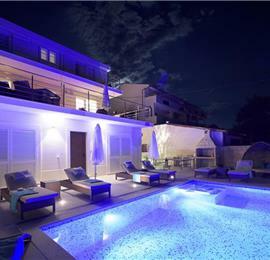 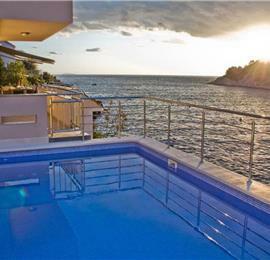 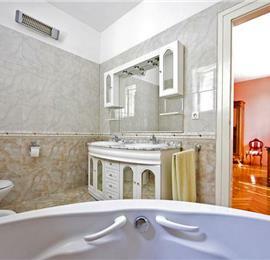 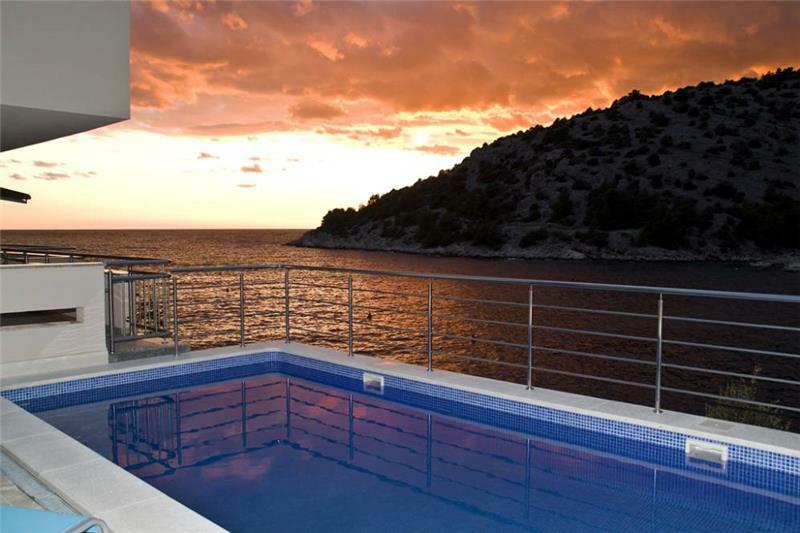 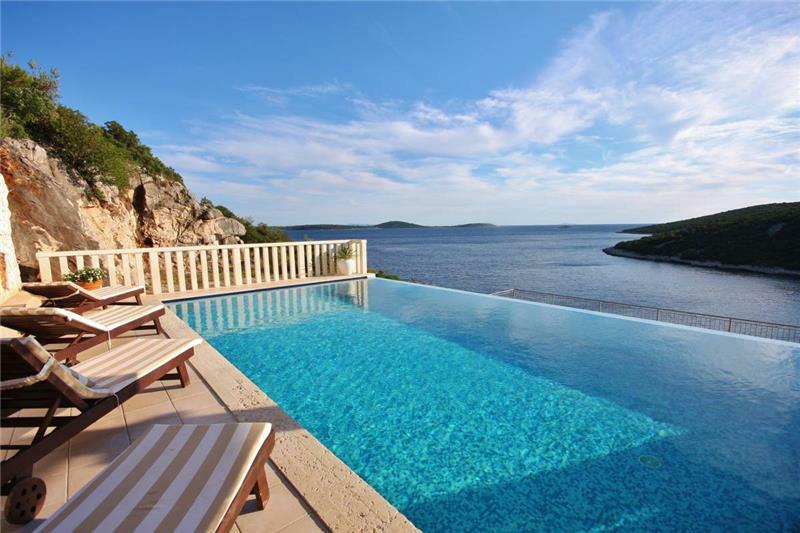 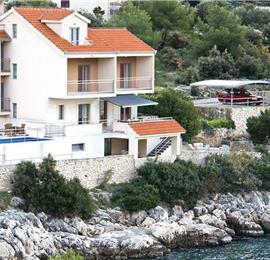 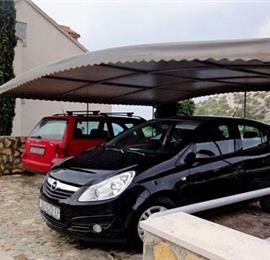 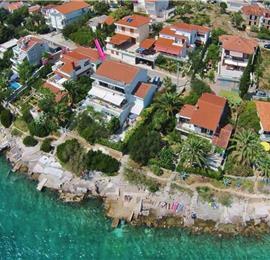 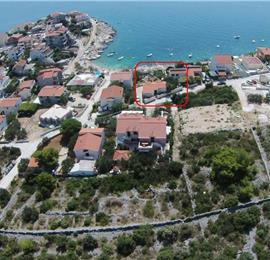 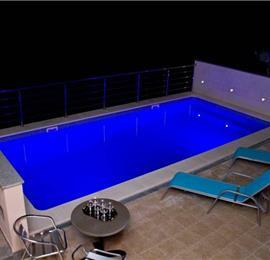 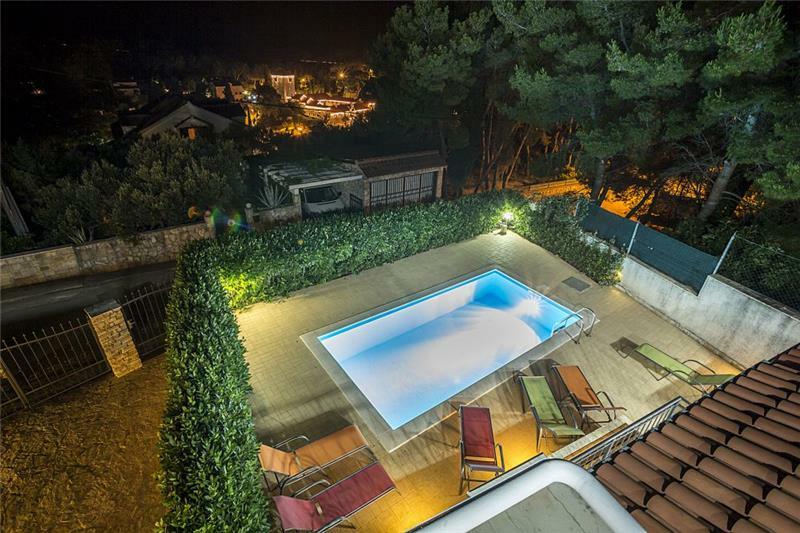 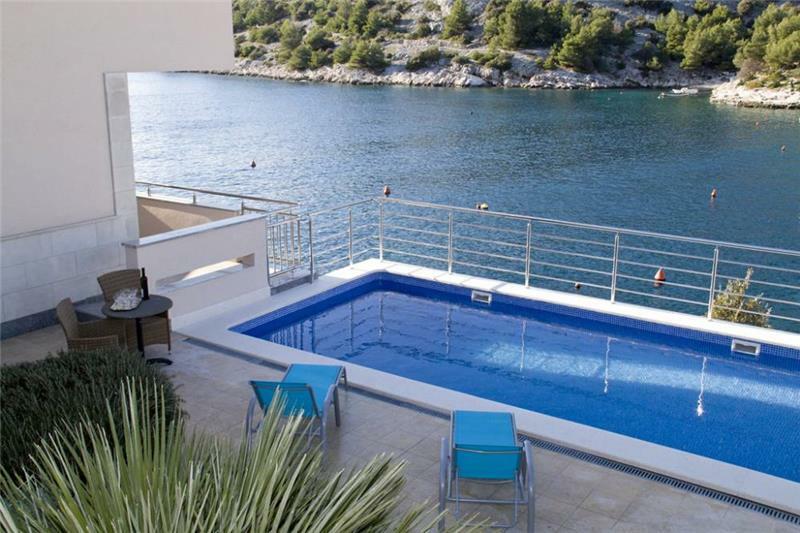 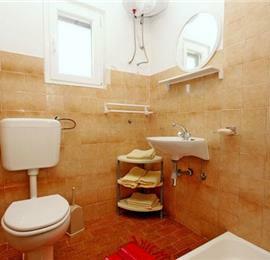 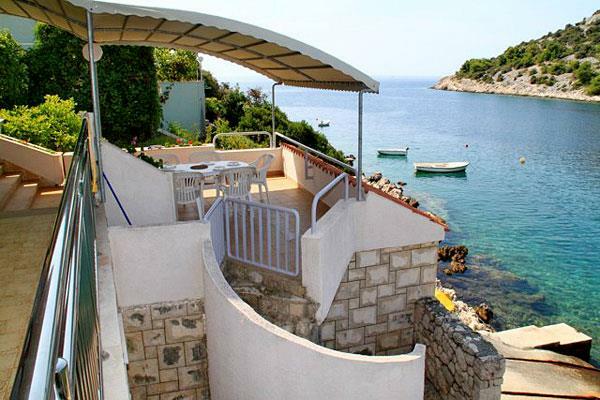 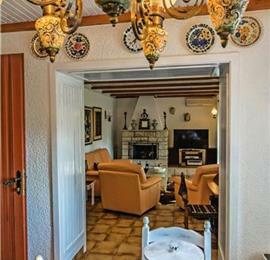 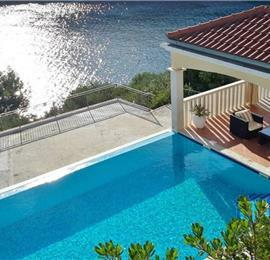 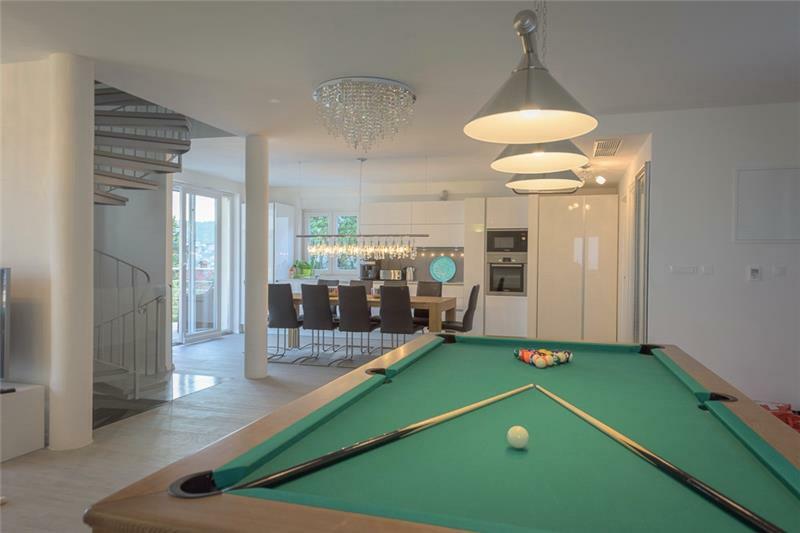 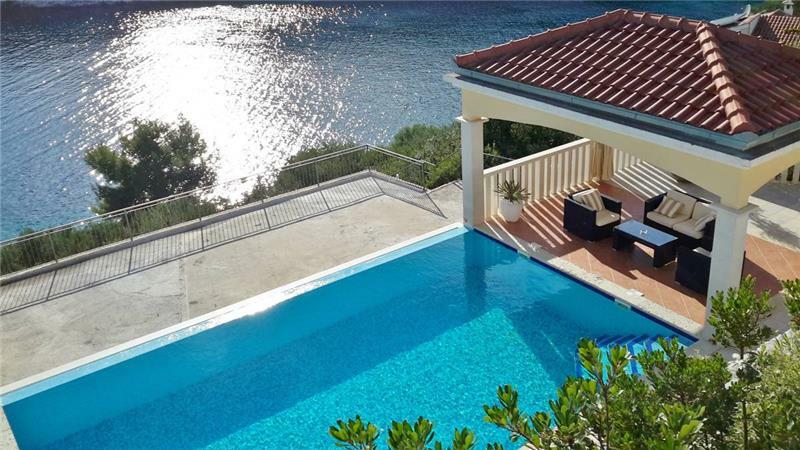 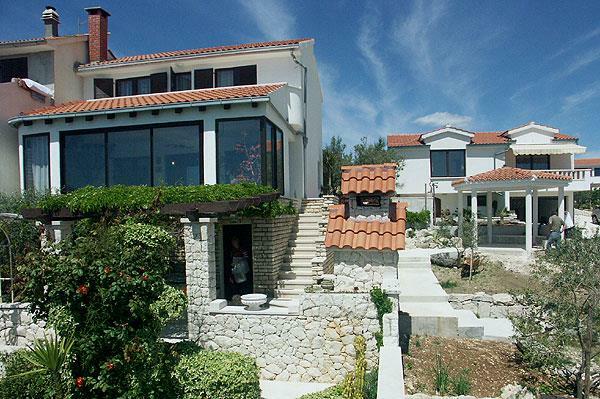 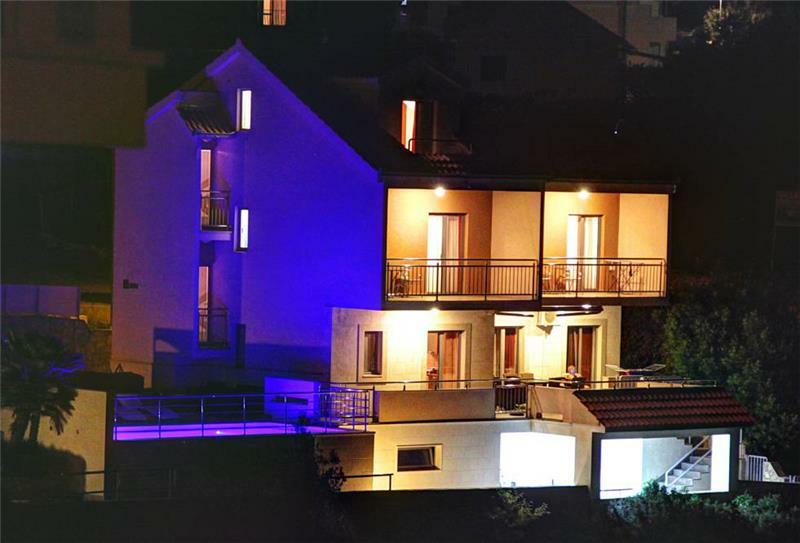 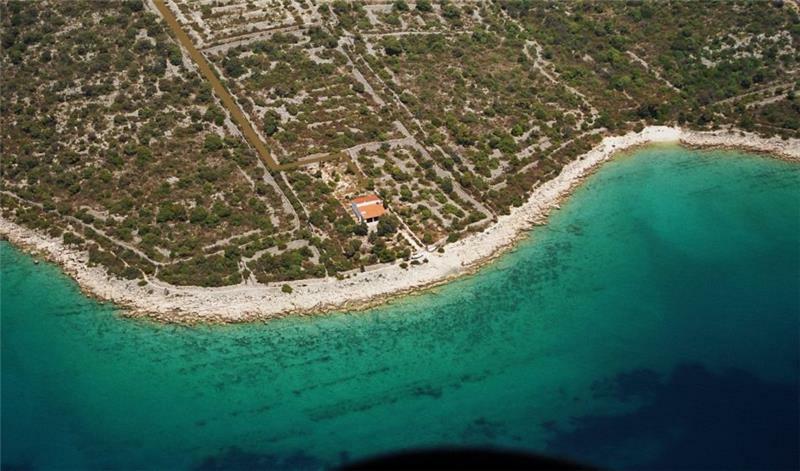 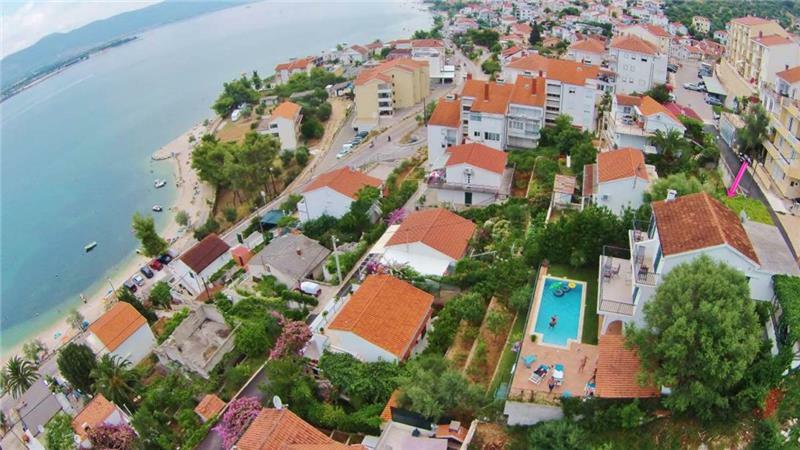 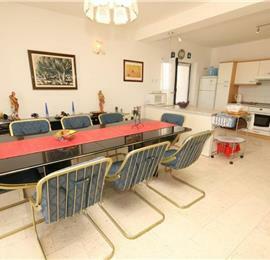 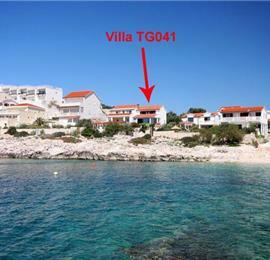 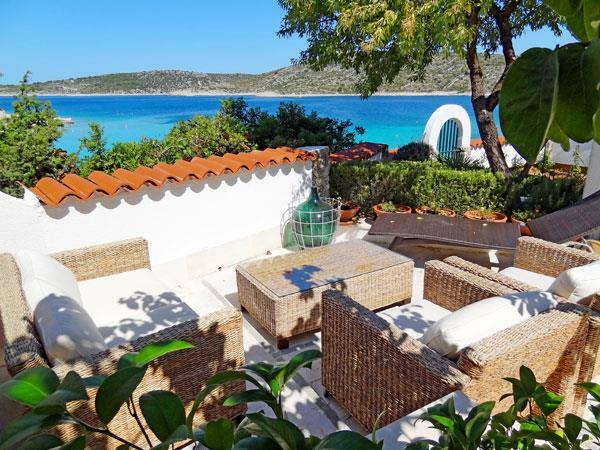 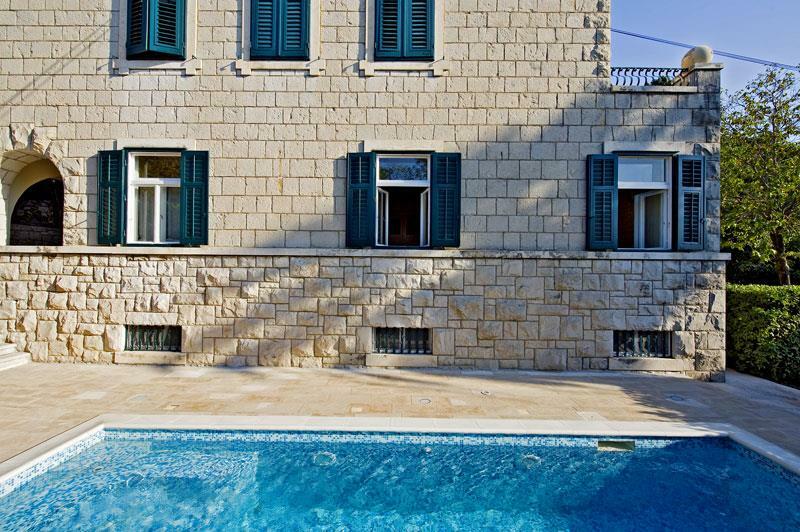 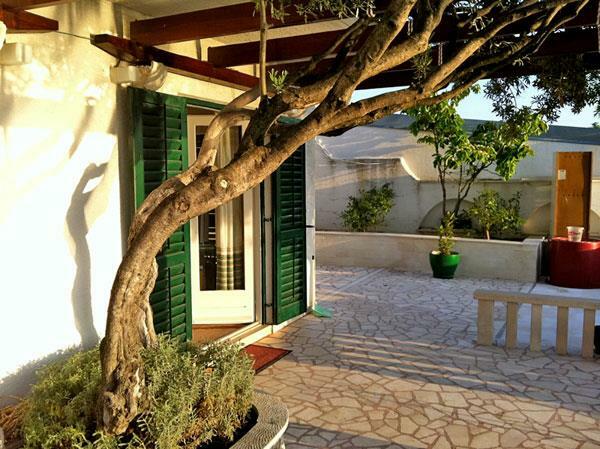 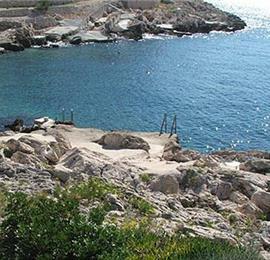 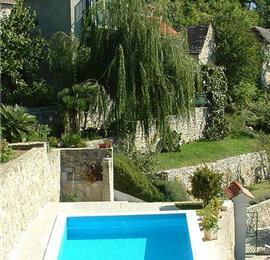 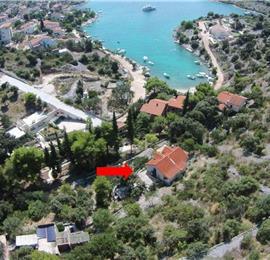 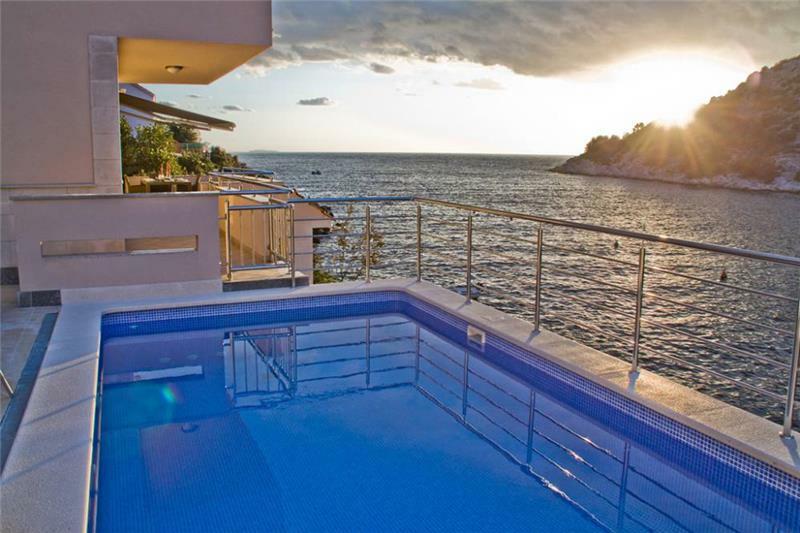 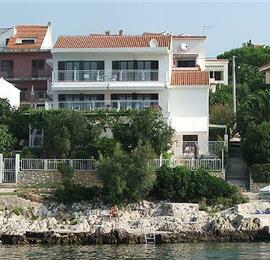 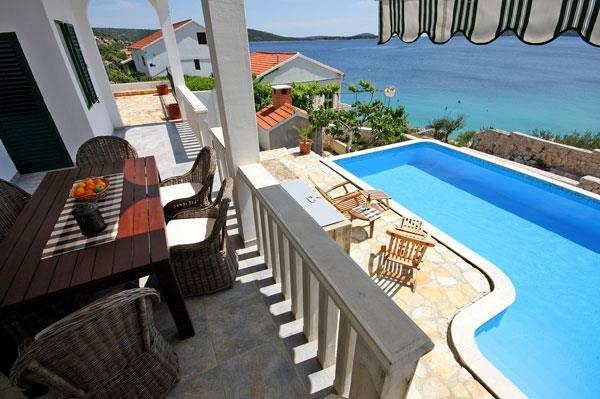 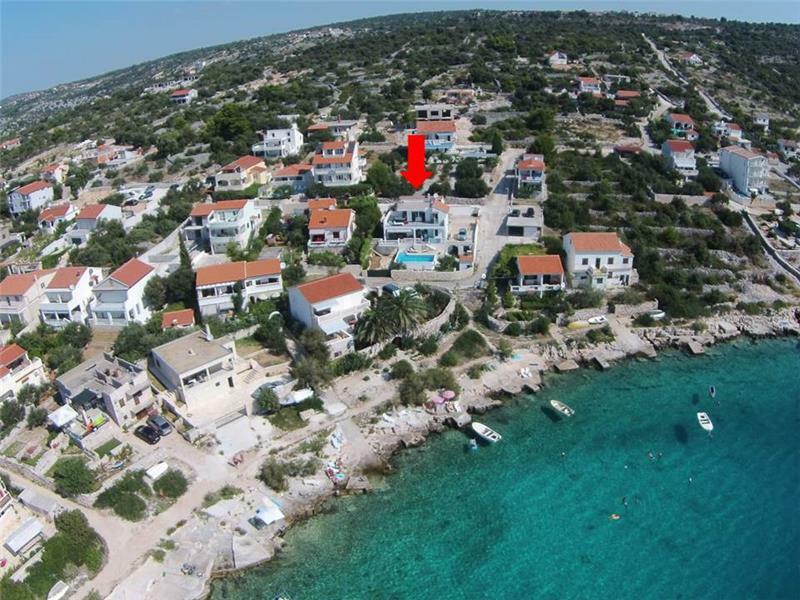 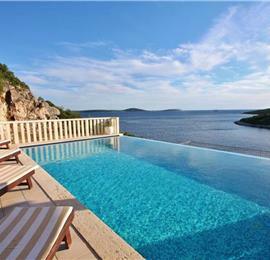 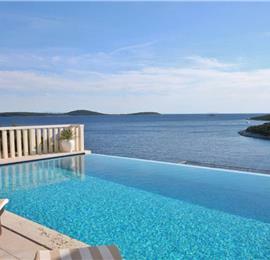 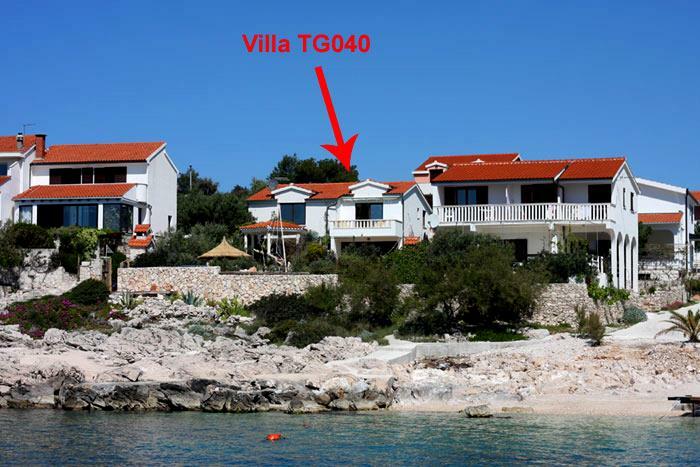 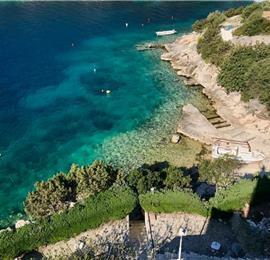 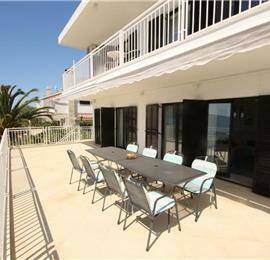 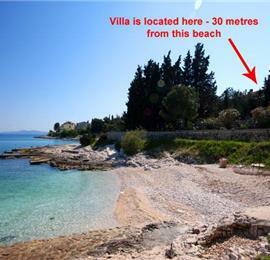 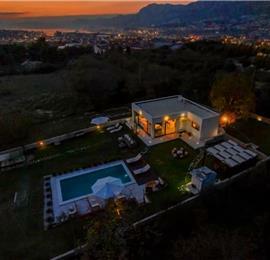 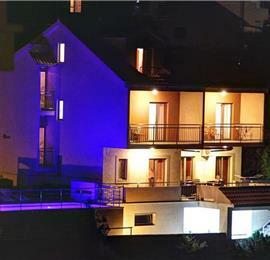 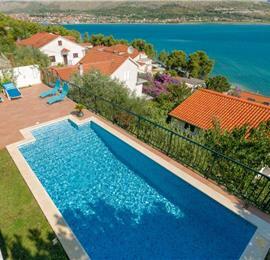 Maximum capacity of the villa is 10 persons. 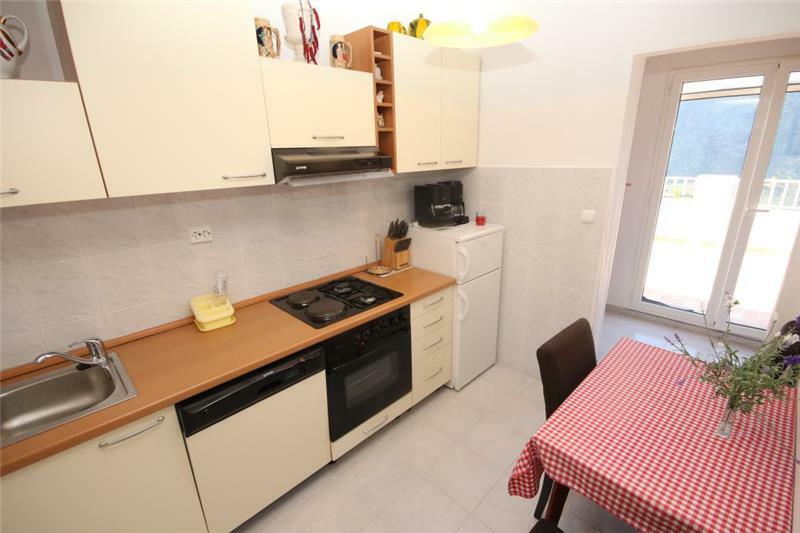 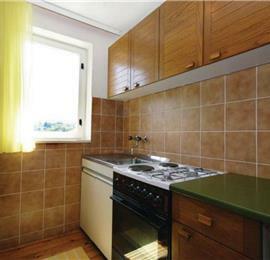 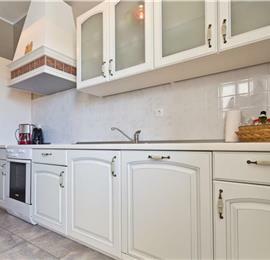 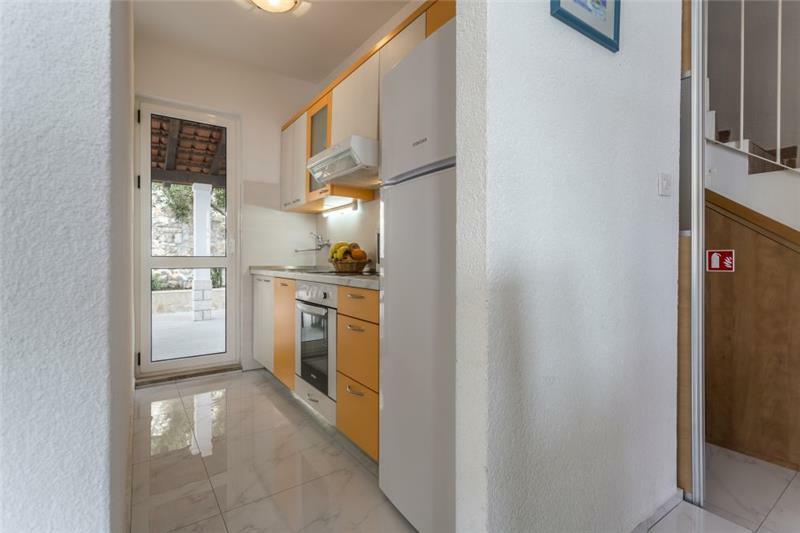 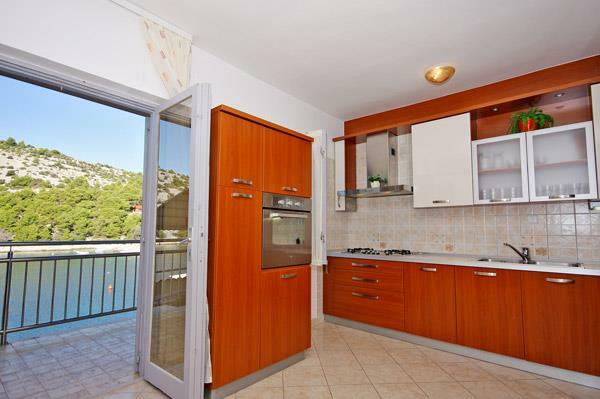 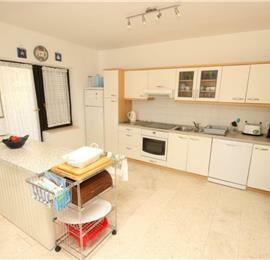 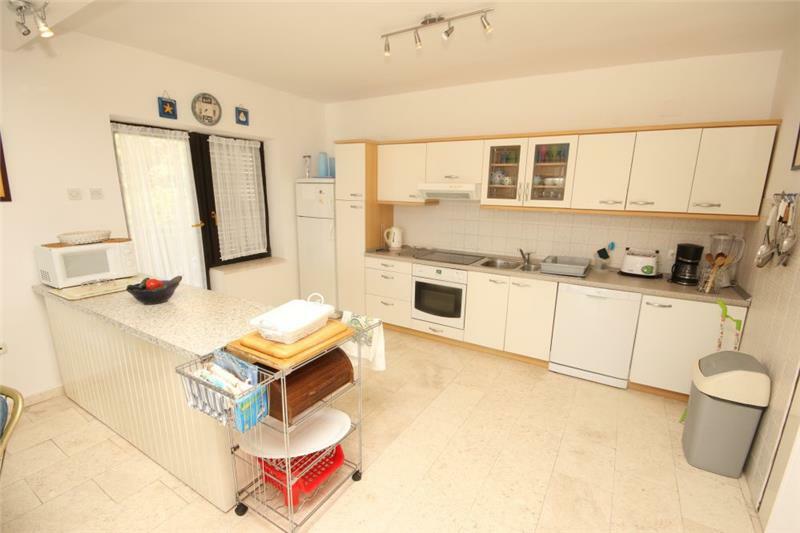 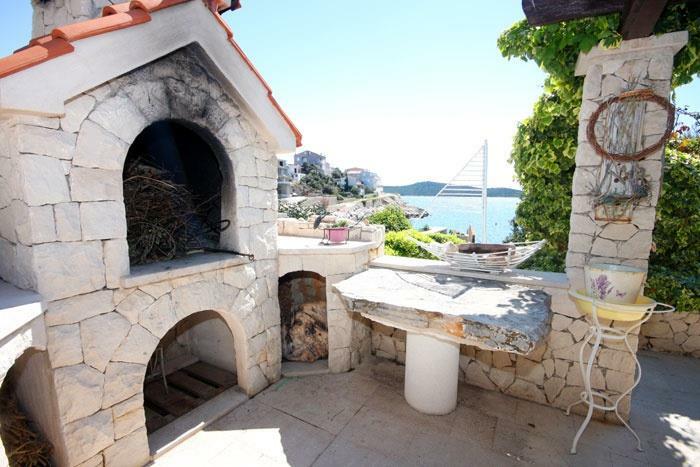 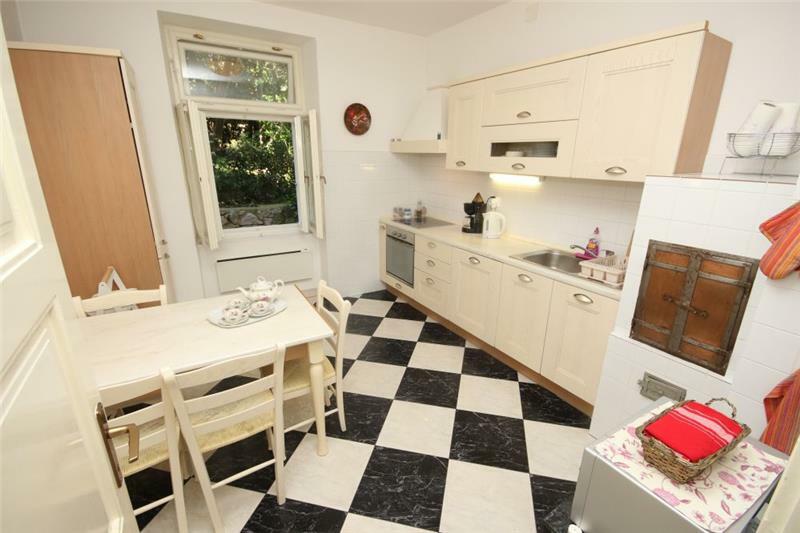 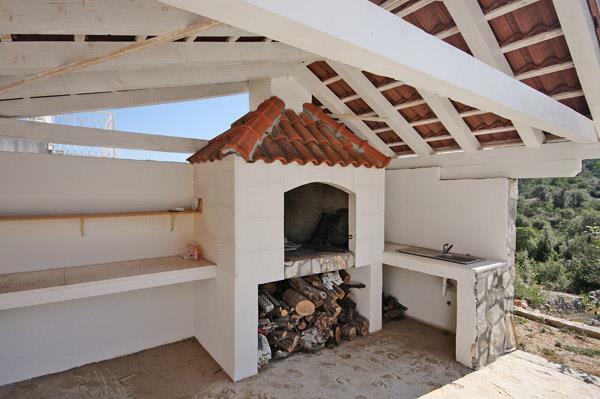 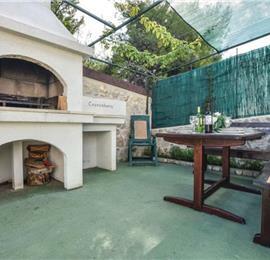 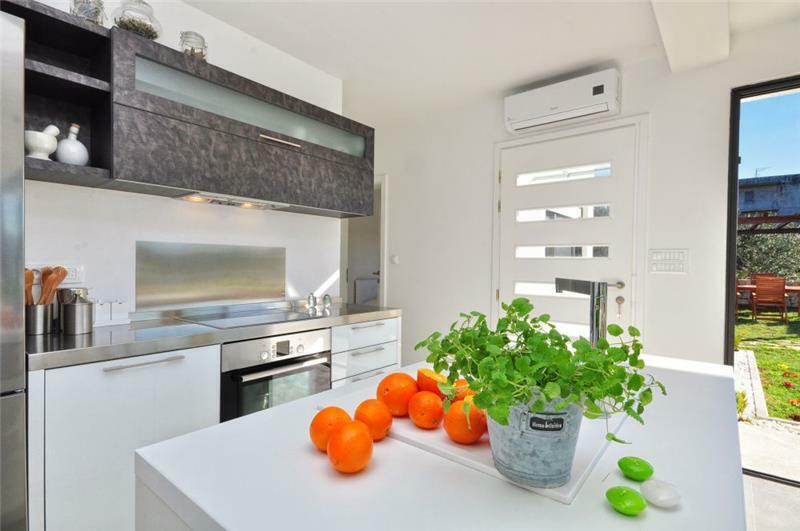 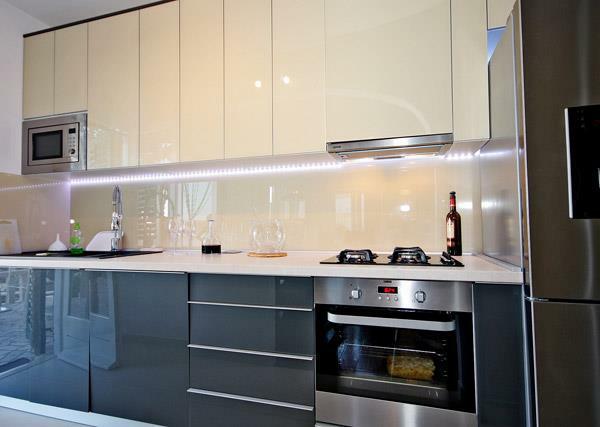 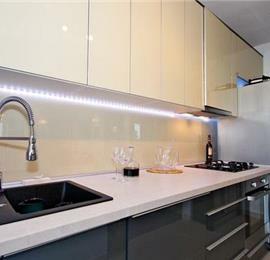 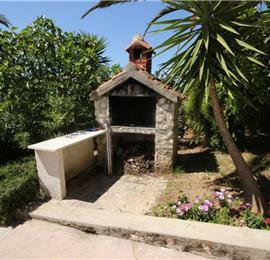 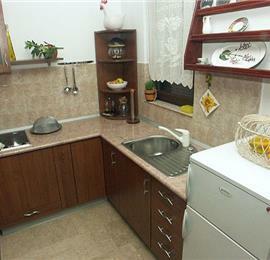 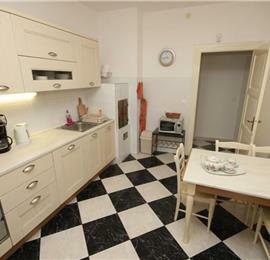 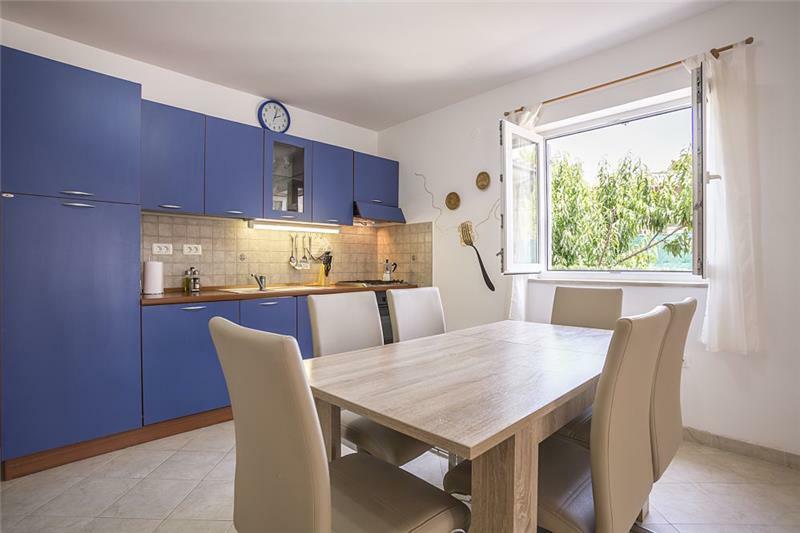 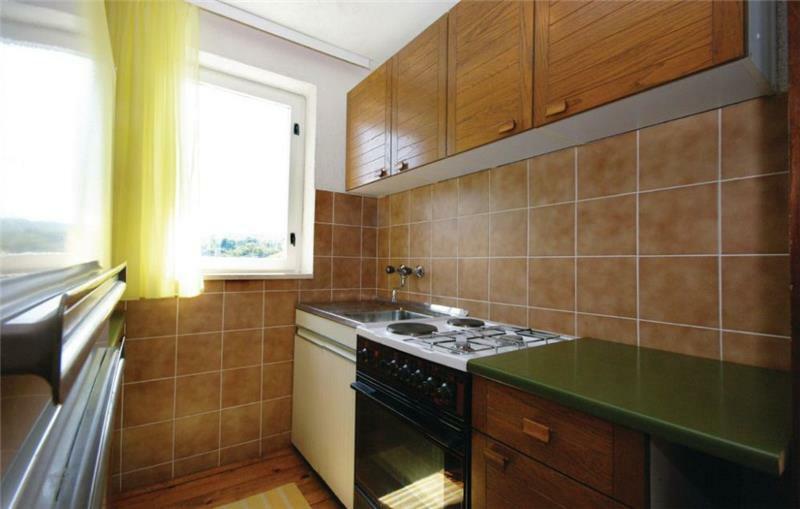 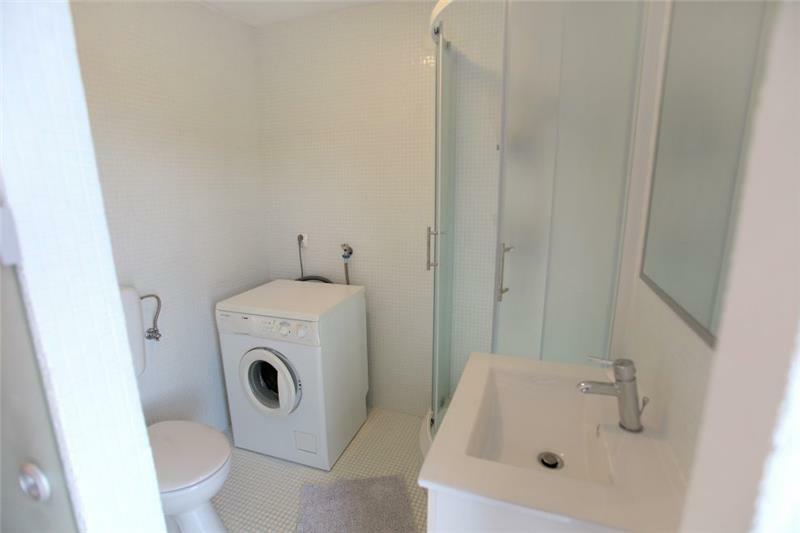 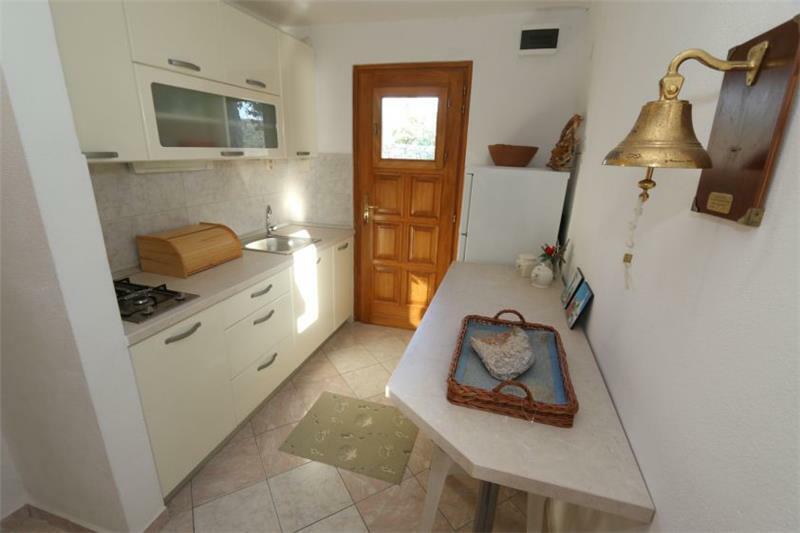 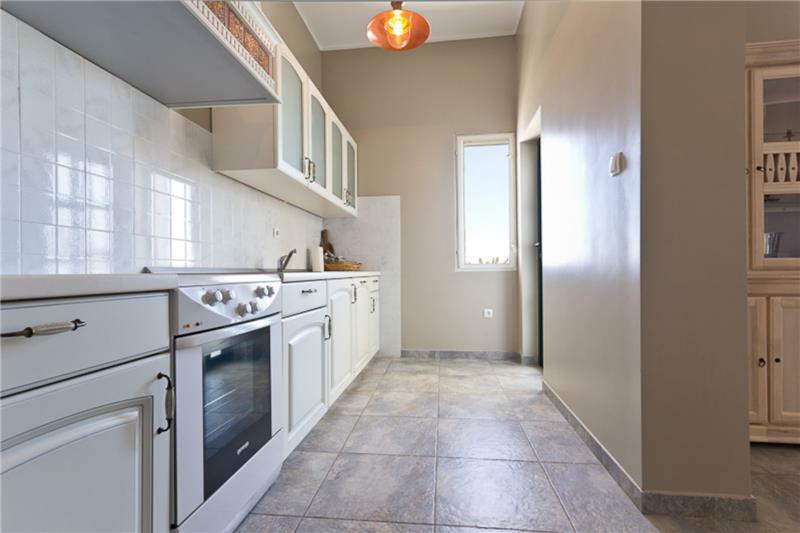 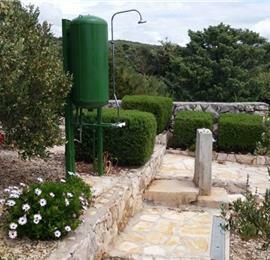 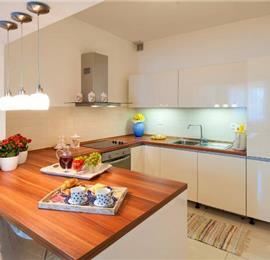 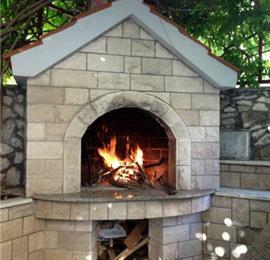 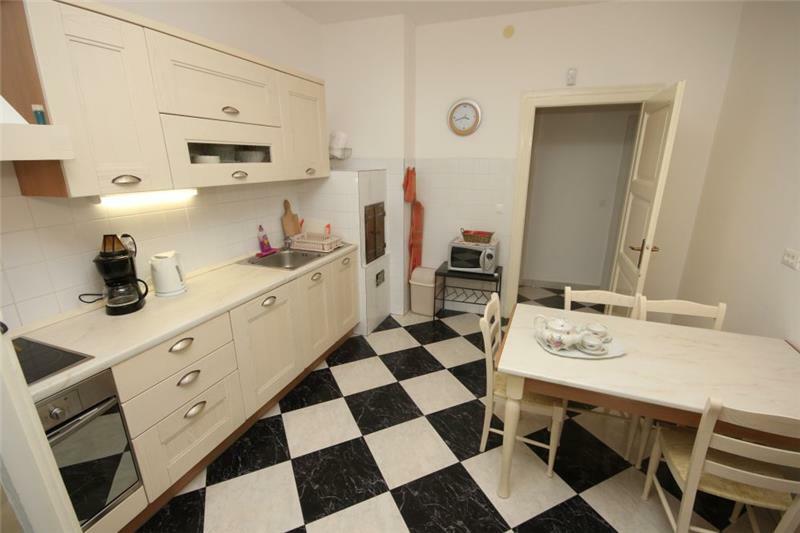 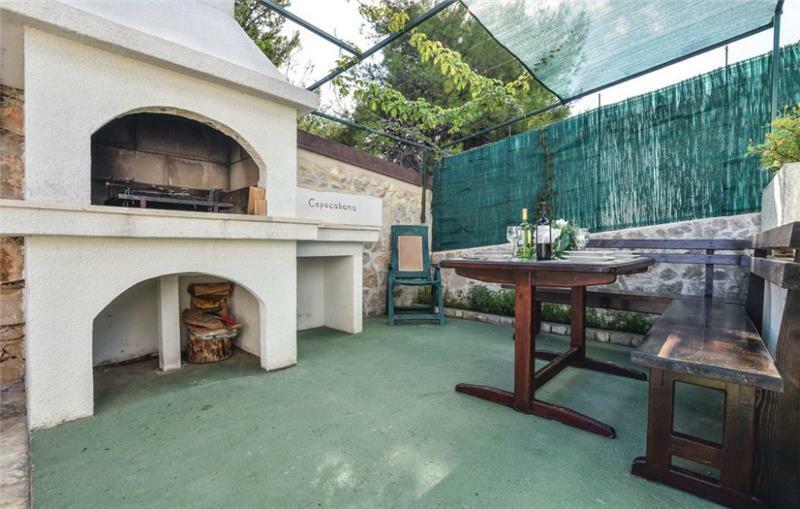 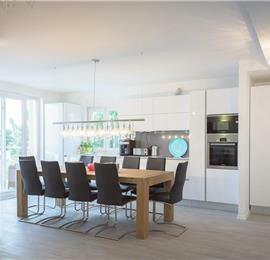 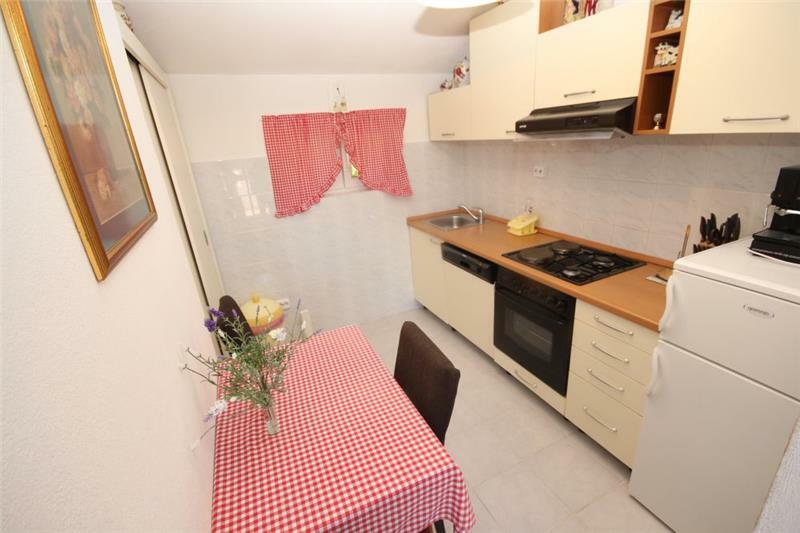 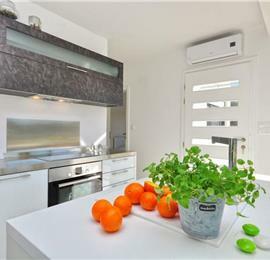 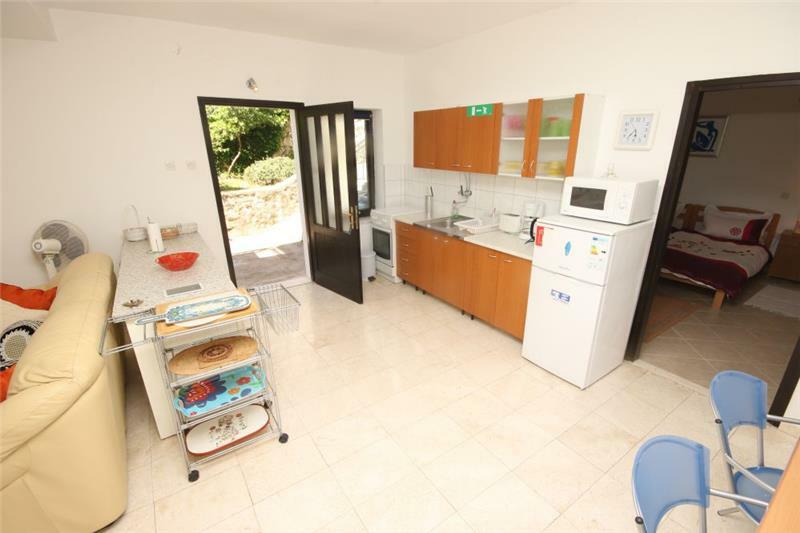 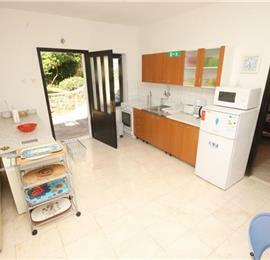 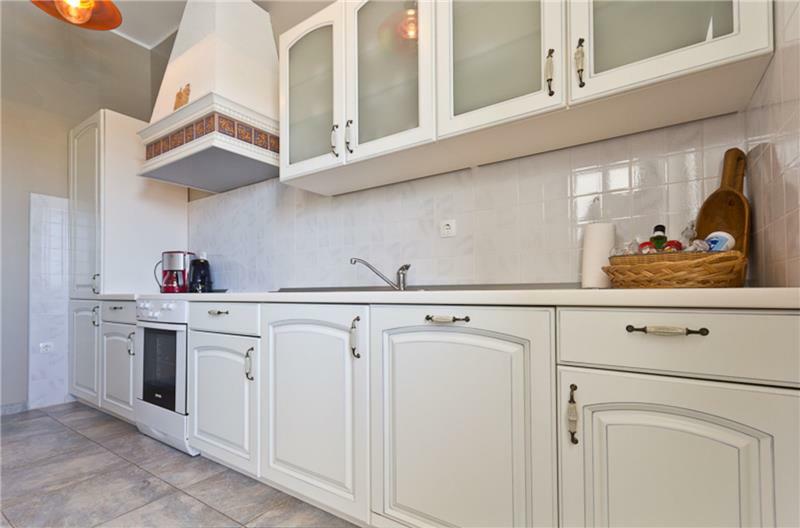 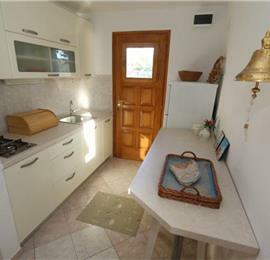 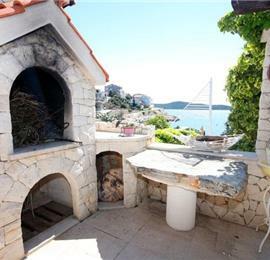 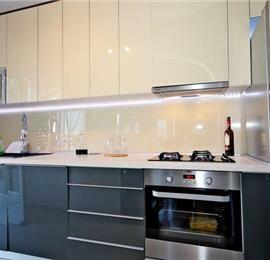 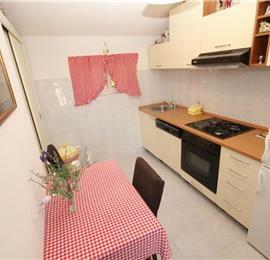 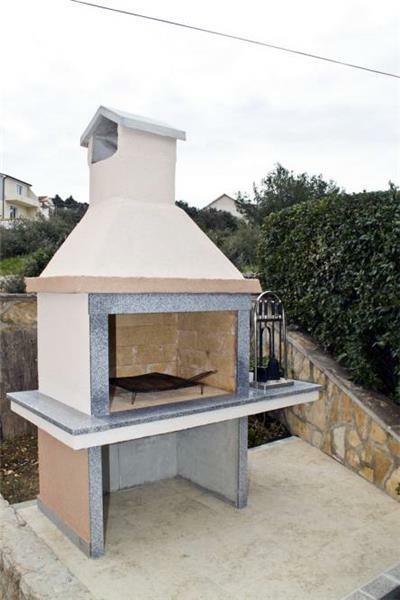 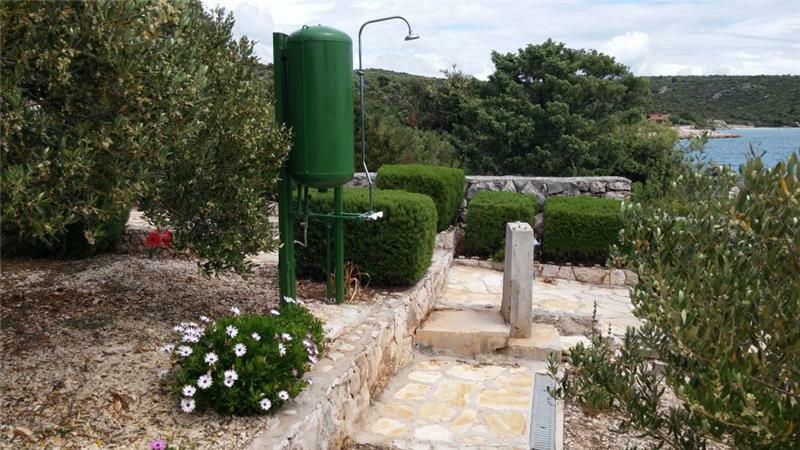 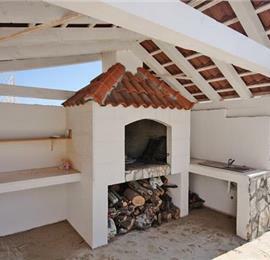 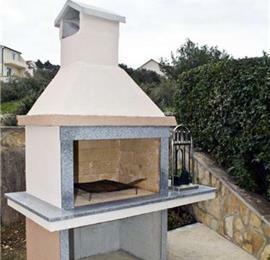 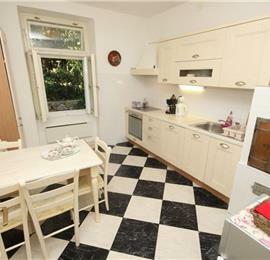 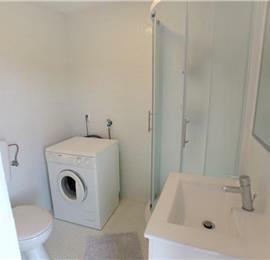 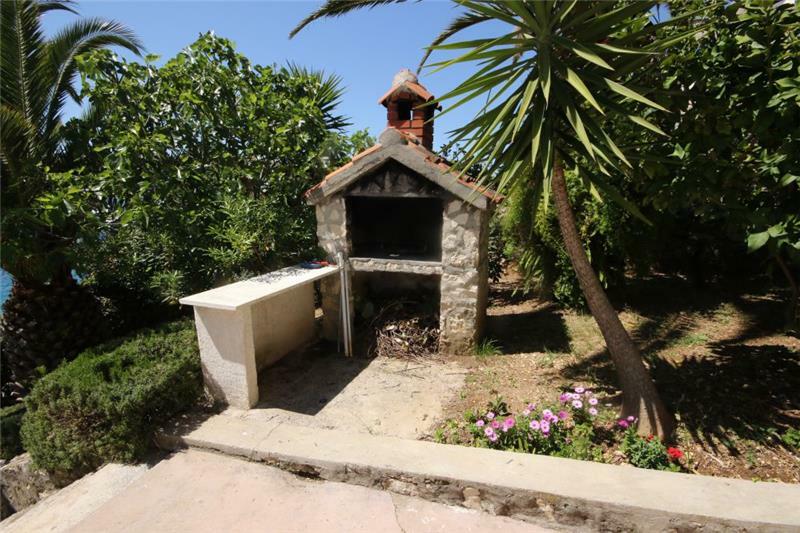 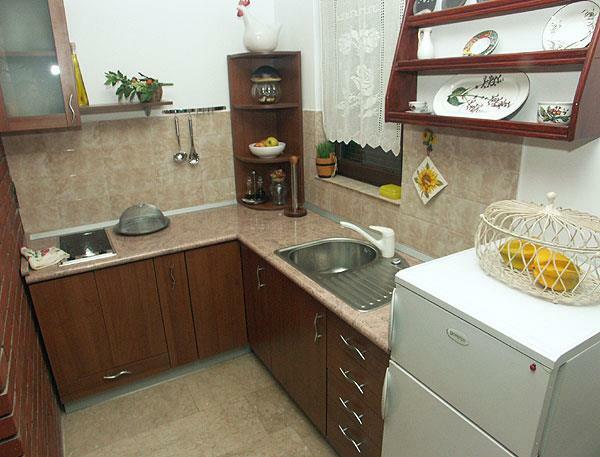 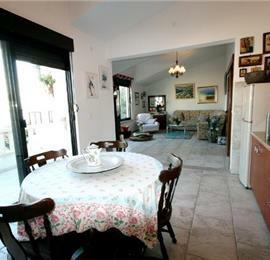 Gas cooker available in summer kitchen which is located next to BBQ/outdoor dining area. 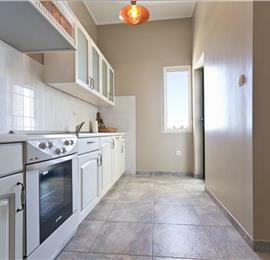 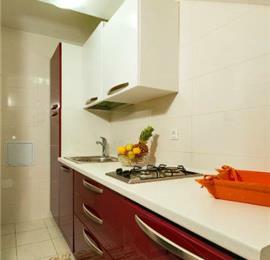 Electric cookers are located in the apartments. 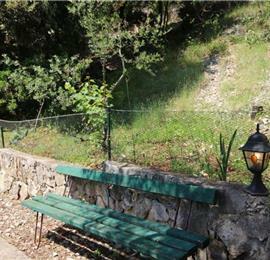 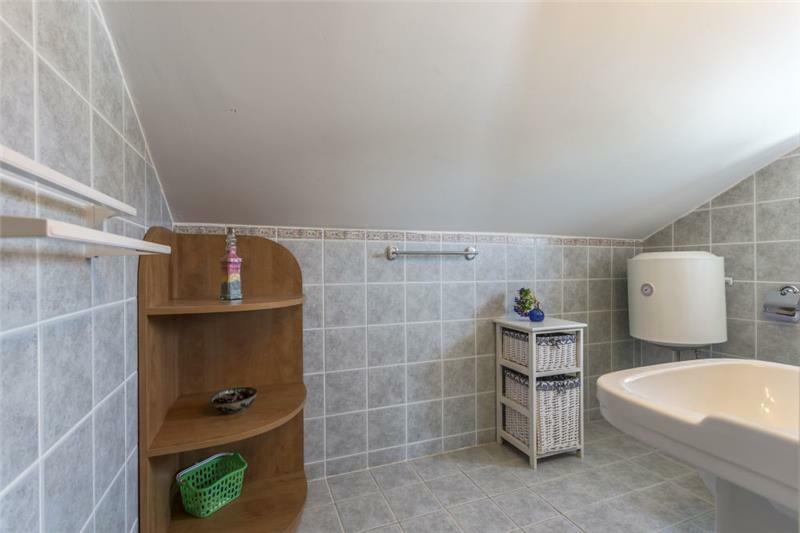 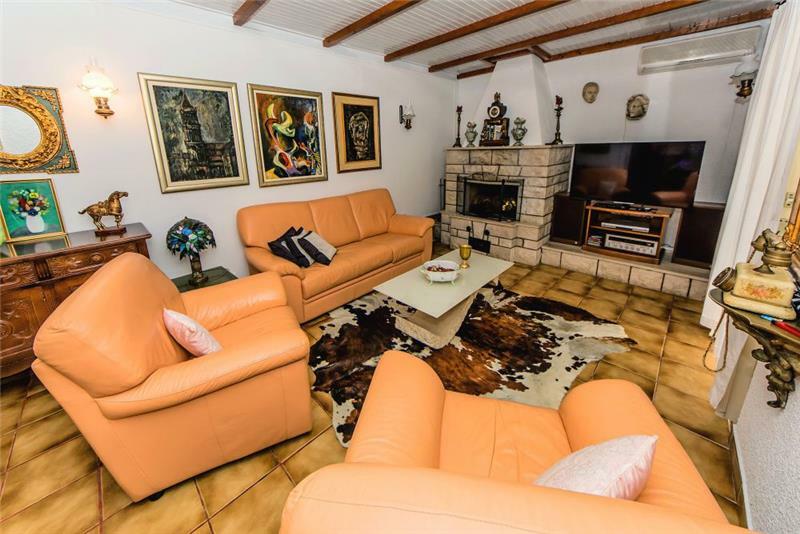 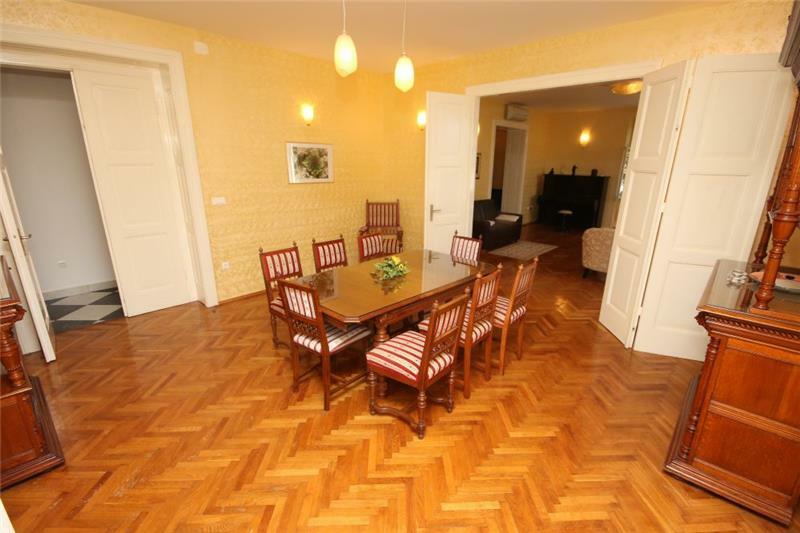 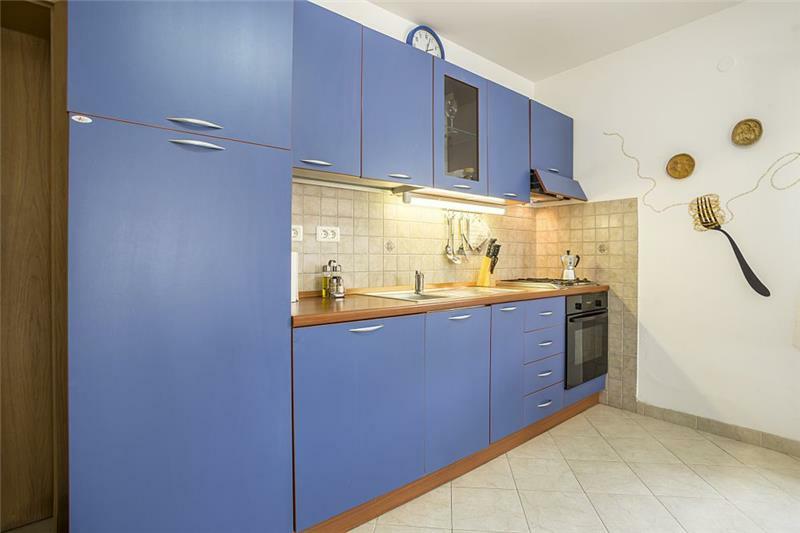 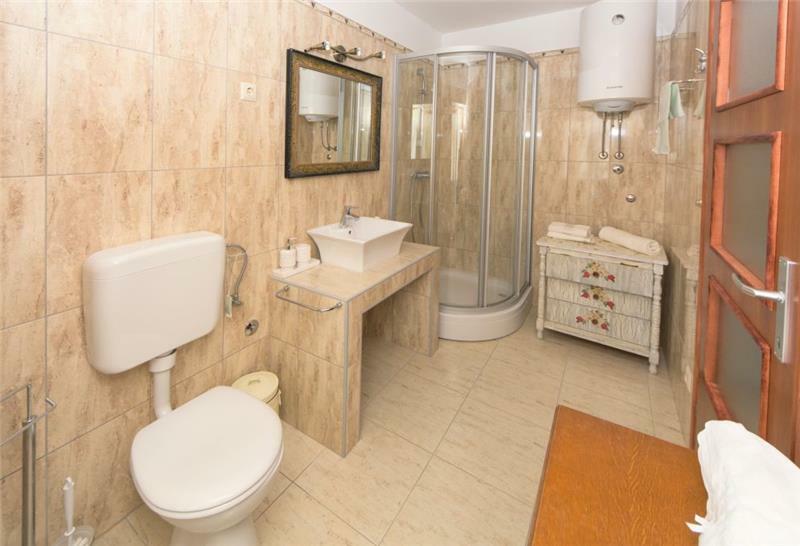 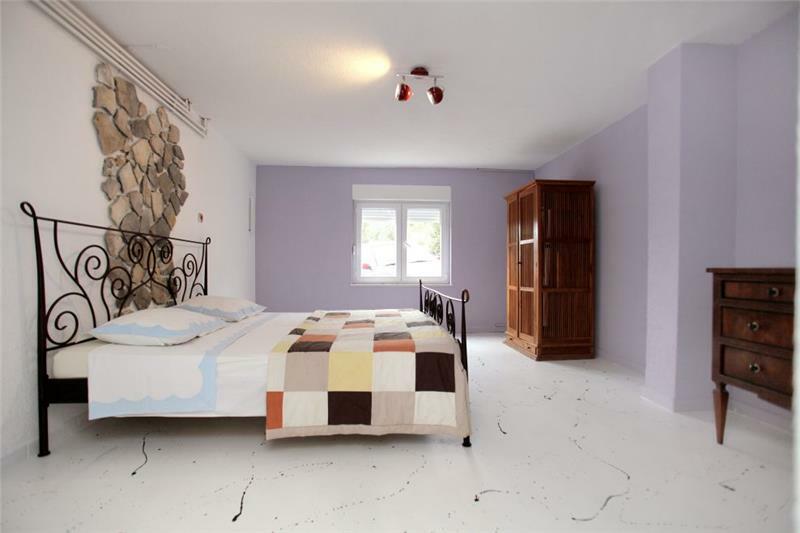 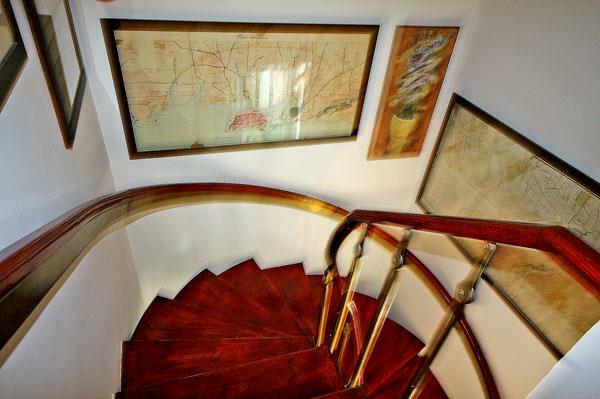 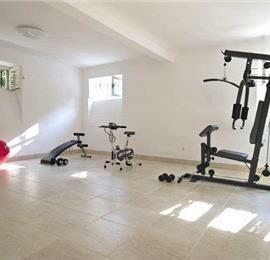 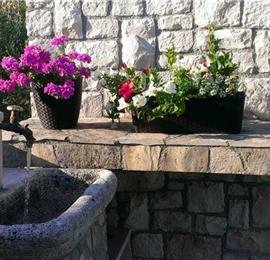 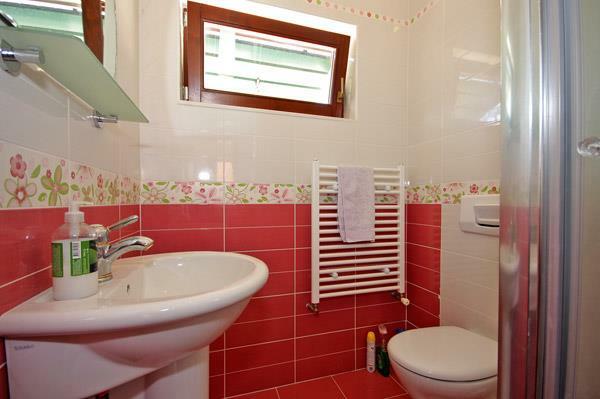 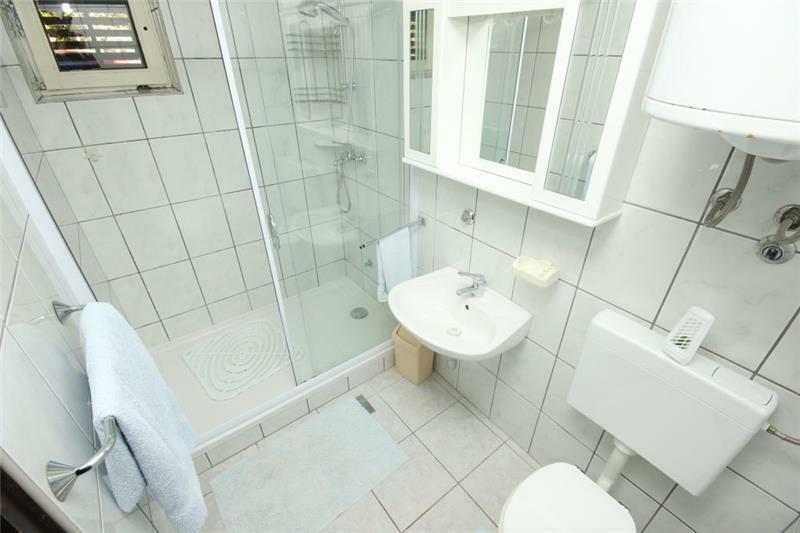 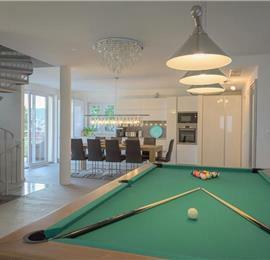 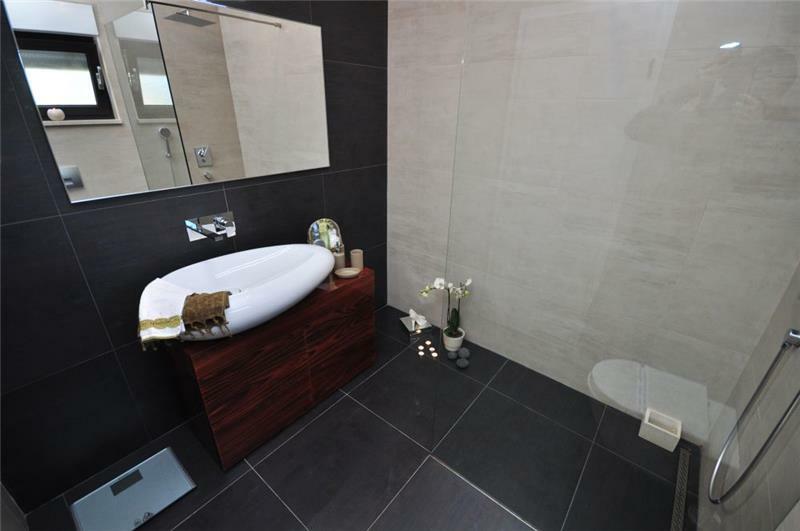 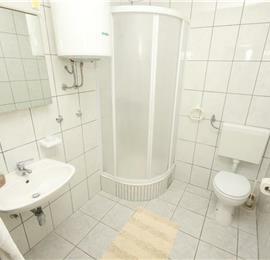 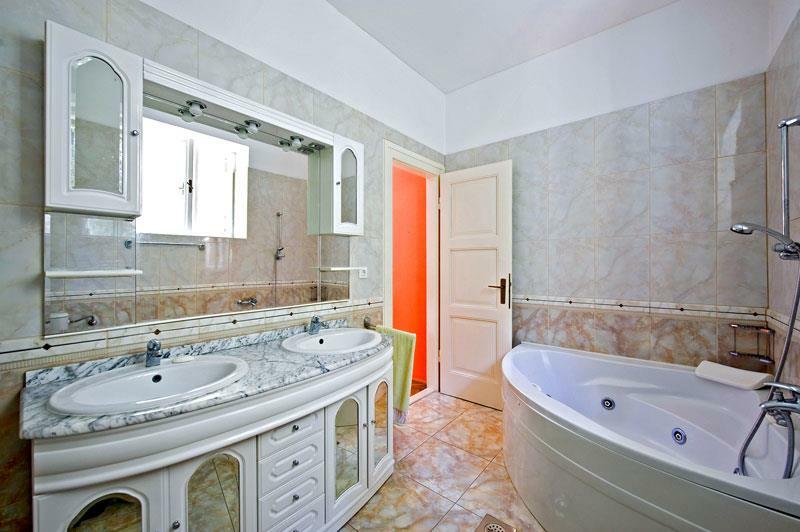 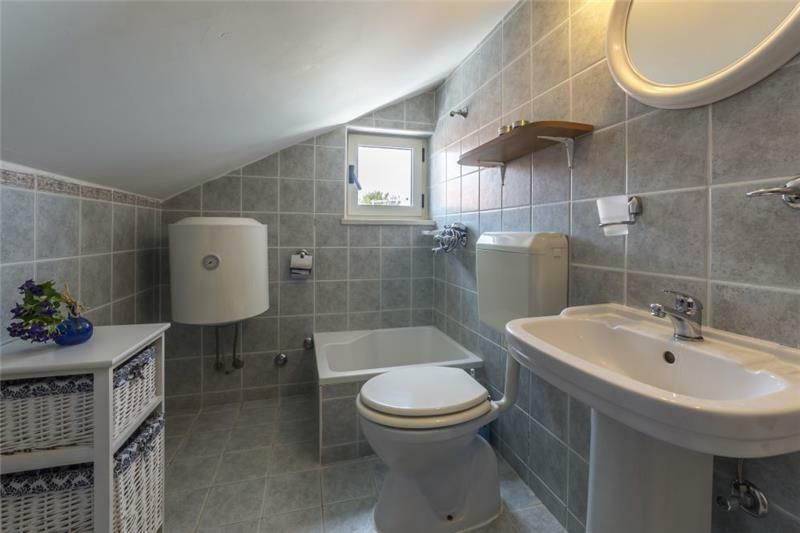 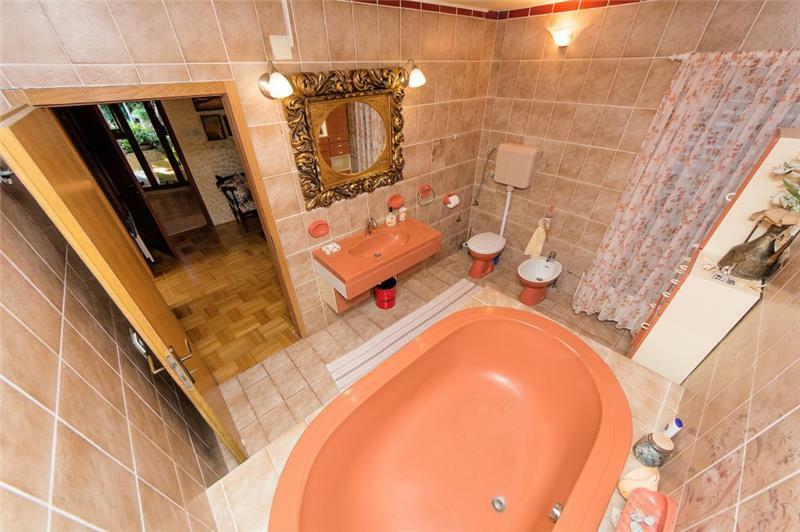 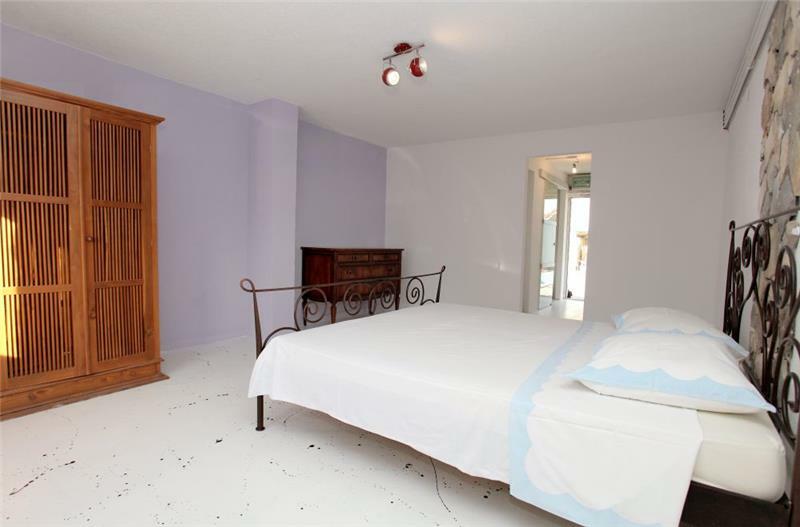 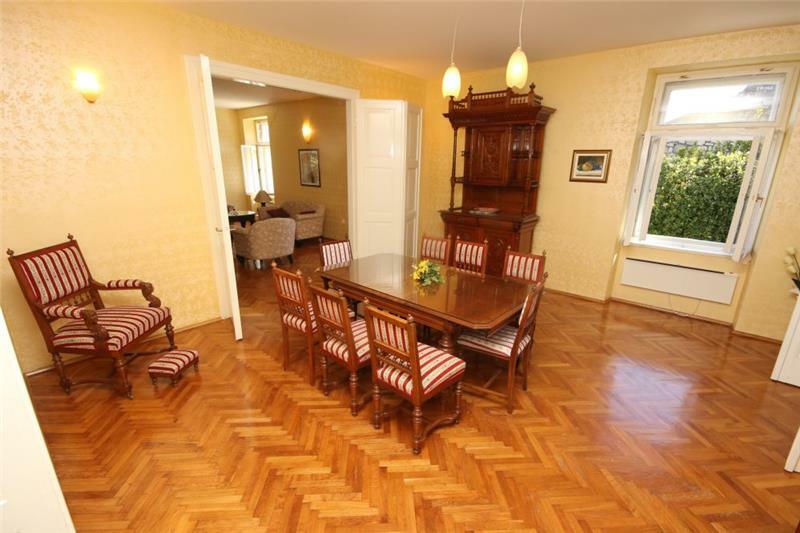 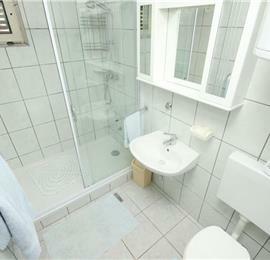 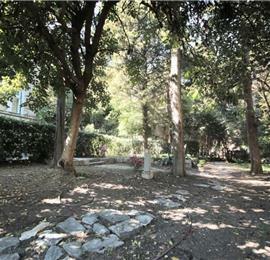 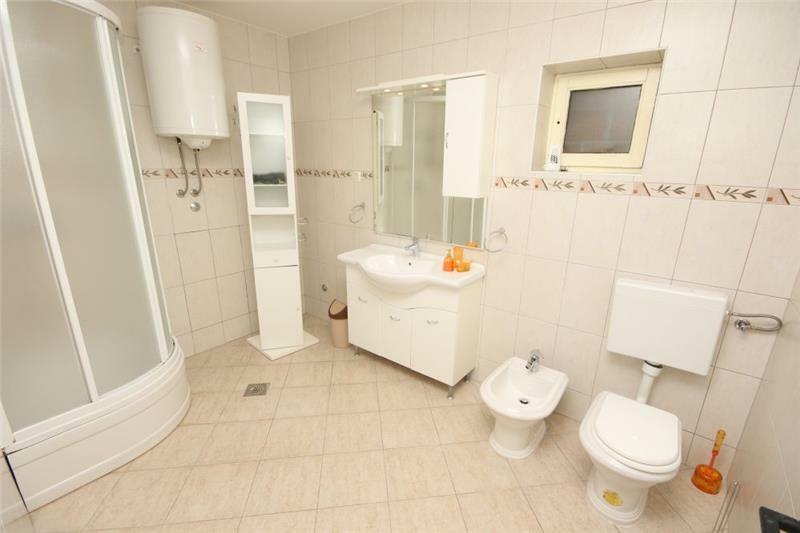 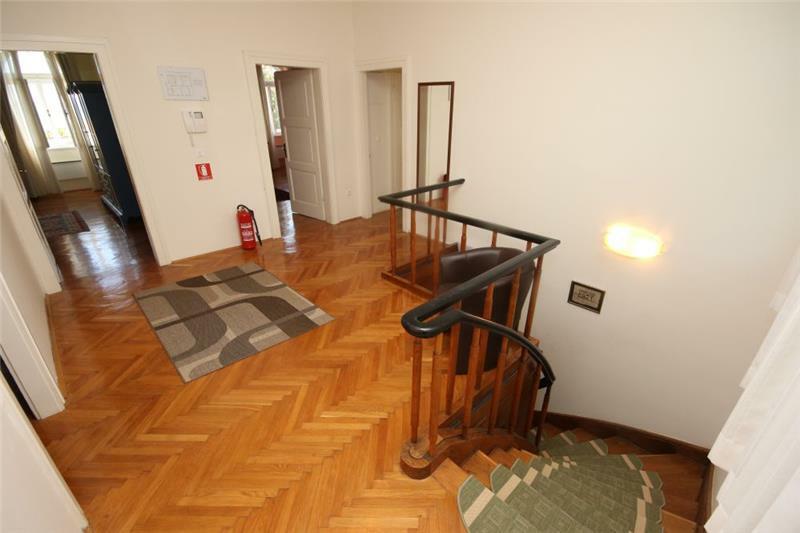 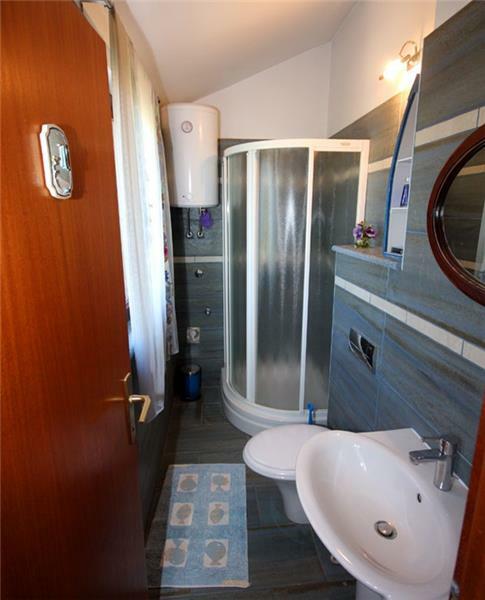 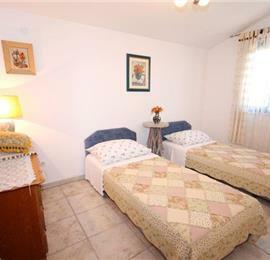 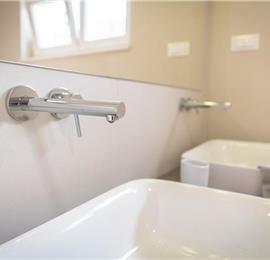 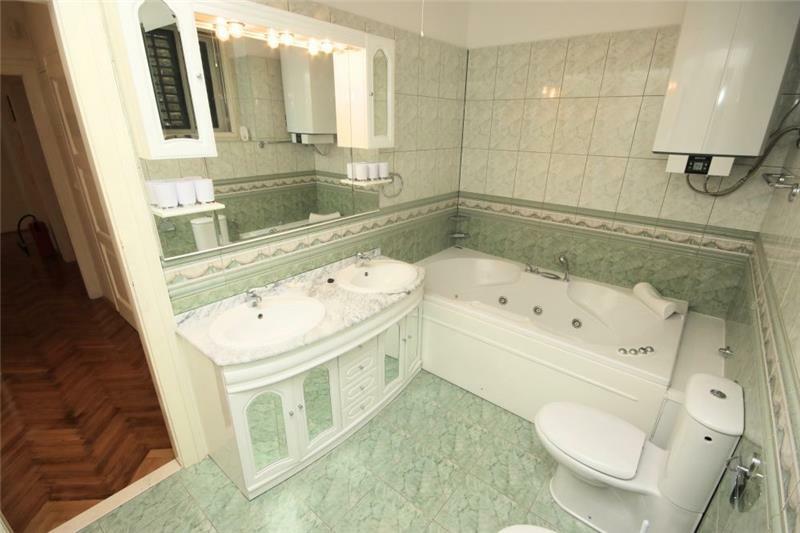 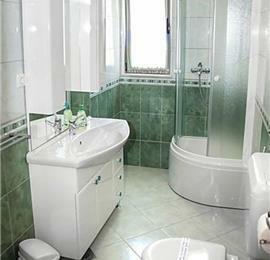 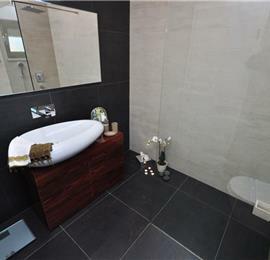 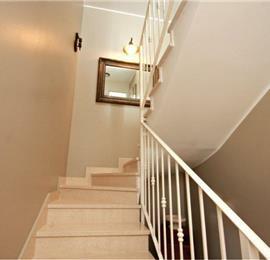 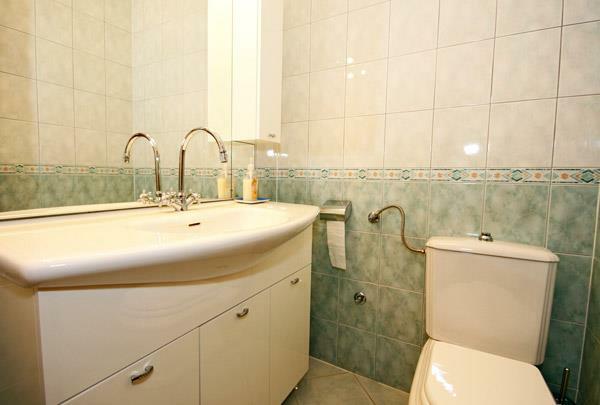 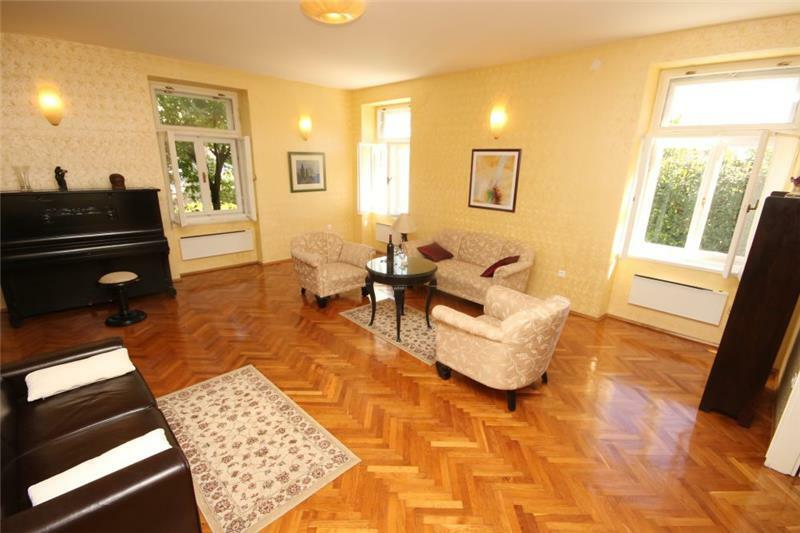 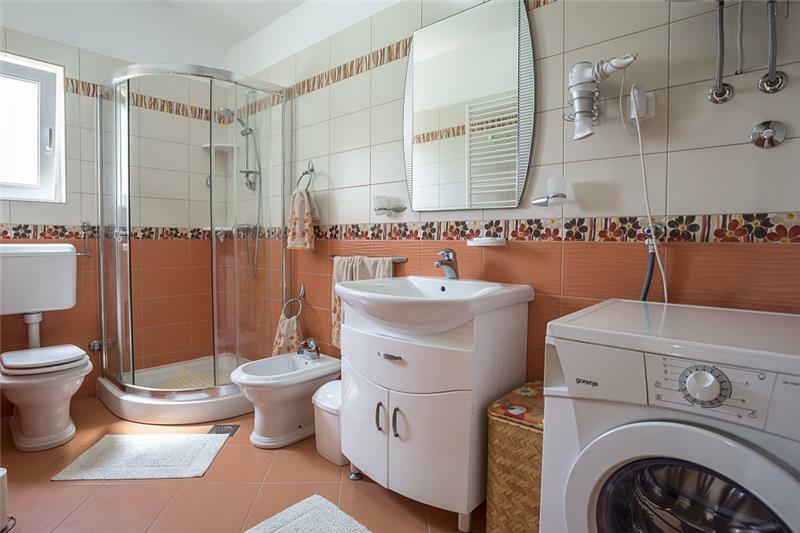 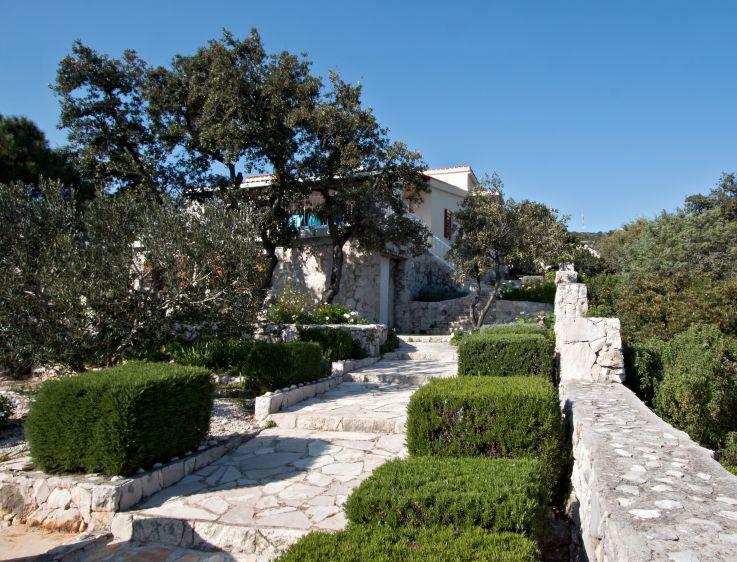 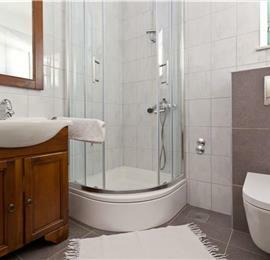 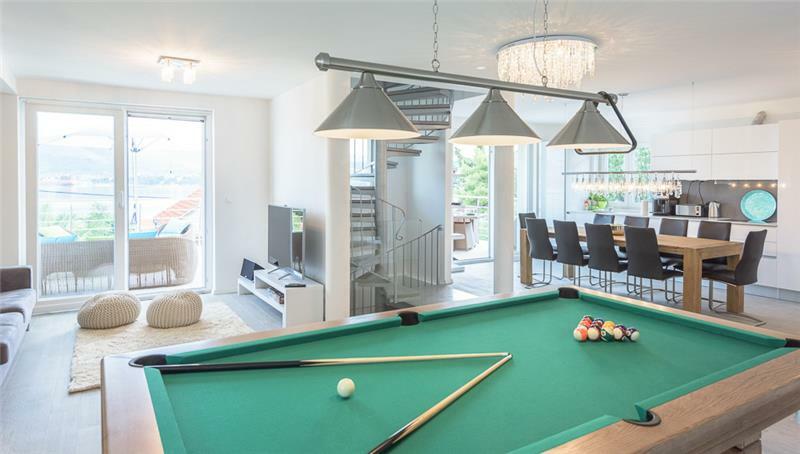 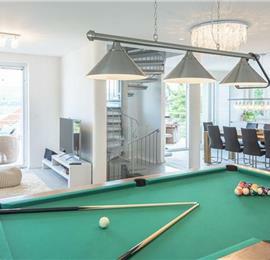 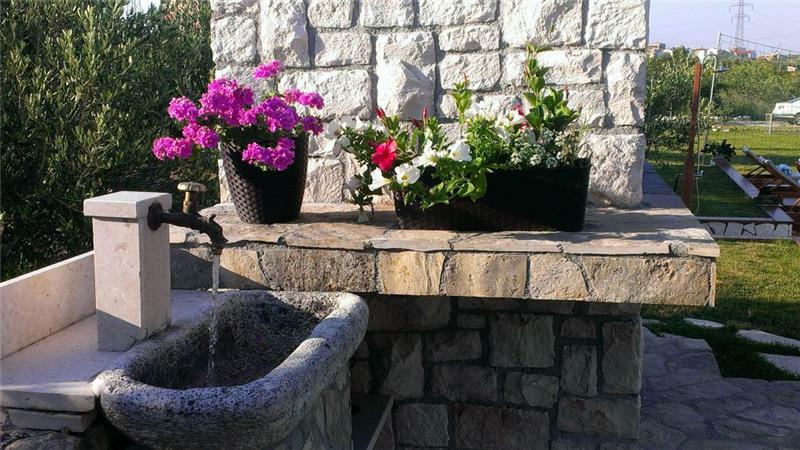 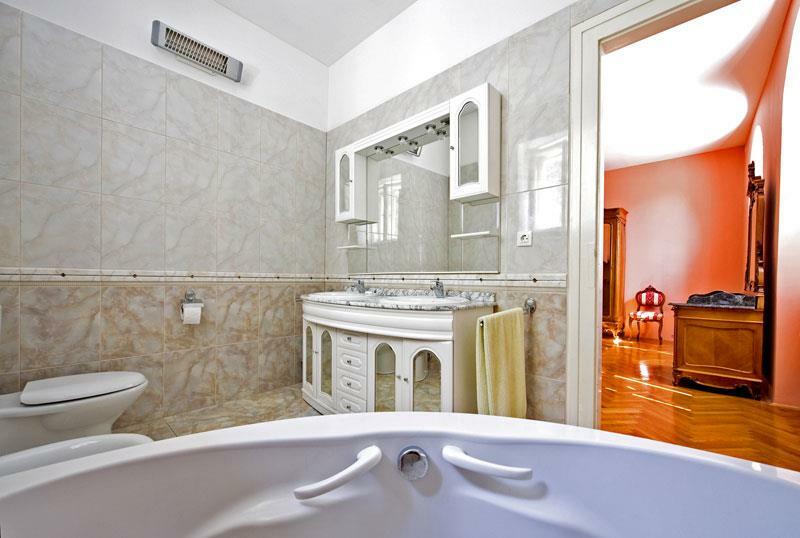 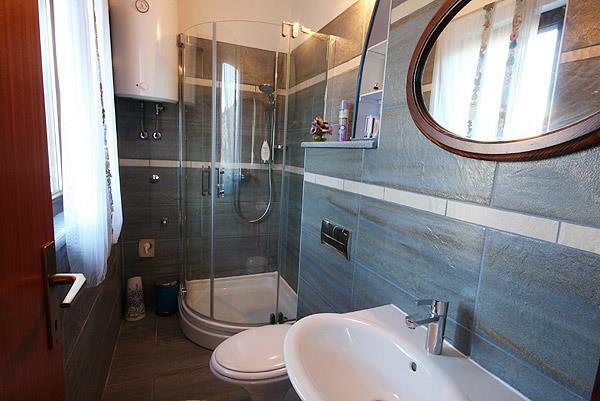 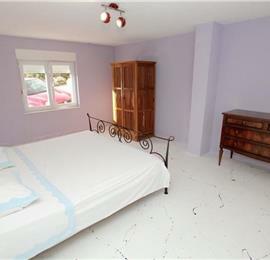 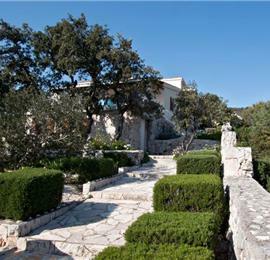 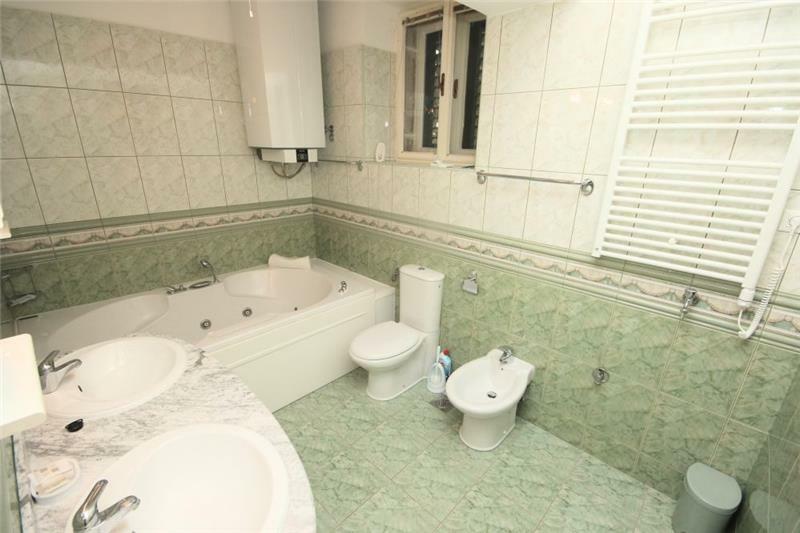 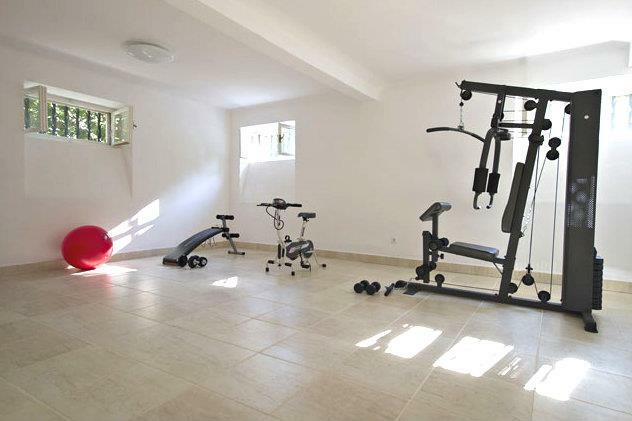 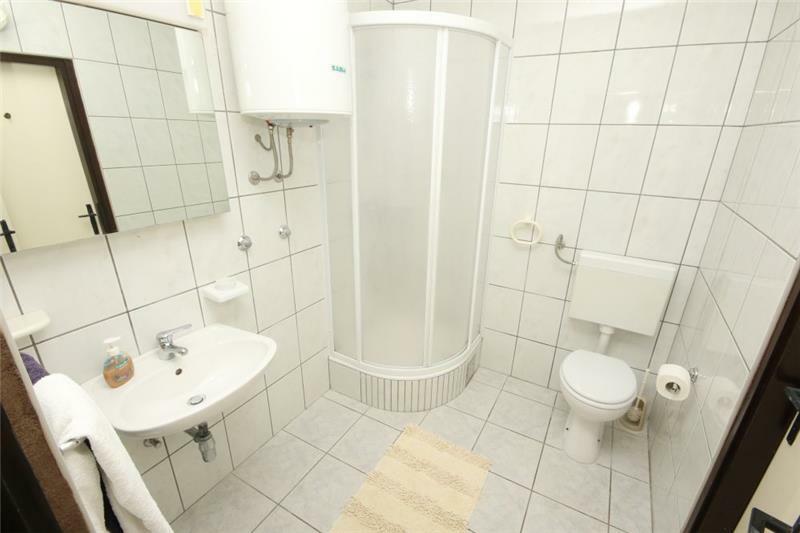 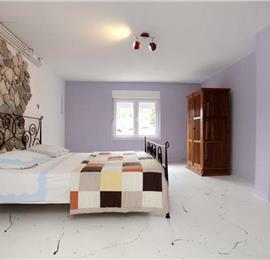 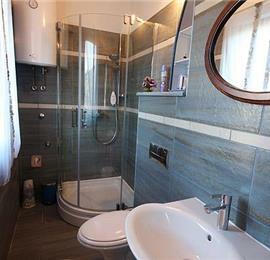 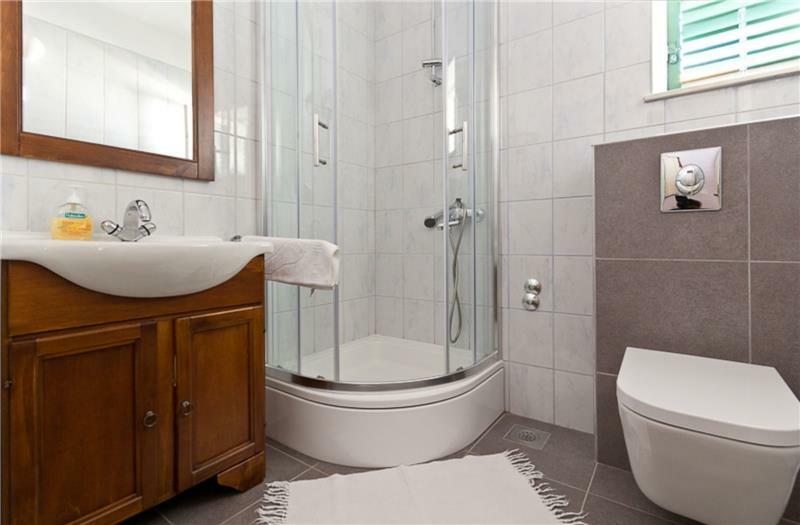 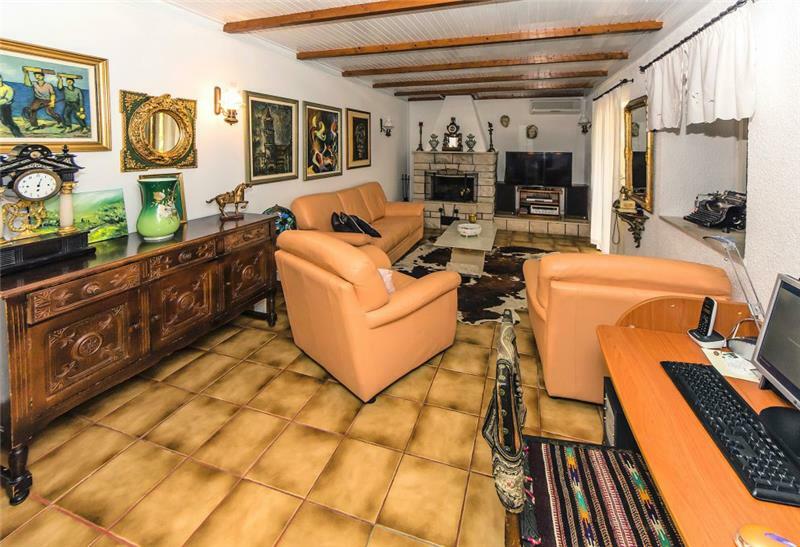 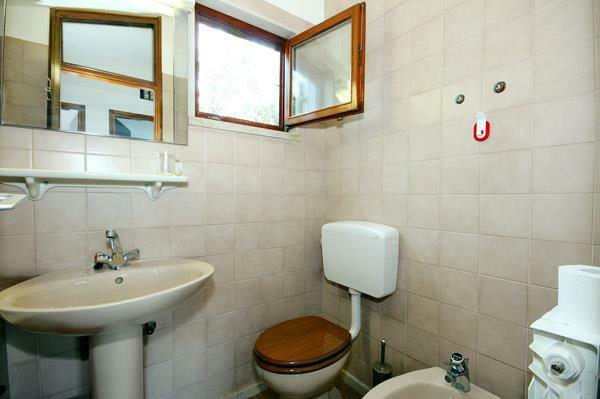 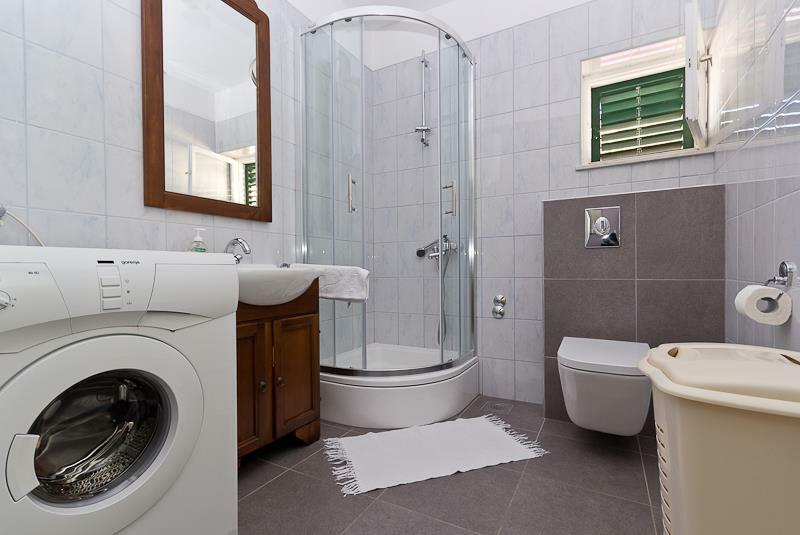 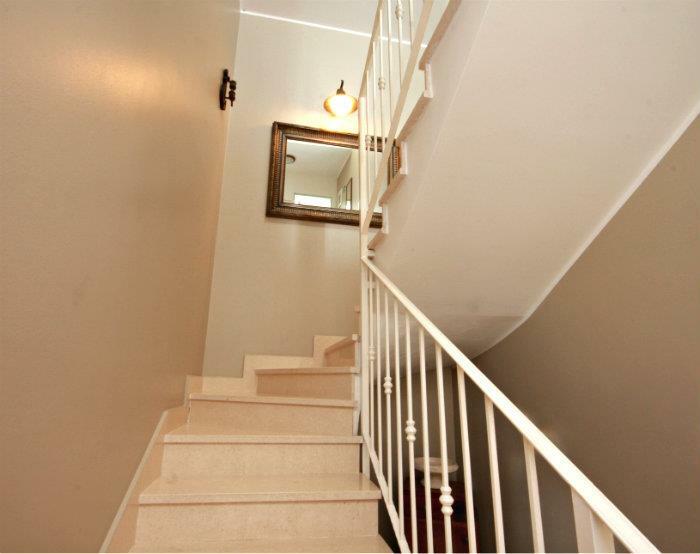 The property itself is probably the nicest in the immediate area. 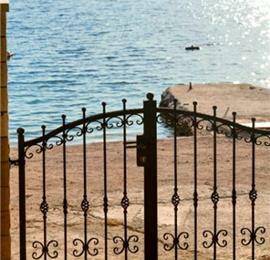 Neighbours are friendly. 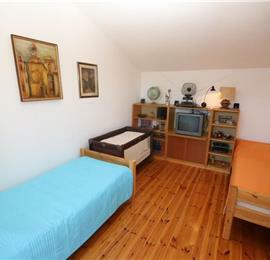 The owner had kindly provided a mobile Wifi router. 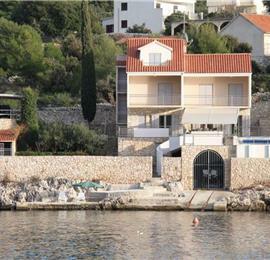 Owner and his daughter are very helpful and friendly. 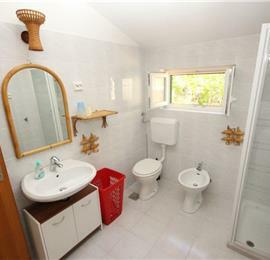 Not impressed with: The thought that in ten years’ time it will be over-developed. 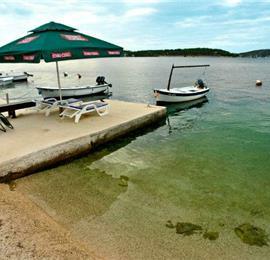 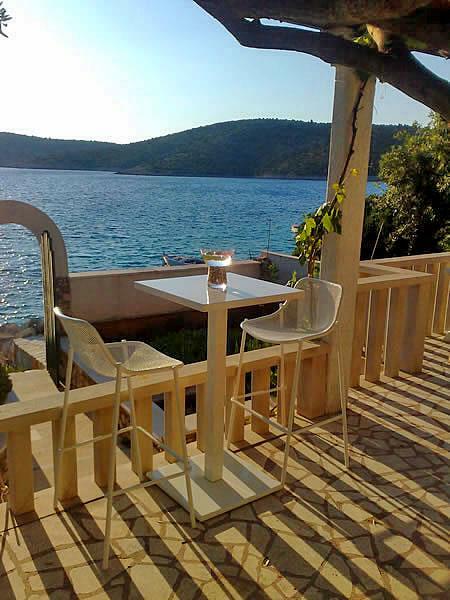 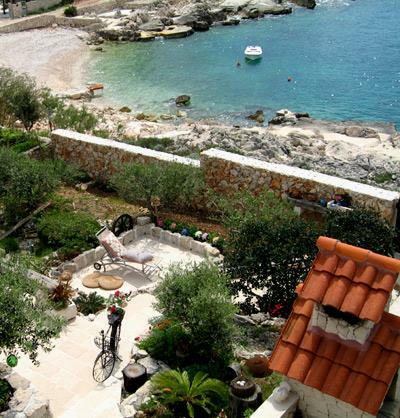 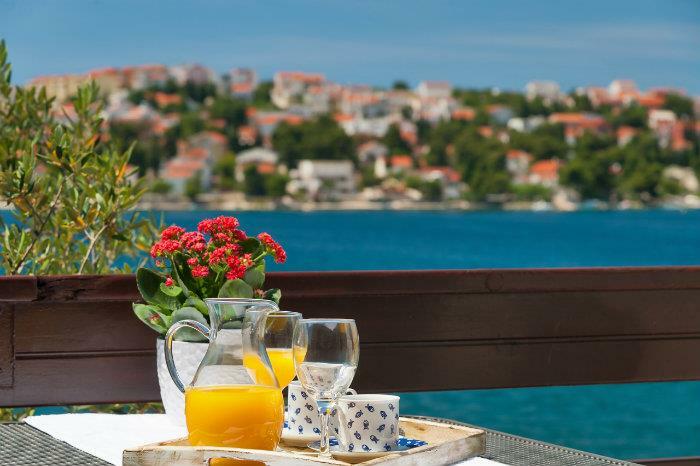 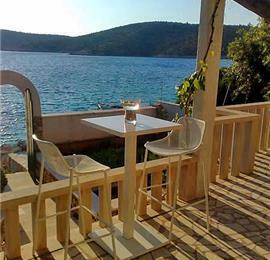 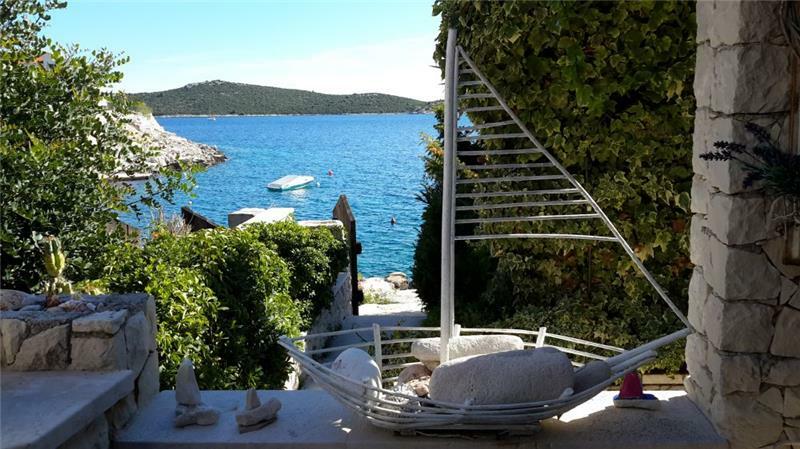 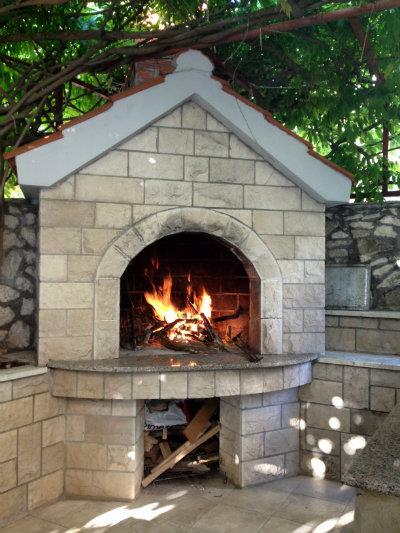 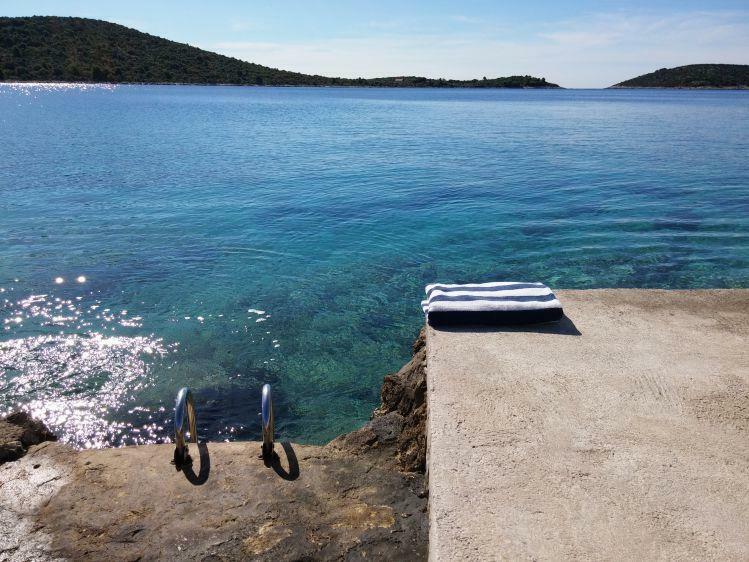 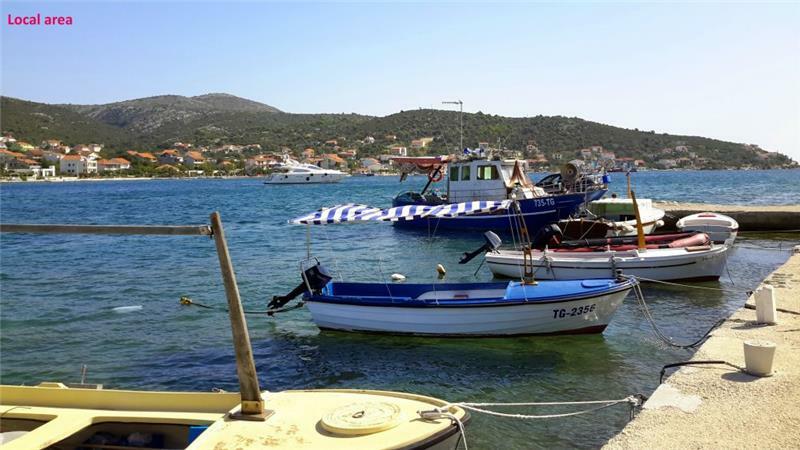 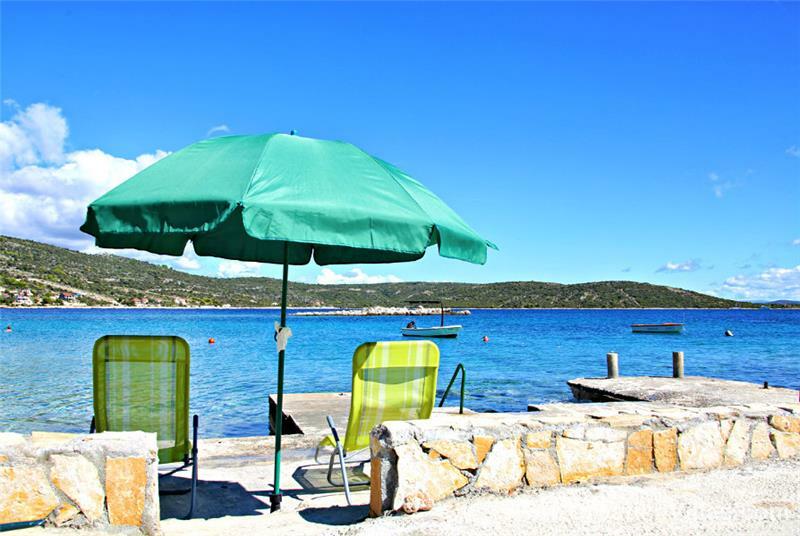 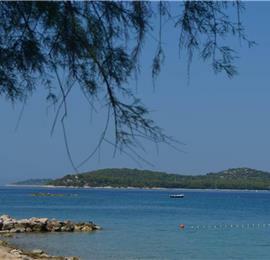 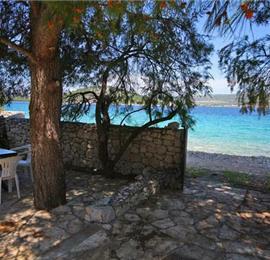 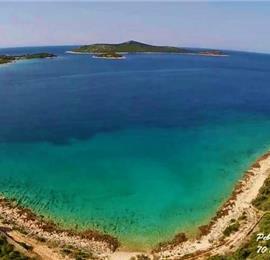 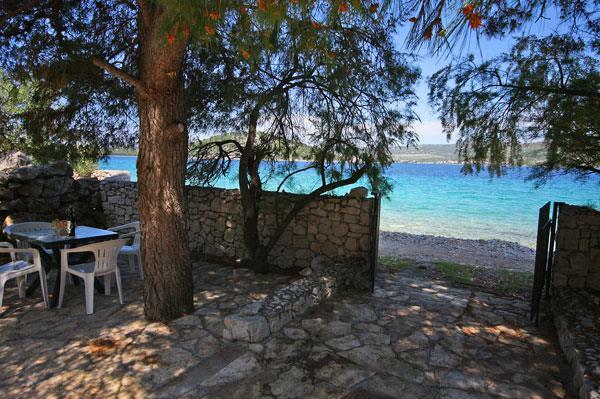 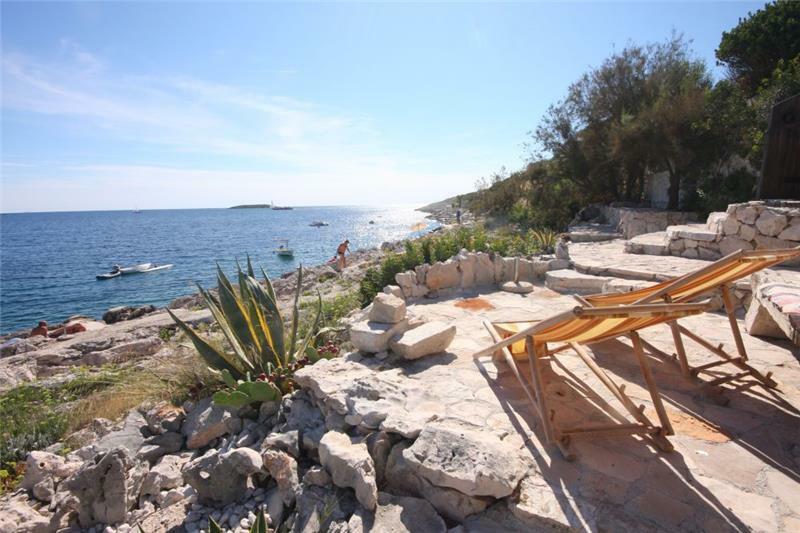 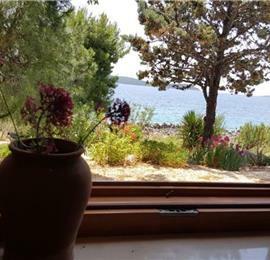 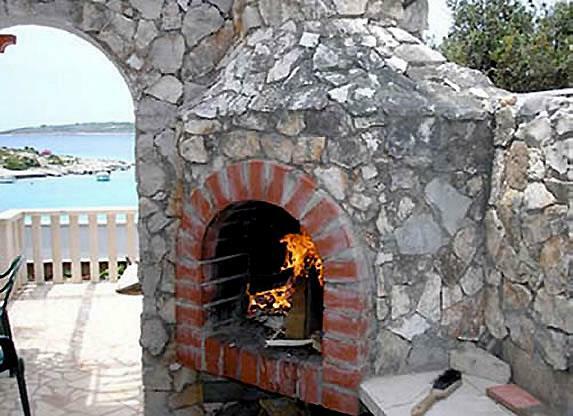 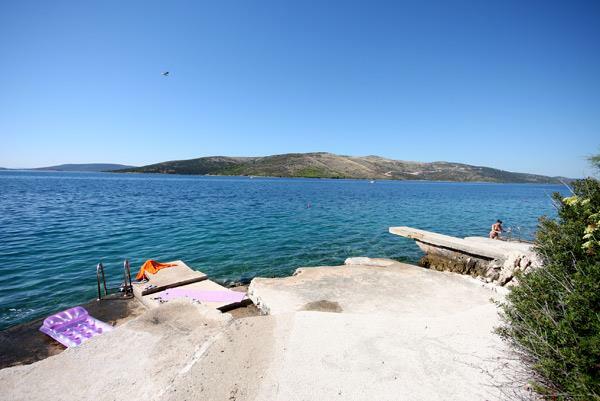 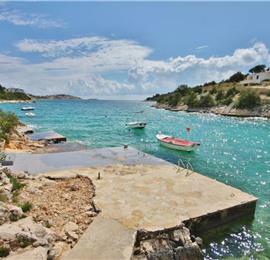 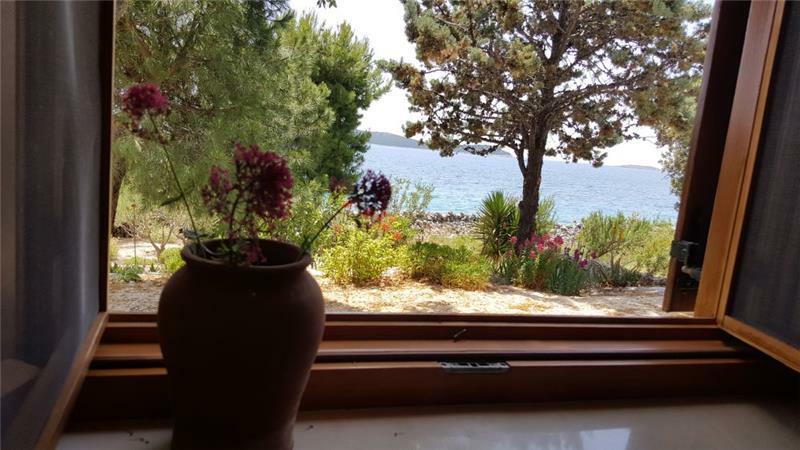 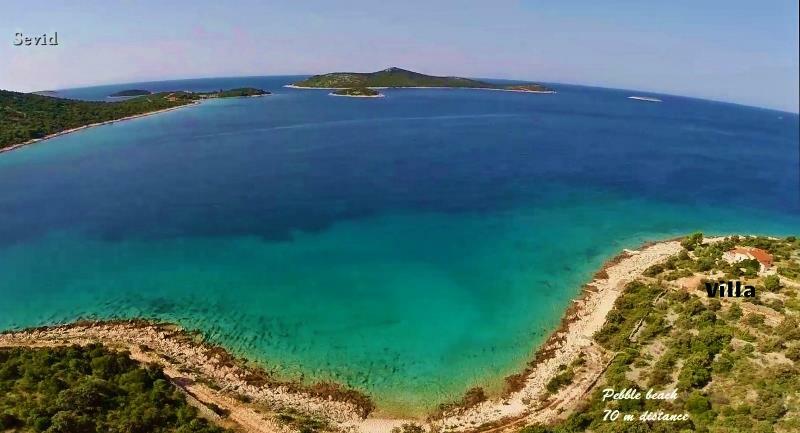 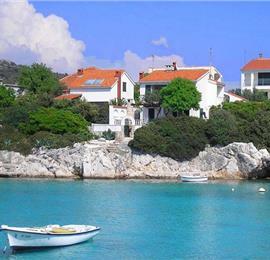 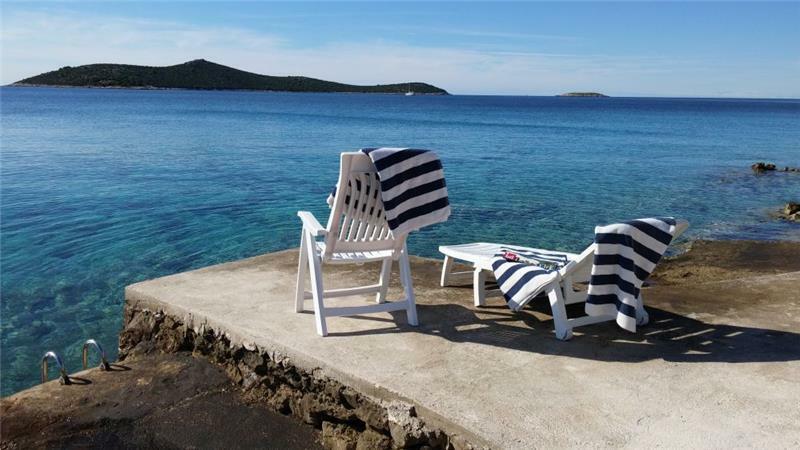 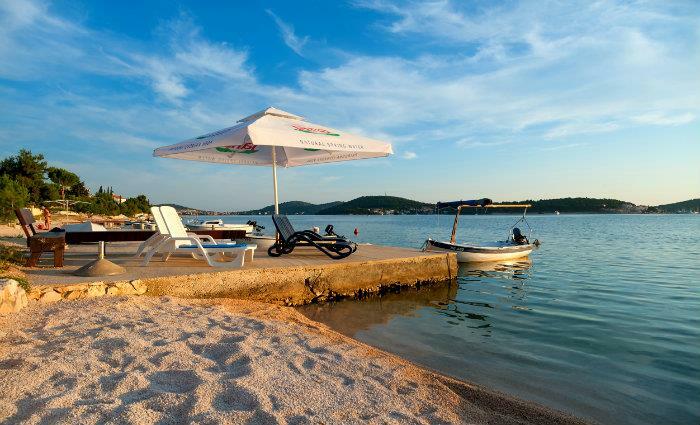 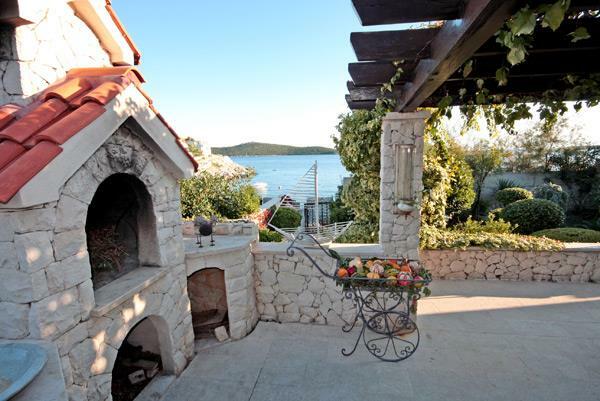 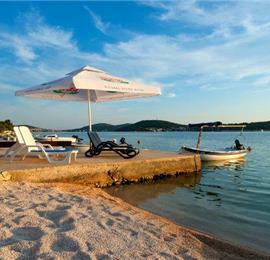 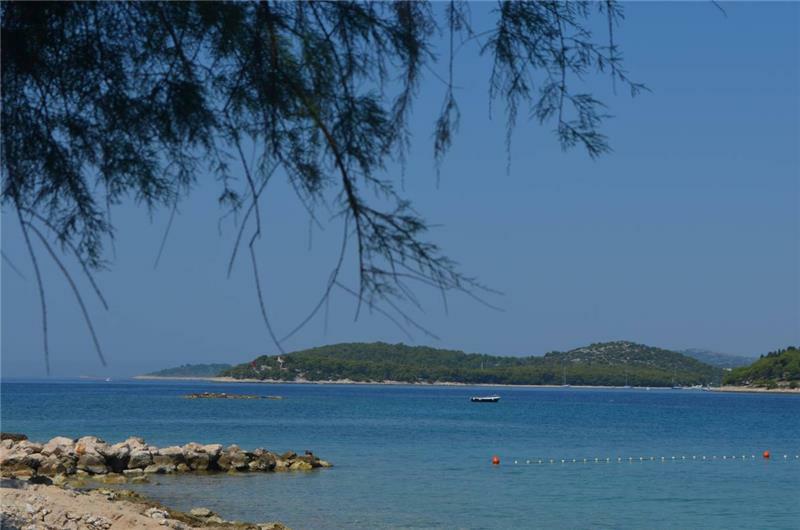 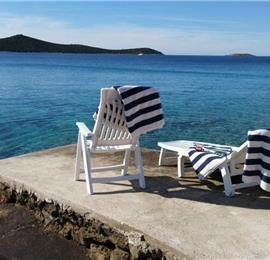 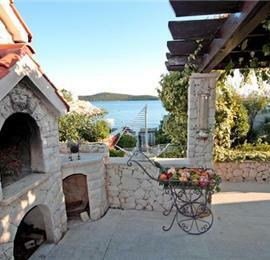 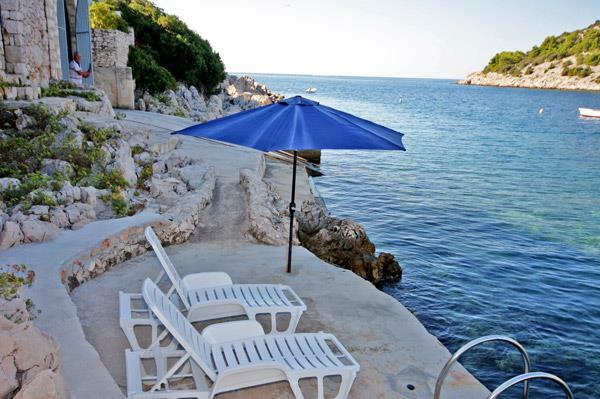 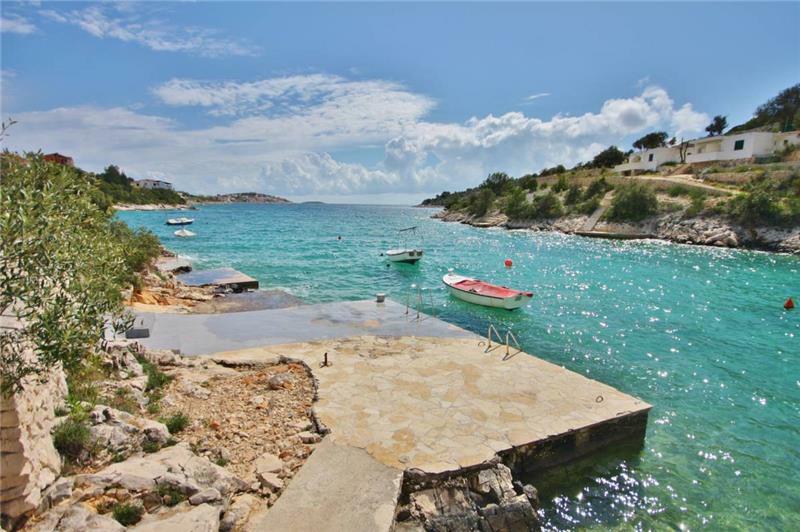 Recommend: The Bakers at the northern end of the causeway in Rogoznica is the best we found in the area. 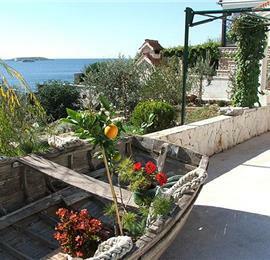 Ribola supermarket on the way there on the A8 had friendly staff and good stock. 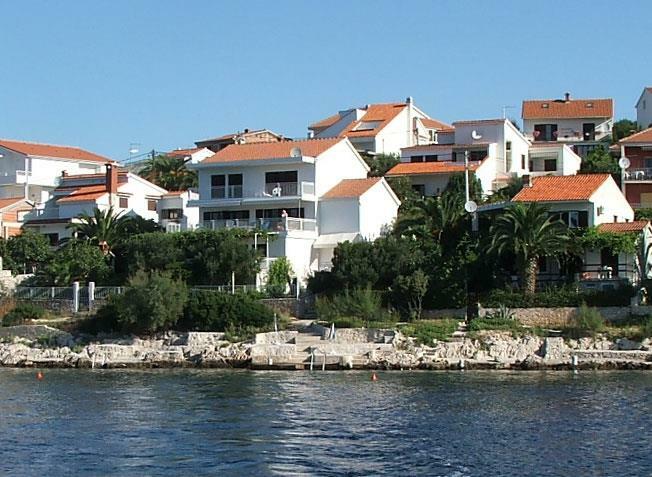 "Antoni's" restaurant on the quayside in Rogoznica (far side of the causeway) and "Toni's" restaurant in Primosten on the waterfront (with decking extended over the water) were very nice. 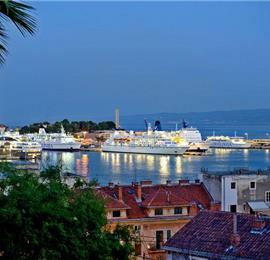 Trogir old town and market worth a visit.